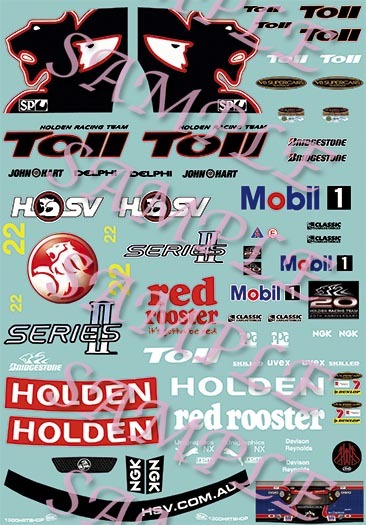 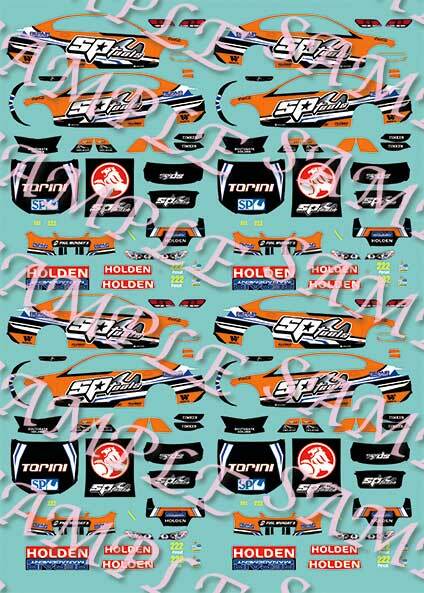 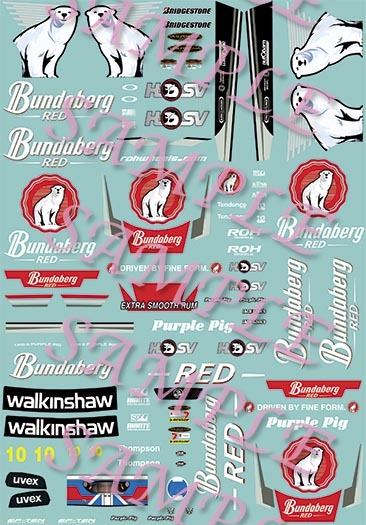 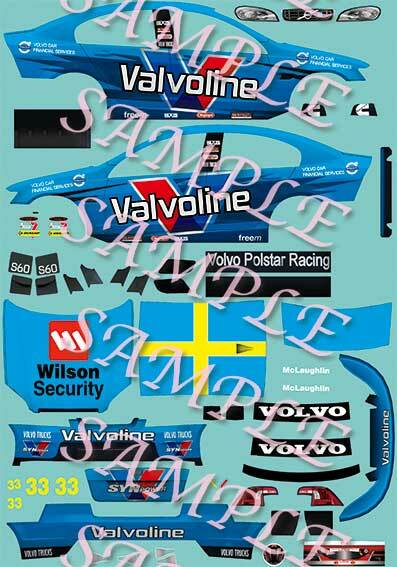 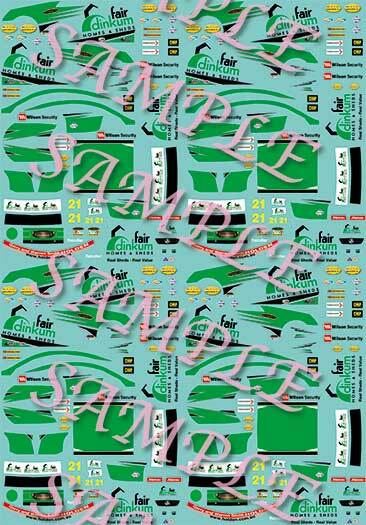 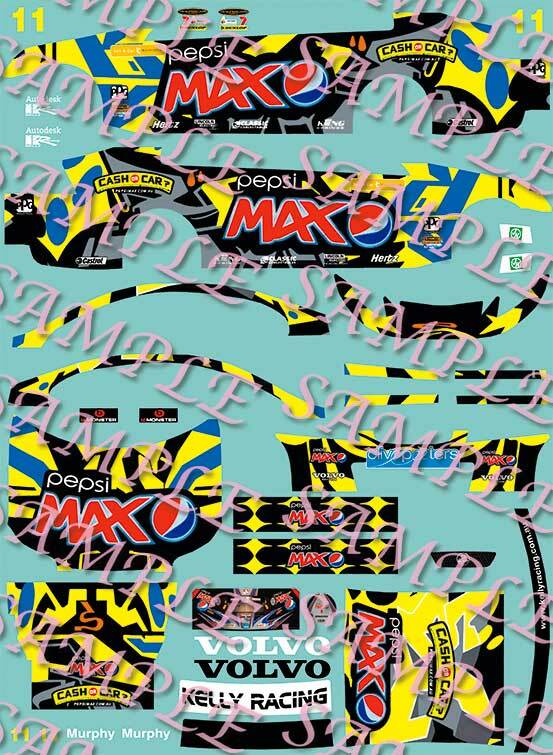 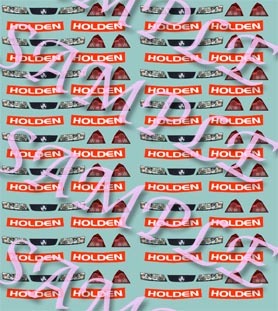 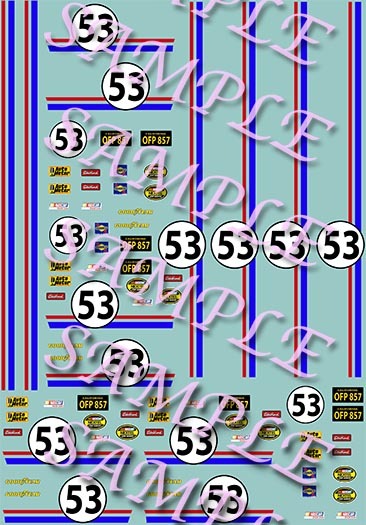 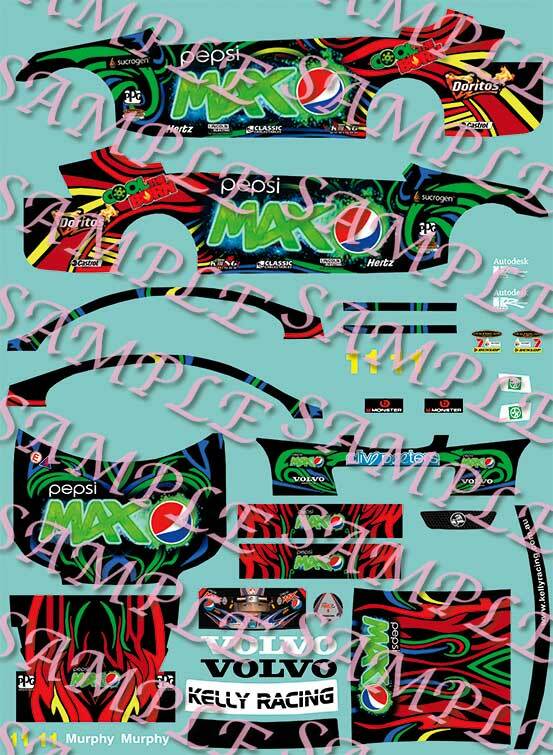 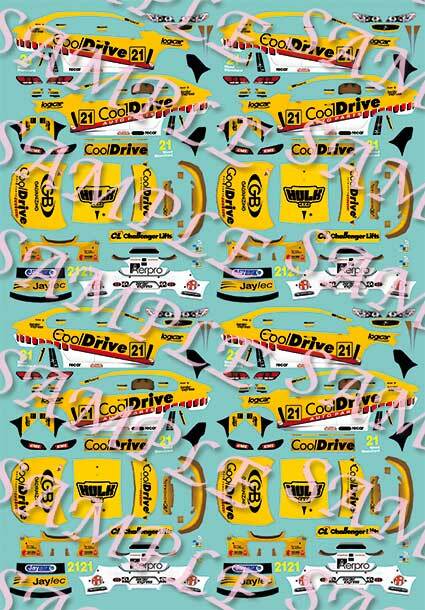 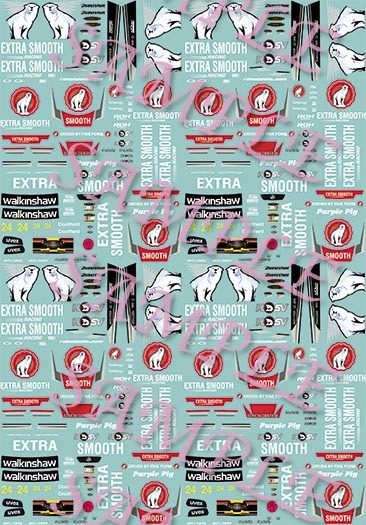 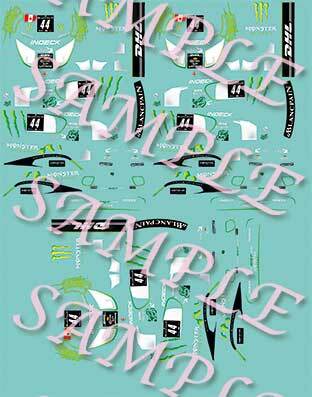 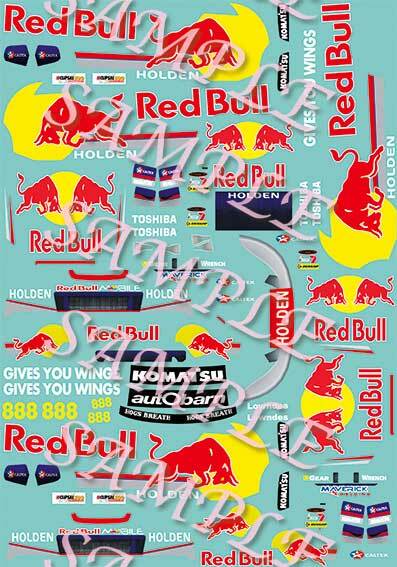 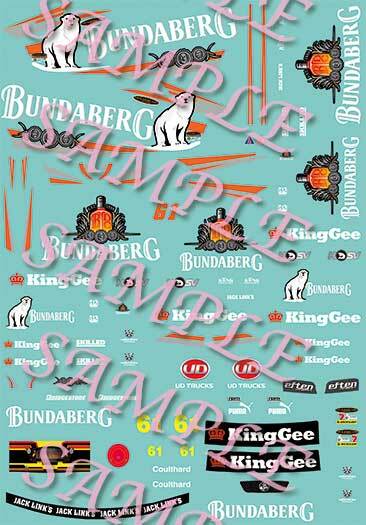 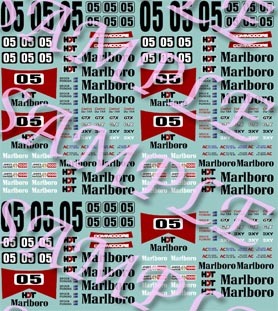 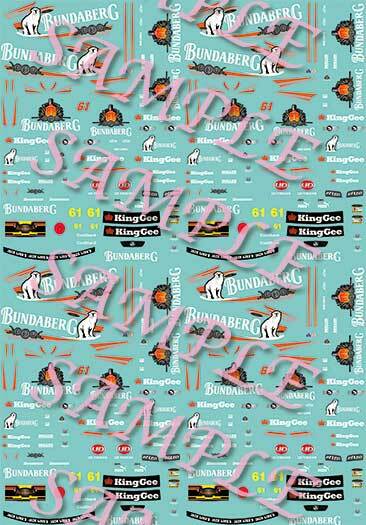 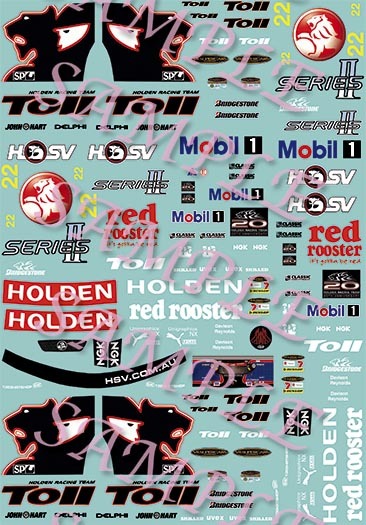 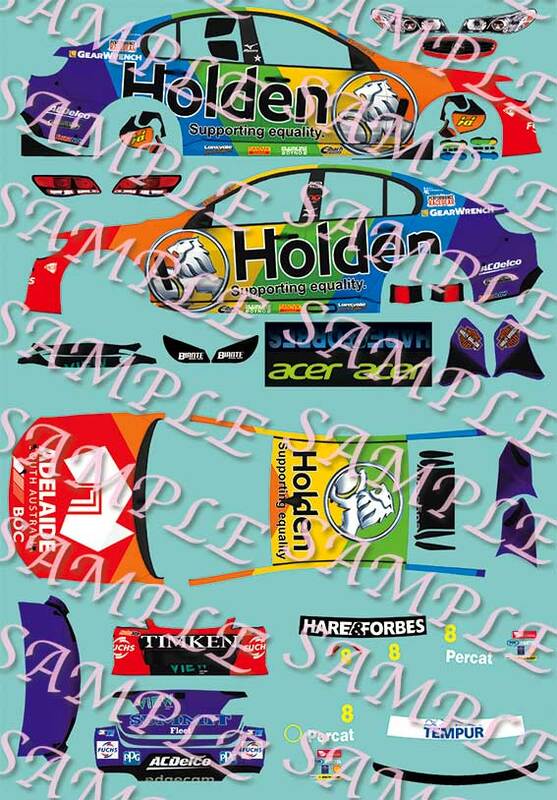 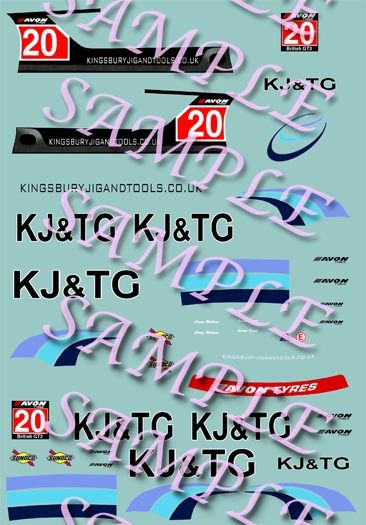 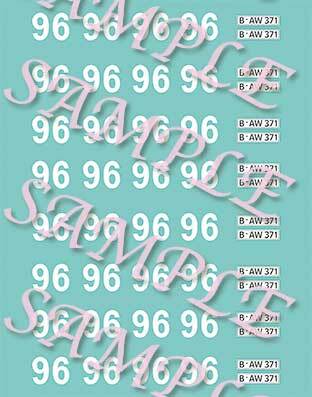 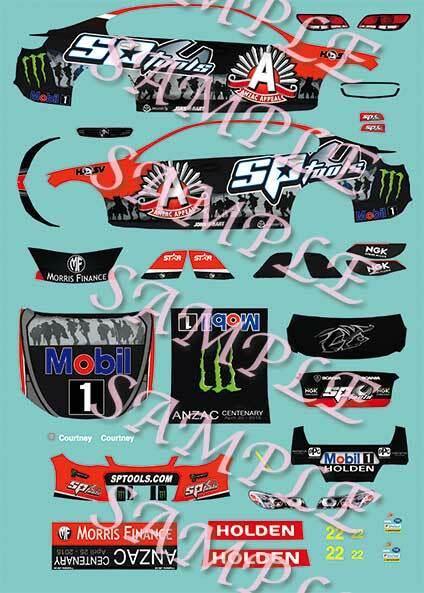 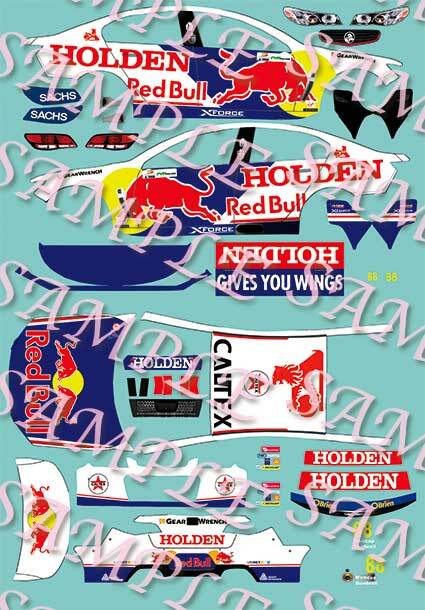 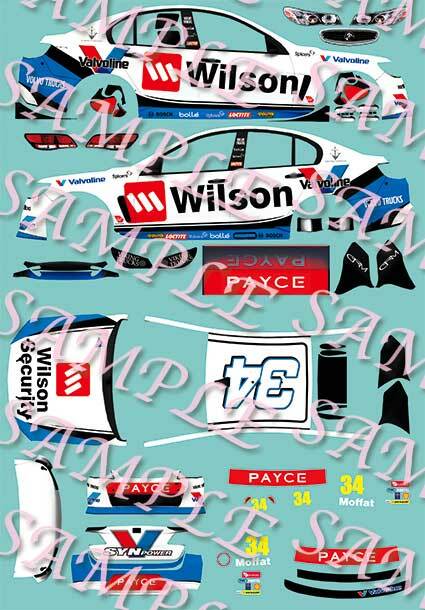 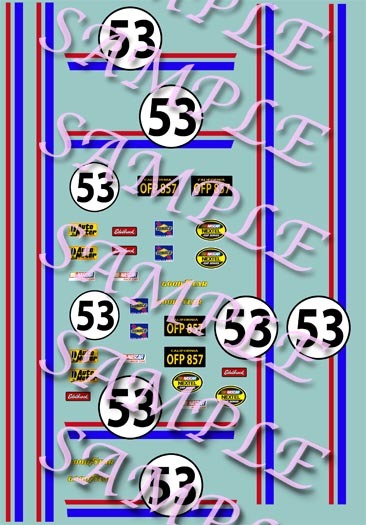 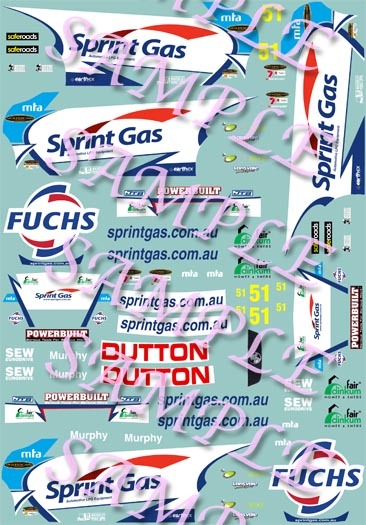 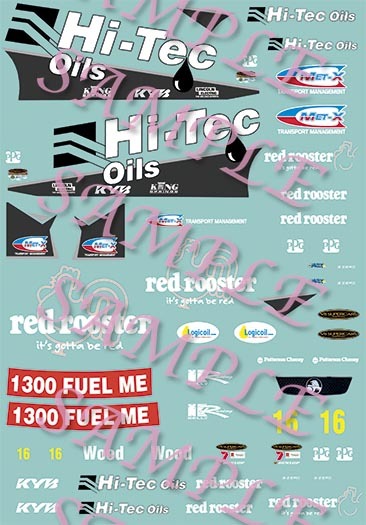 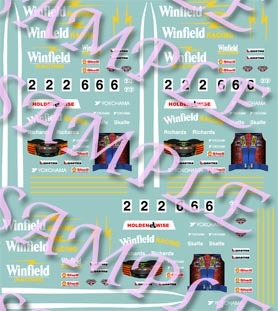 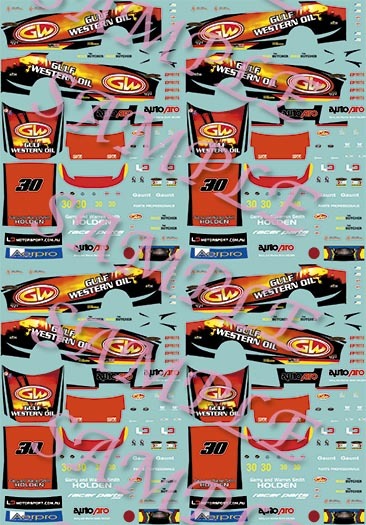 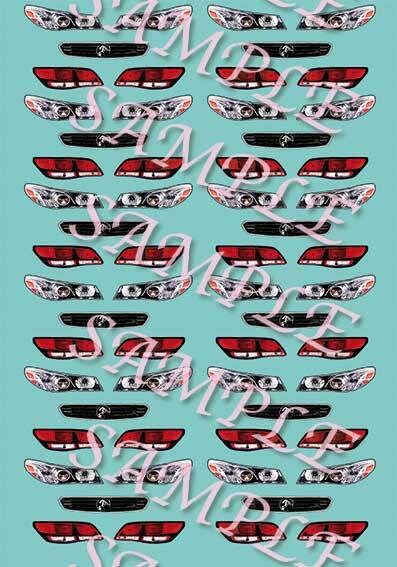 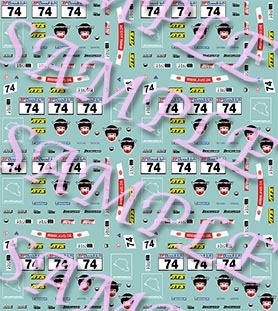 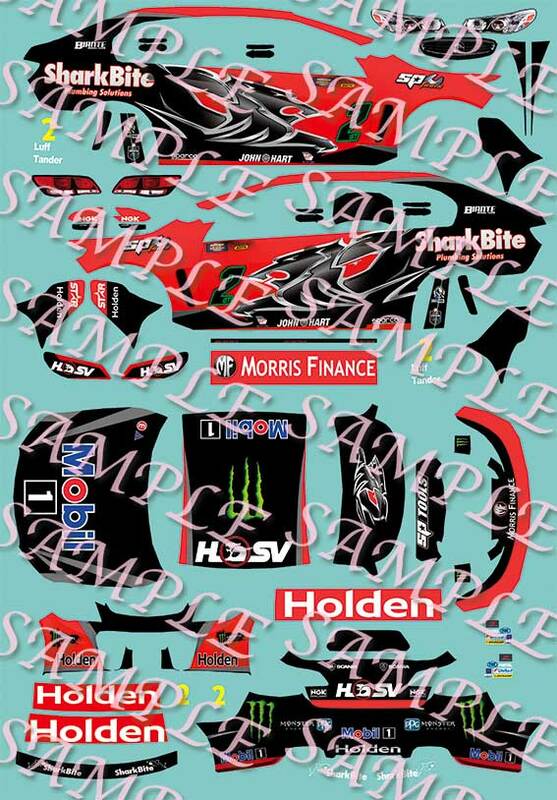 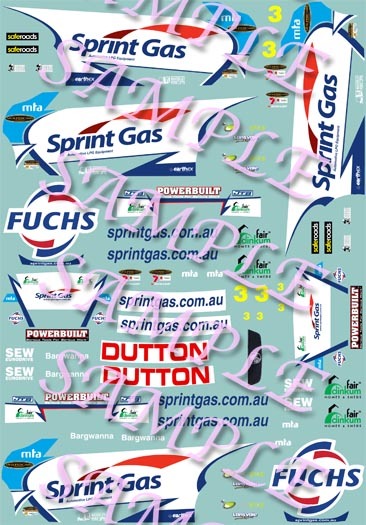 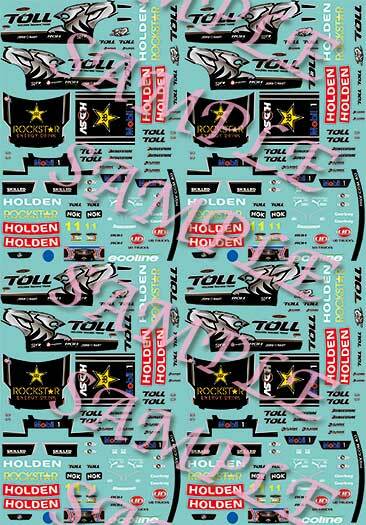 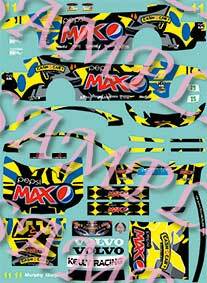 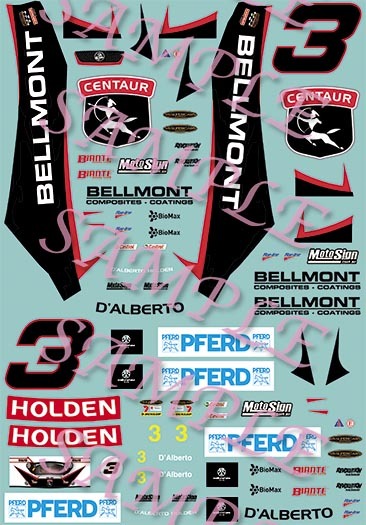 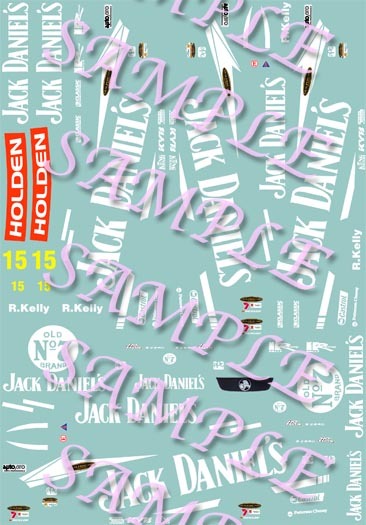 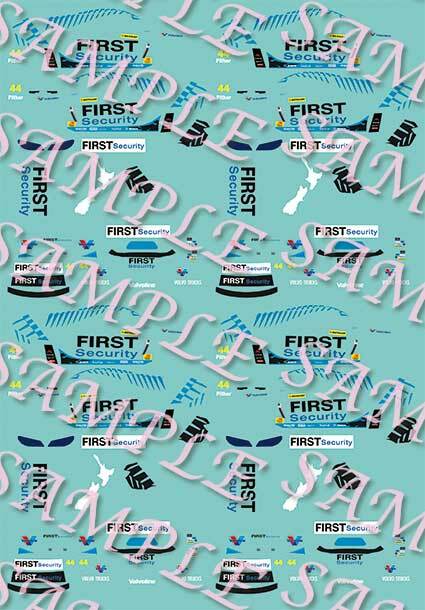 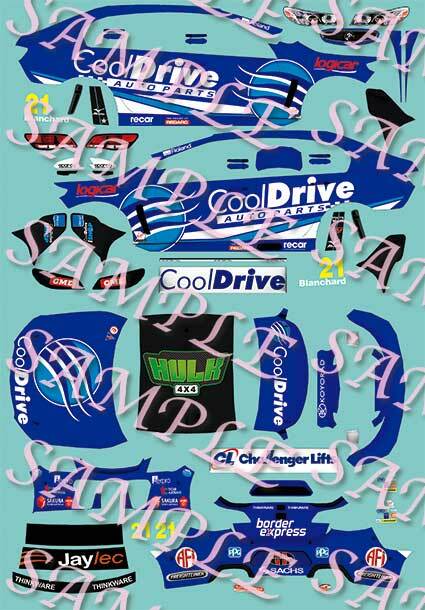 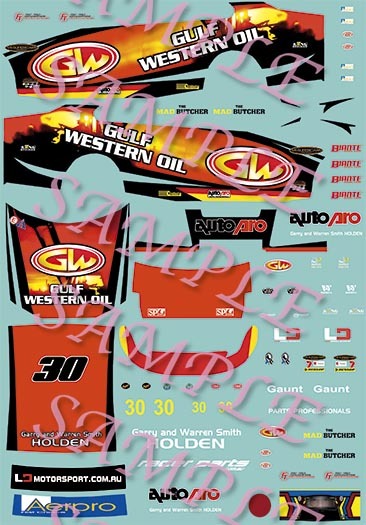 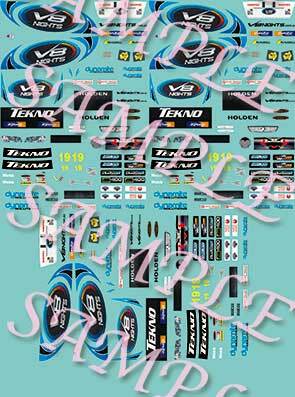 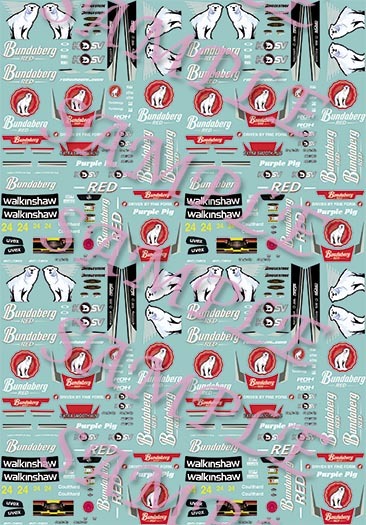 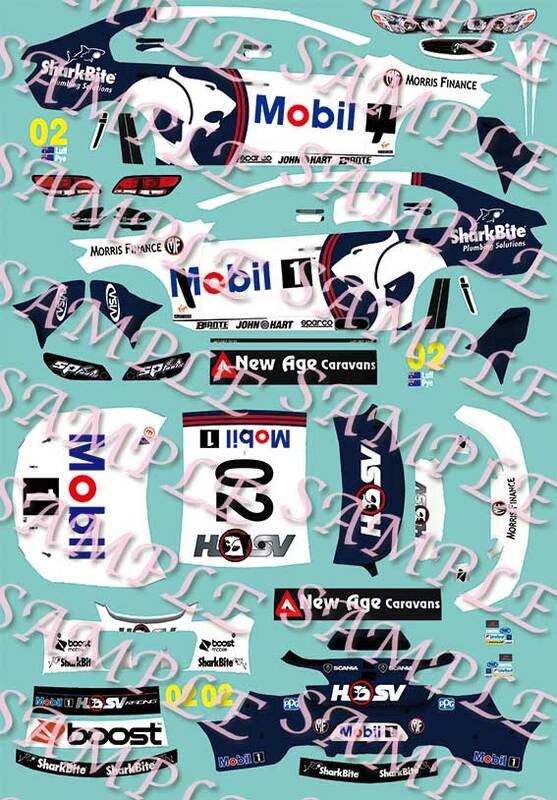 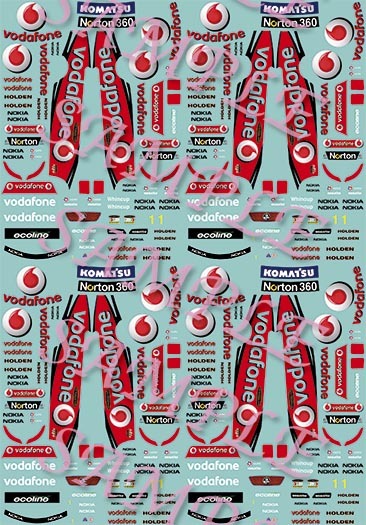 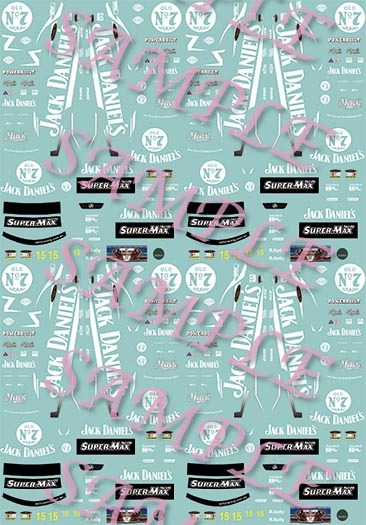 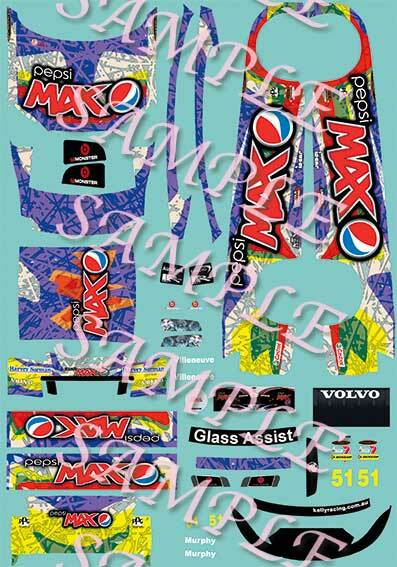 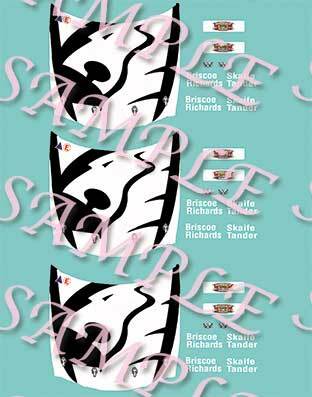 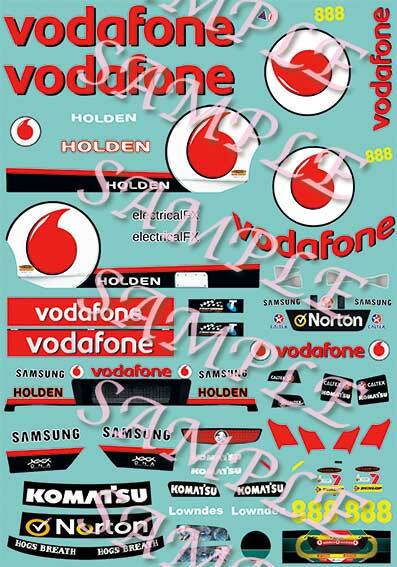 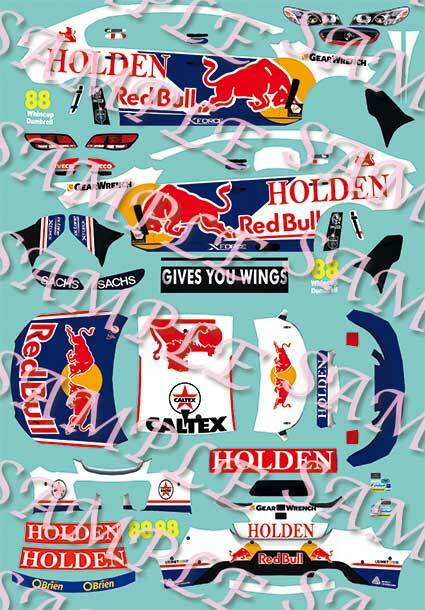 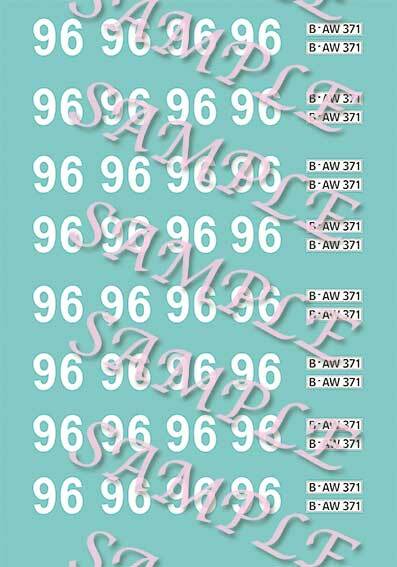 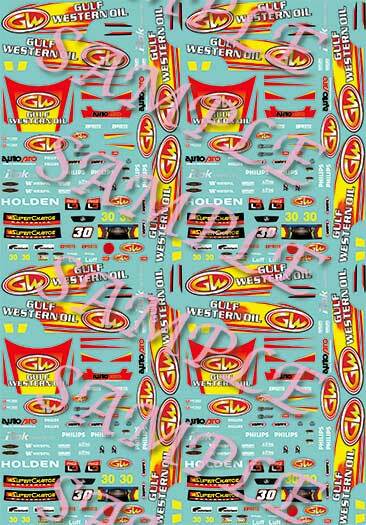 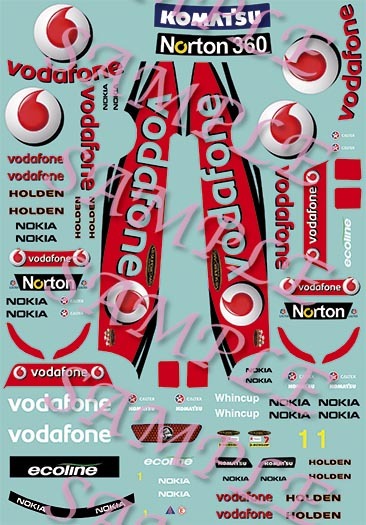 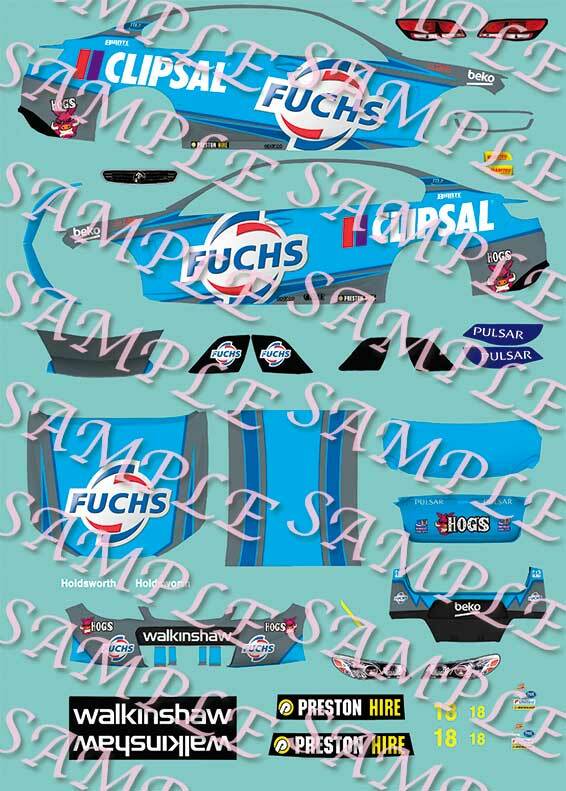 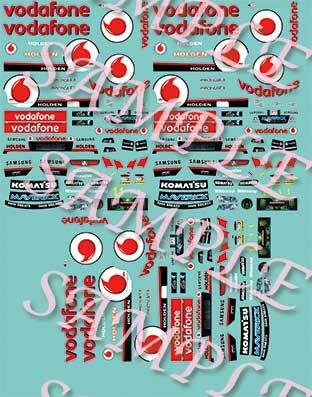 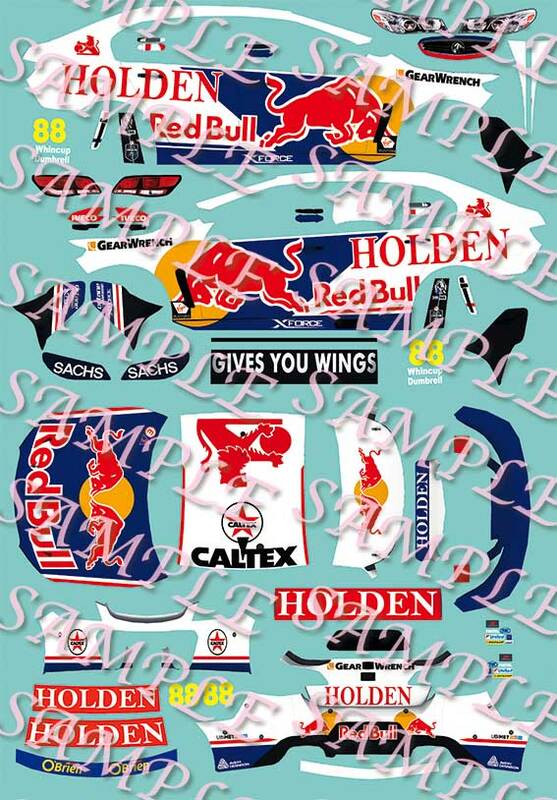 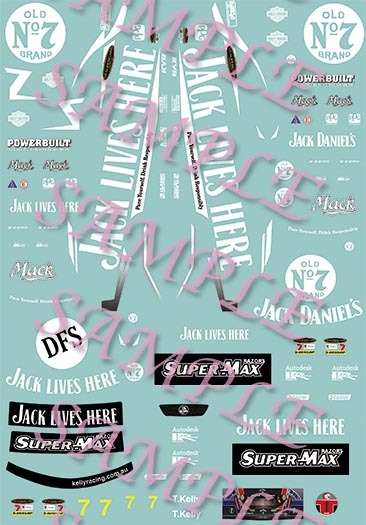 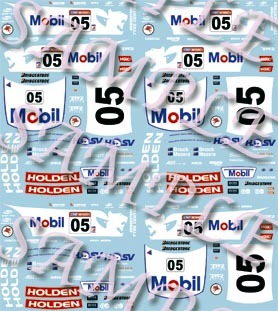 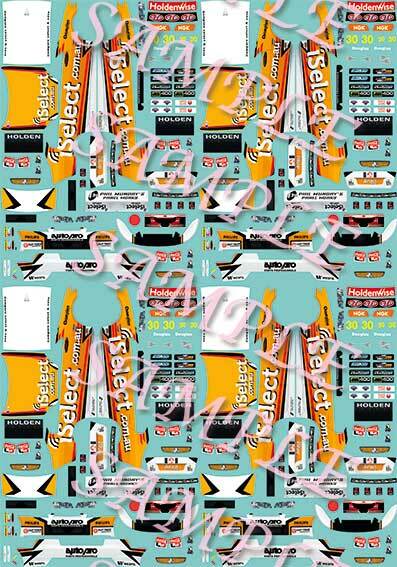 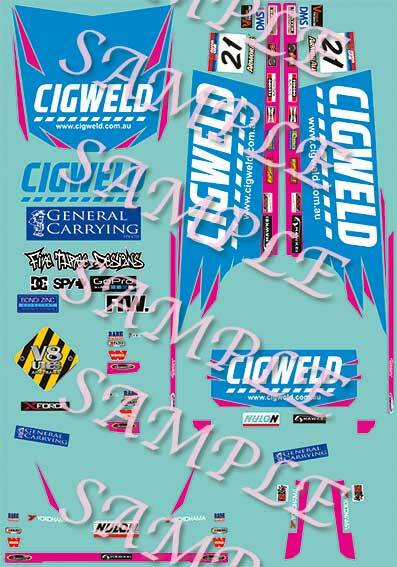 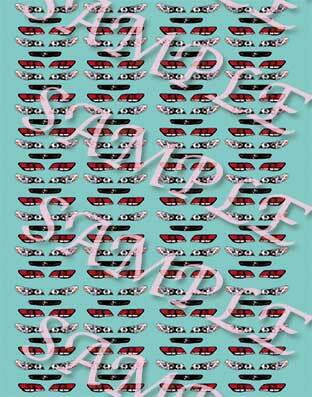 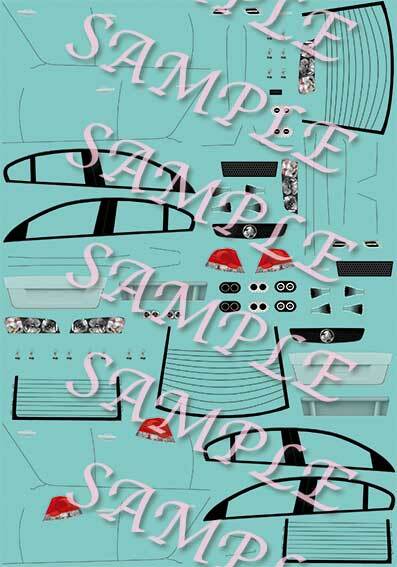 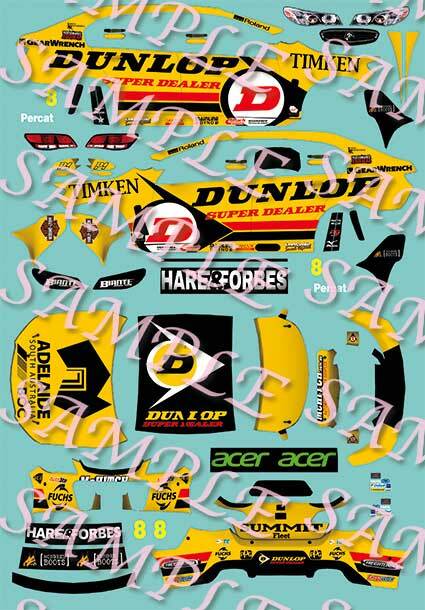 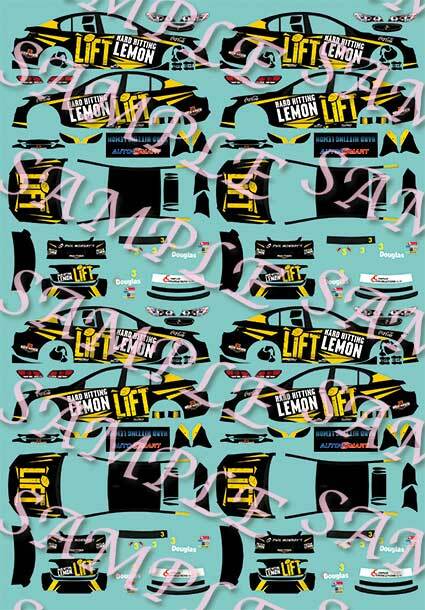 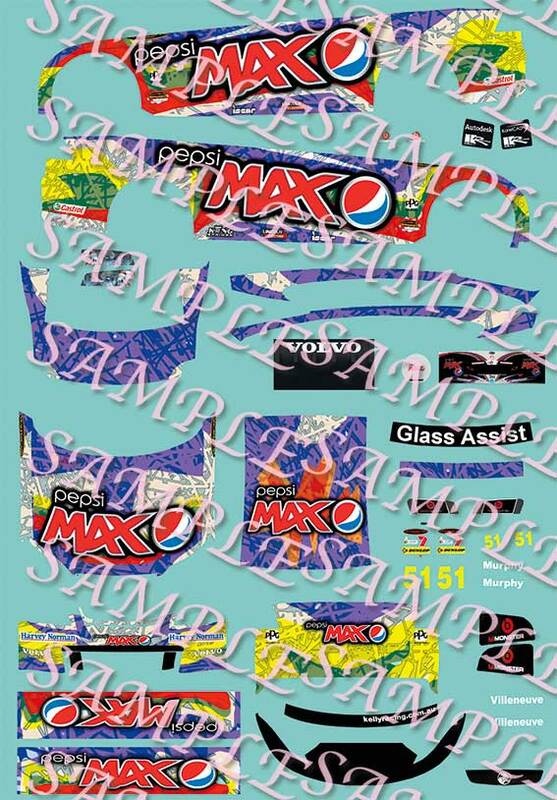 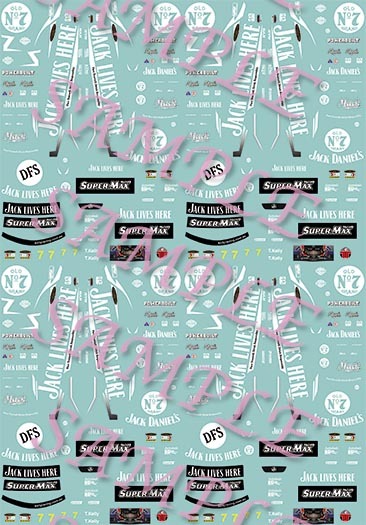 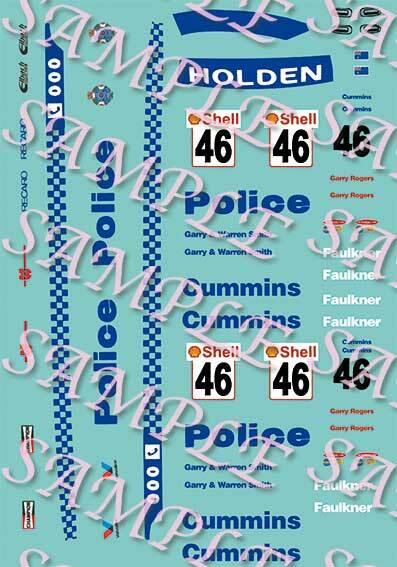 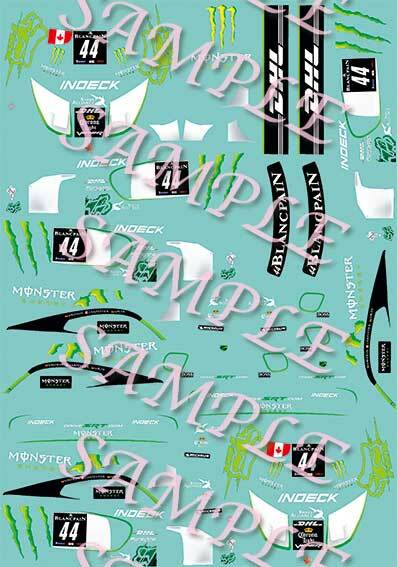 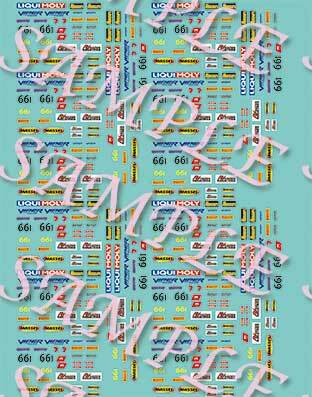 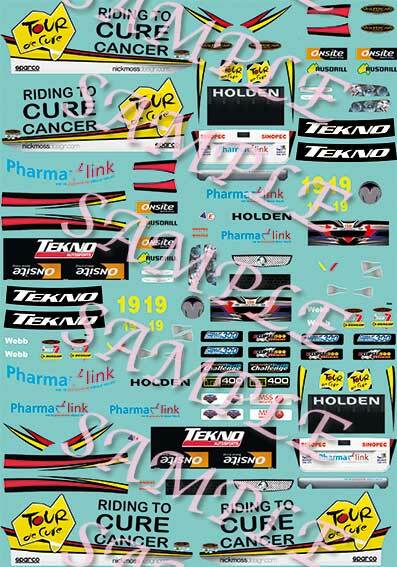 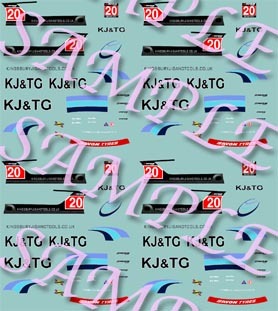 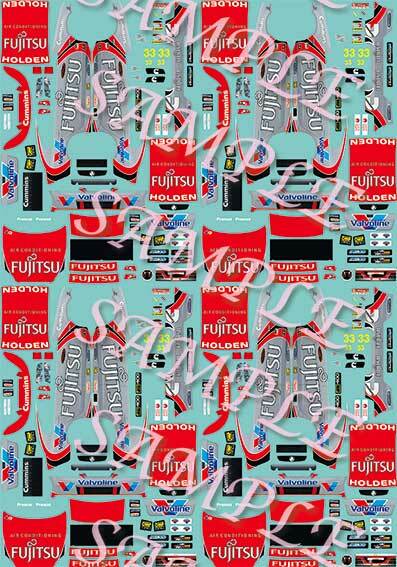 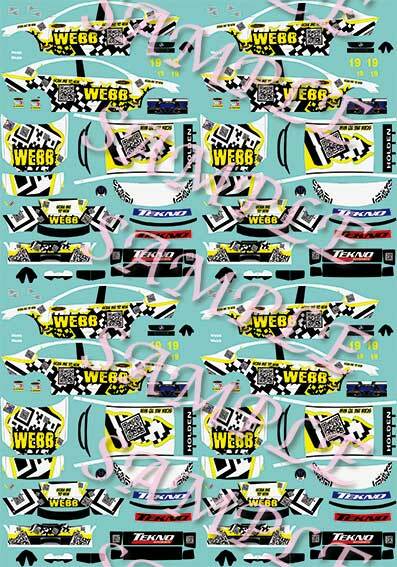 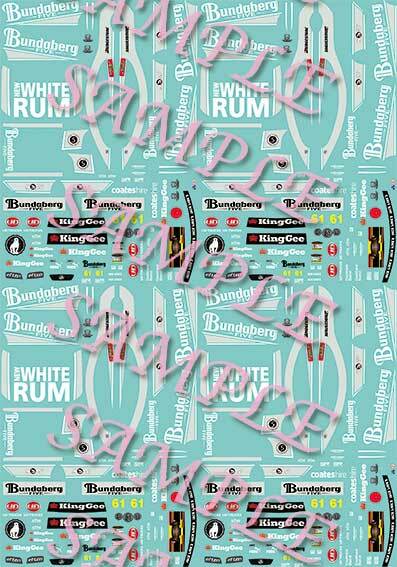 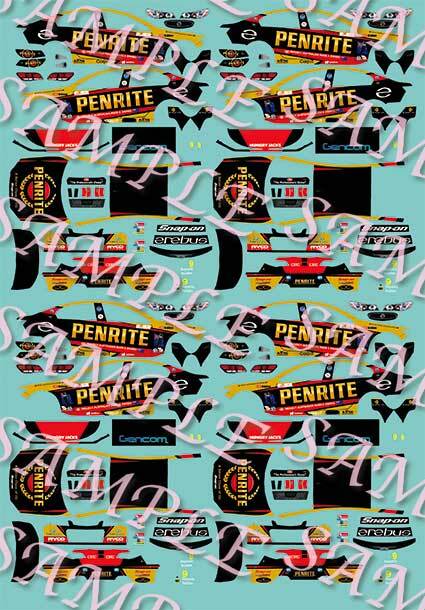 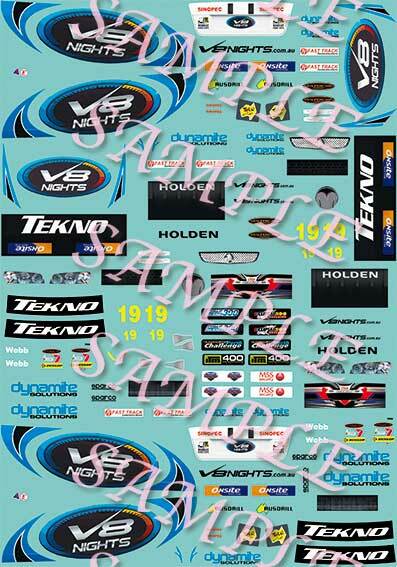 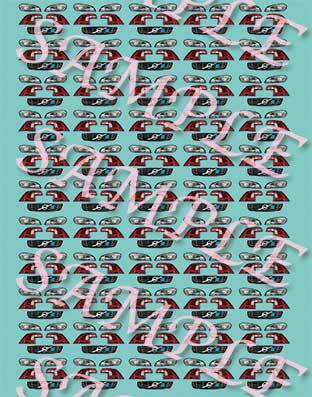 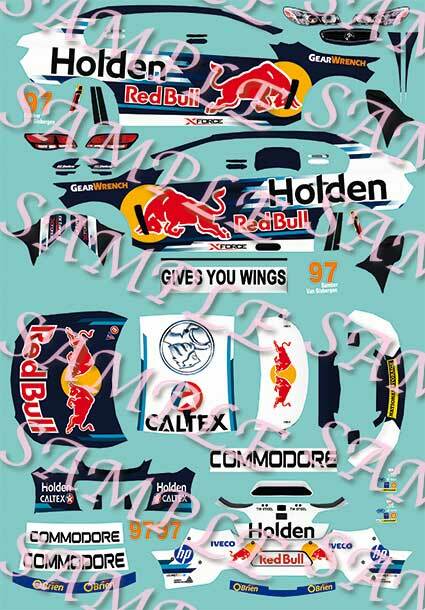 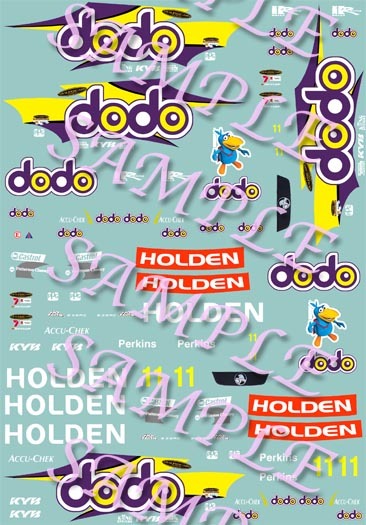 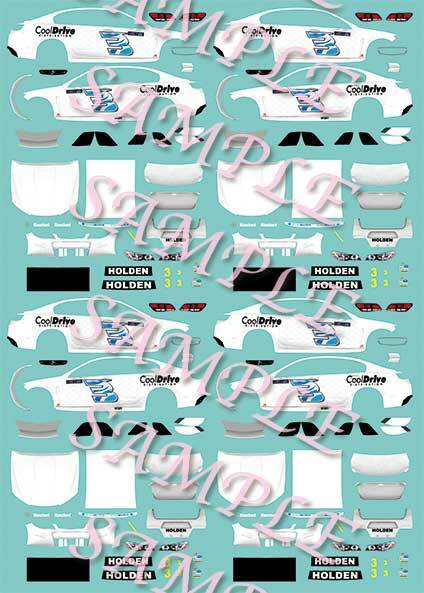 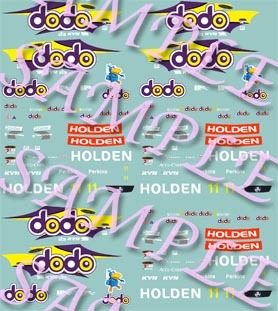 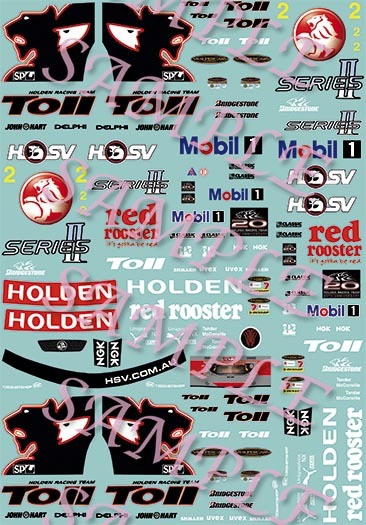 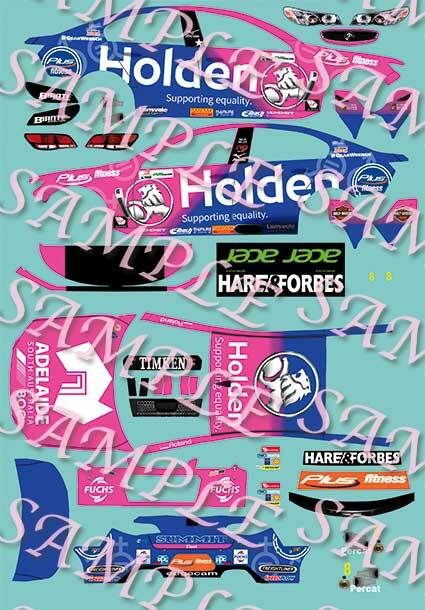 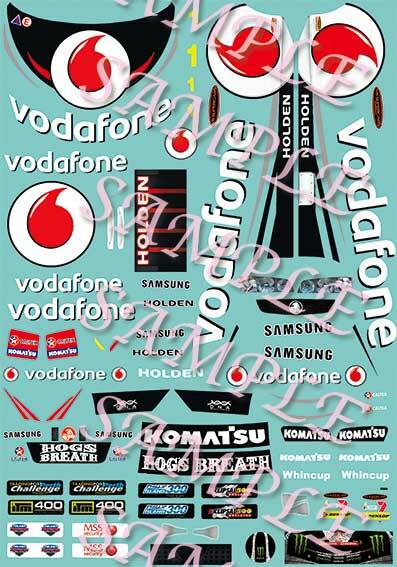 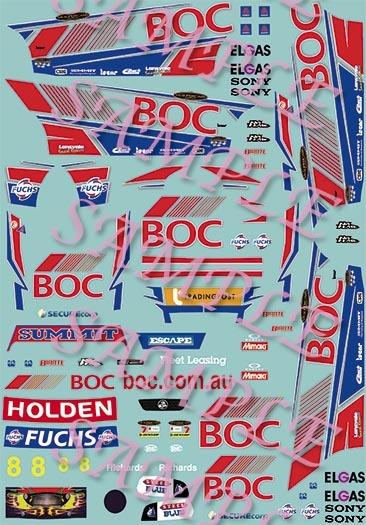 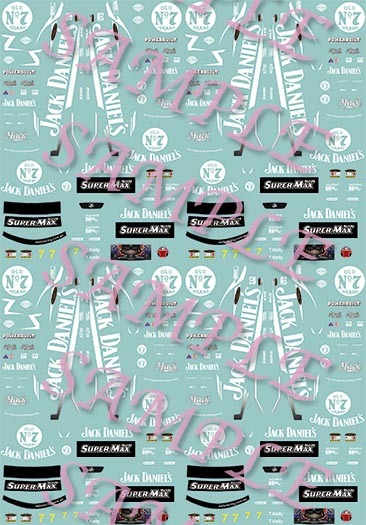 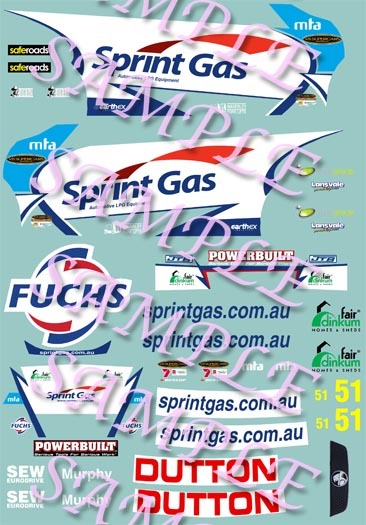 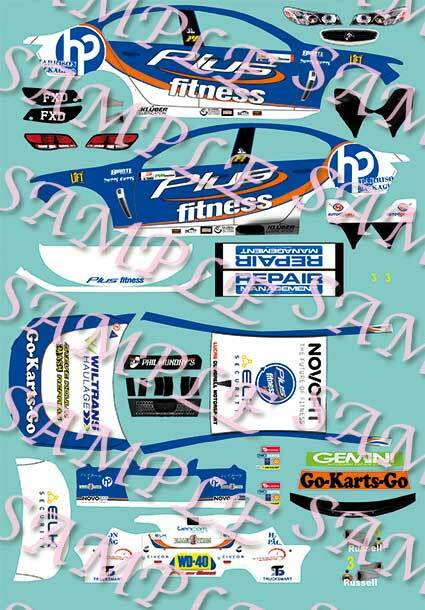 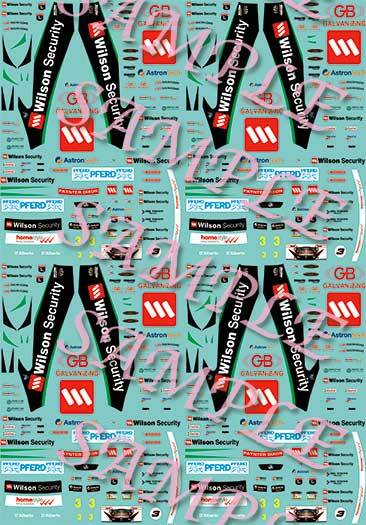 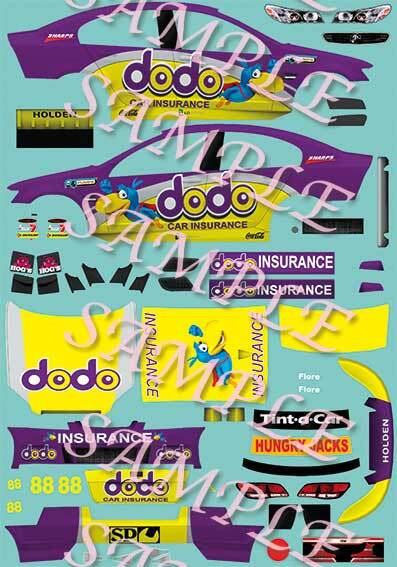 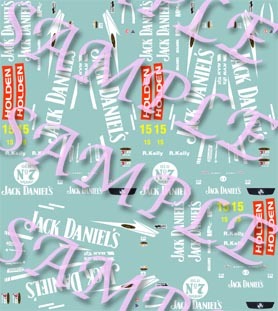 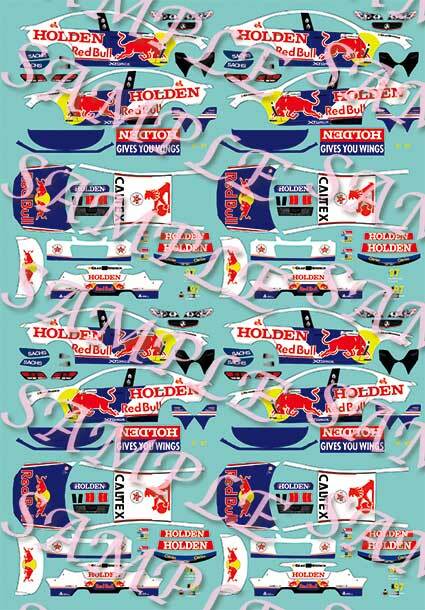 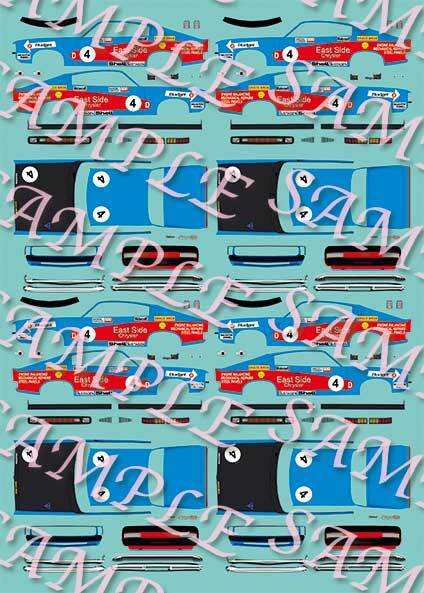 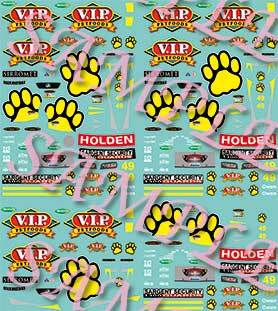 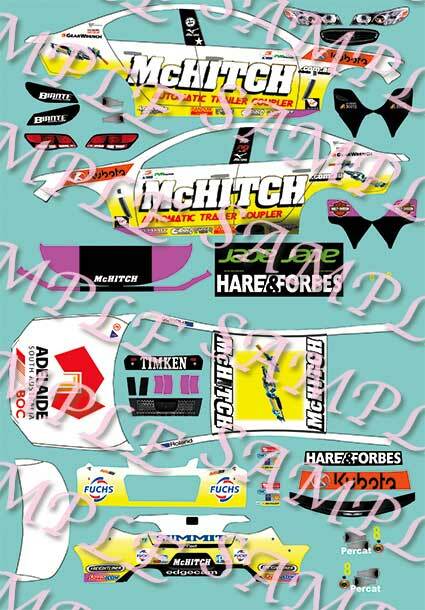 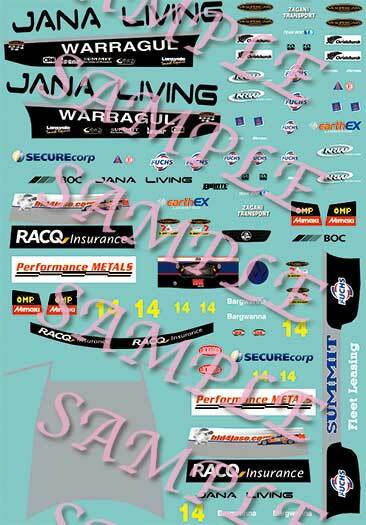 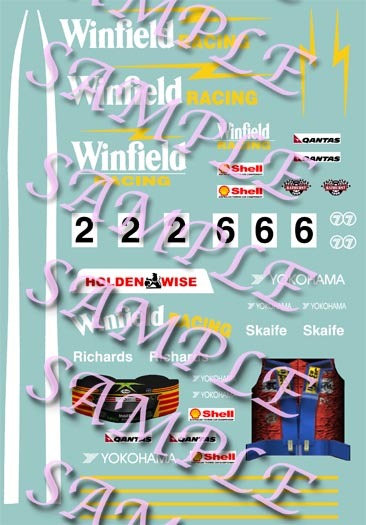 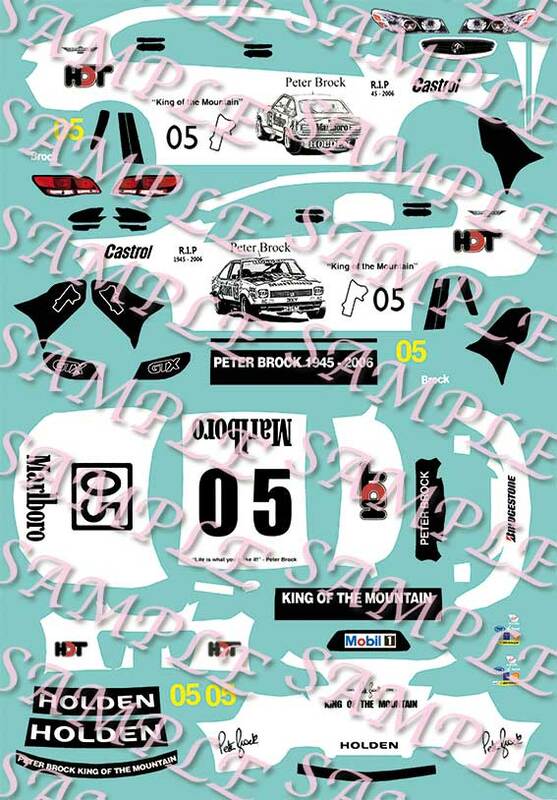 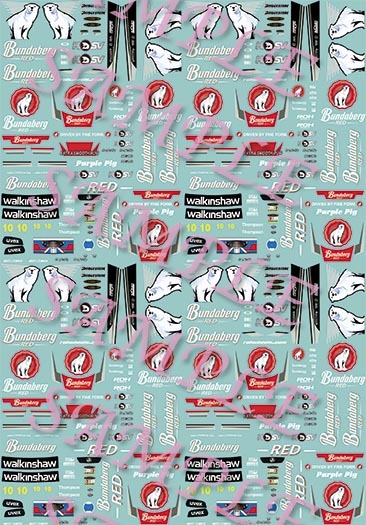 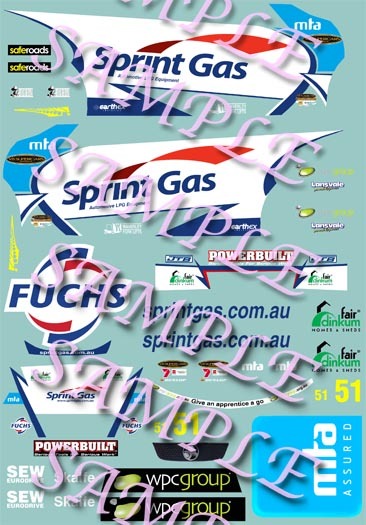 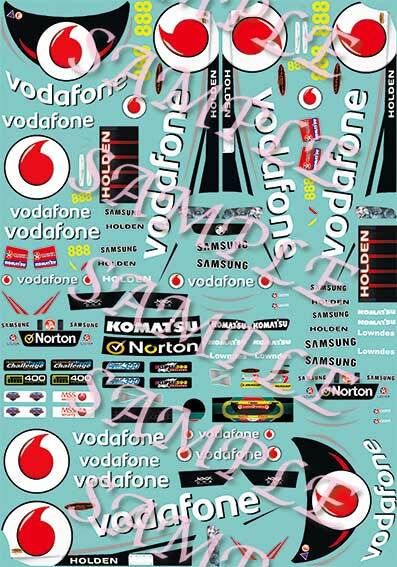 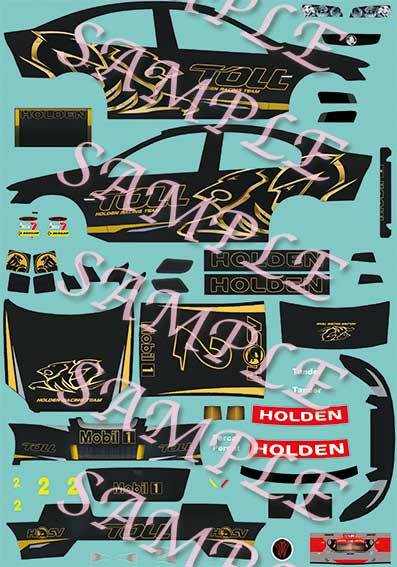 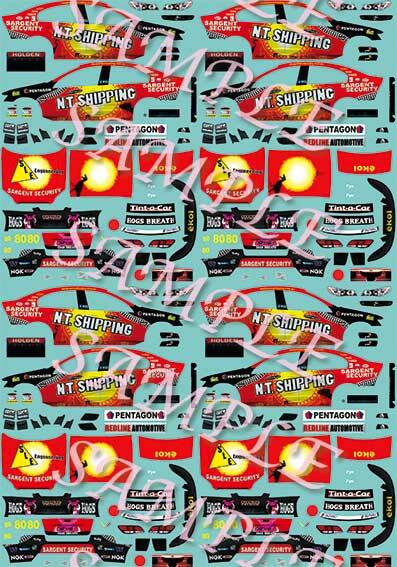 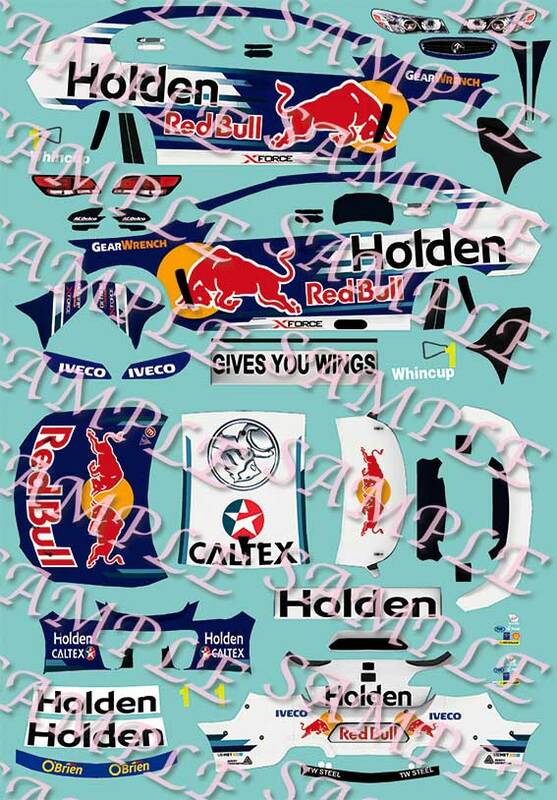 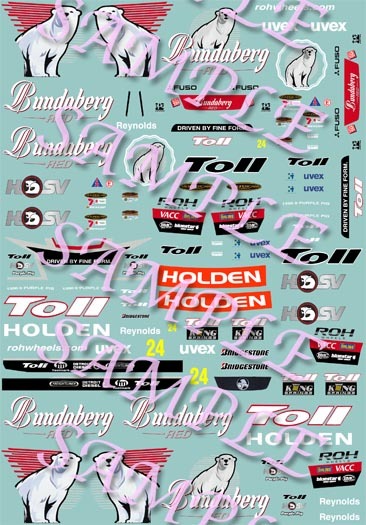 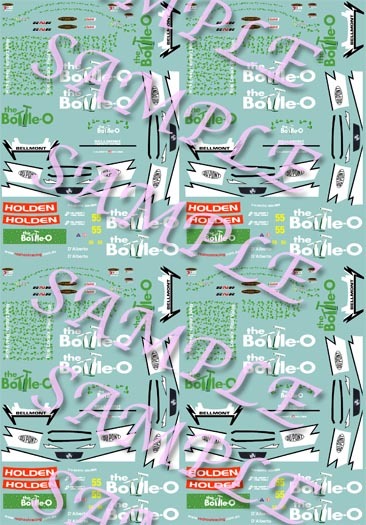 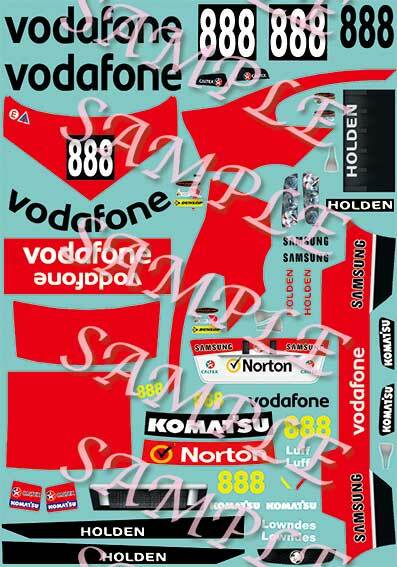 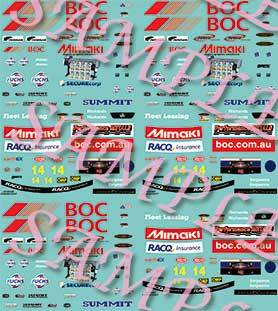 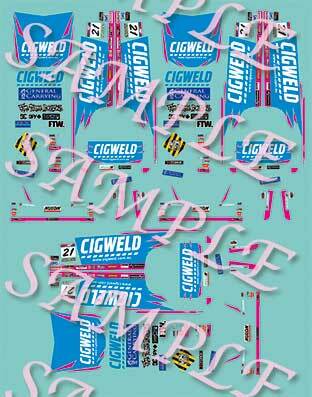 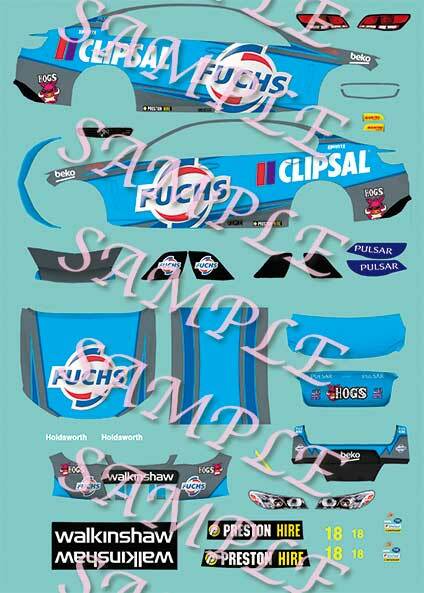 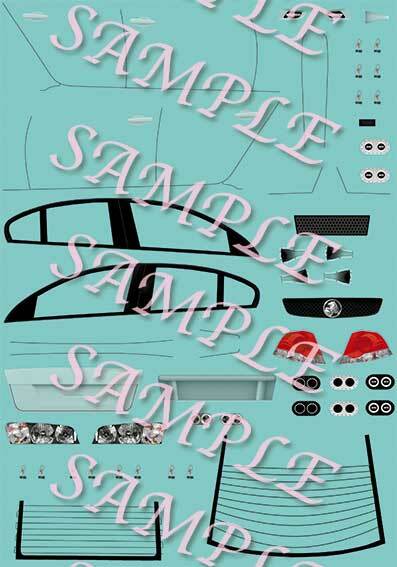 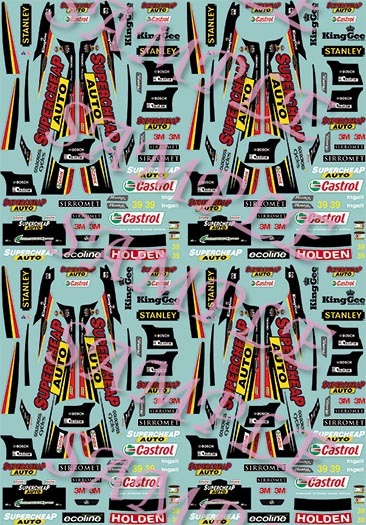 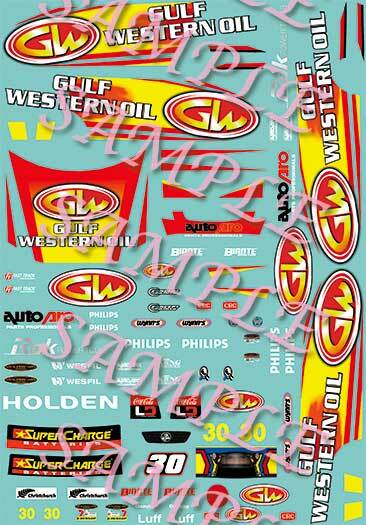 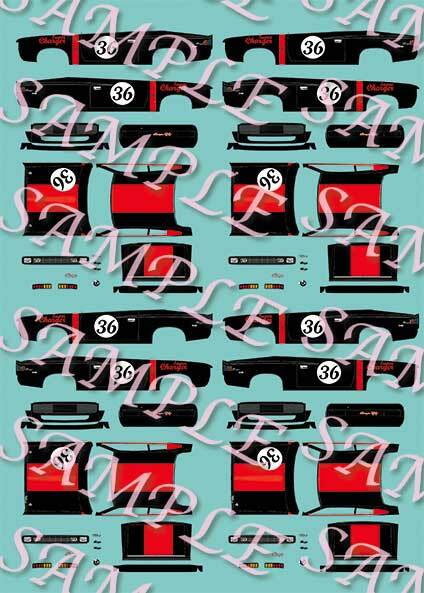 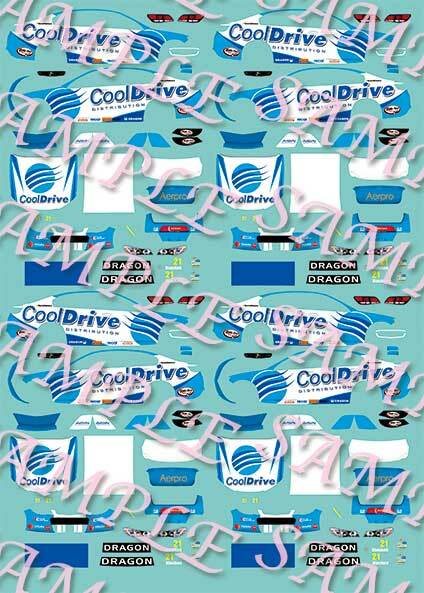 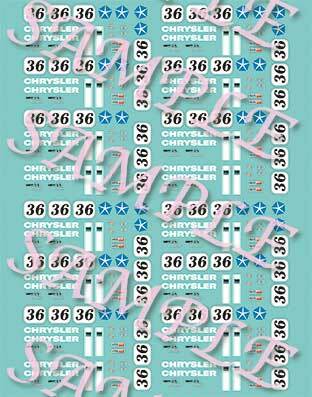 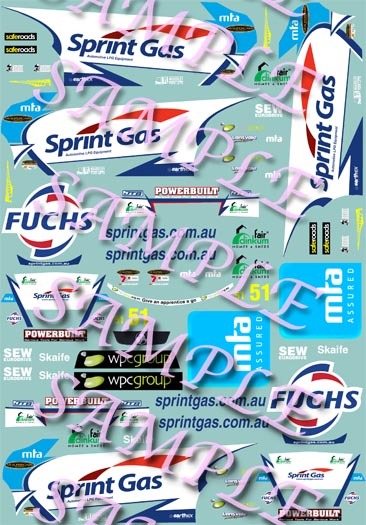 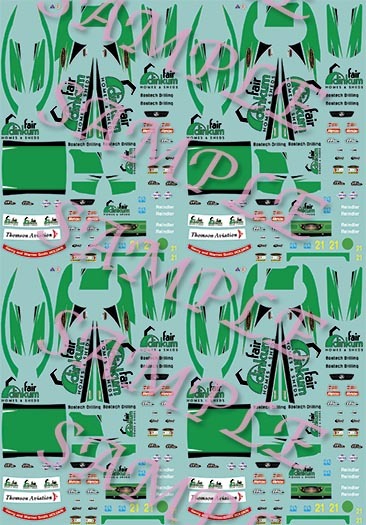 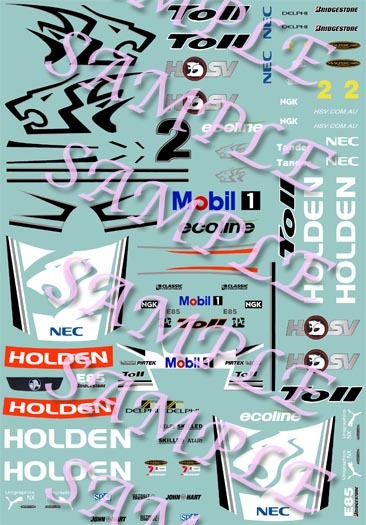 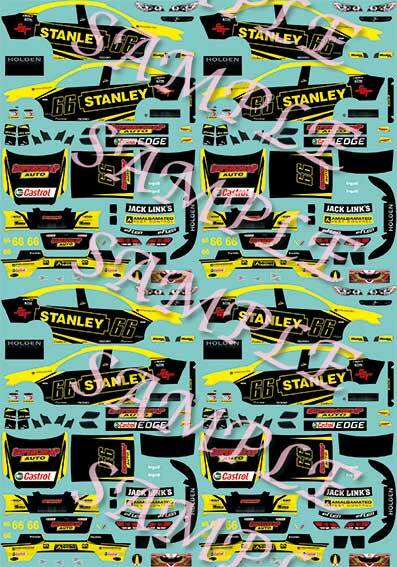 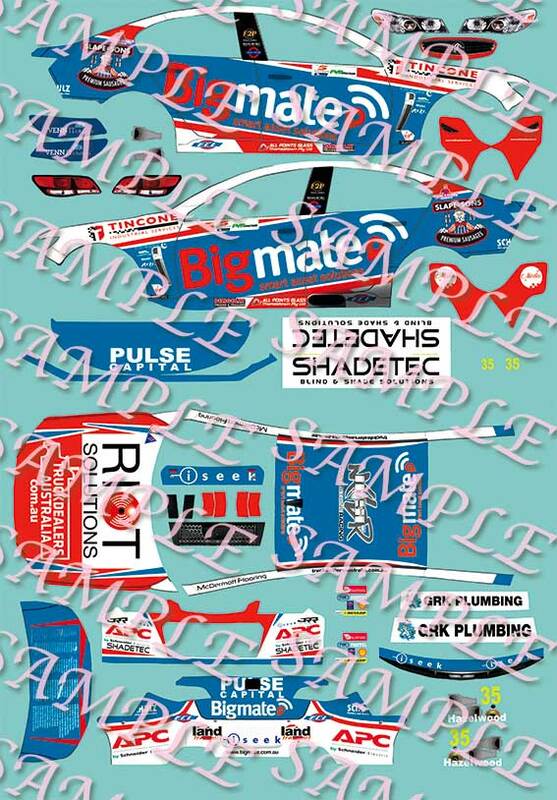 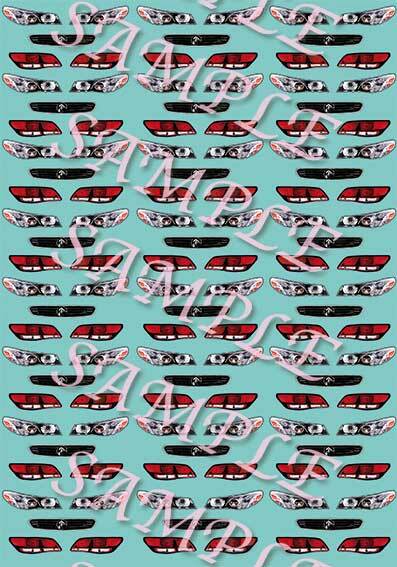 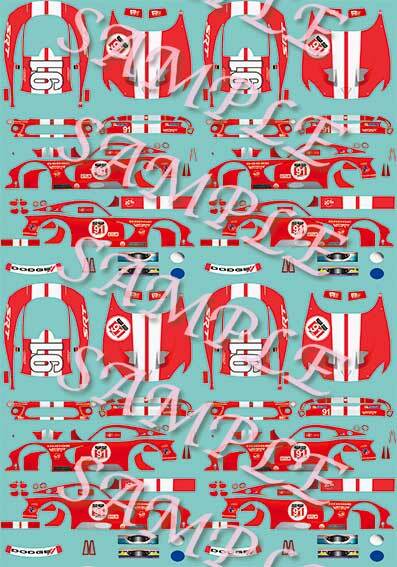 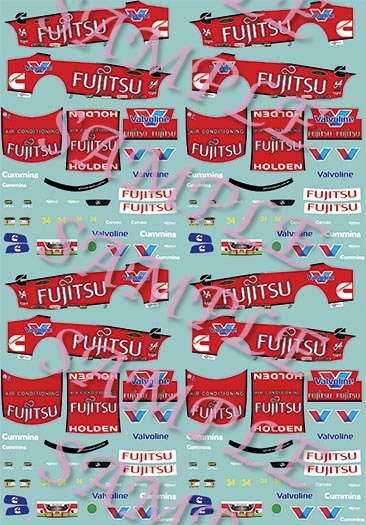 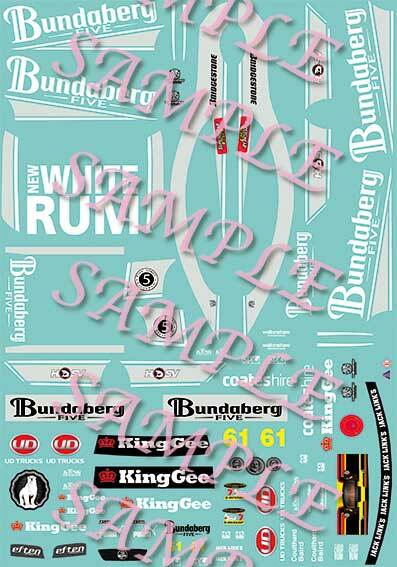 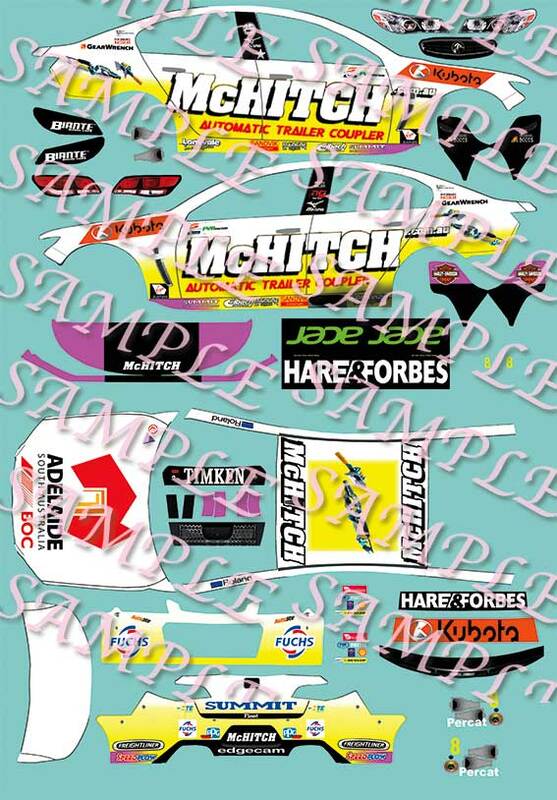 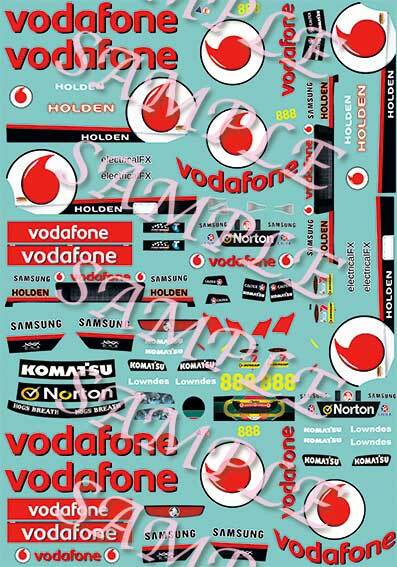 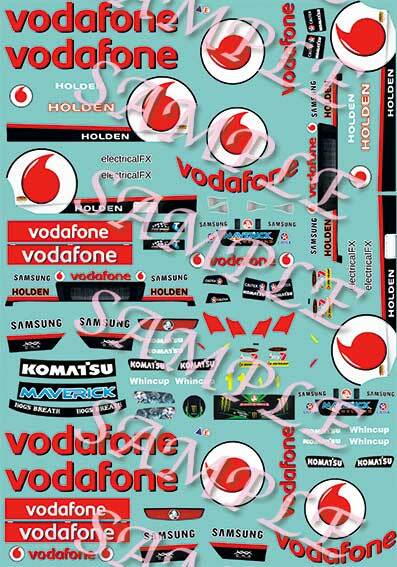 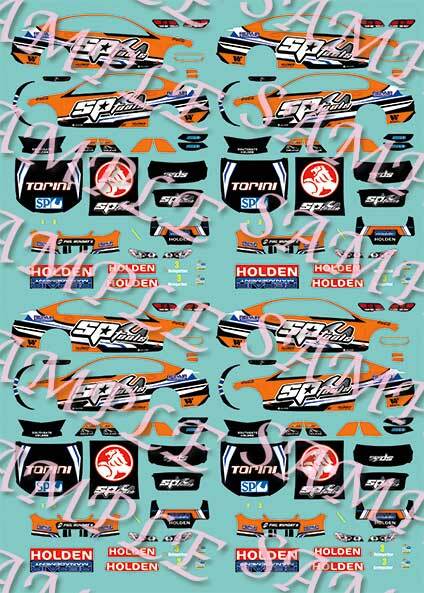 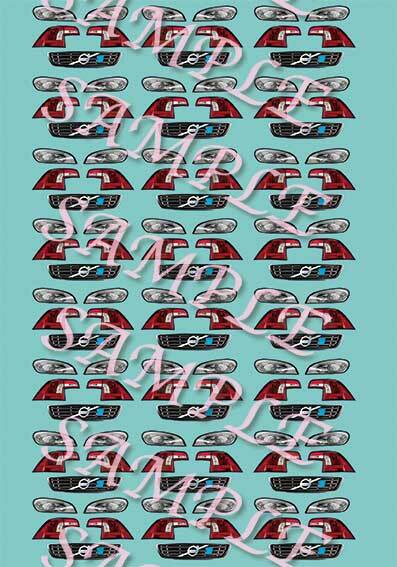 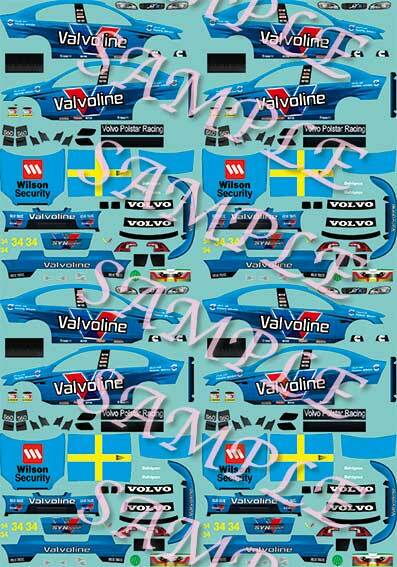 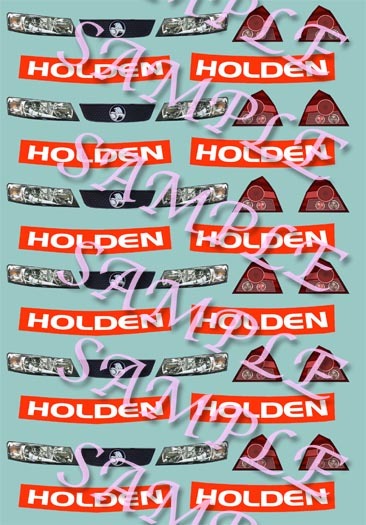 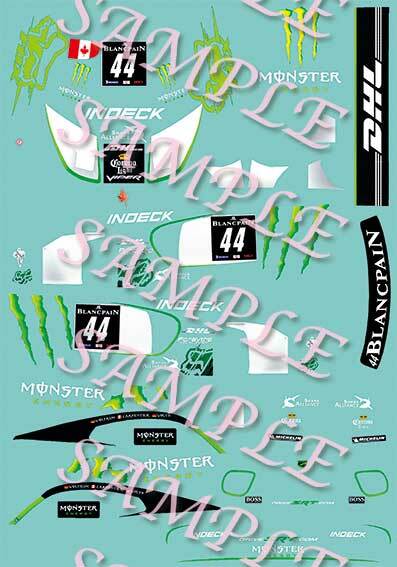 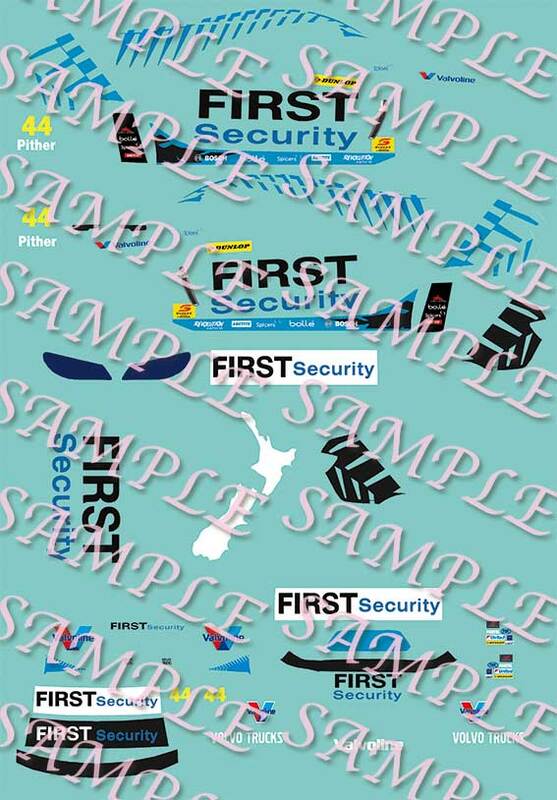 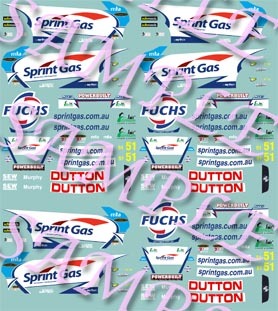 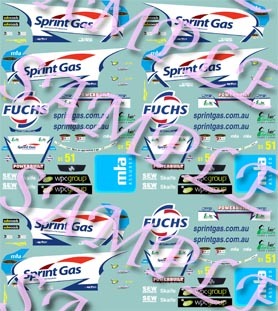 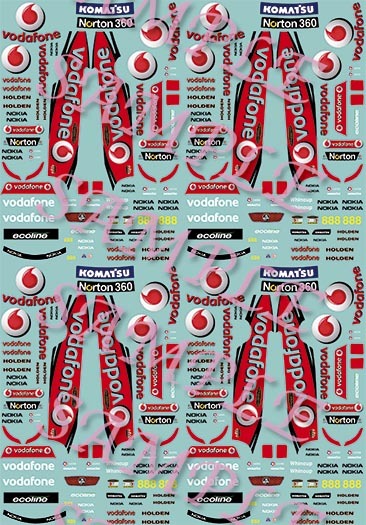 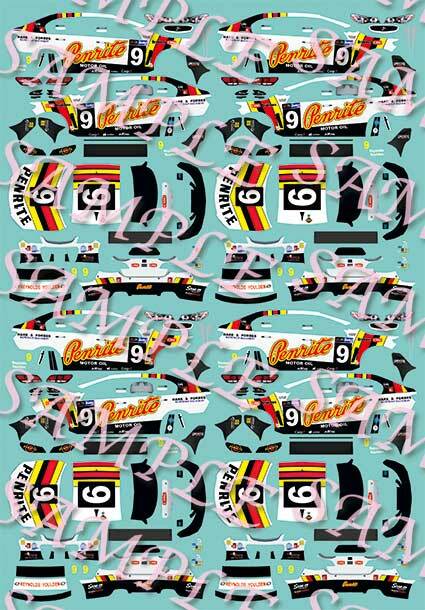 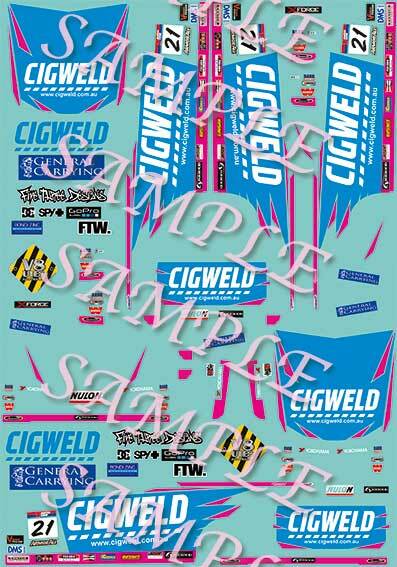 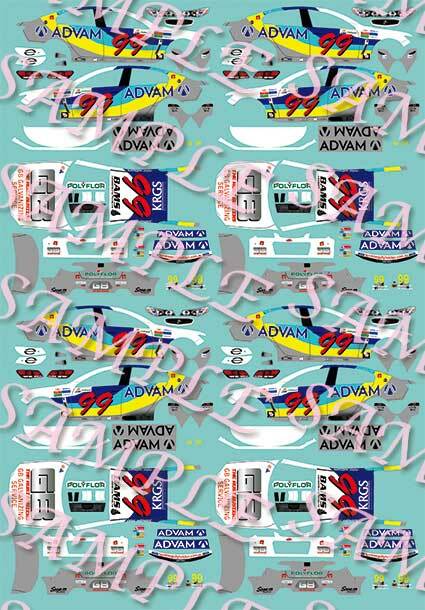 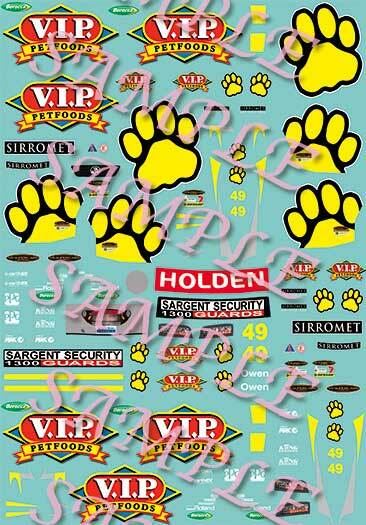 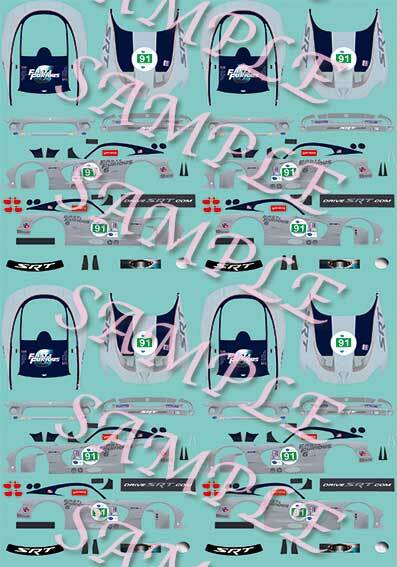 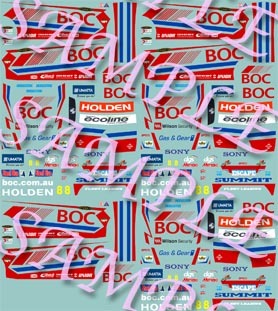 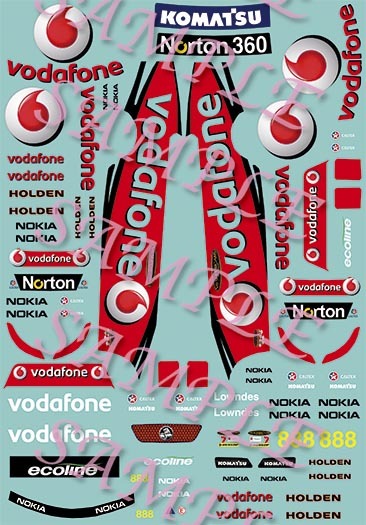 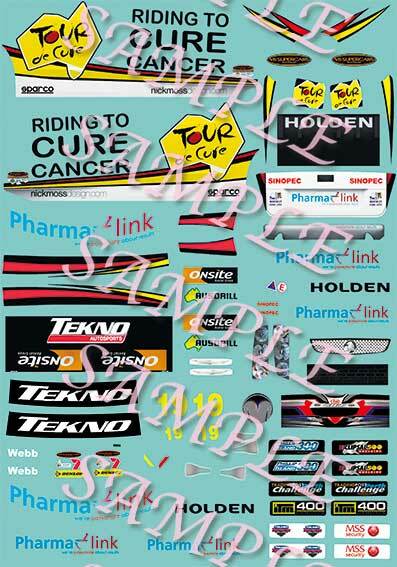 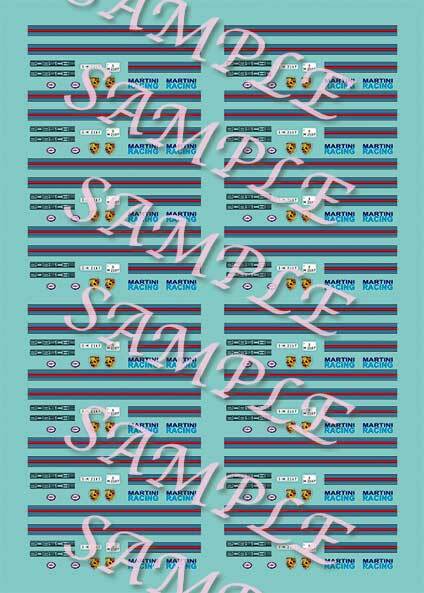 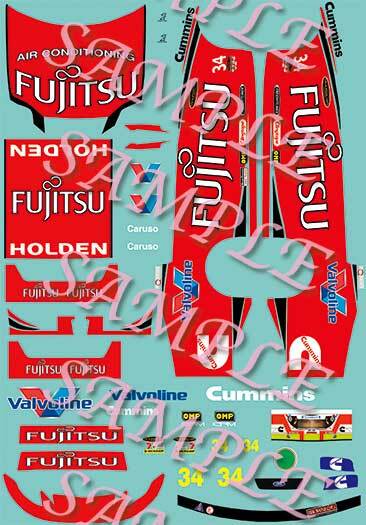 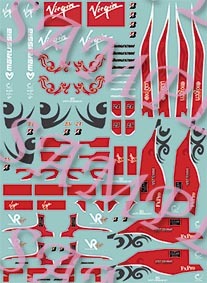 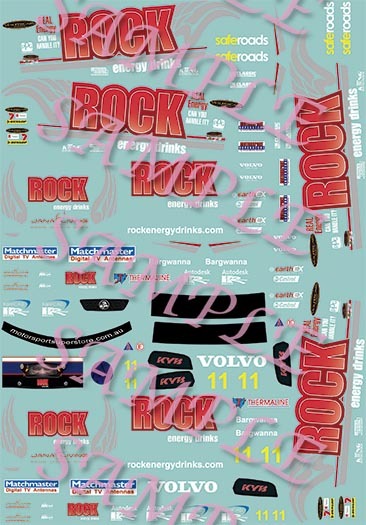 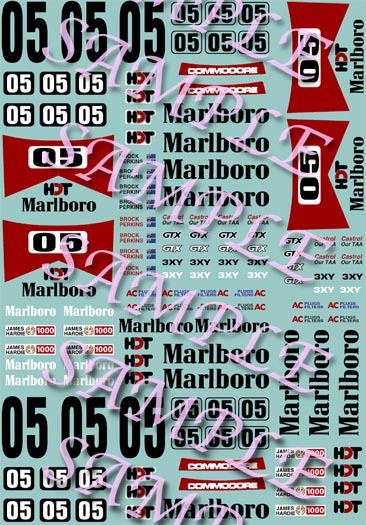 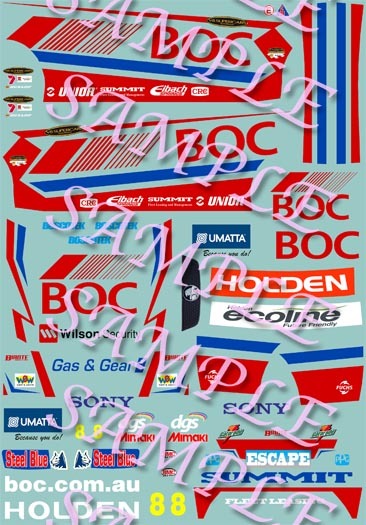 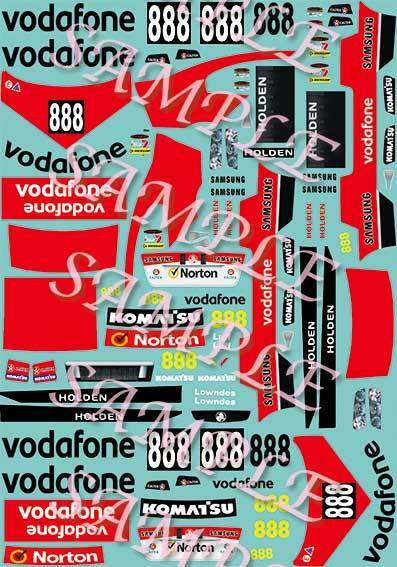 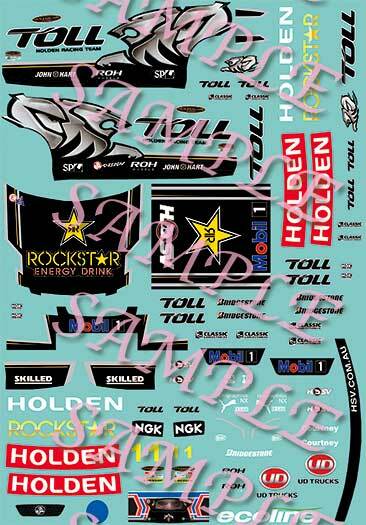 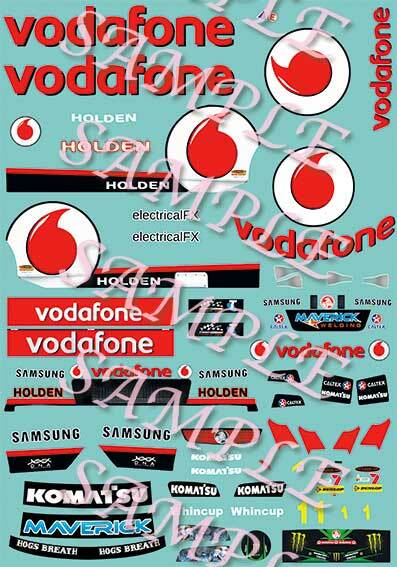 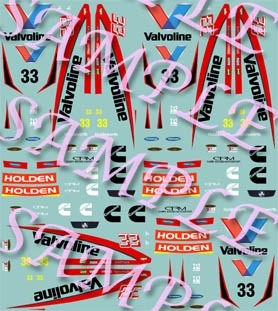 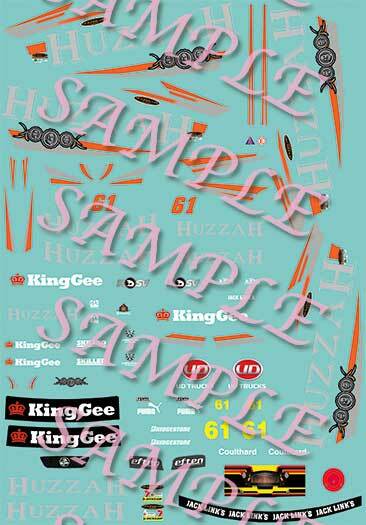 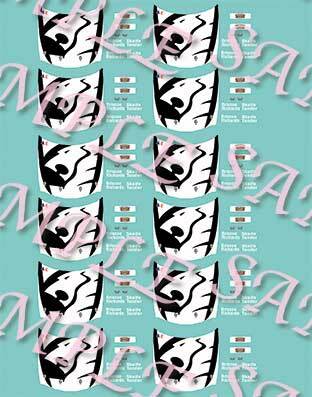 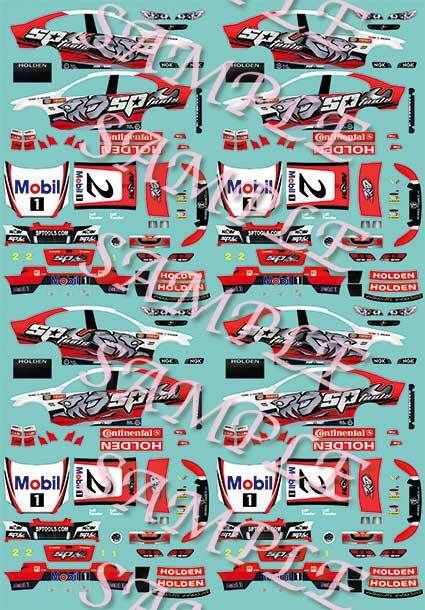 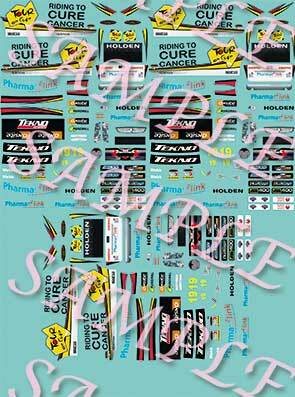 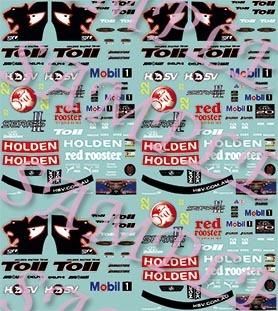 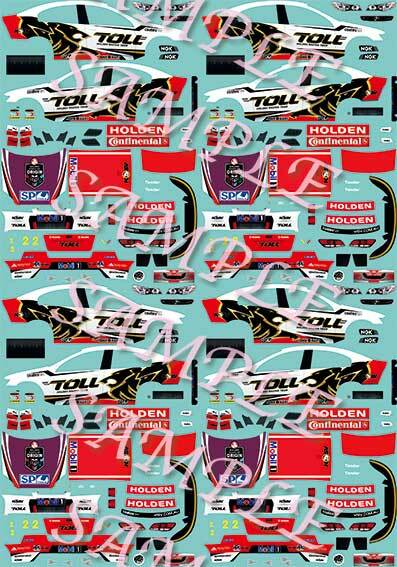 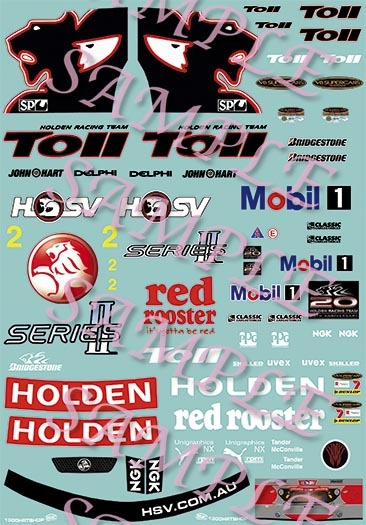 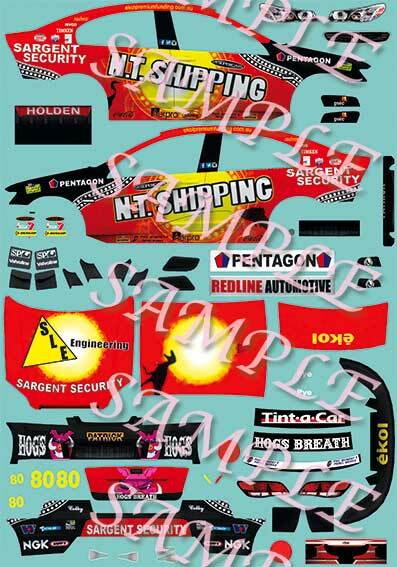 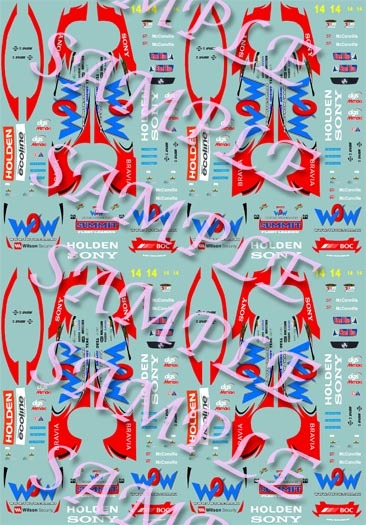 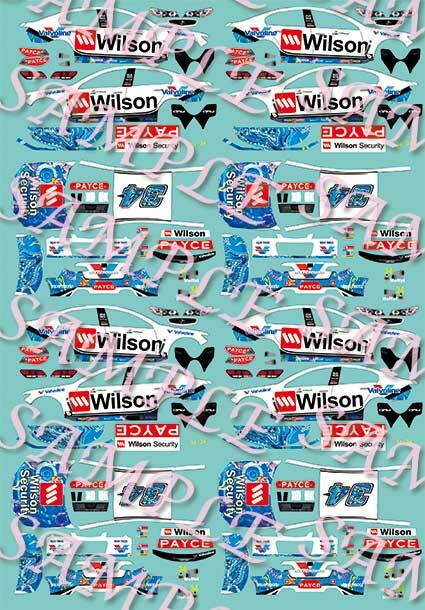 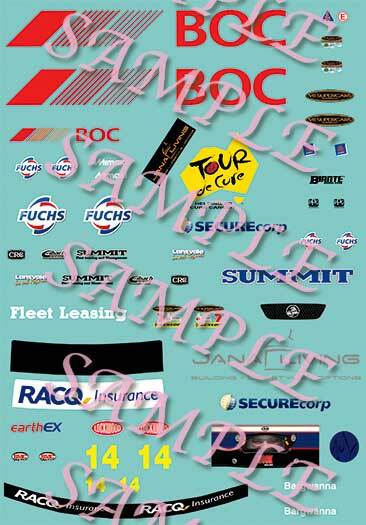 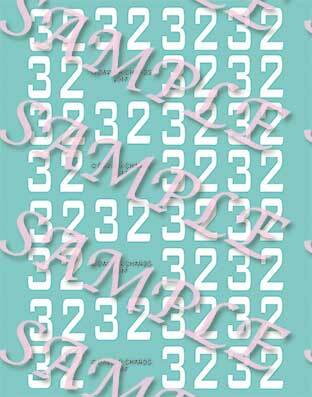 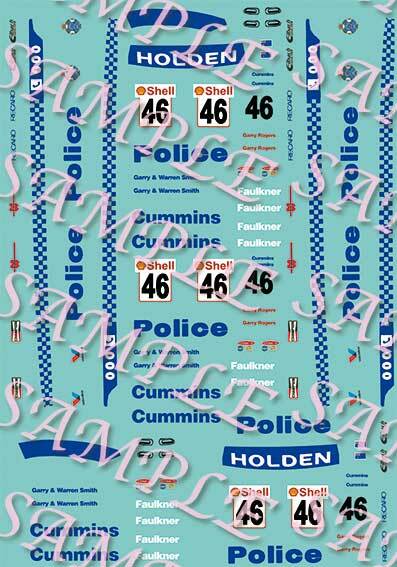 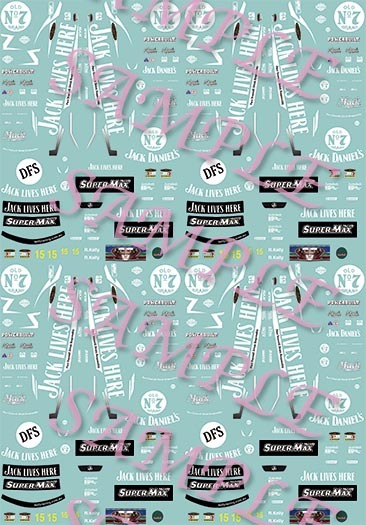 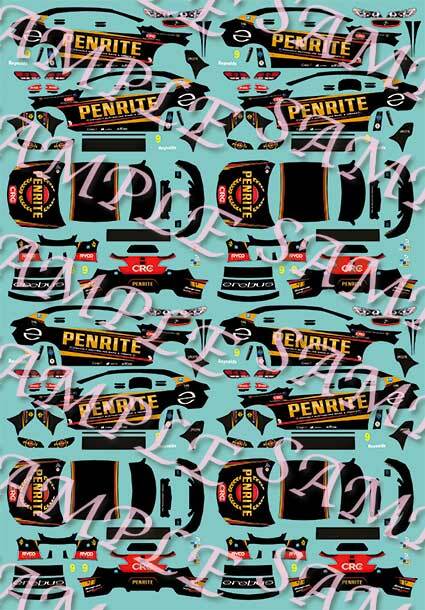 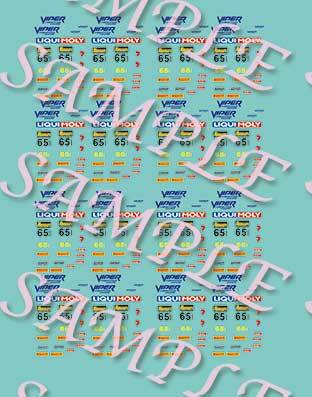 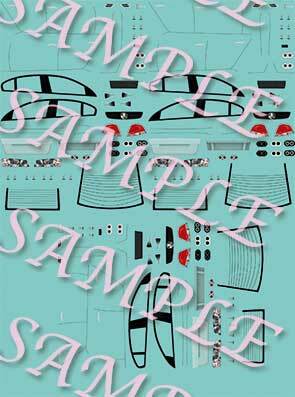 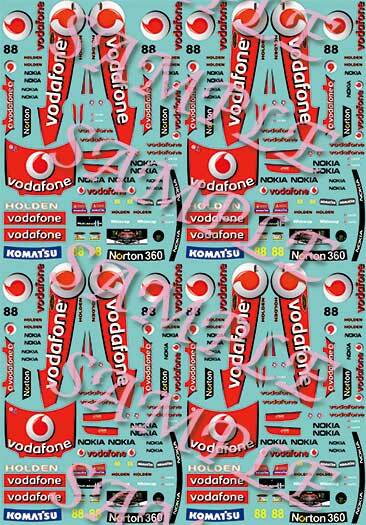 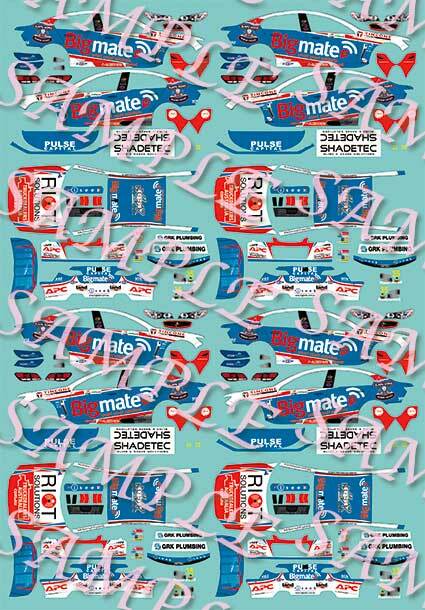 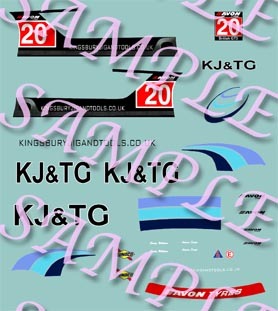 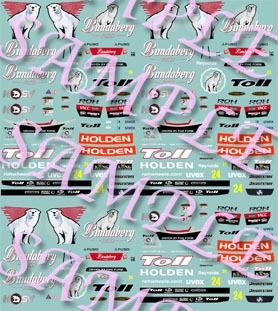 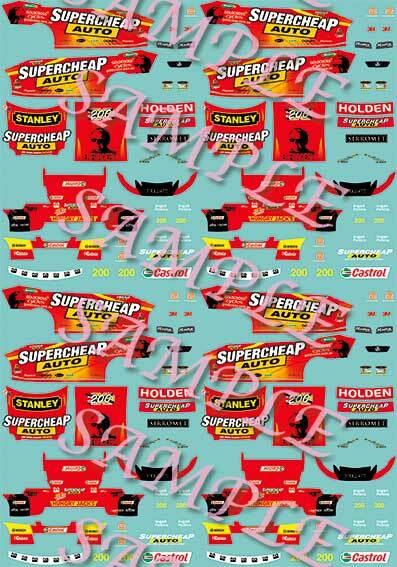 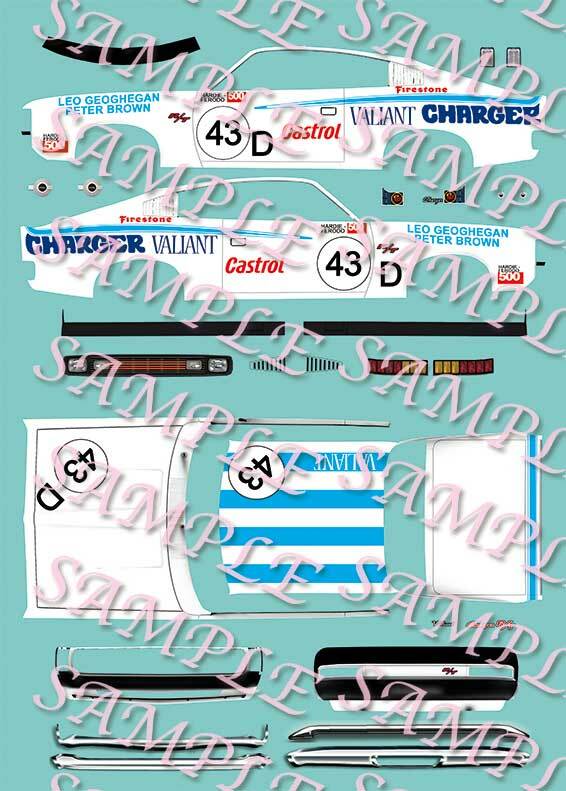 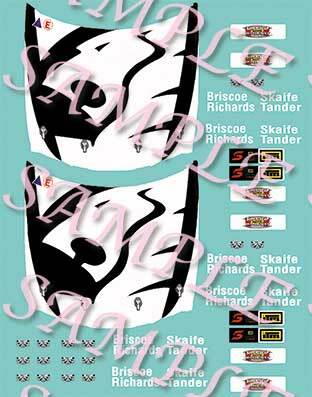 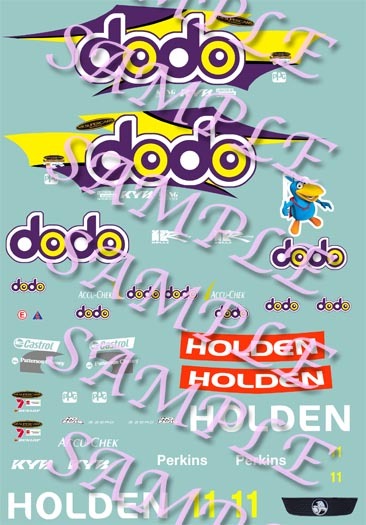 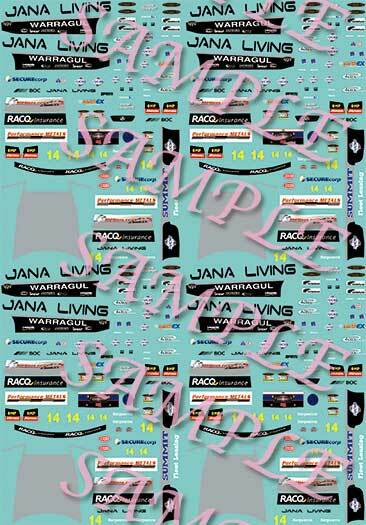 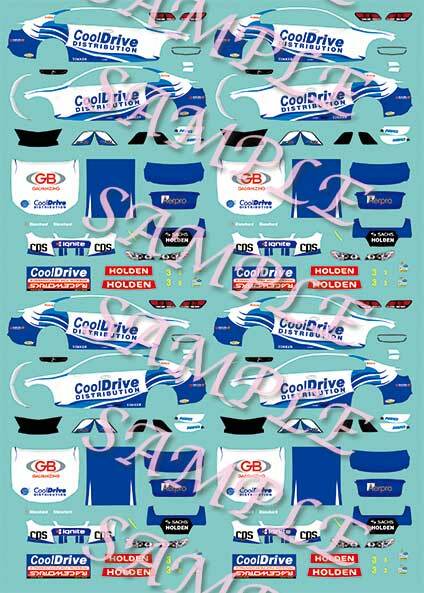 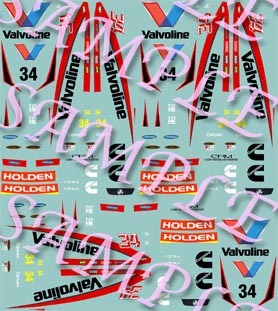 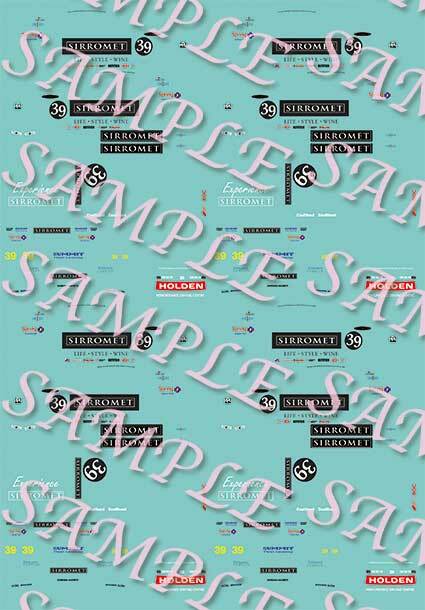 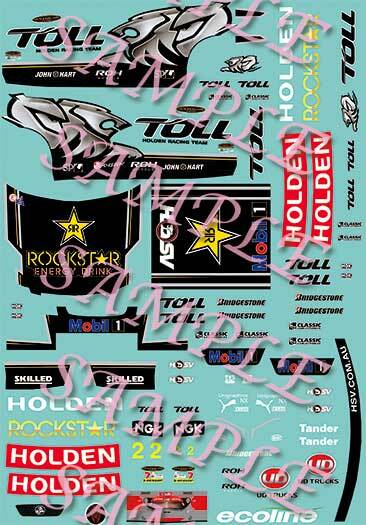 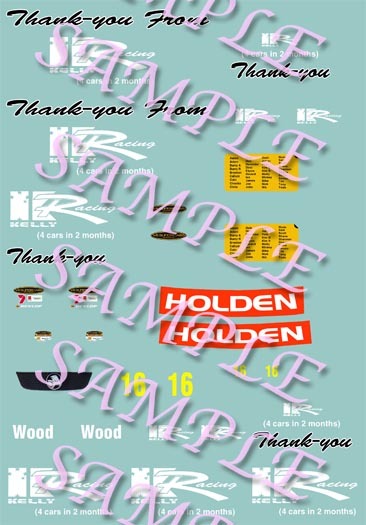 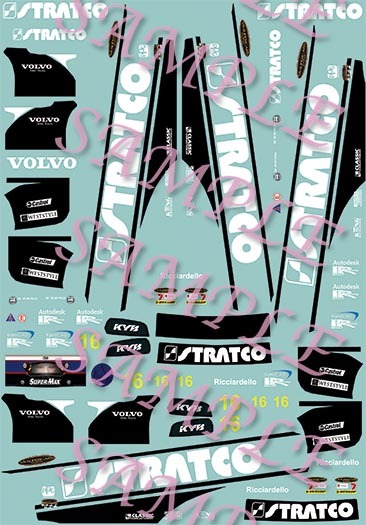 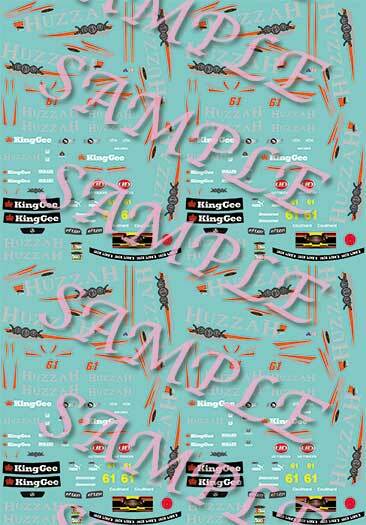 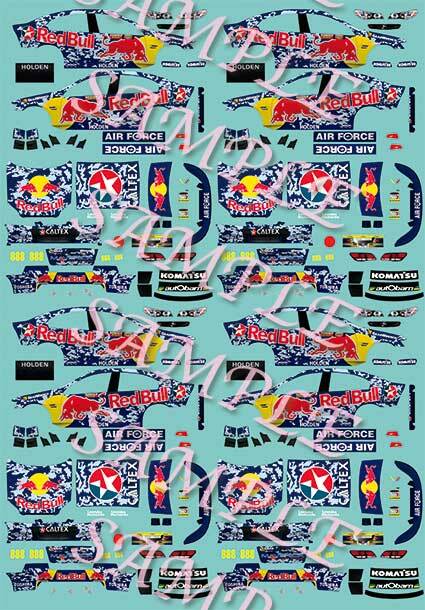 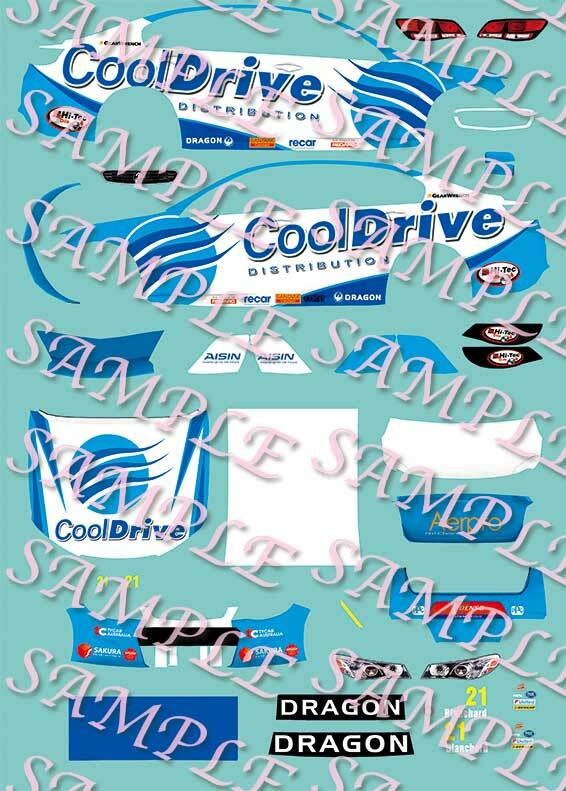 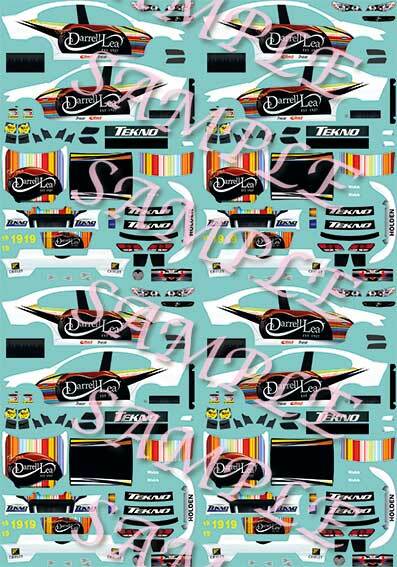 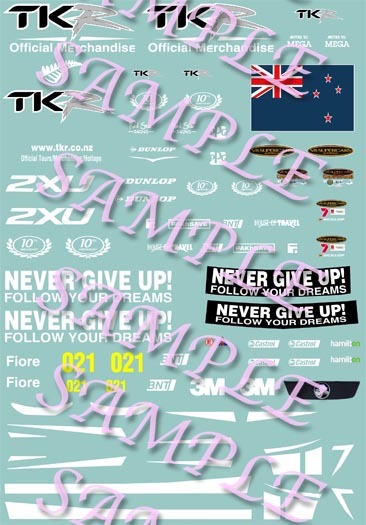 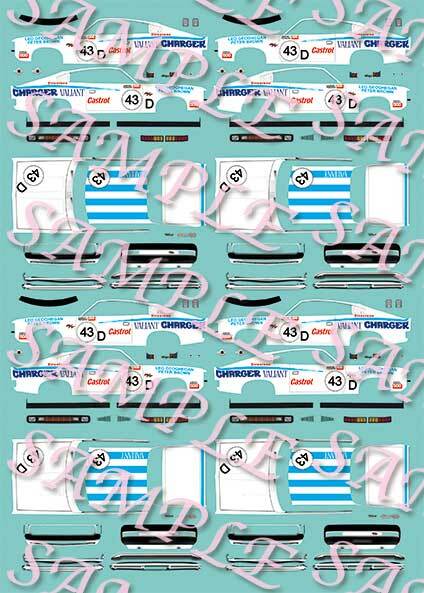 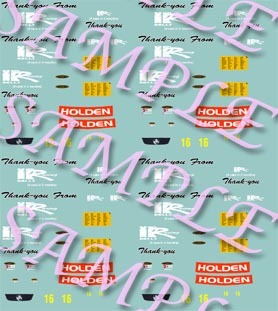 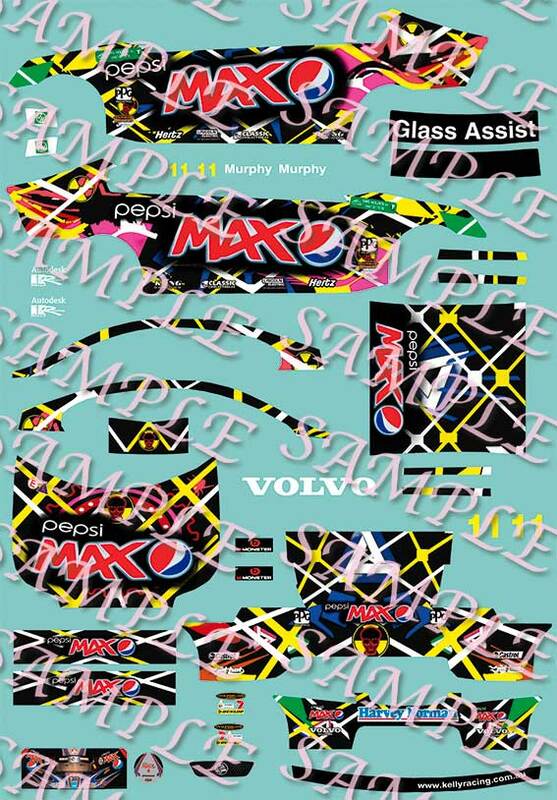 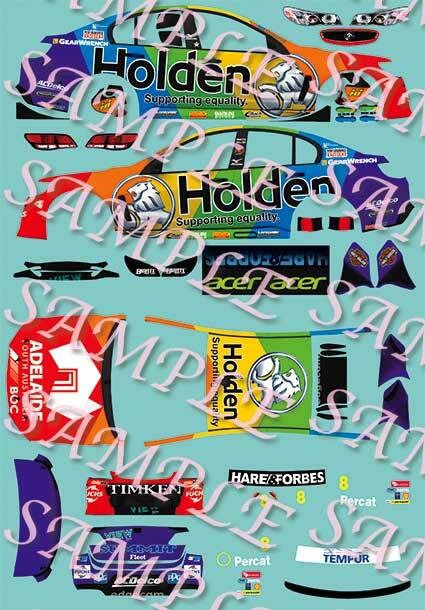 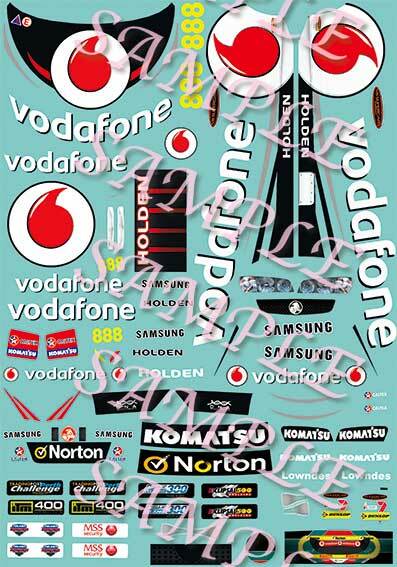 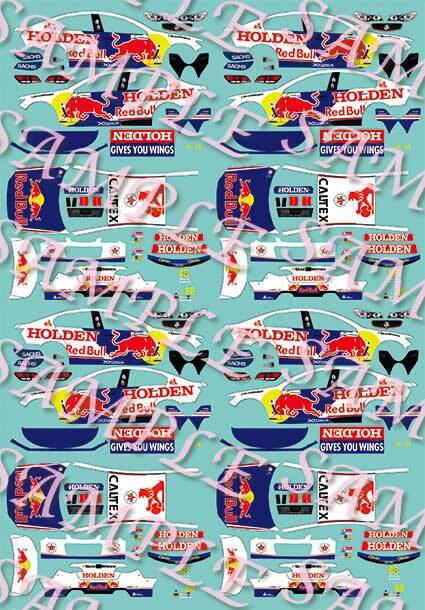 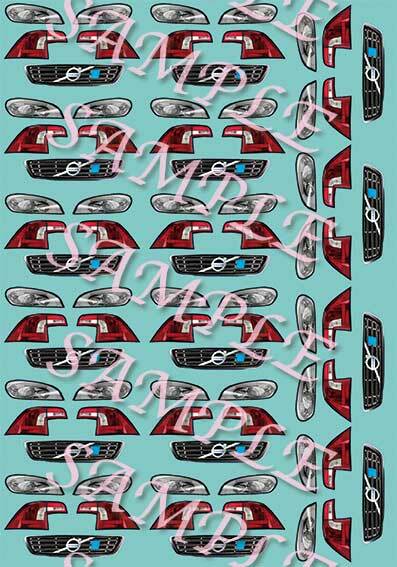 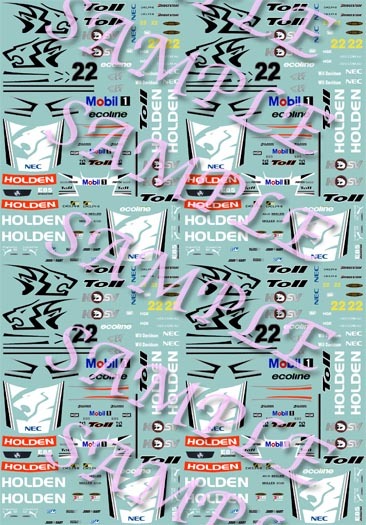 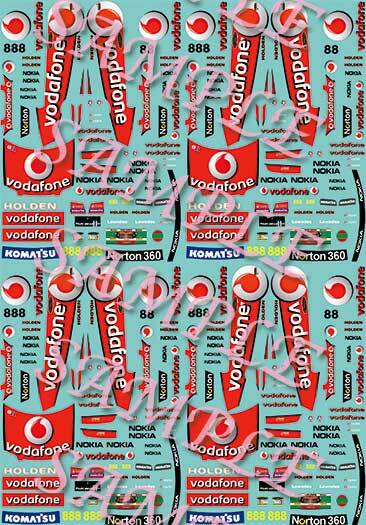 The following is a list of Waterslide Decals and Vinyl Peel & Stick Decals that I have available. 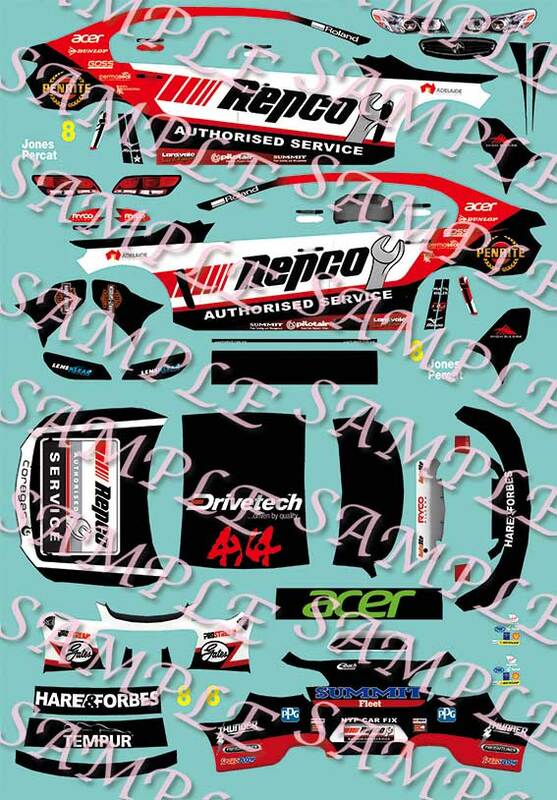 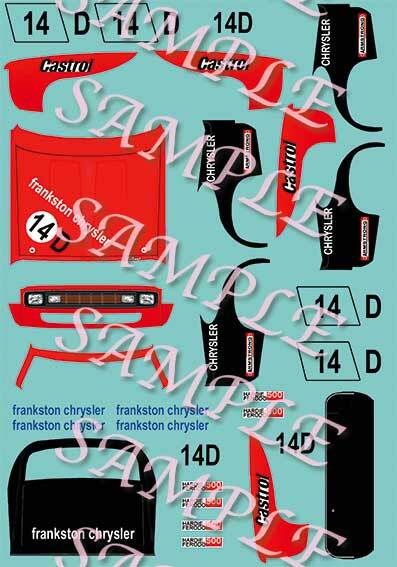 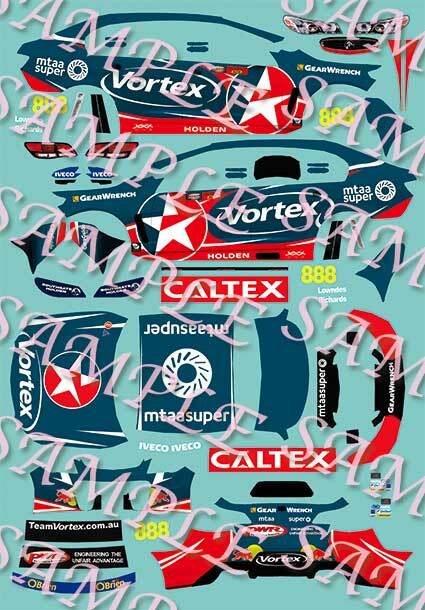 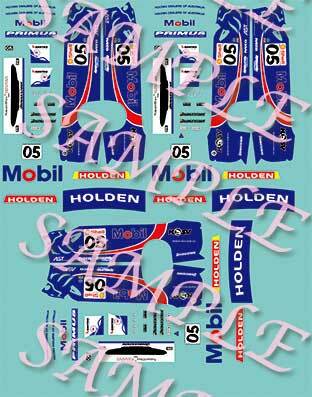 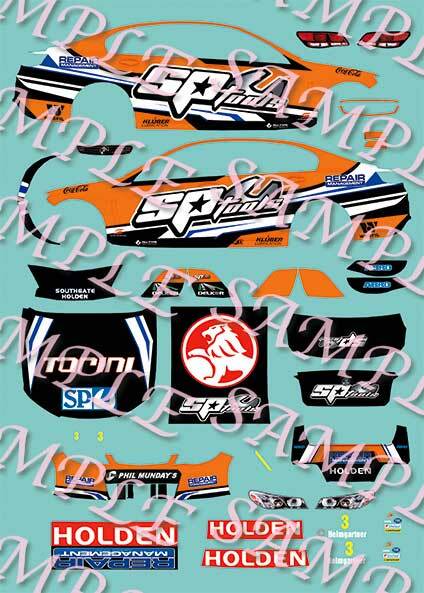 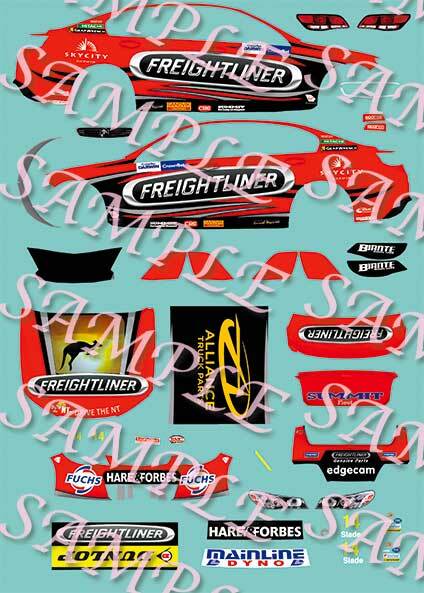 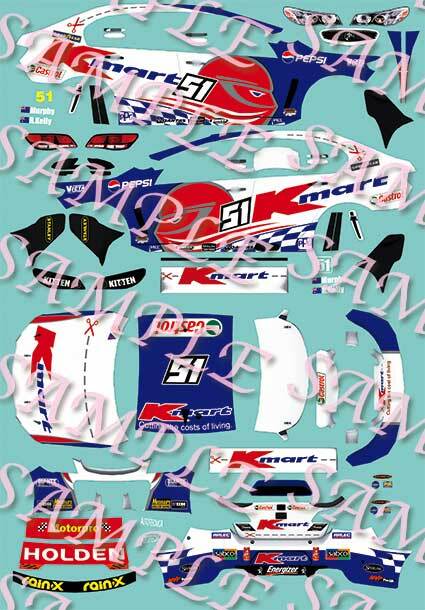 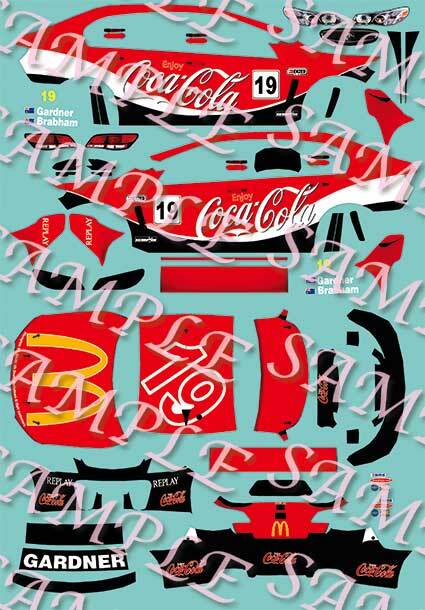 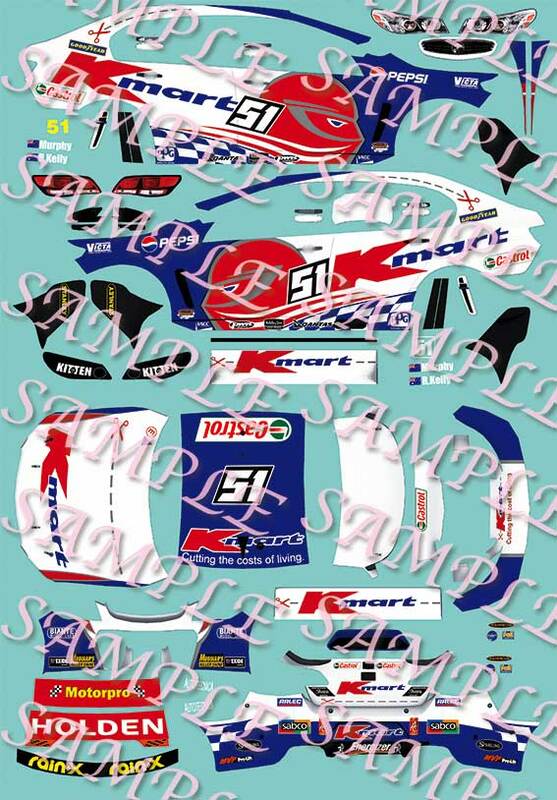 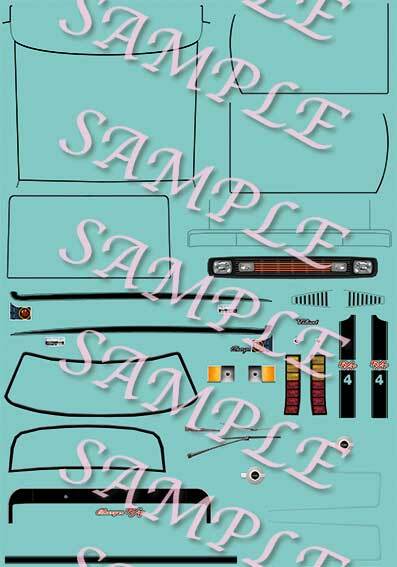 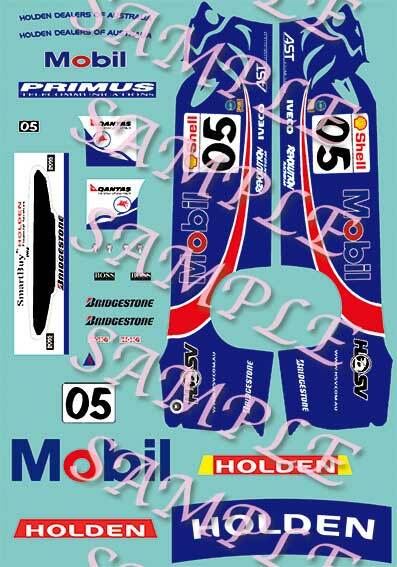 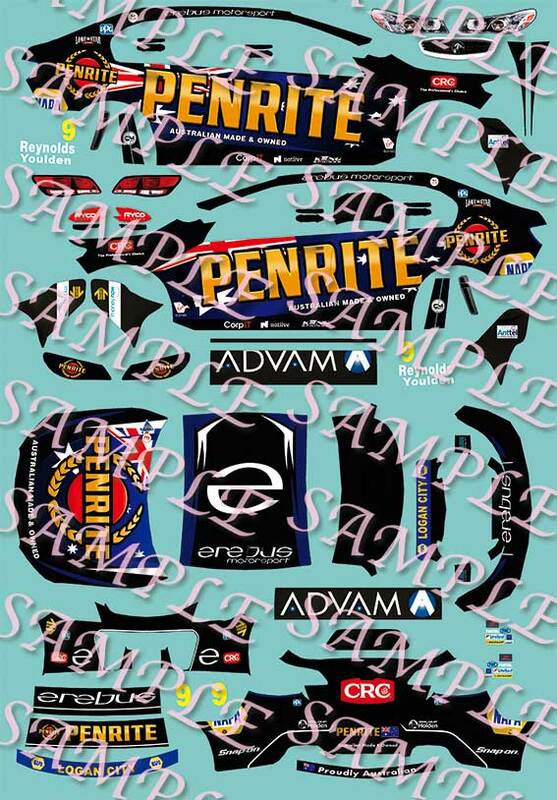 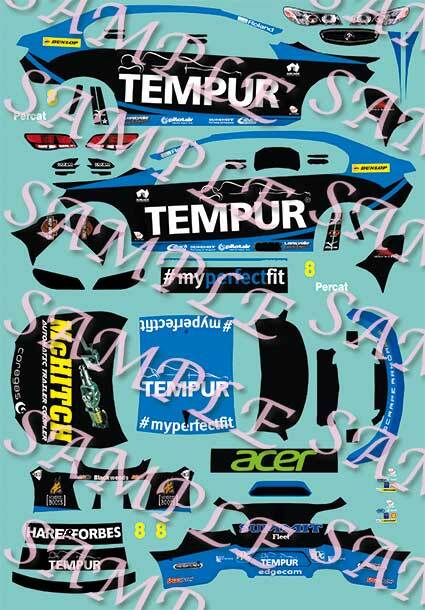 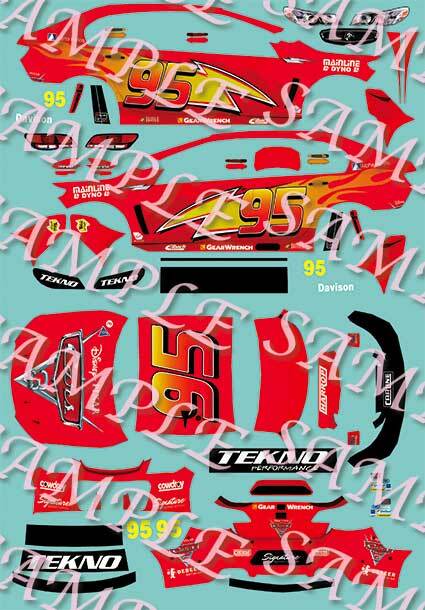 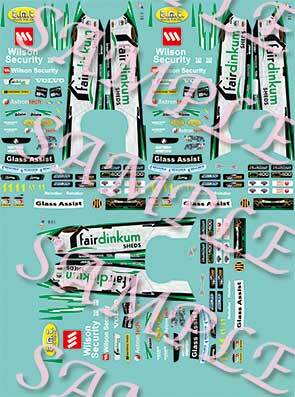 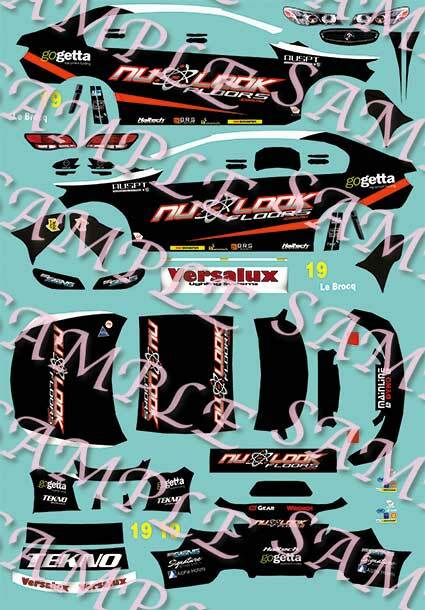 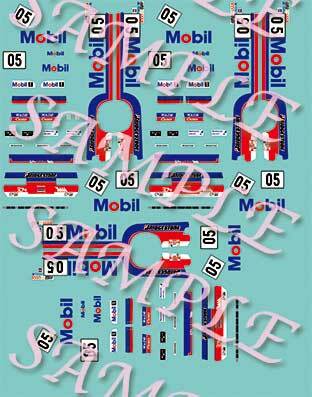 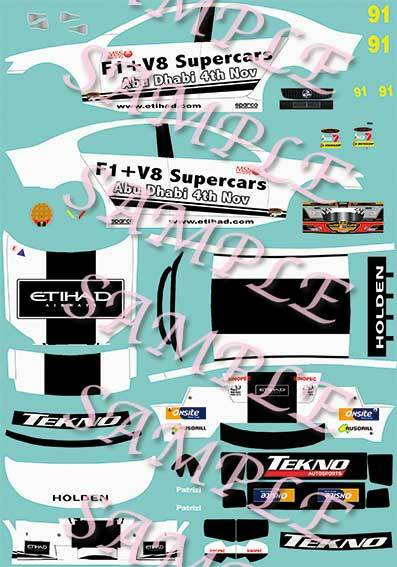 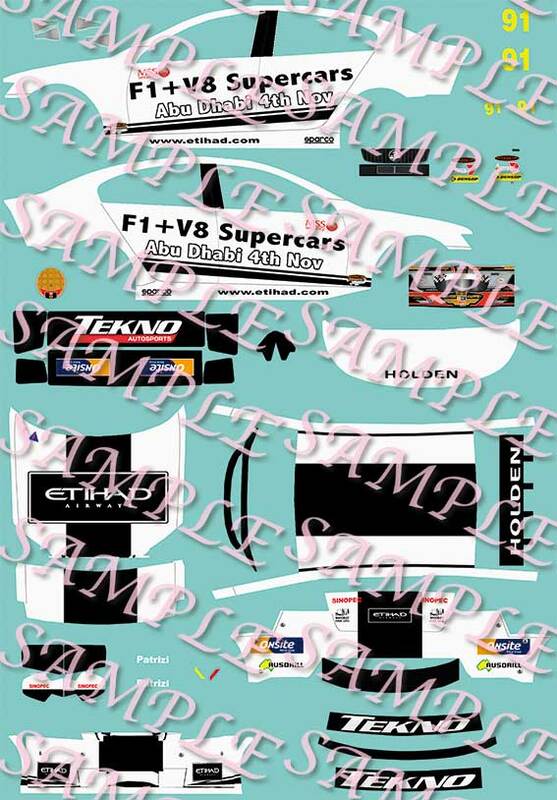 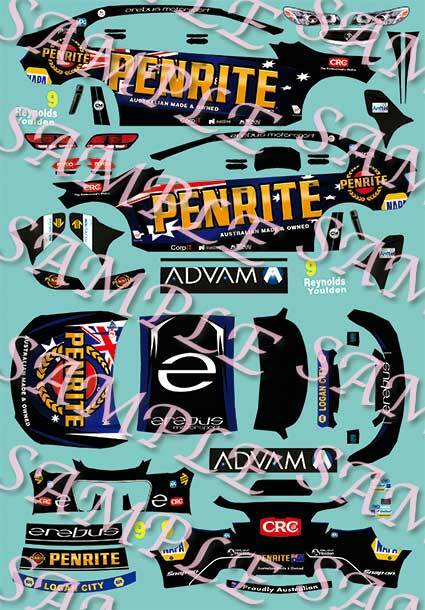 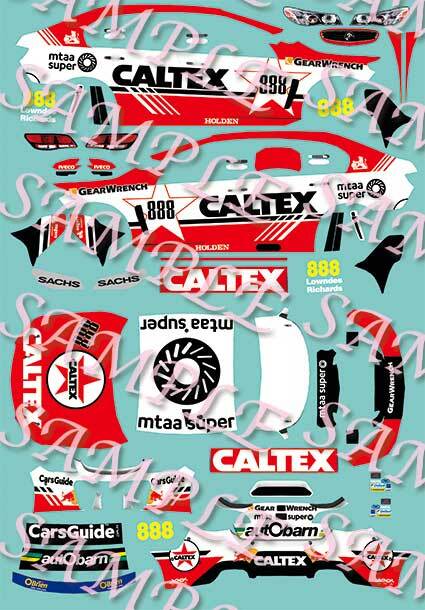 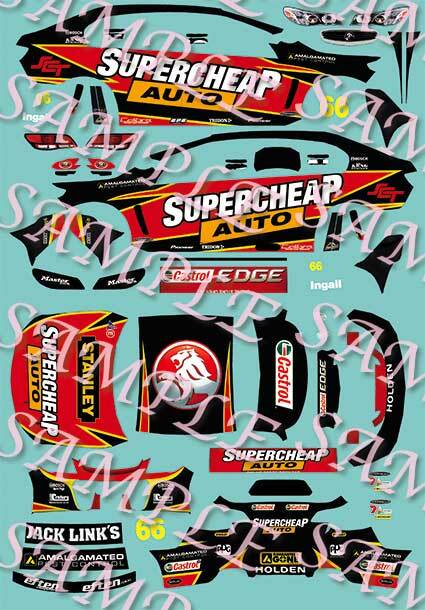 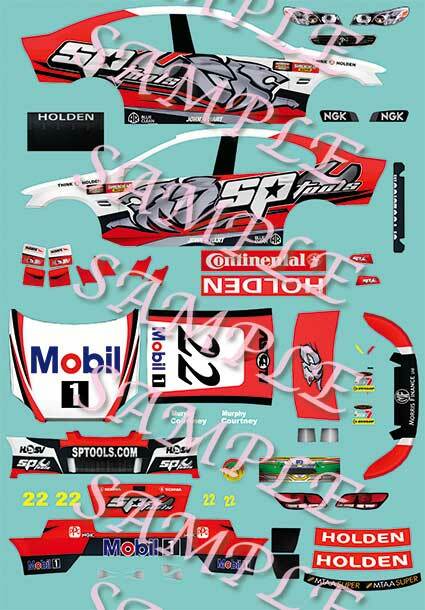 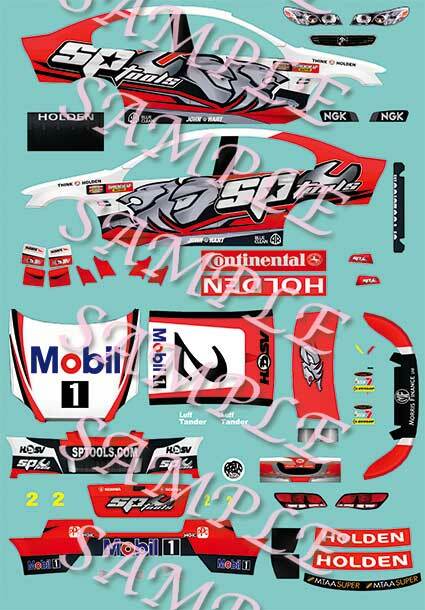 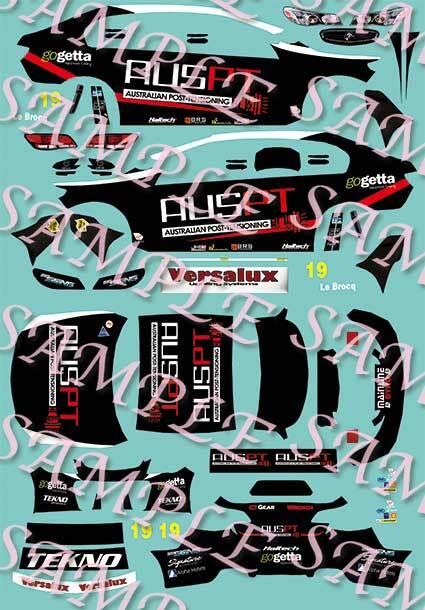 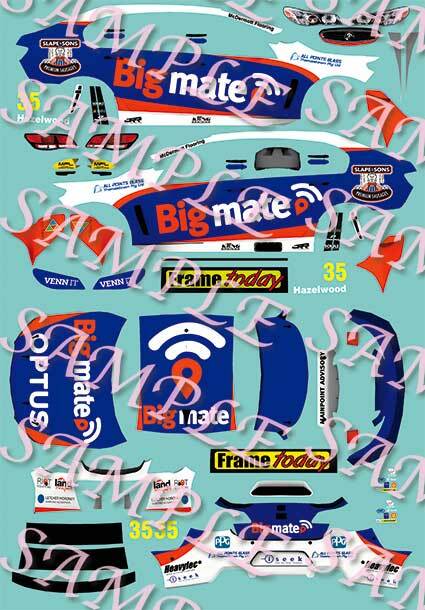 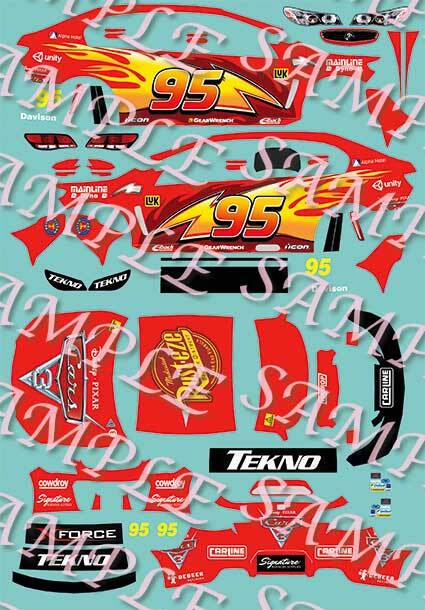 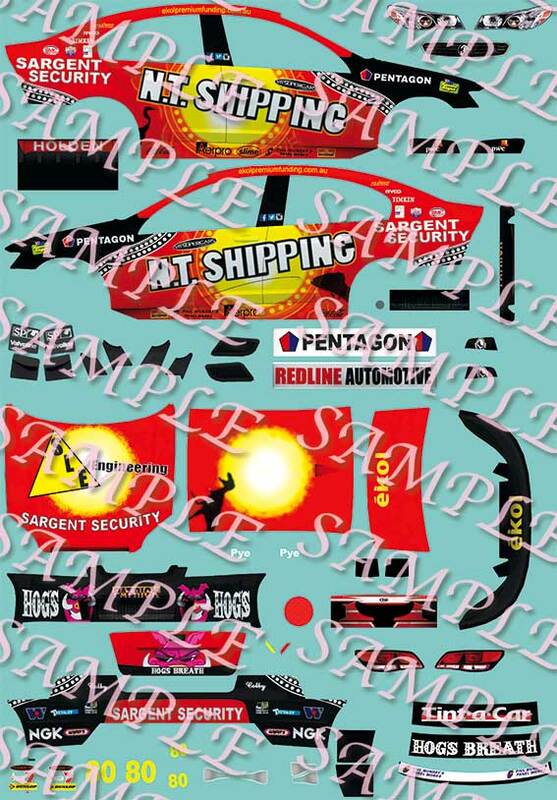 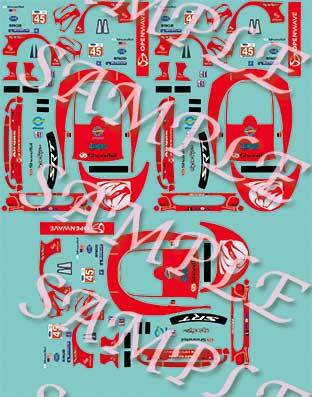 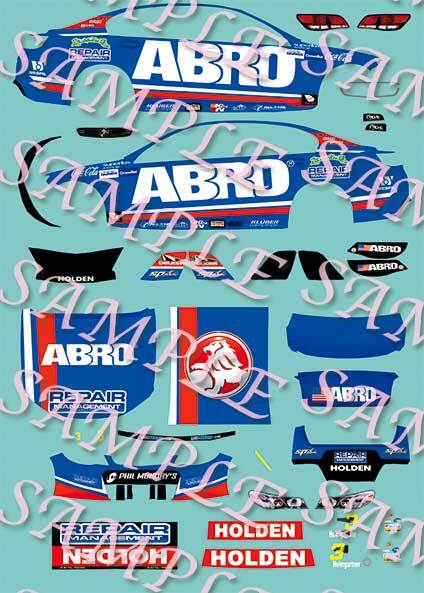 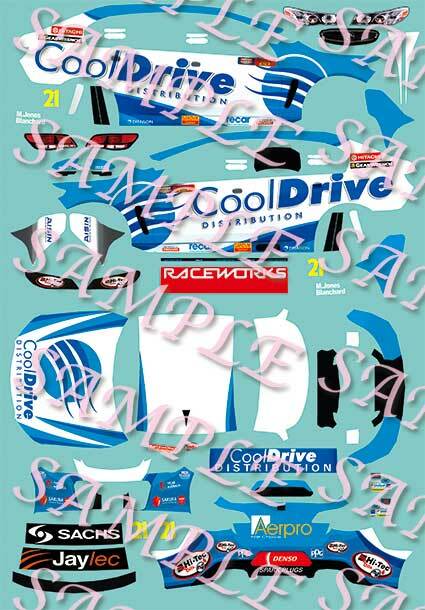 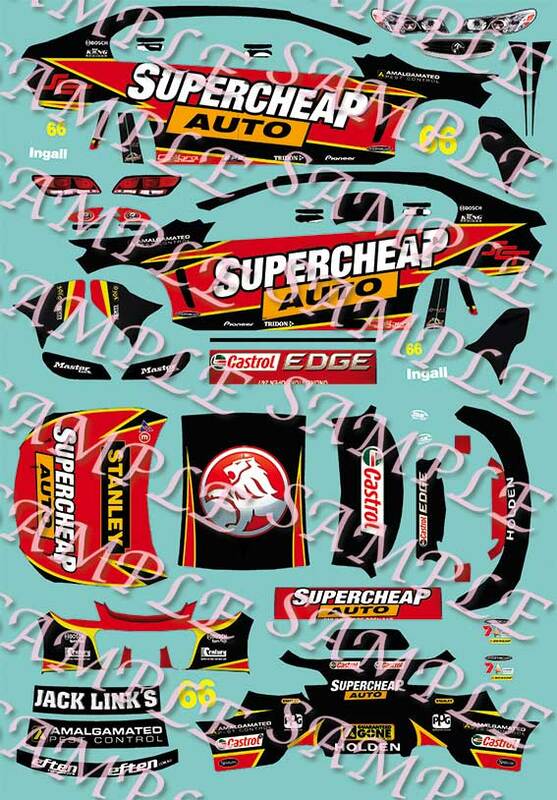 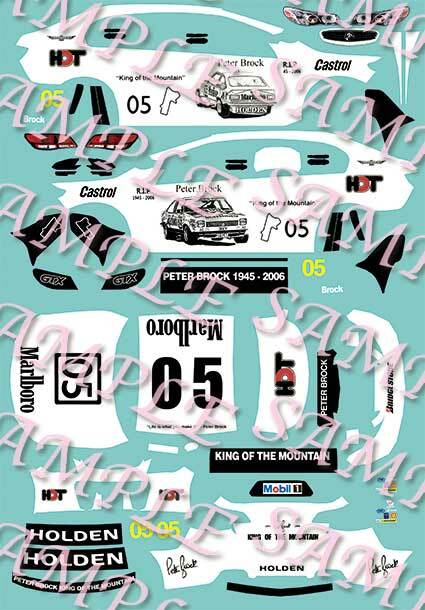 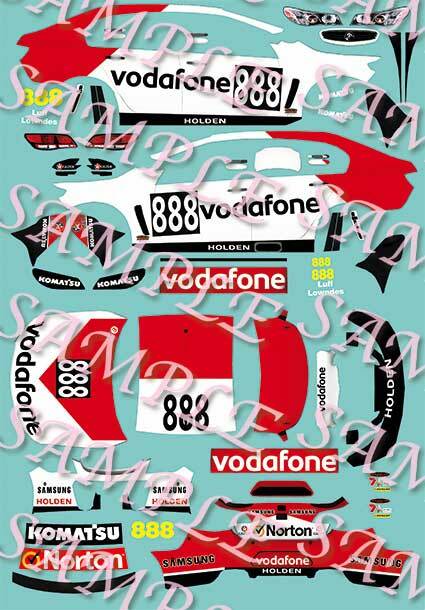 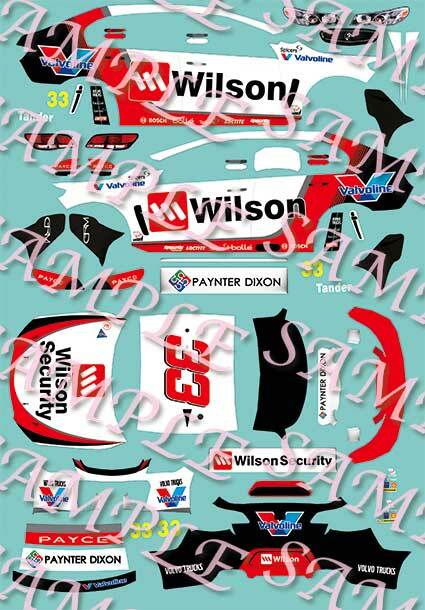 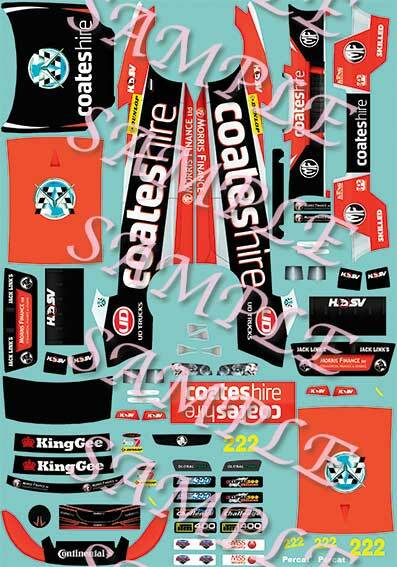 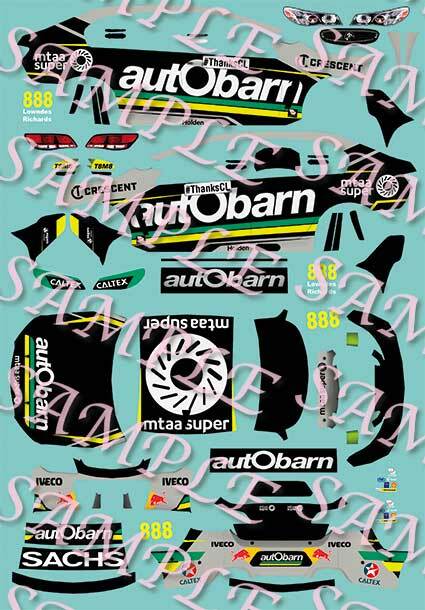 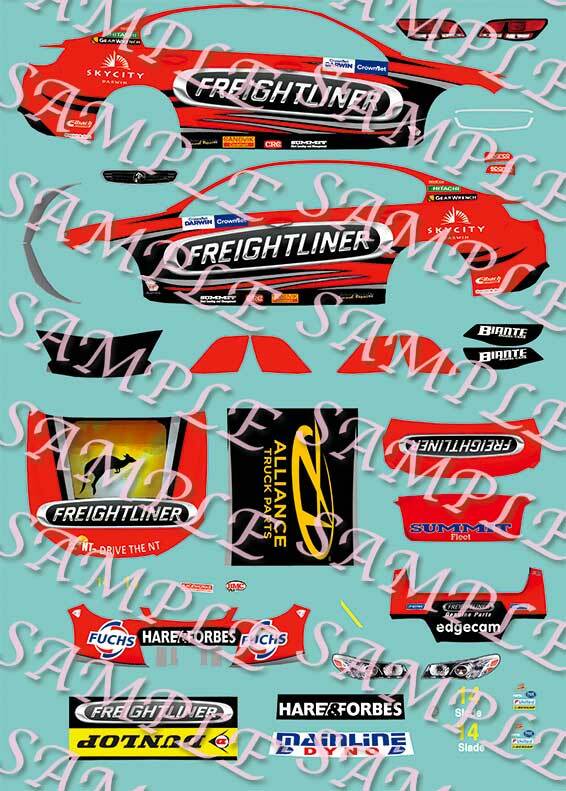 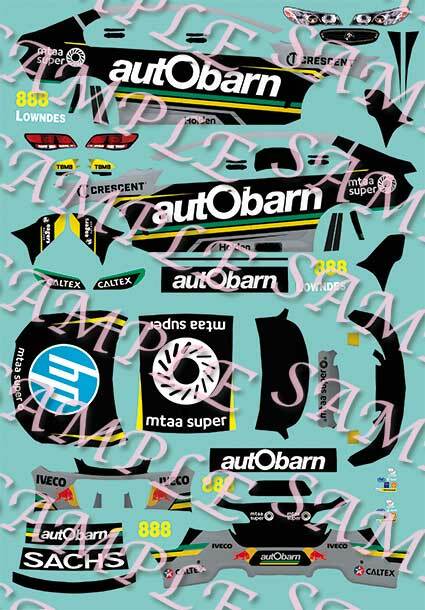 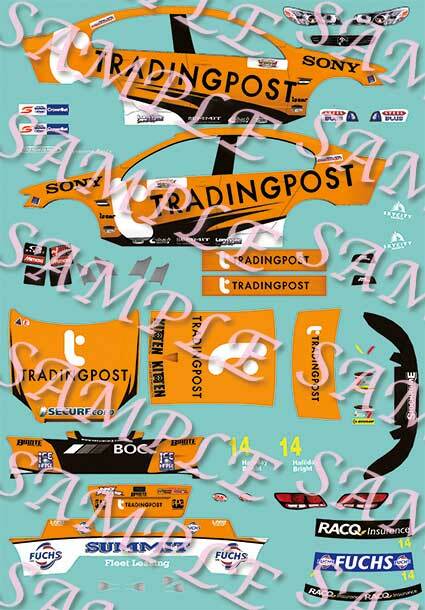 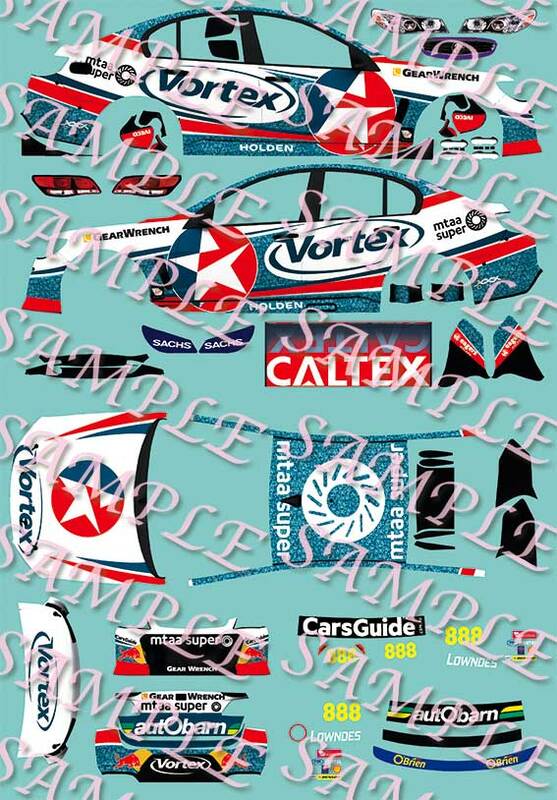 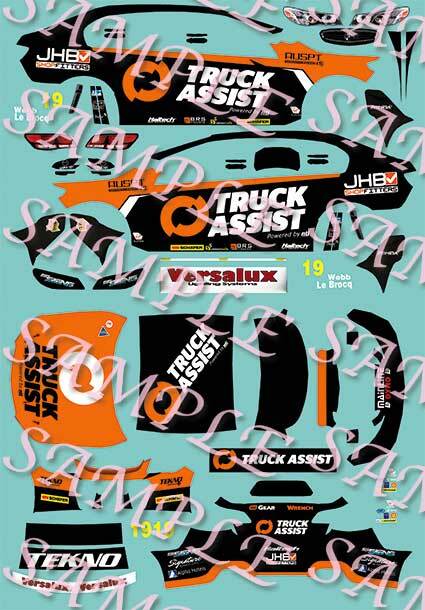 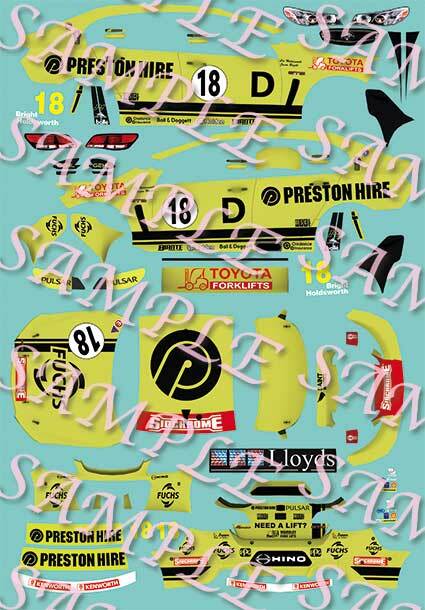 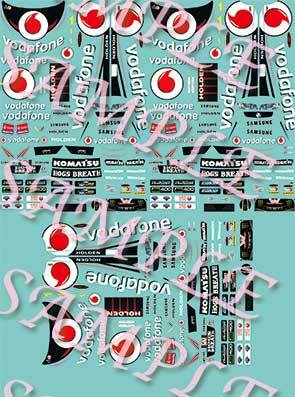 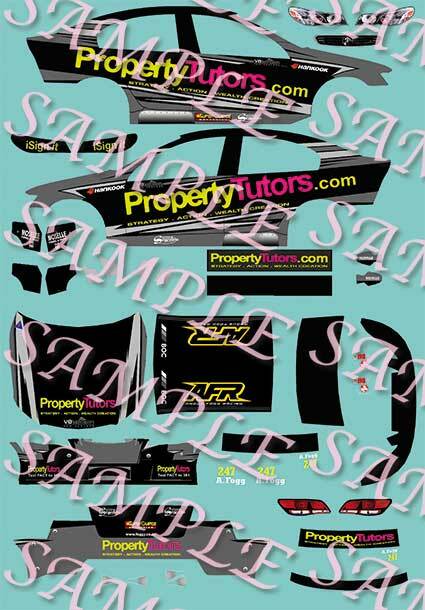 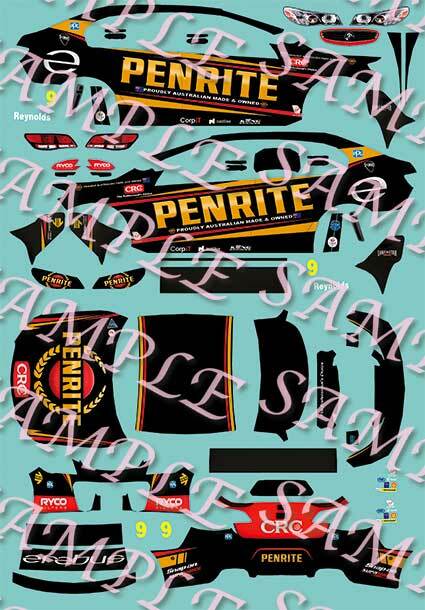 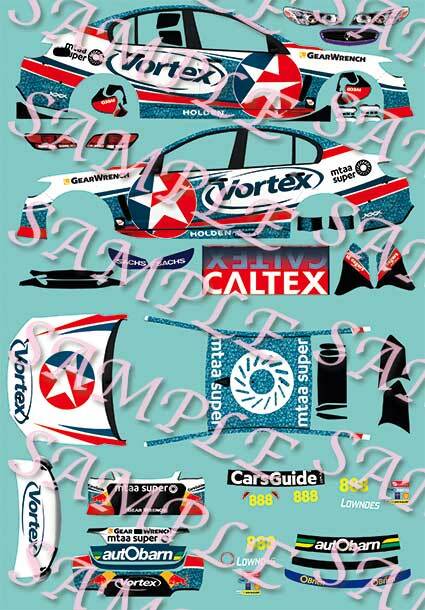 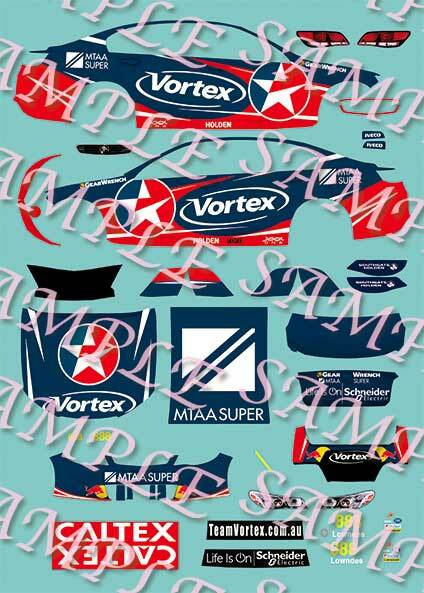 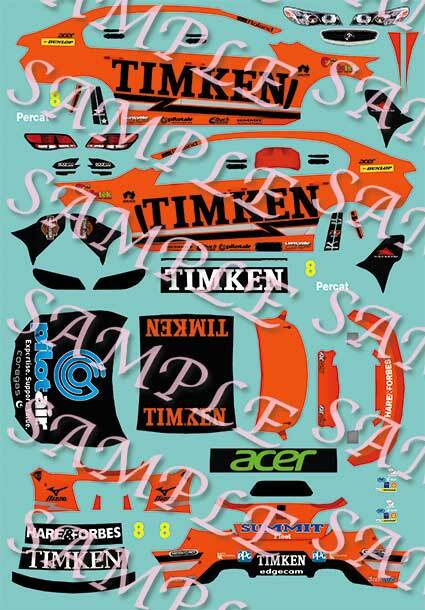 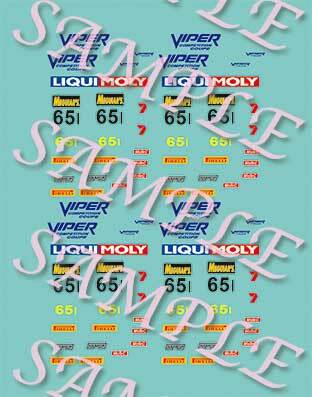 They are suitable for all types of model cars - Plastic, Resin, Clear and Diecast, not just slot cars. 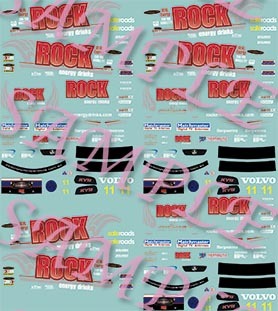 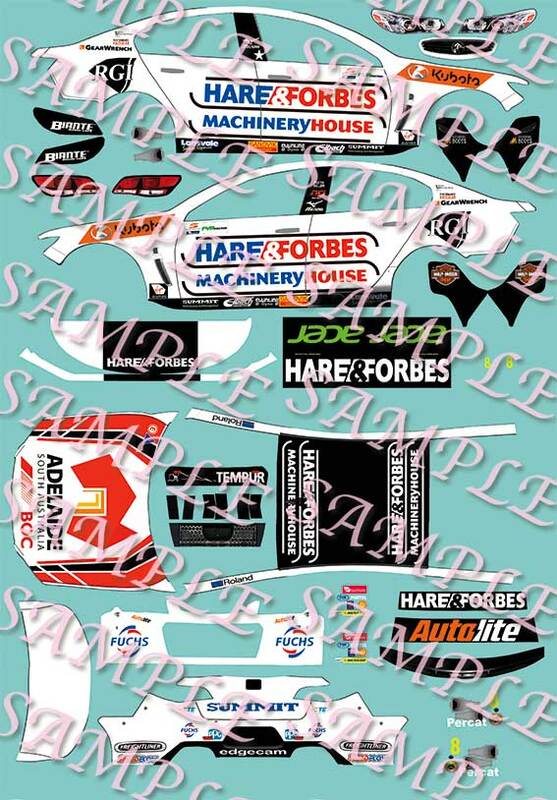 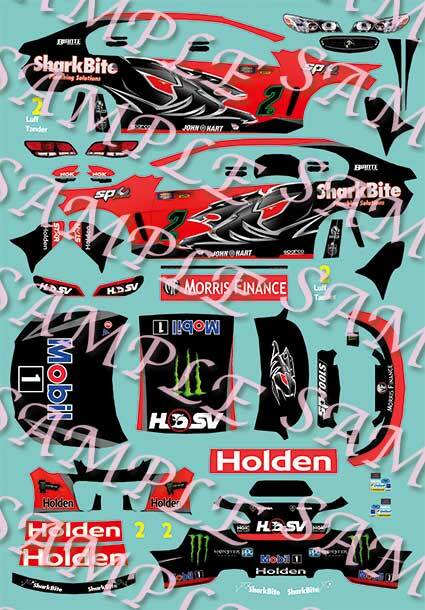 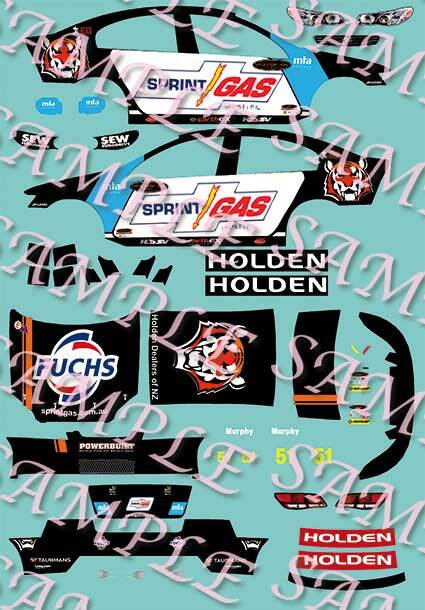 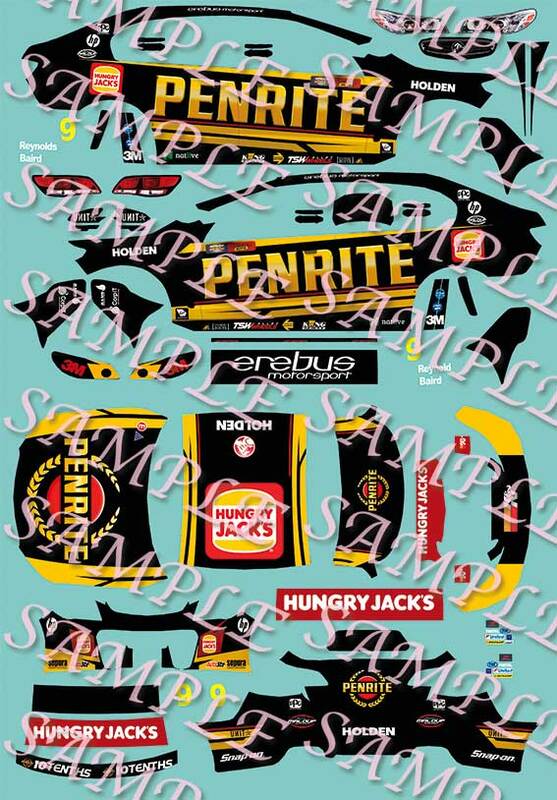 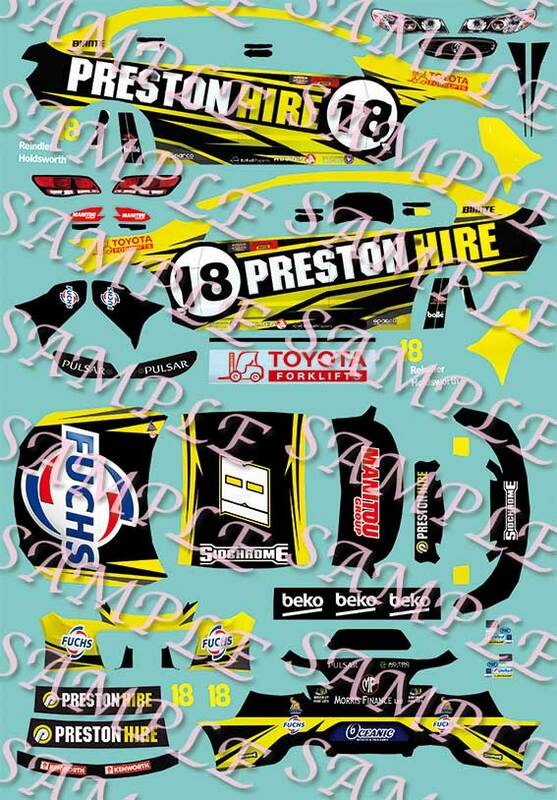 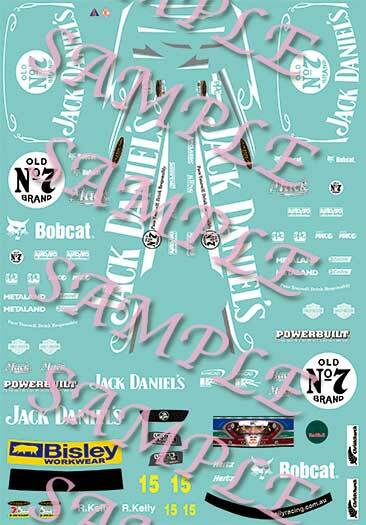 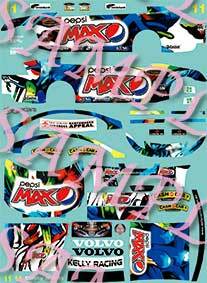 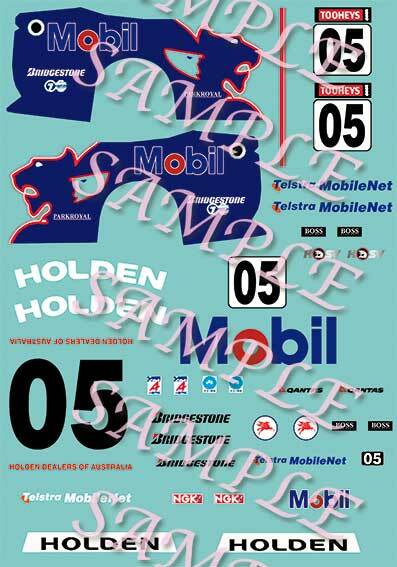 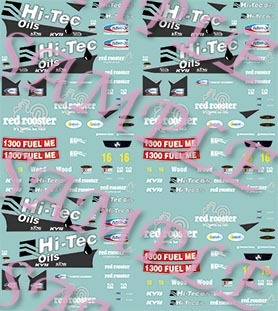 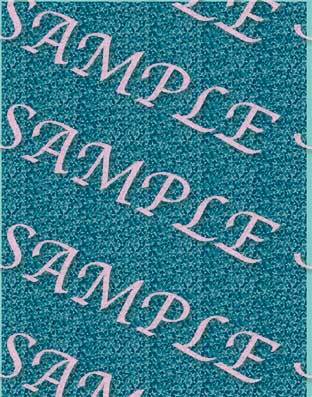 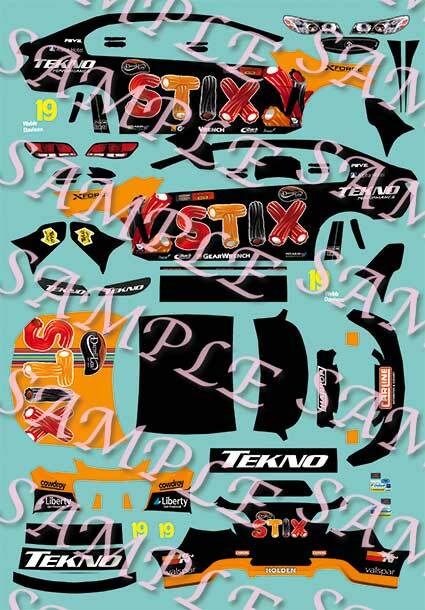 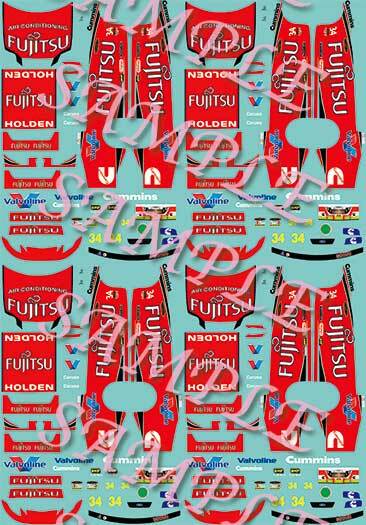 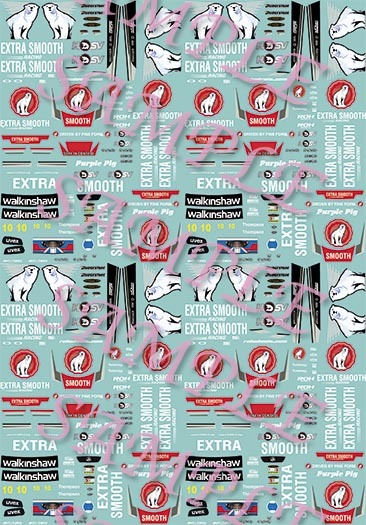 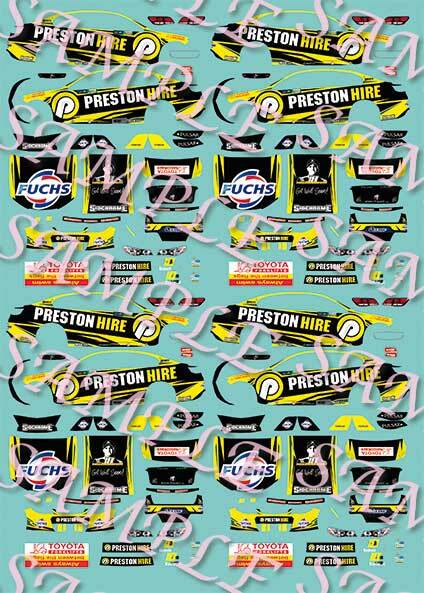 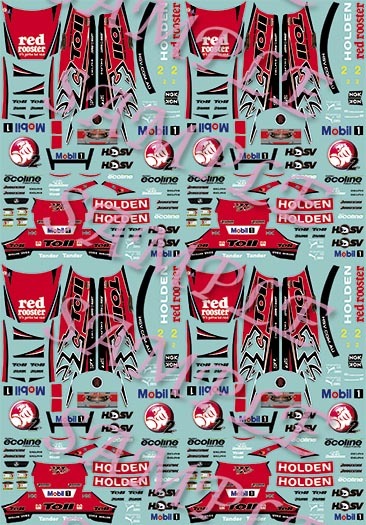 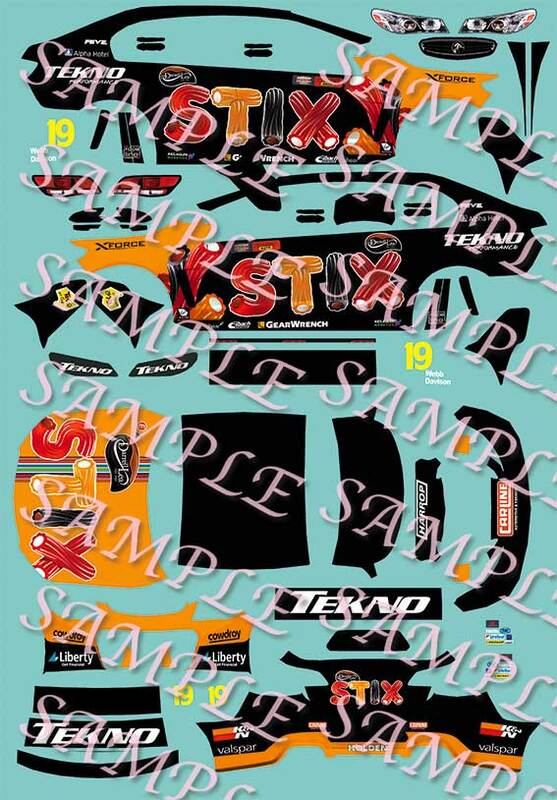 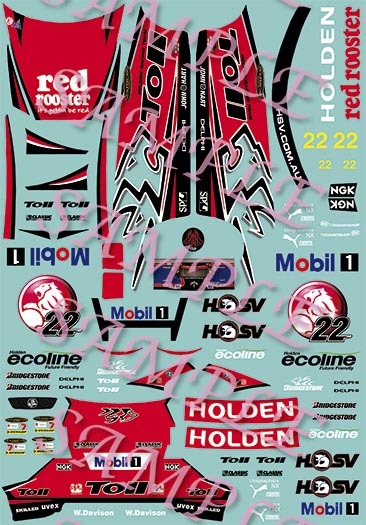 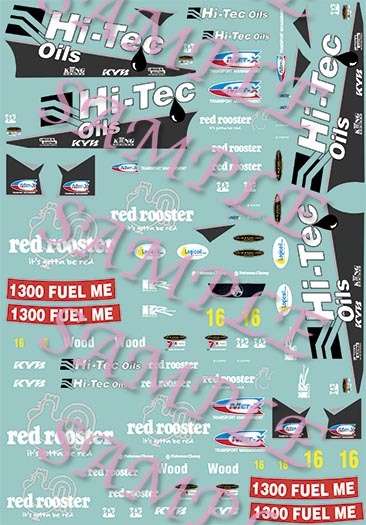 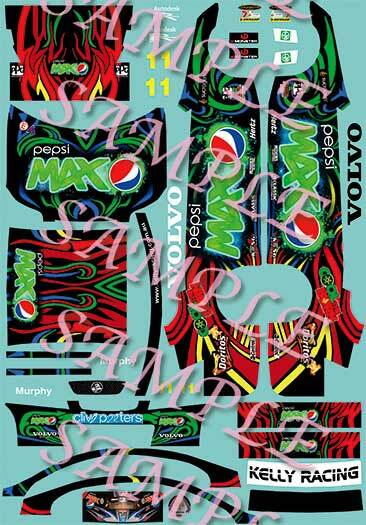 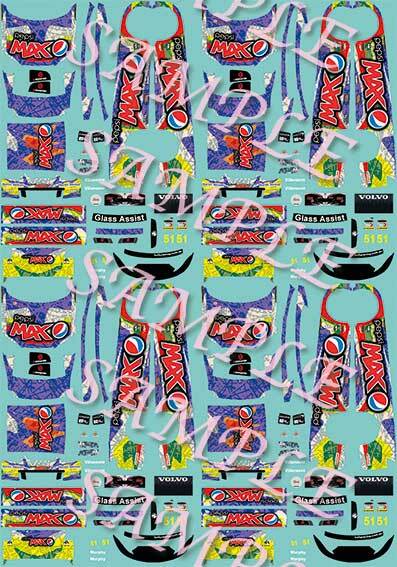 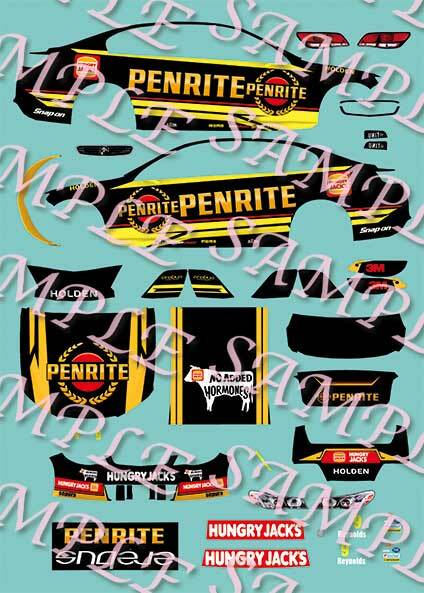 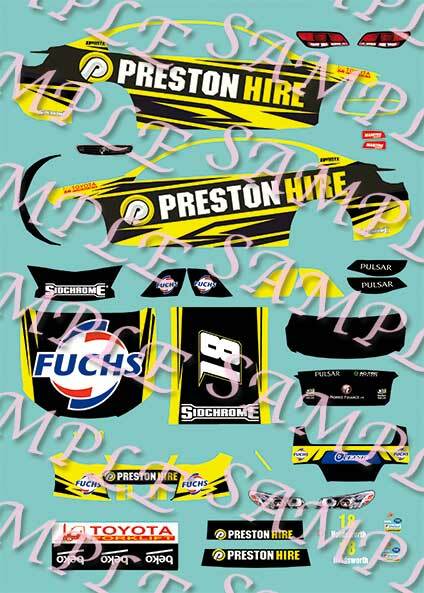 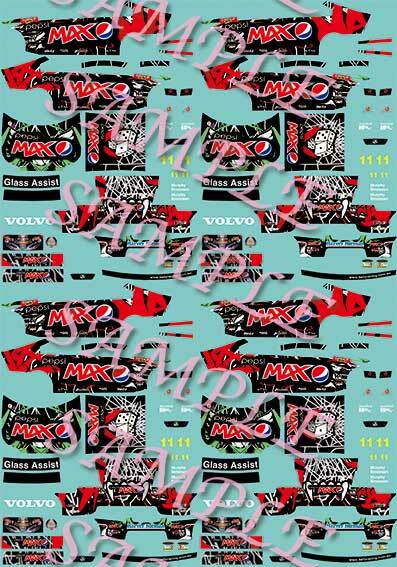 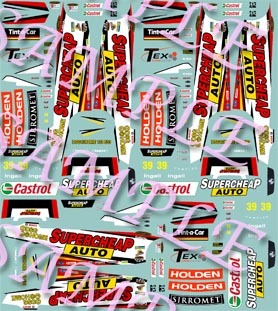 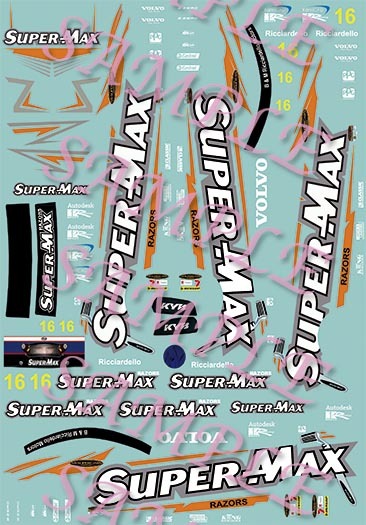 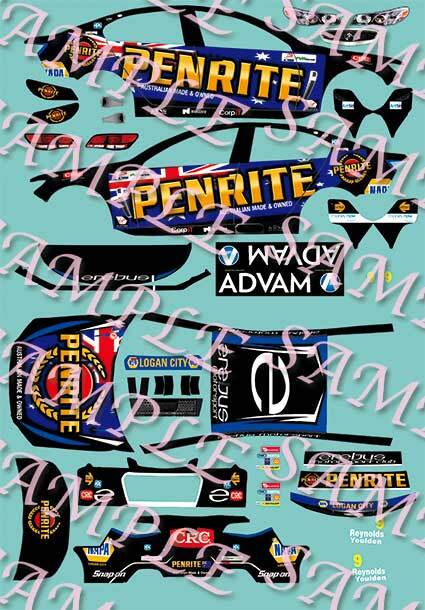 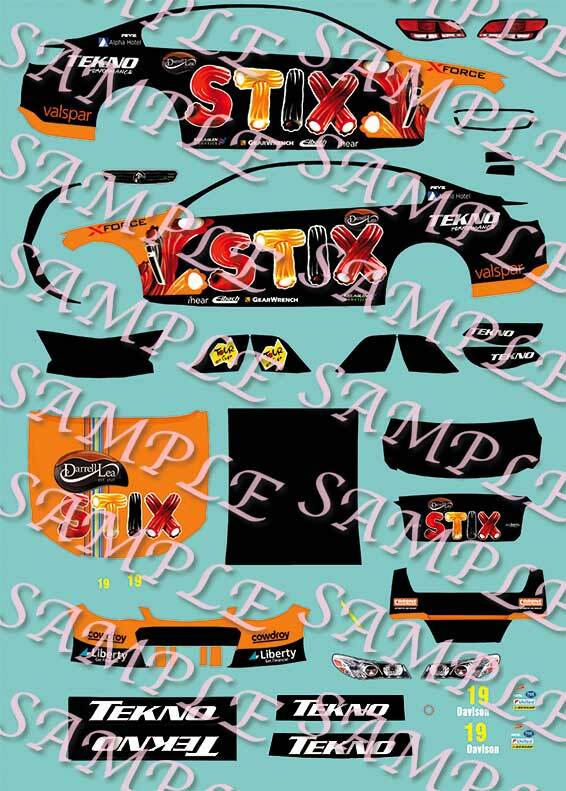 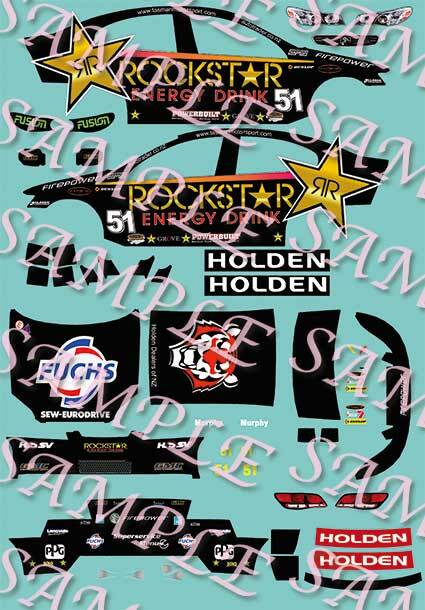 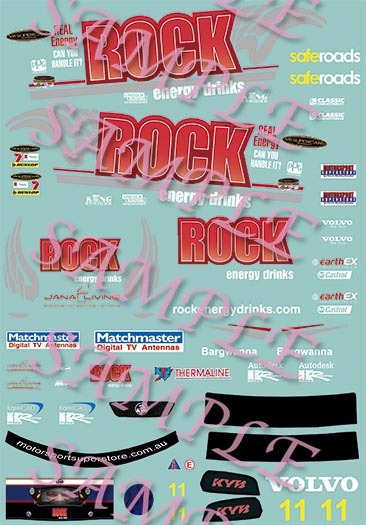 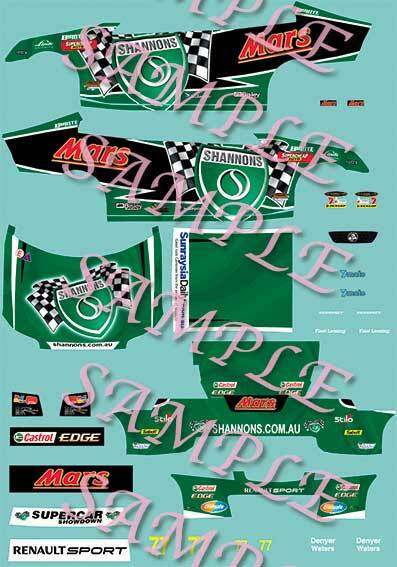 New, much improved Flexi Ink released!!! 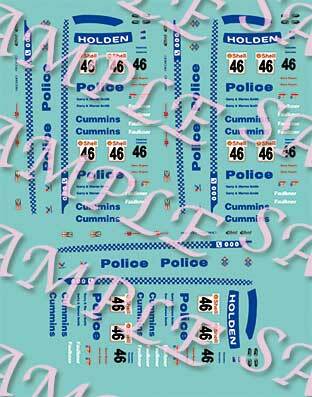 The Peel & Stick are also Silk Ink printed and are fine to be used as is. 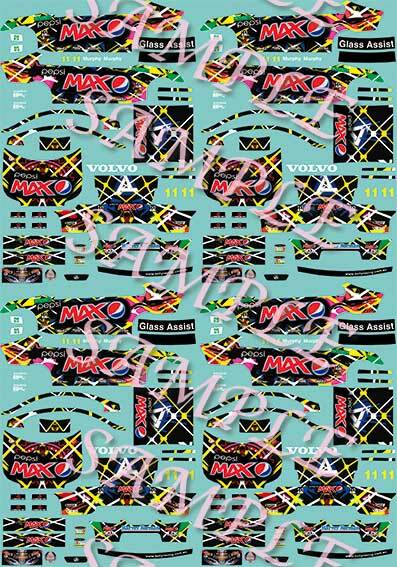 If you want a gloss finish on them, they can be sprayed with the same clear acrylic mentioned above but it is not necessary. 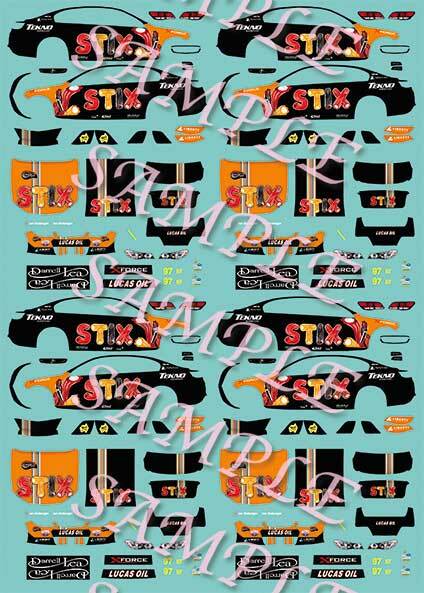 Try the Peel & Stick. 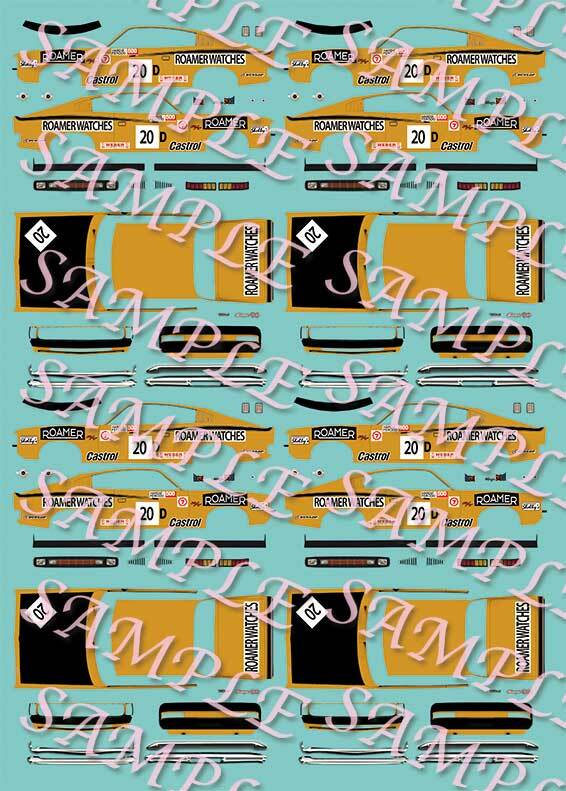 These are a lot better than previously available. 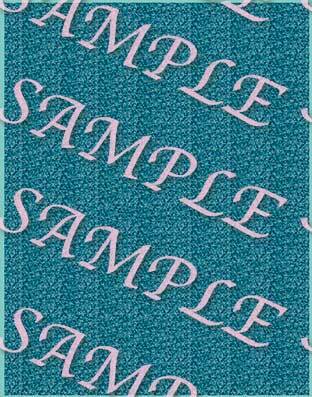 They are thin and easily applied and disappear on the surface. 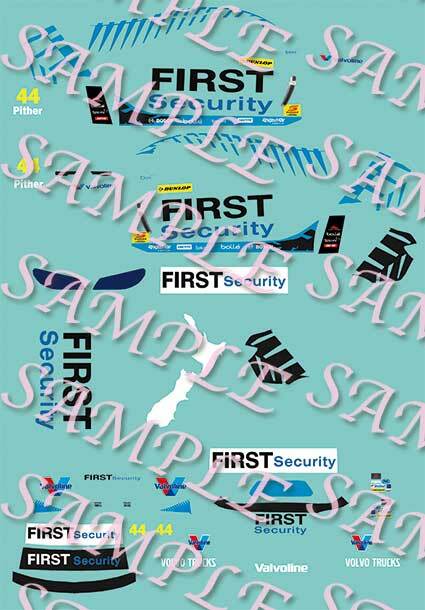 Many people are changing to these from waterslide. 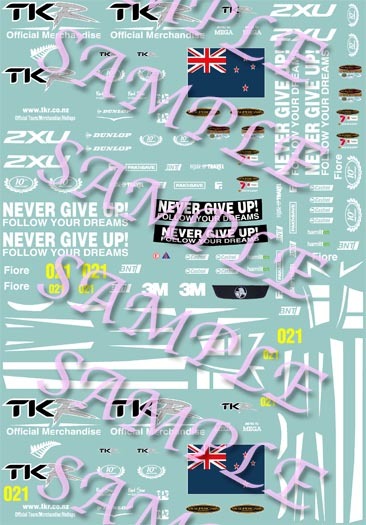 Why dont you try and see? 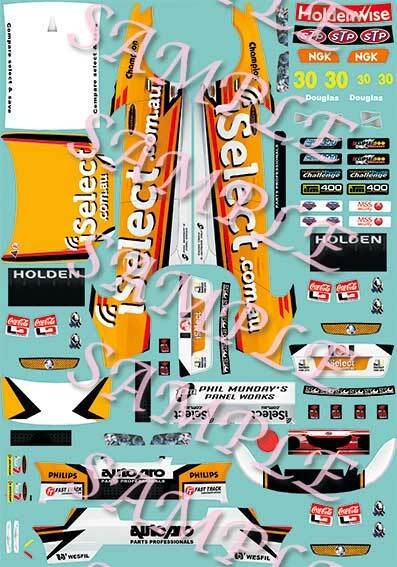 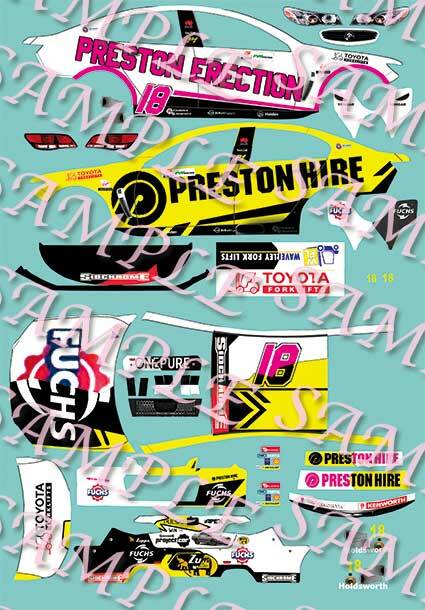 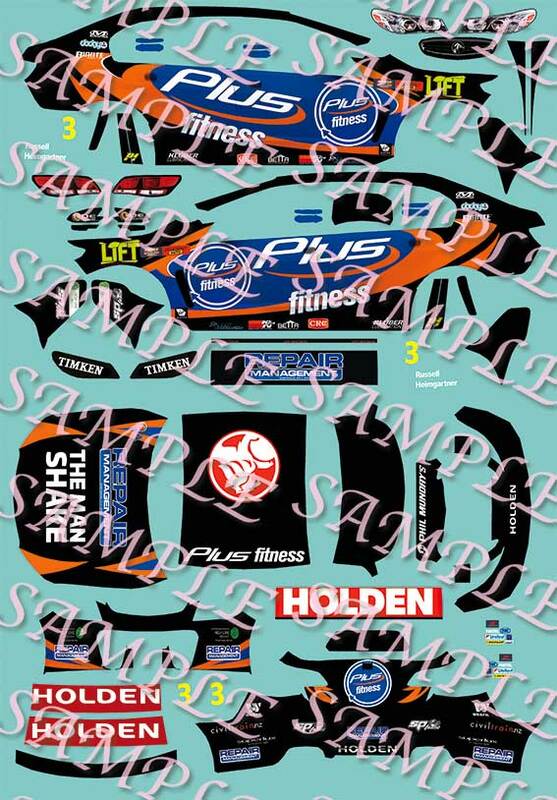 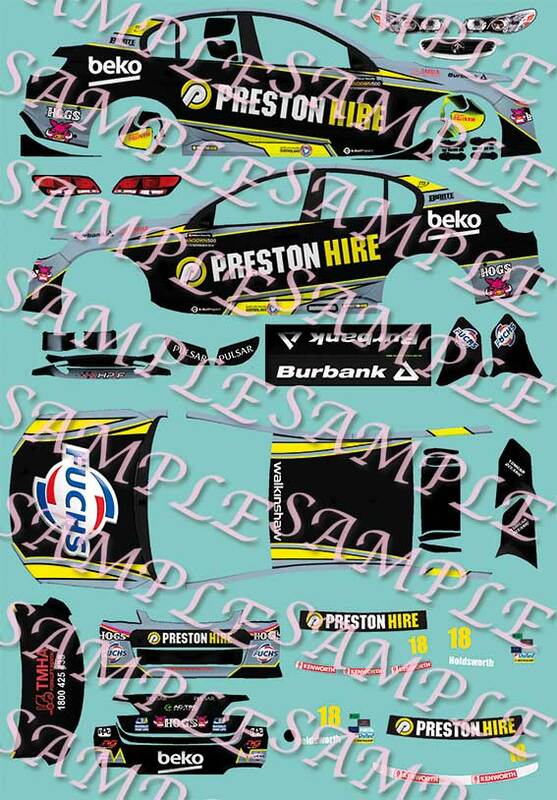 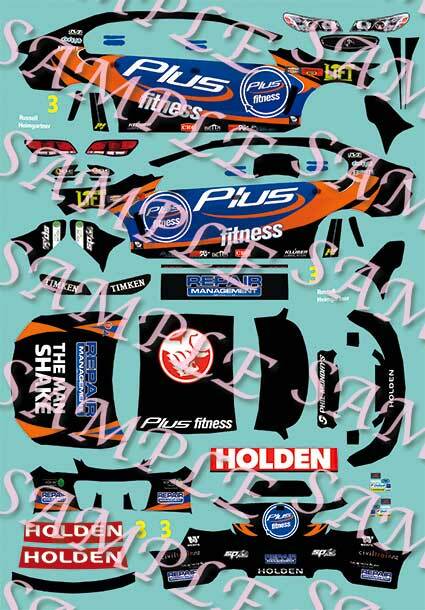 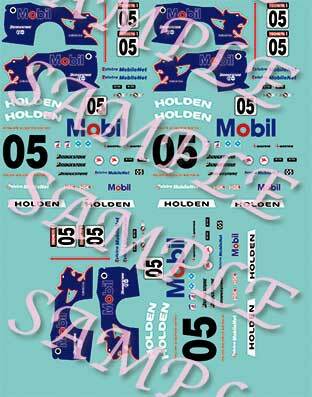 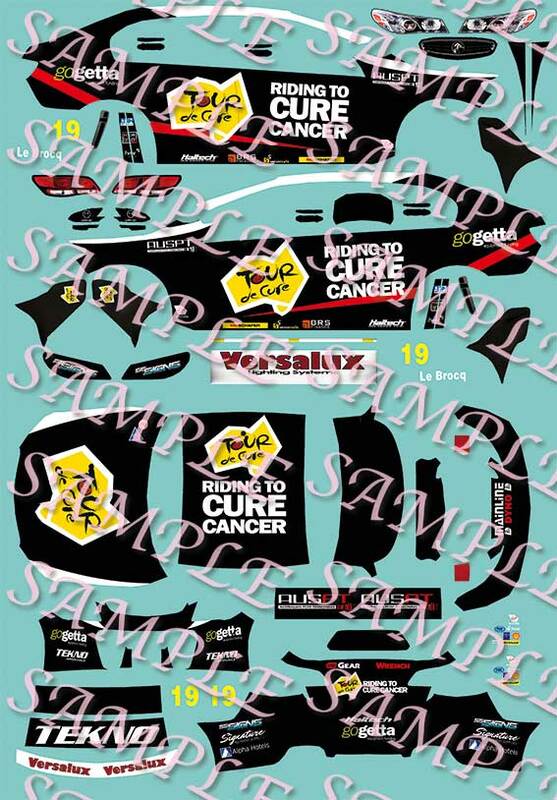 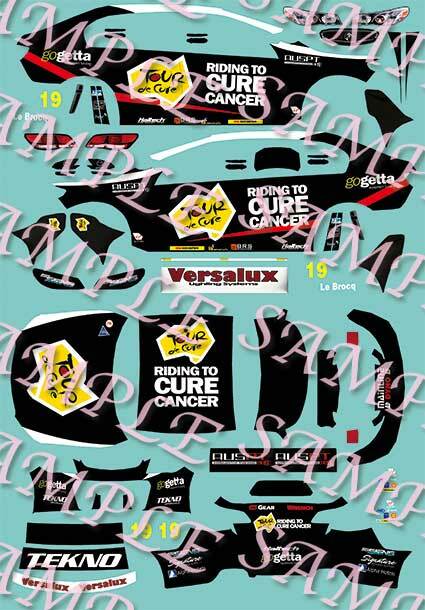 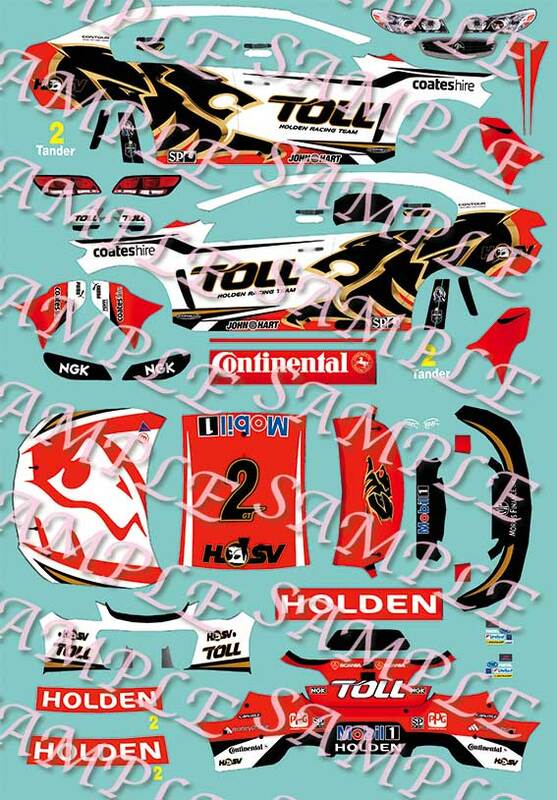 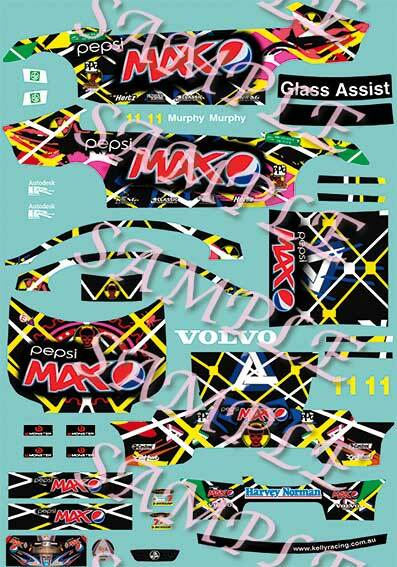 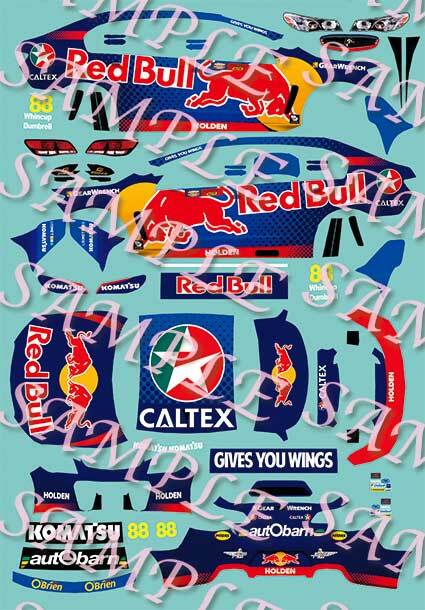 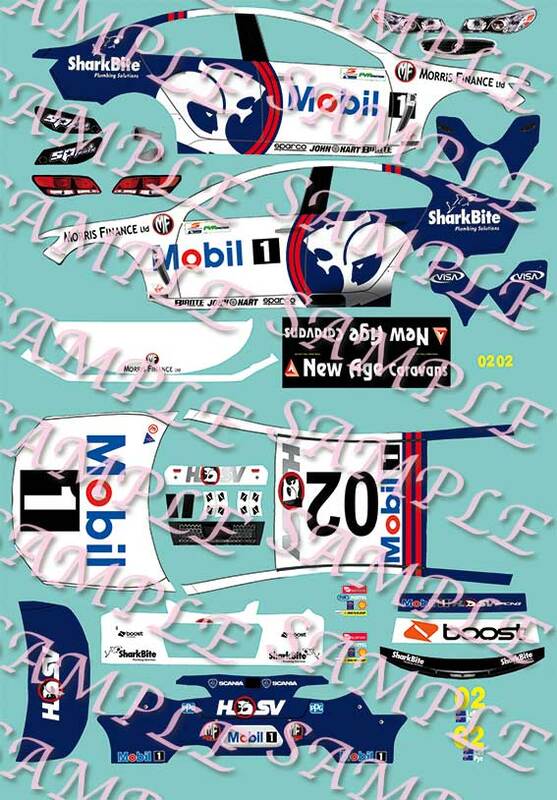 Peel & Stick Instructions: Cut close to the decal, peel off the backing and push it down on the model. 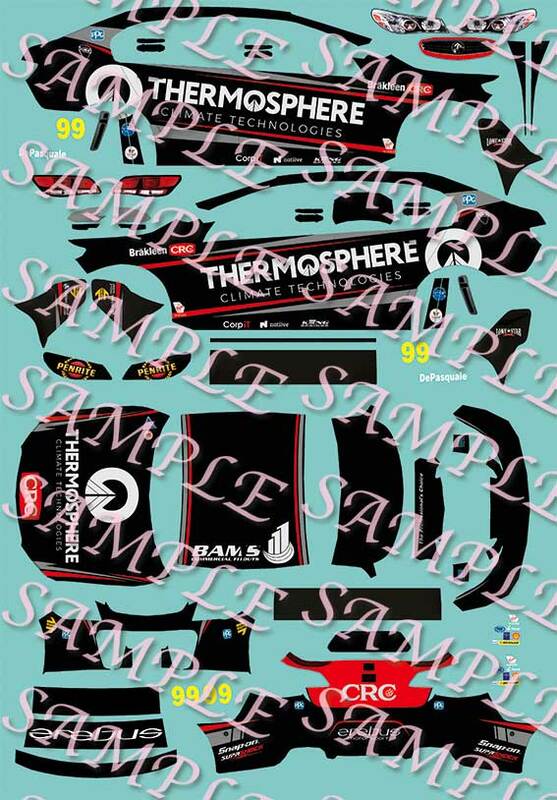 Work from one end and push the air out. 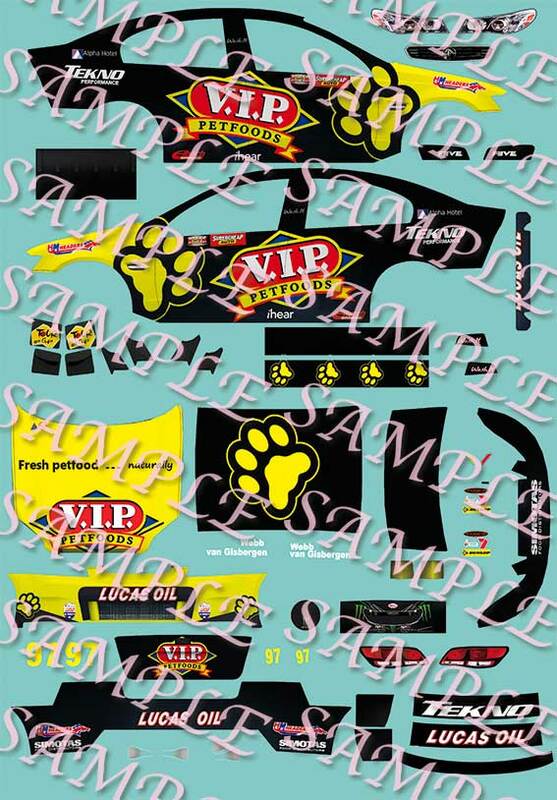 If you get a bubble in it prick it with a pin and push the air out. 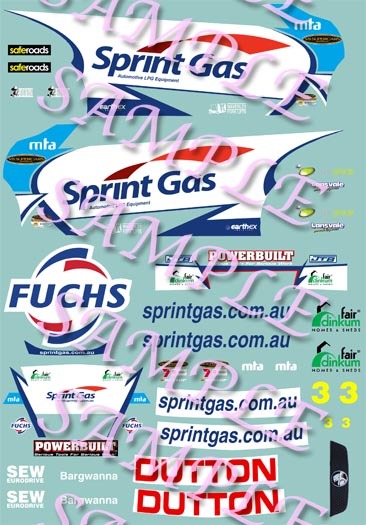 To move a Peel & Stick decal around to get it into place, wet the surface where it is to go with water with a few drops of dishwashing liquid in it. 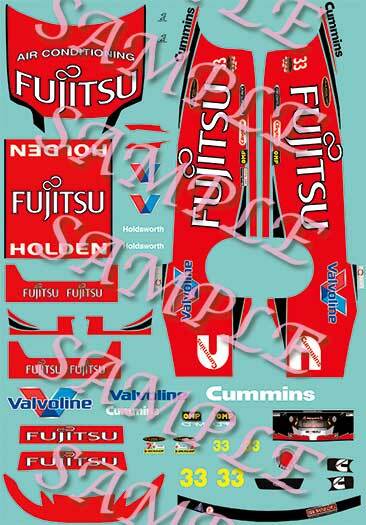 When you have it in position, squeegee out the water and air, working from the centre out. 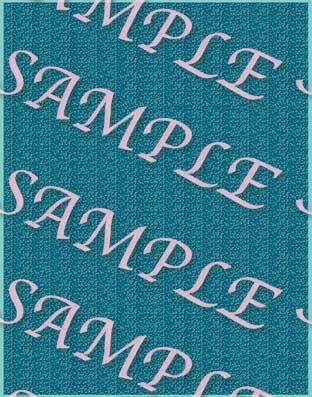 A cotton glove on one hand helps a lot with this action. 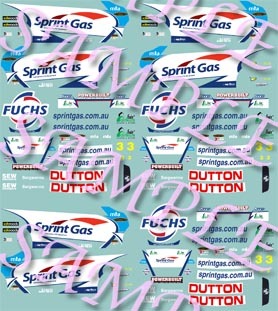 If you get a bubble in it, just prick it with a pin and push out the air. 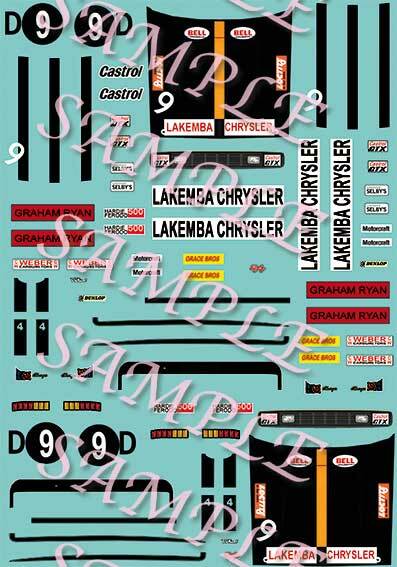 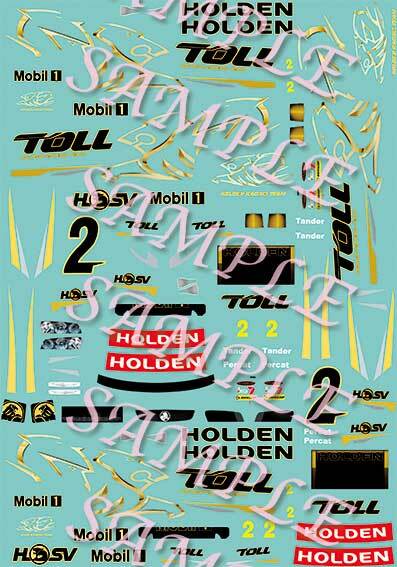 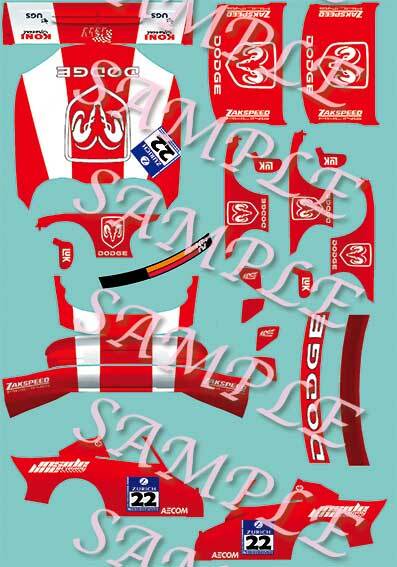 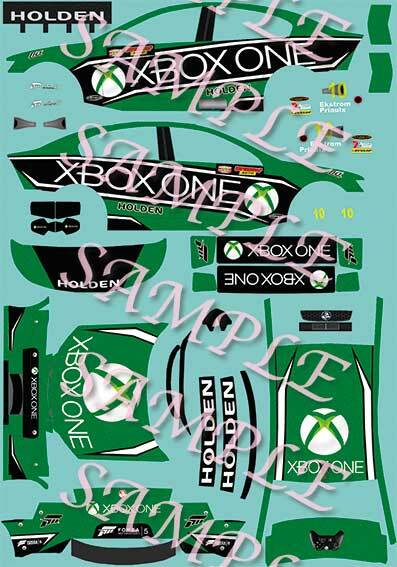 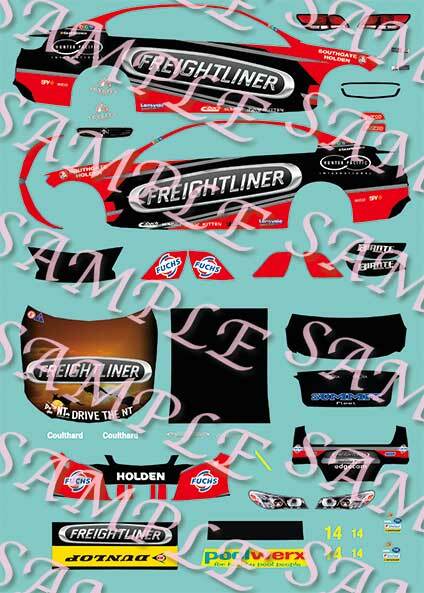 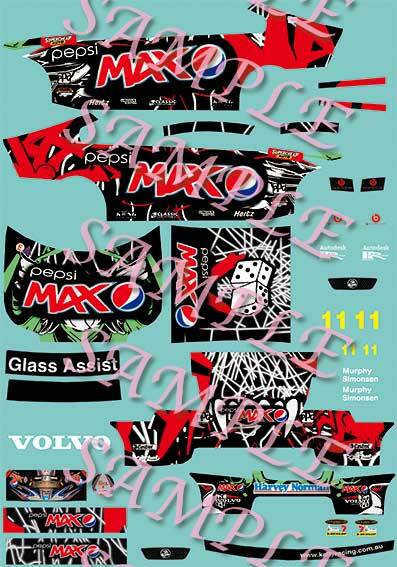 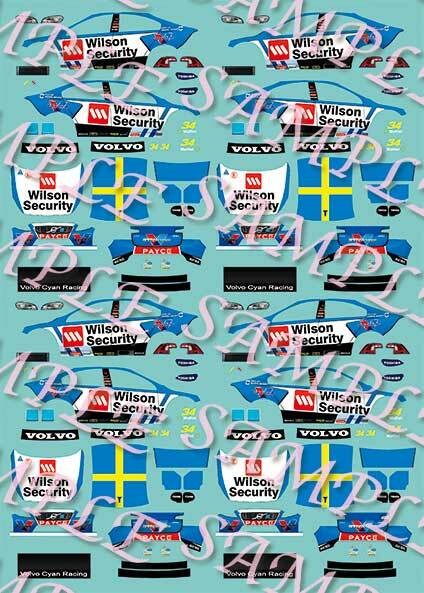 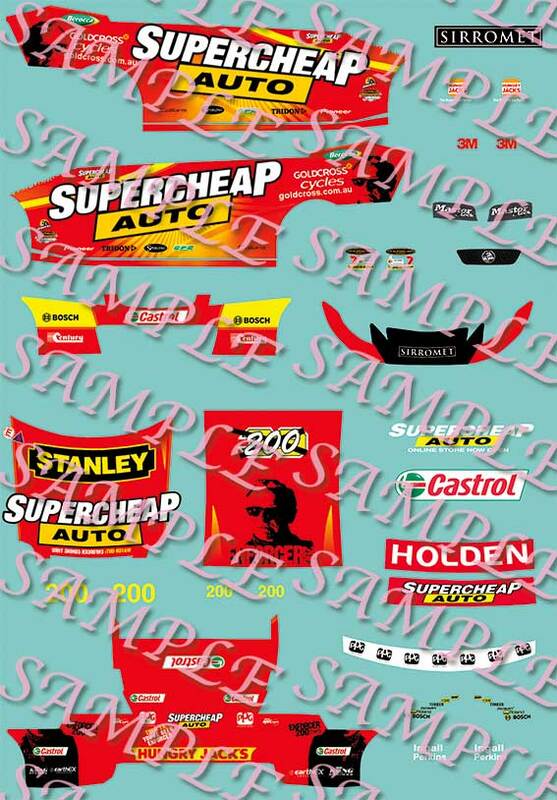 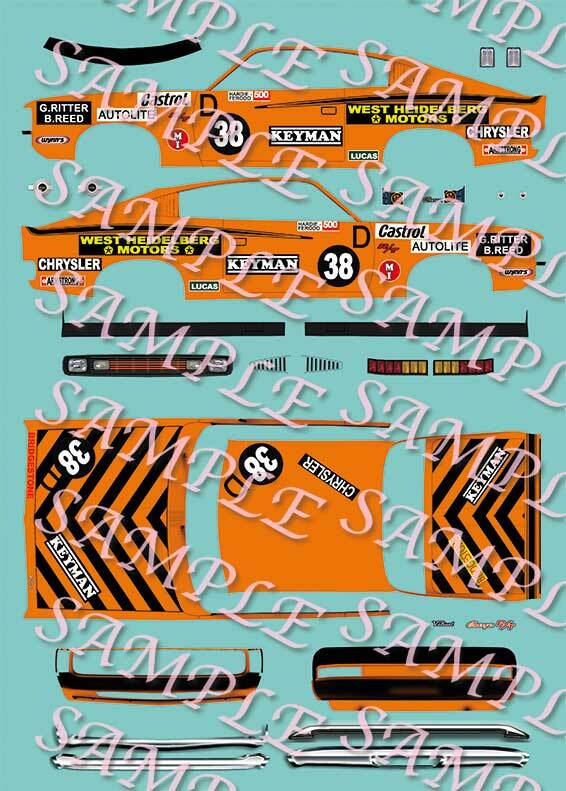 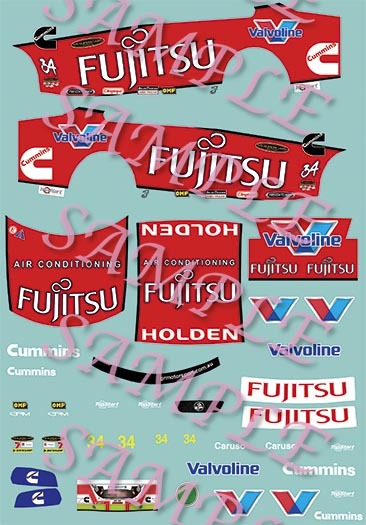 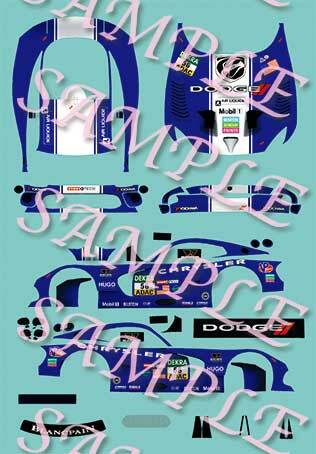 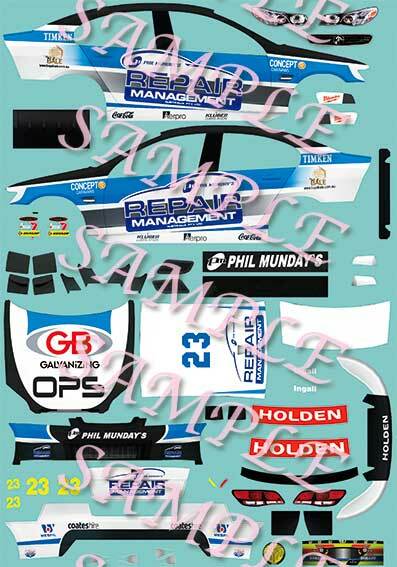 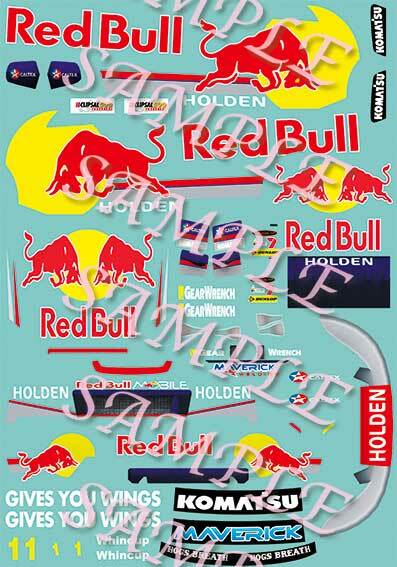 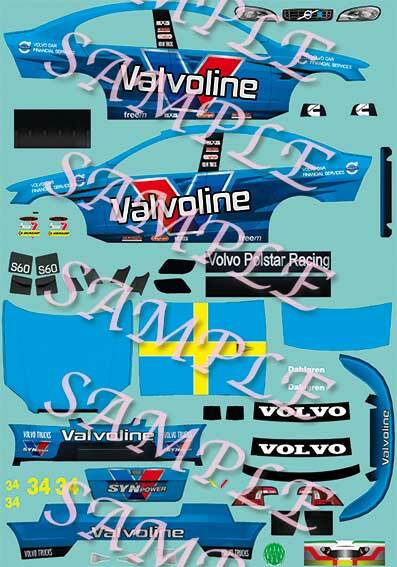 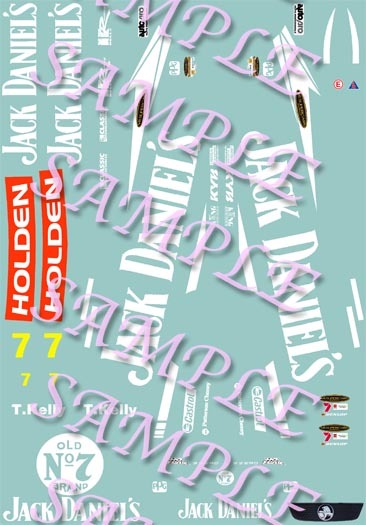 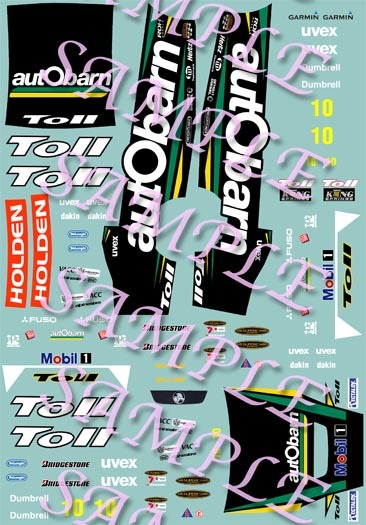 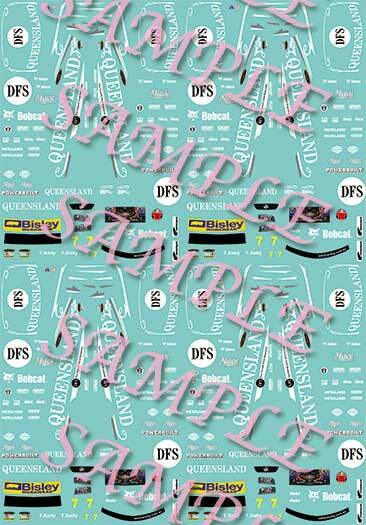 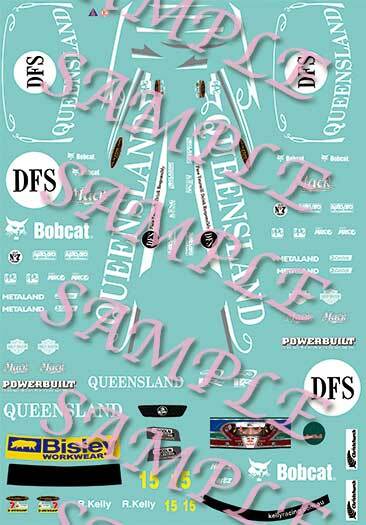 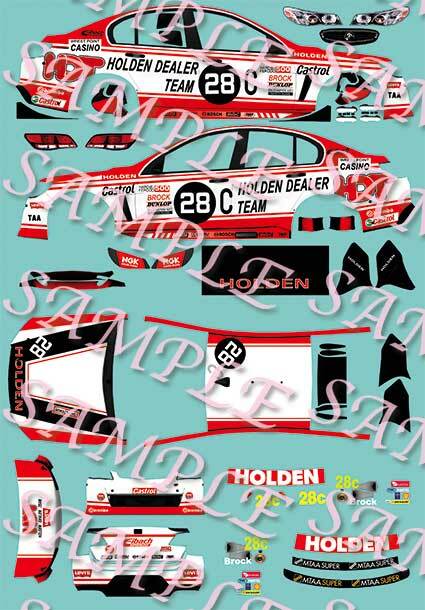 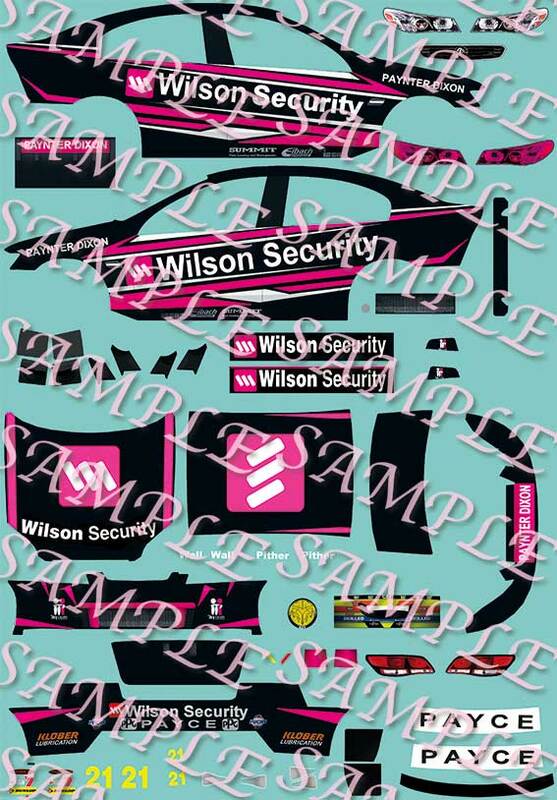 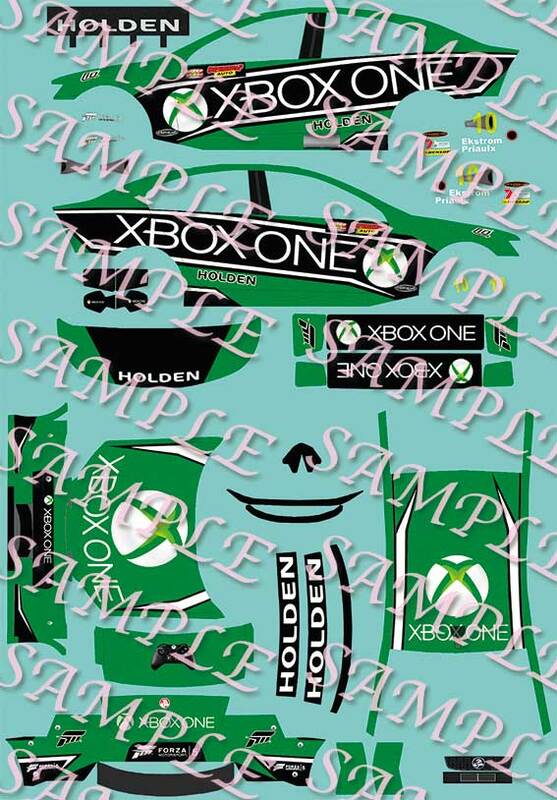 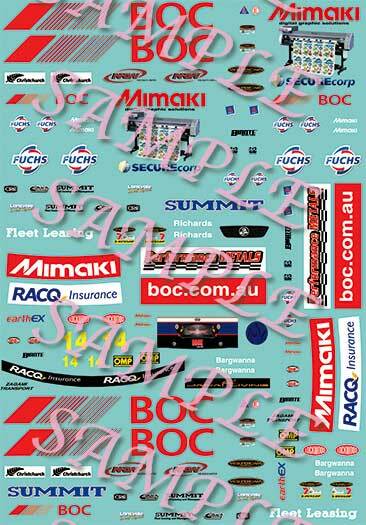 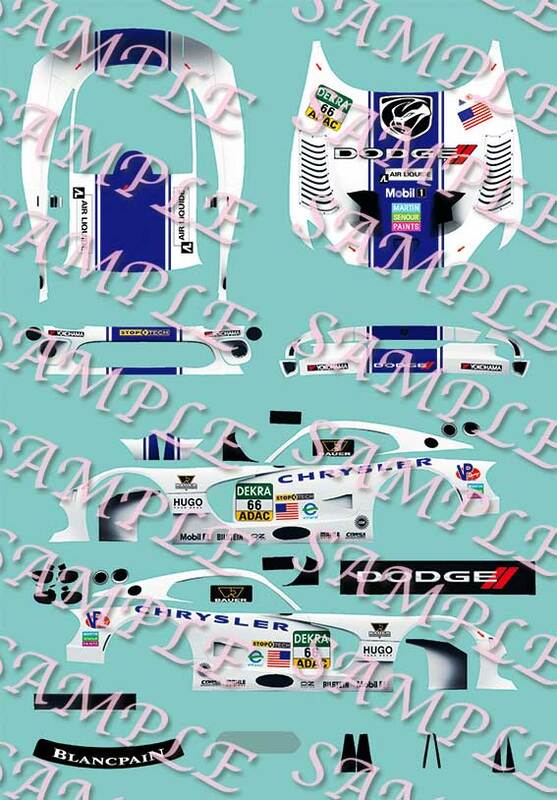 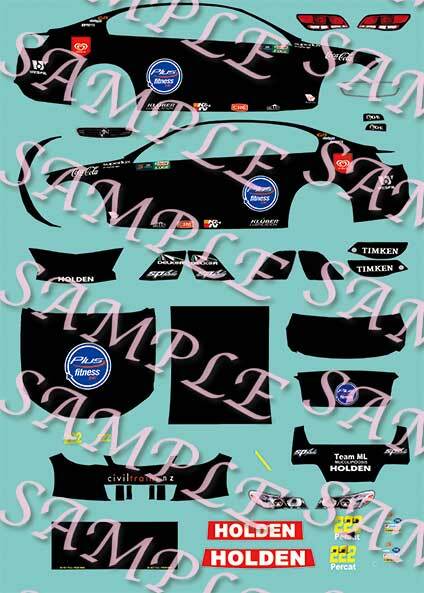 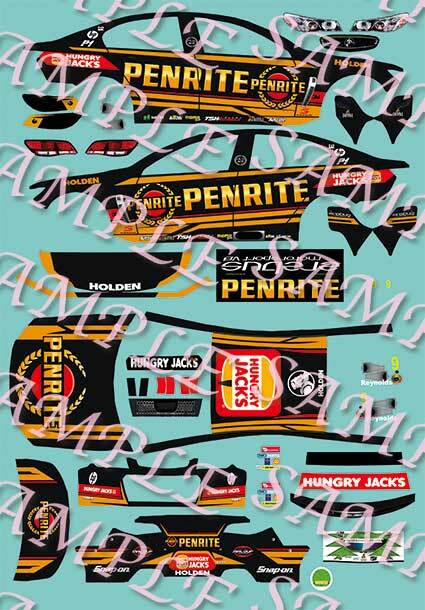 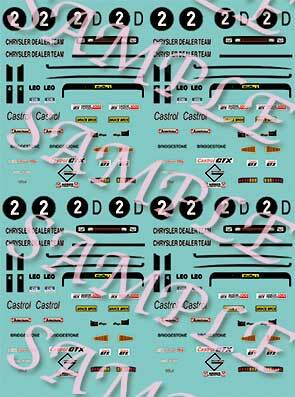 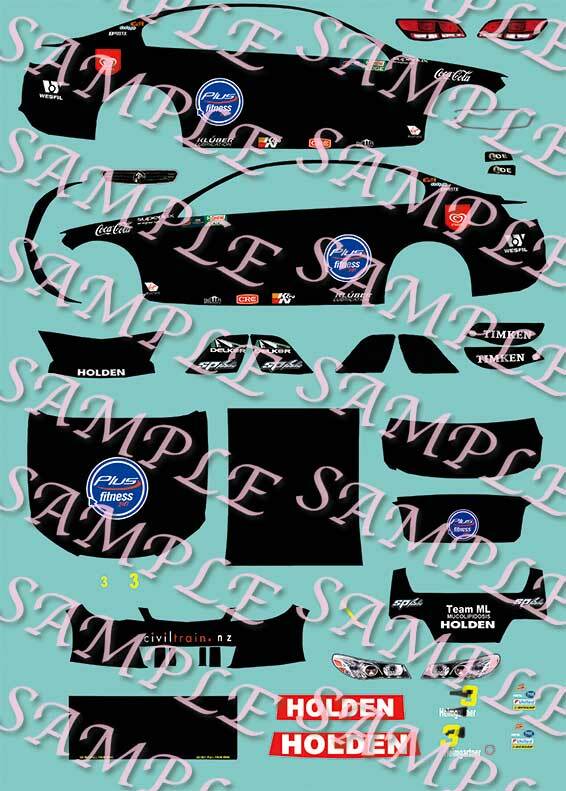 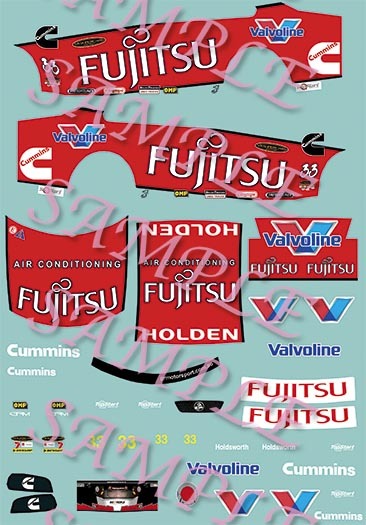 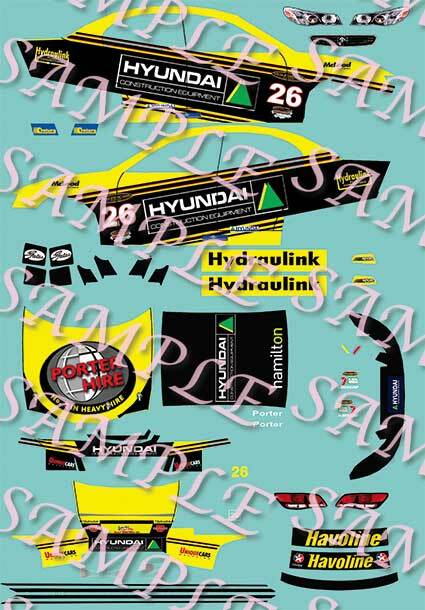 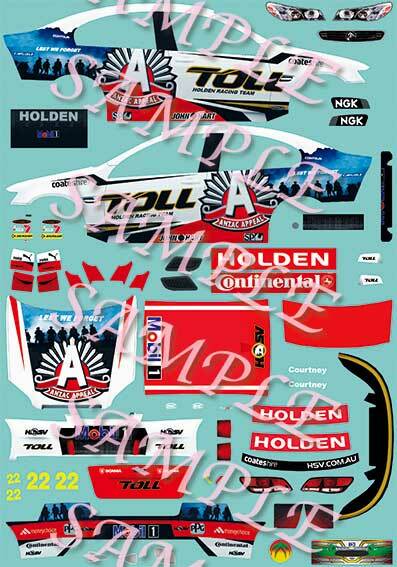 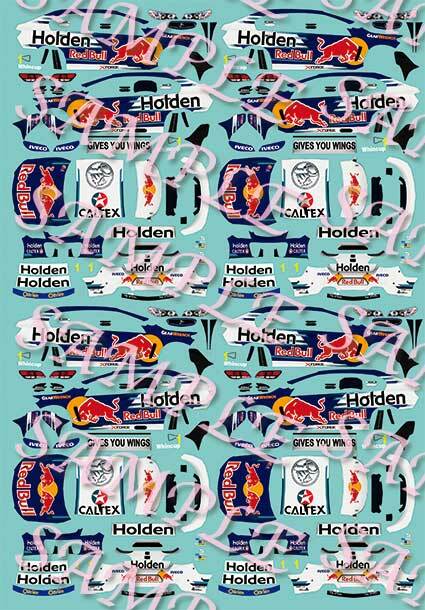 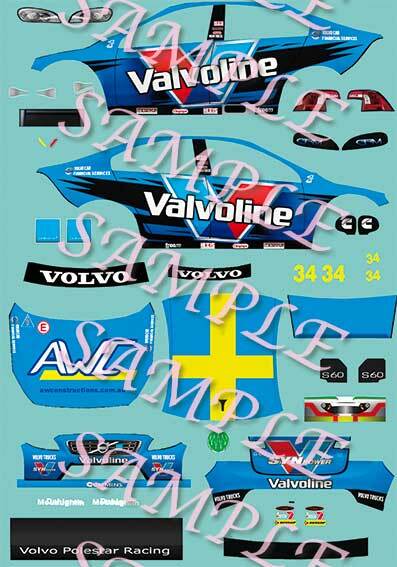 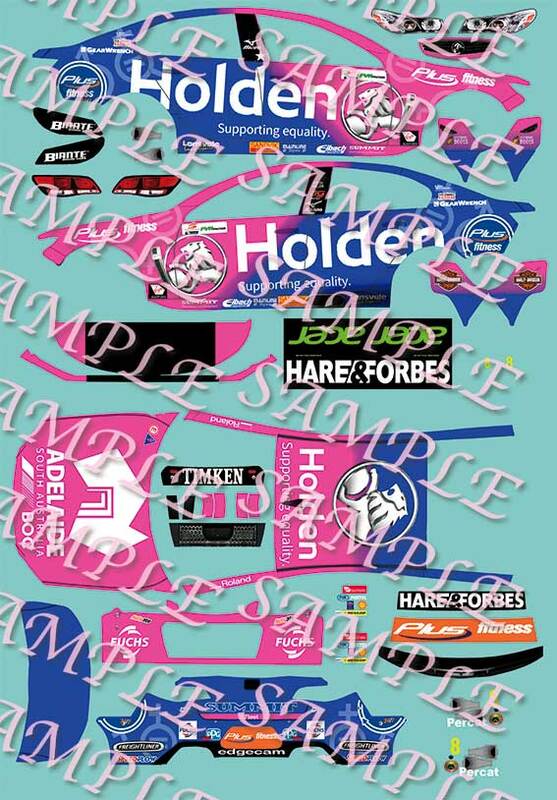 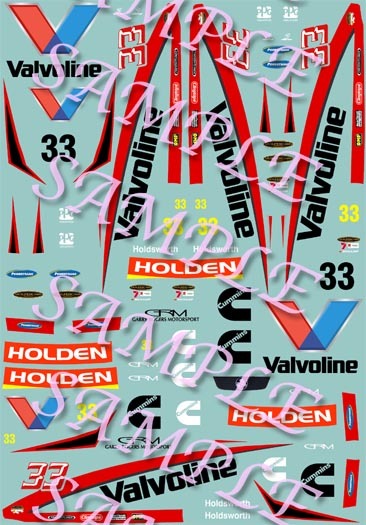 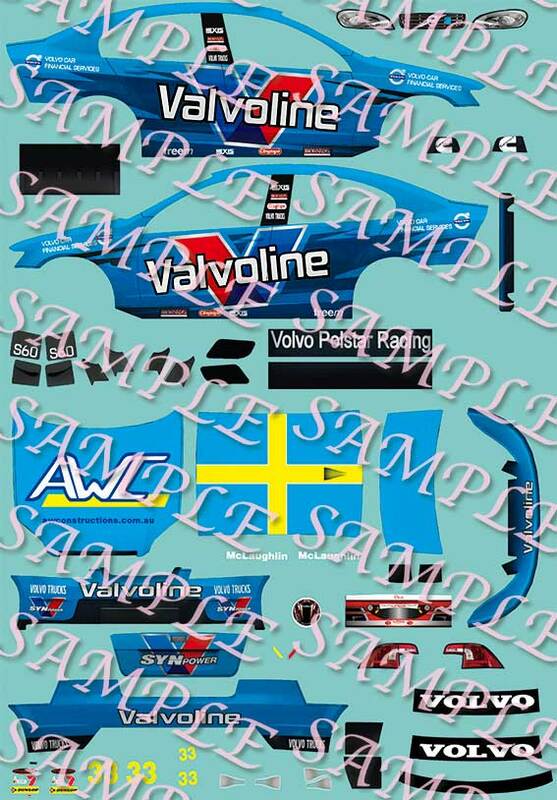 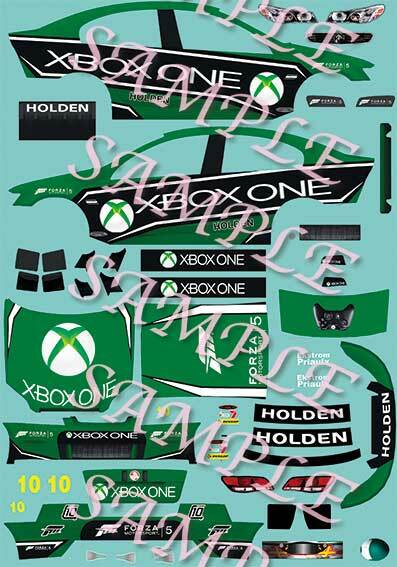 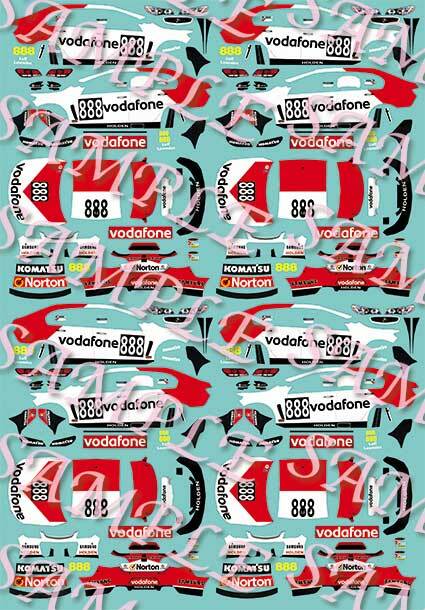 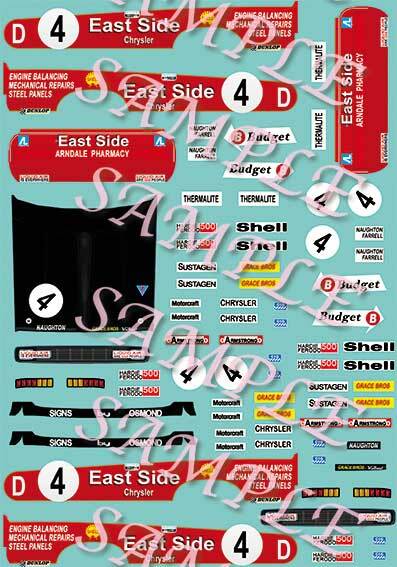 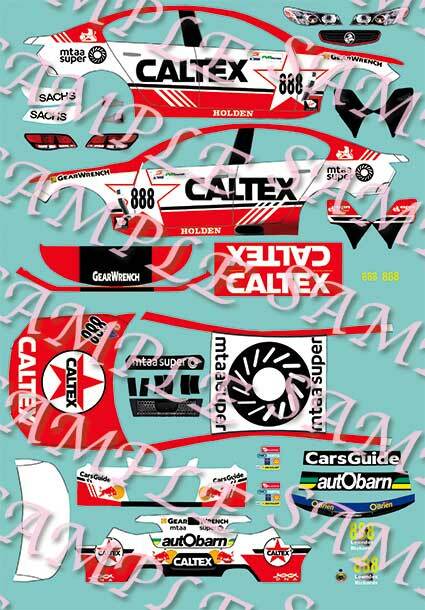 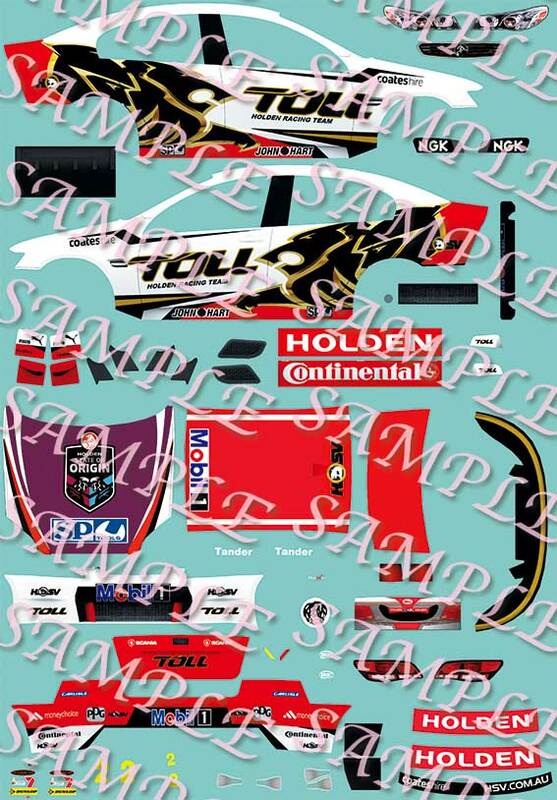 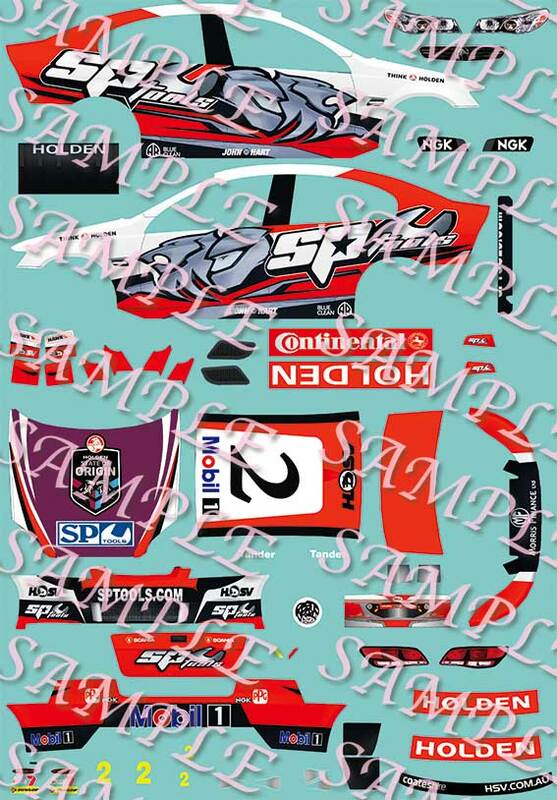 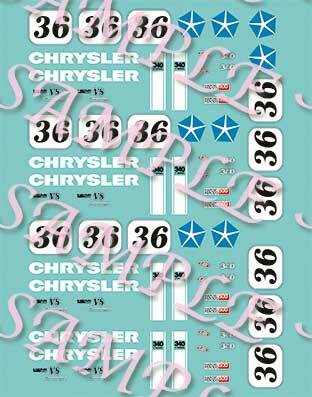 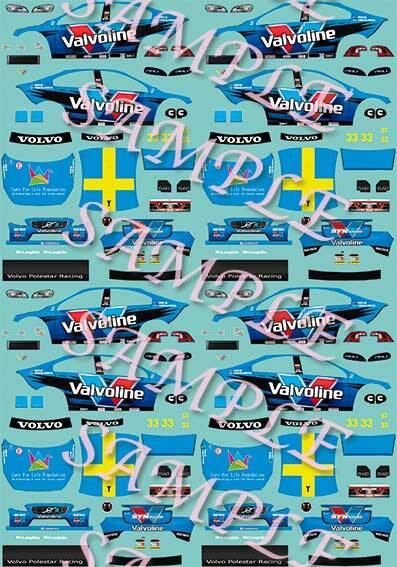 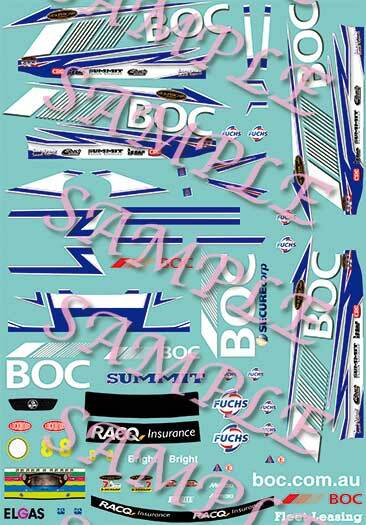 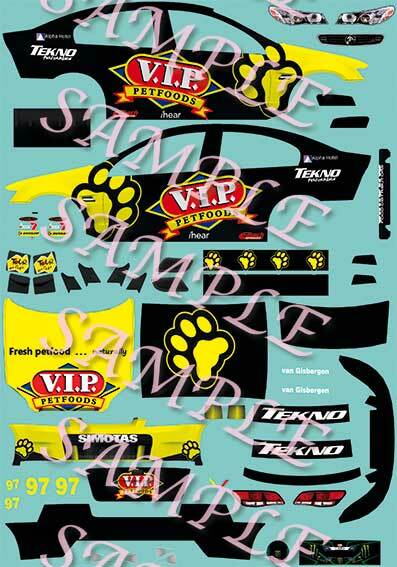 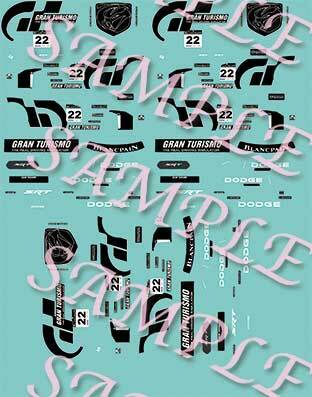 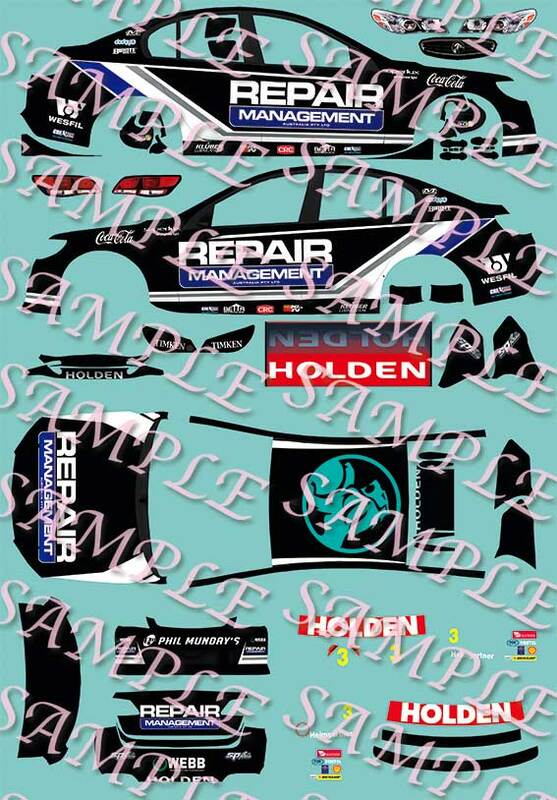 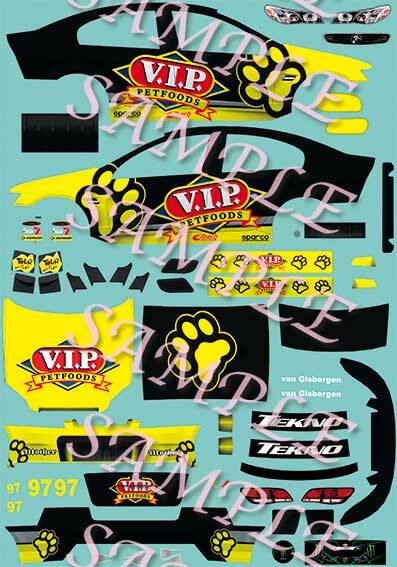 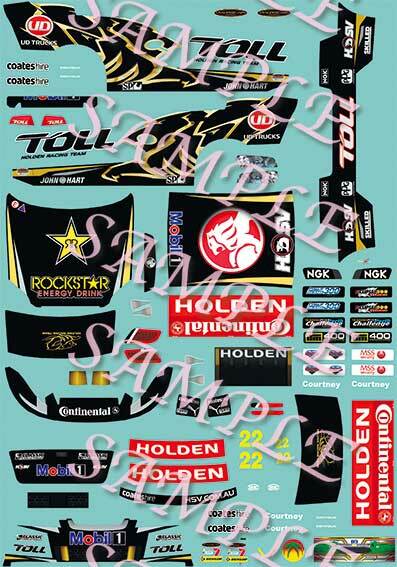 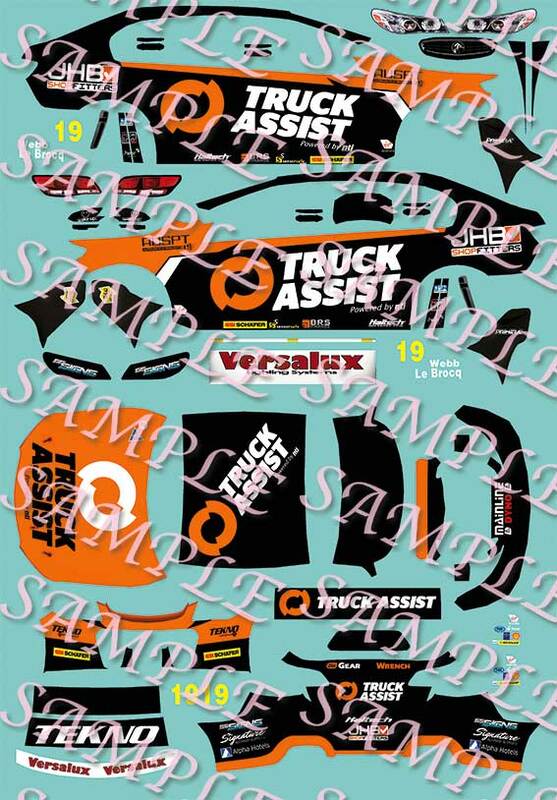 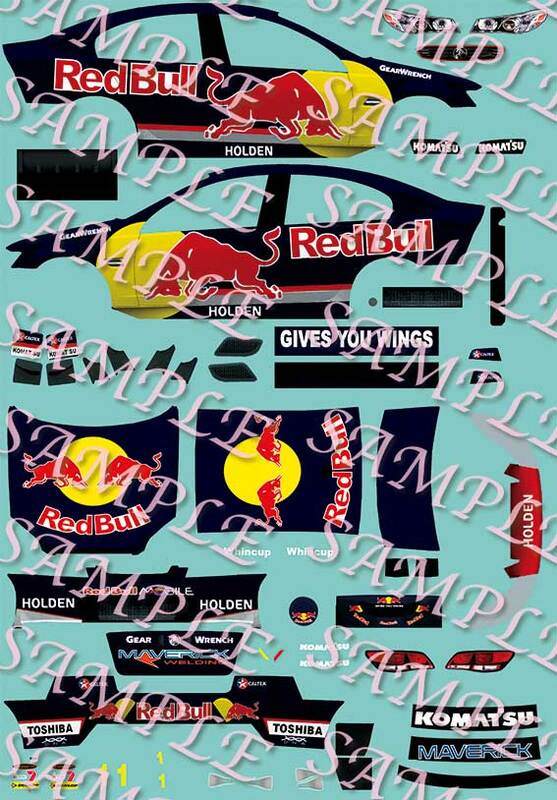 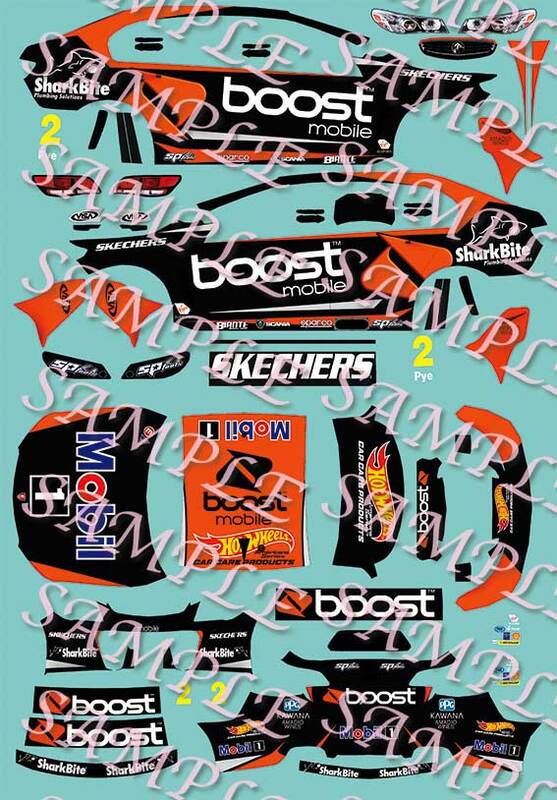 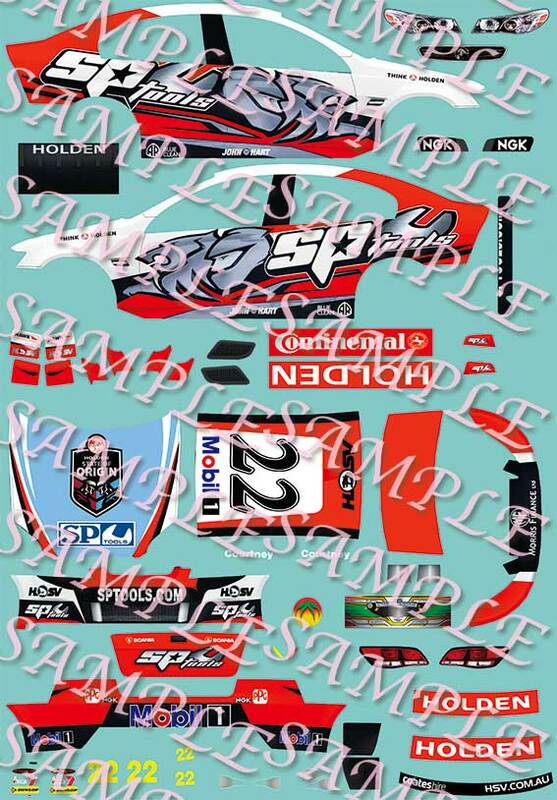 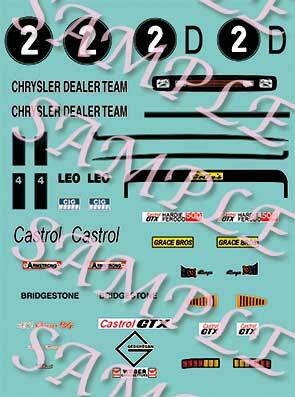 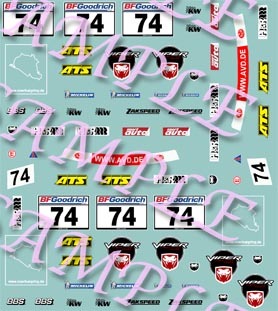 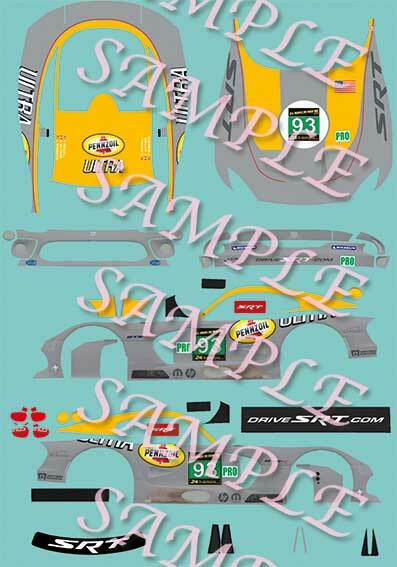 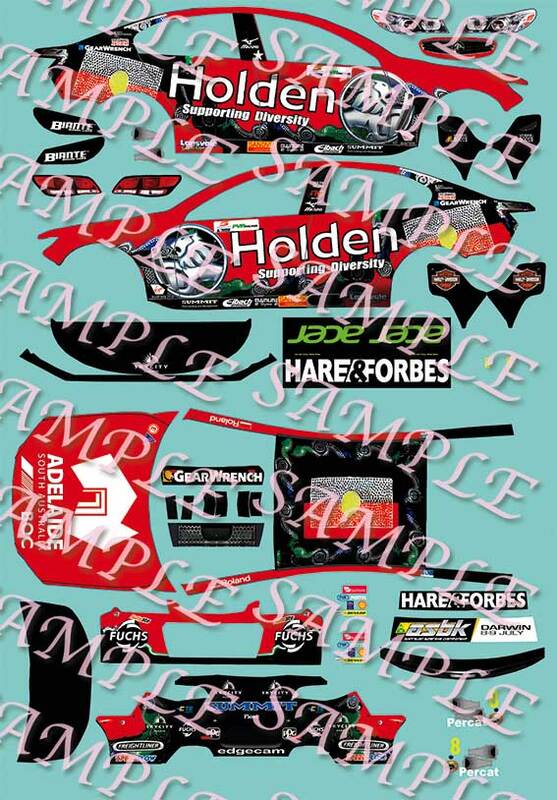 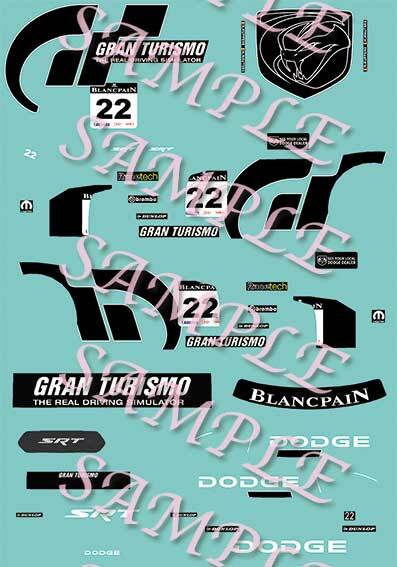 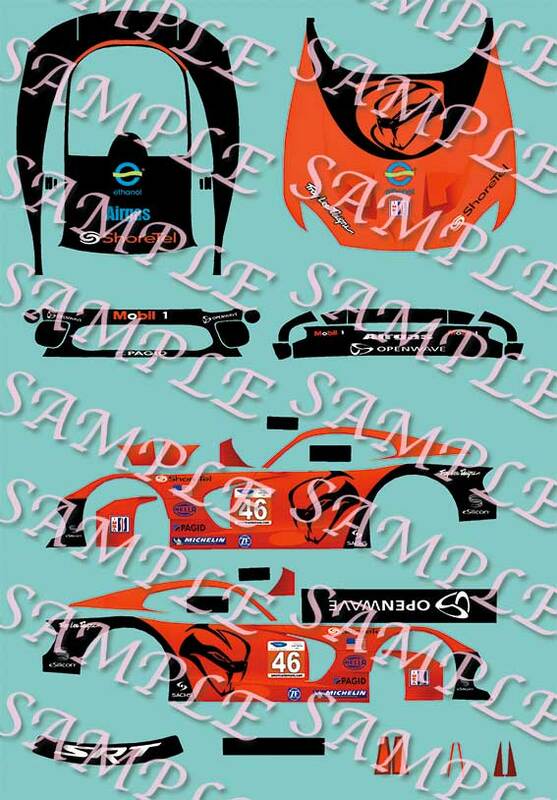 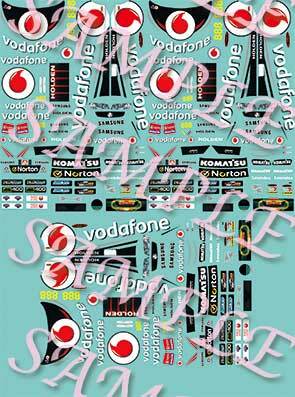 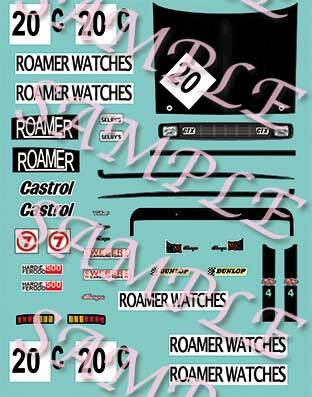 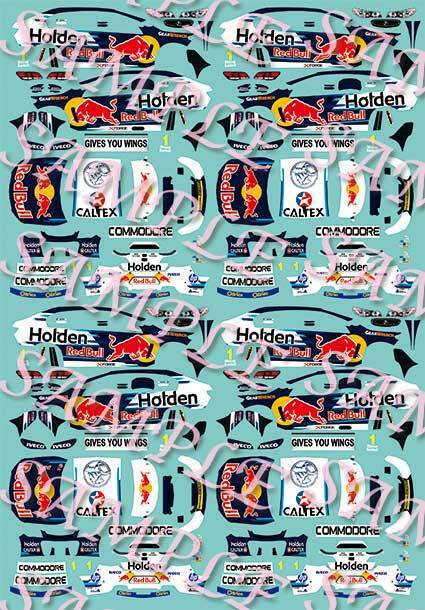 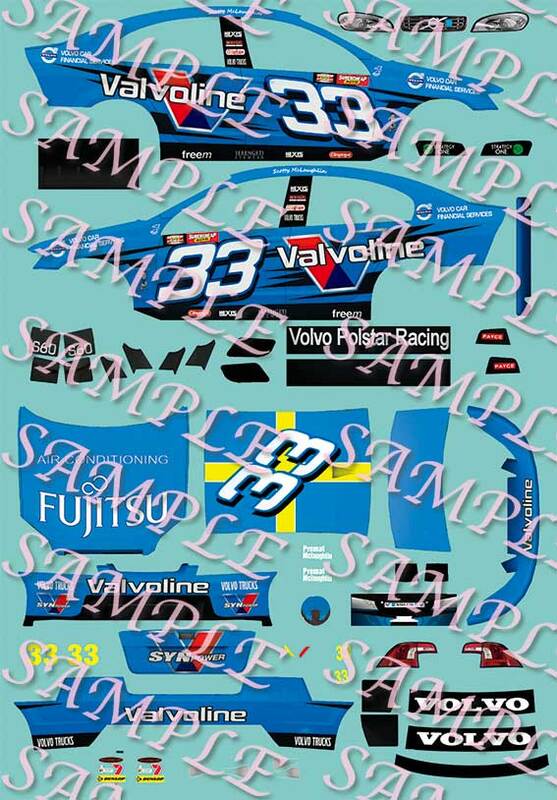 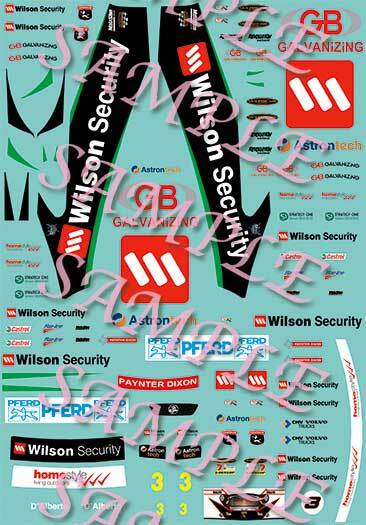 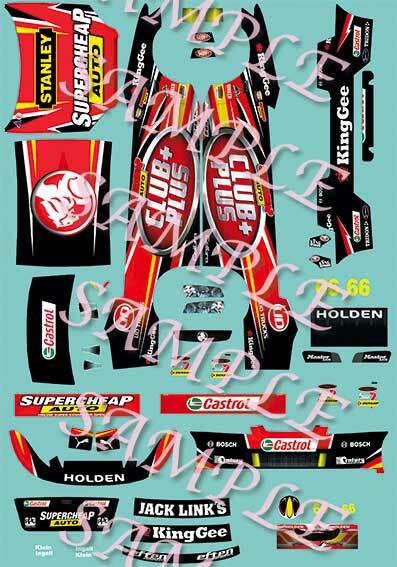 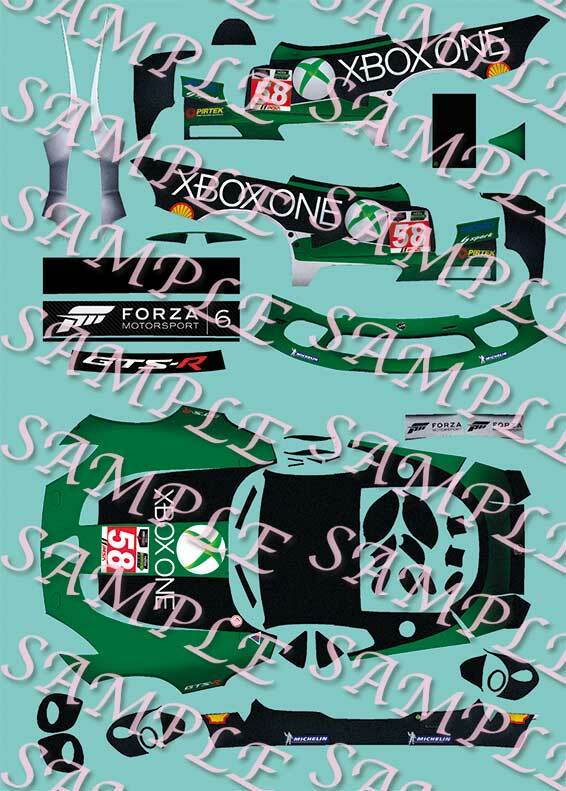 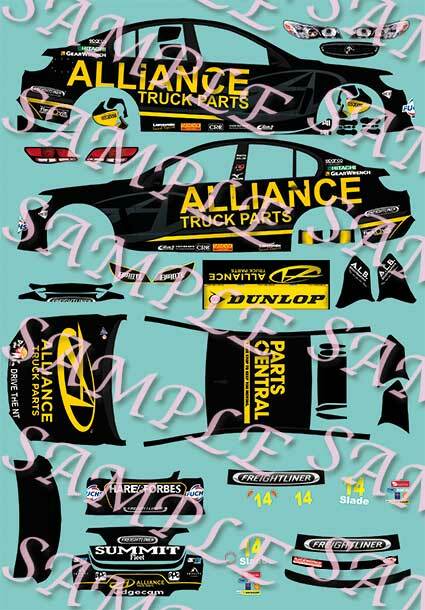 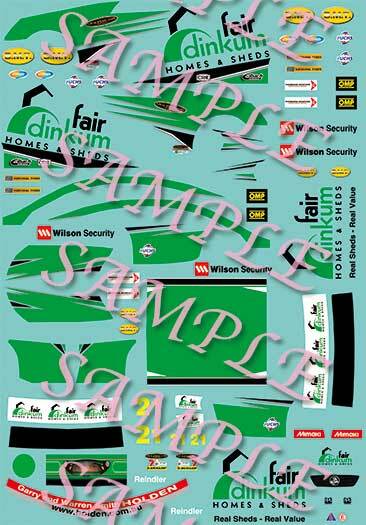 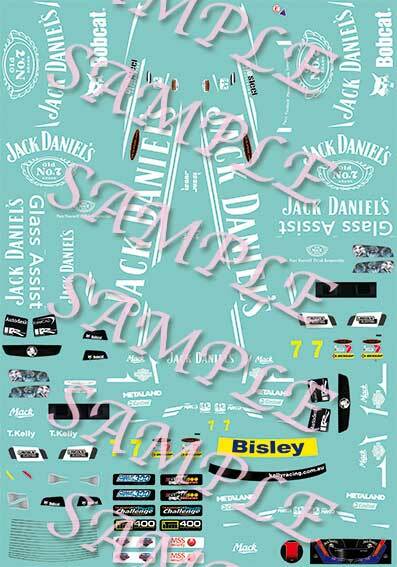 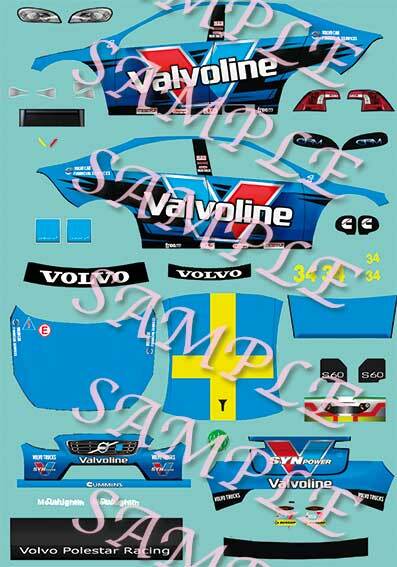 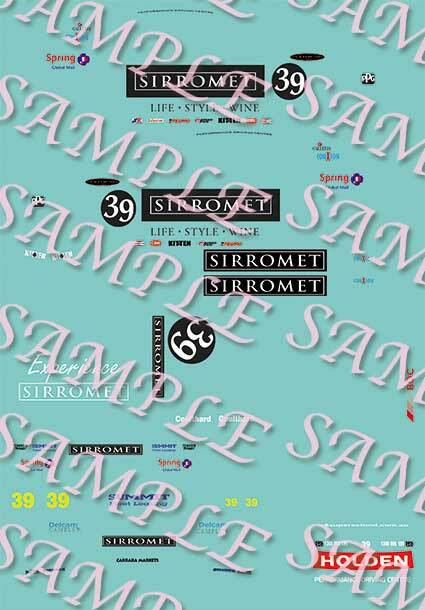 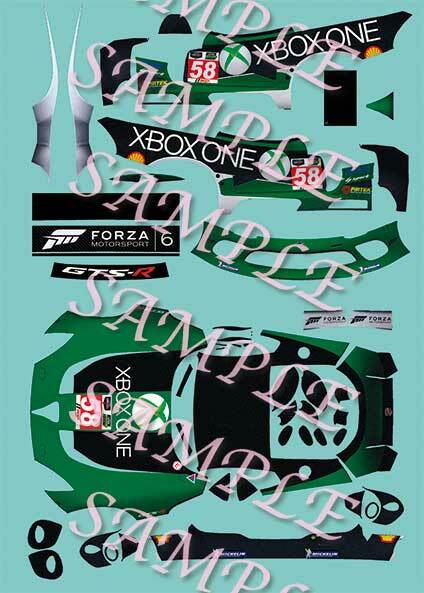 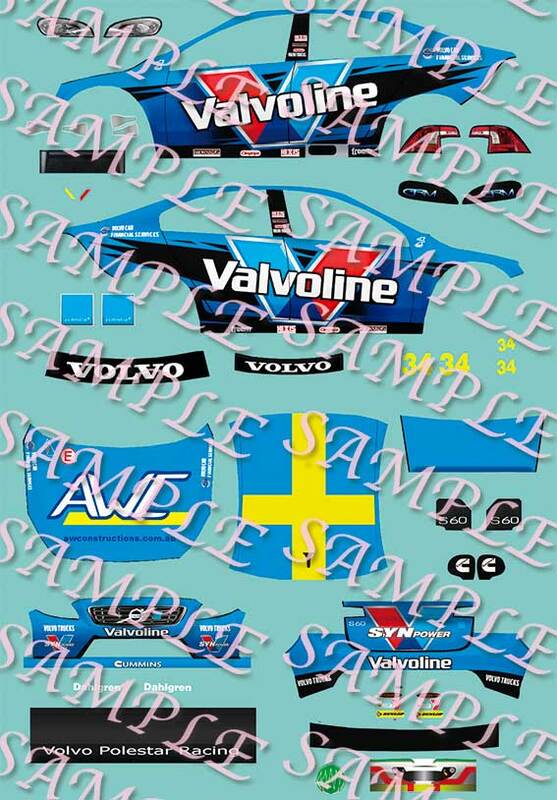 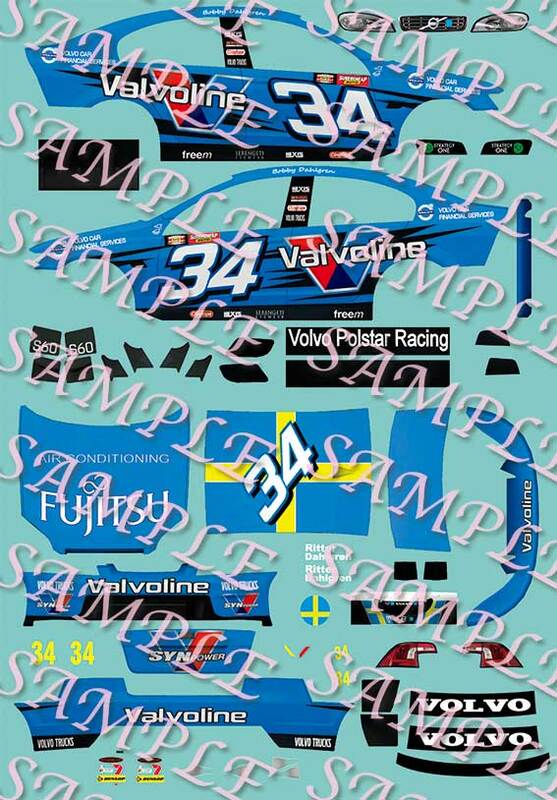 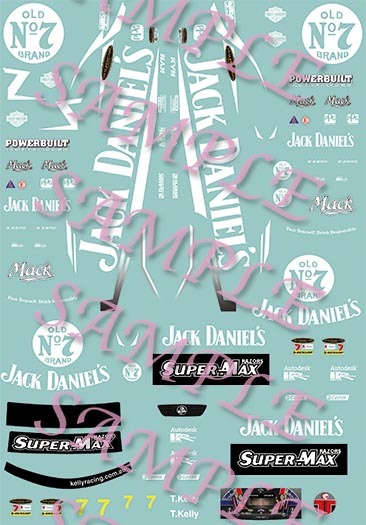 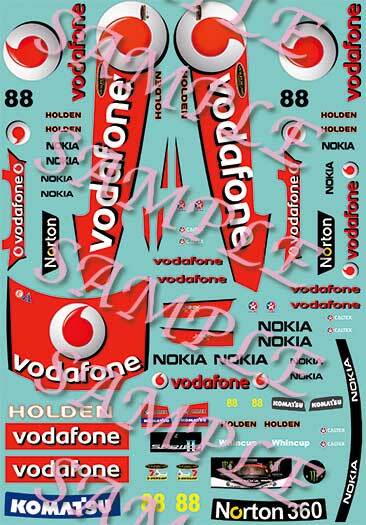 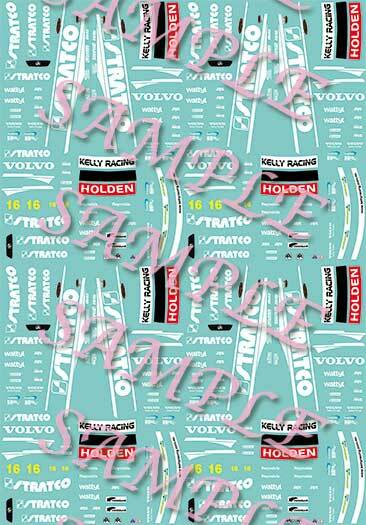 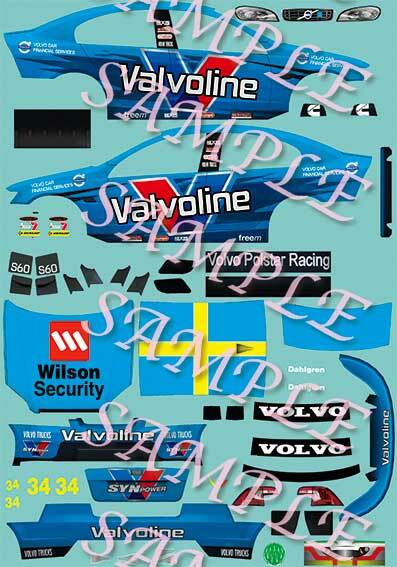 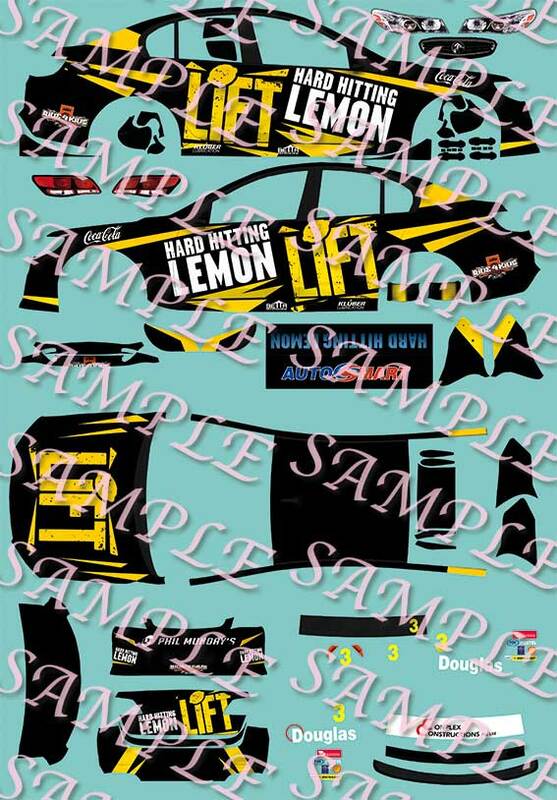 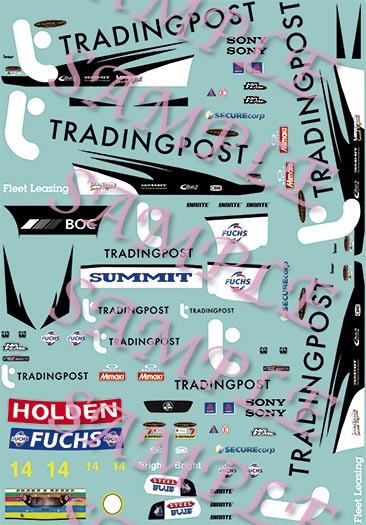 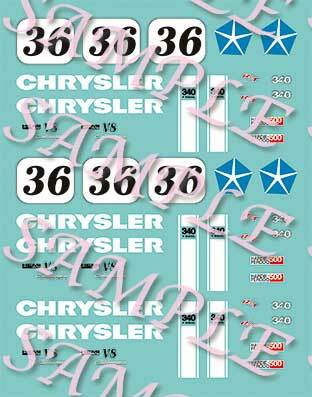 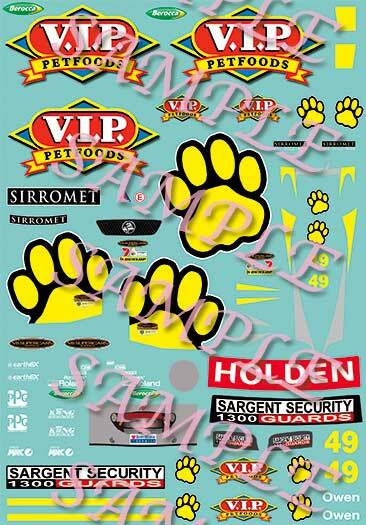 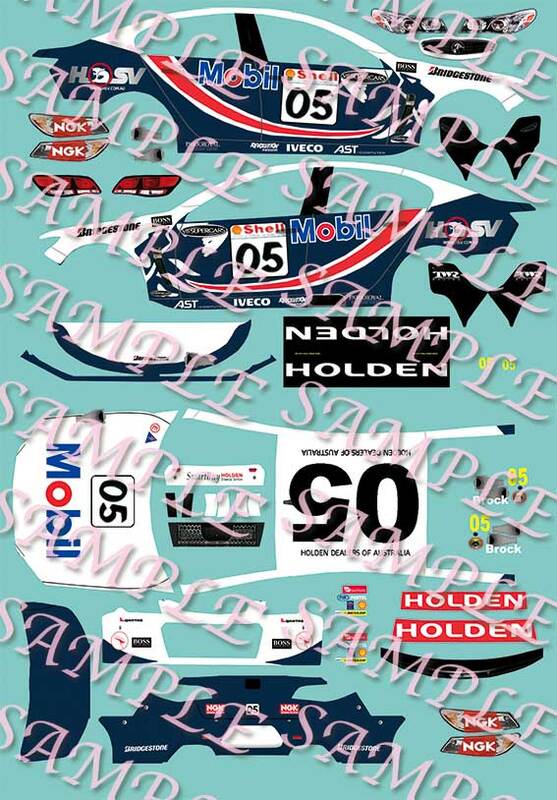 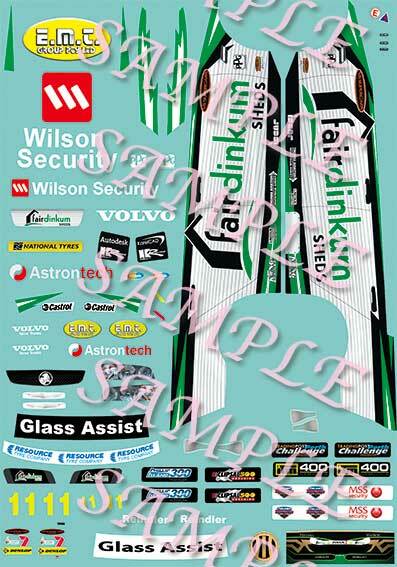 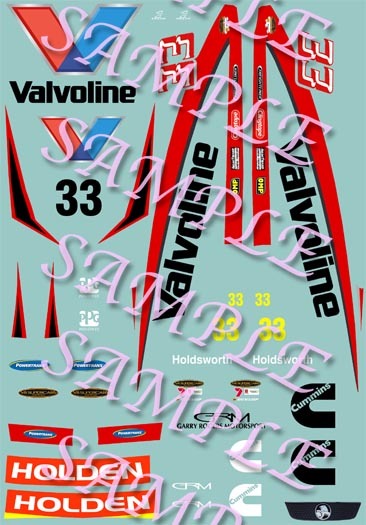 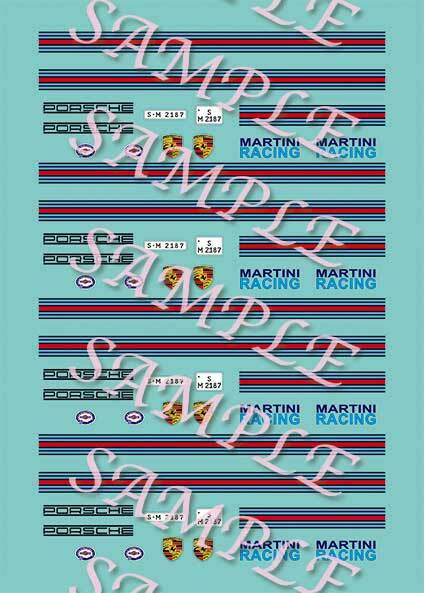 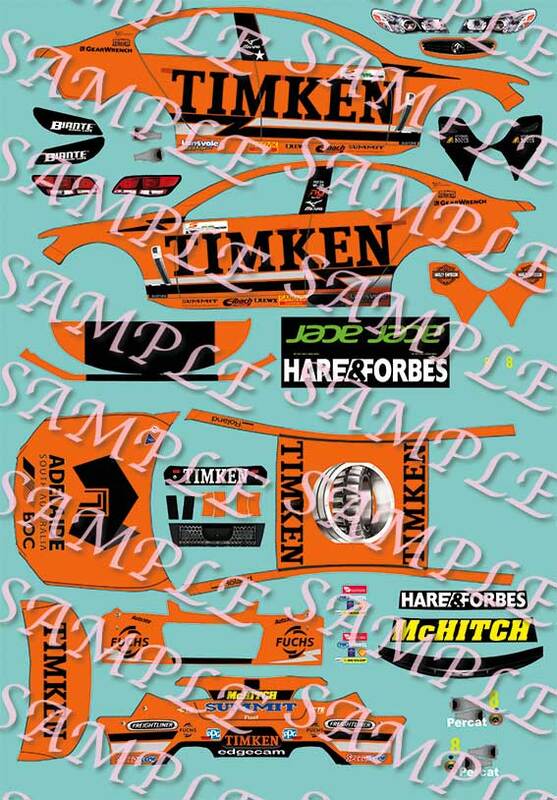 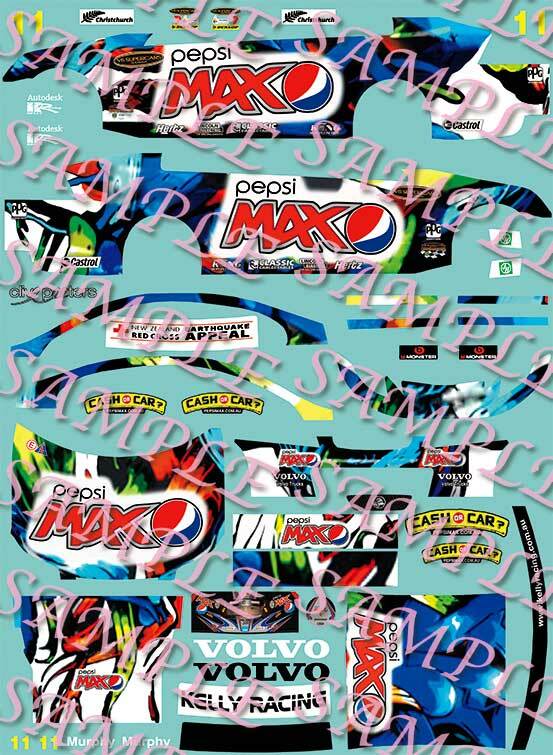 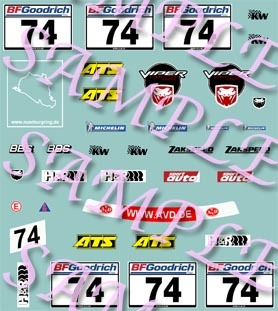 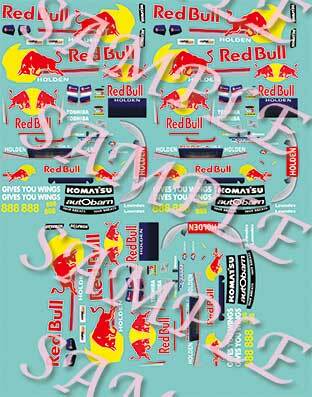 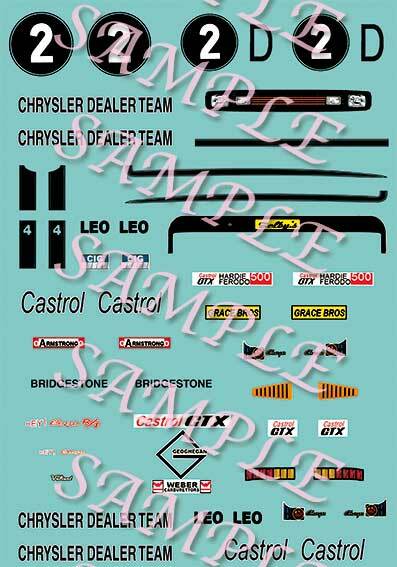 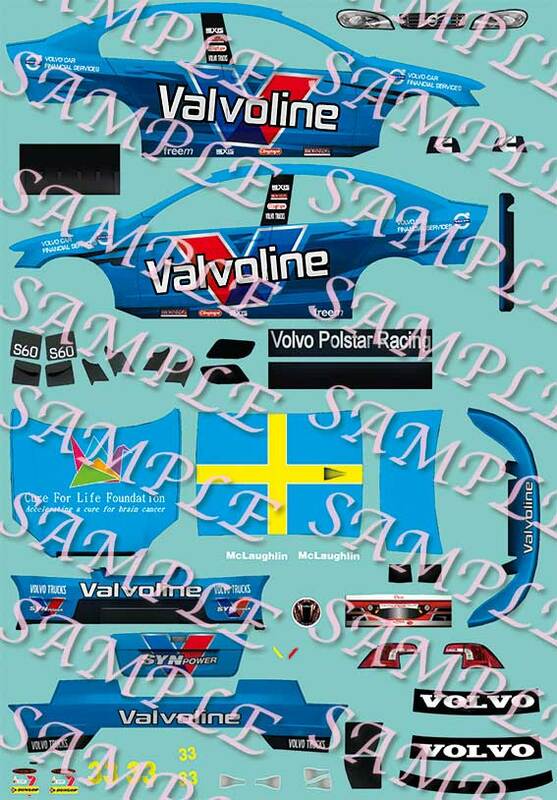 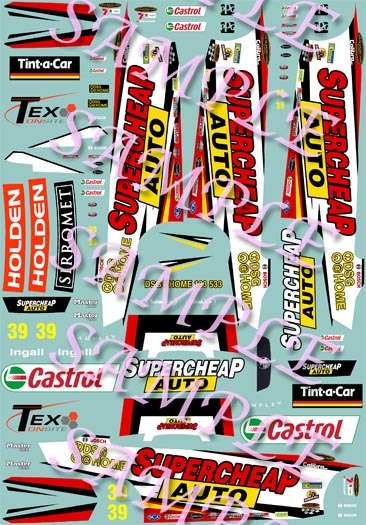 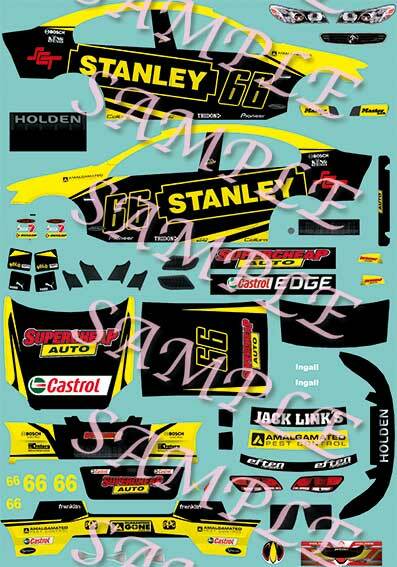 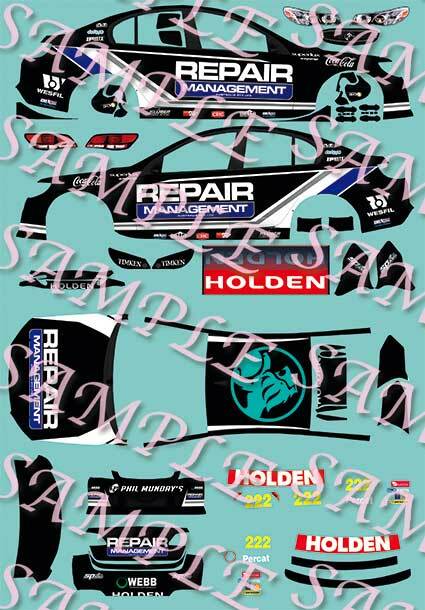 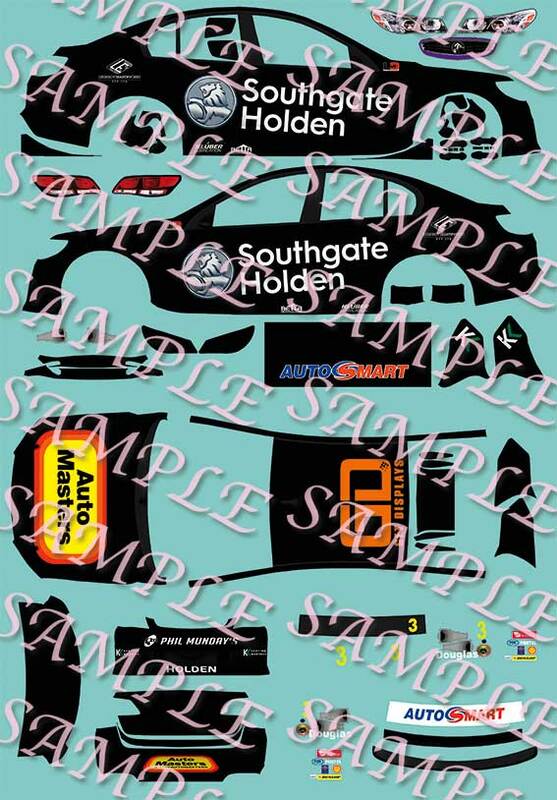 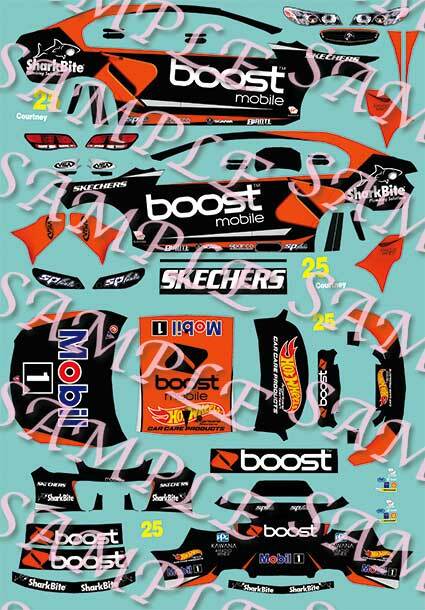 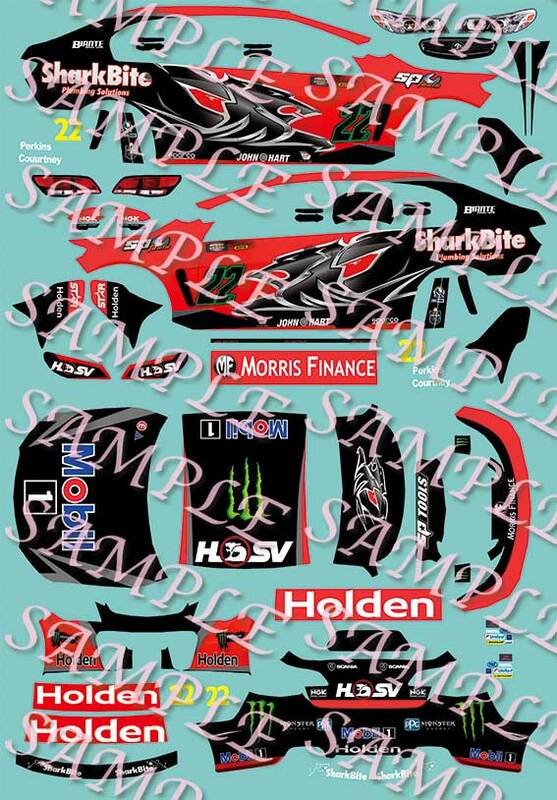 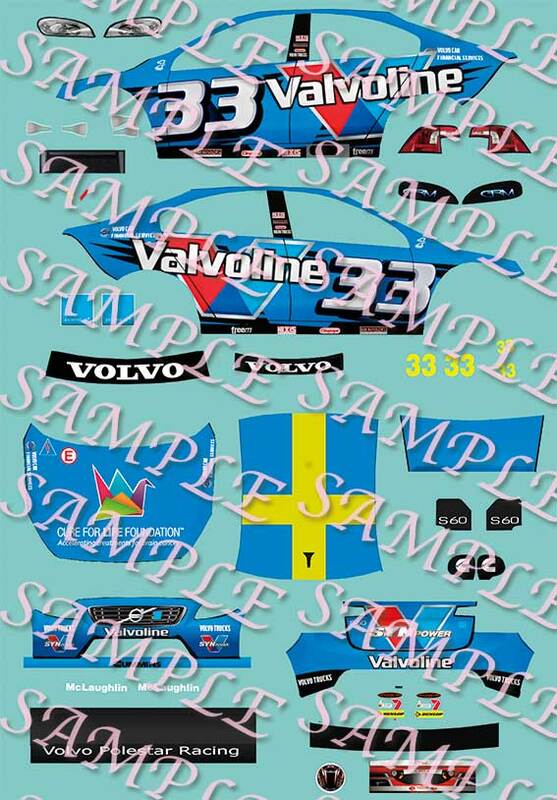 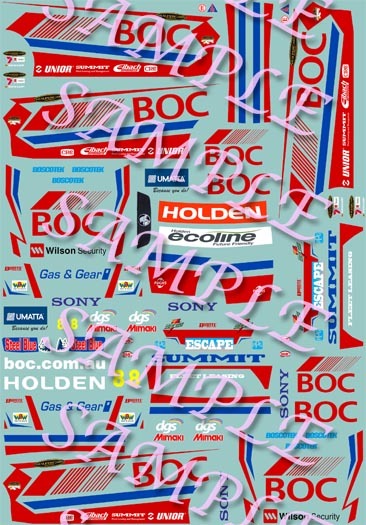 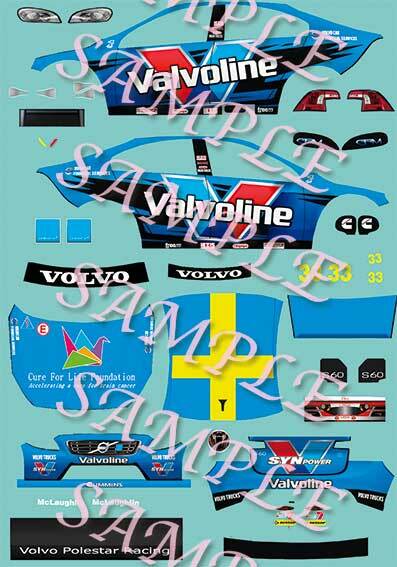 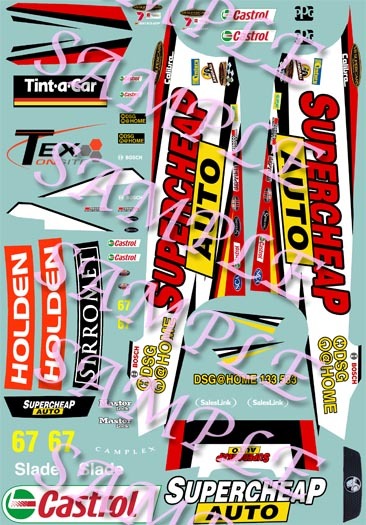 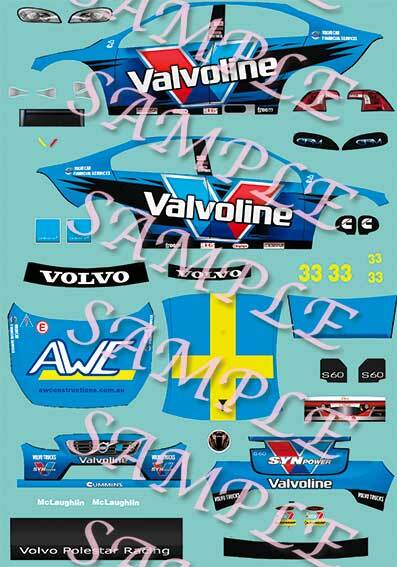 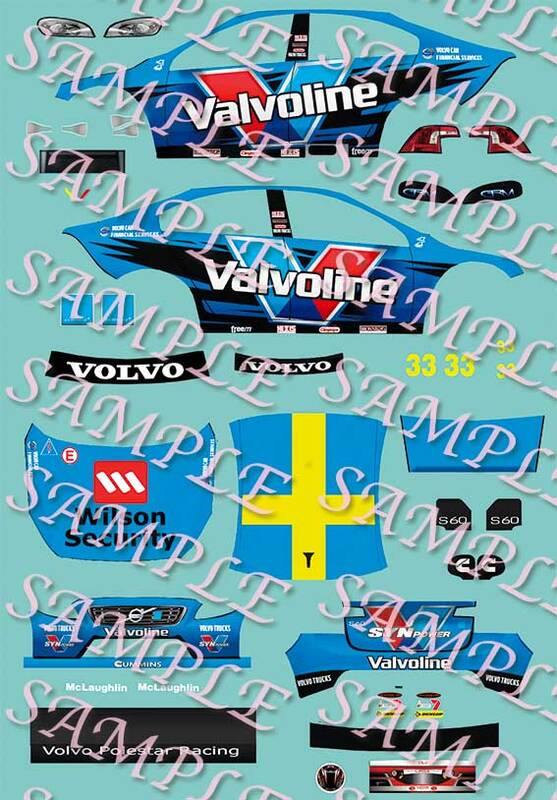 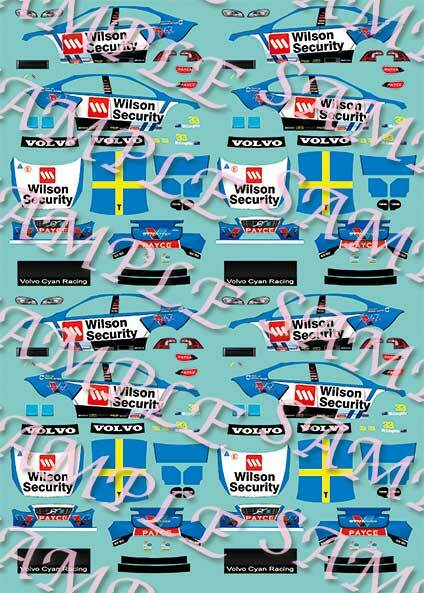 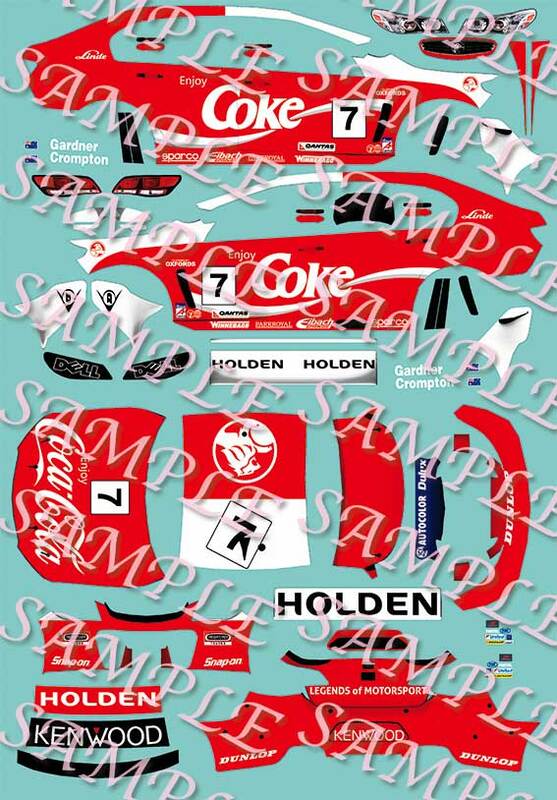 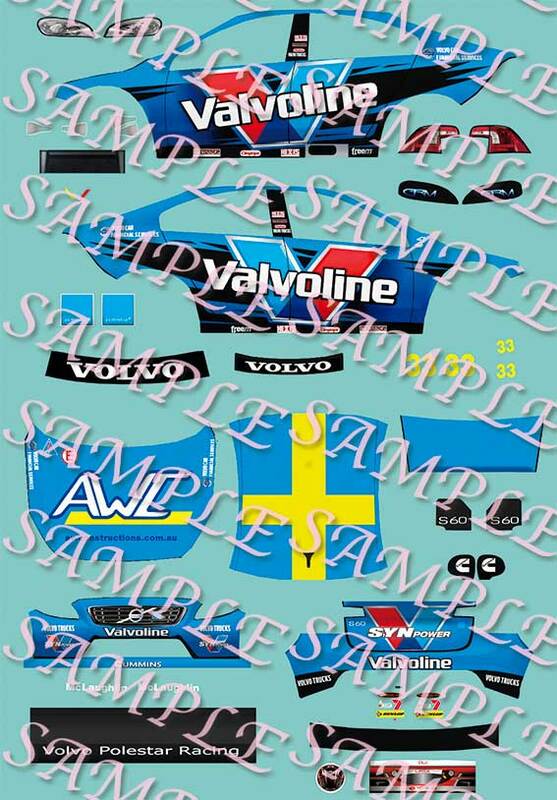 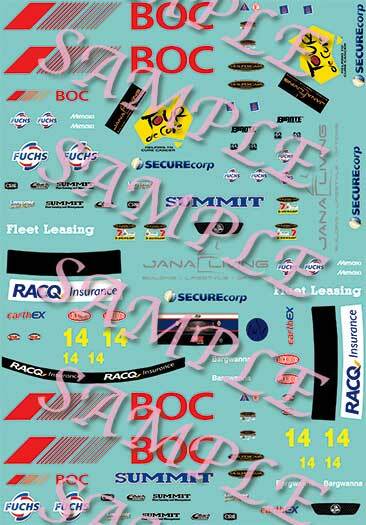 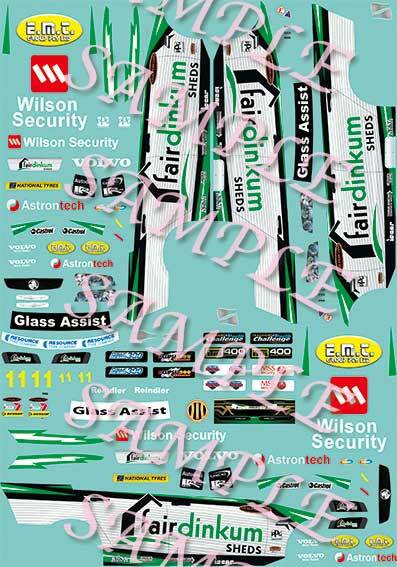 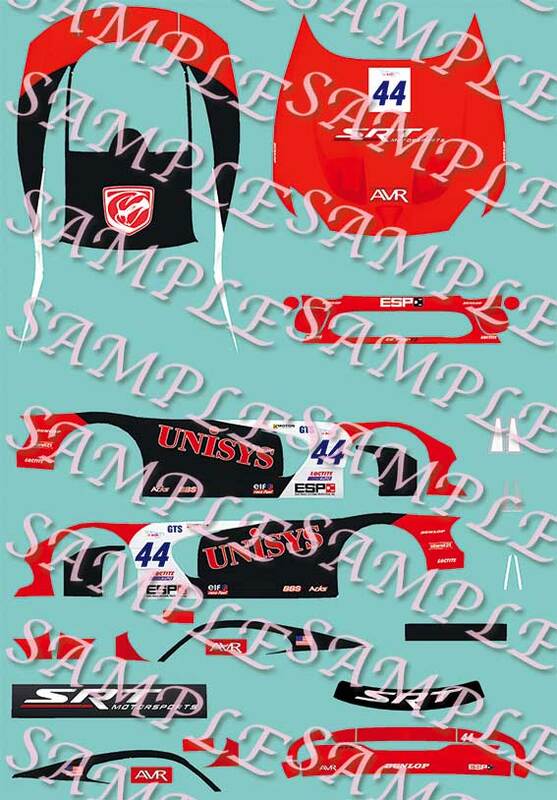 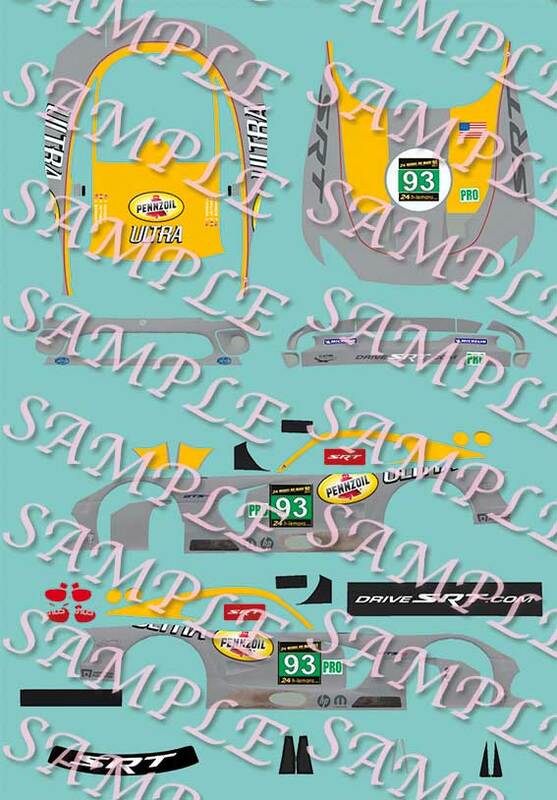 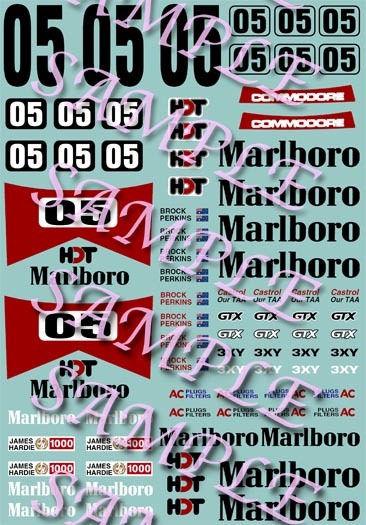 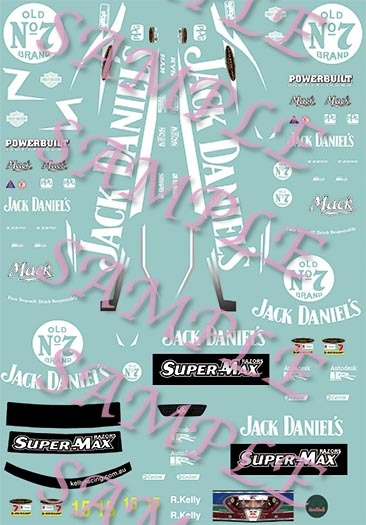 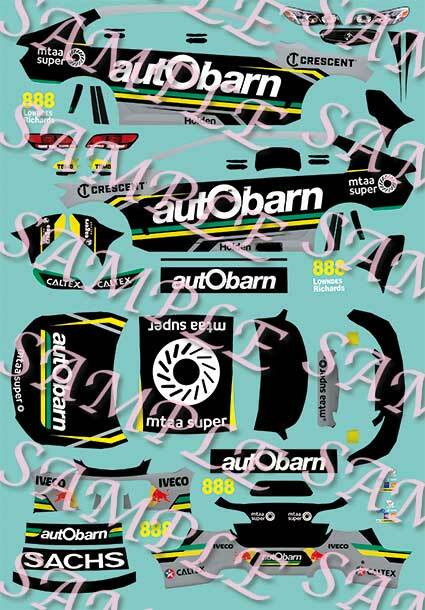 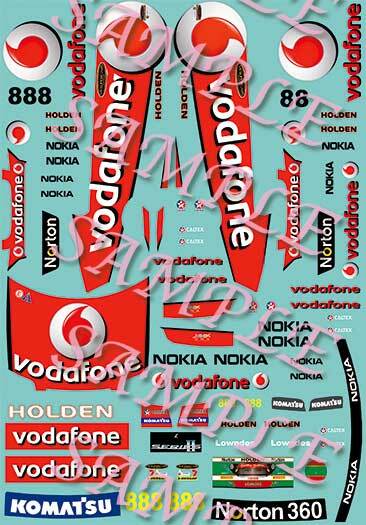 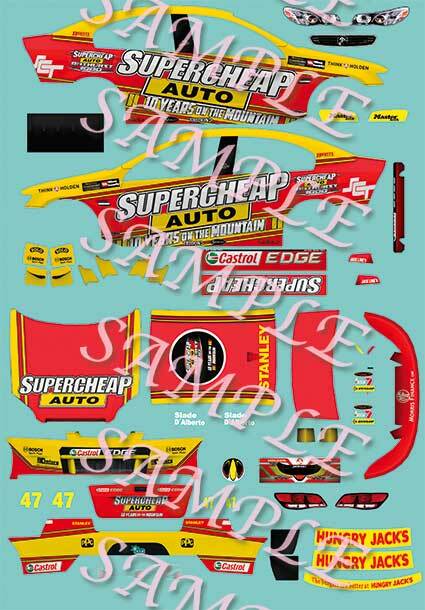 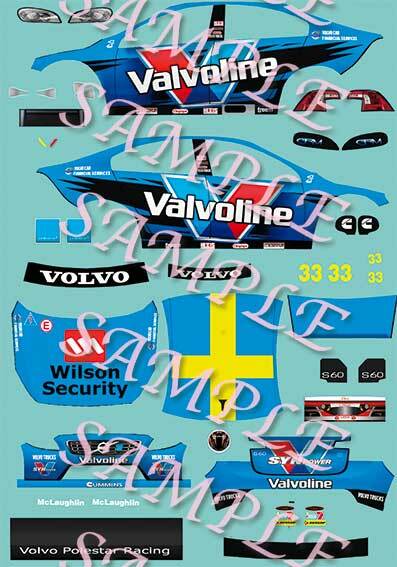 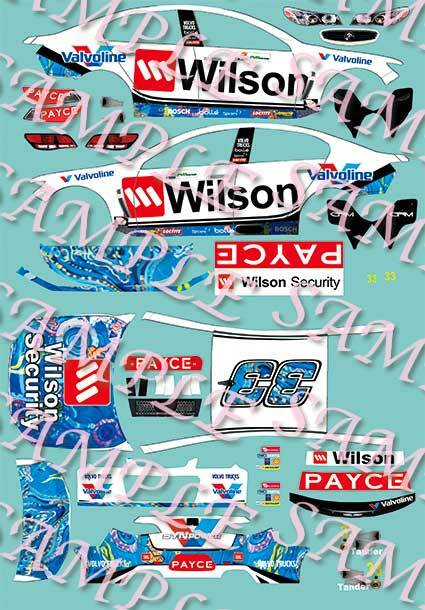 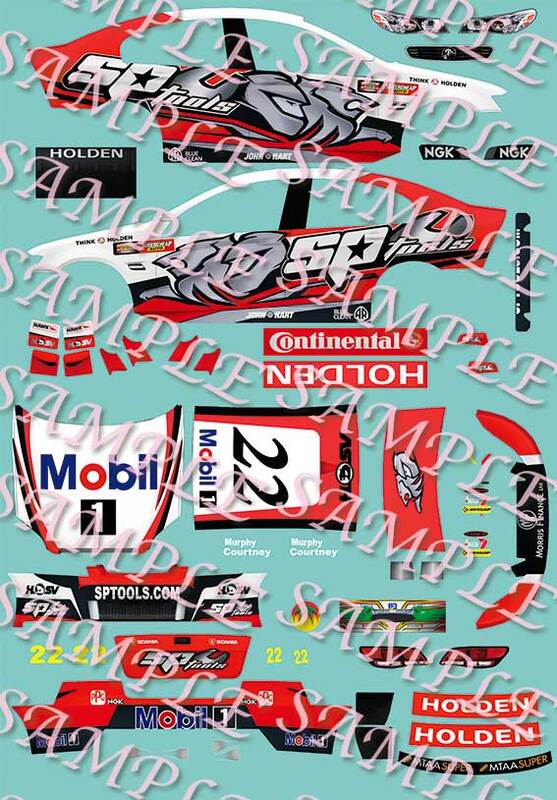 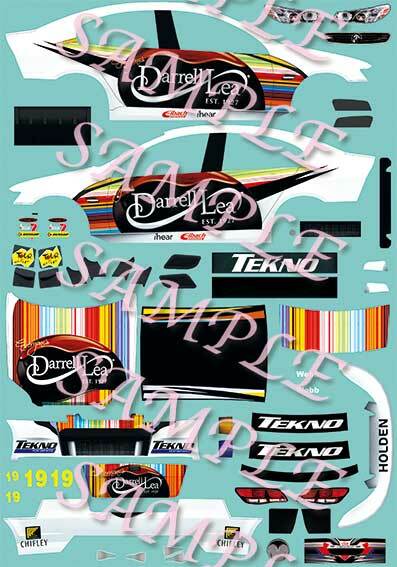 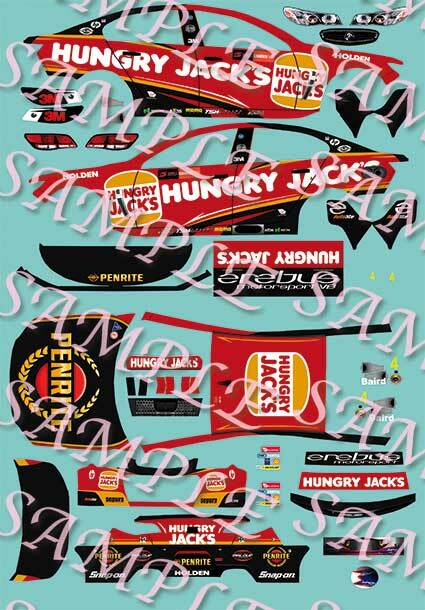 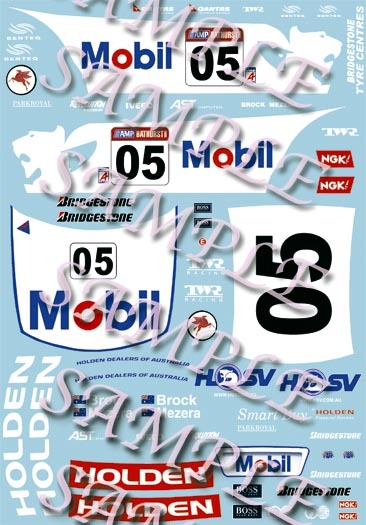 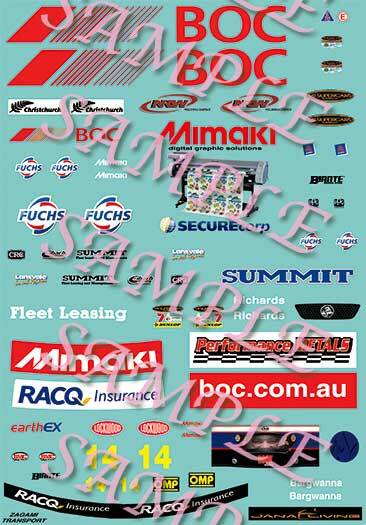 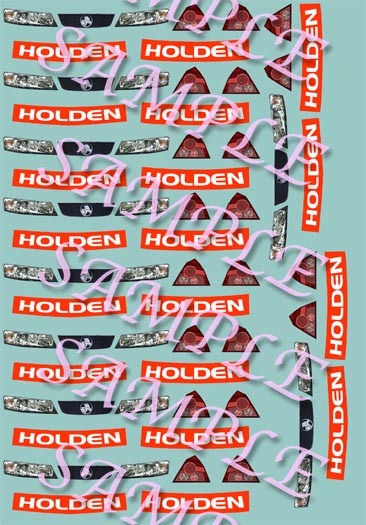 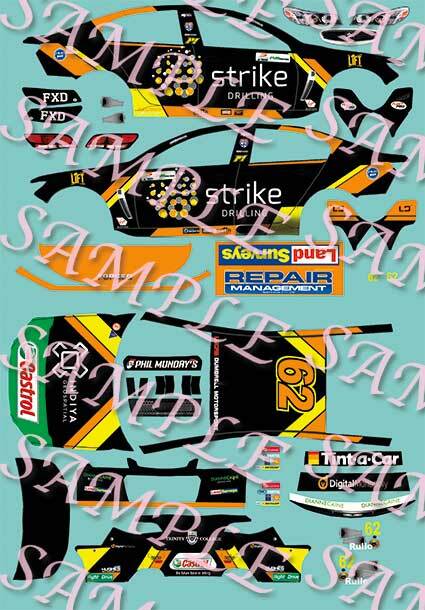 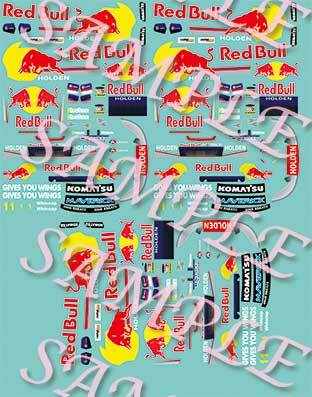 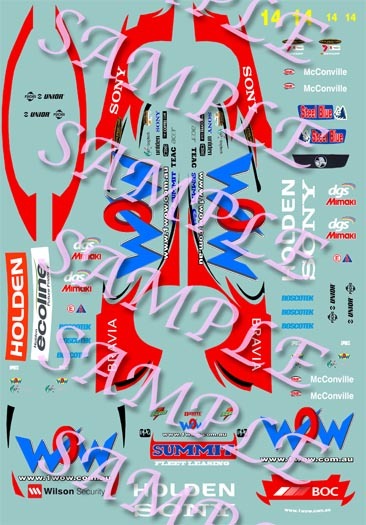 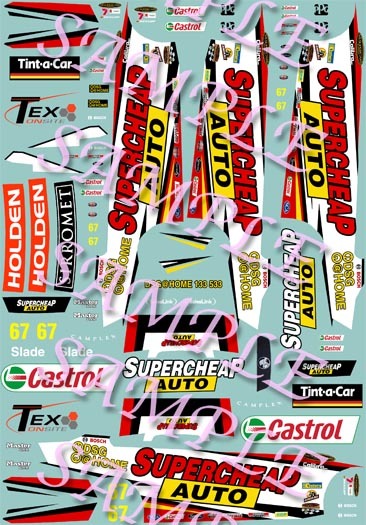 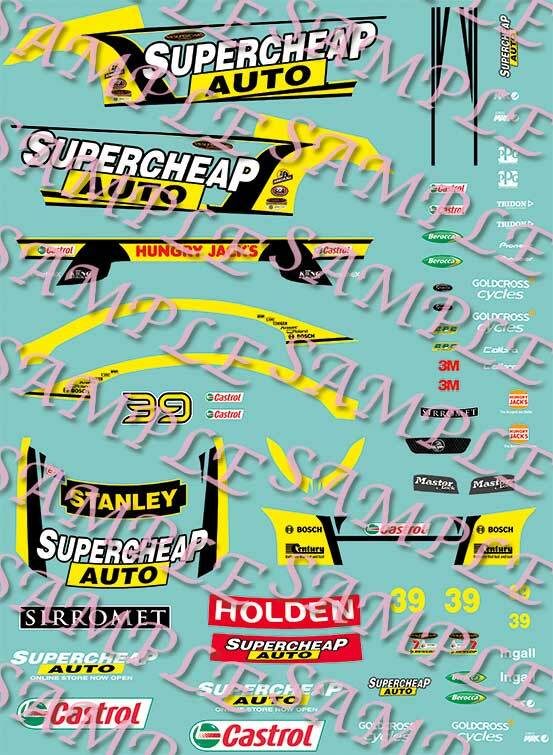 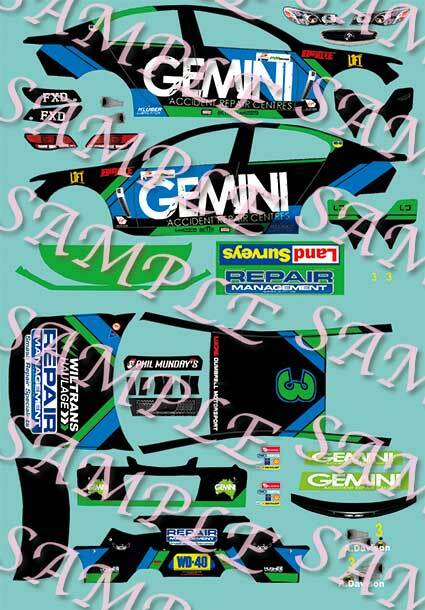 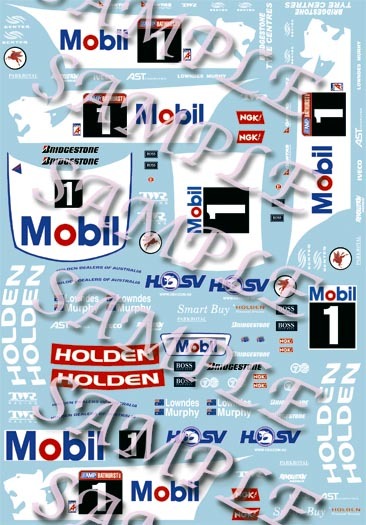 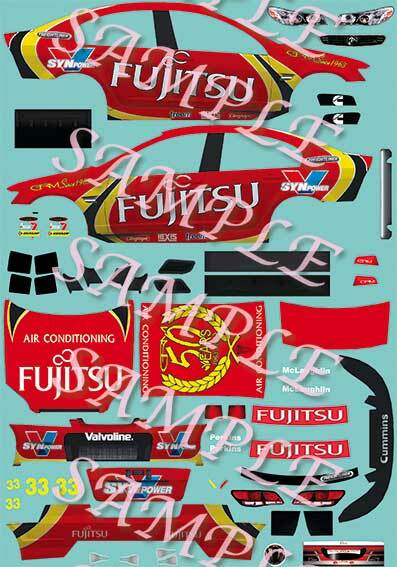 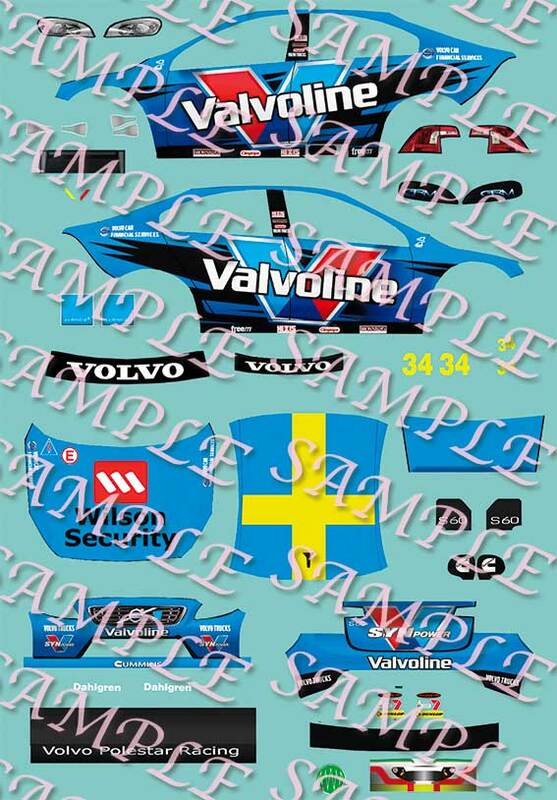 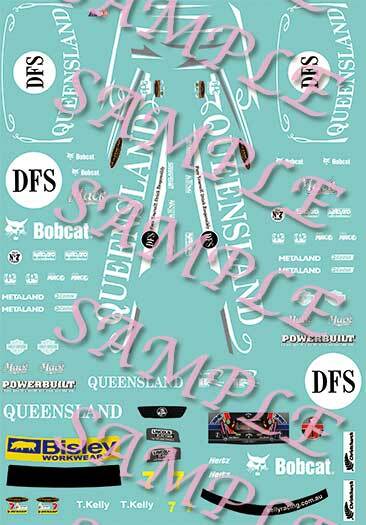 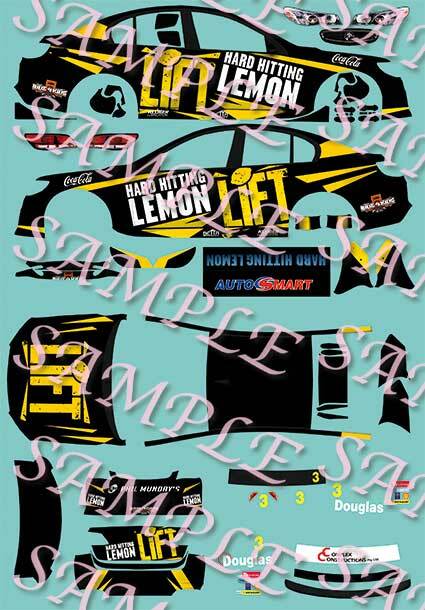 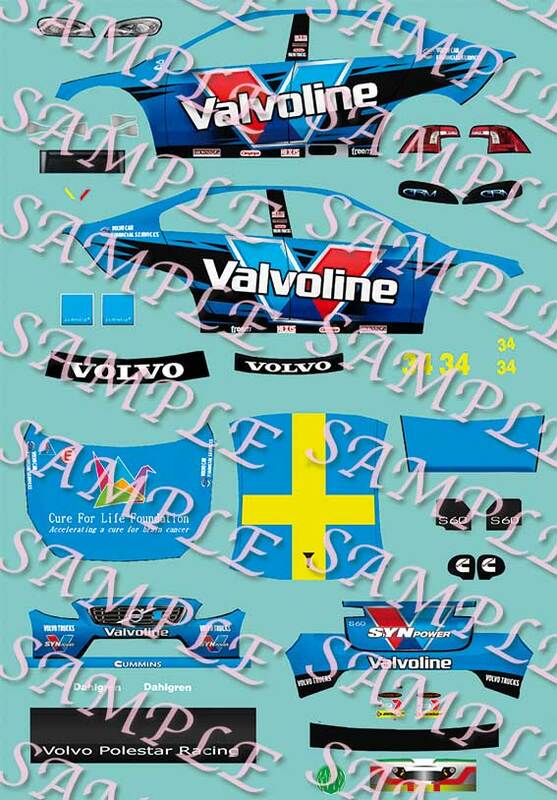 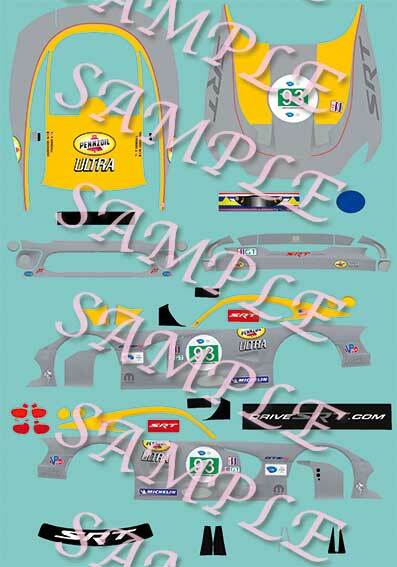 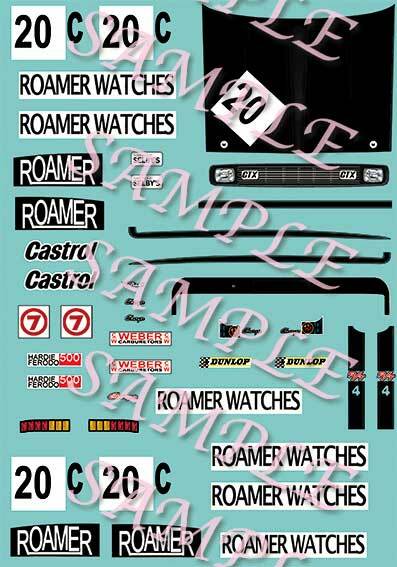 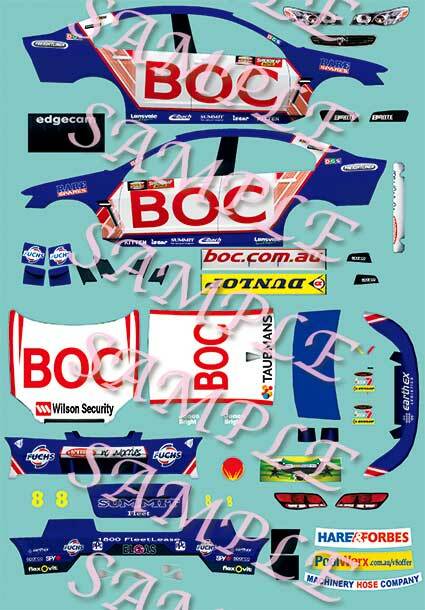 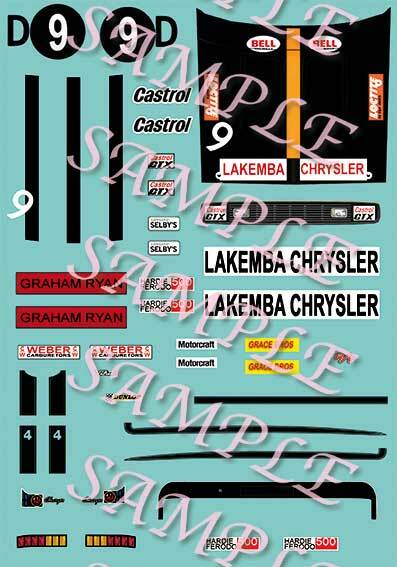 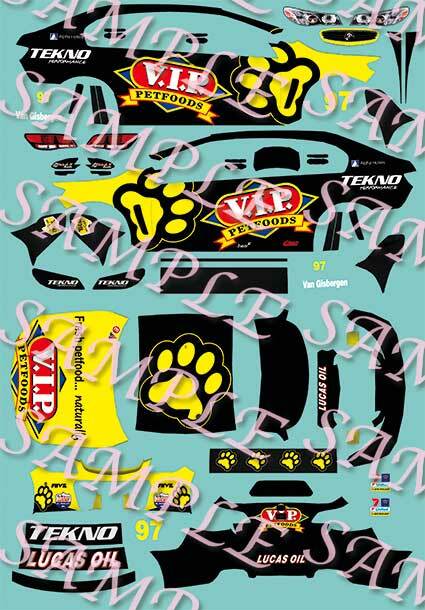 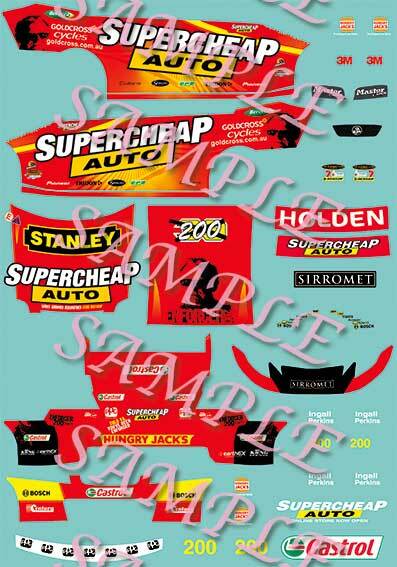 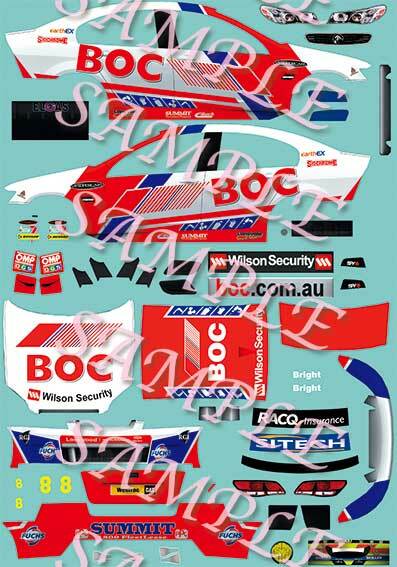 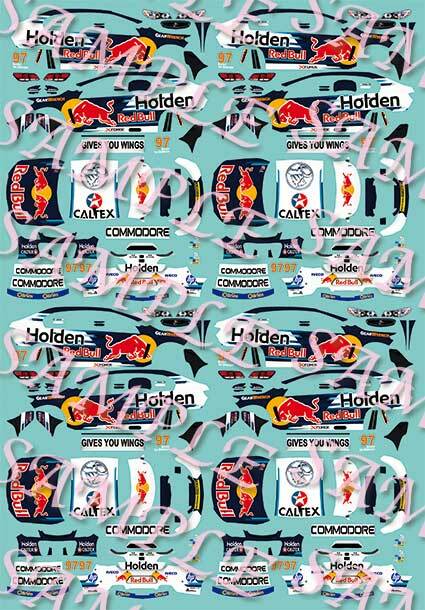 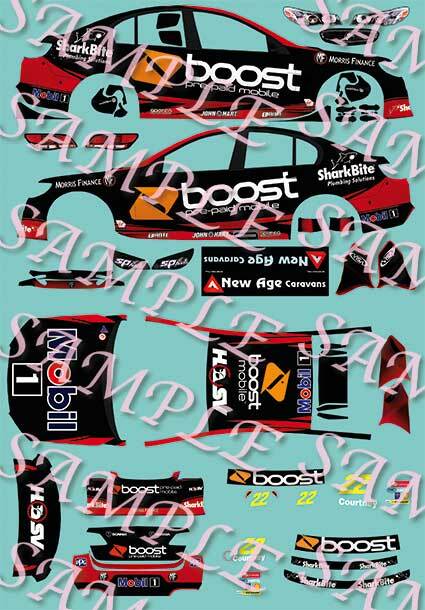 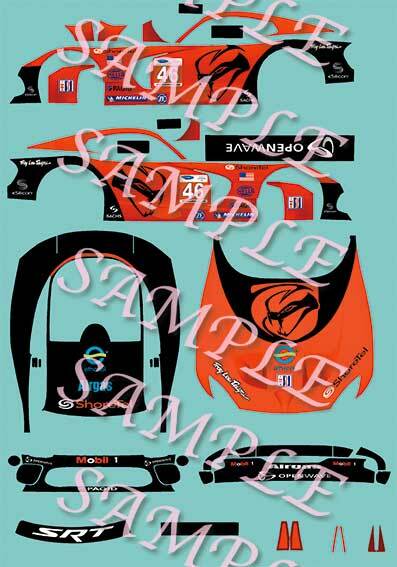 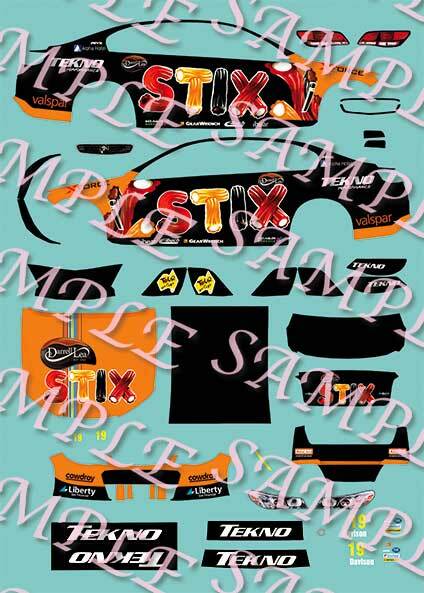 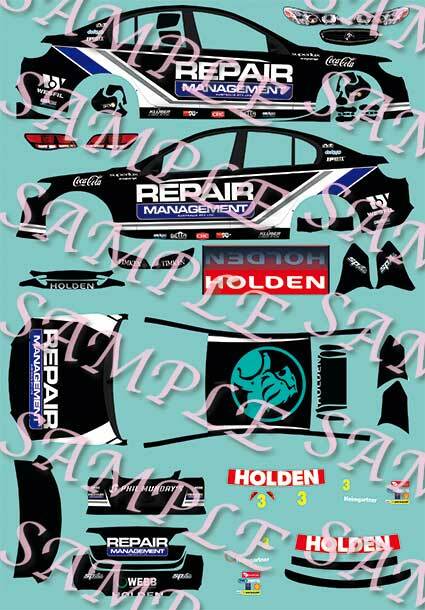 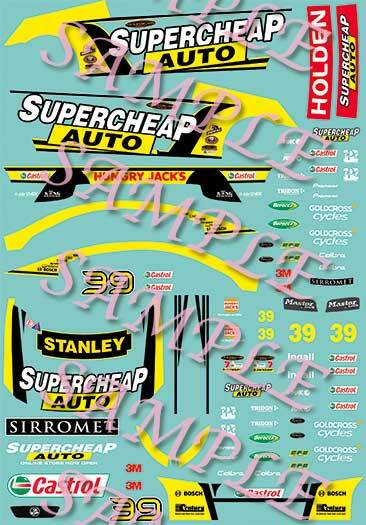 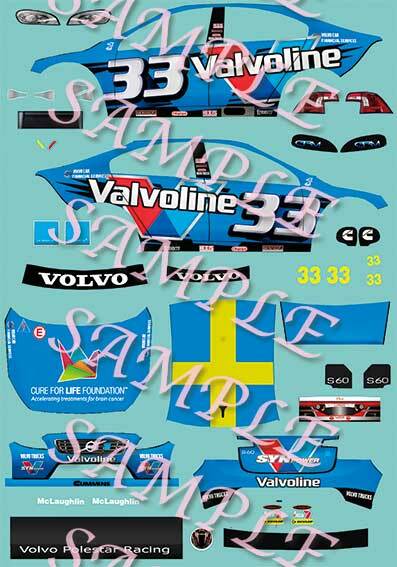 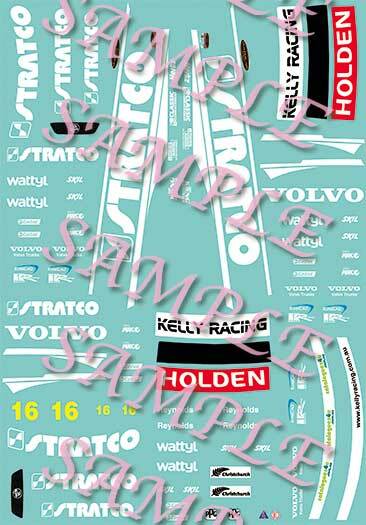 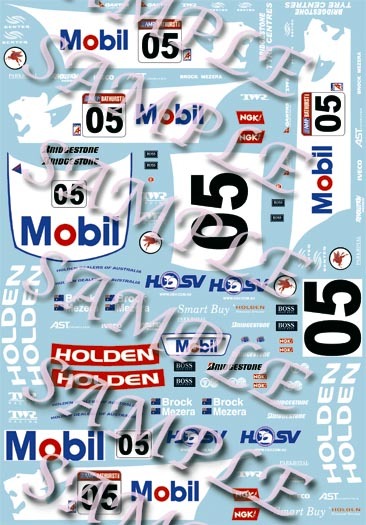 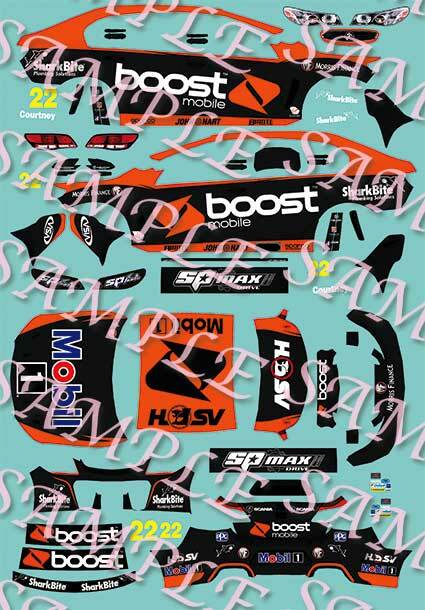 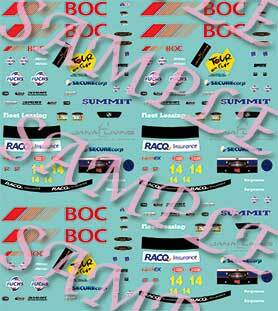 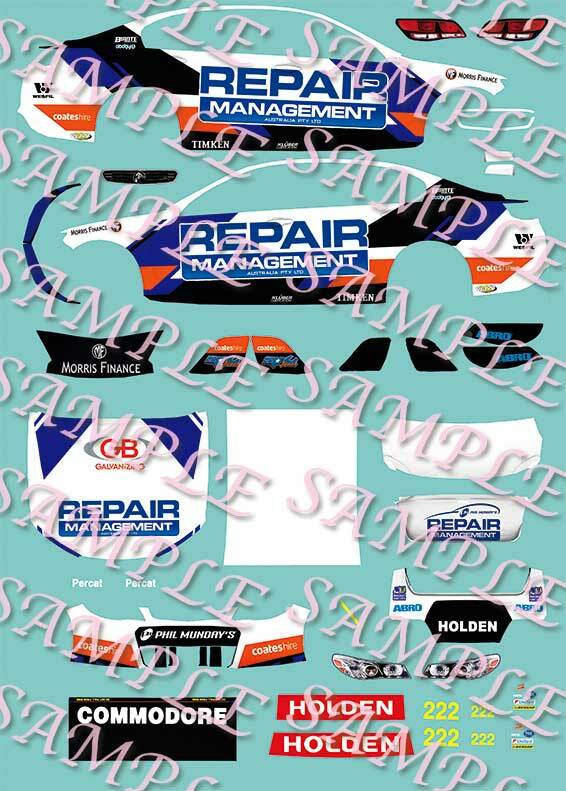 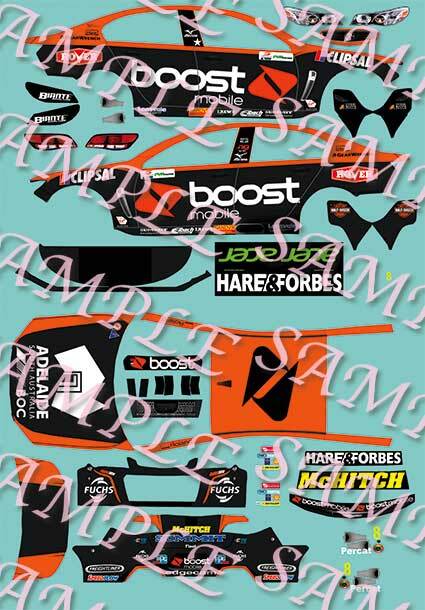 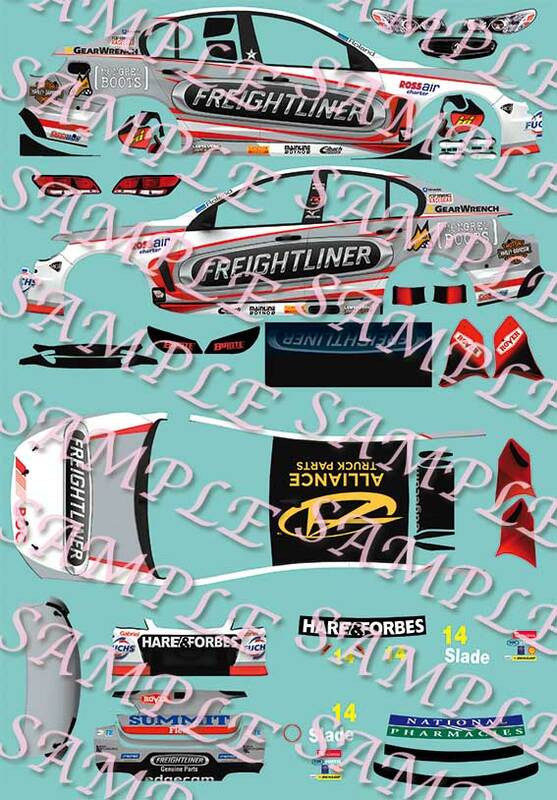 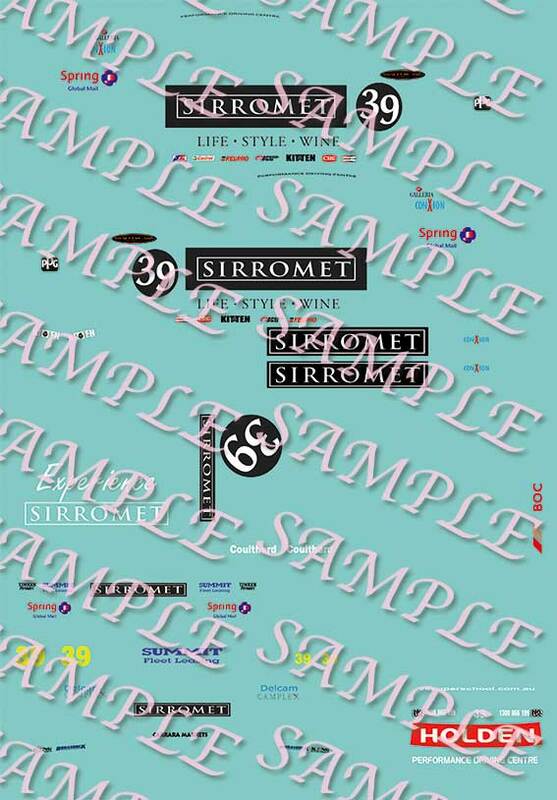 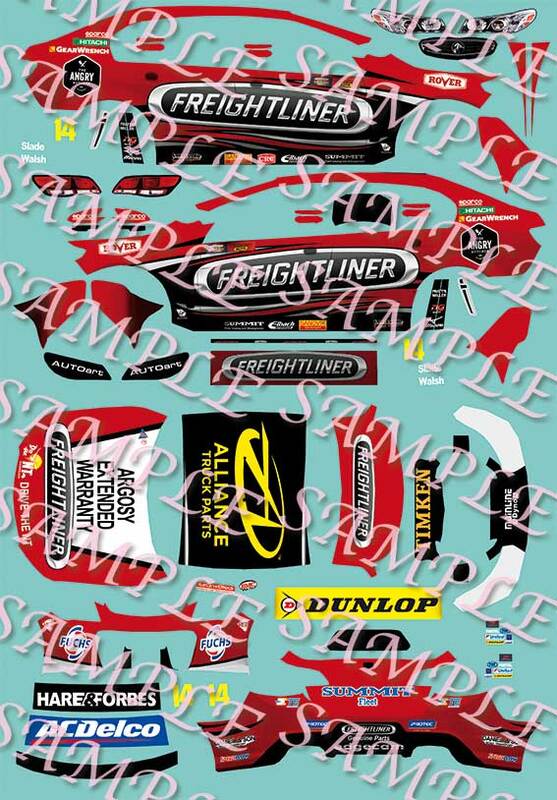 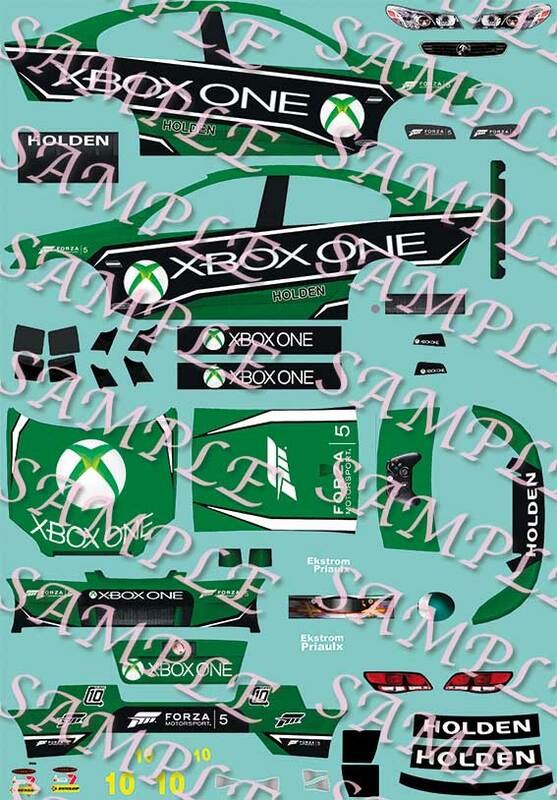 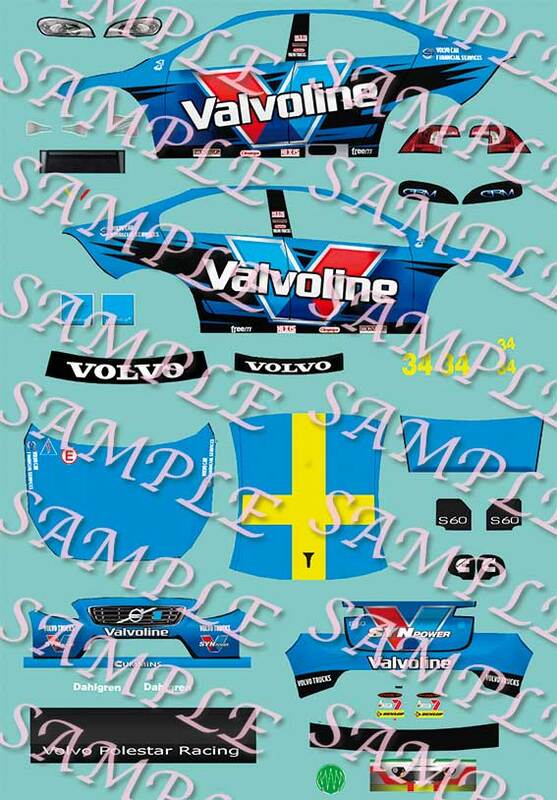 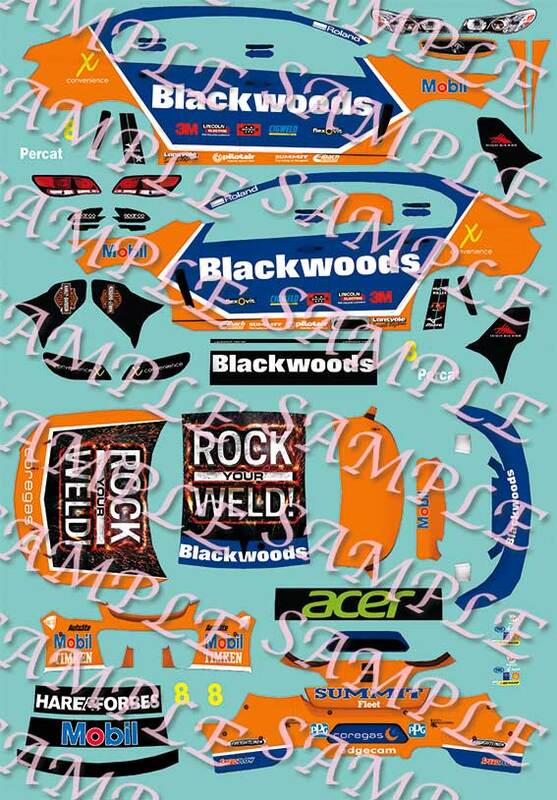 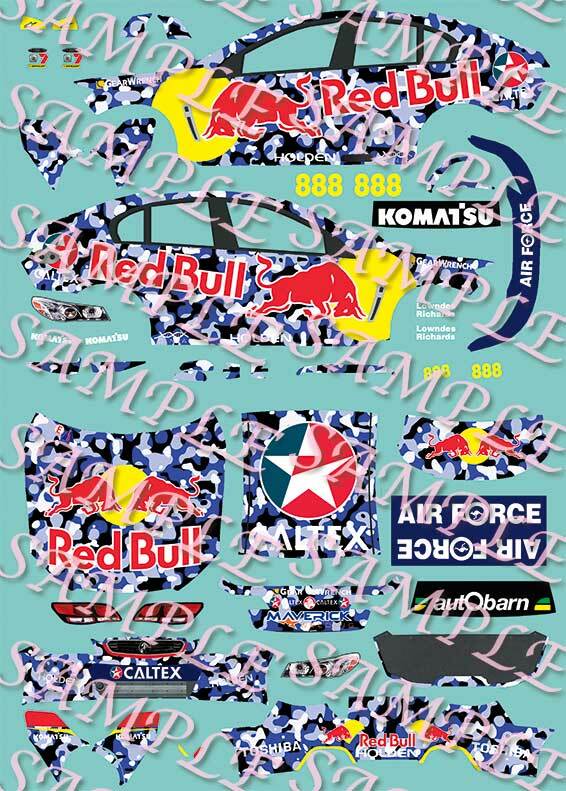 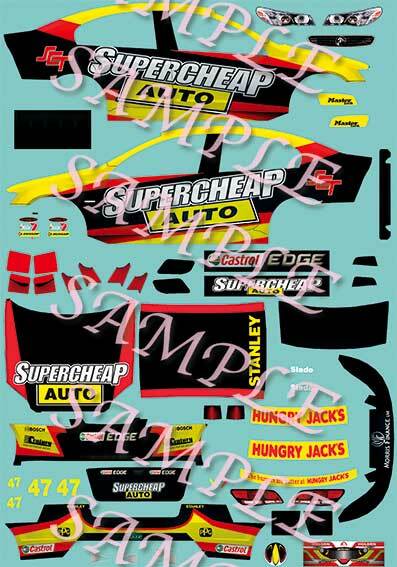 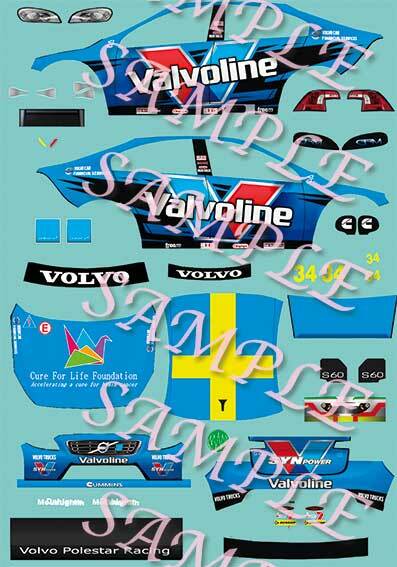 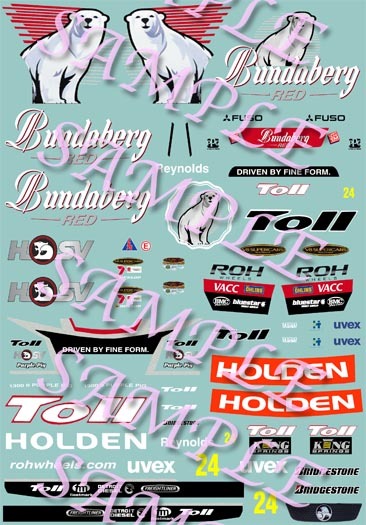 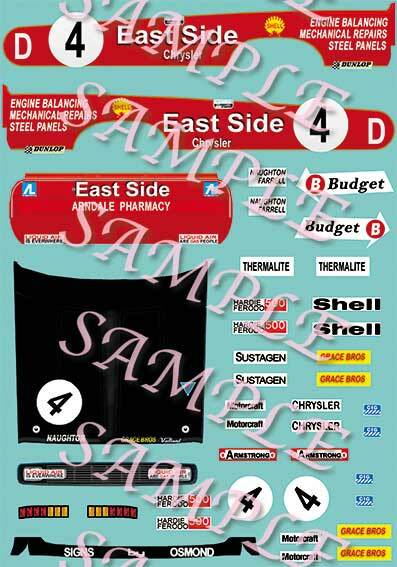 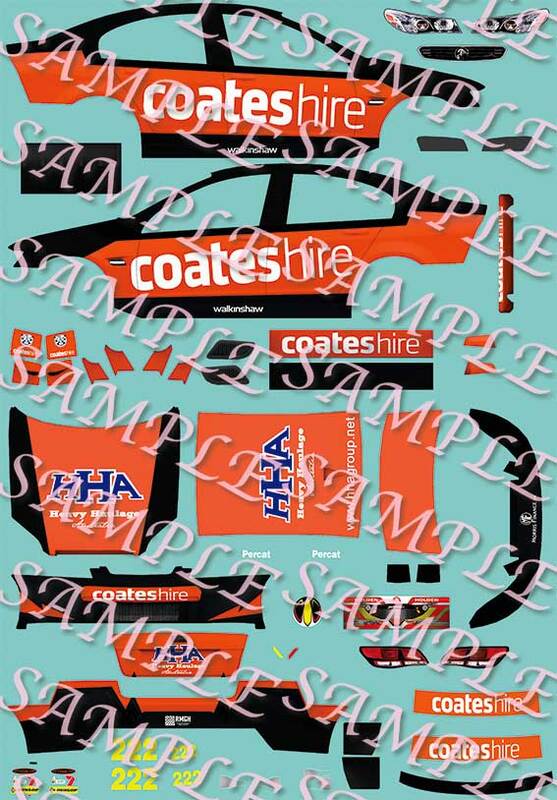 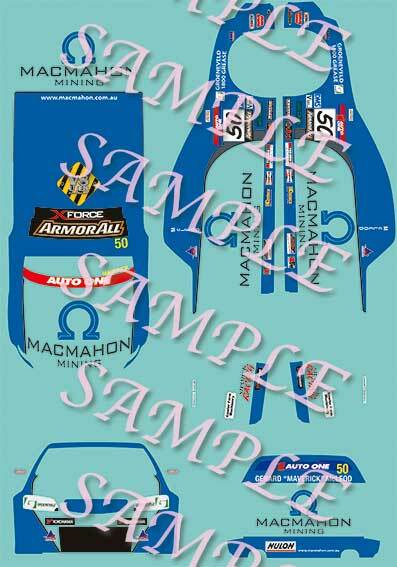 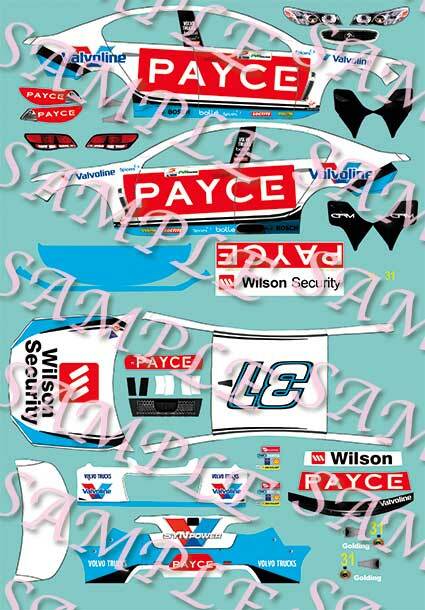 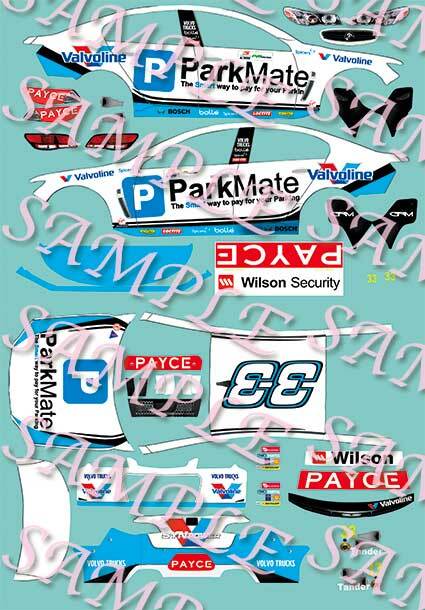 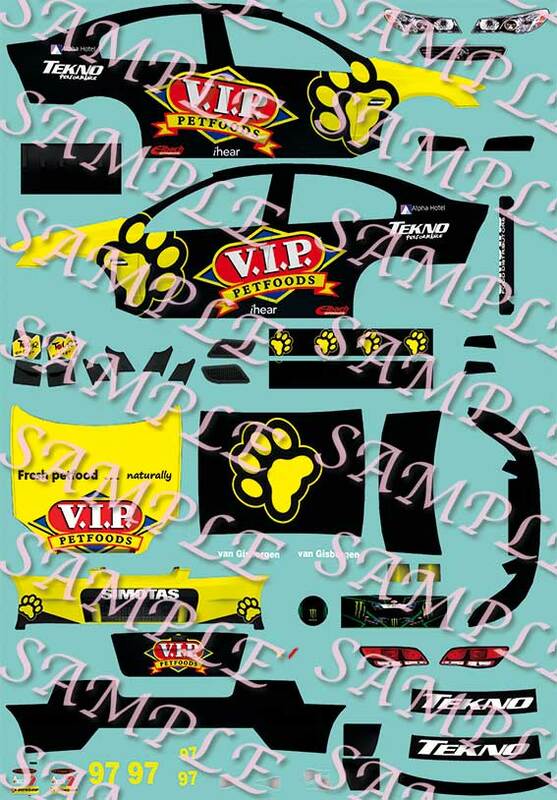 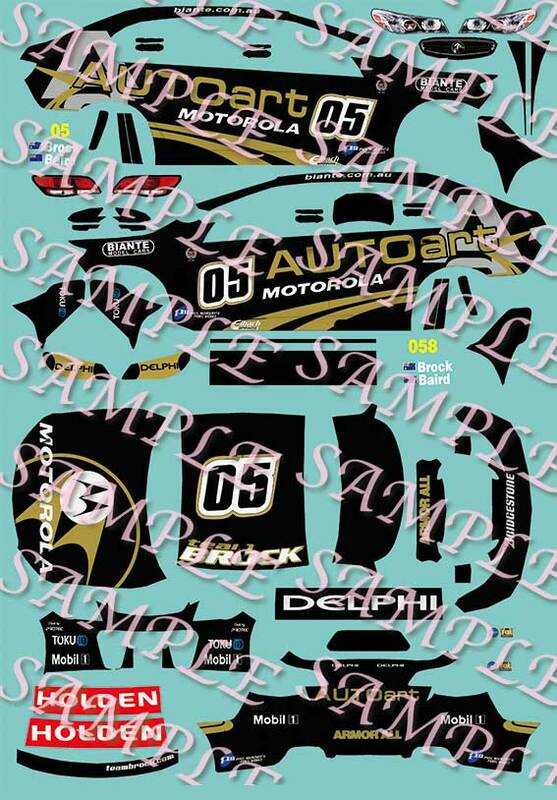 Click on each underlined link to see a representation of the standard decal. 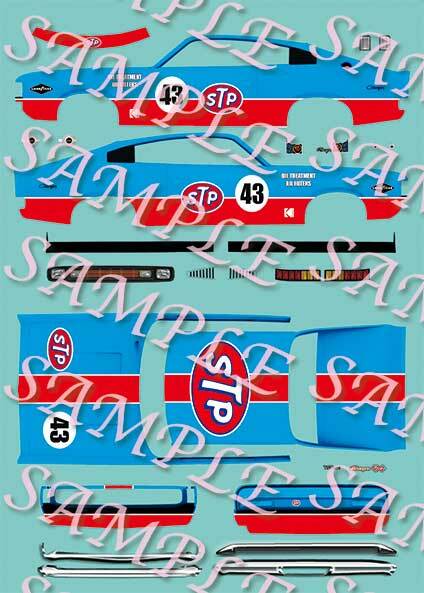 I have previews for 1/24, 1/32 and 1/64. 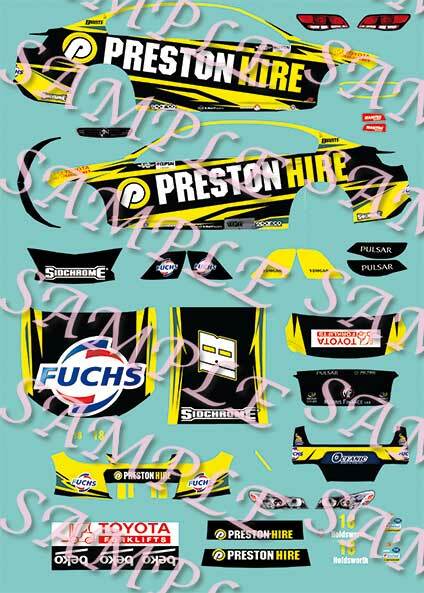 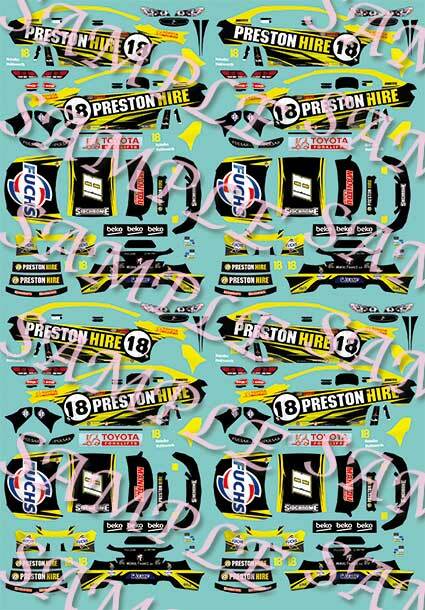 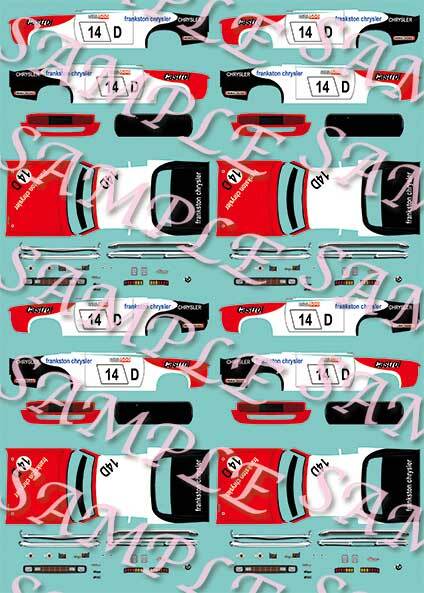 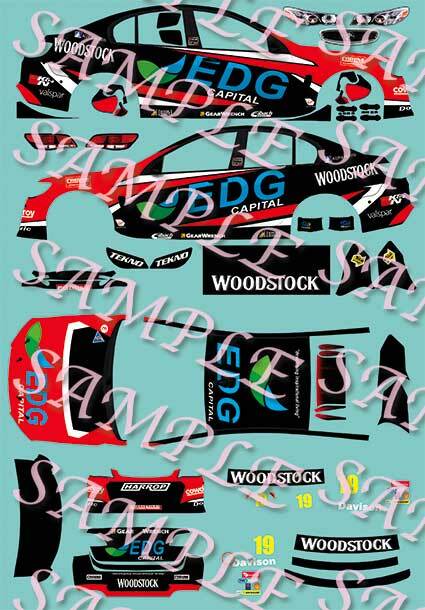 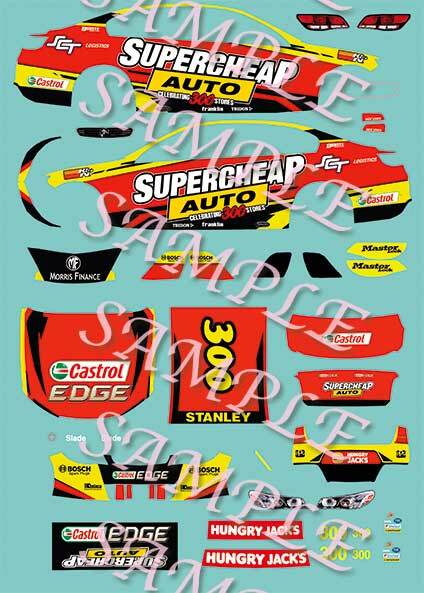 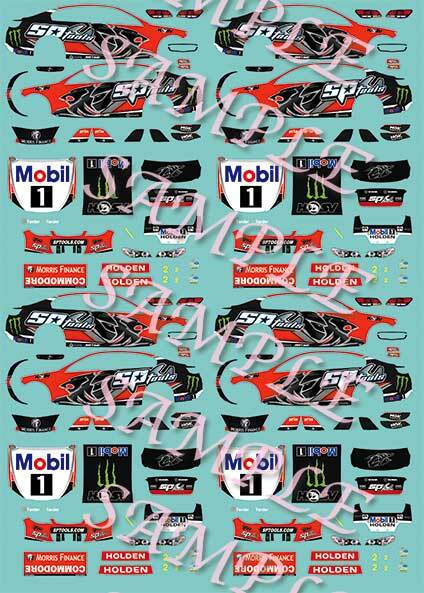 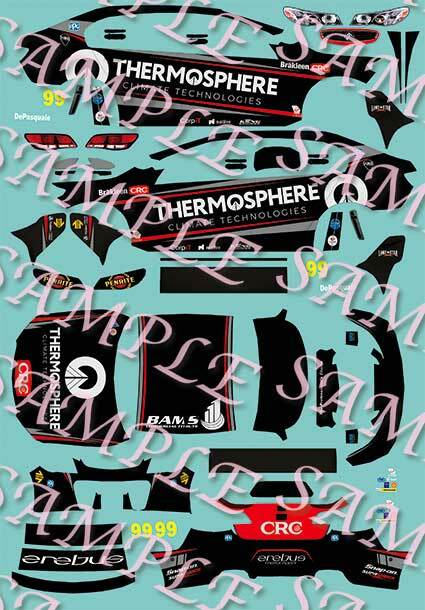 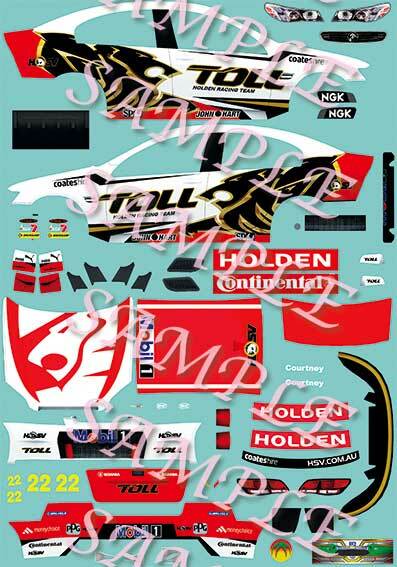 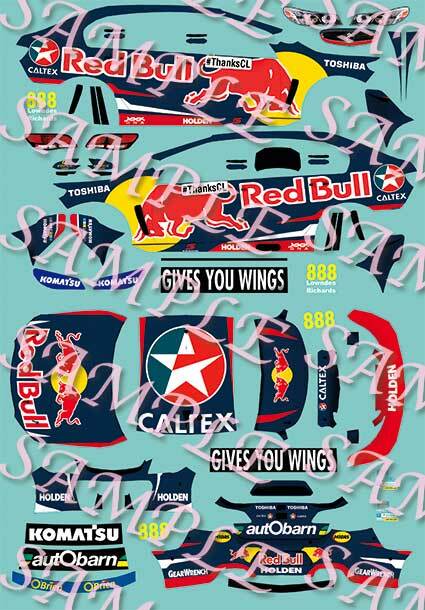 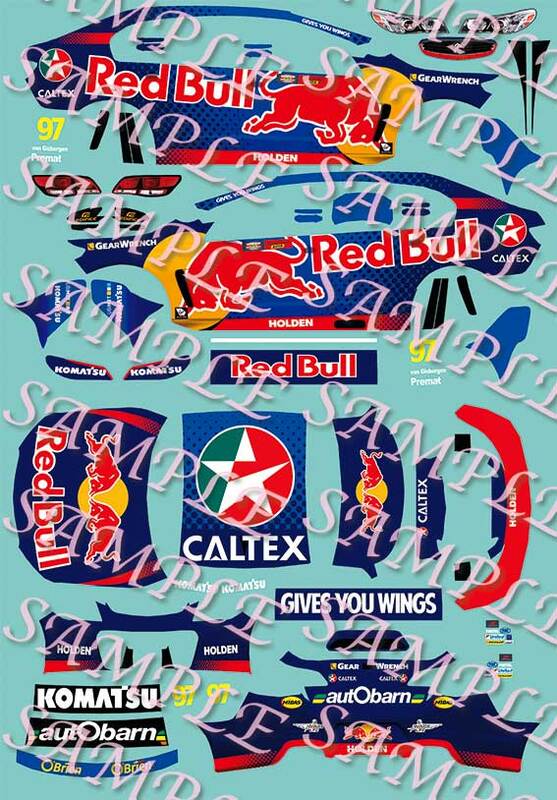 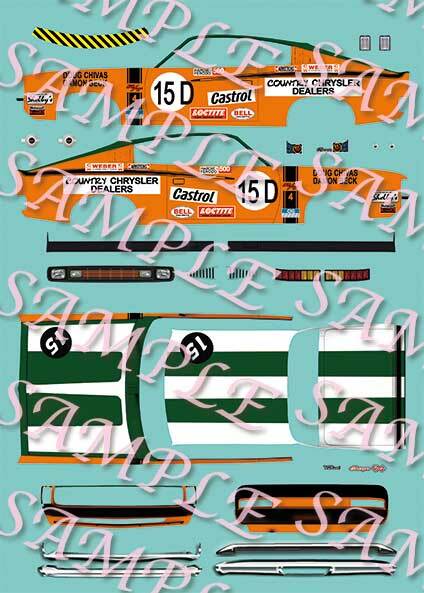 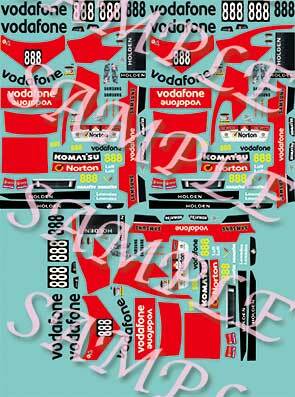 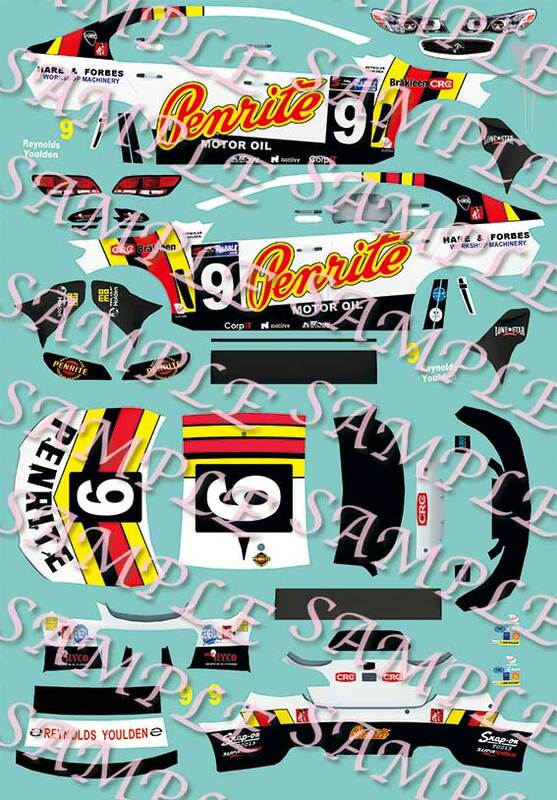 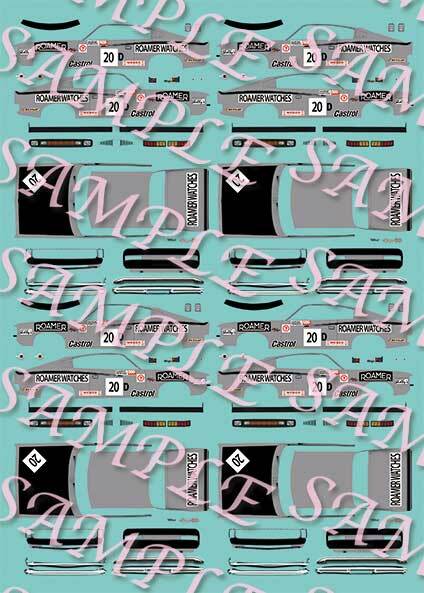 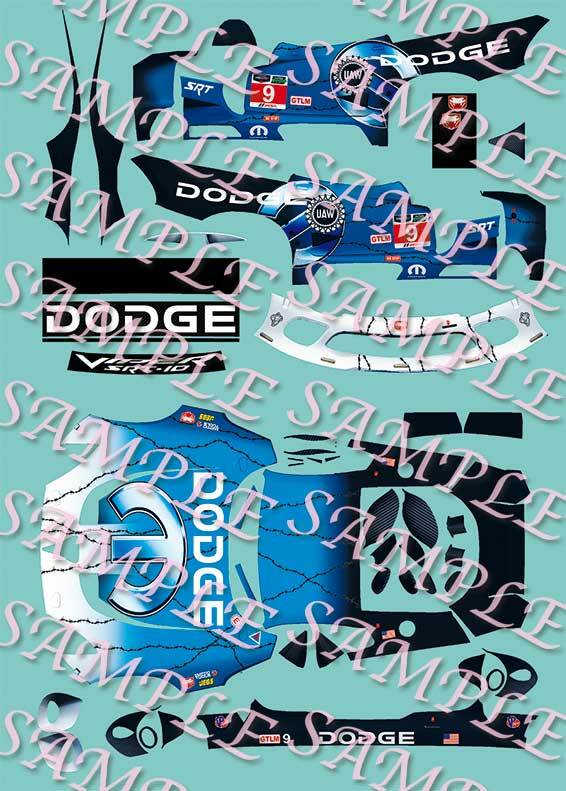 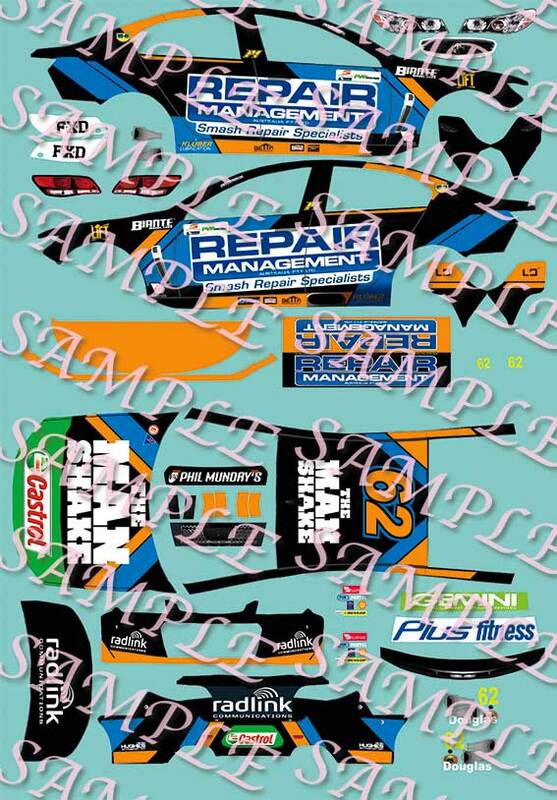 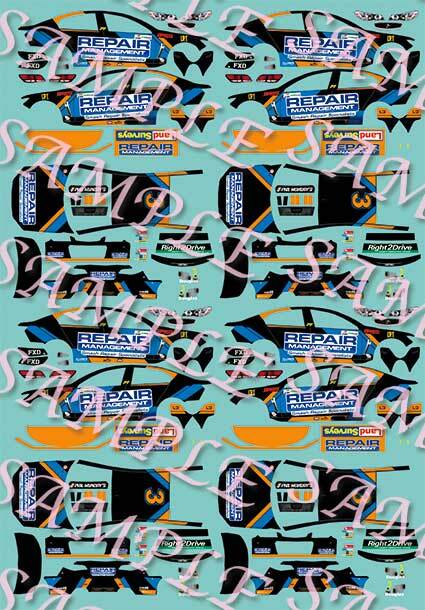 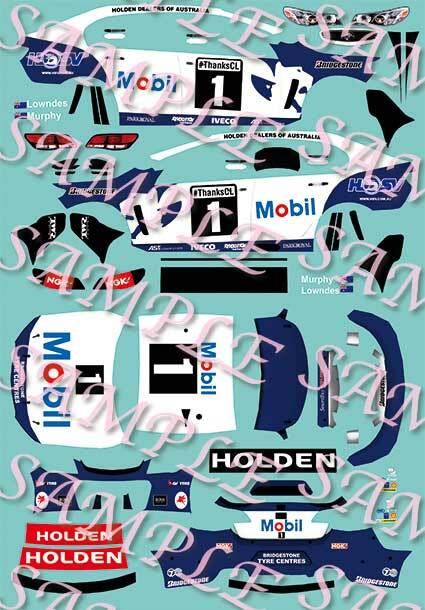 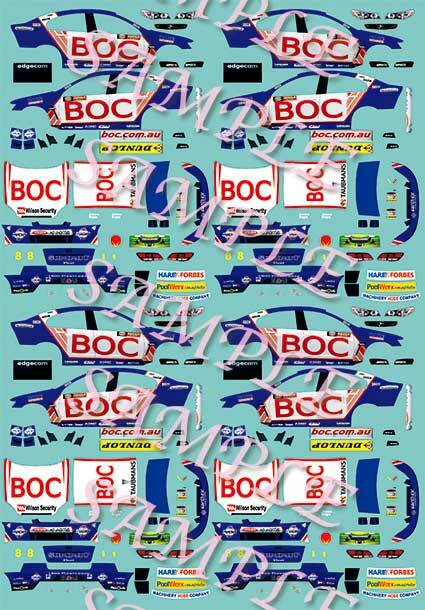 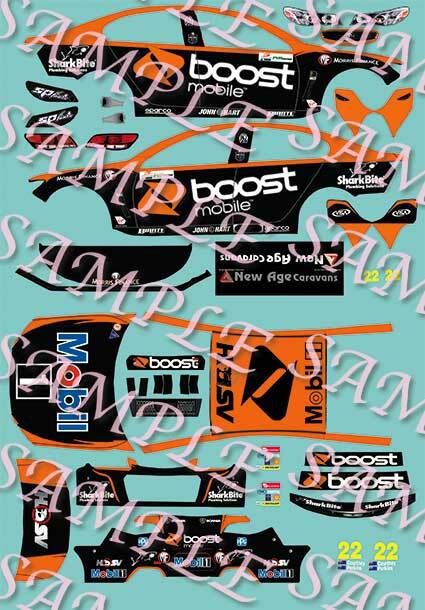 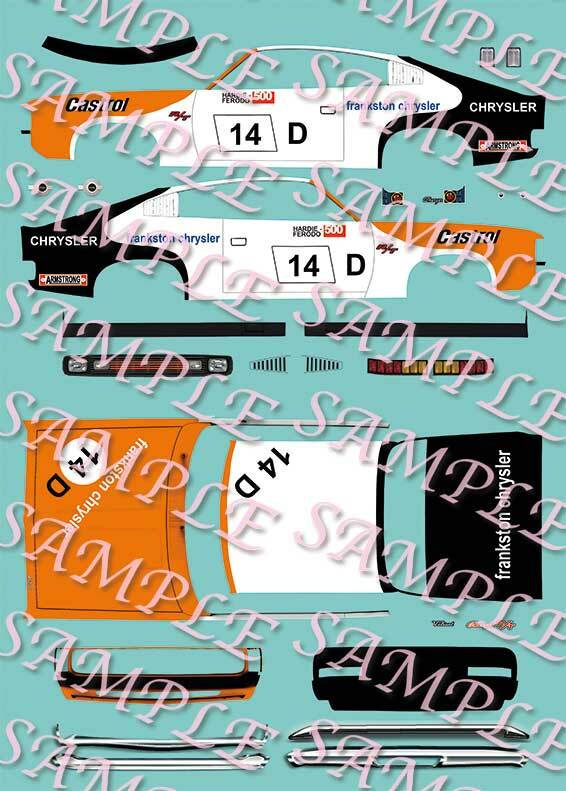 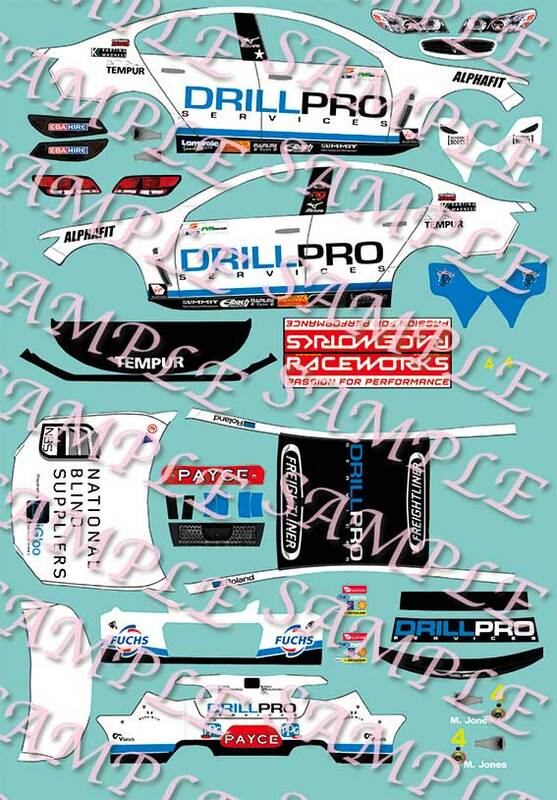 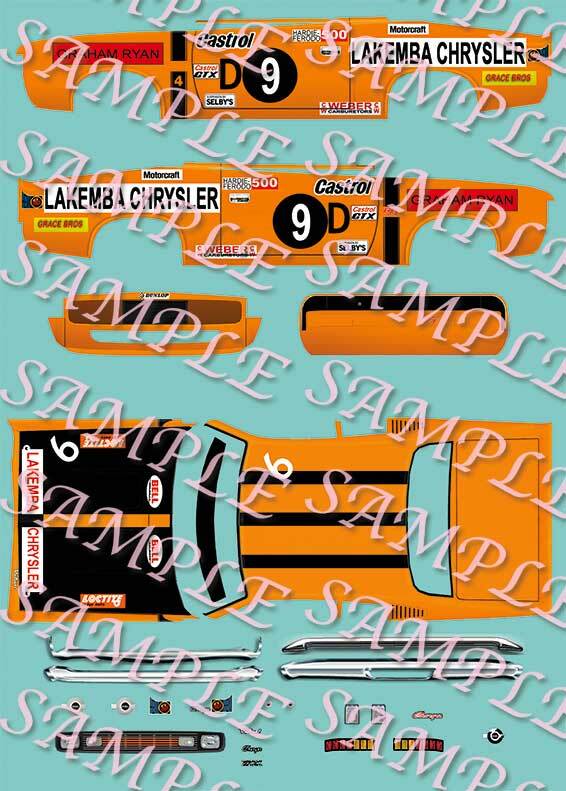 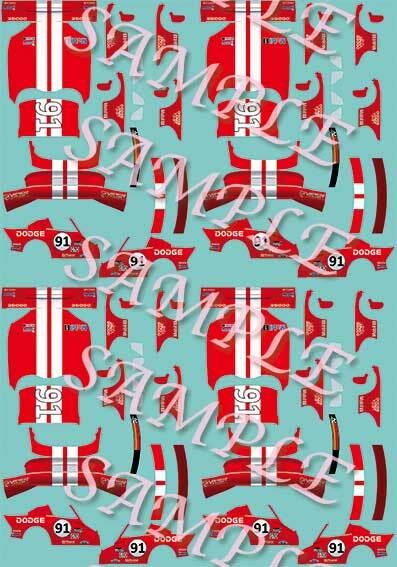 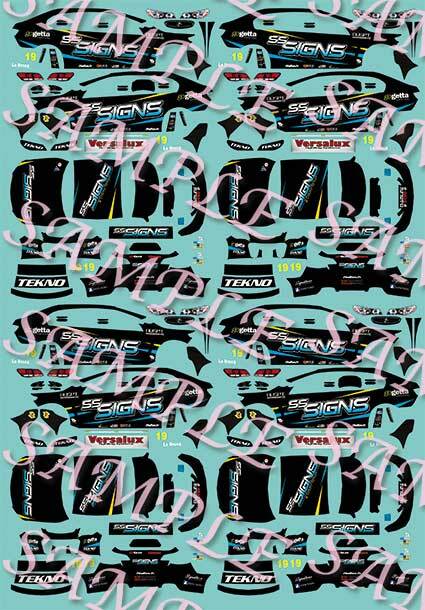 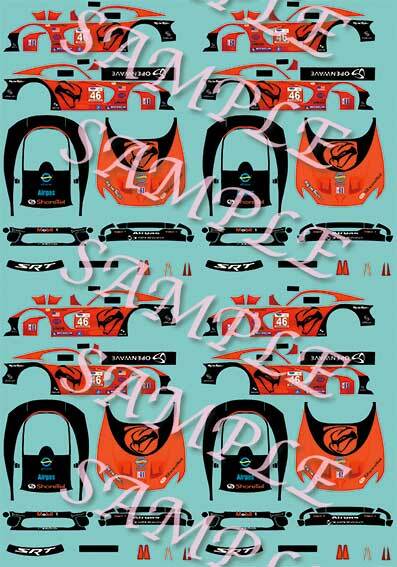 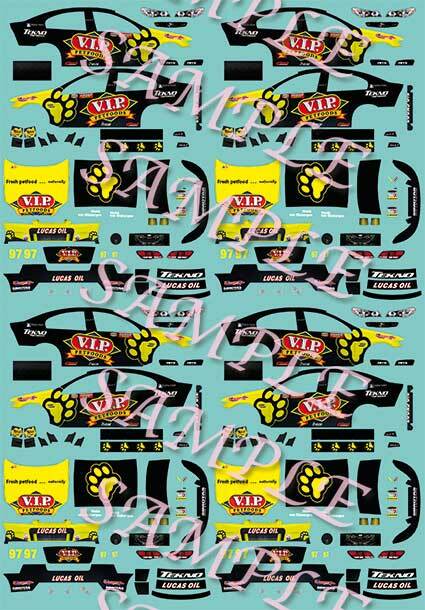 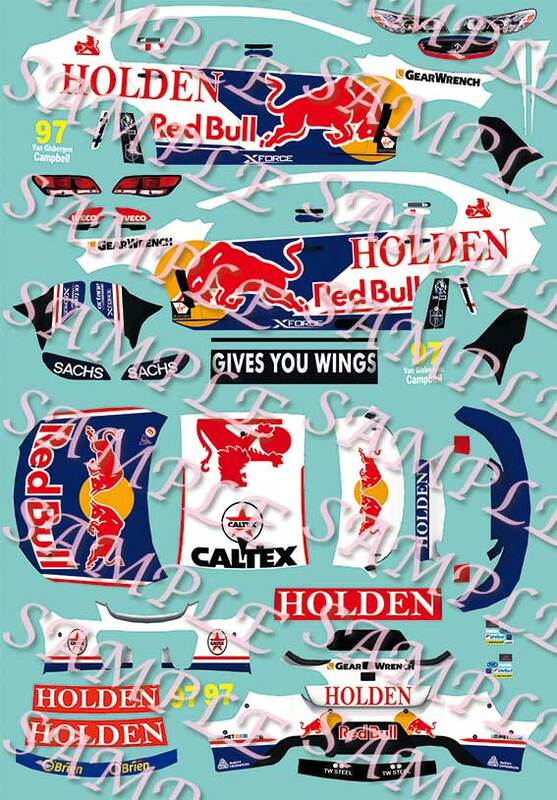 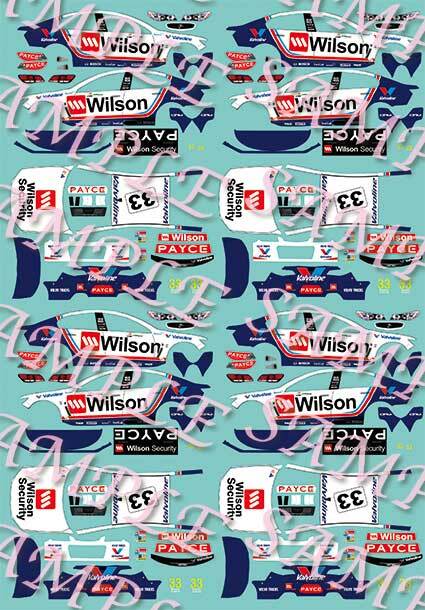 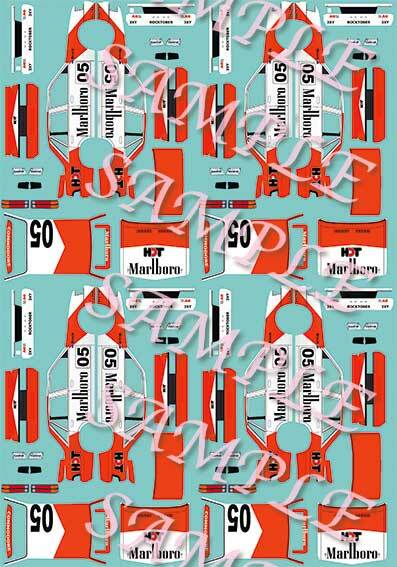 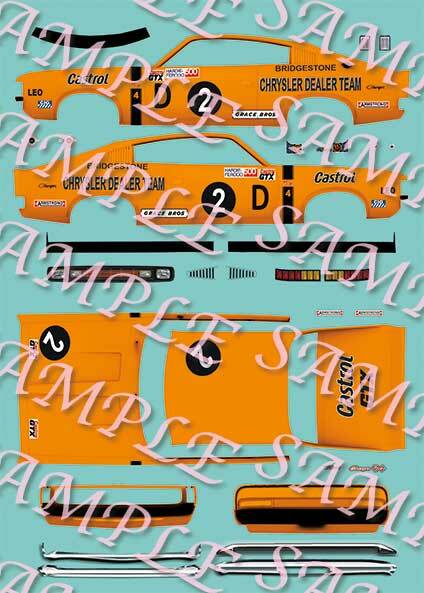 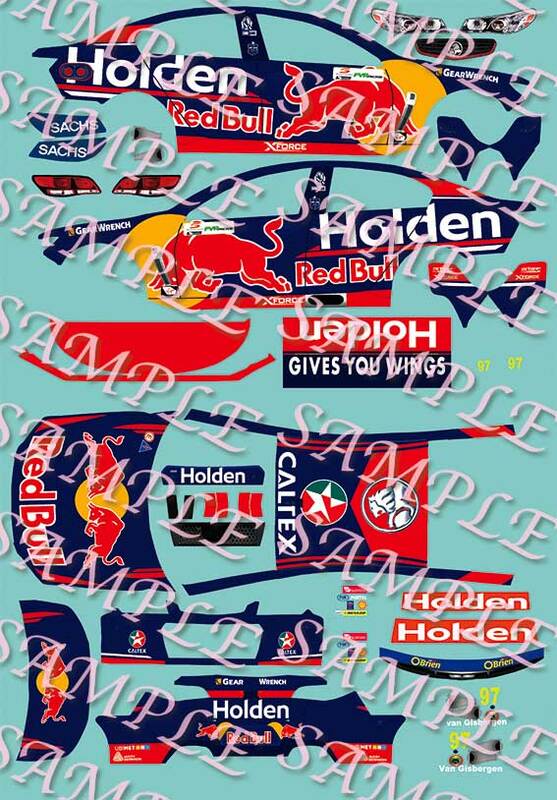 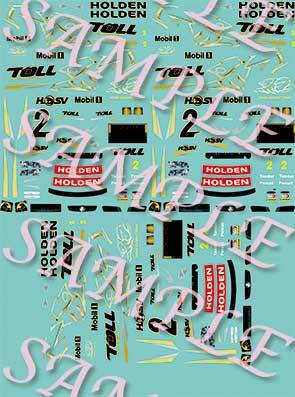 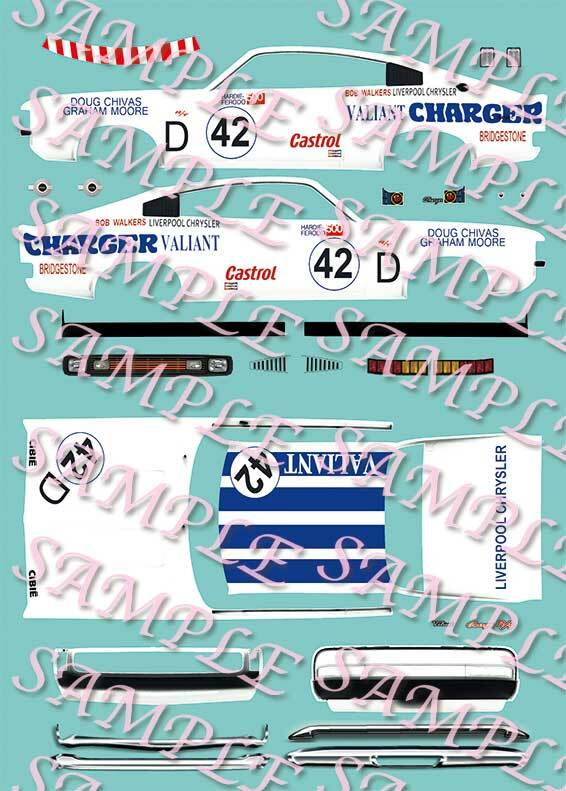 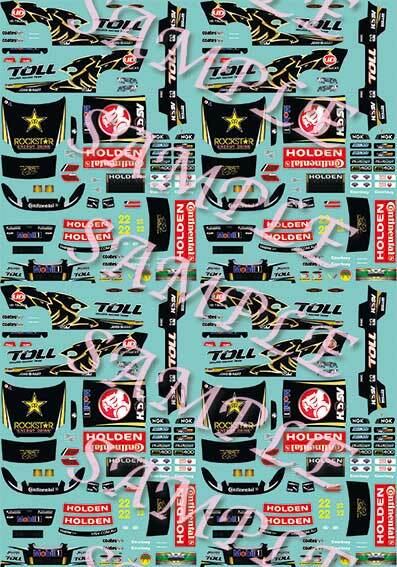 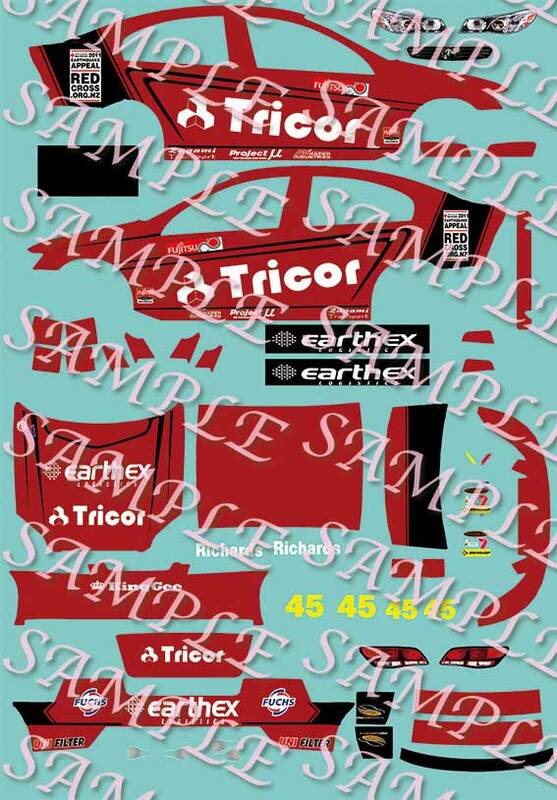 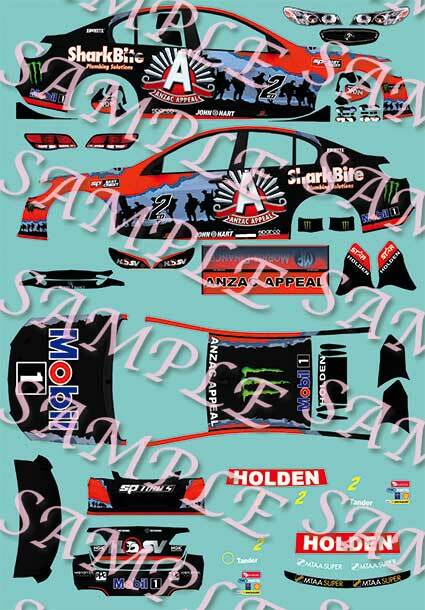 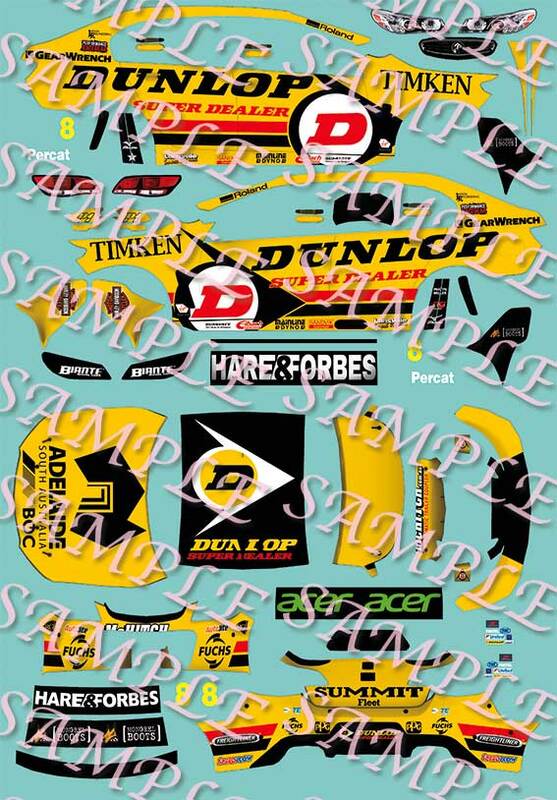 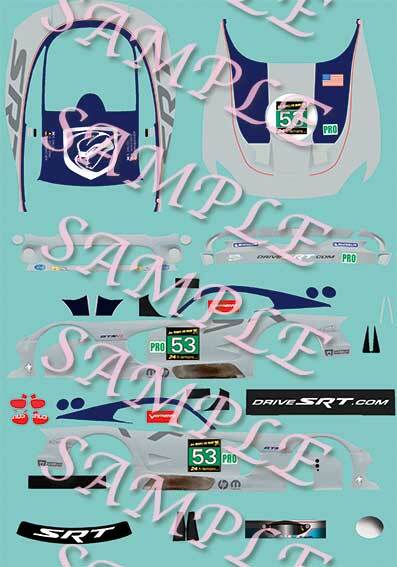 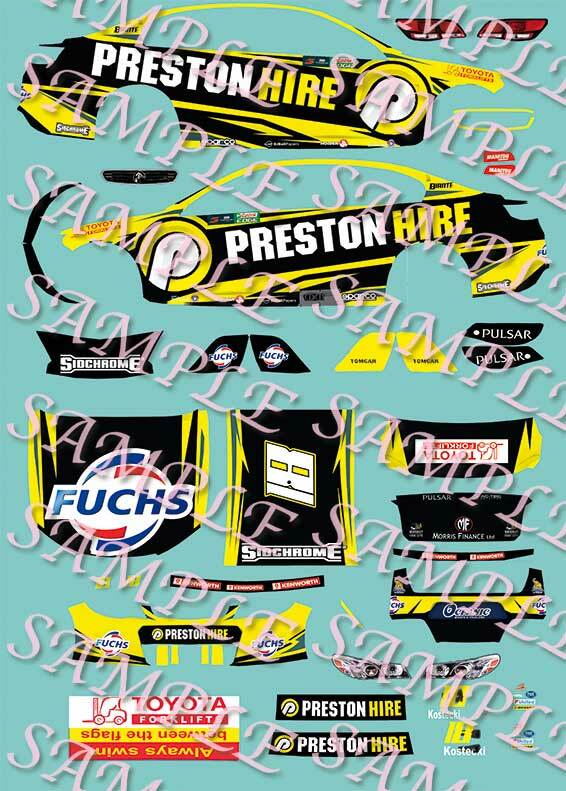 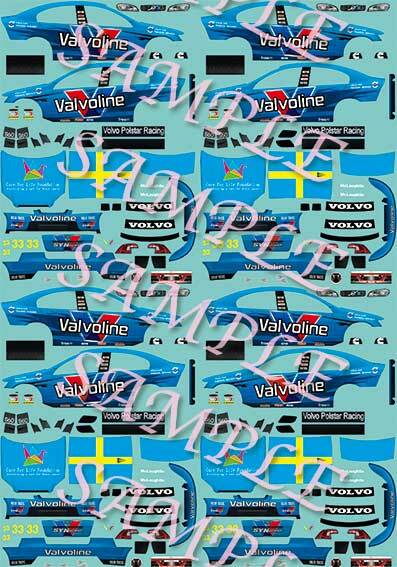 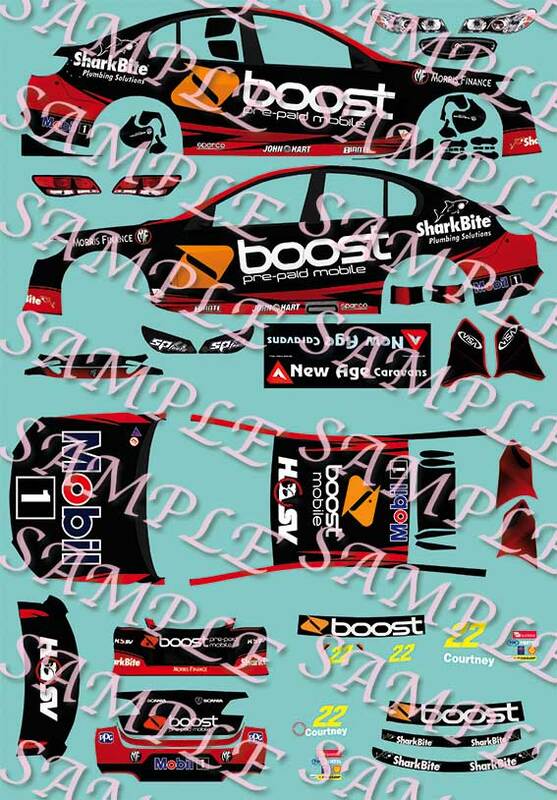 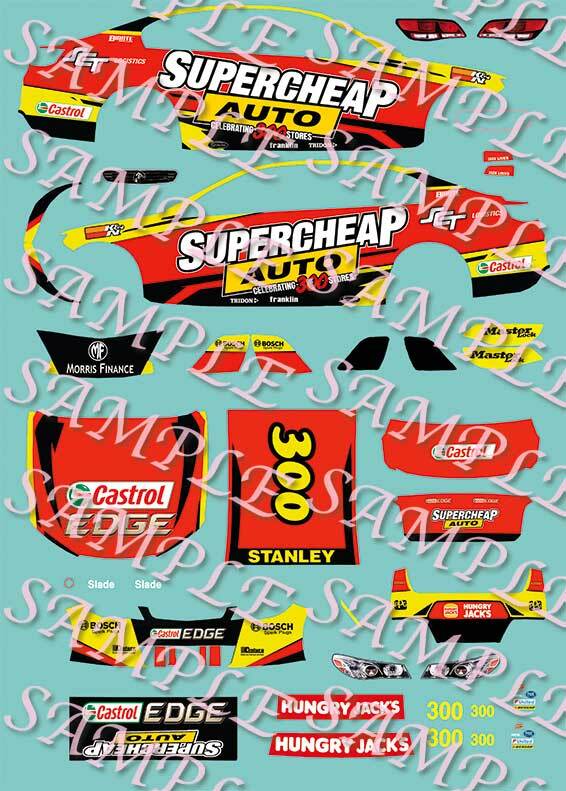 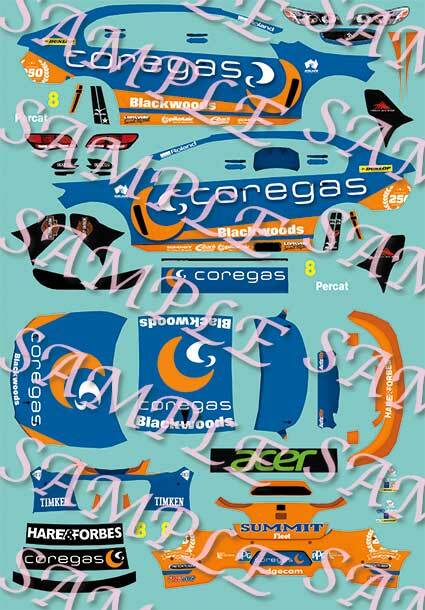 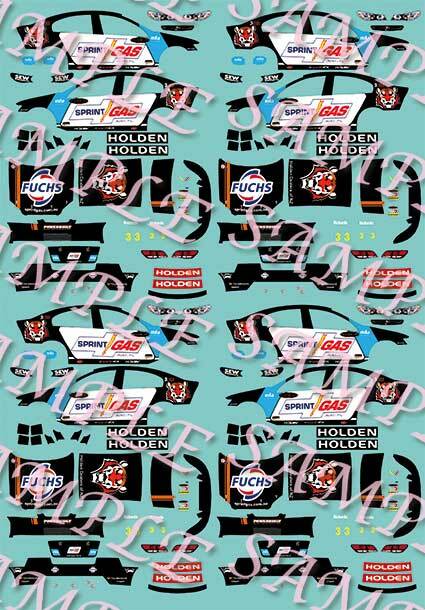 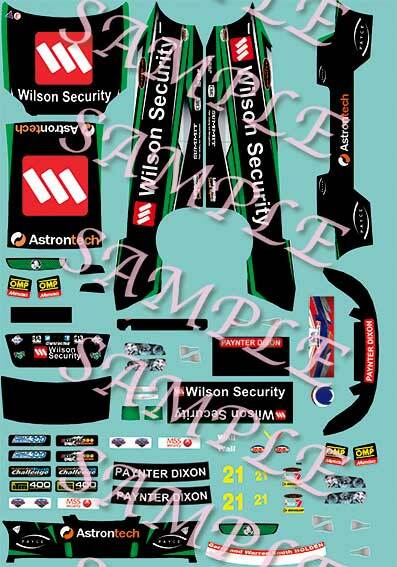 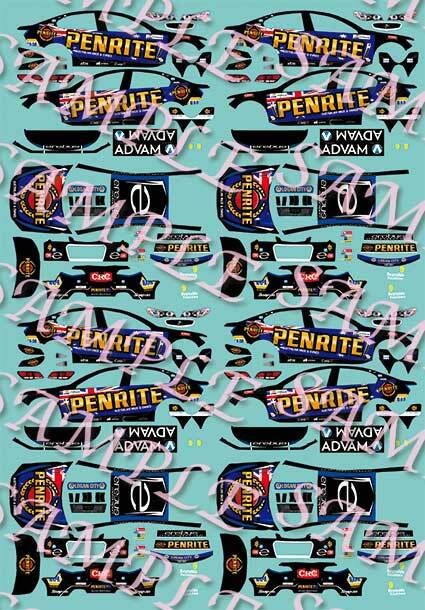 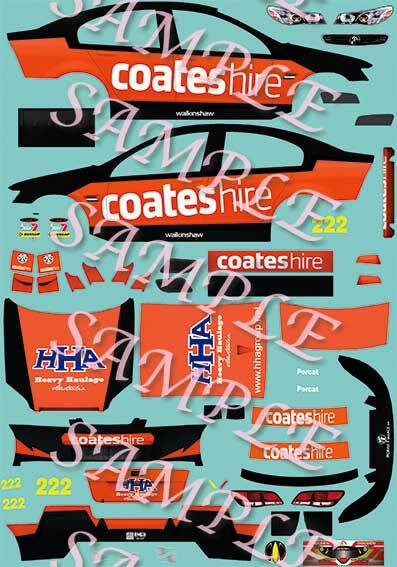 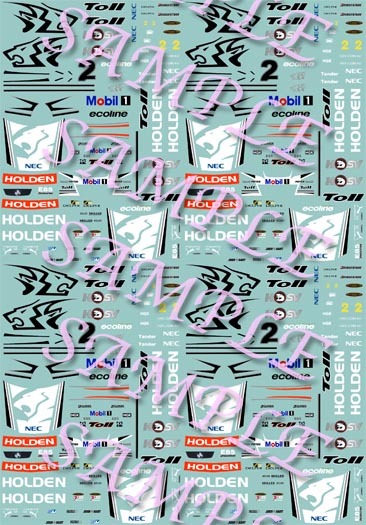 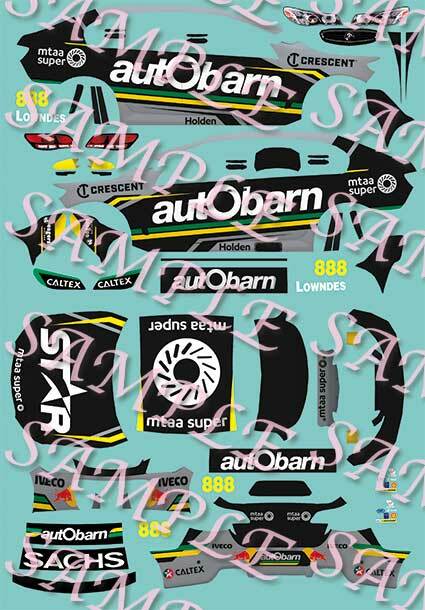 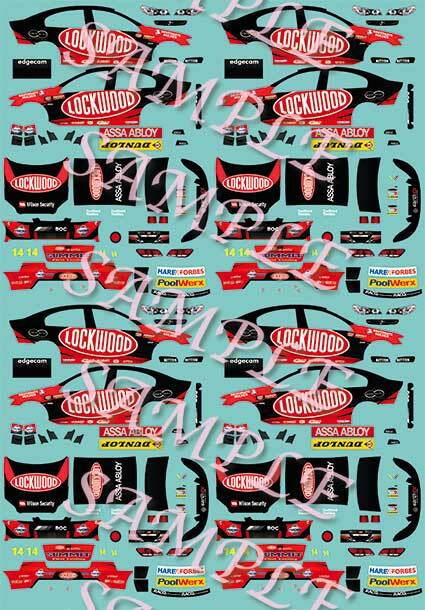 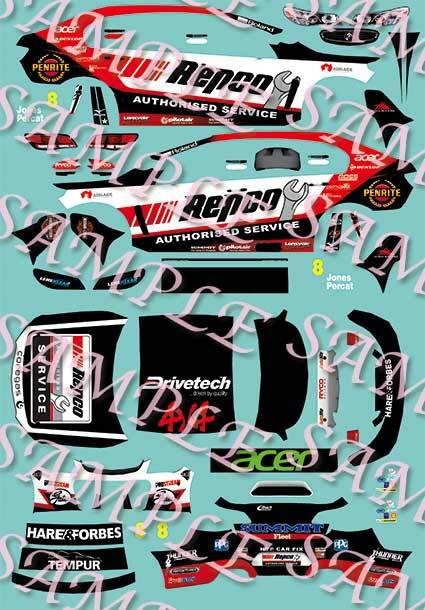 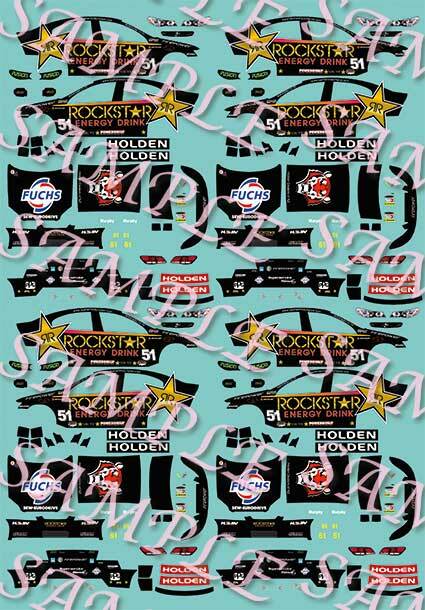 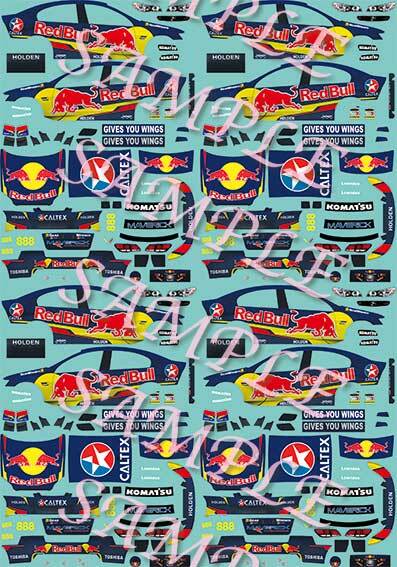 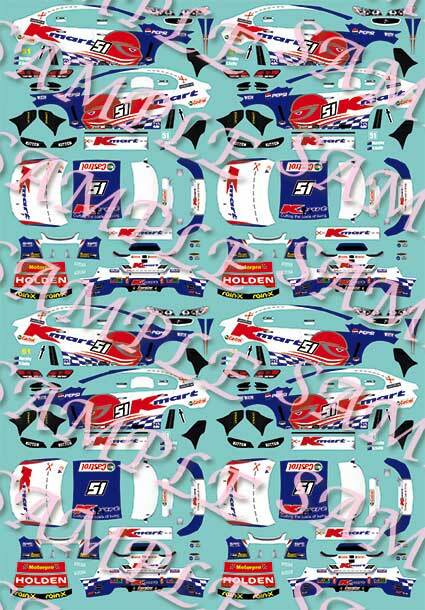 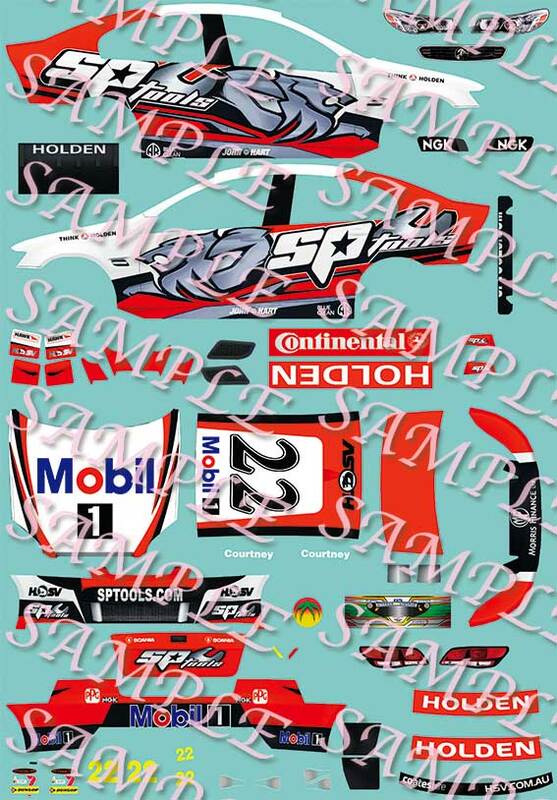 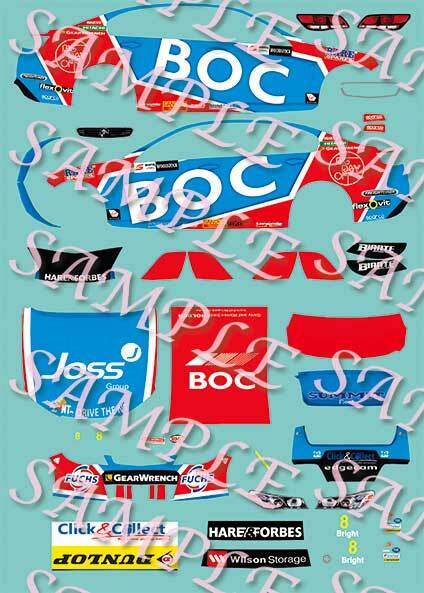 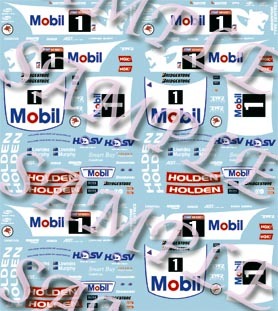 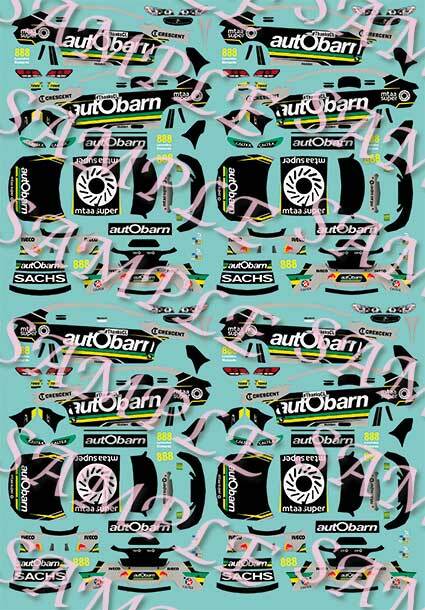 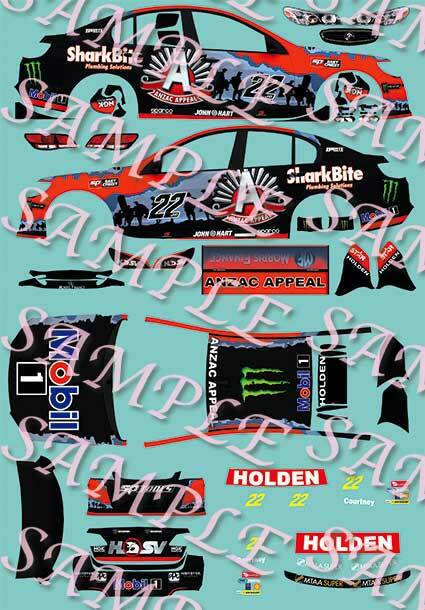 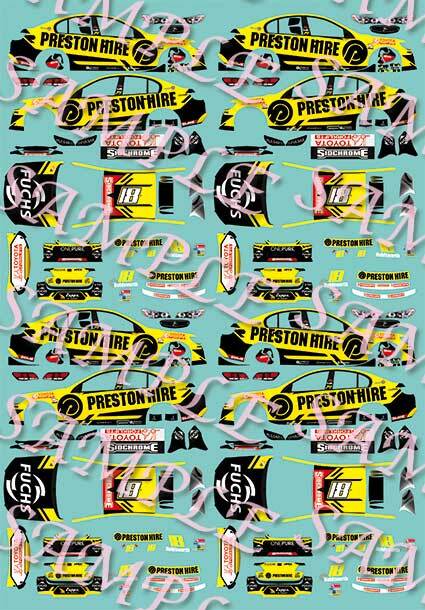 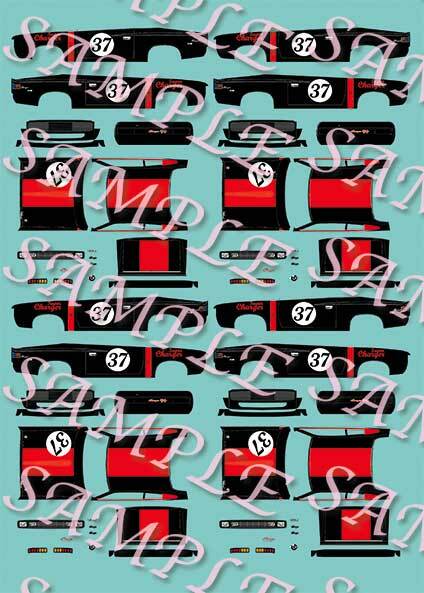 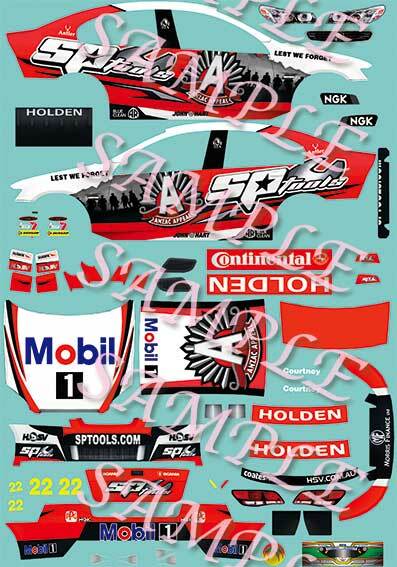 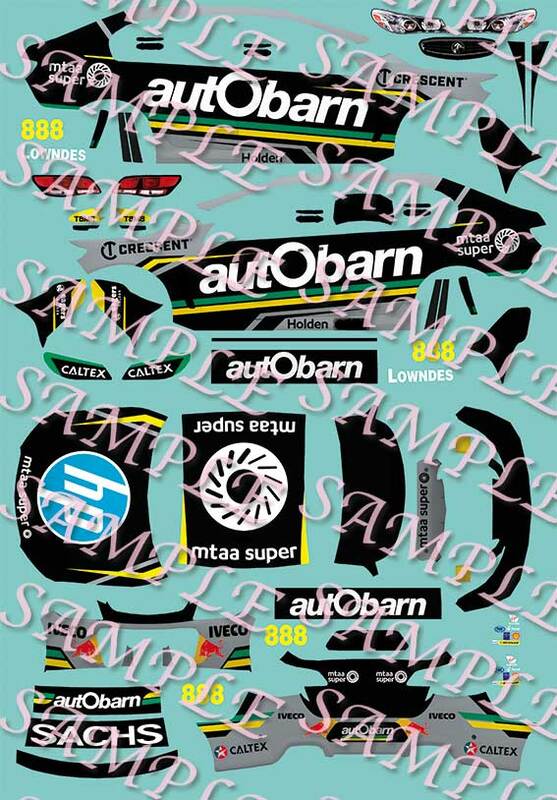 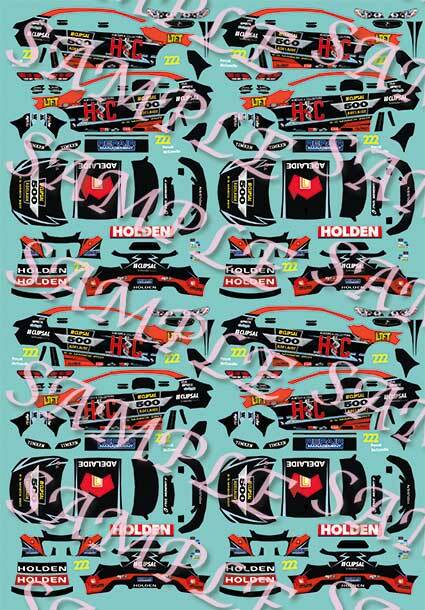 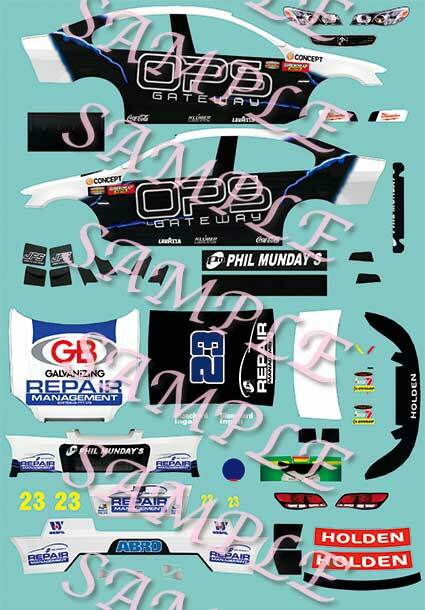 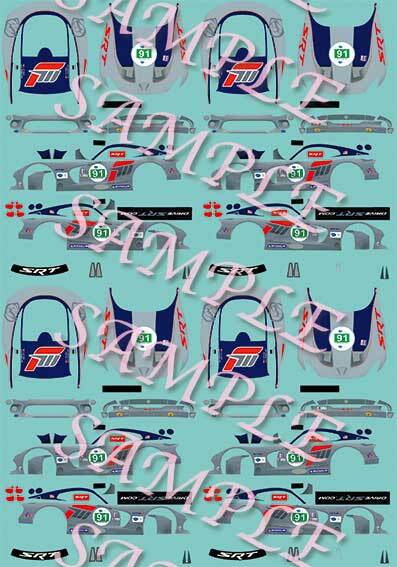 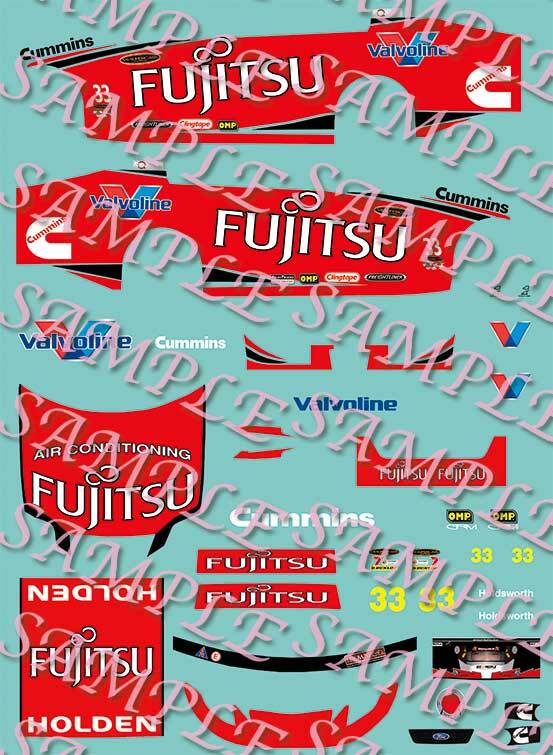 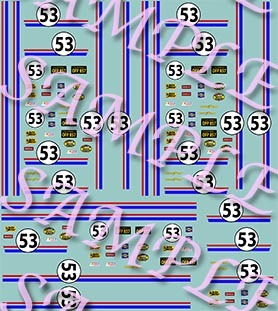 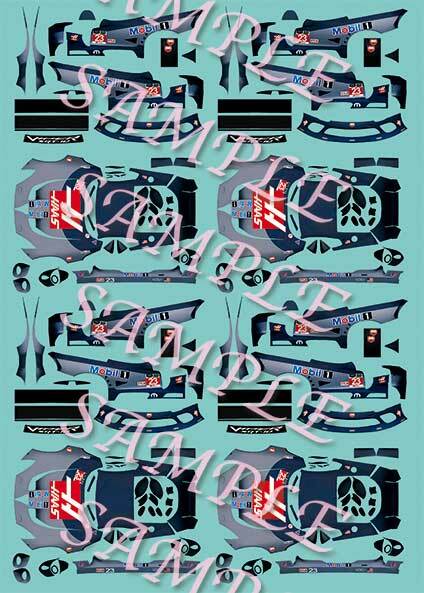 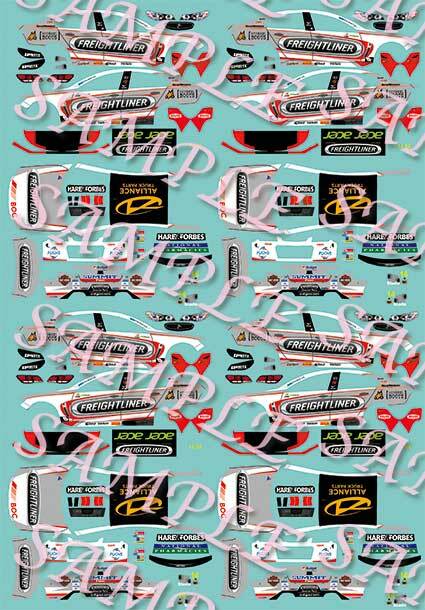 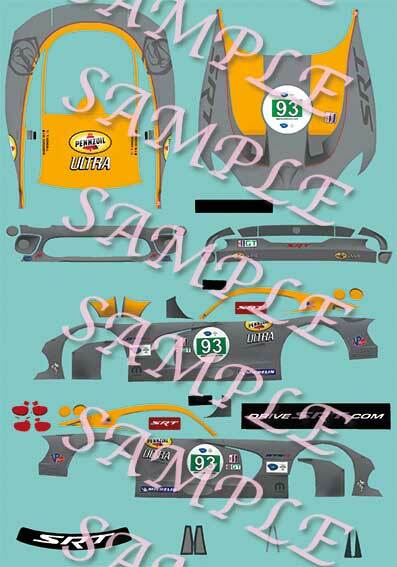 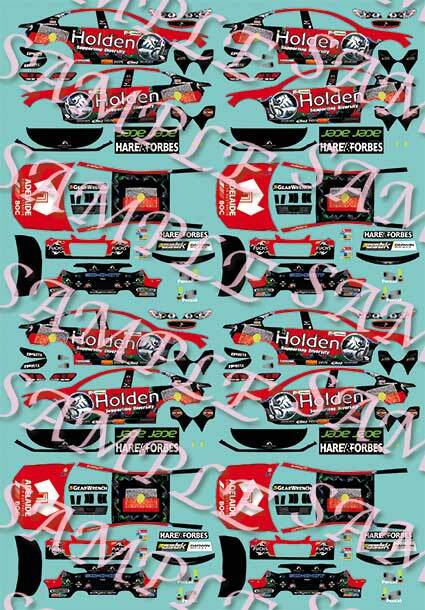 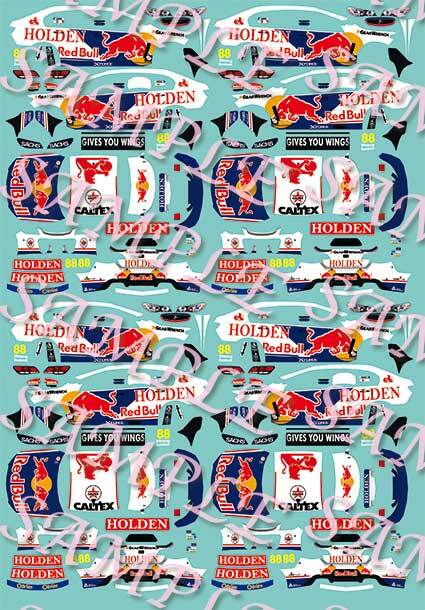 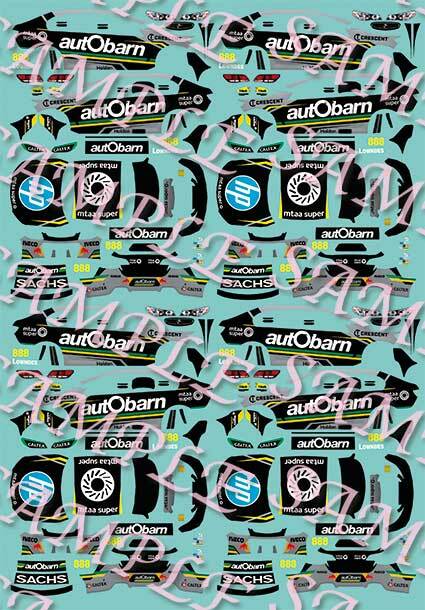 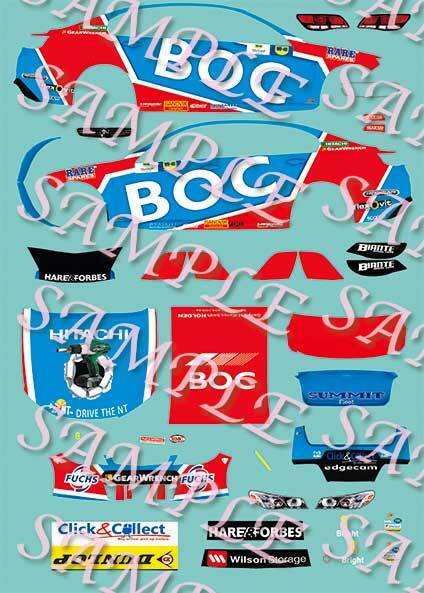 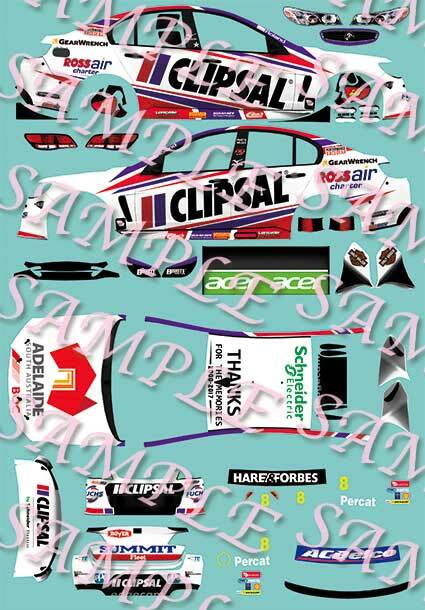 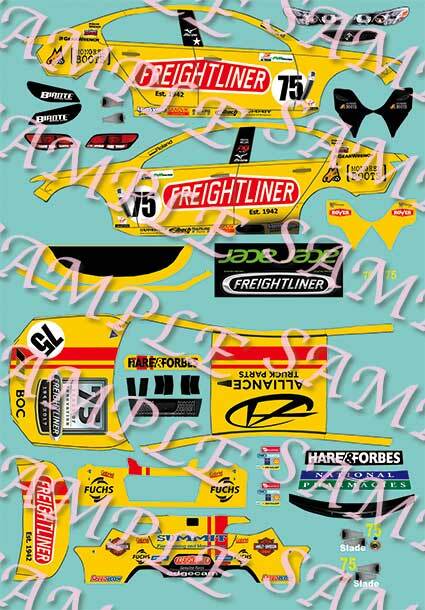 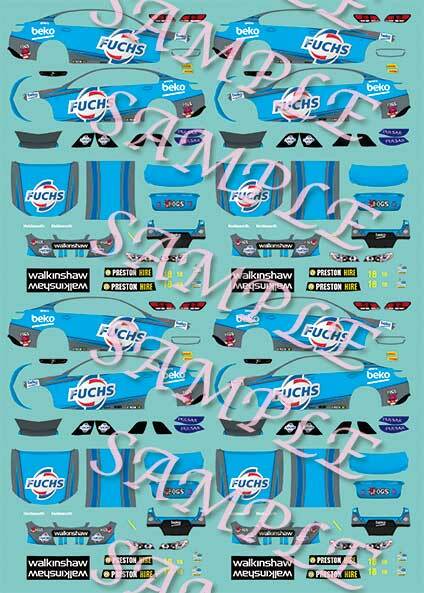 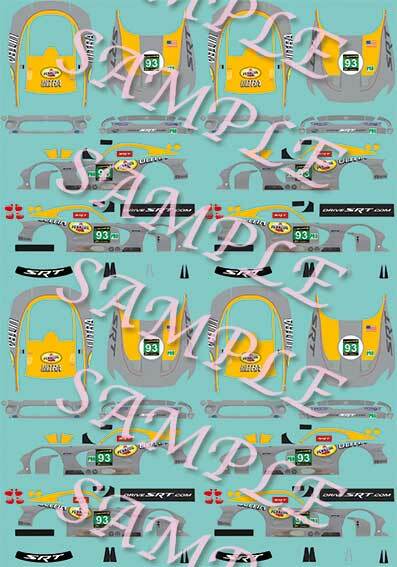 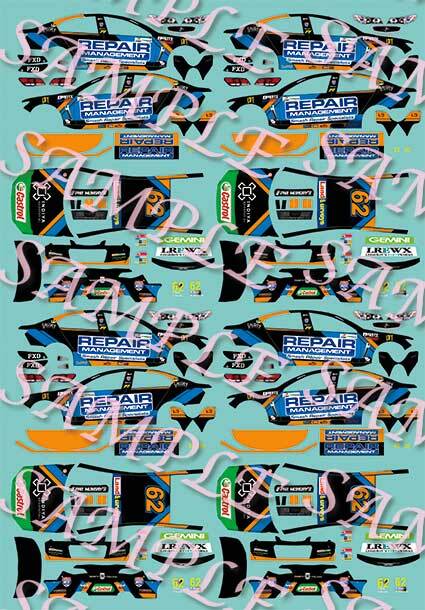 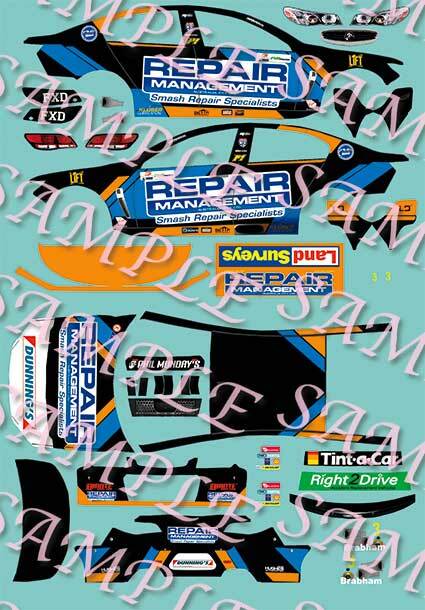 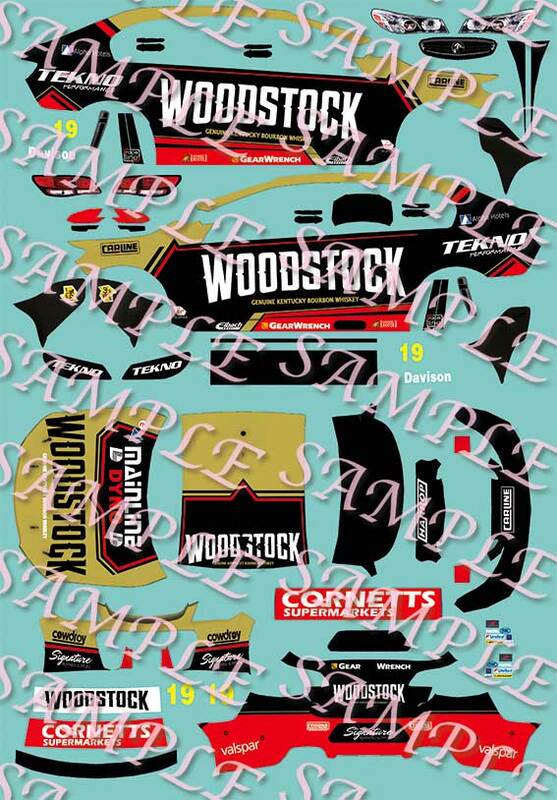 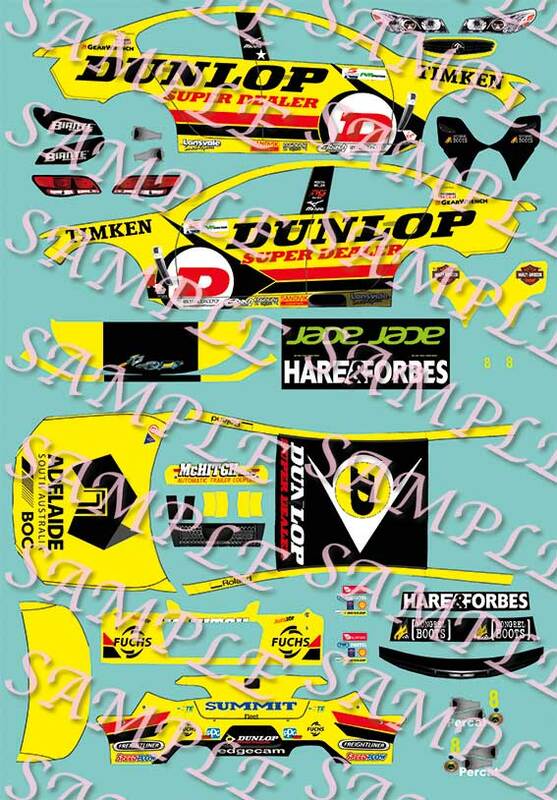 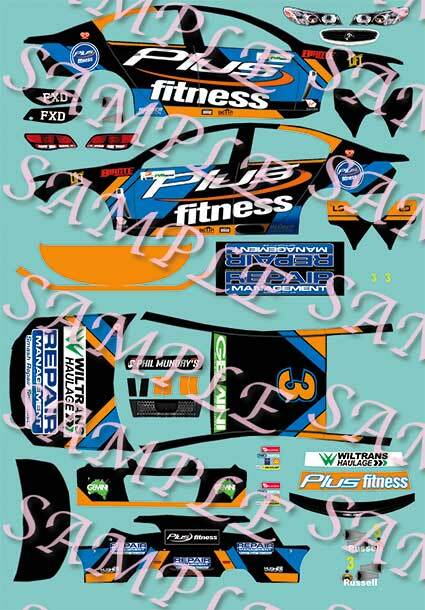 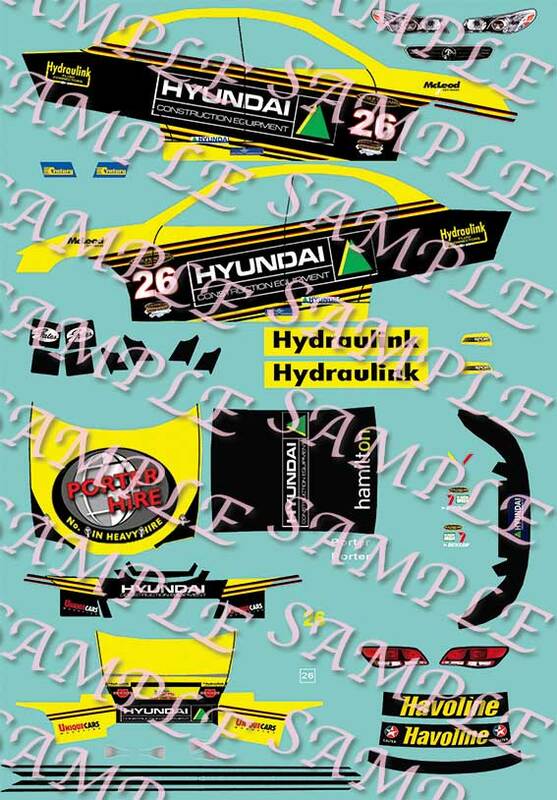 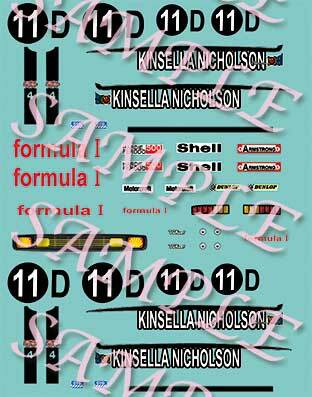 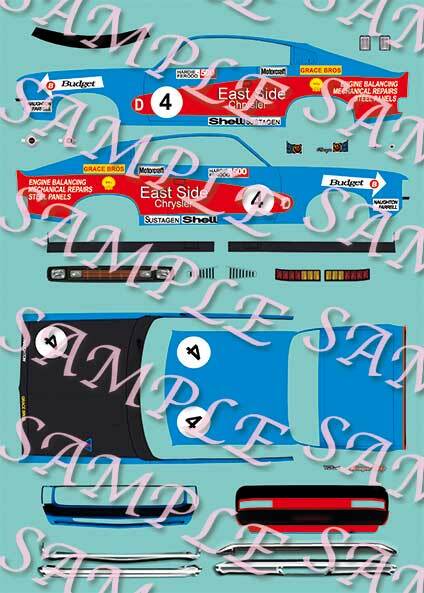 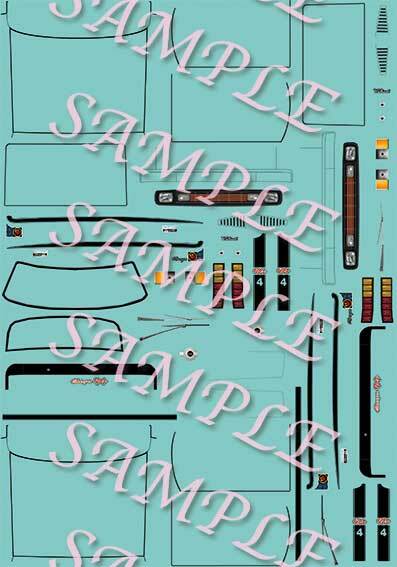 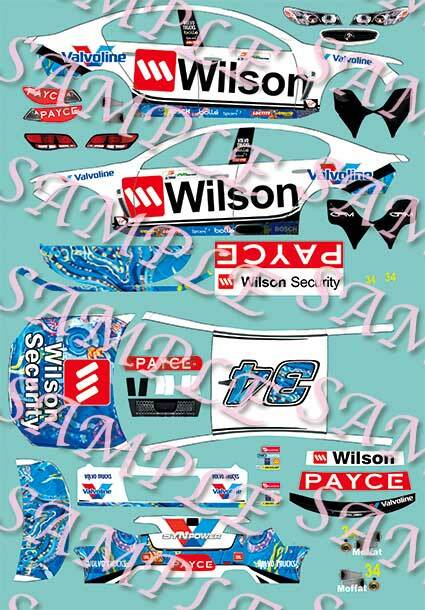 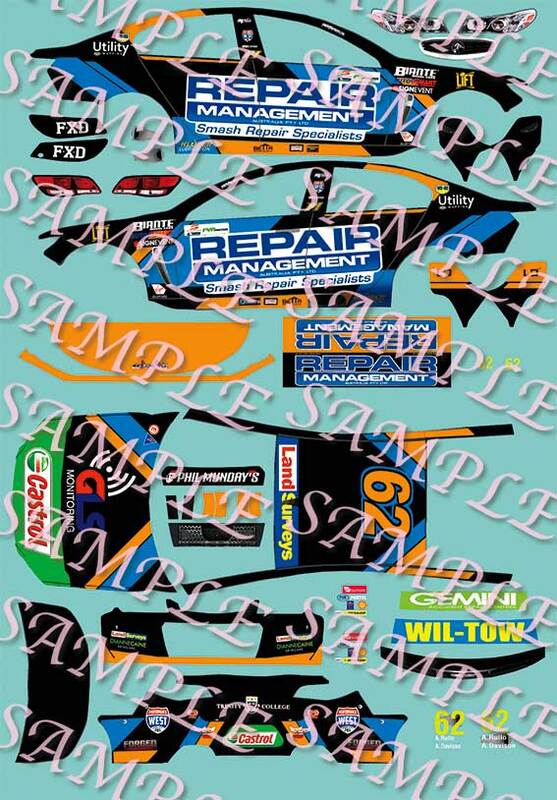 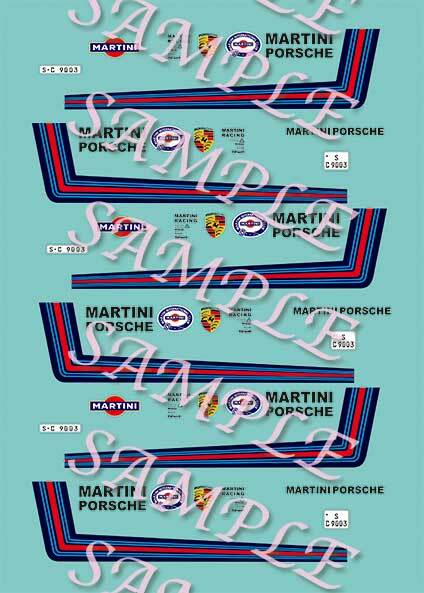 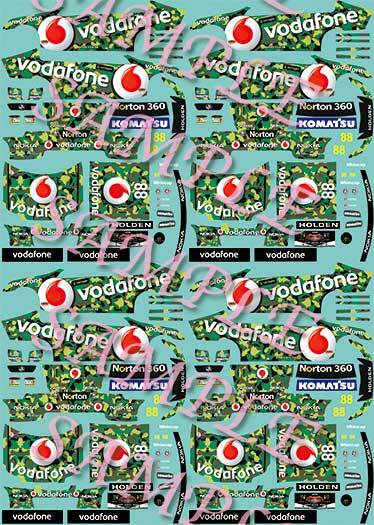 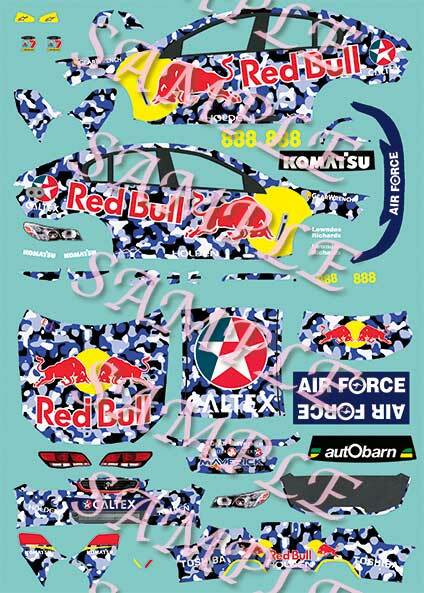 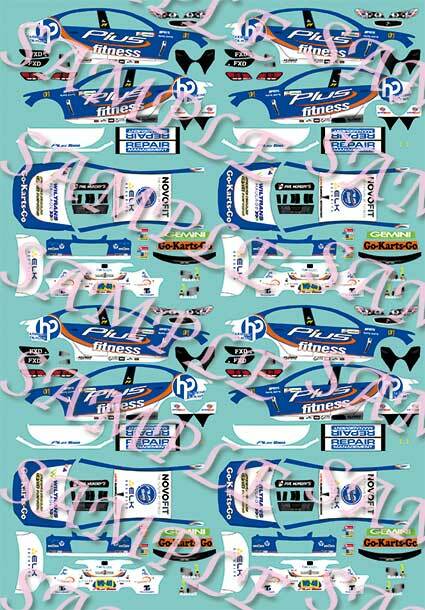 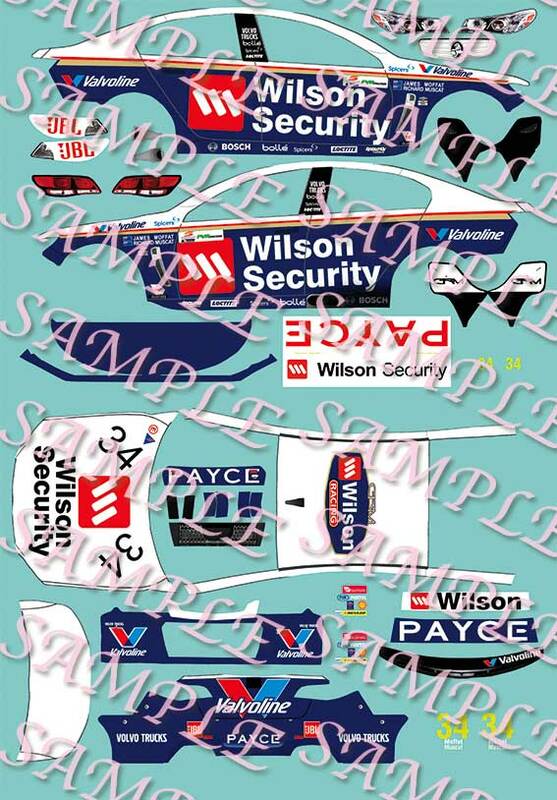 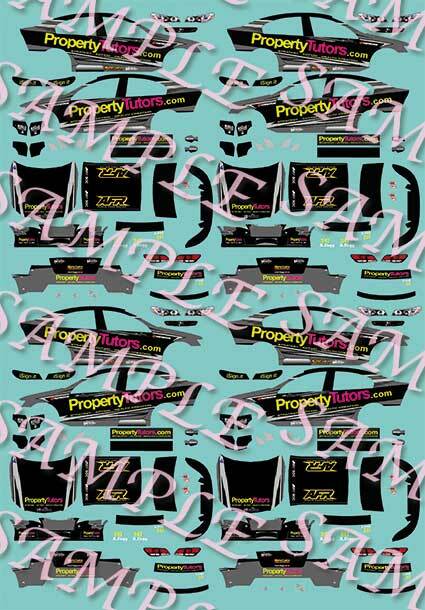 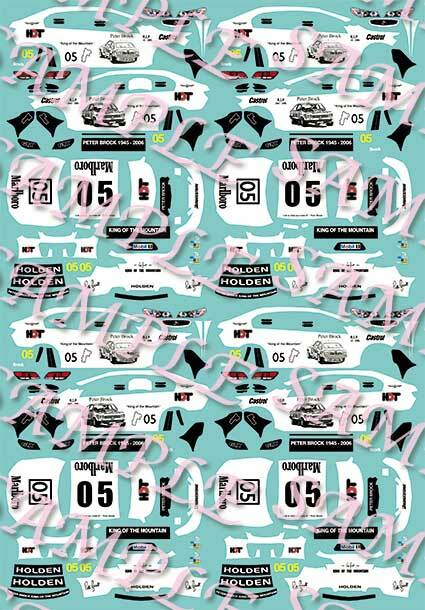 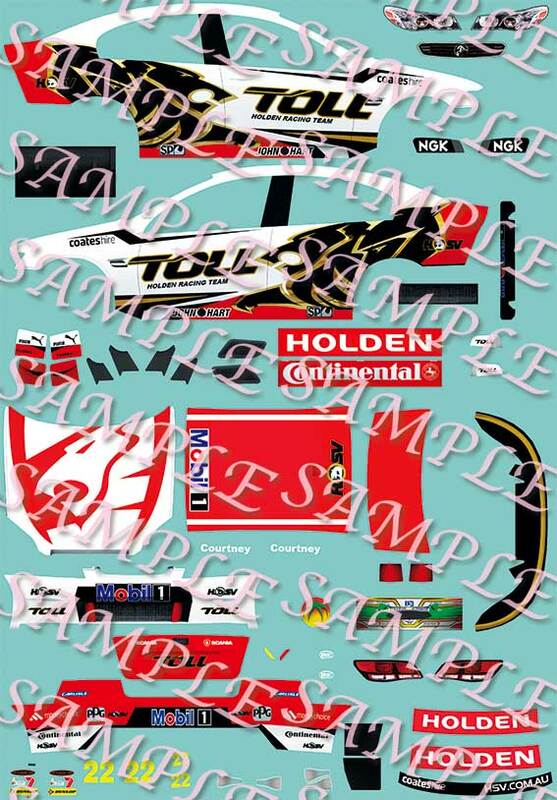 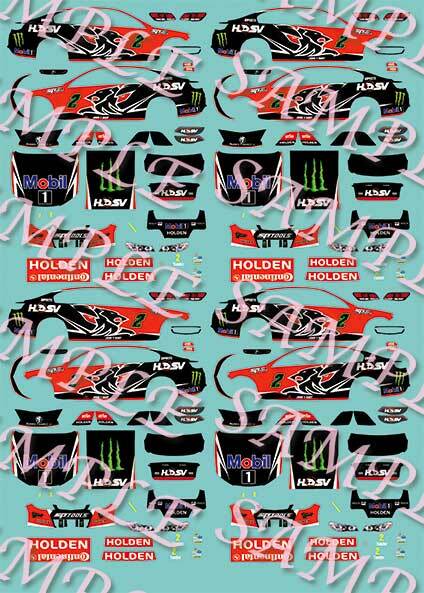 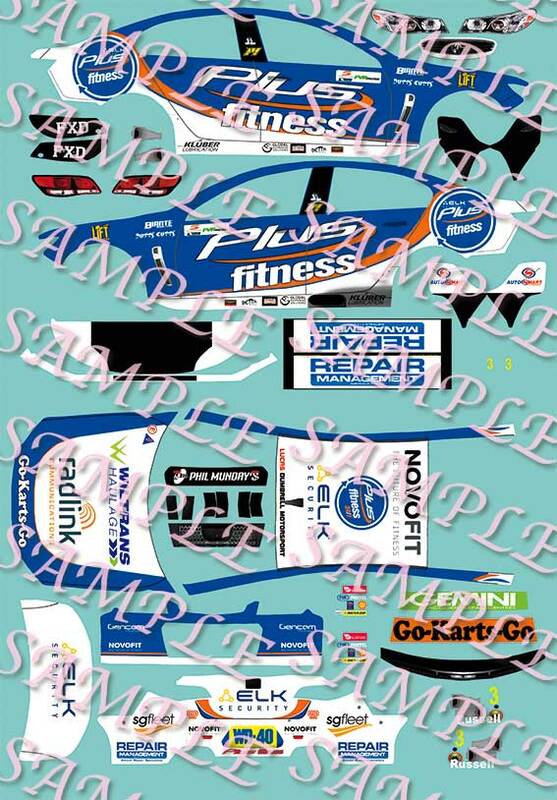 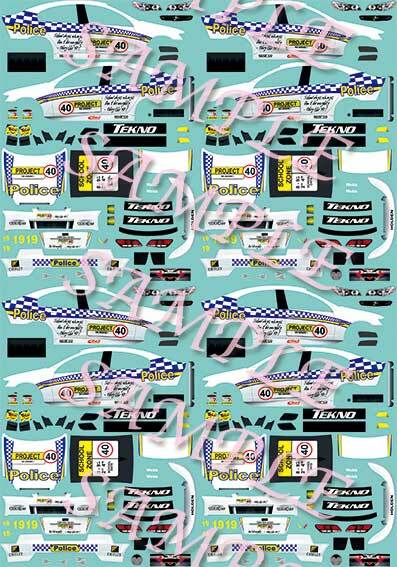 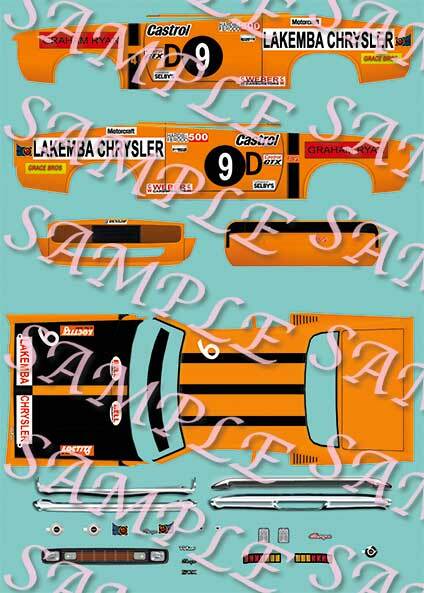 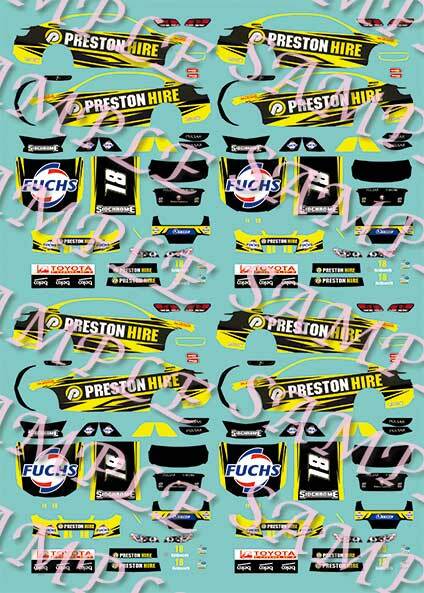 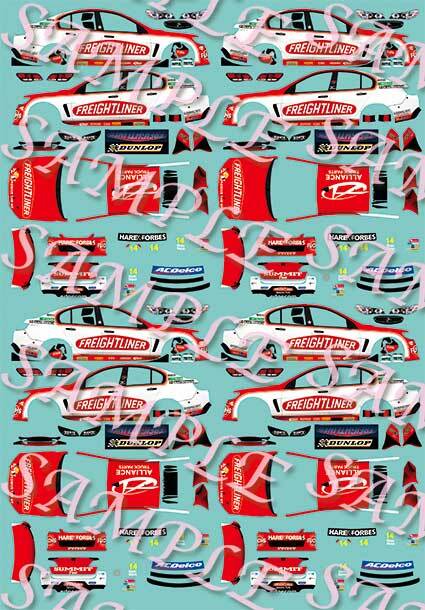 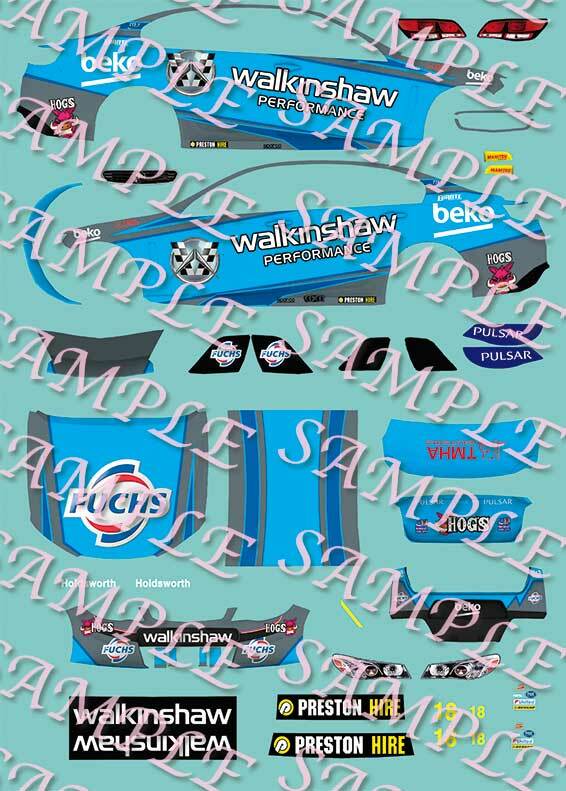 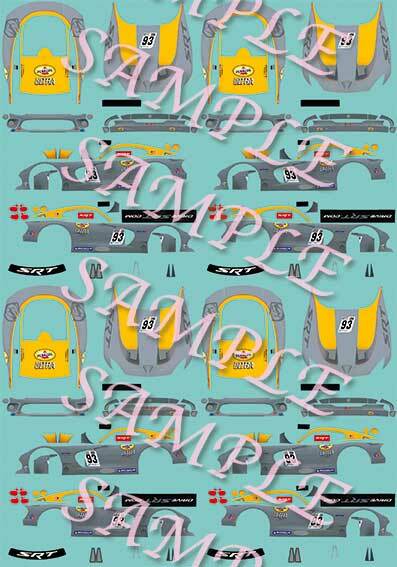 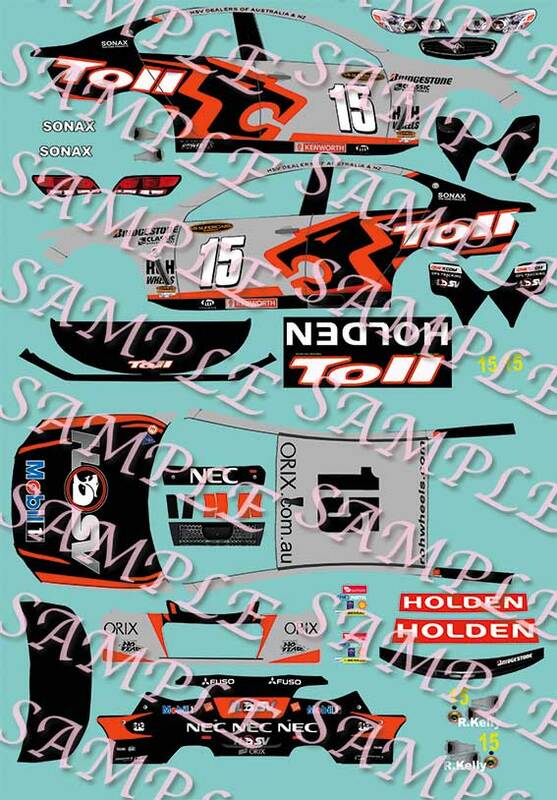 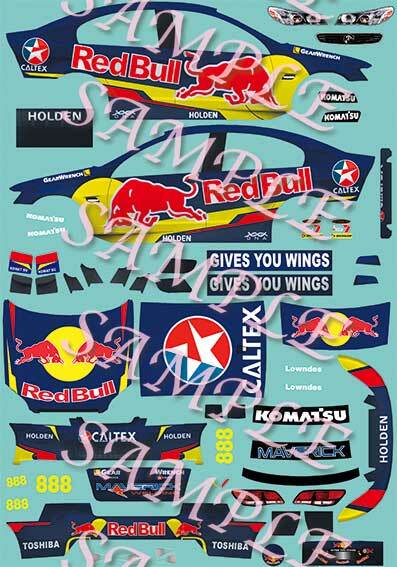 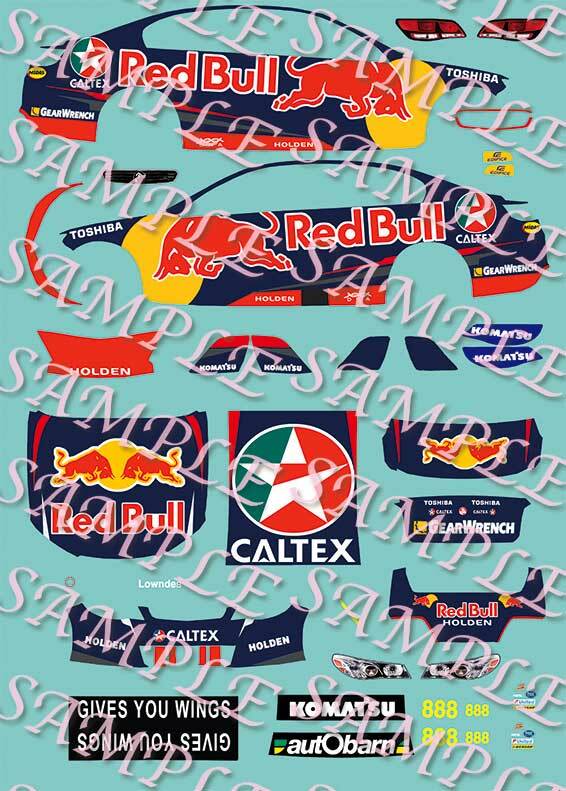 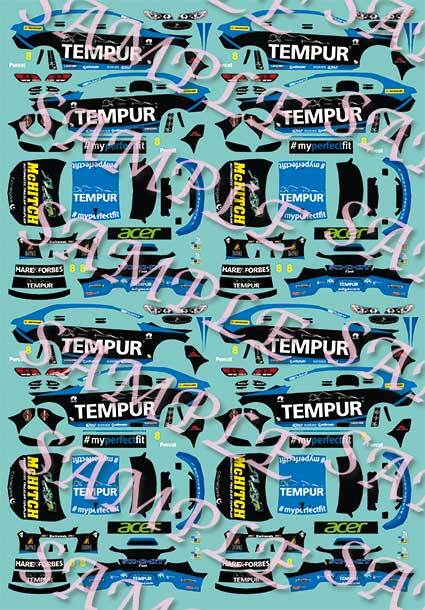 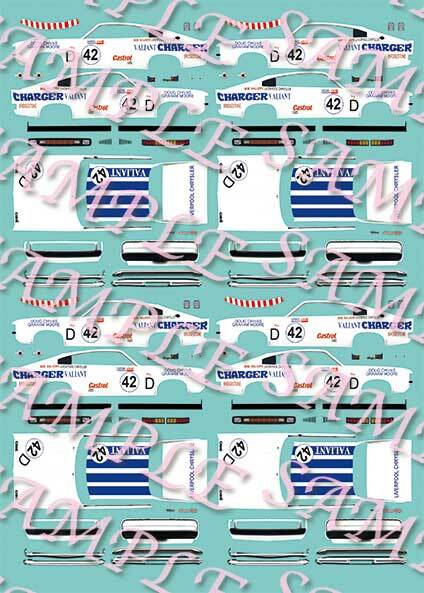 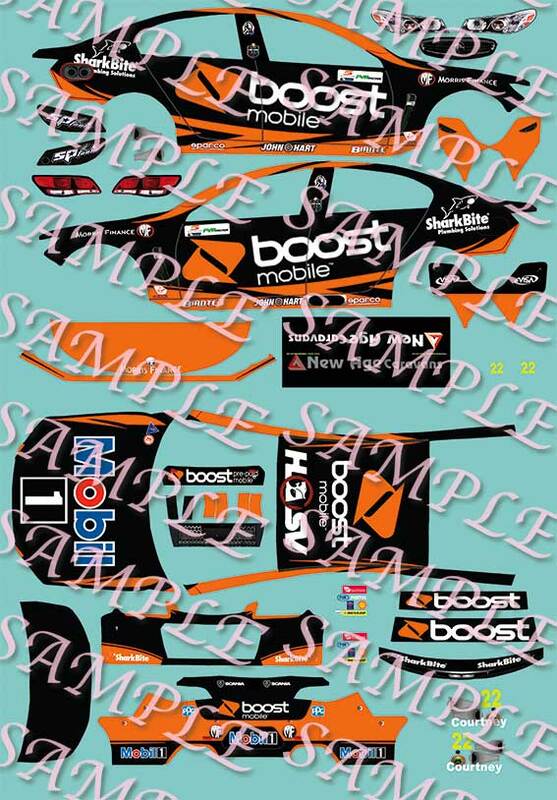 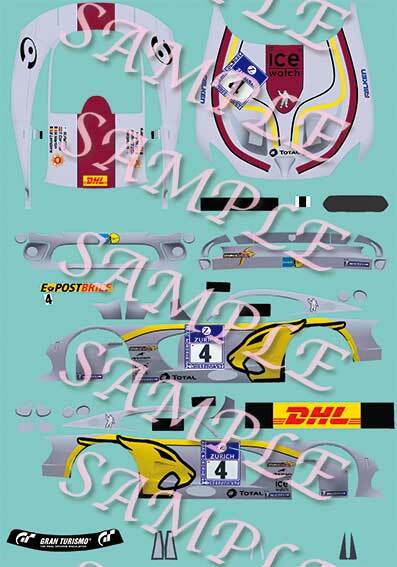 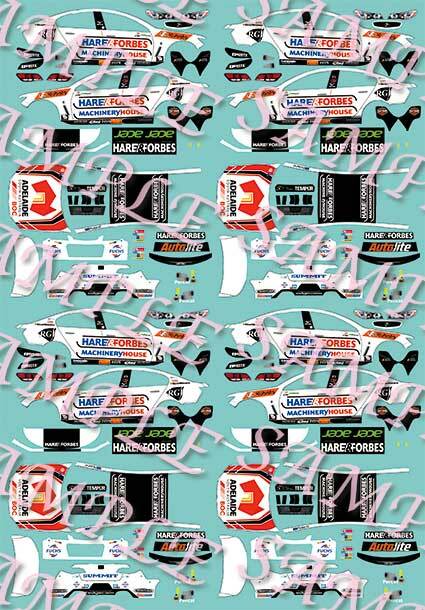 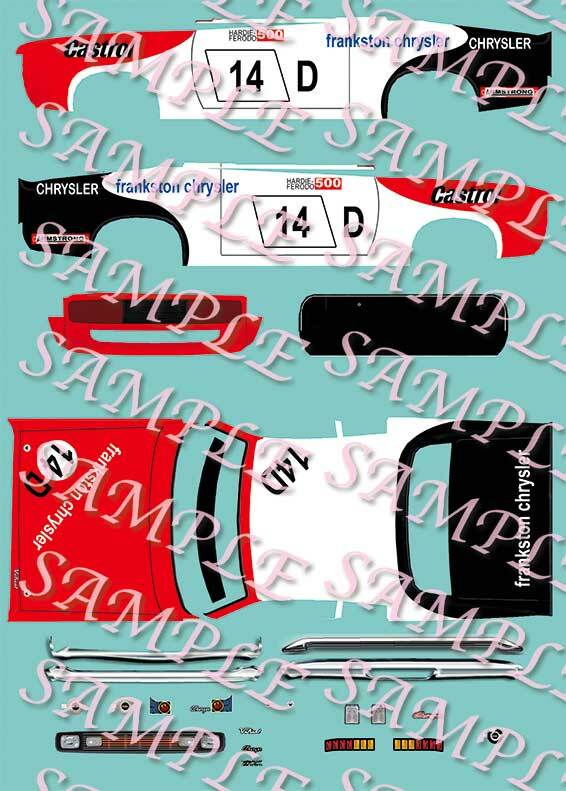 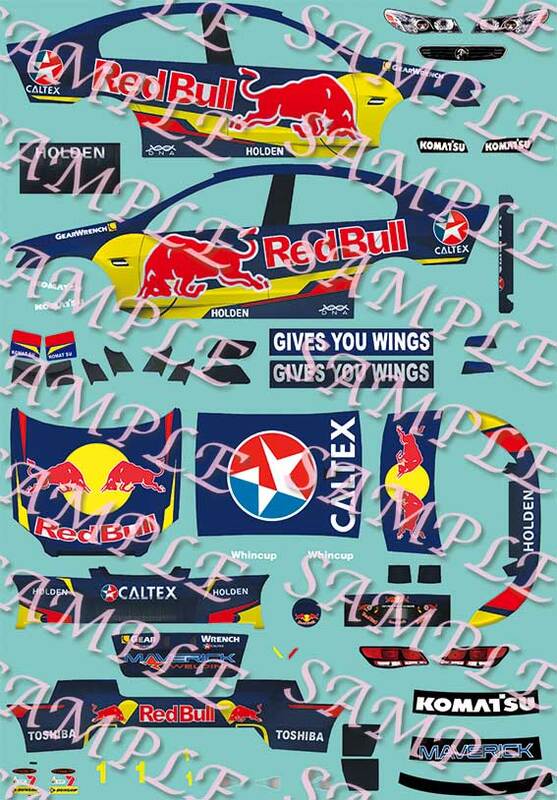 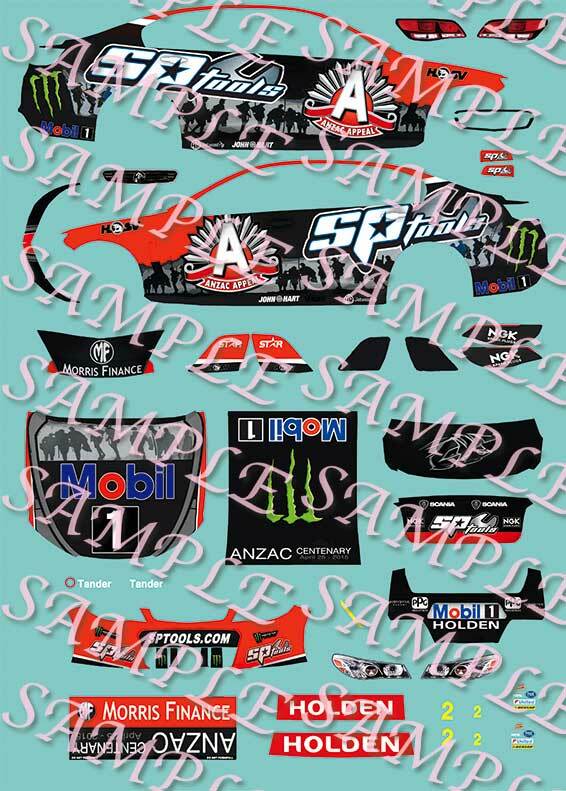 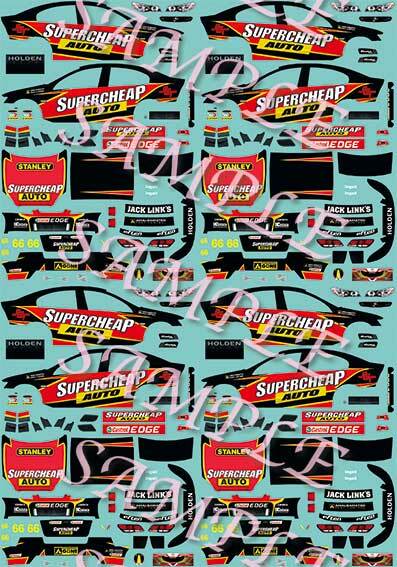 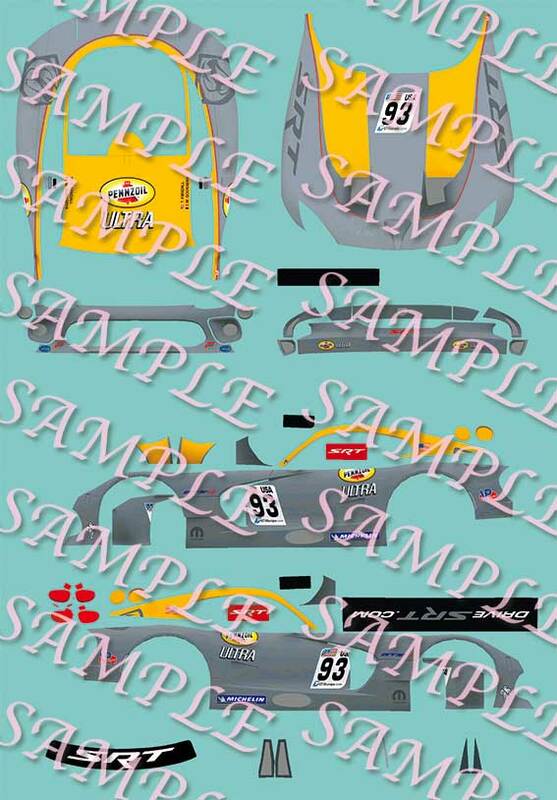 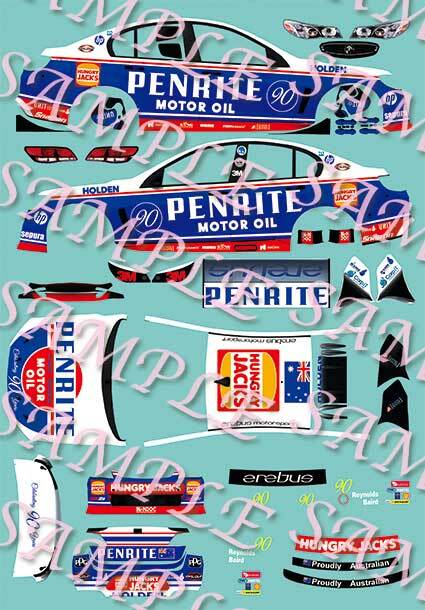 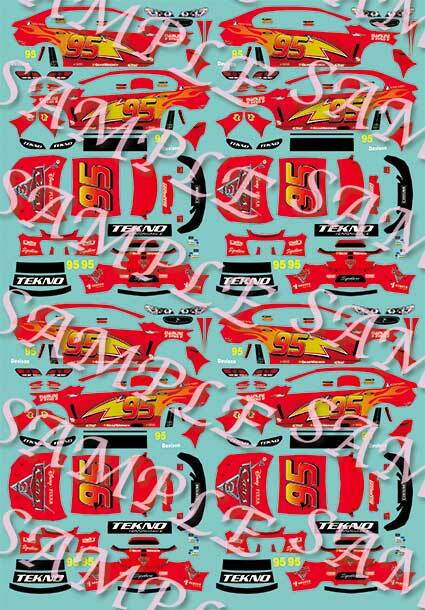 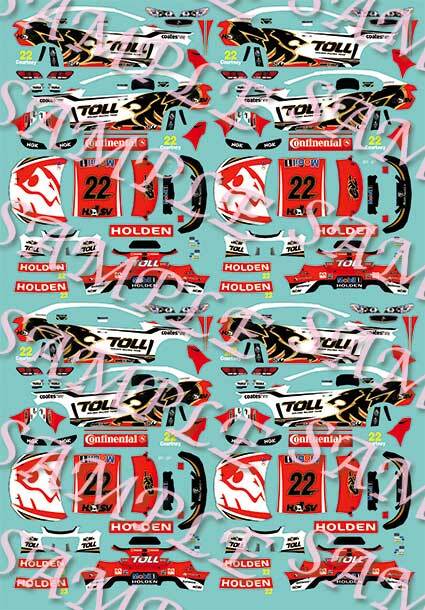 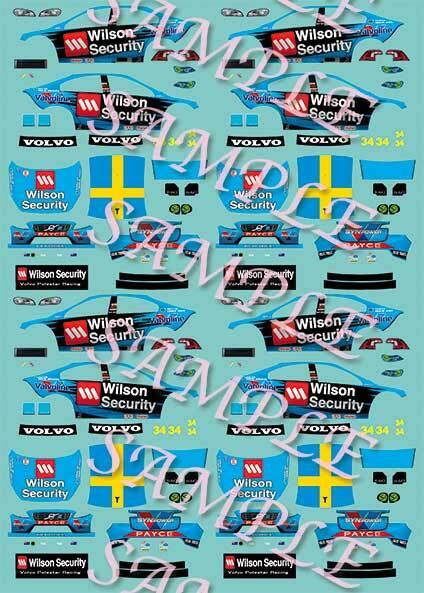 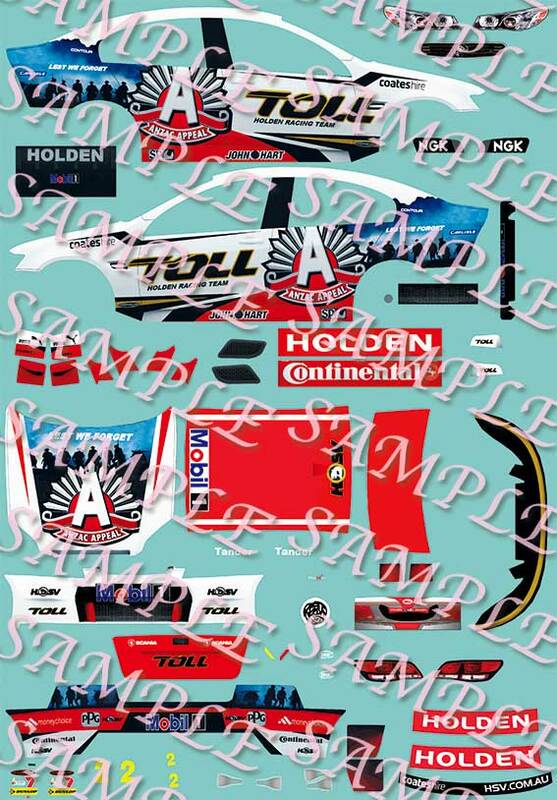 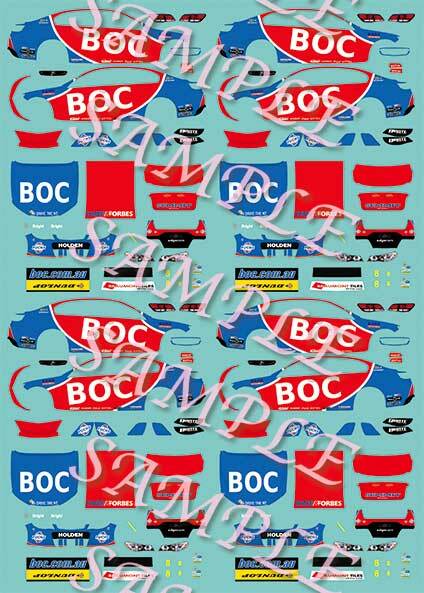 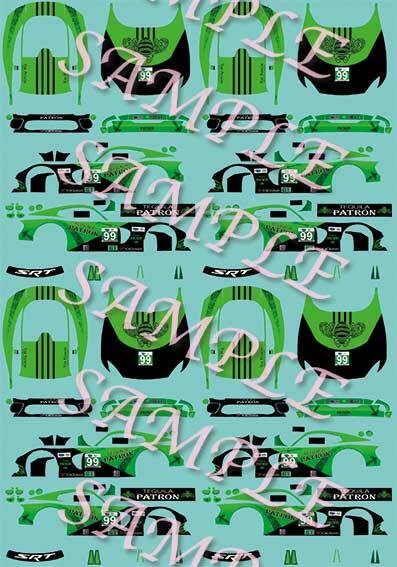 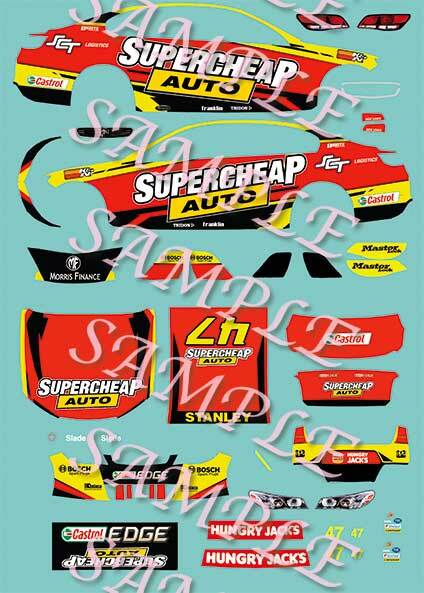 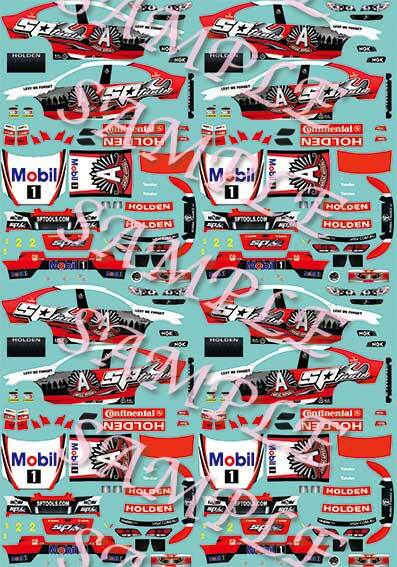 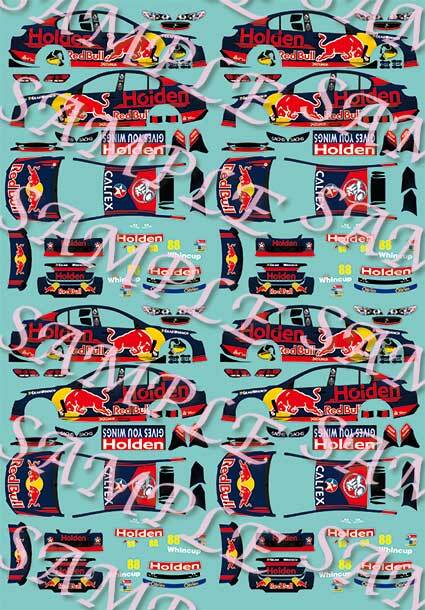 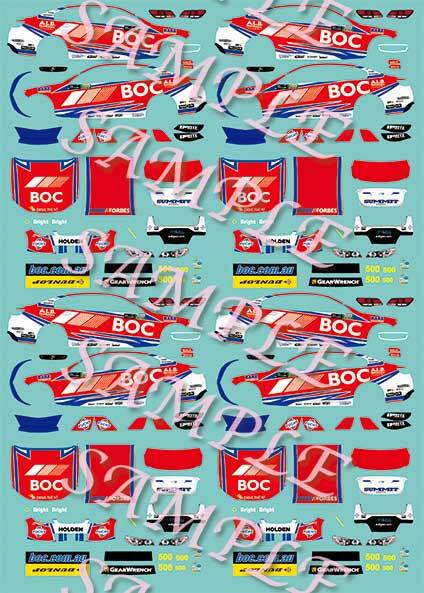 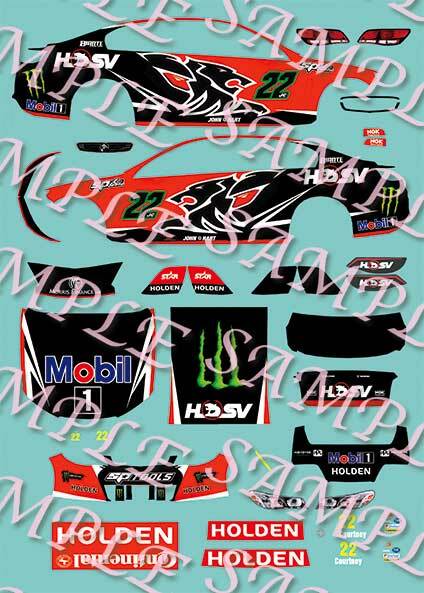 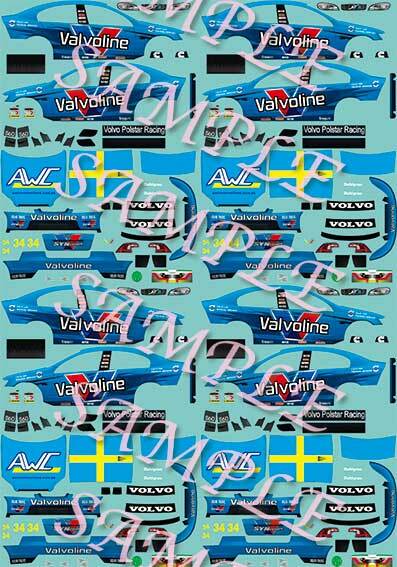 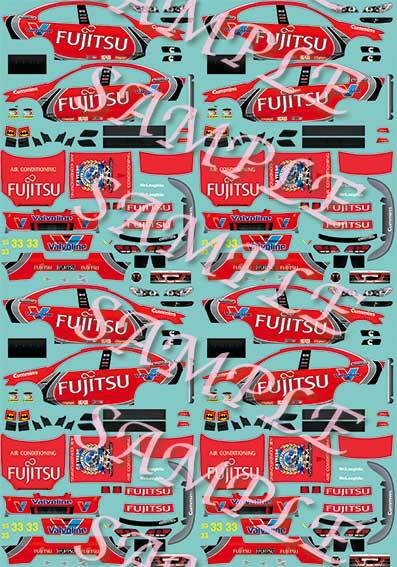 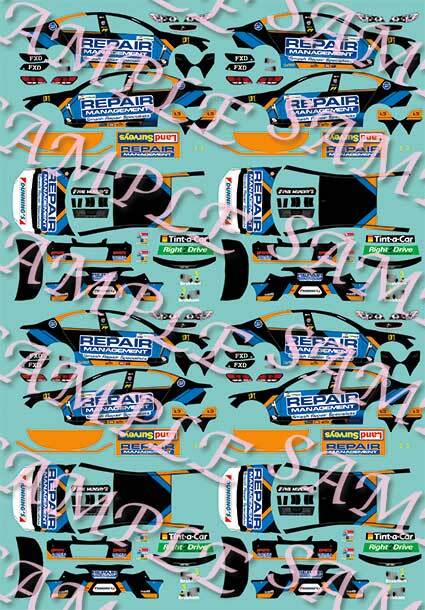 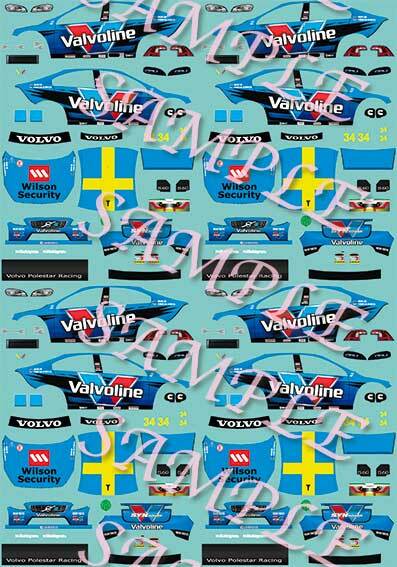 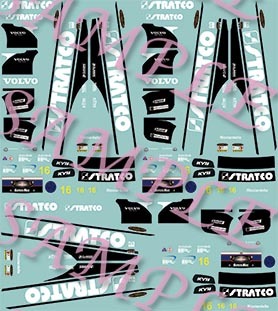 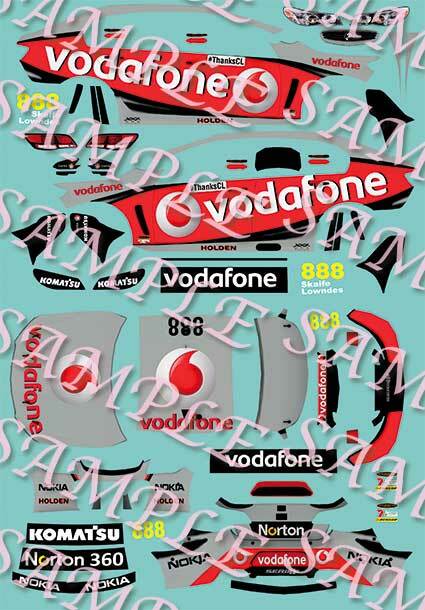 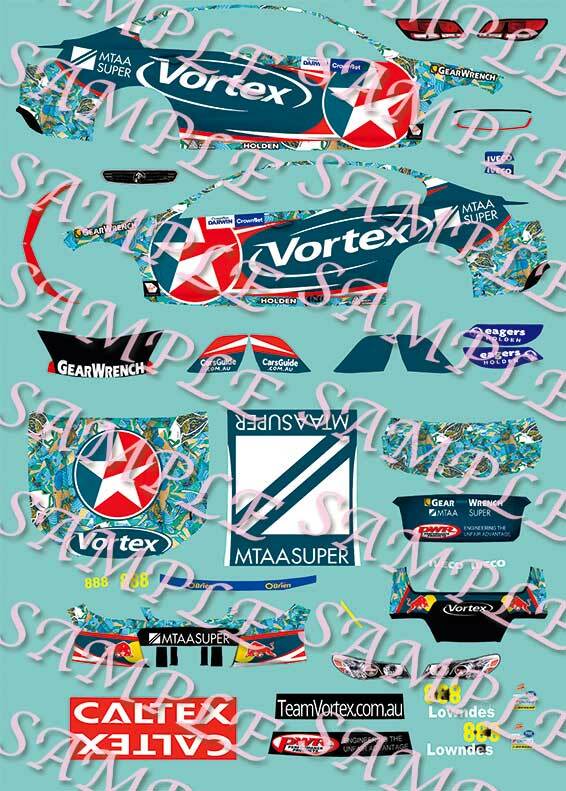 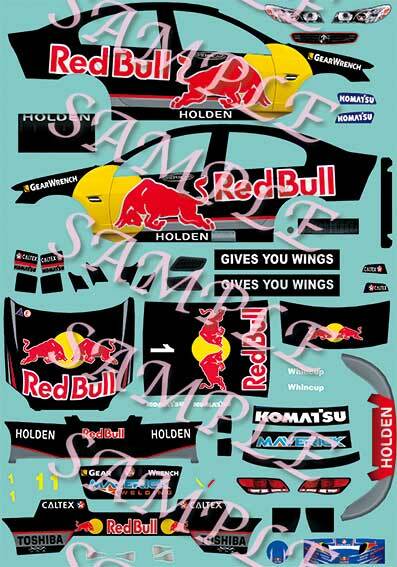 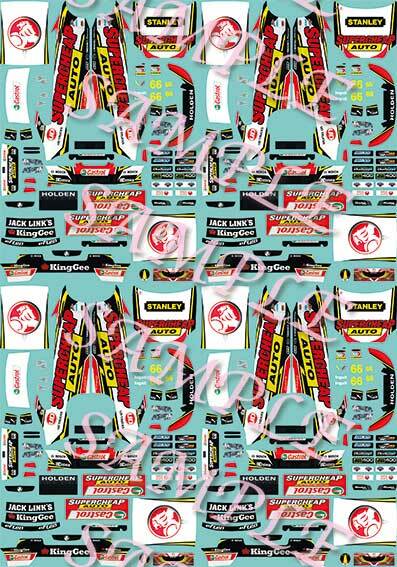 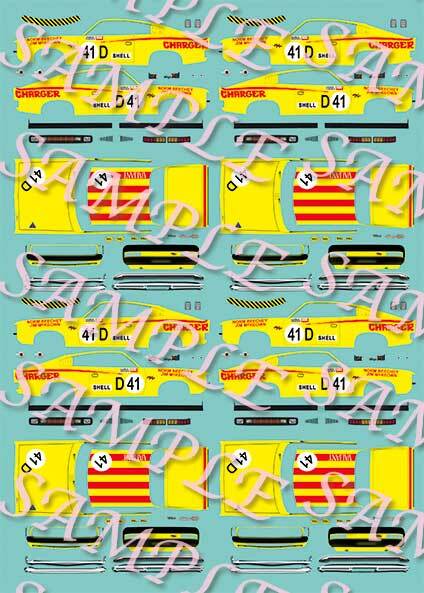 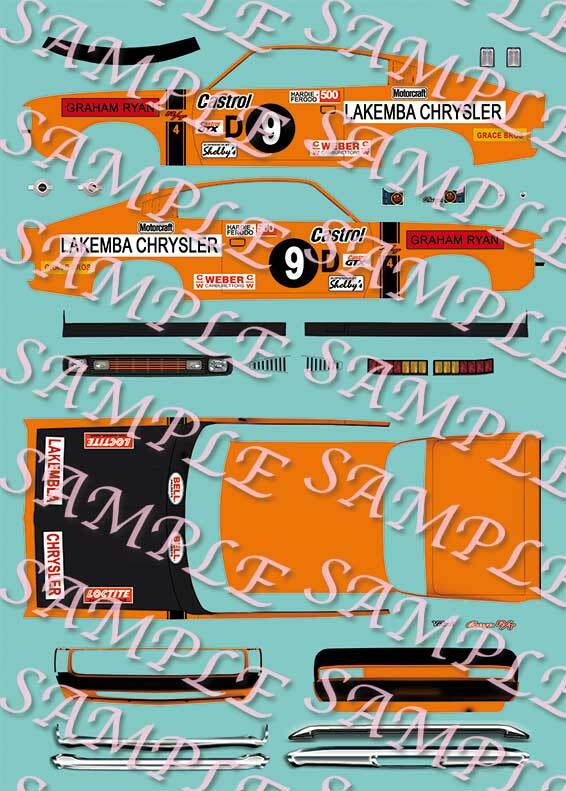 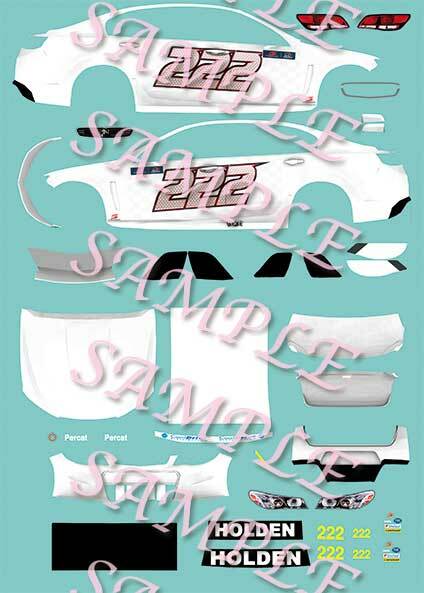 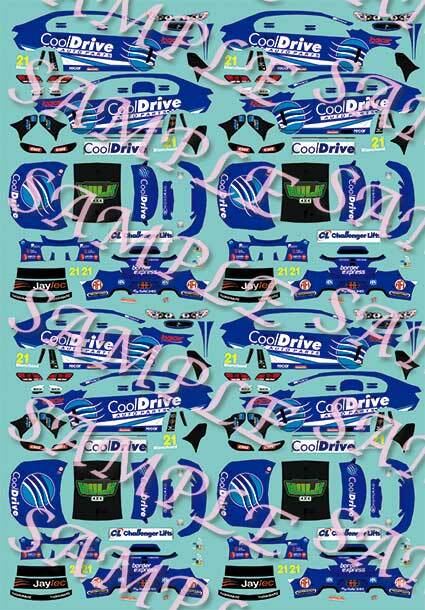 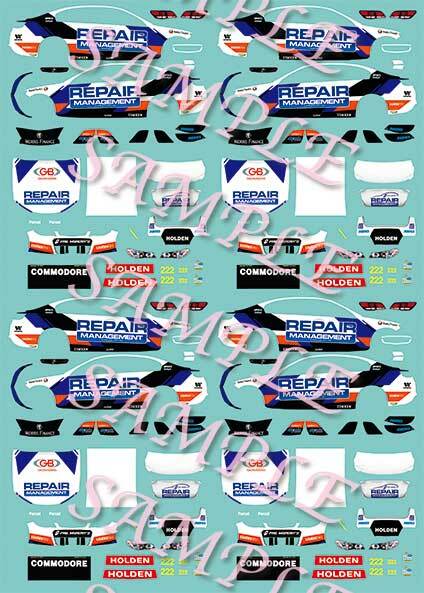 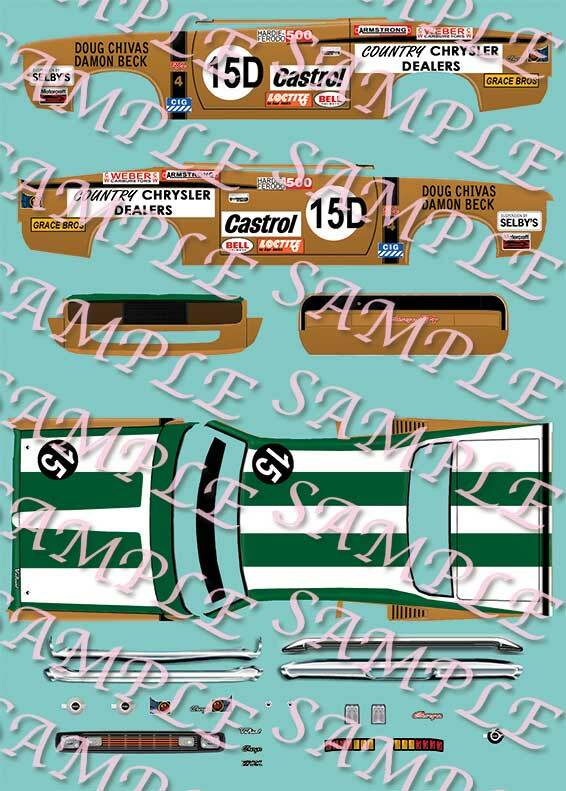 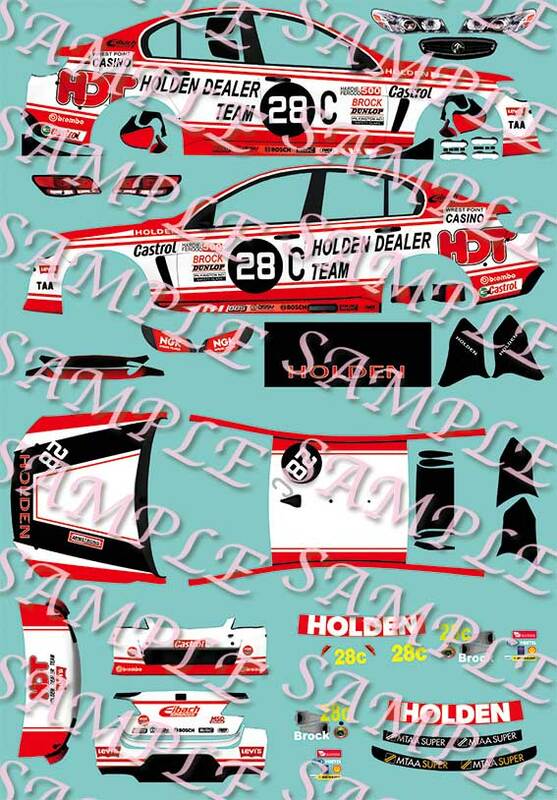 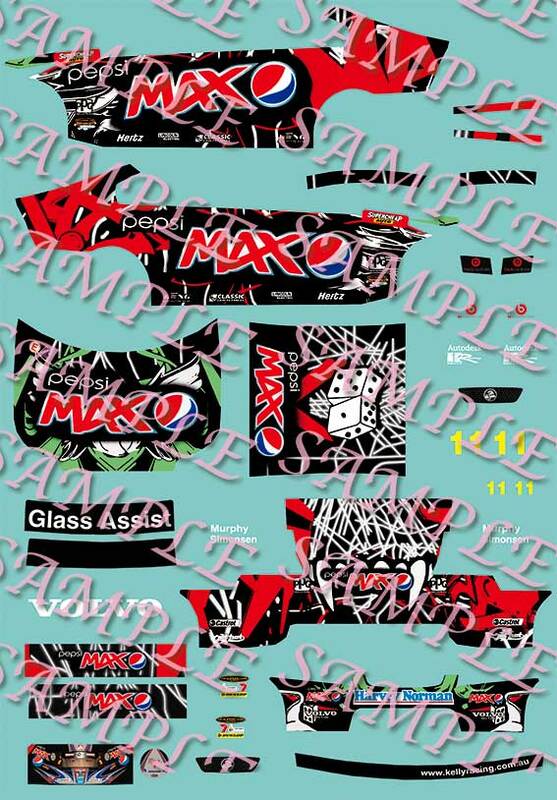 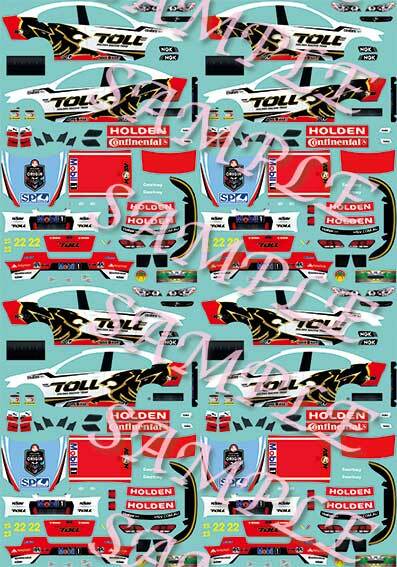 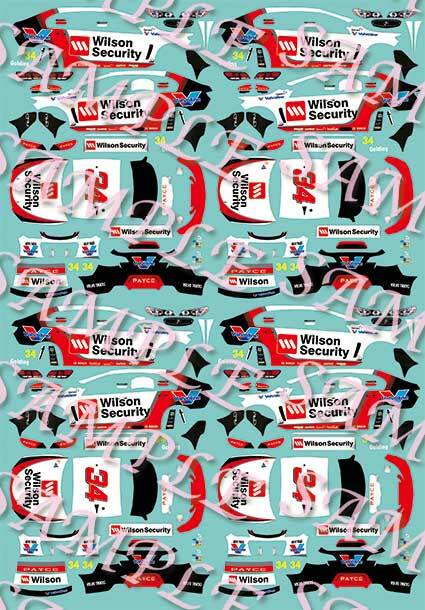 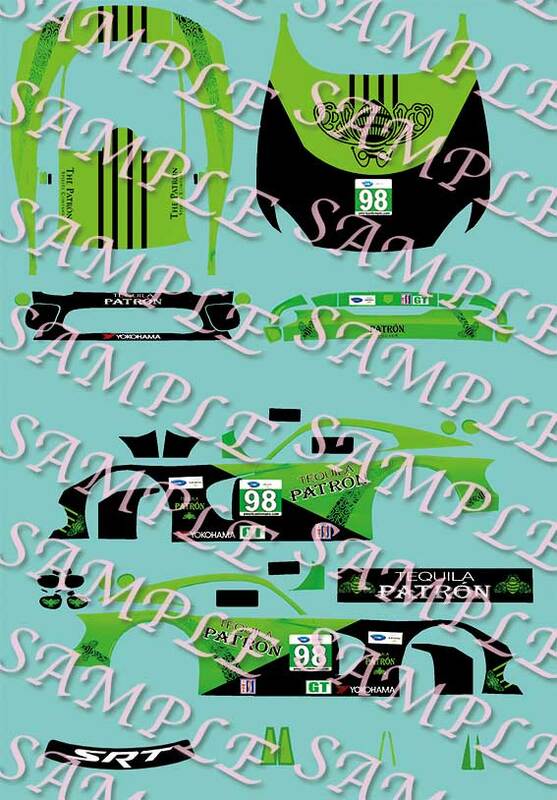 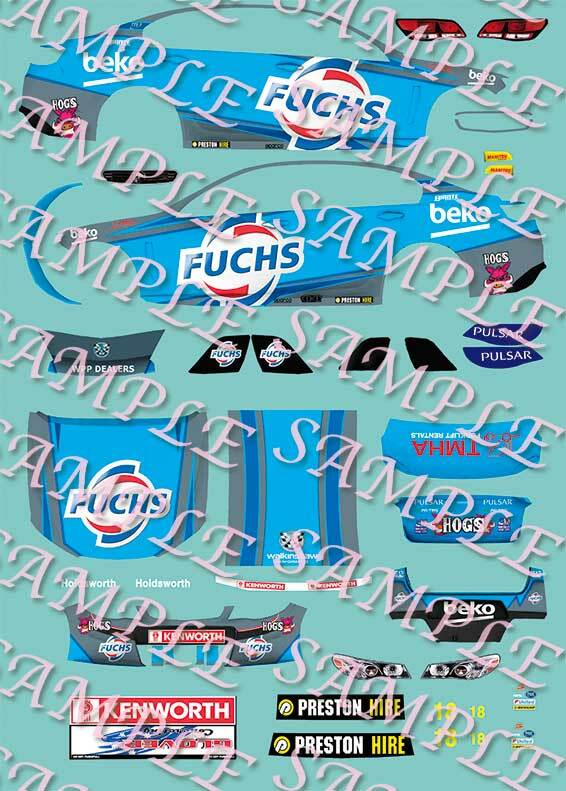 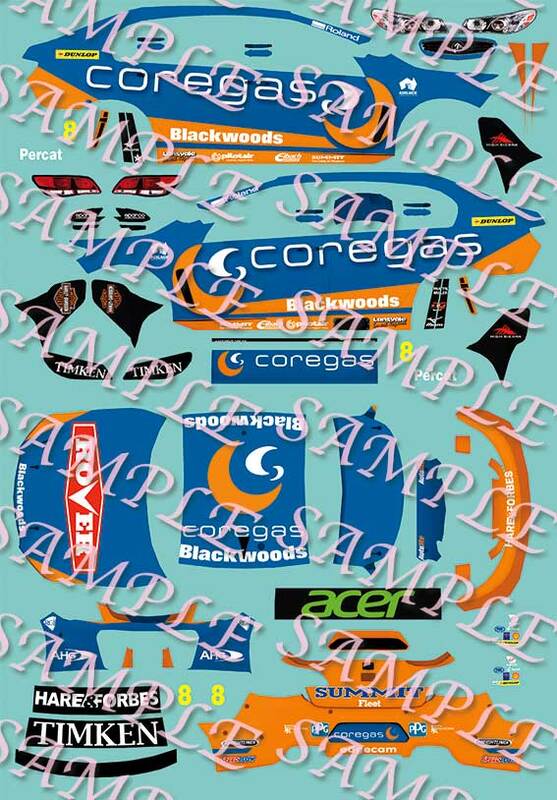 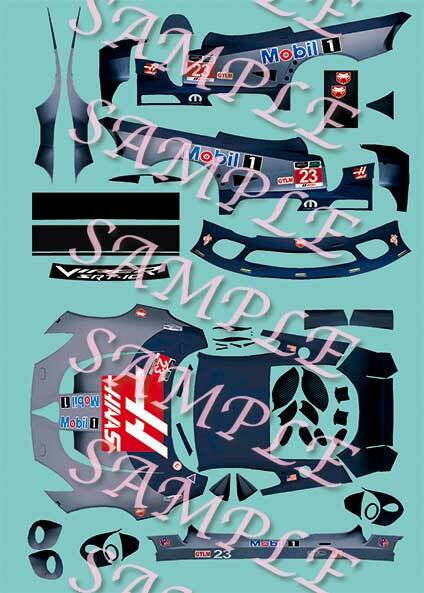 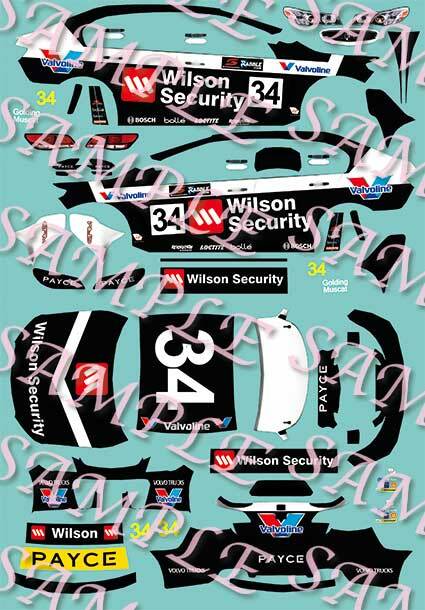 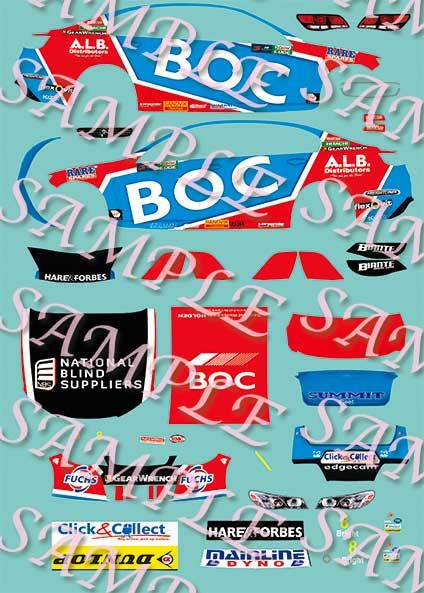 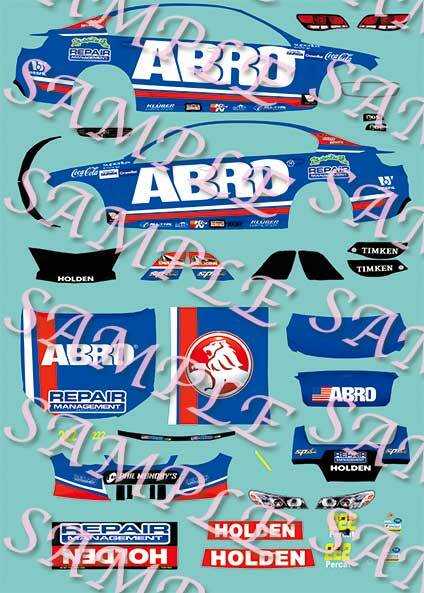 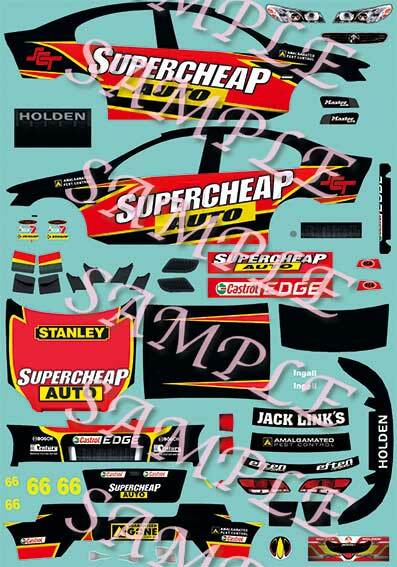 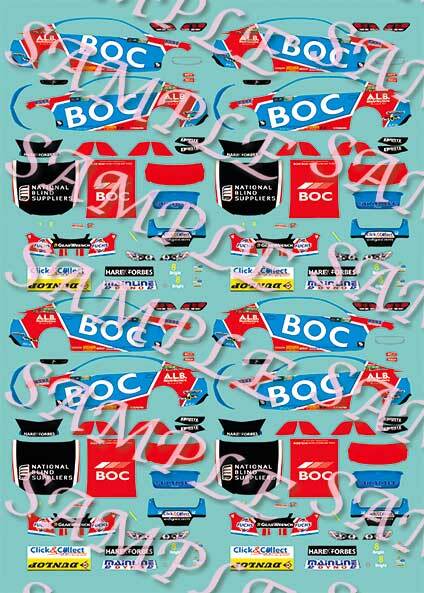 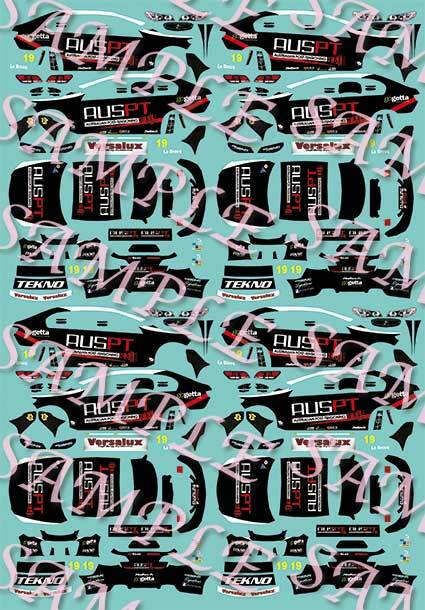 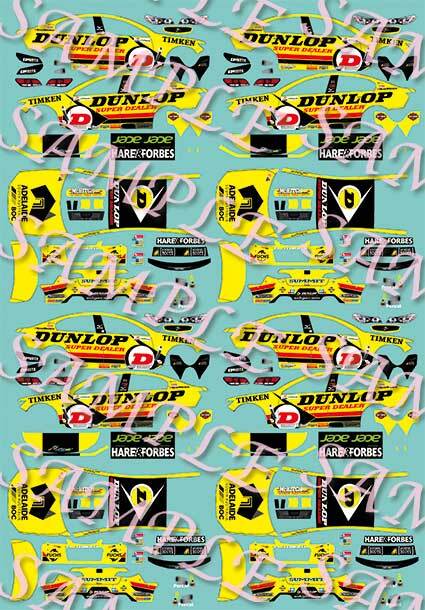 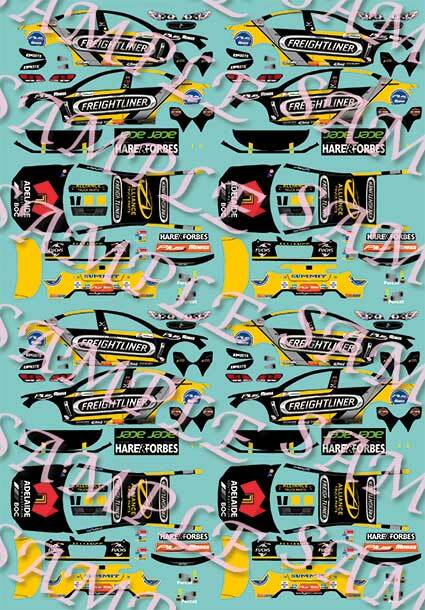 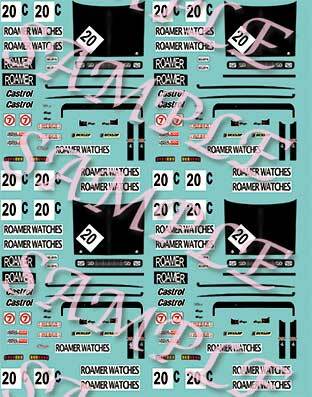 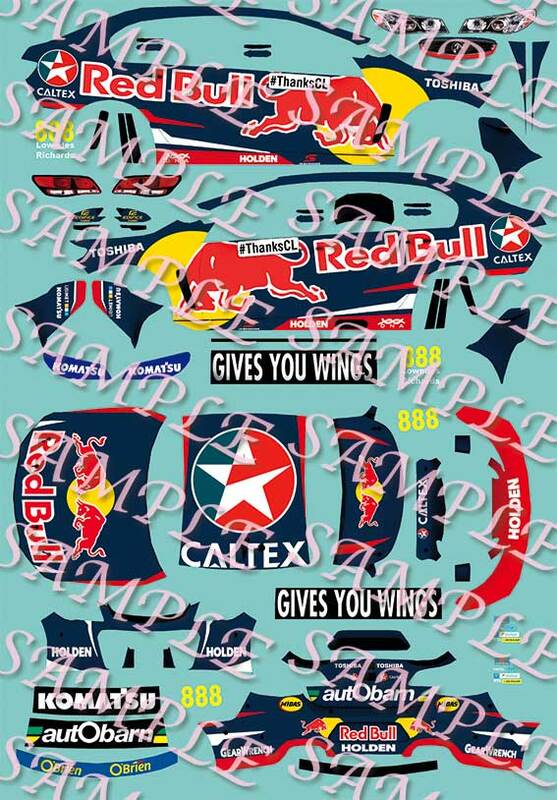 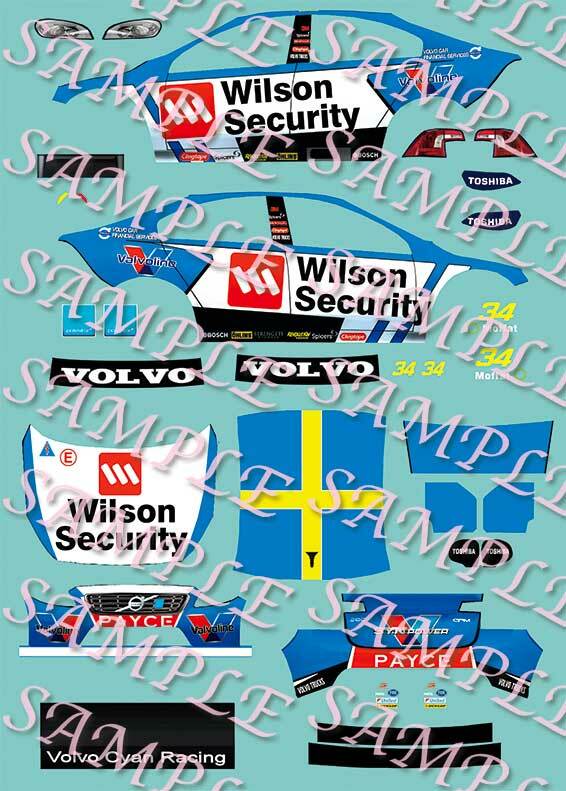 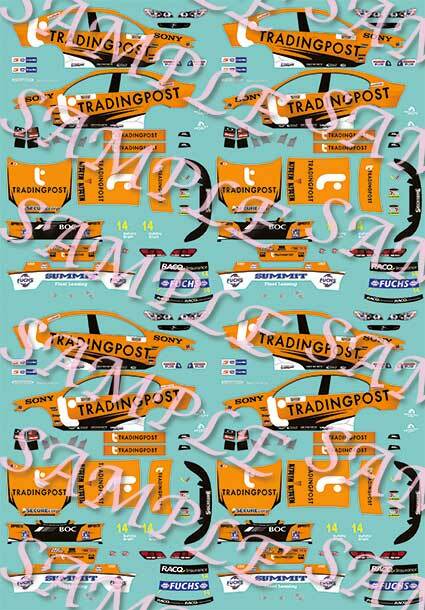 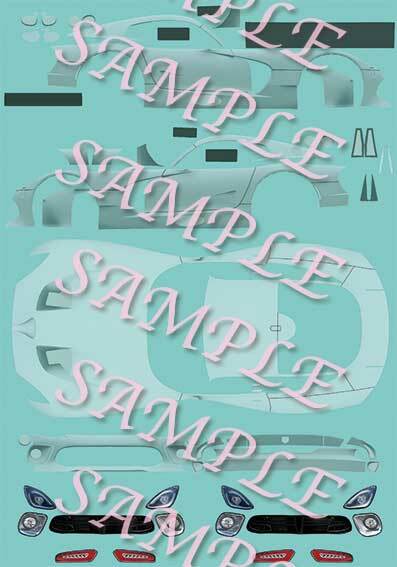 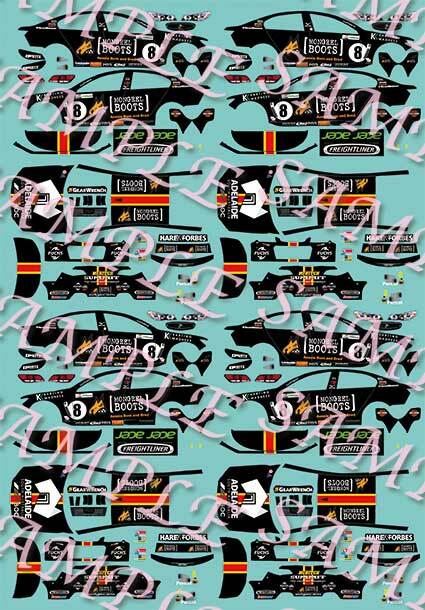 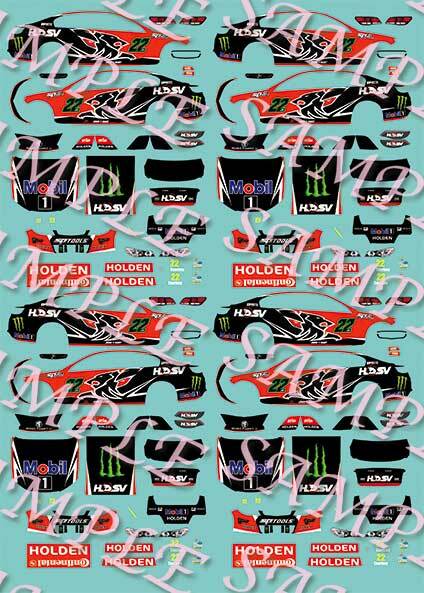 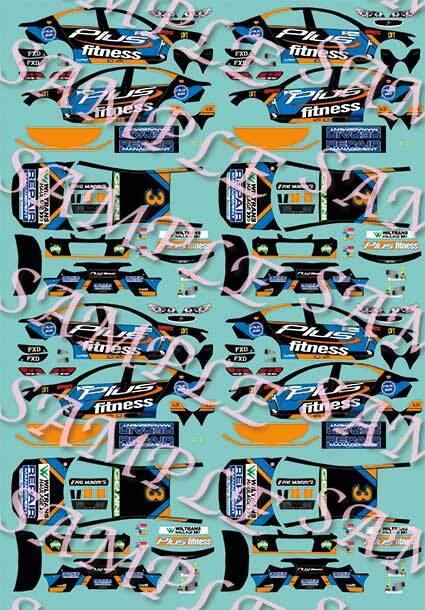 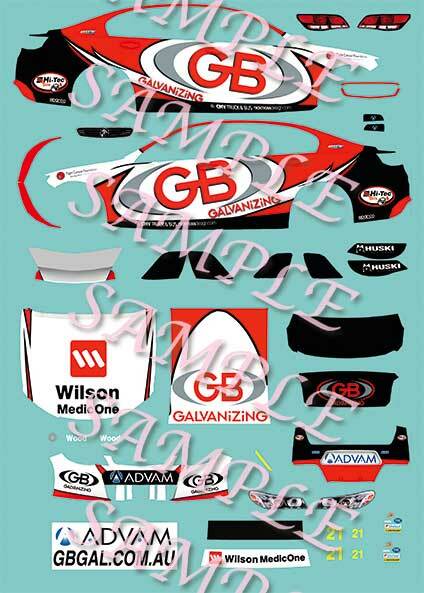 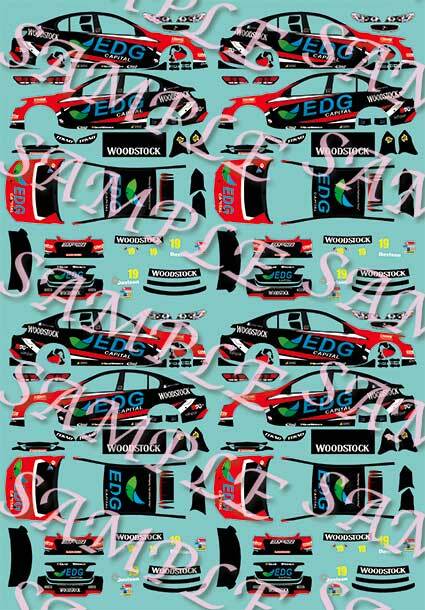 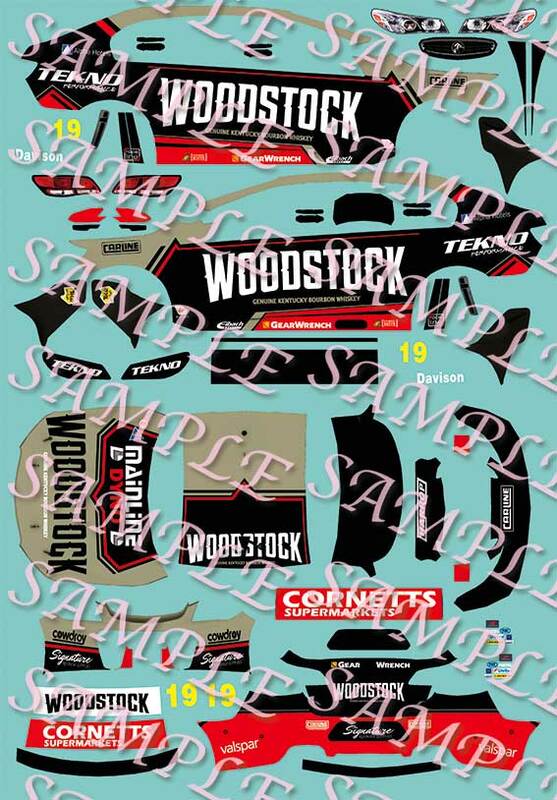 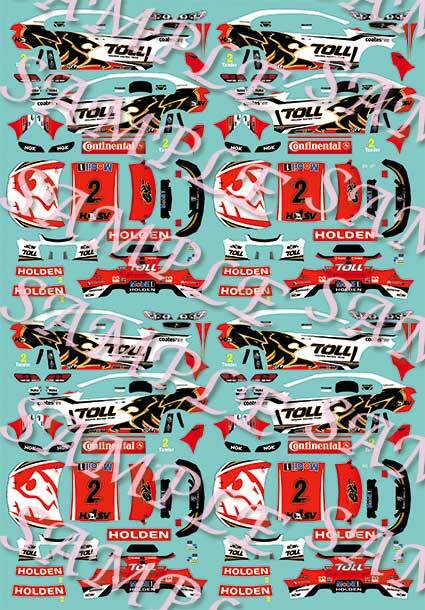 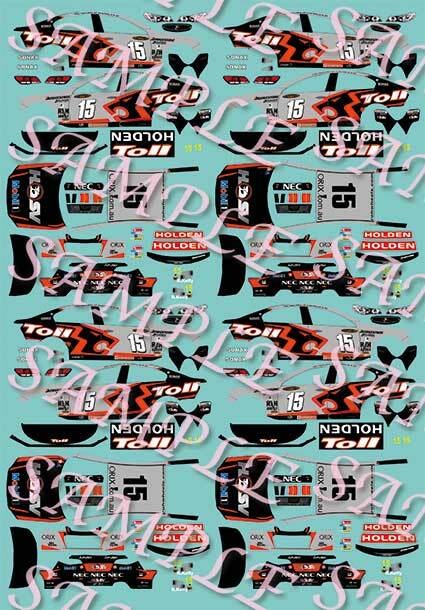 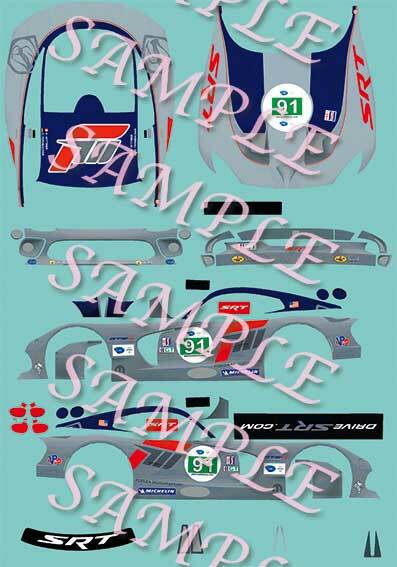 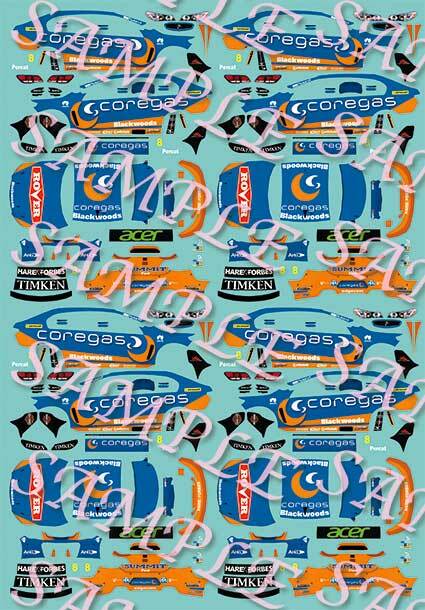 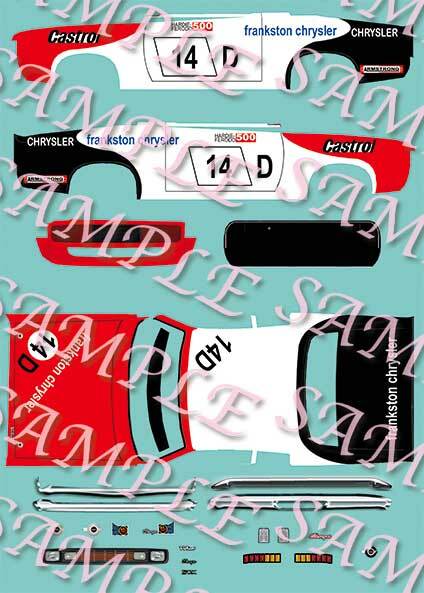 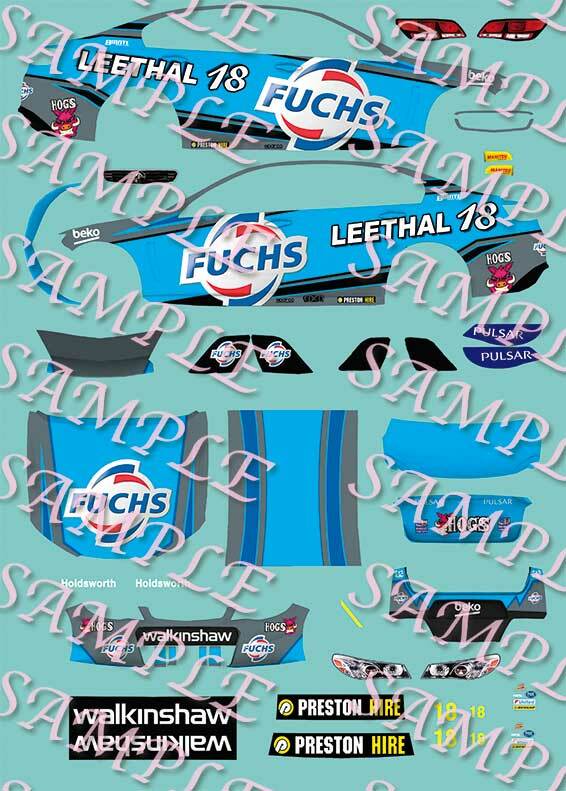 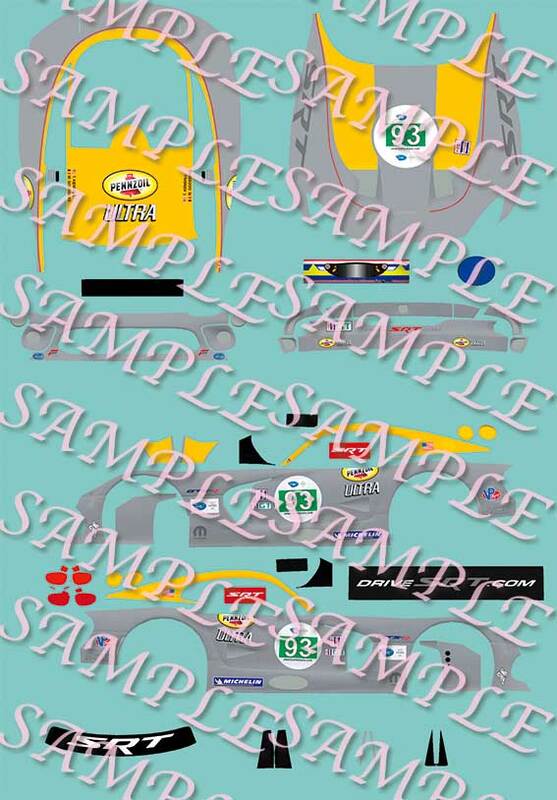 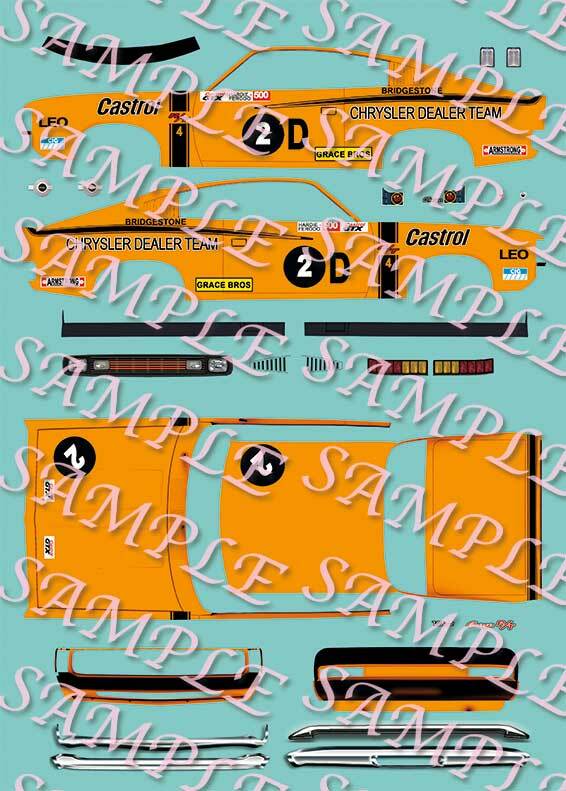 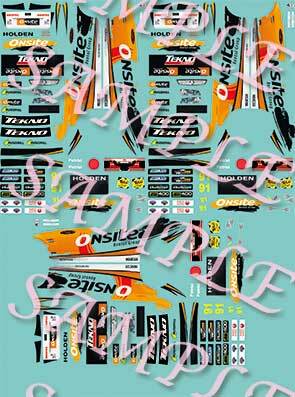 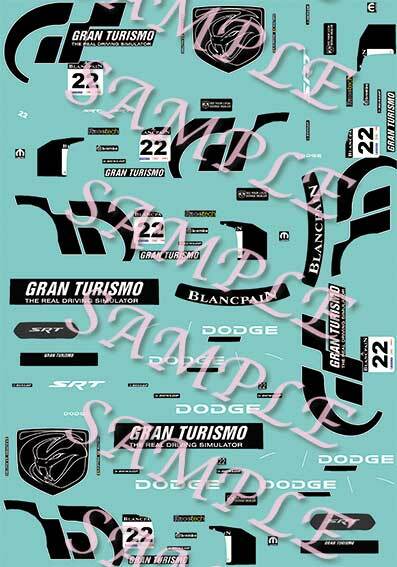 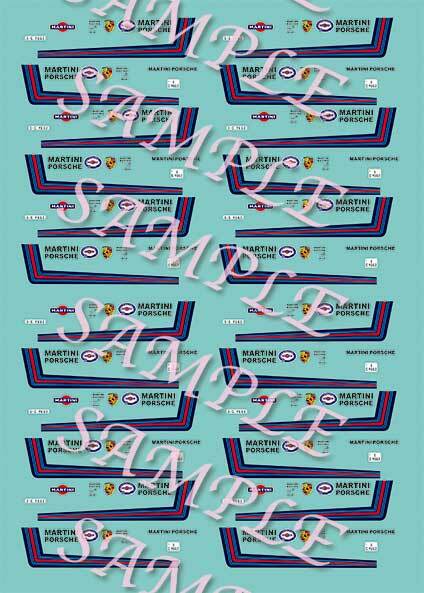 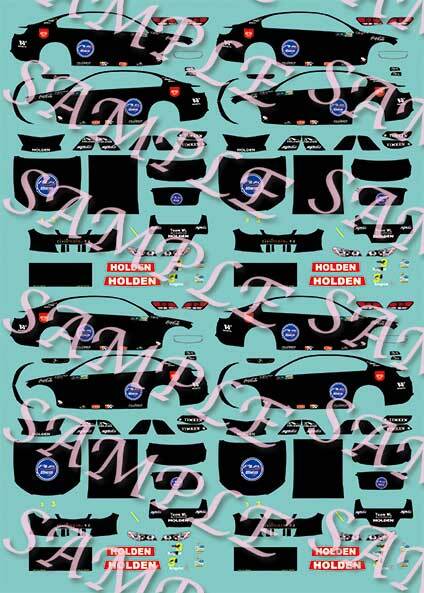 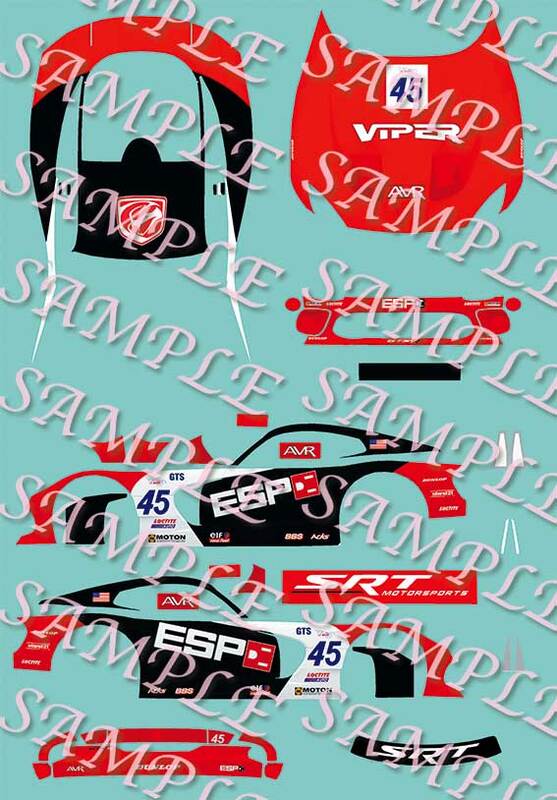 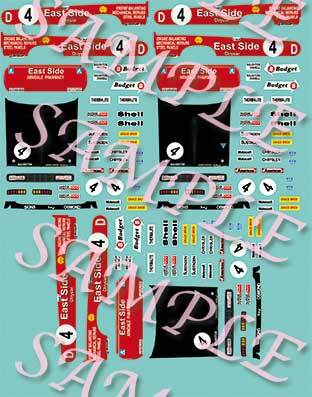 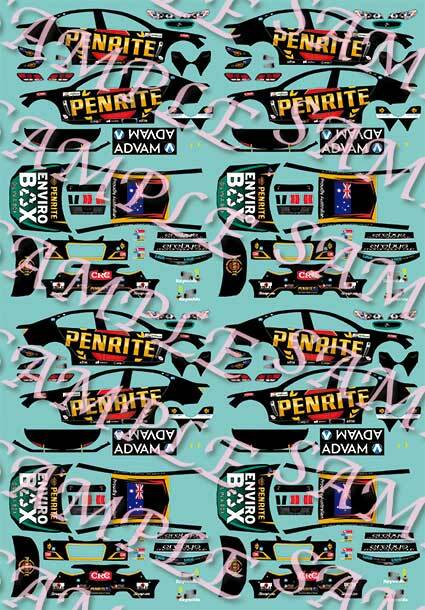 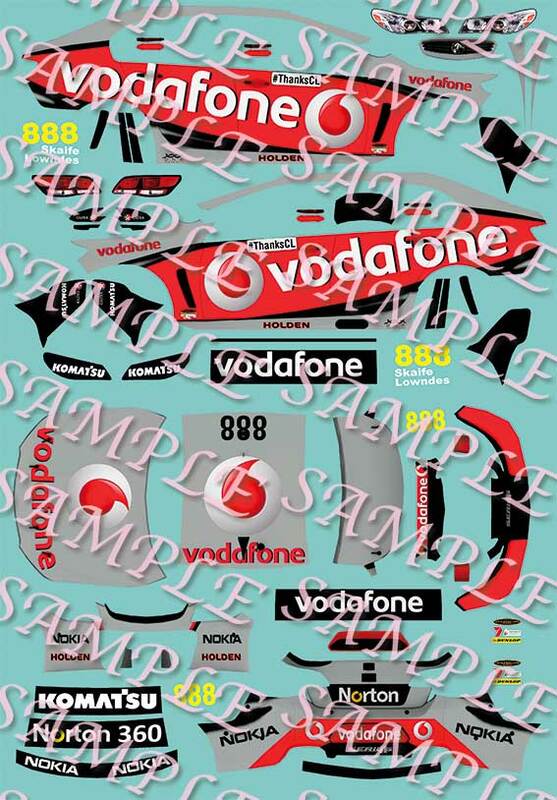 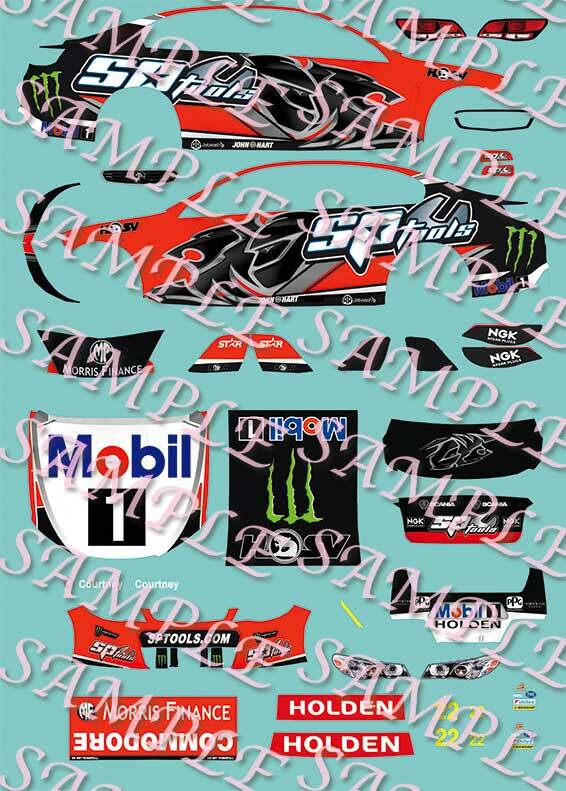 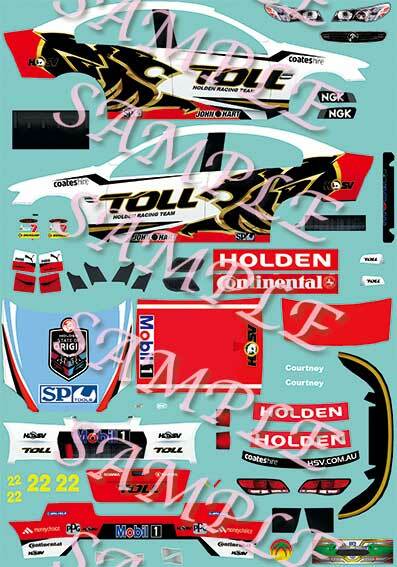 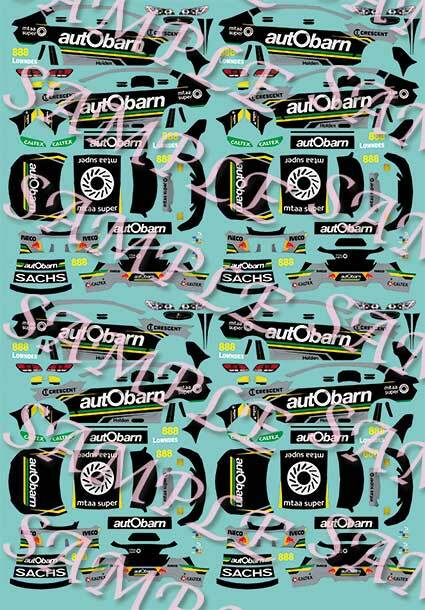 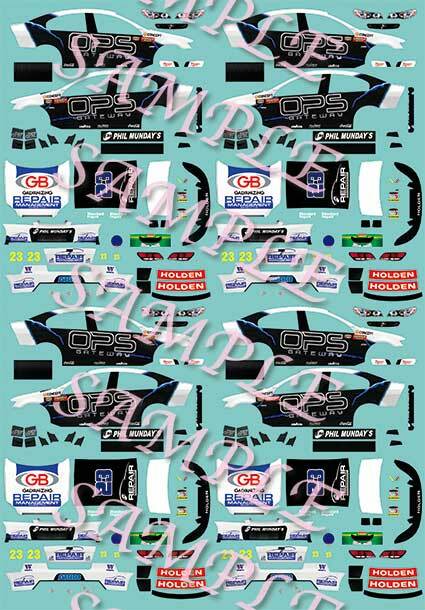 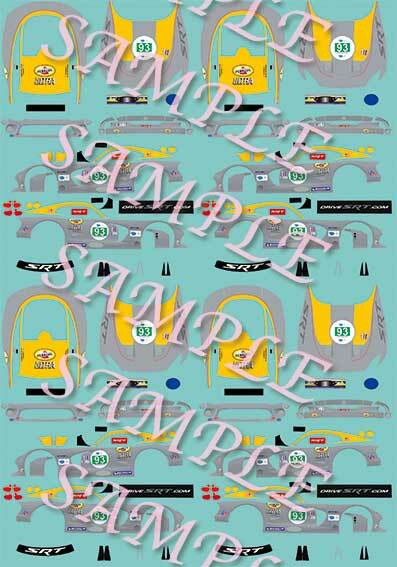 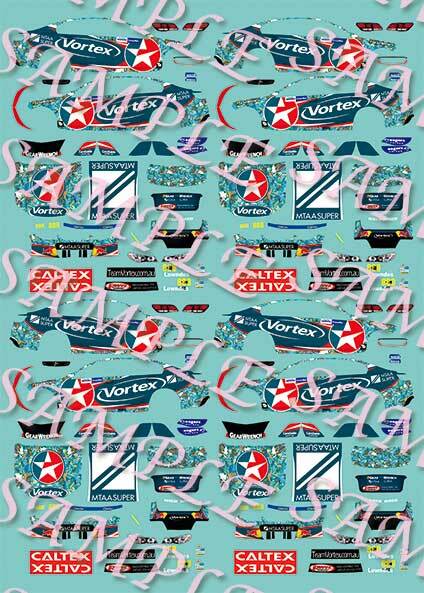 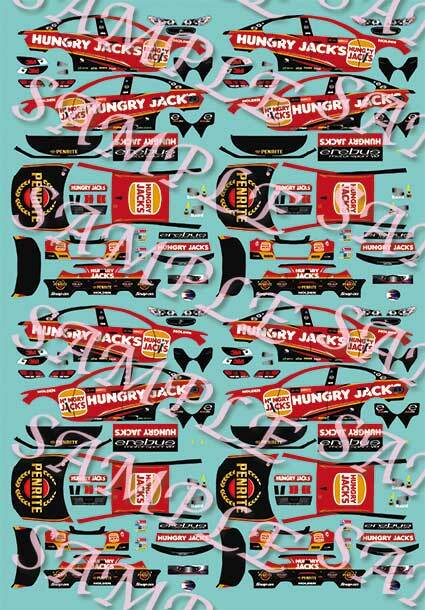 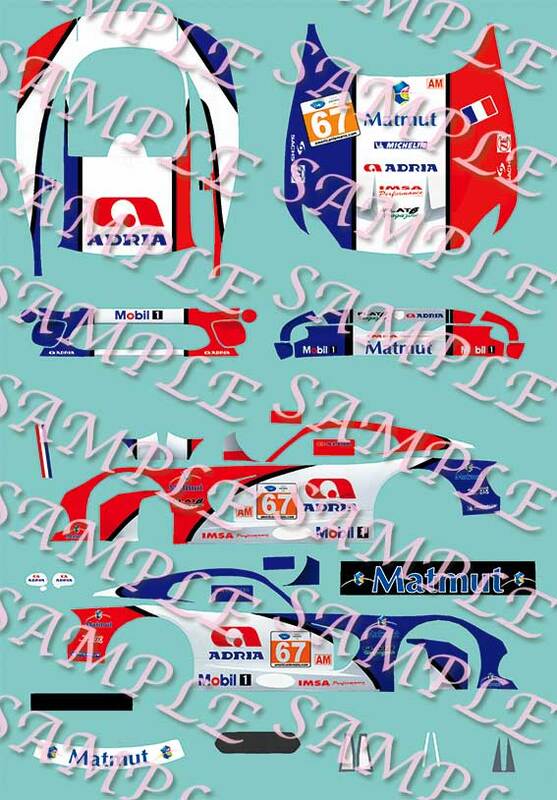 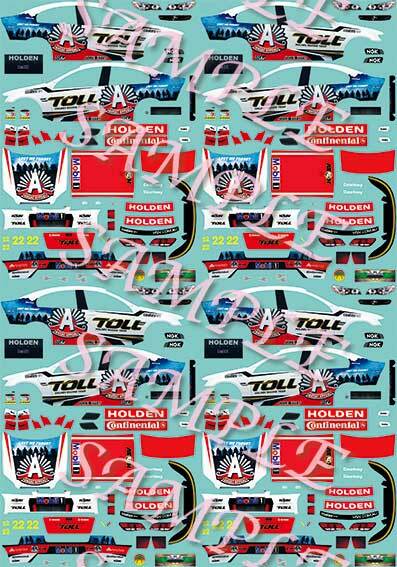 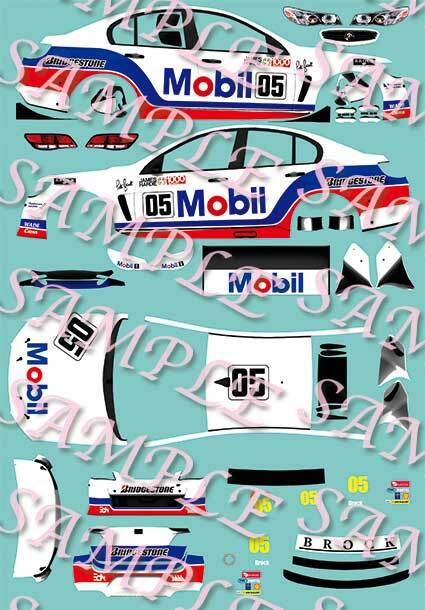 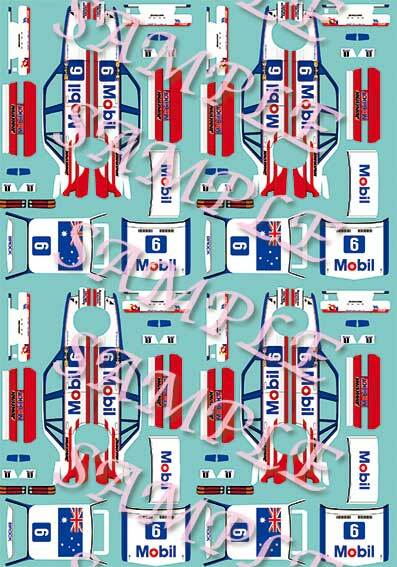 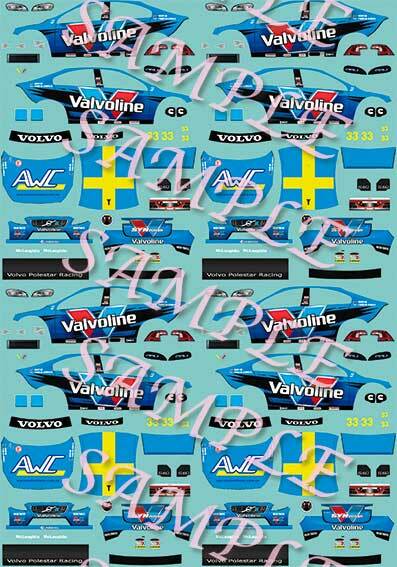 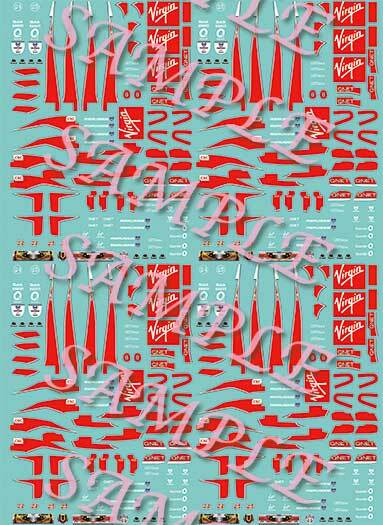 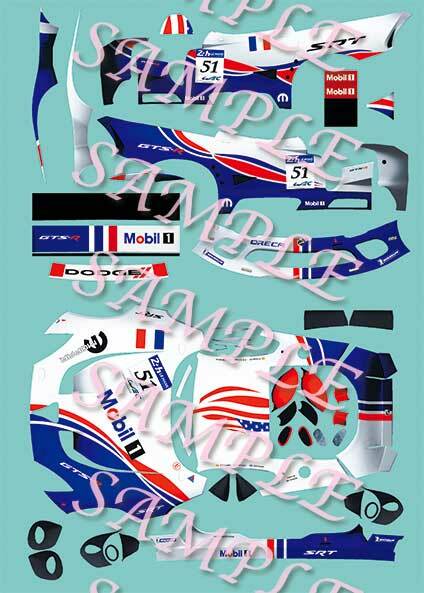 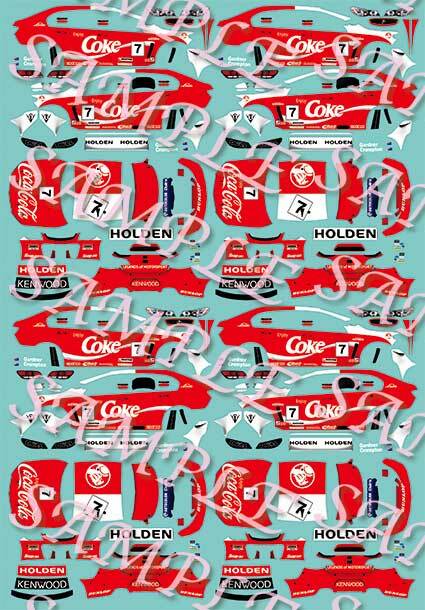 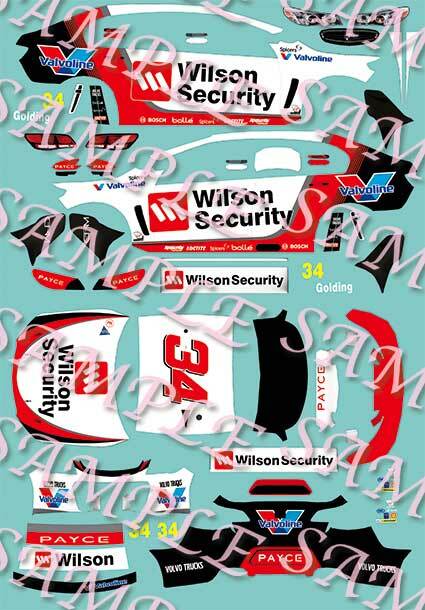 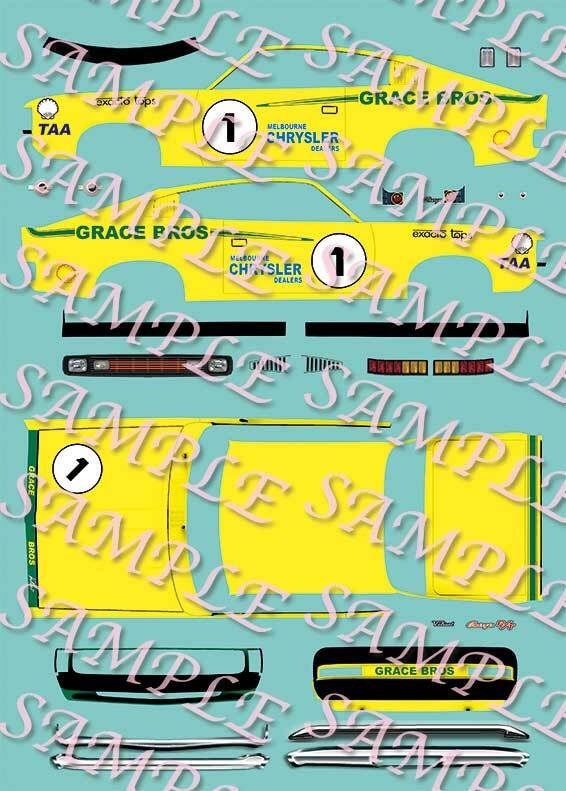 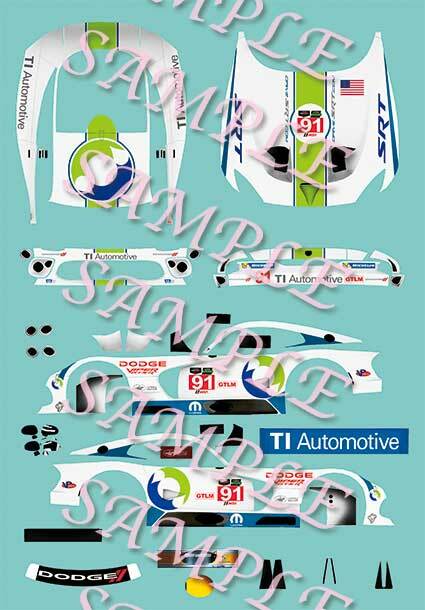 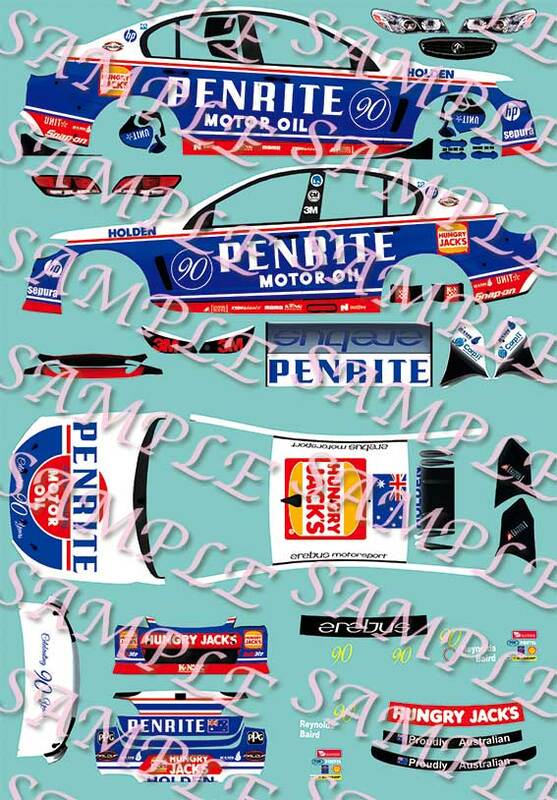 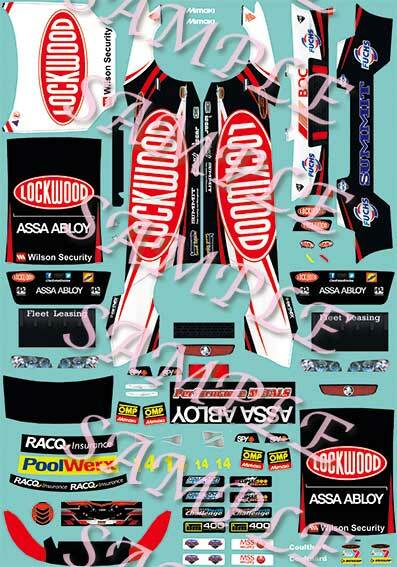 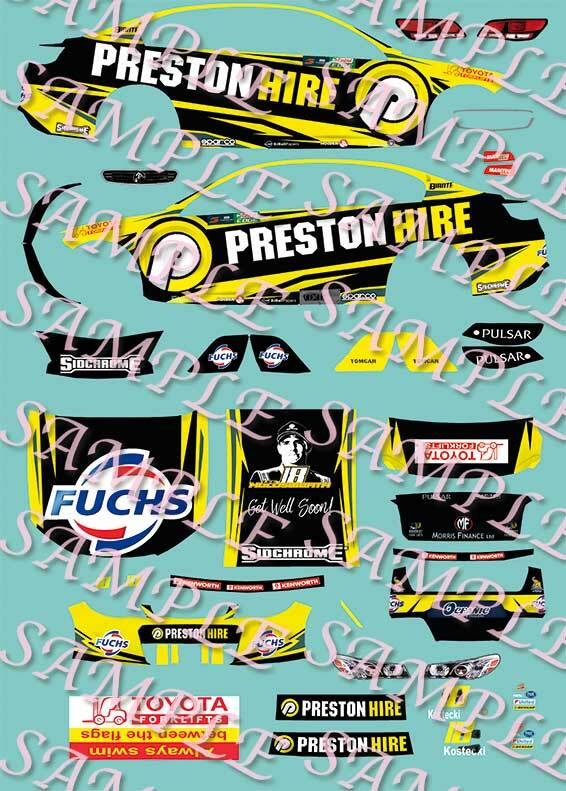 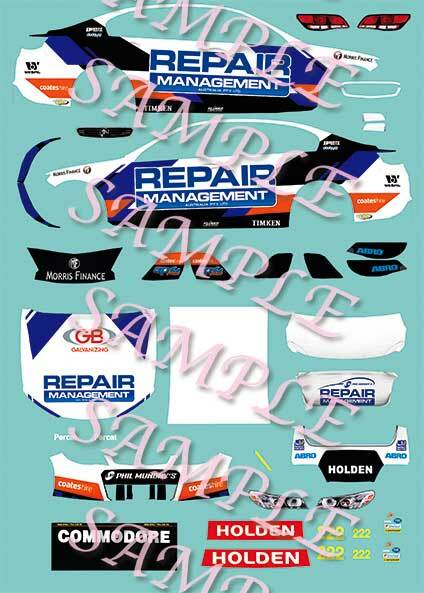 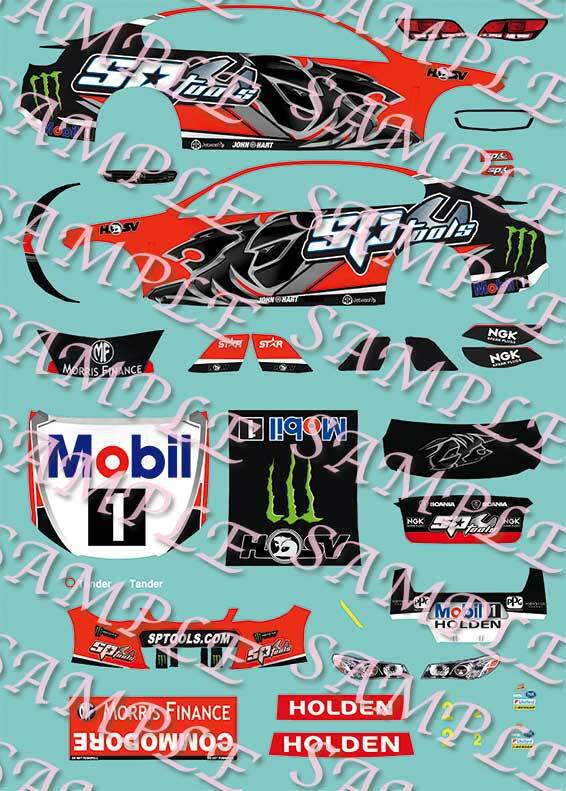 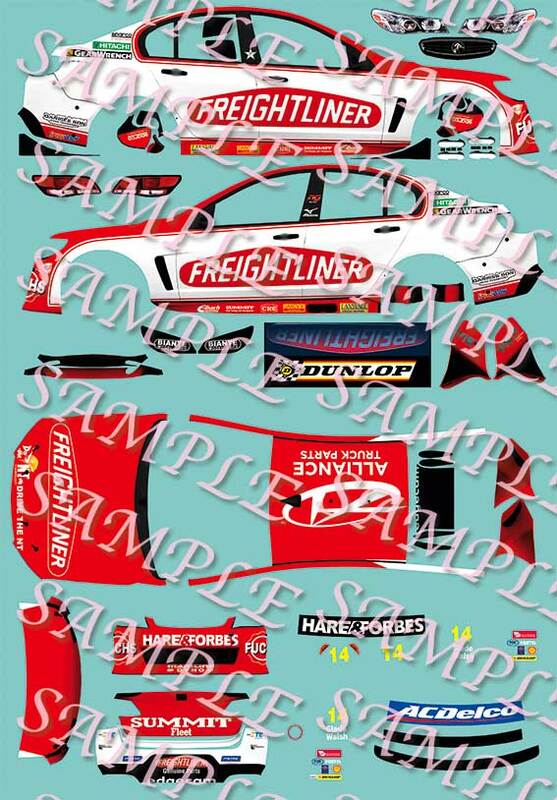 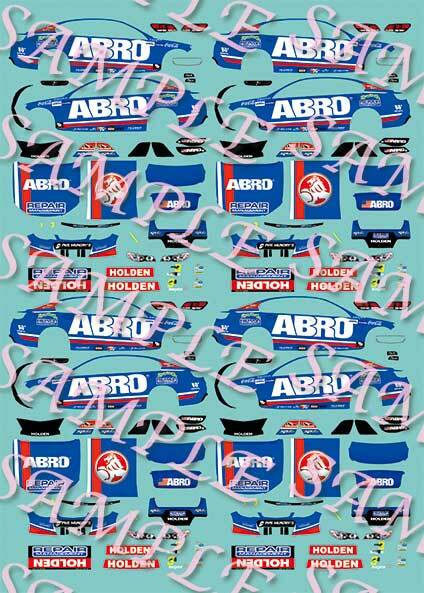 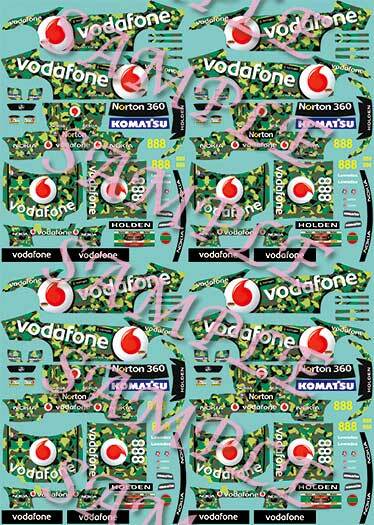 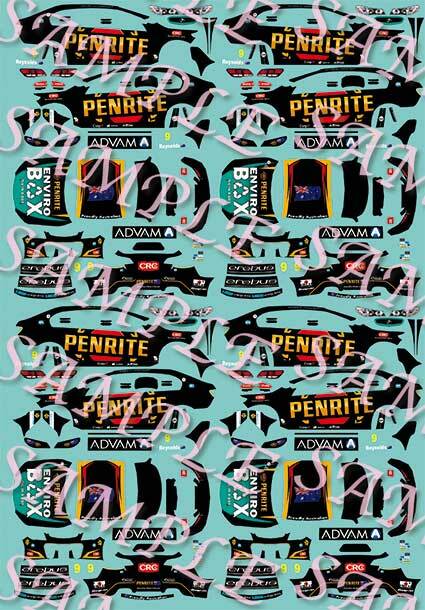 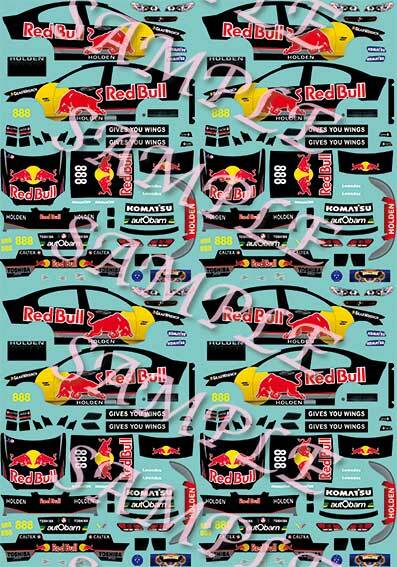 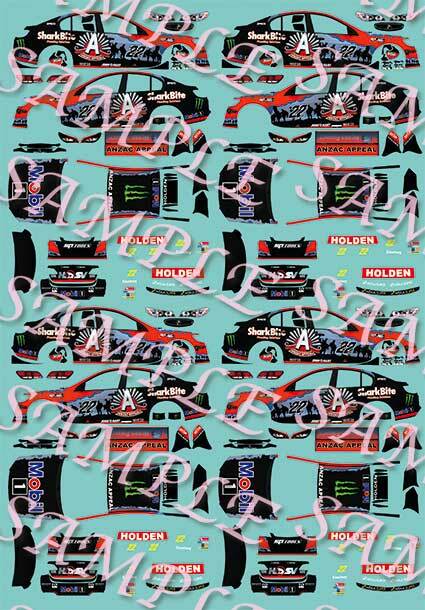 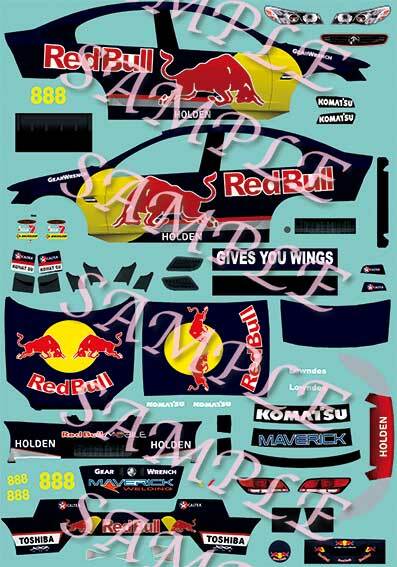 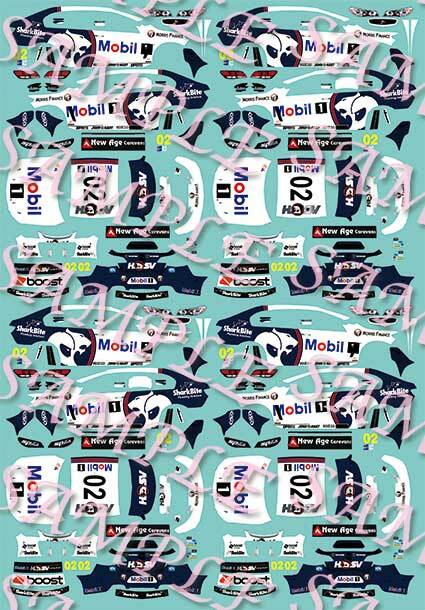 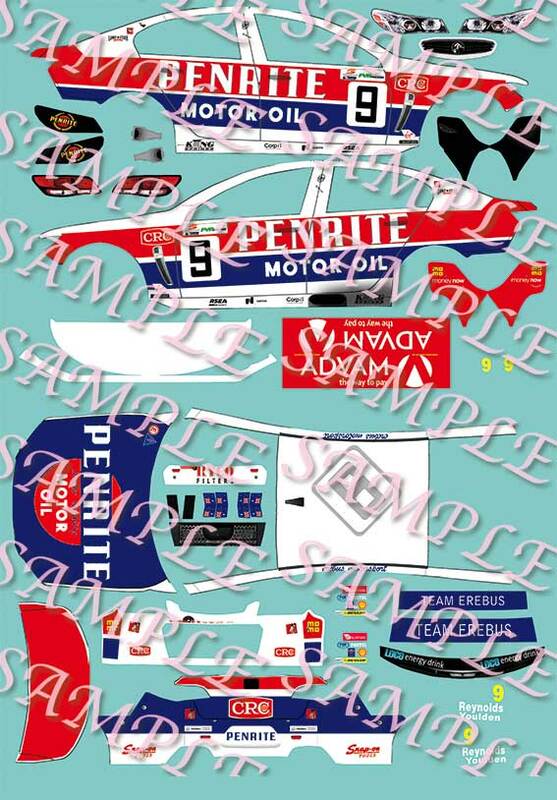 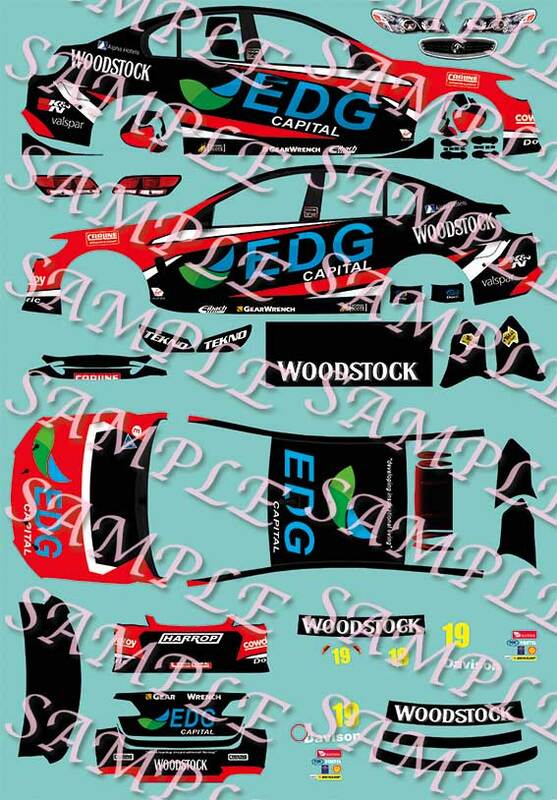 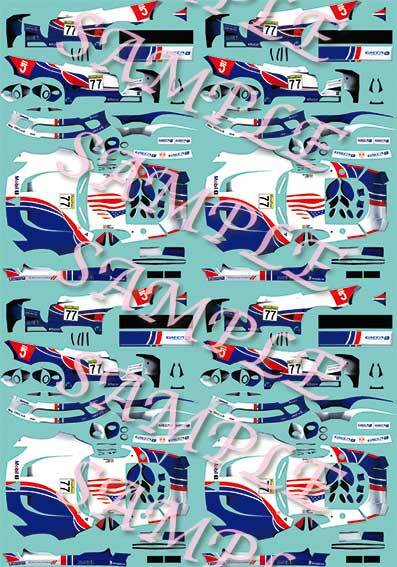 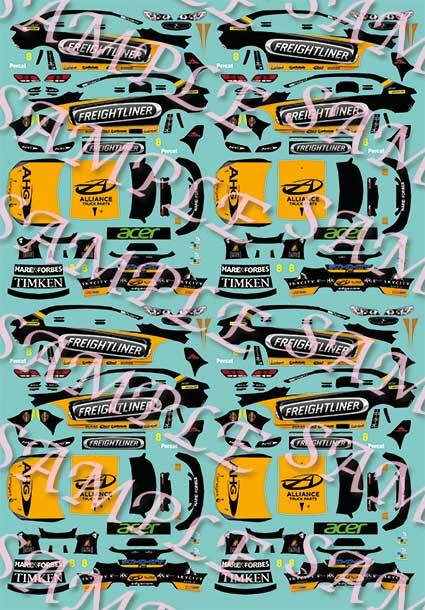 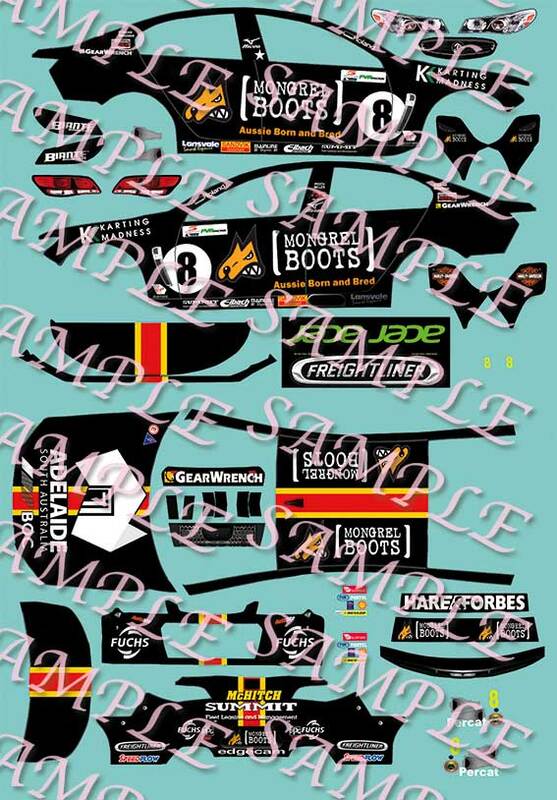 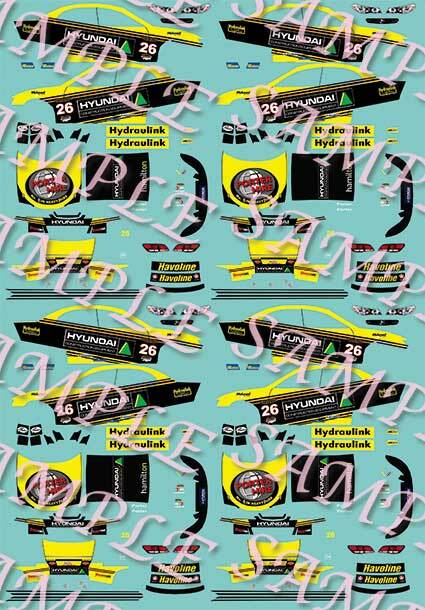 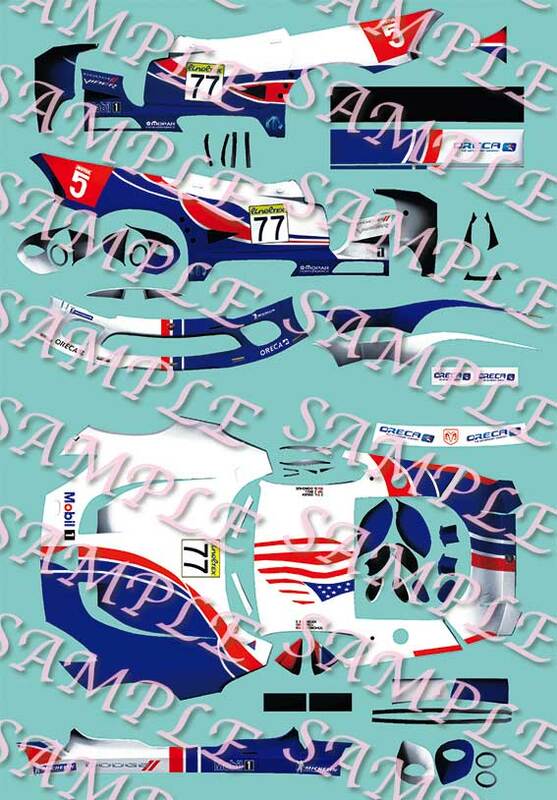 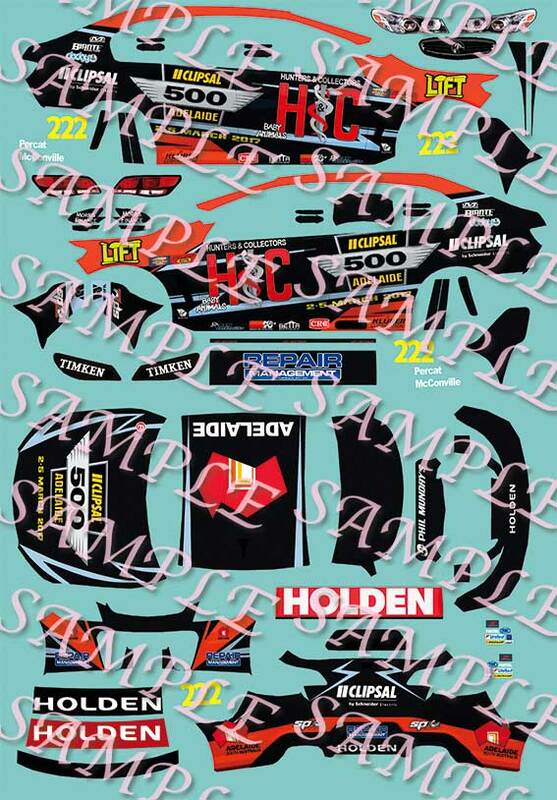 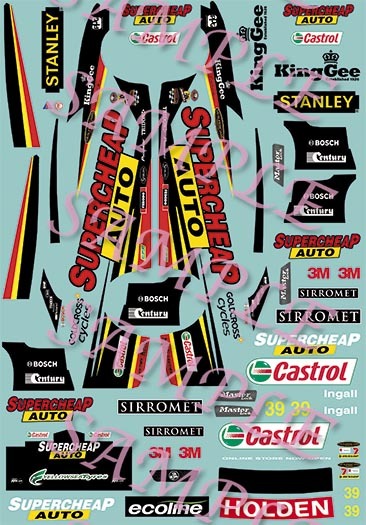 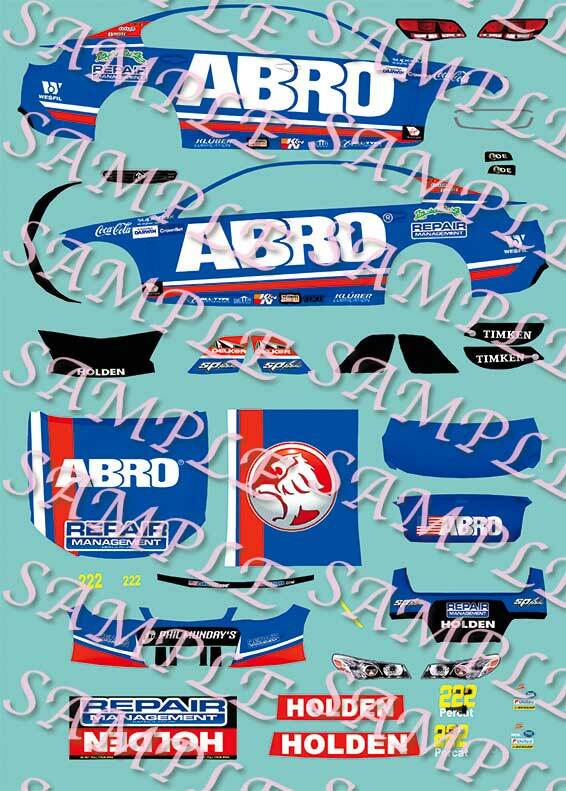 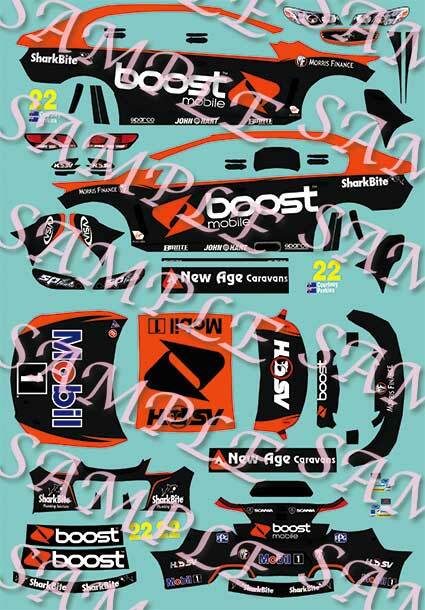 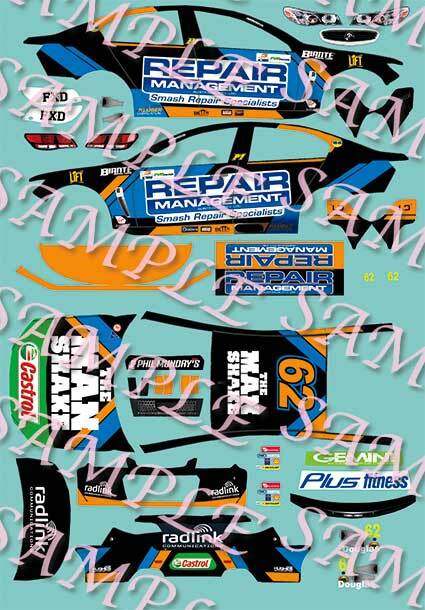 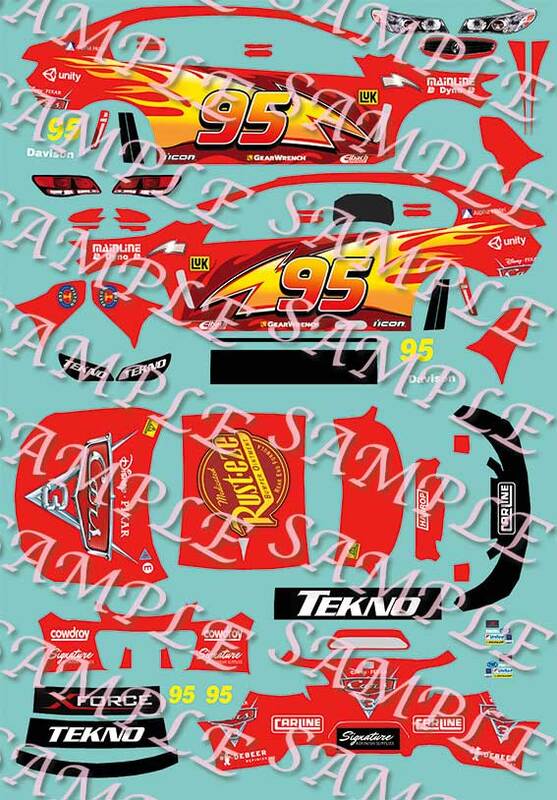 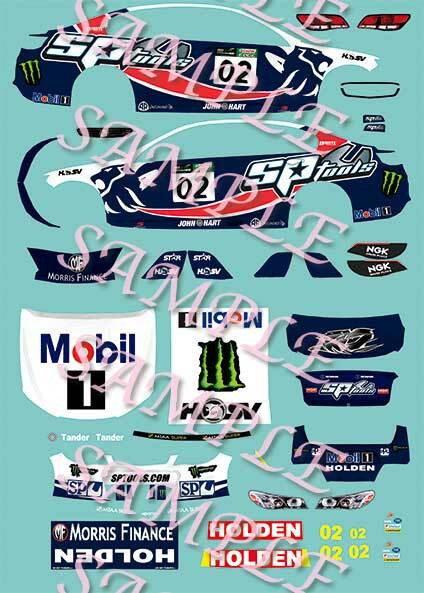 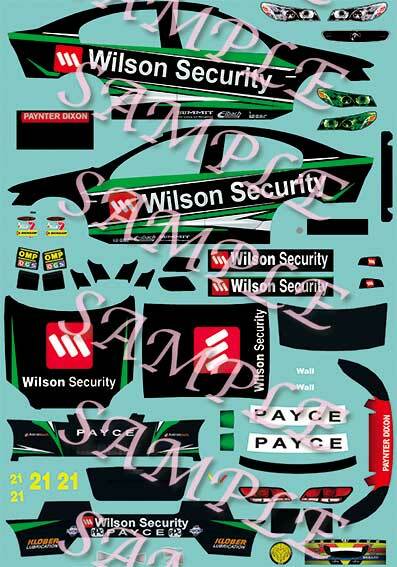 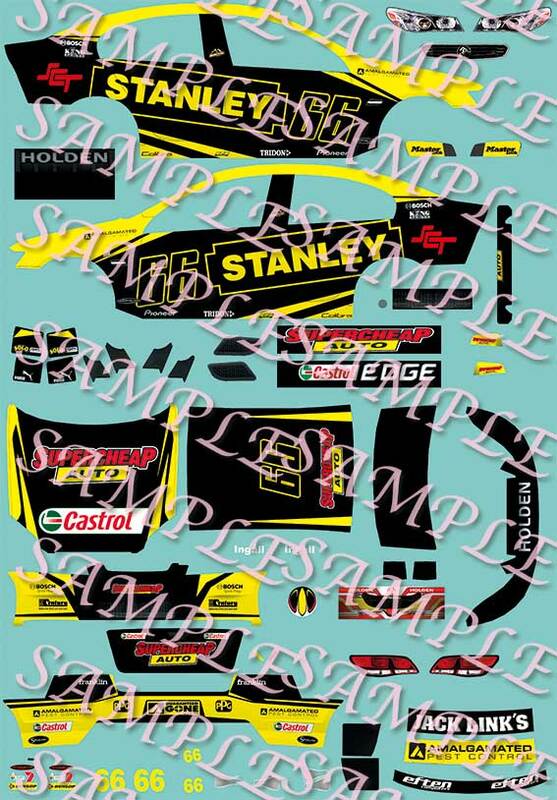 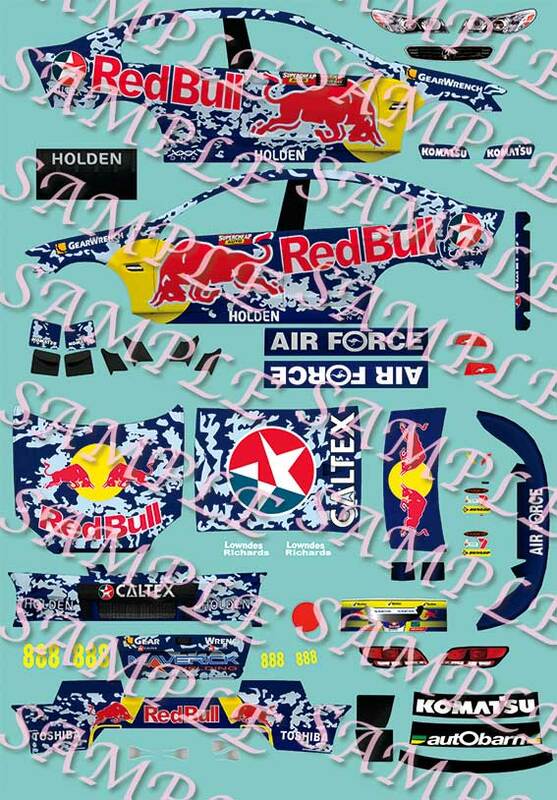 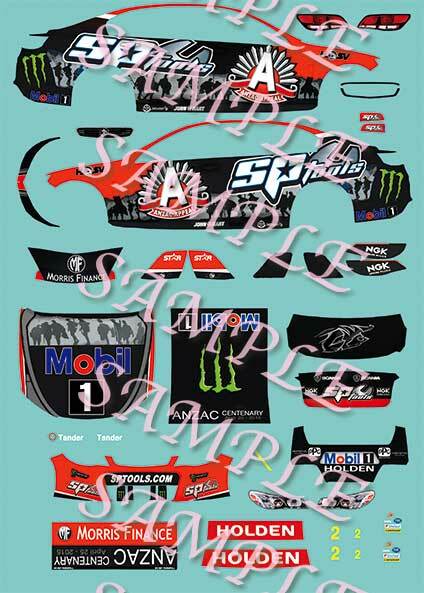 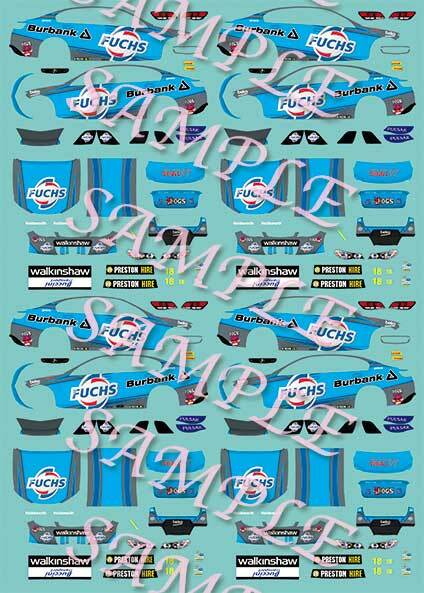 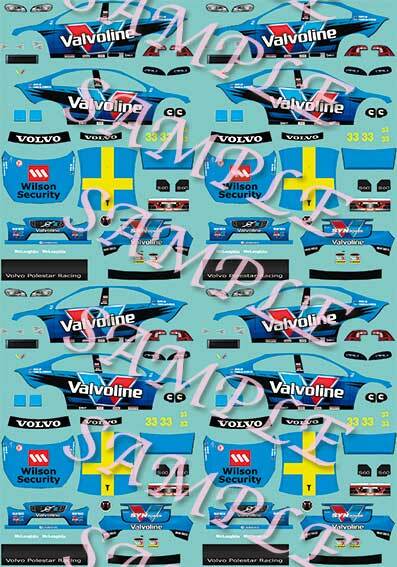 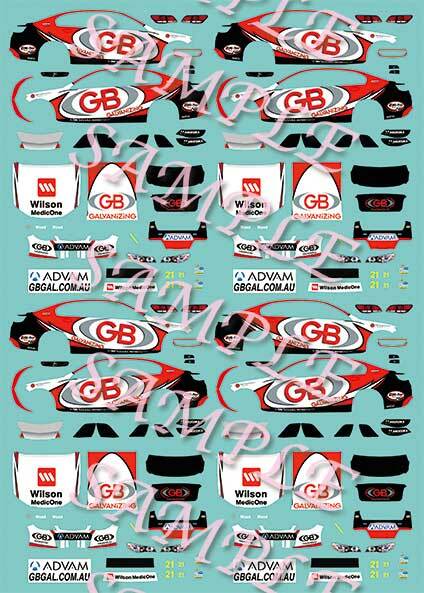 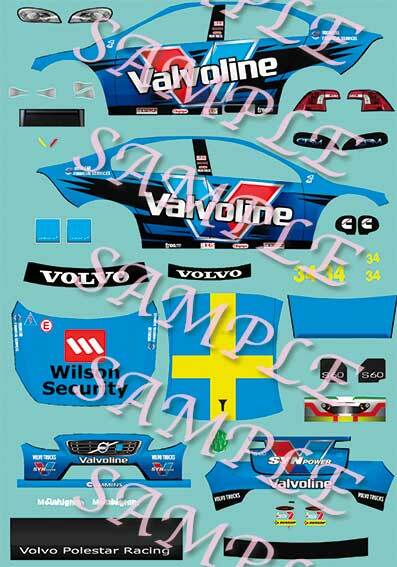 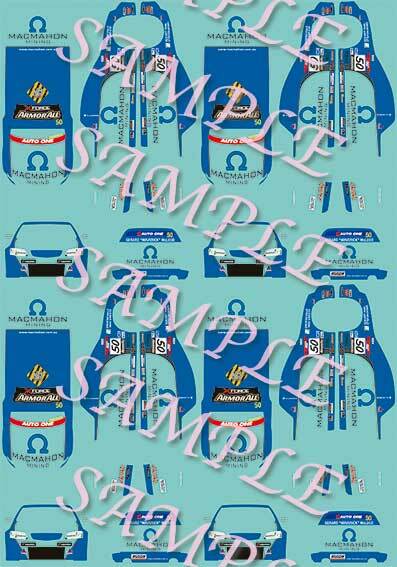 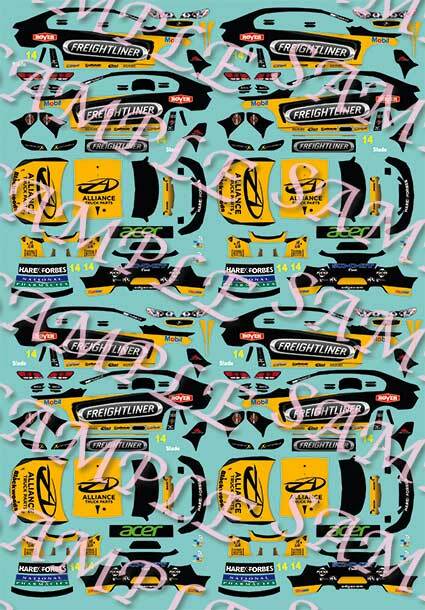 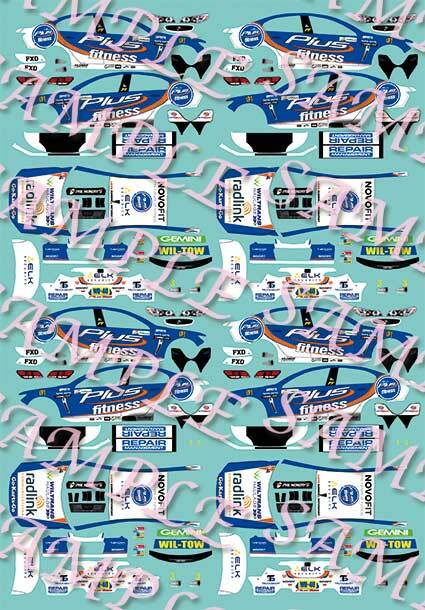 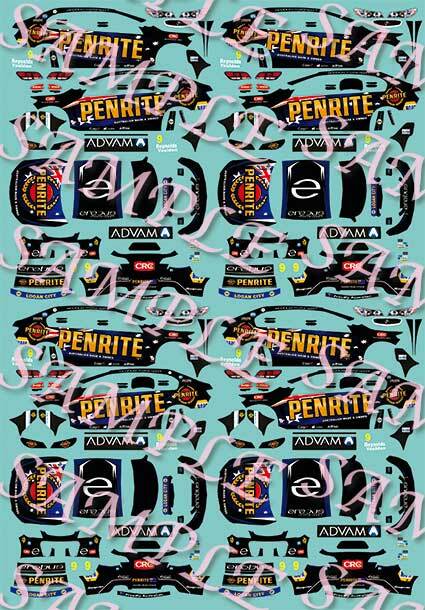 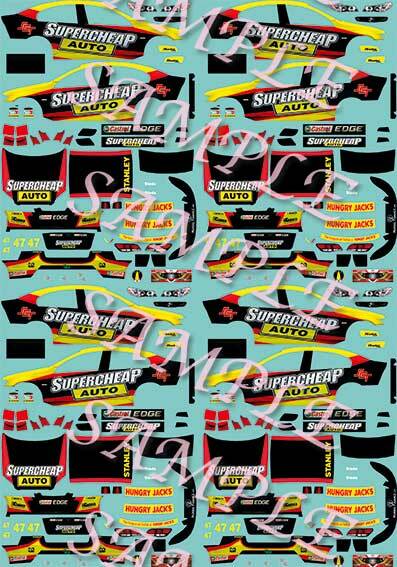 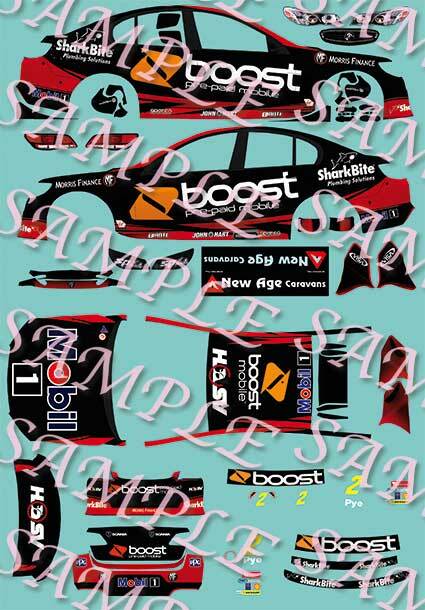 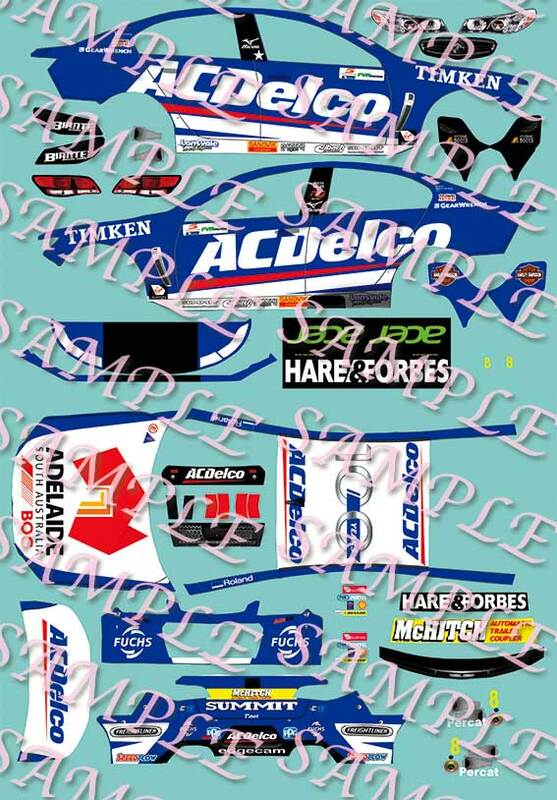 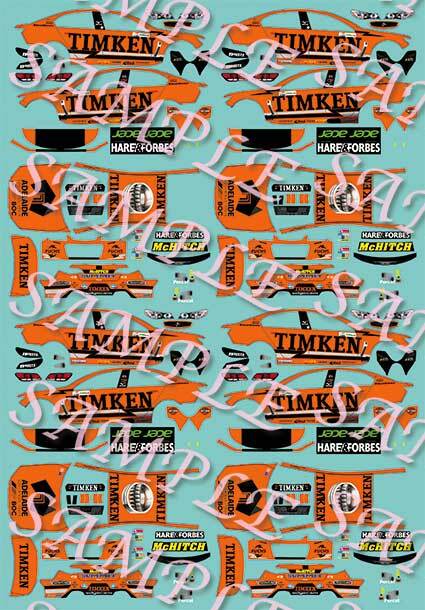 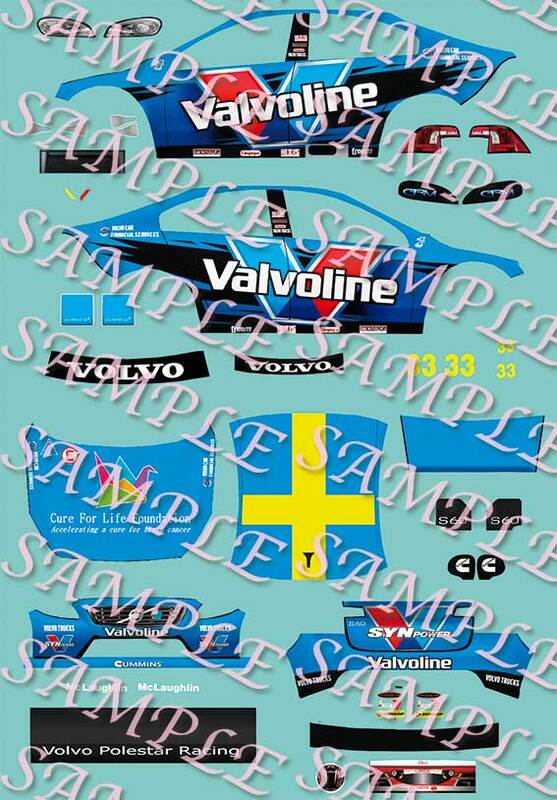 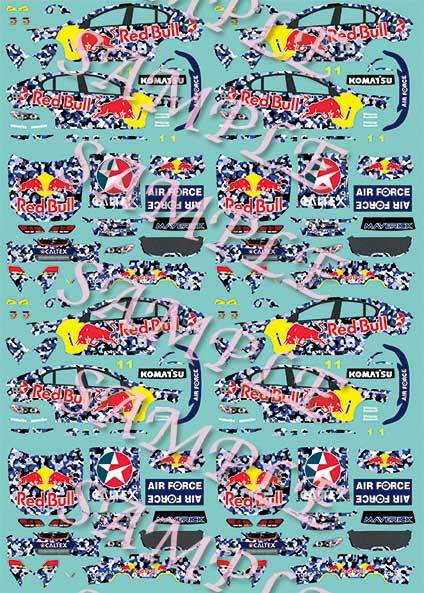 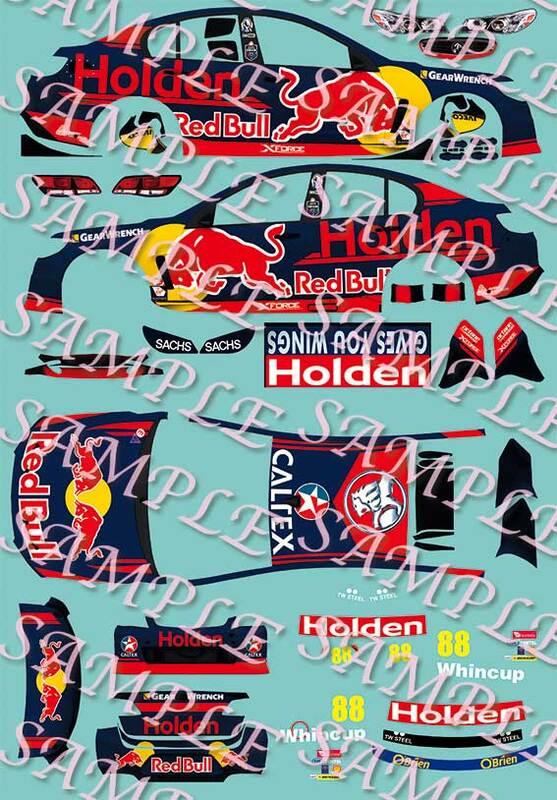 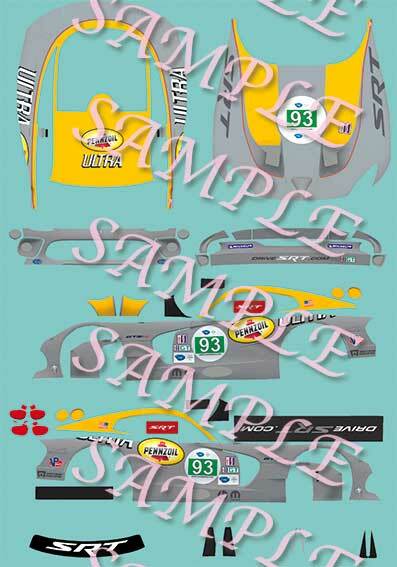 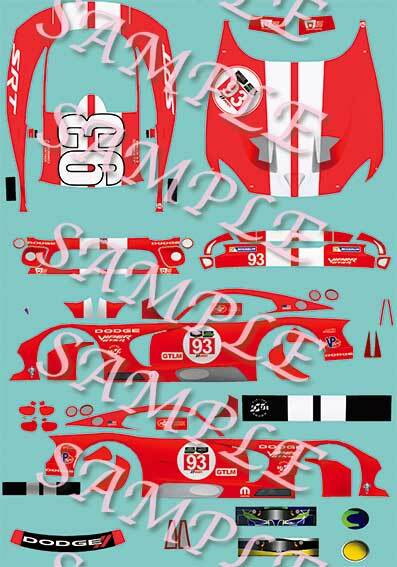 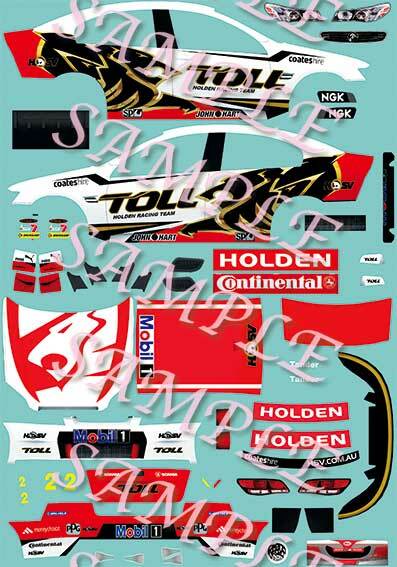 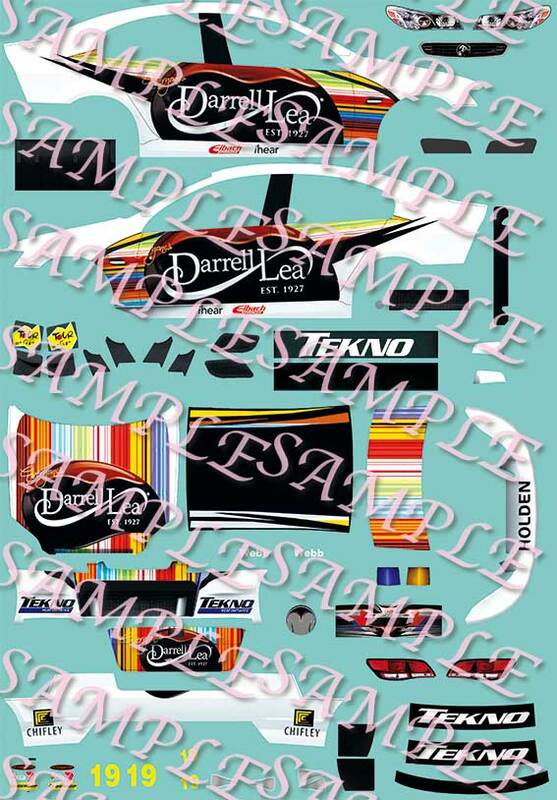 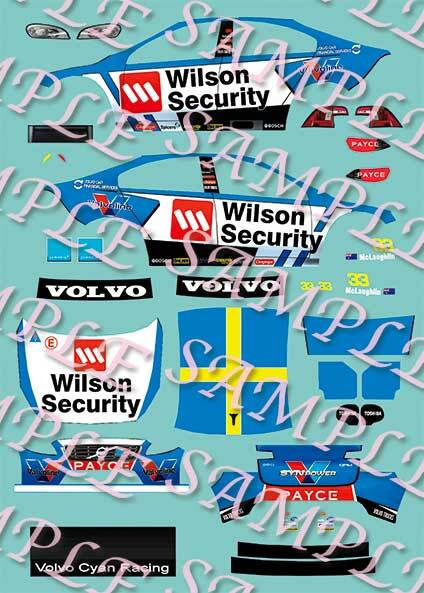 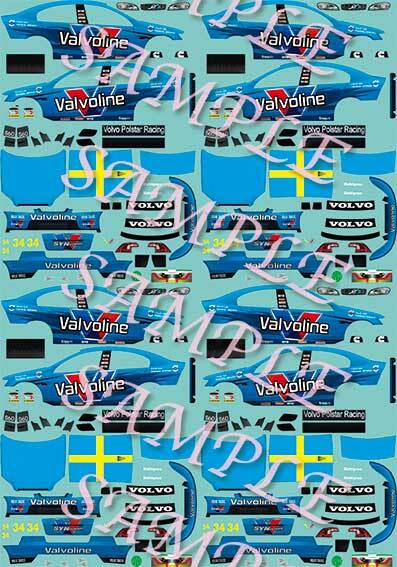 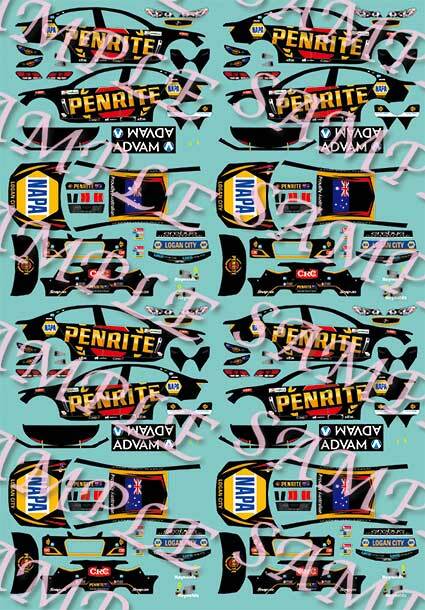 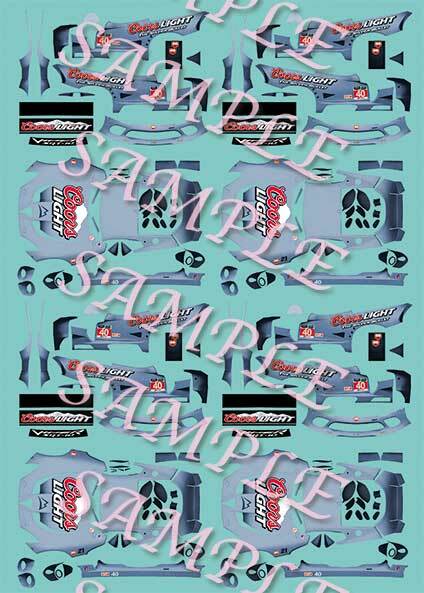 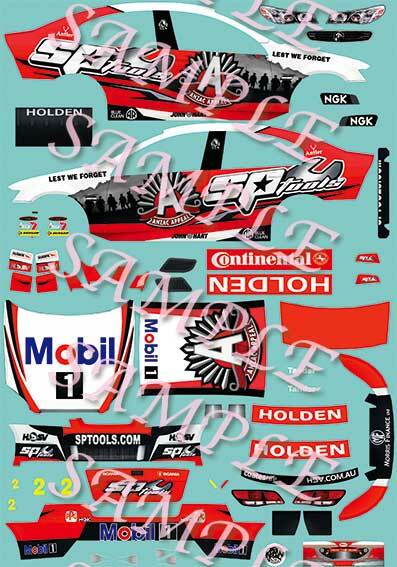 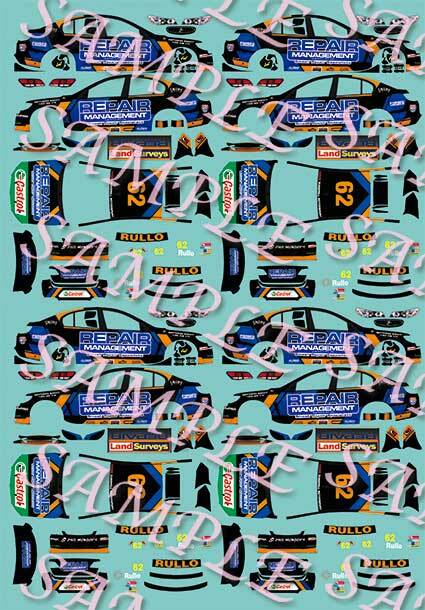 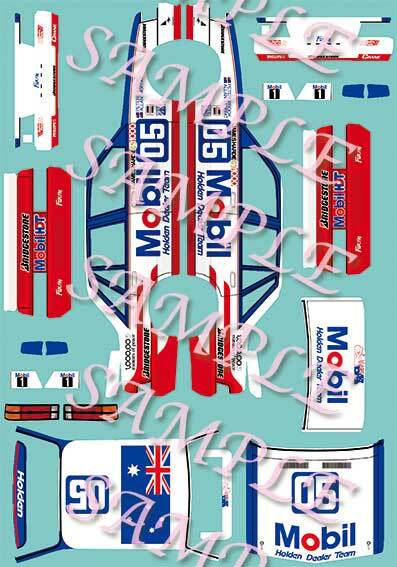 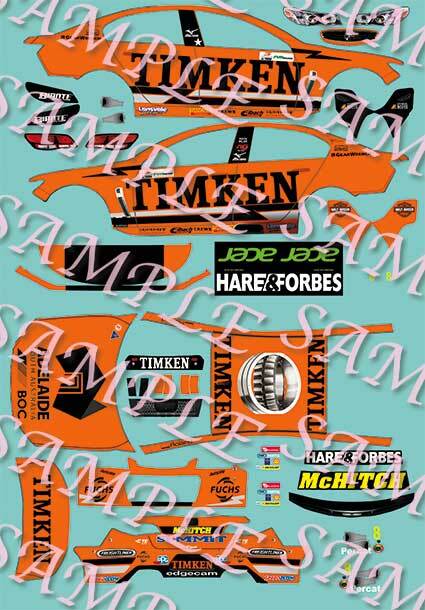 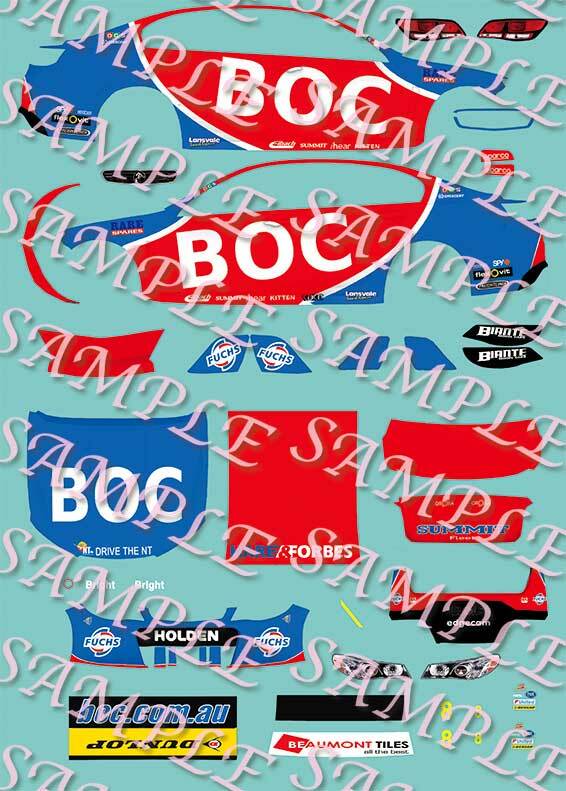 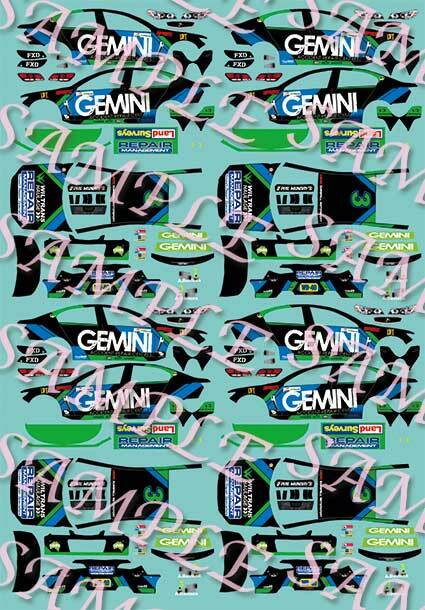 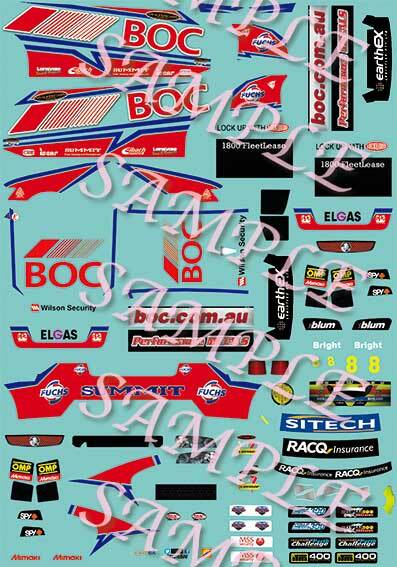 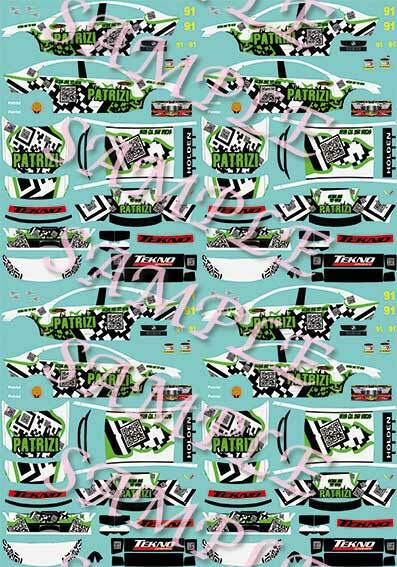 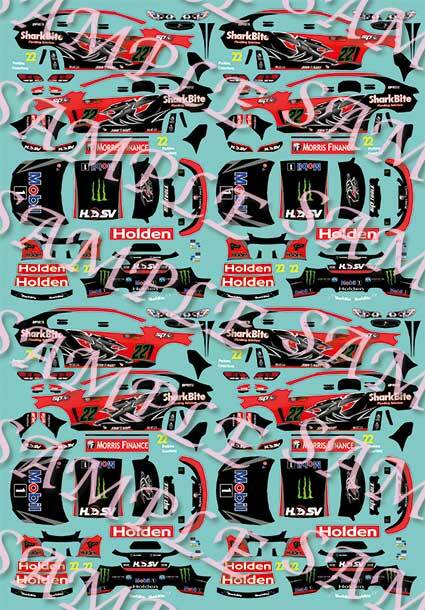 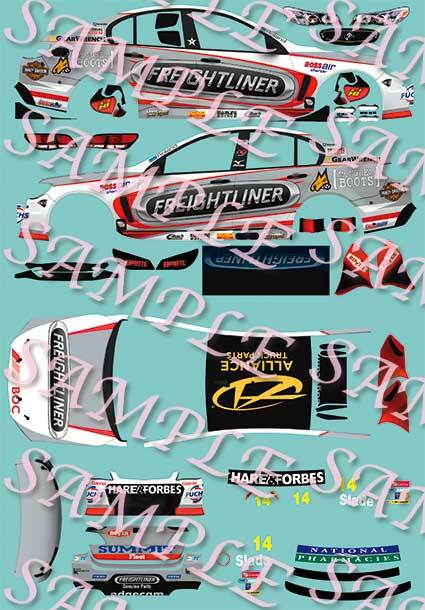 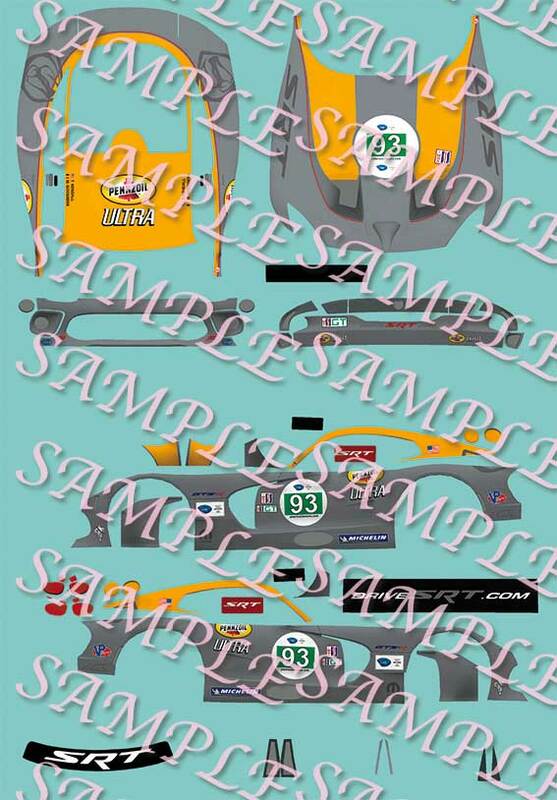 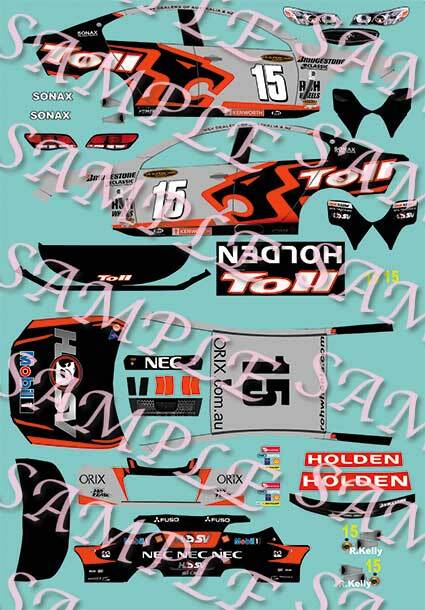 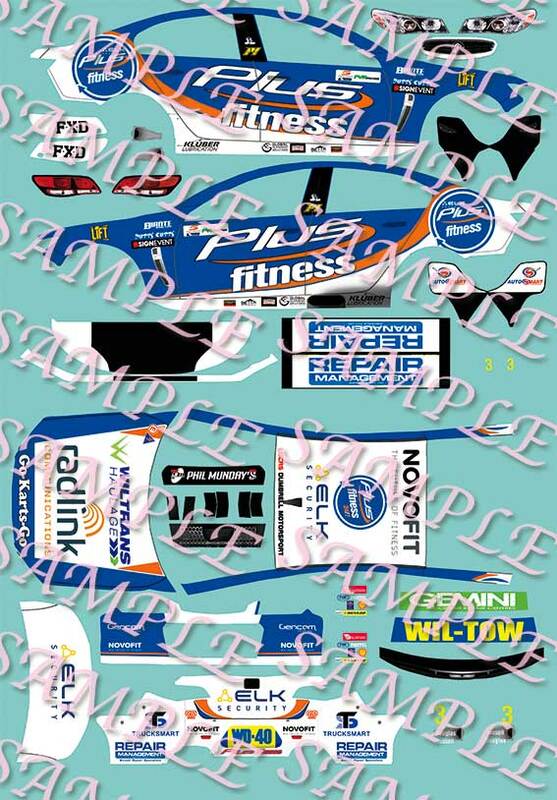 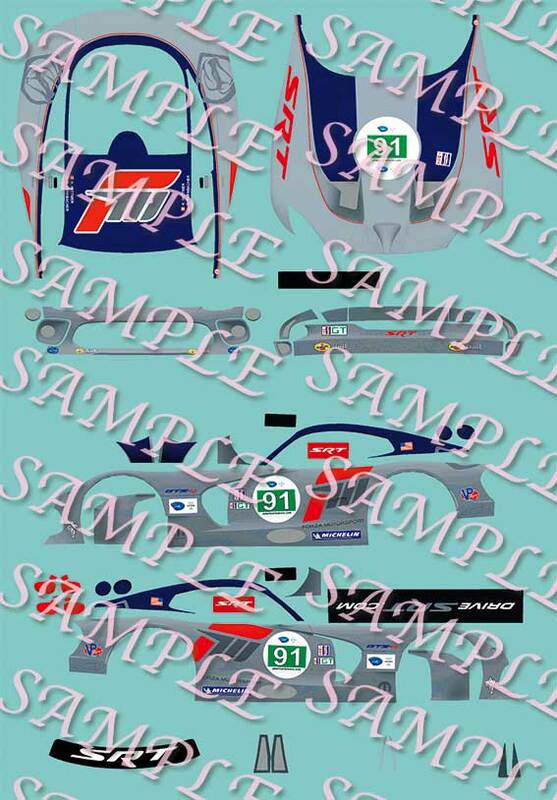 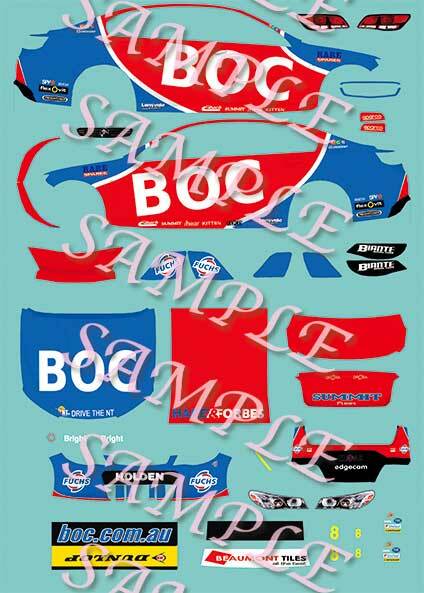 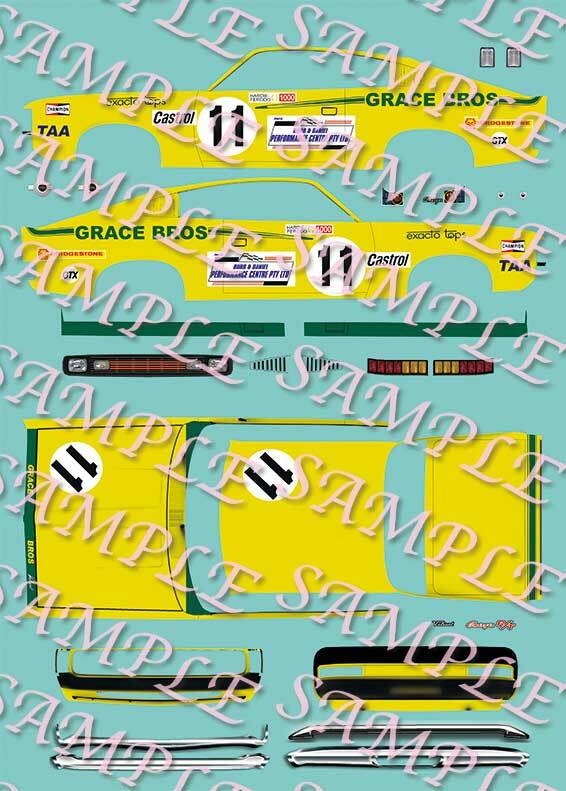 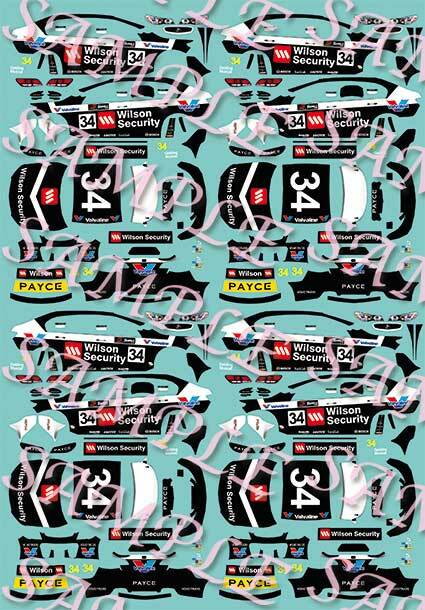 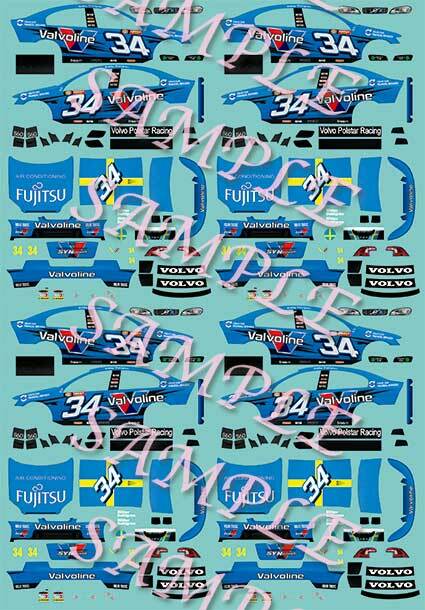 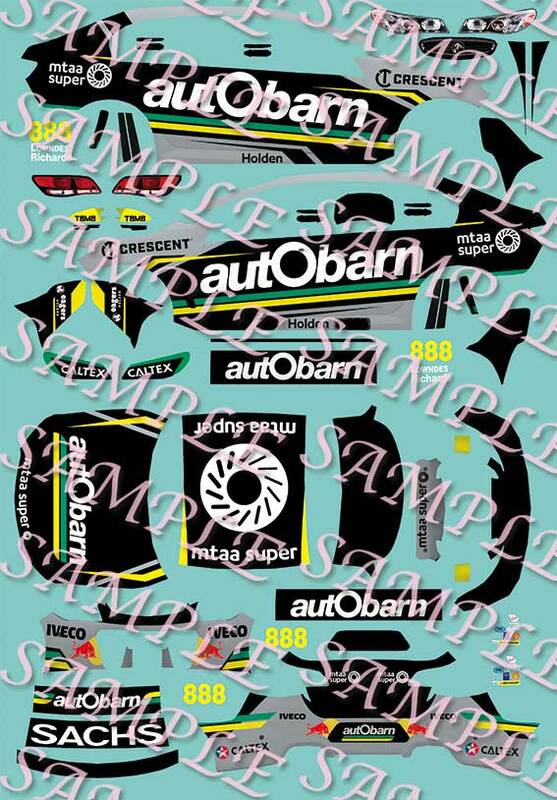 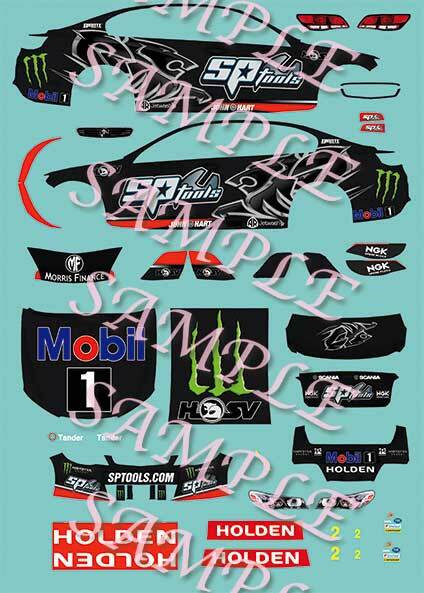 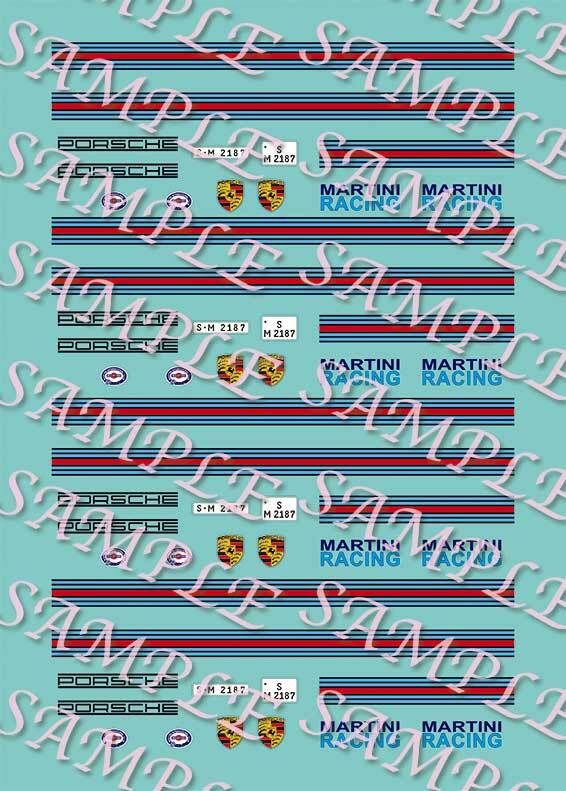 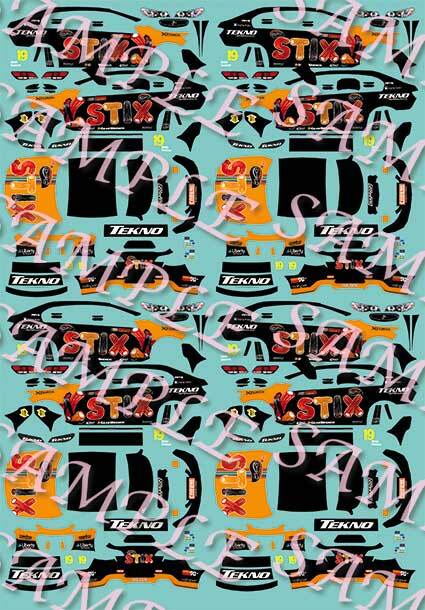 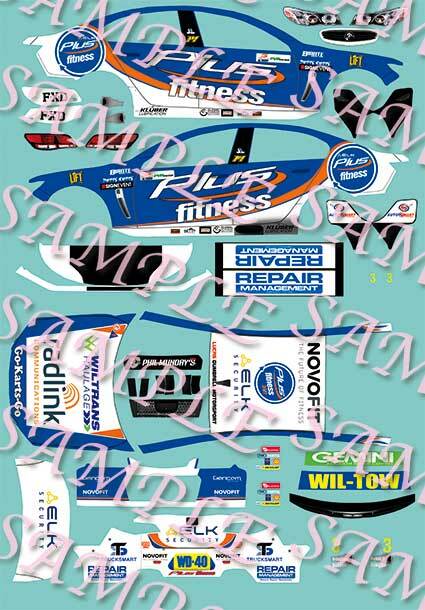 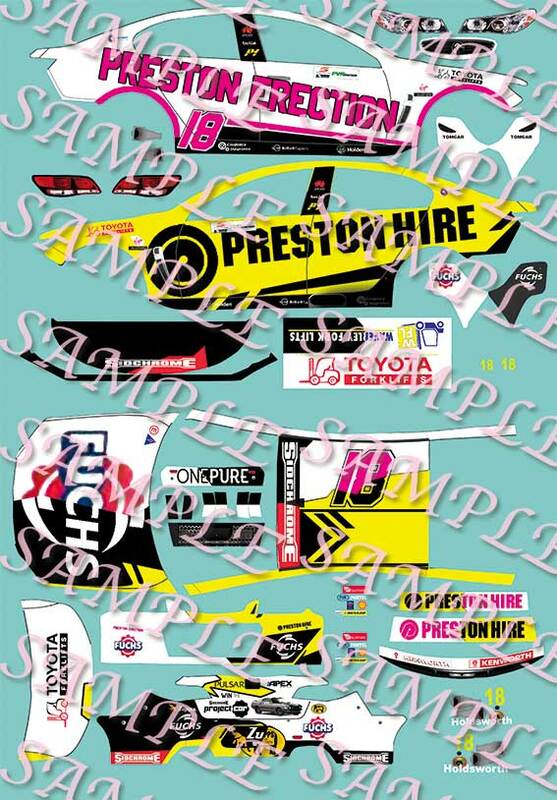 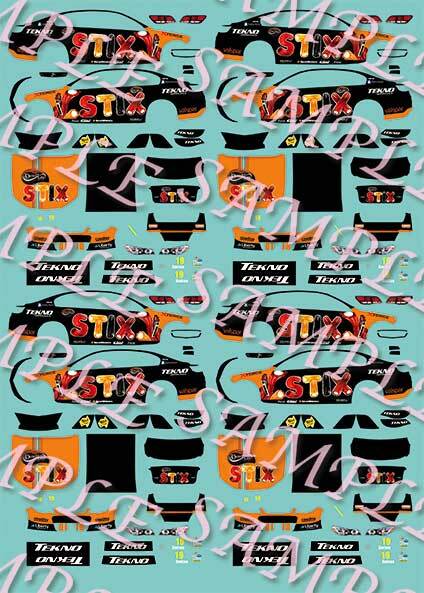 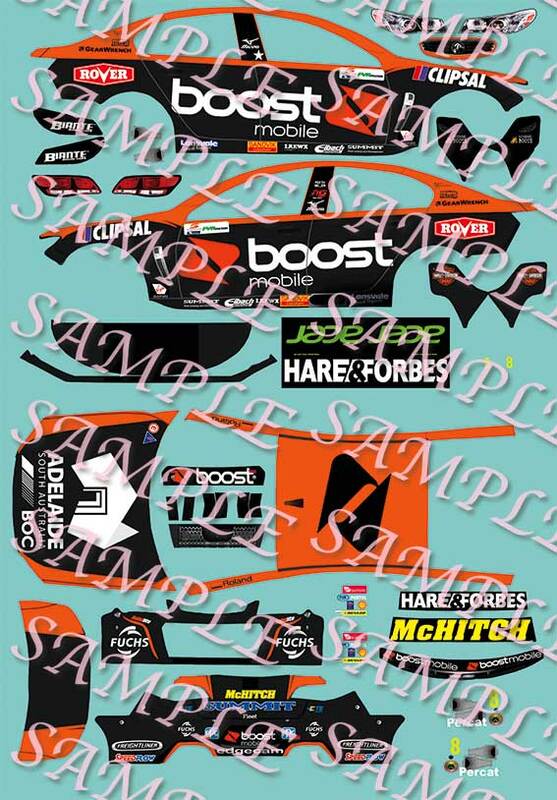 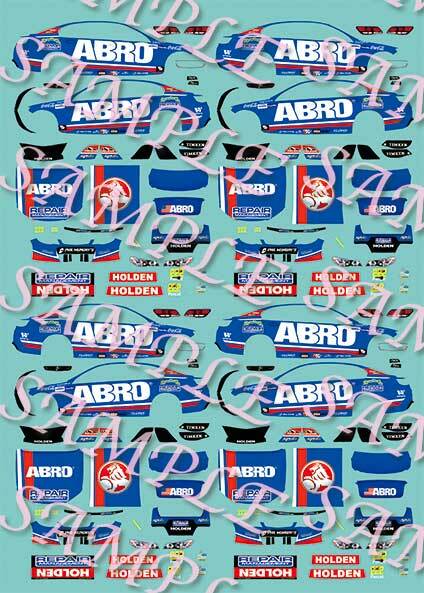 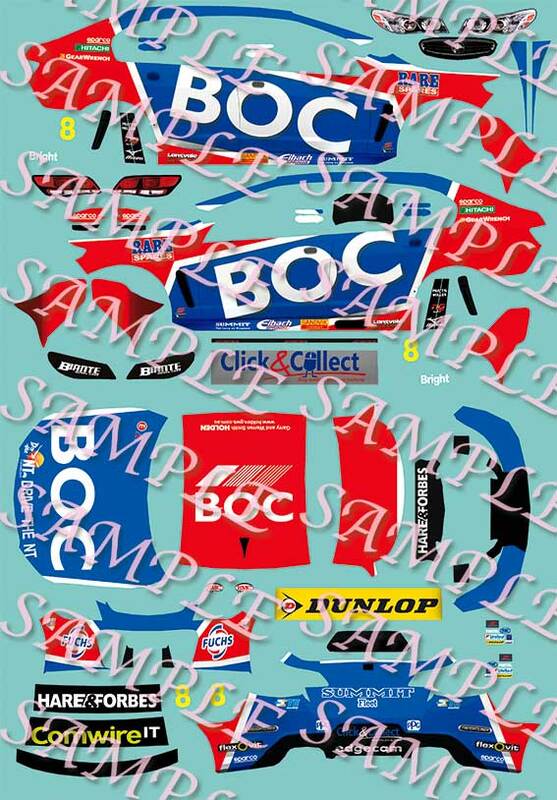 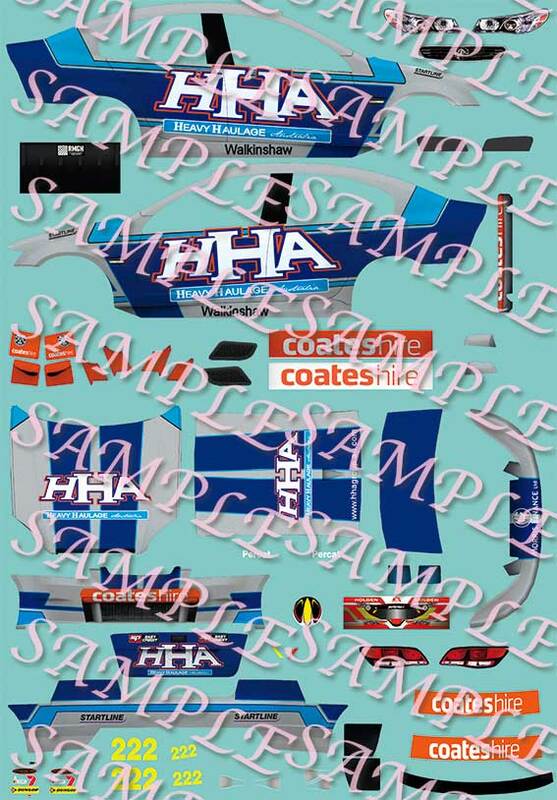 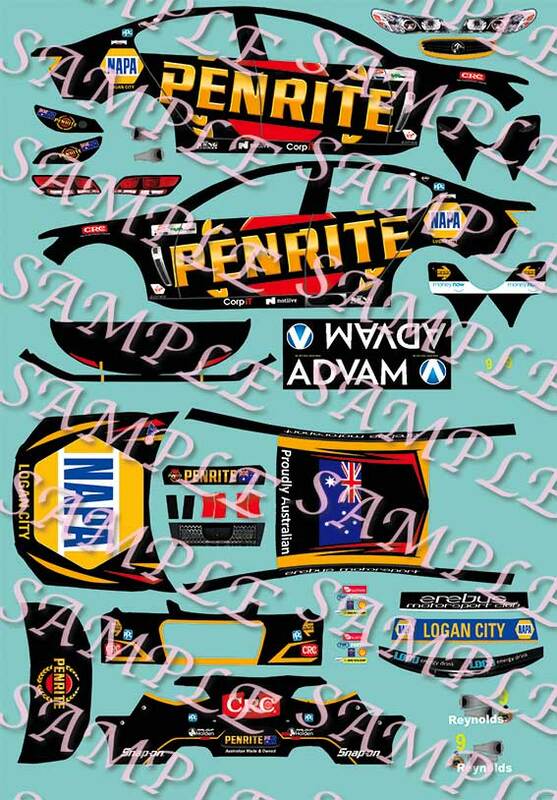 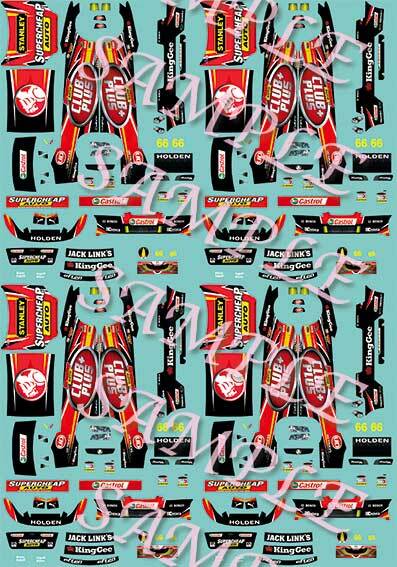 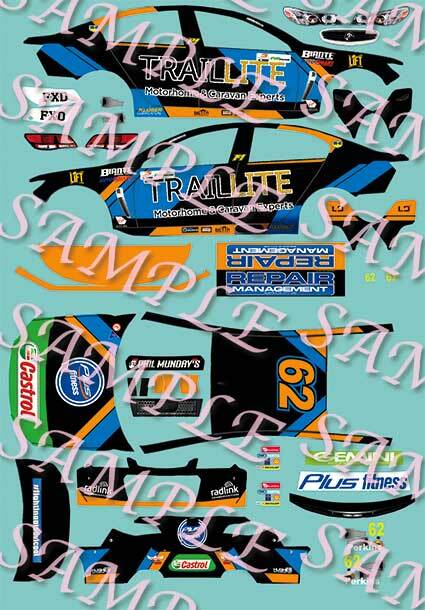 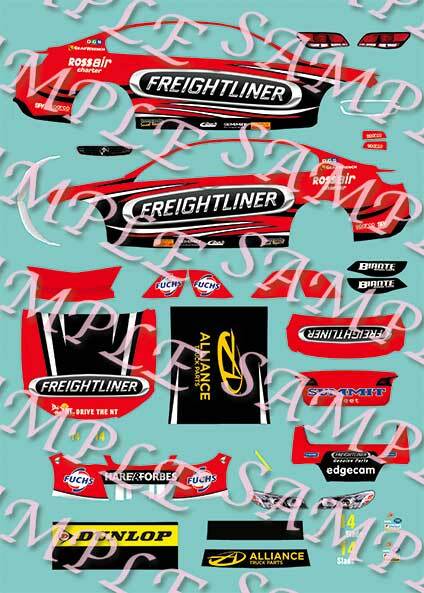 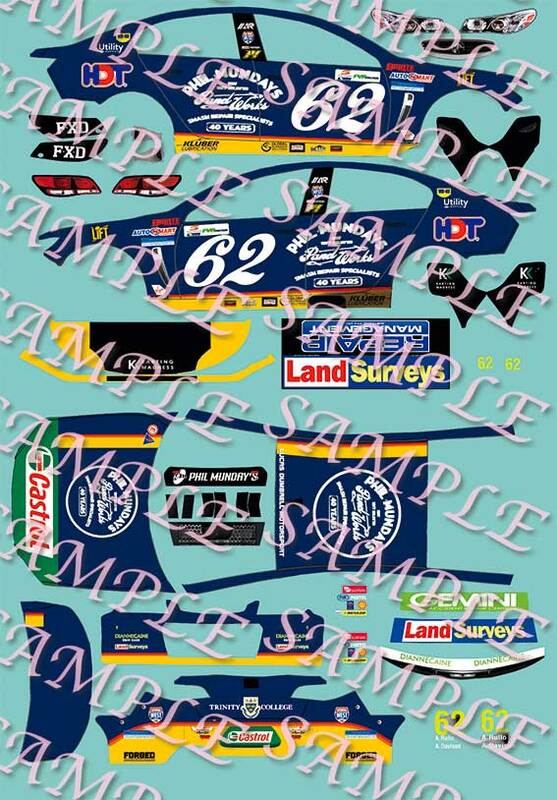 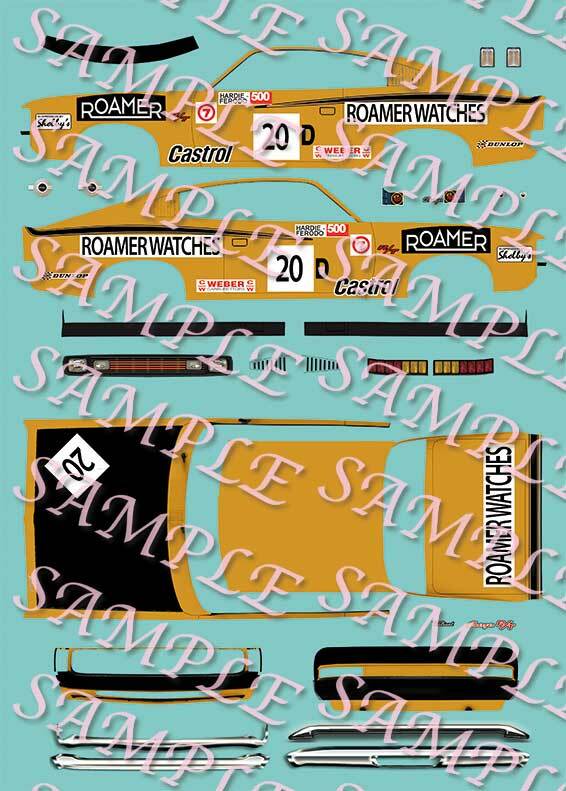 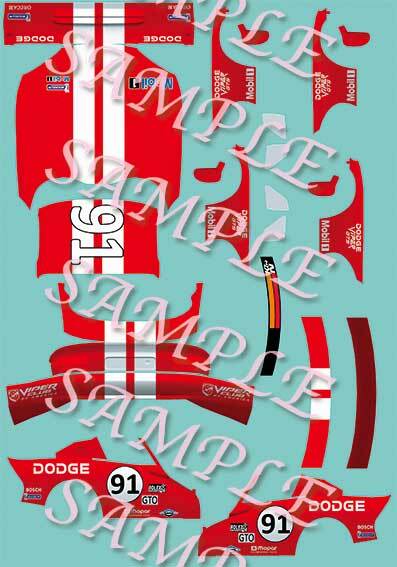 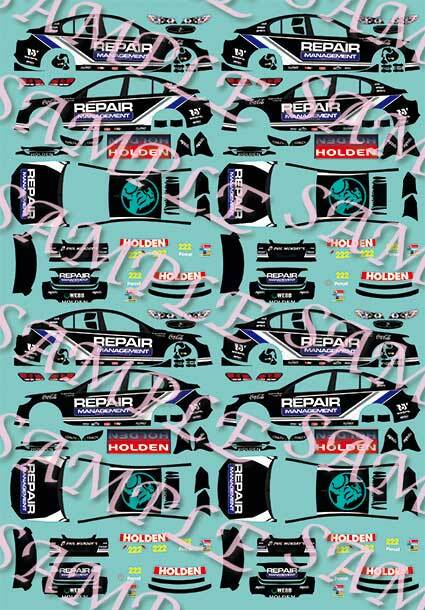 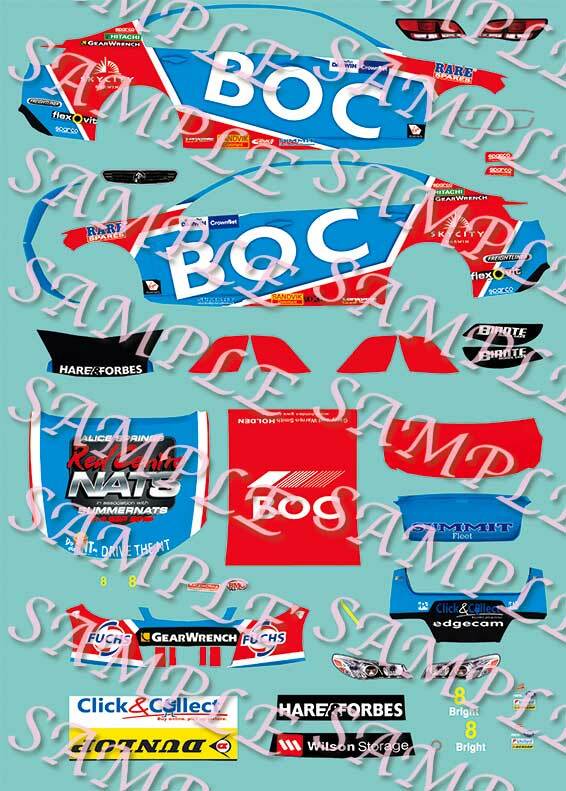 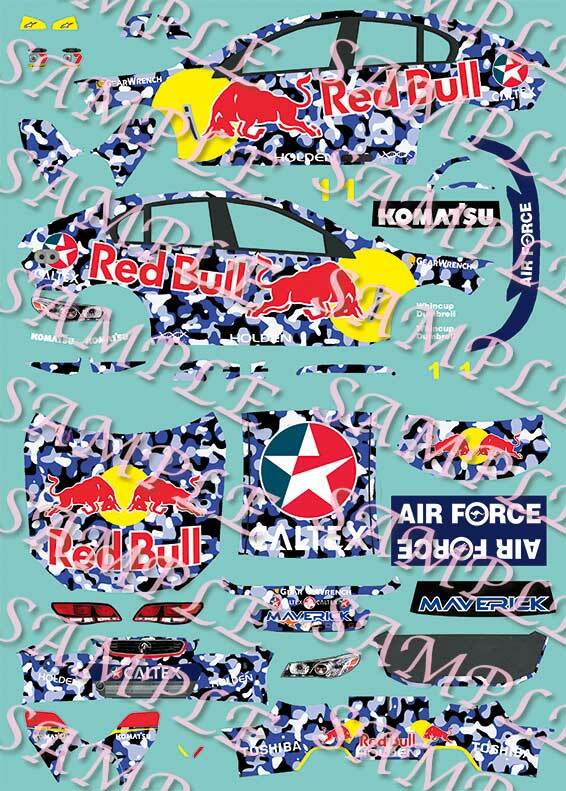 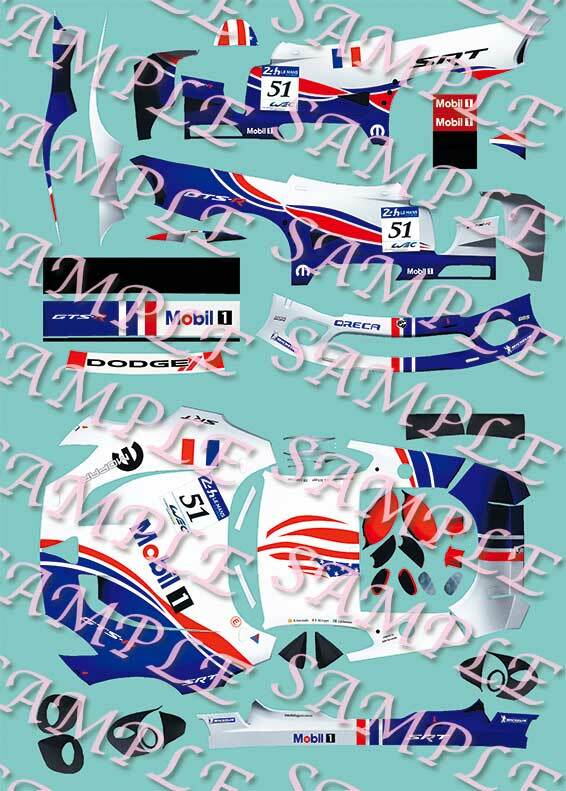 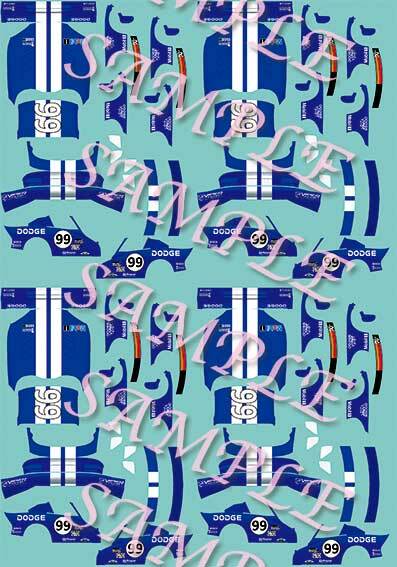 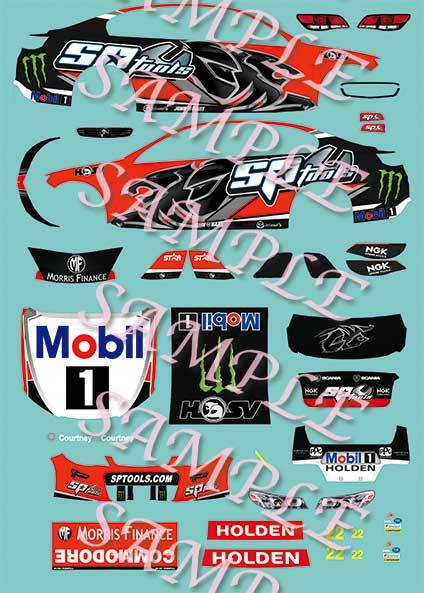 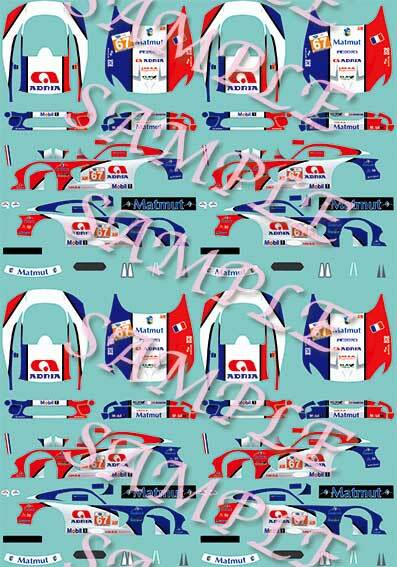 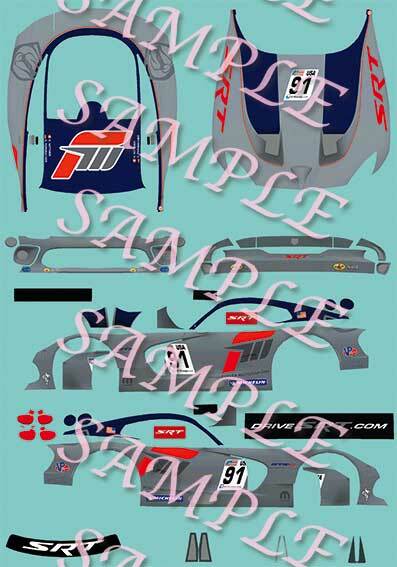 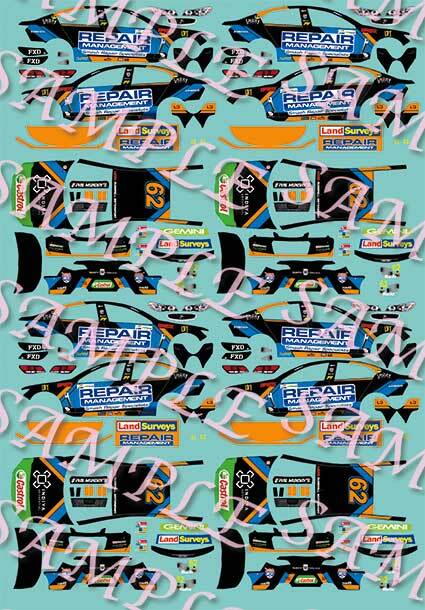 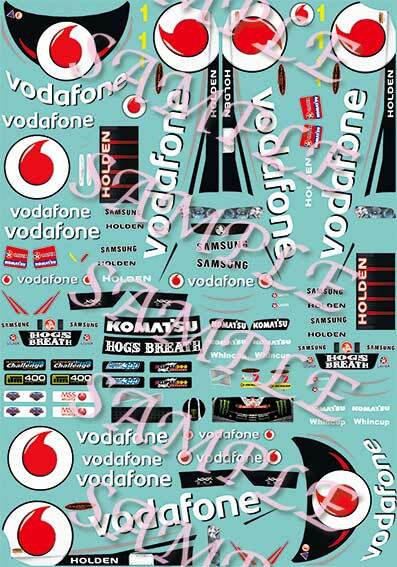 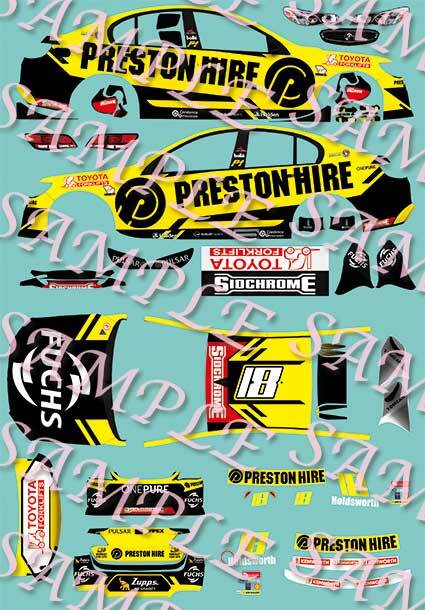 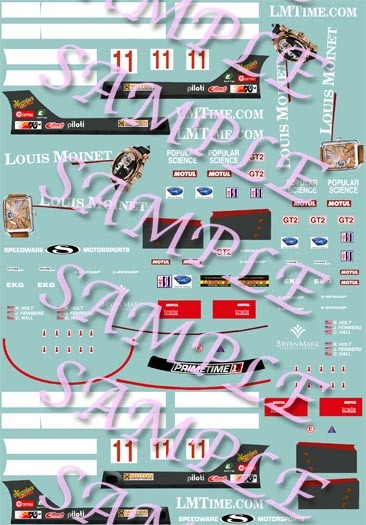 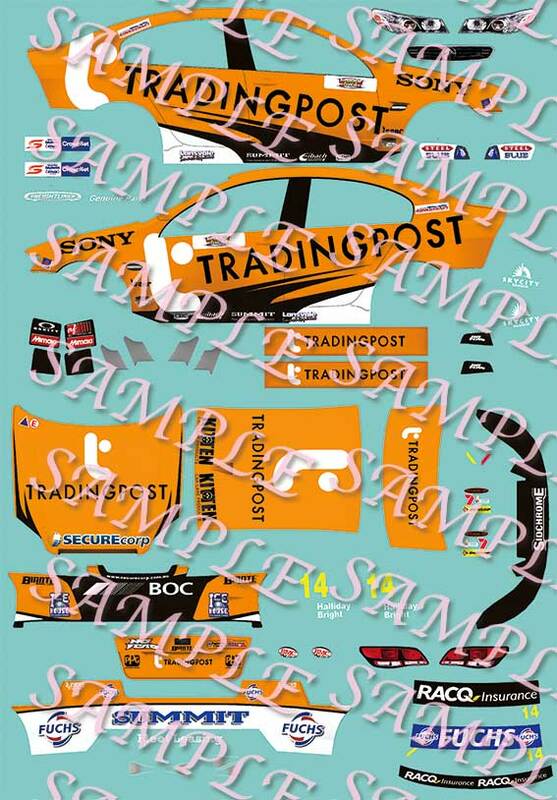 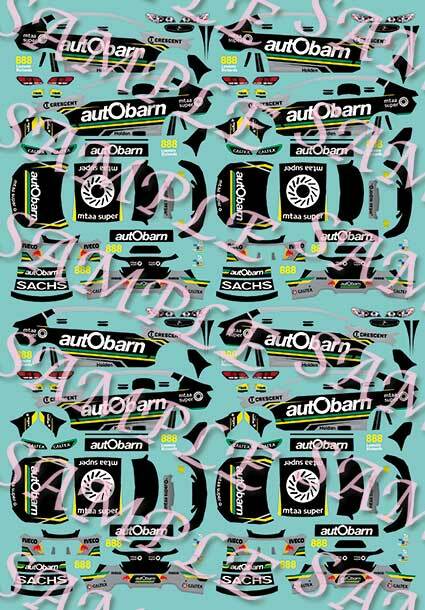 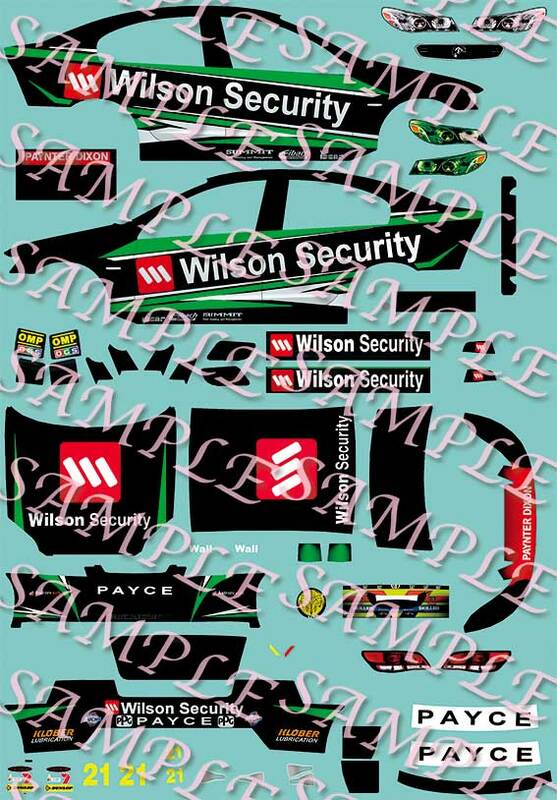 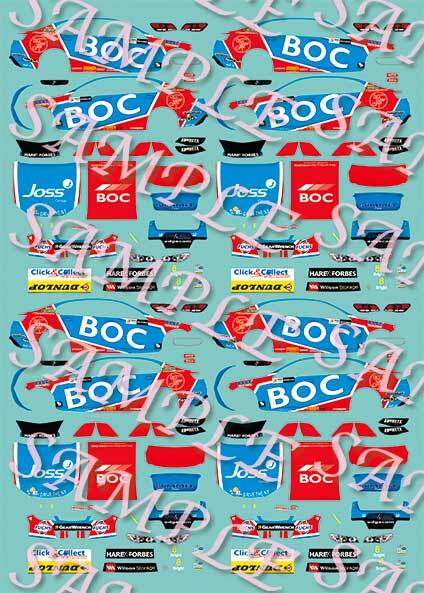 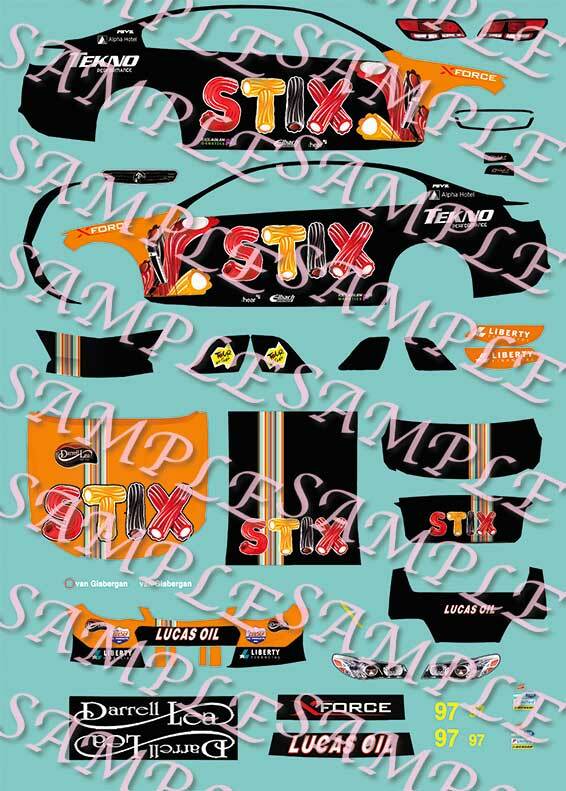 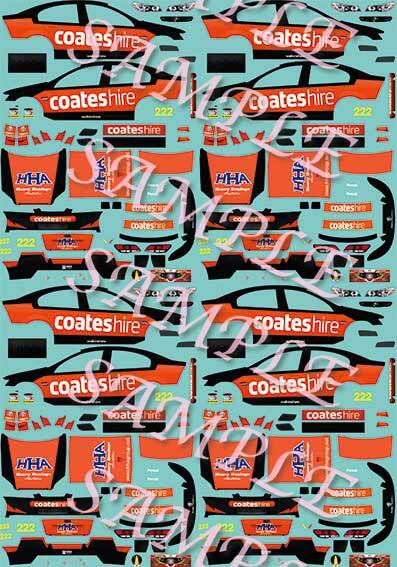 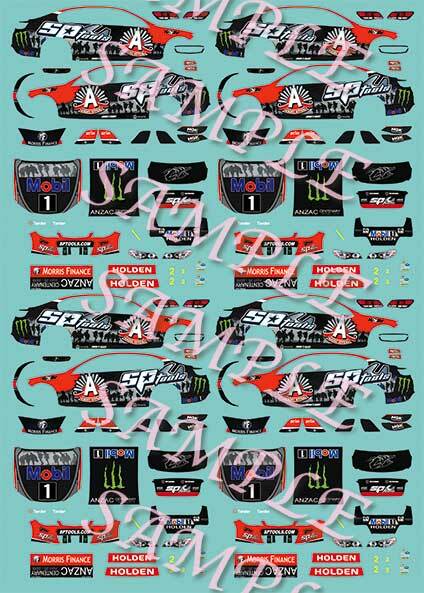 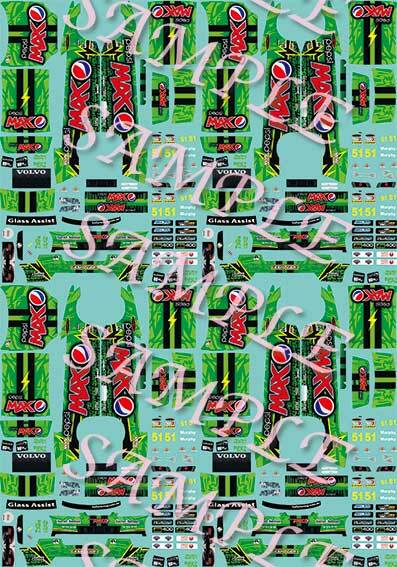 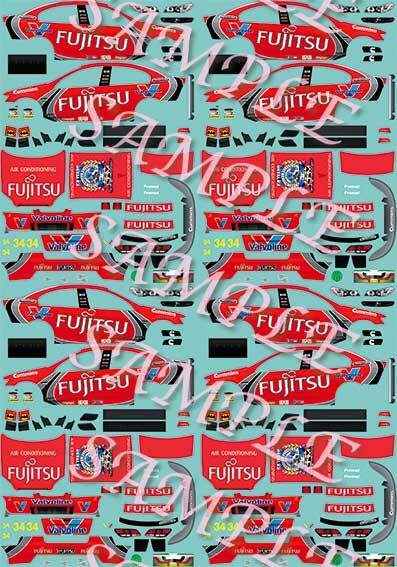 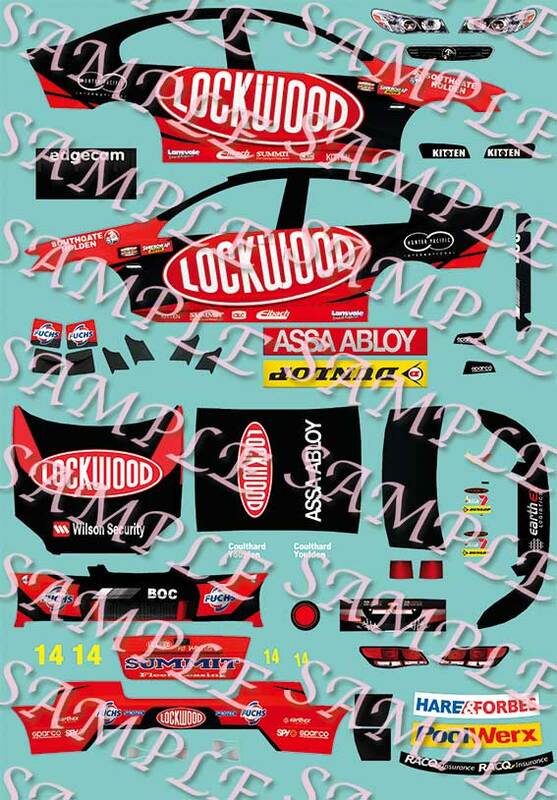 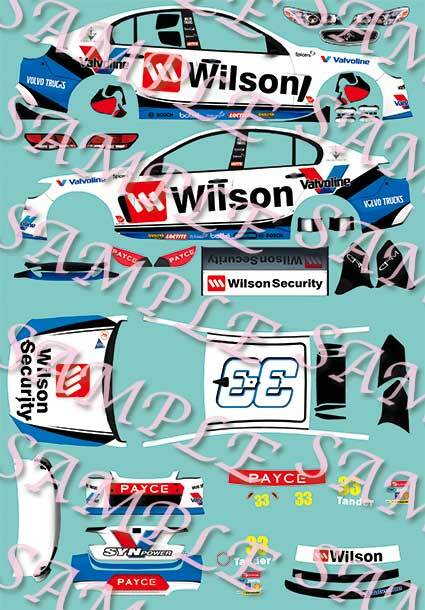 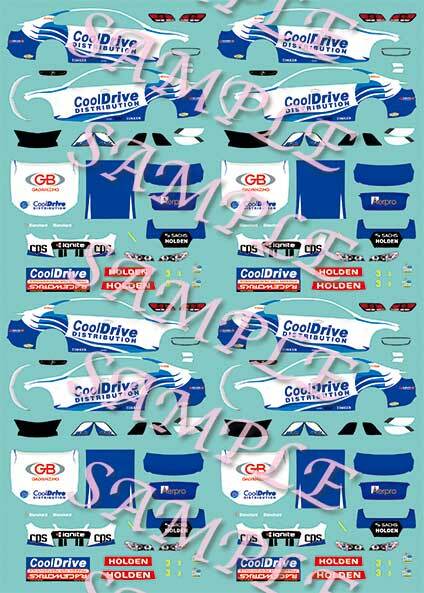 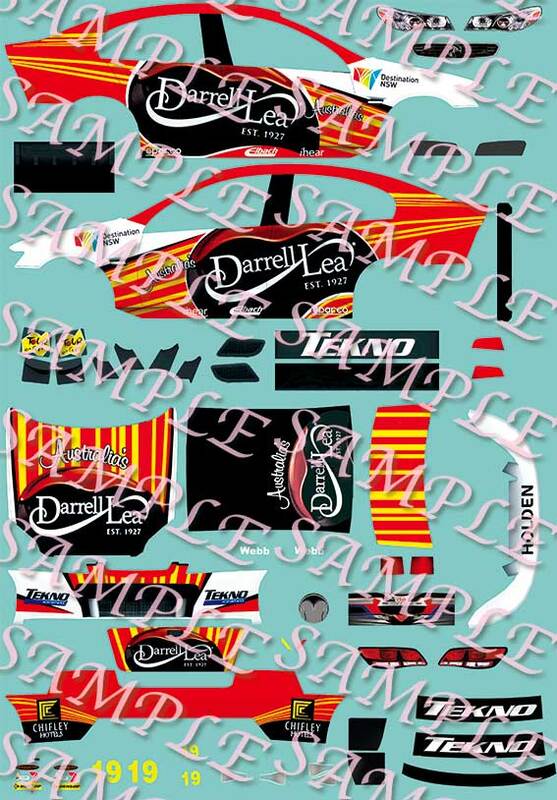 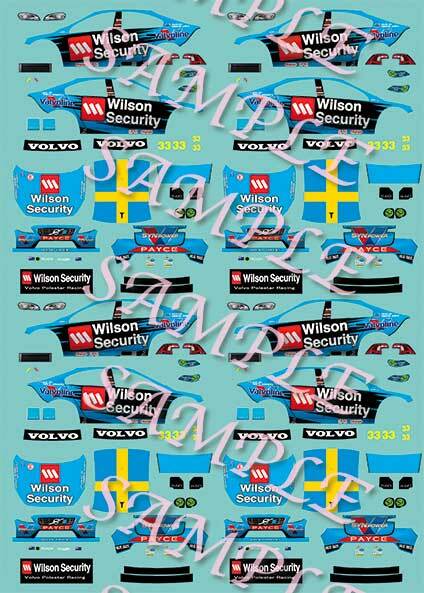 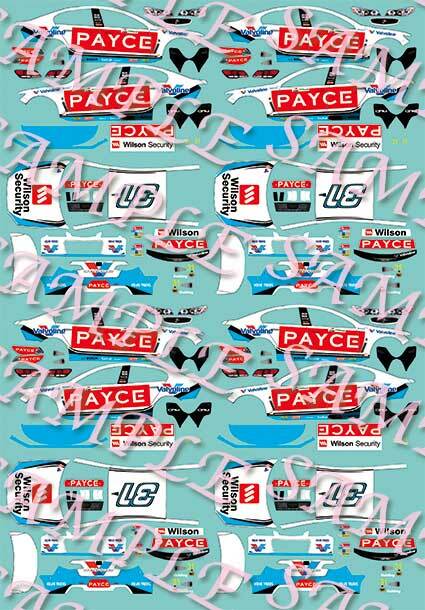 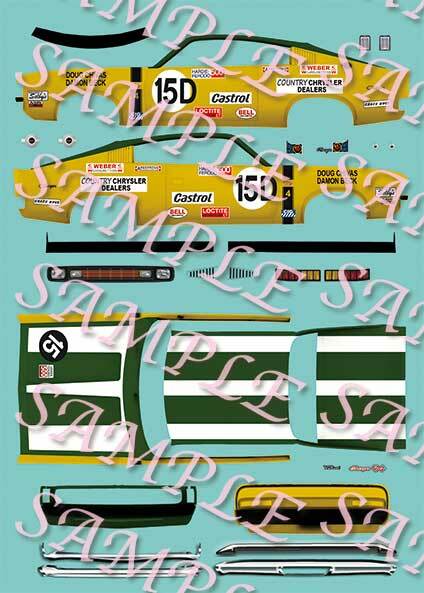 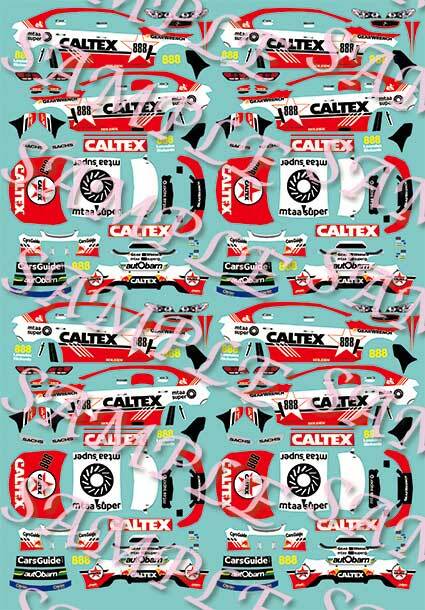 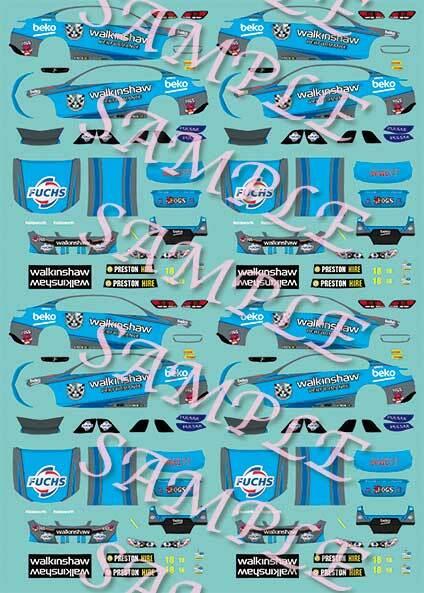 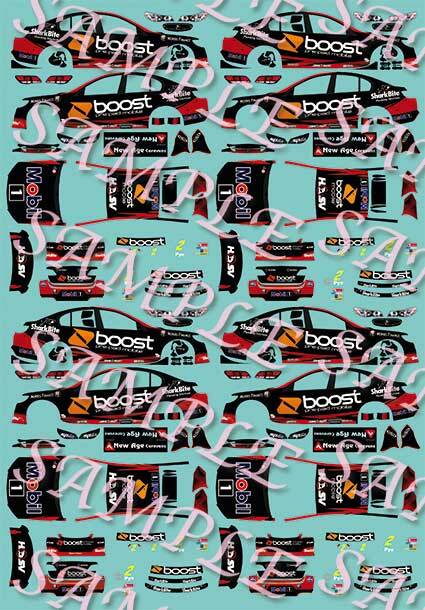 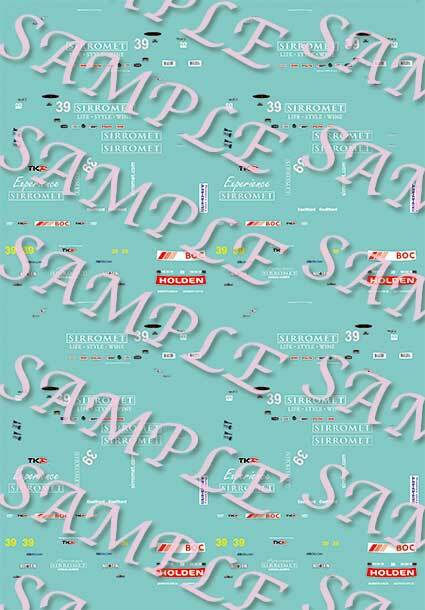 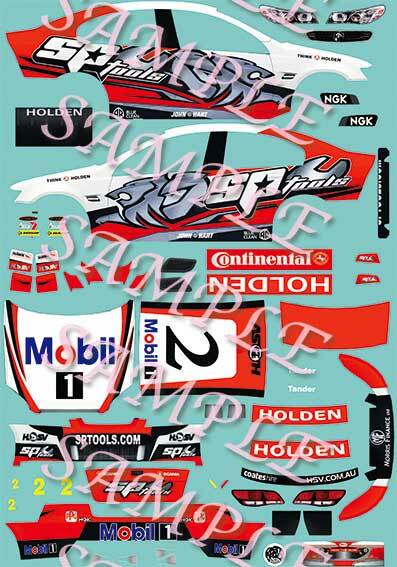 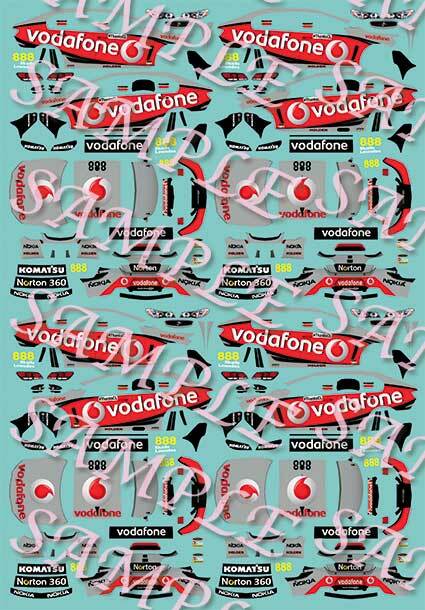 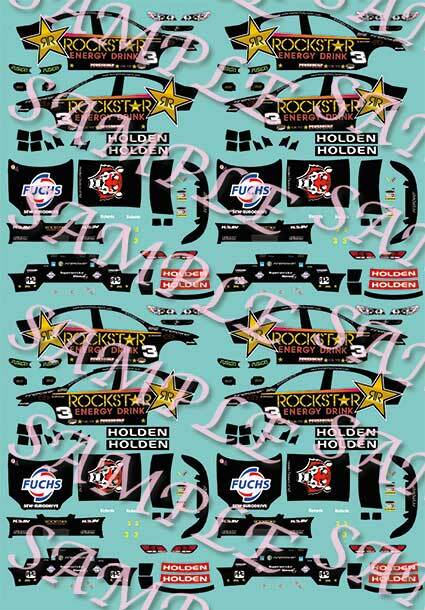 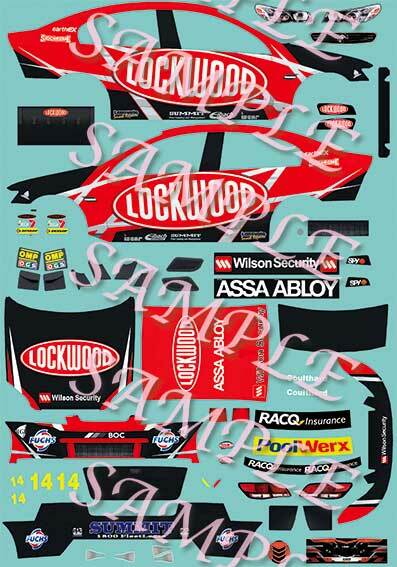 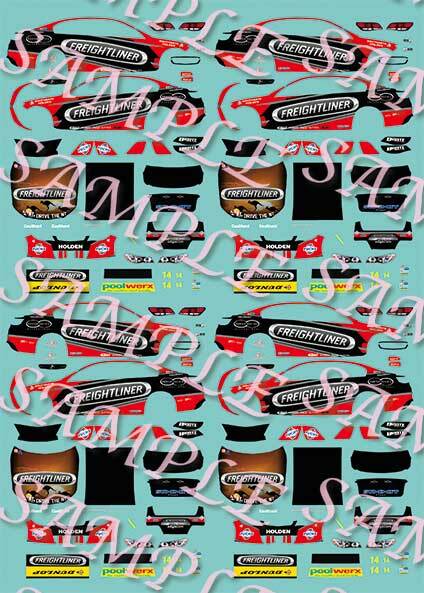 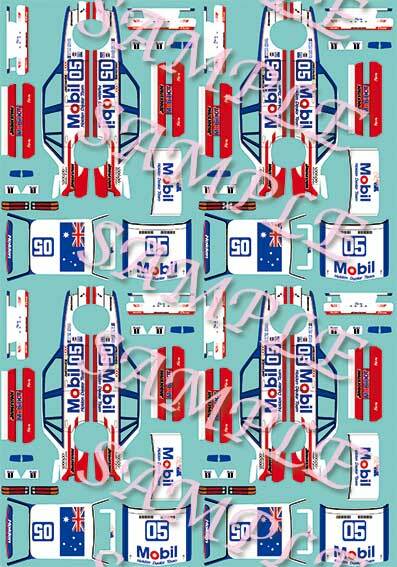 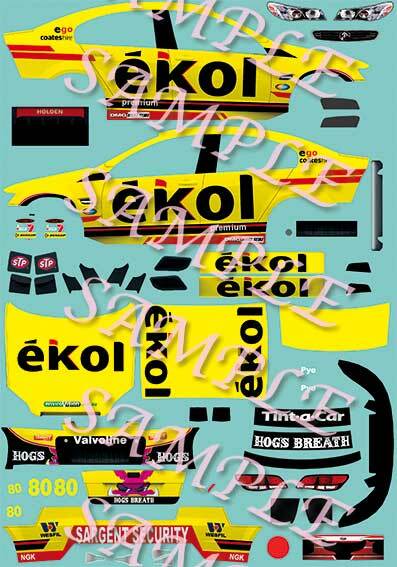 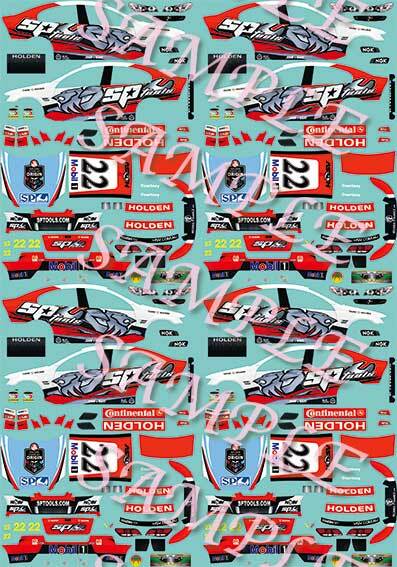 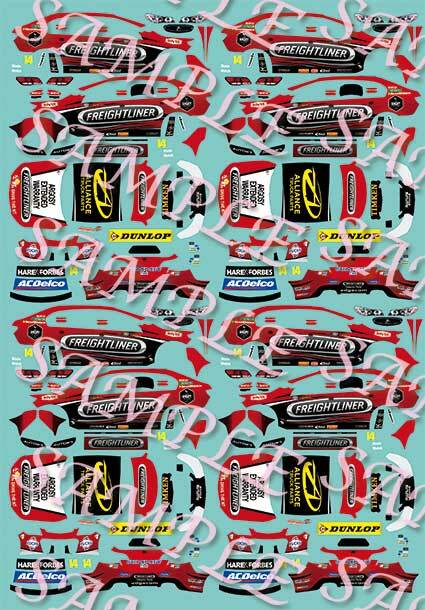 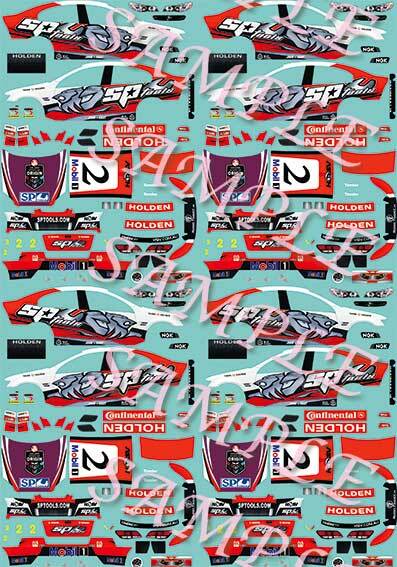 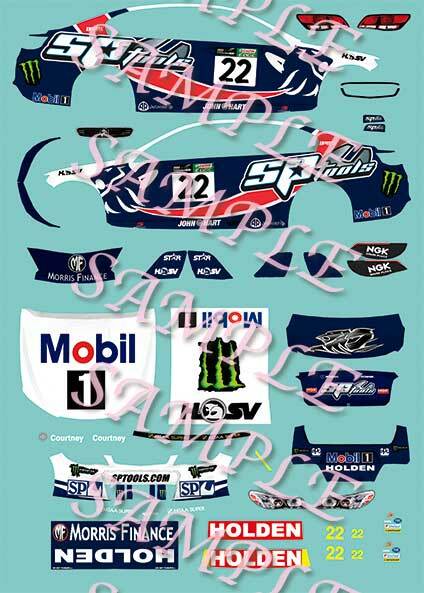 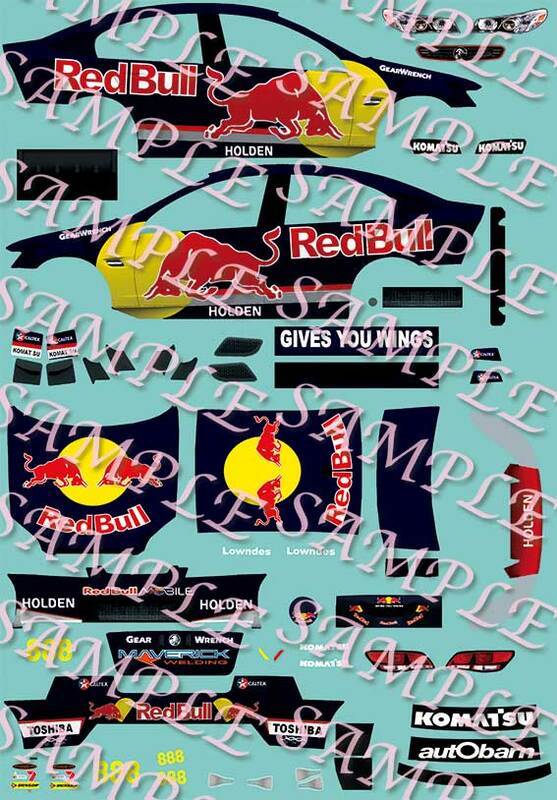 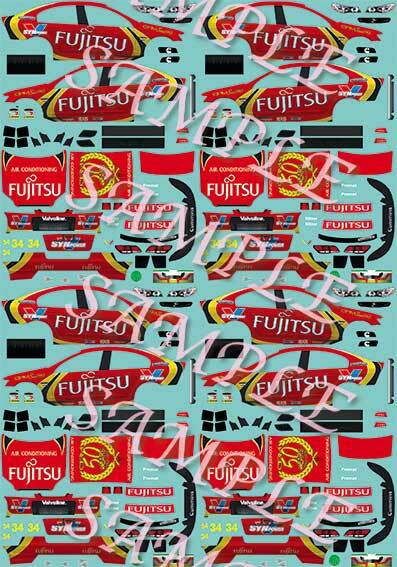 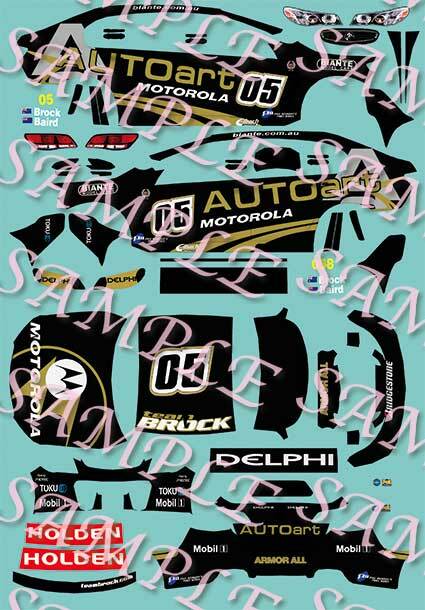 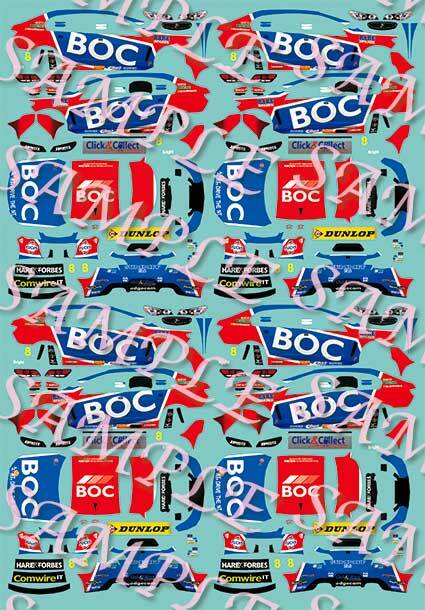 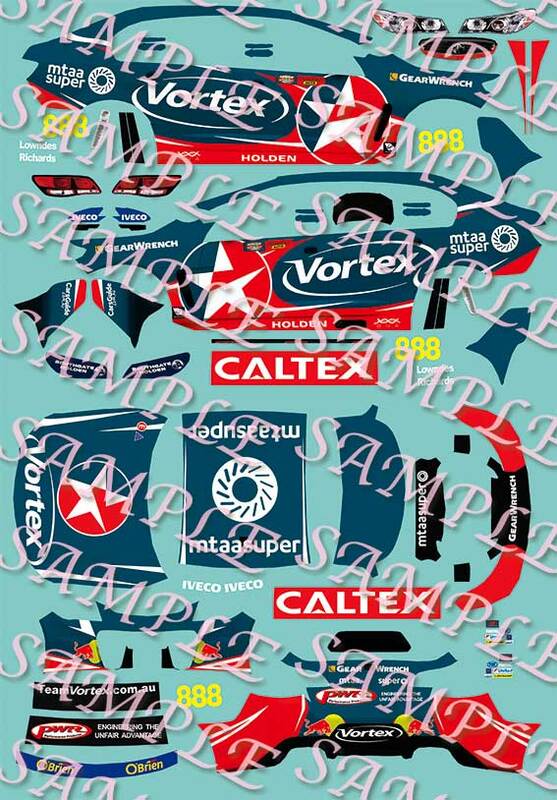 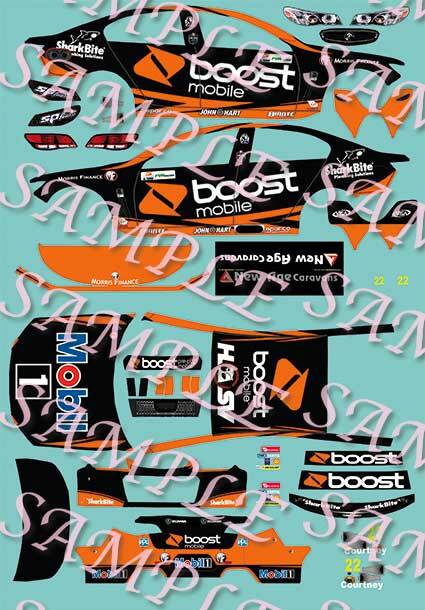 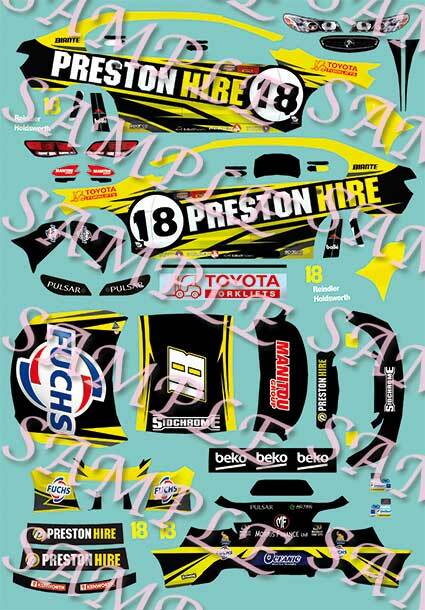 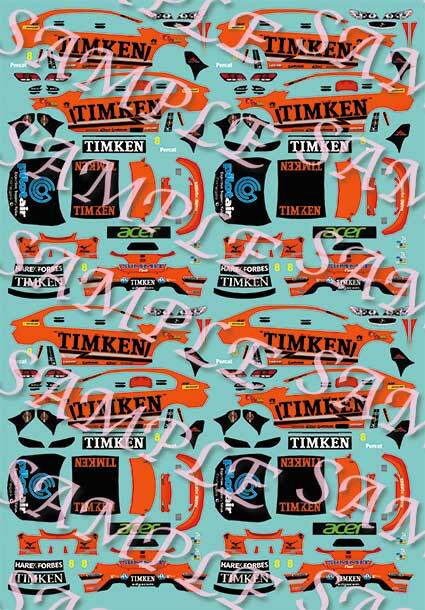 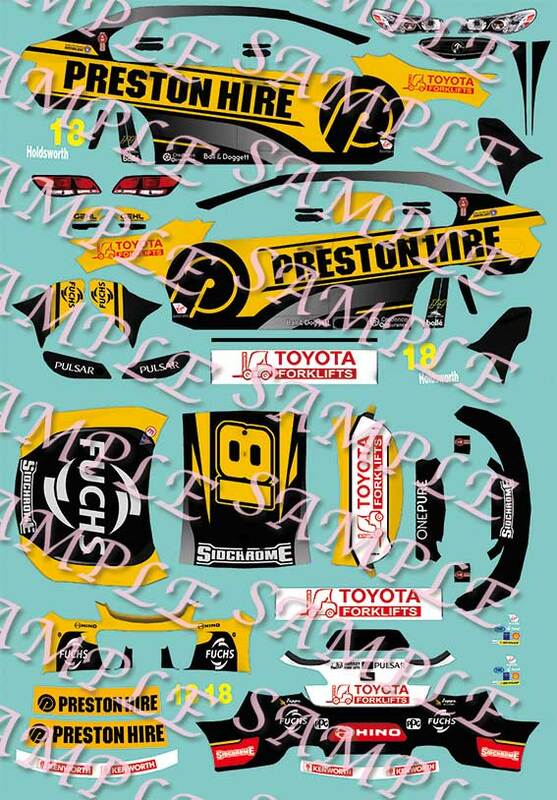 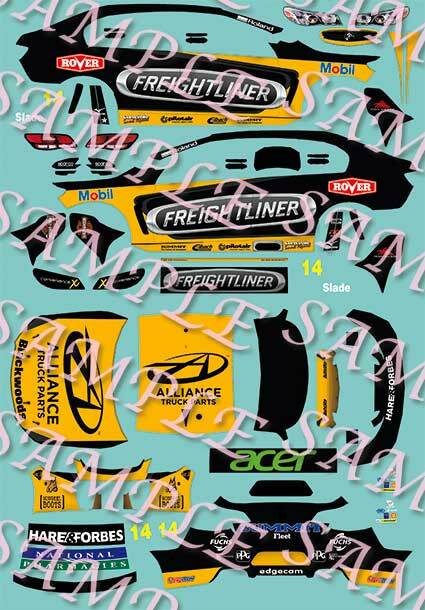 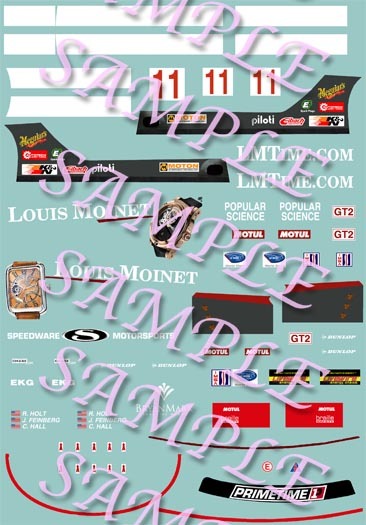 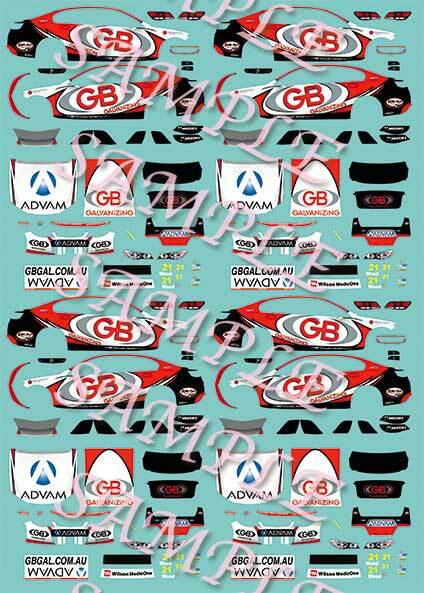 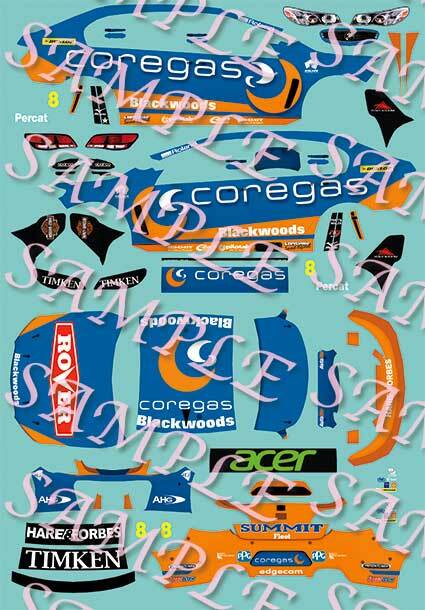 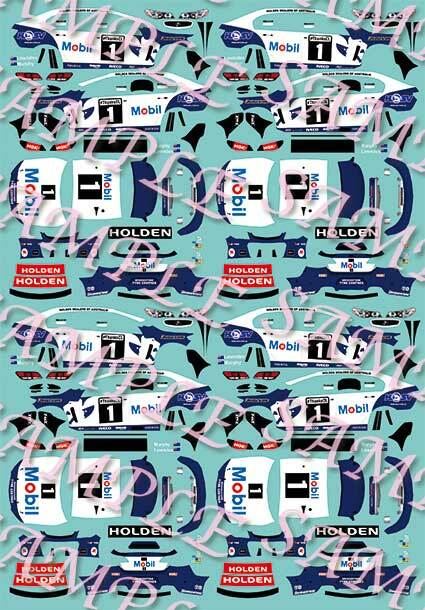 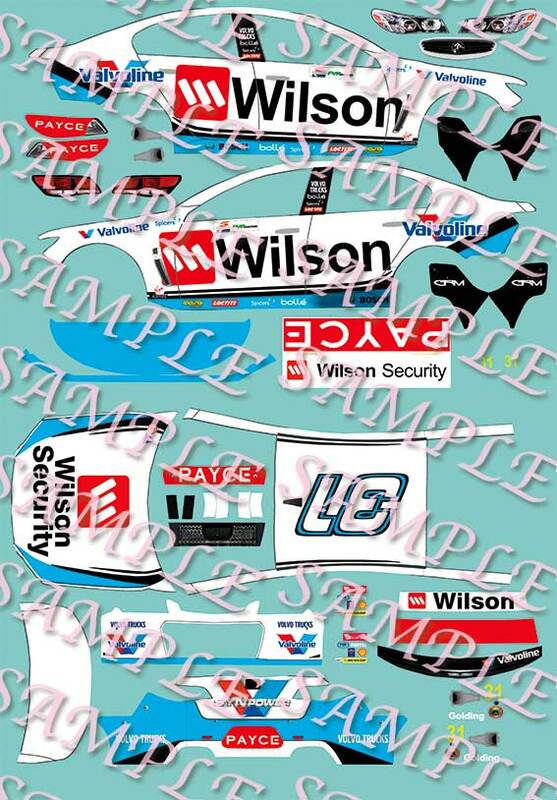 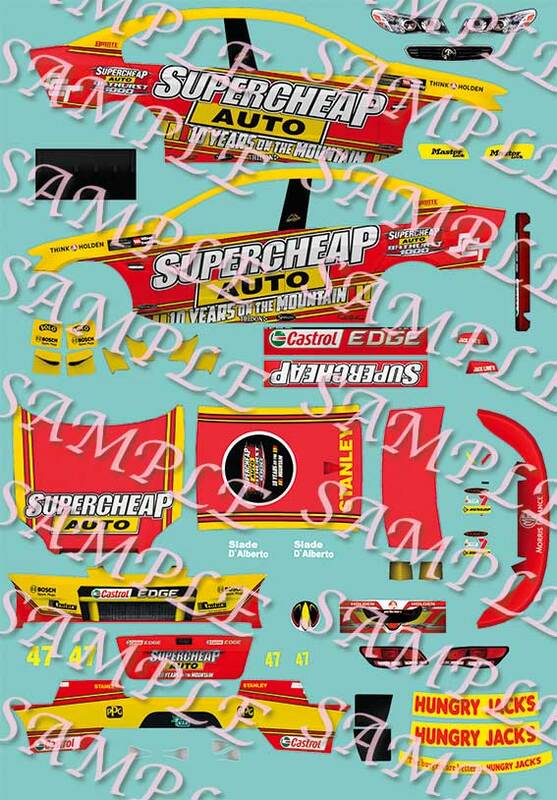 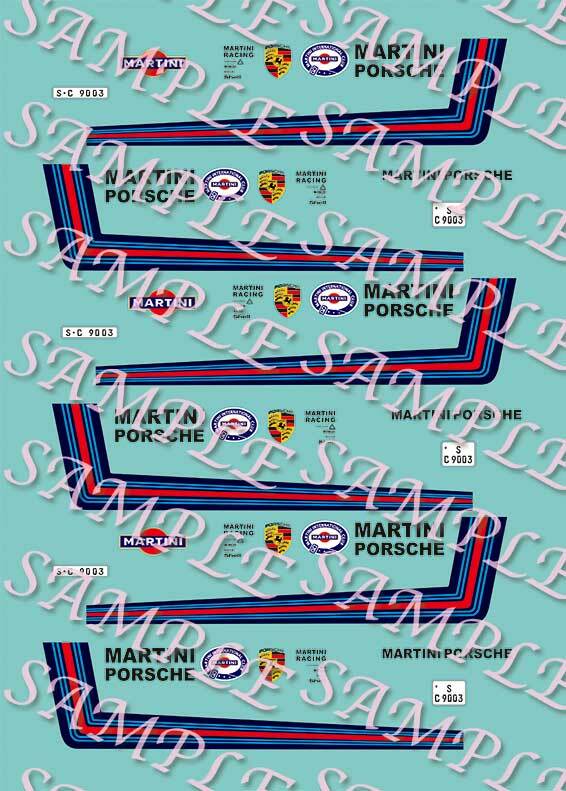 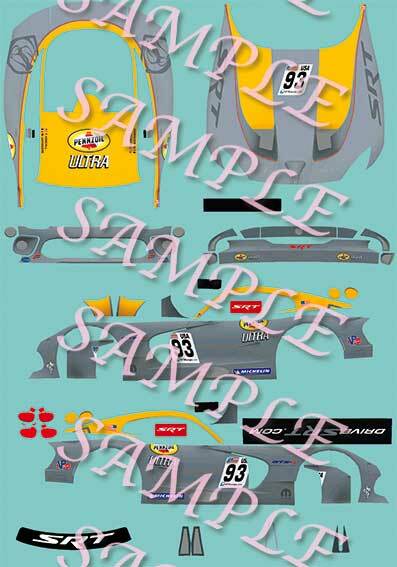 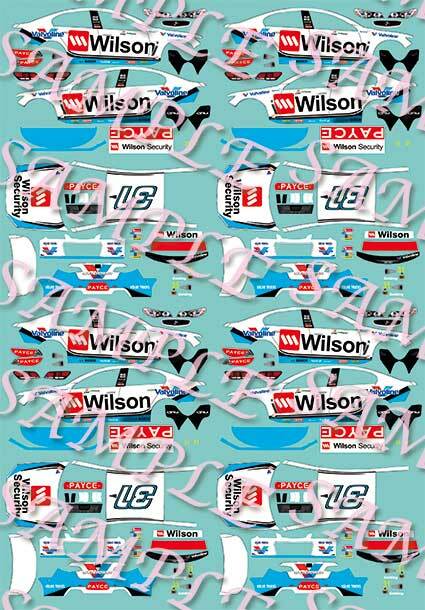 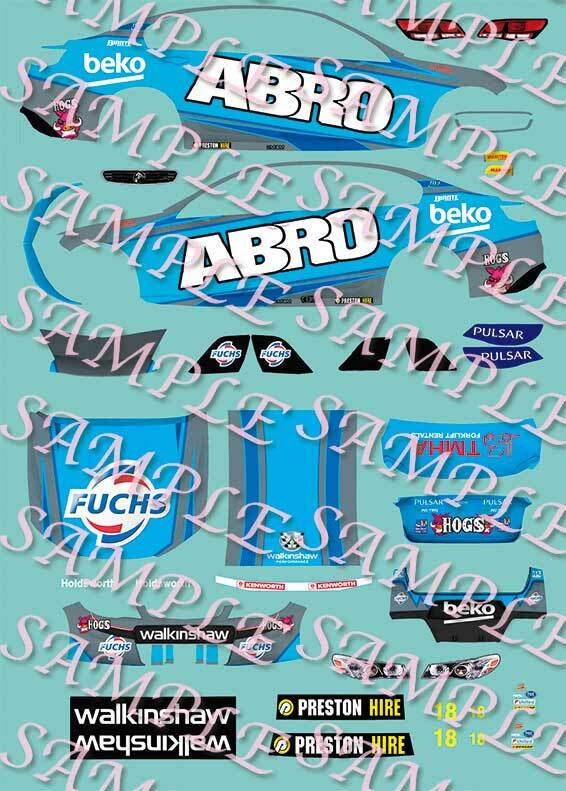 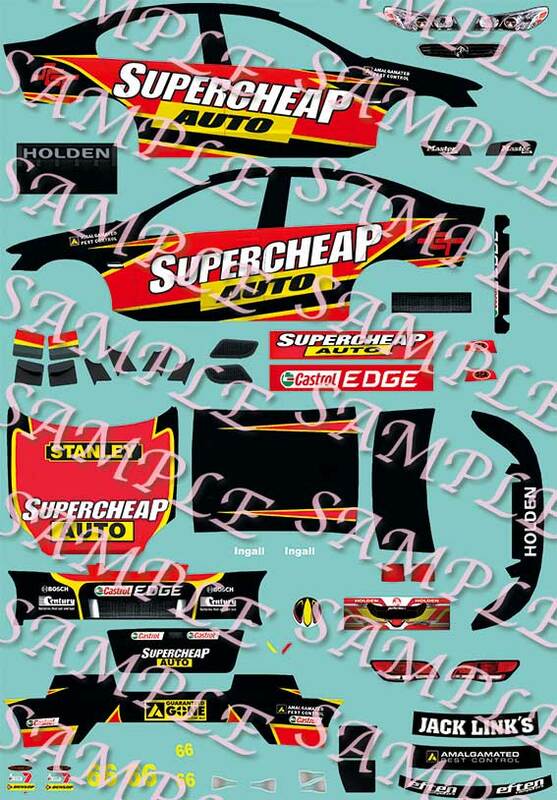 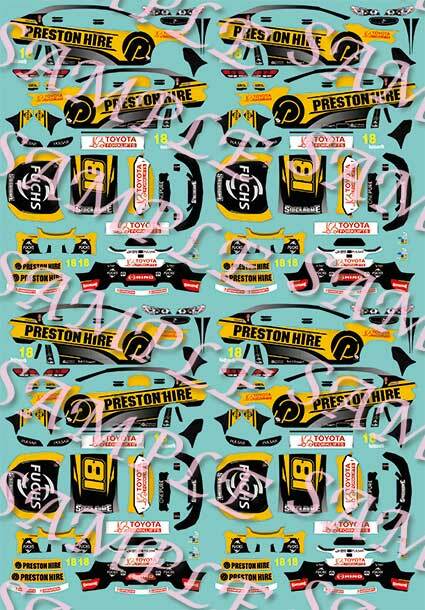 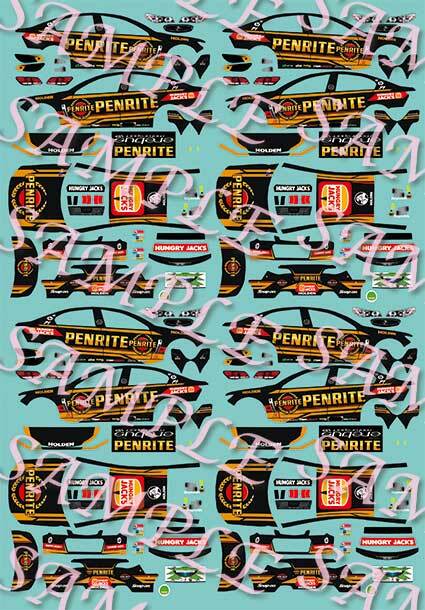 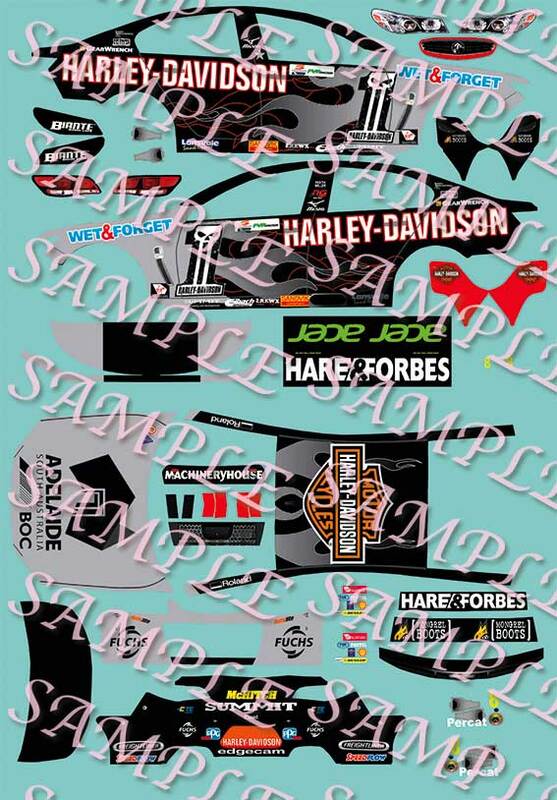 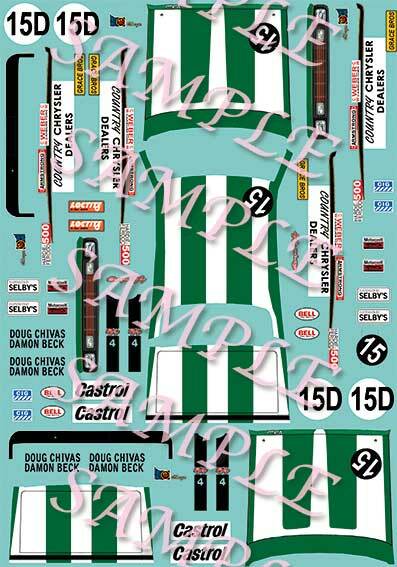 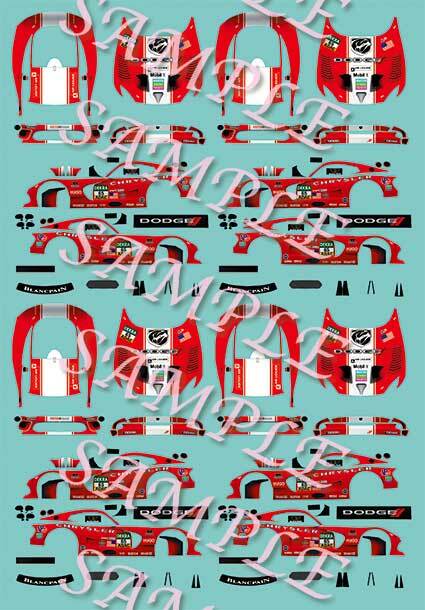 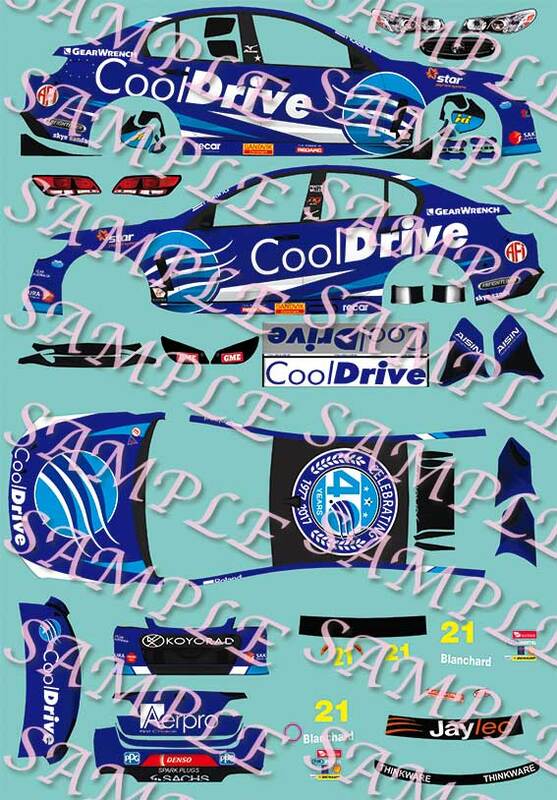 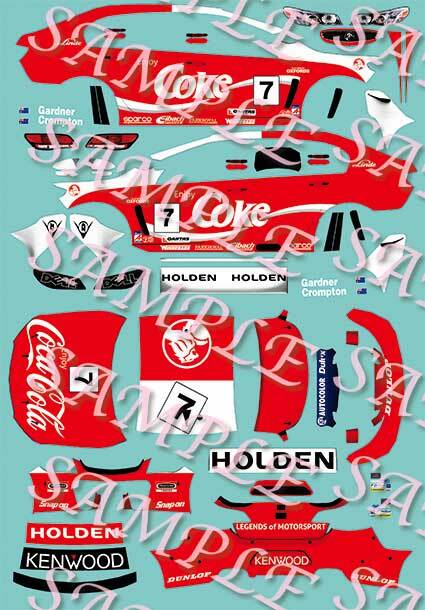 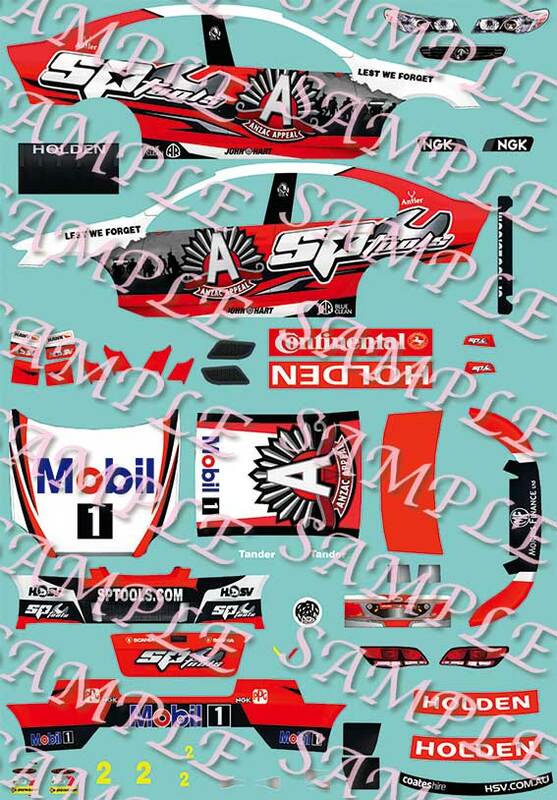 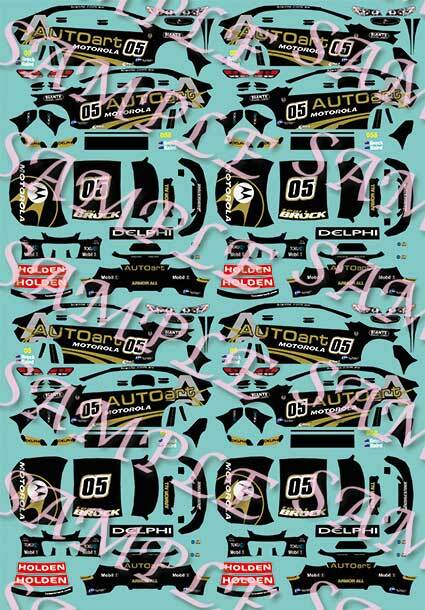 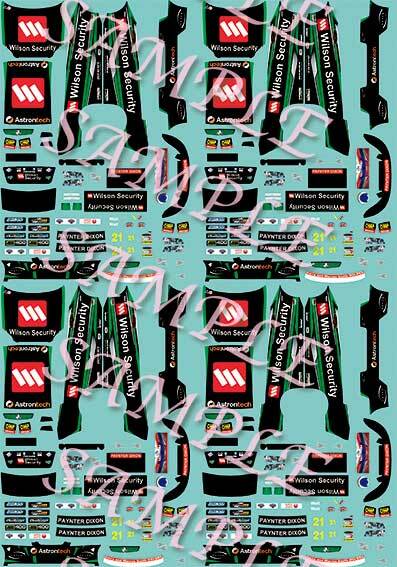 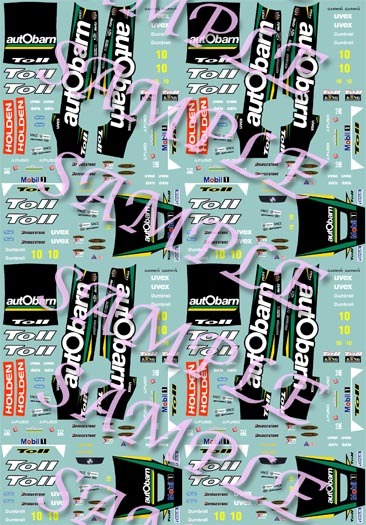 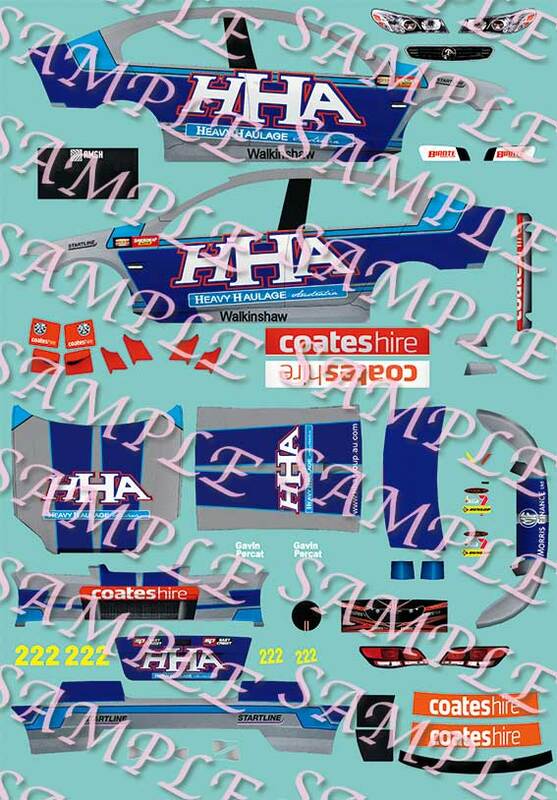 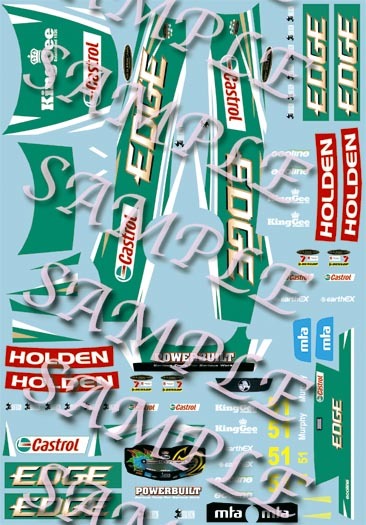 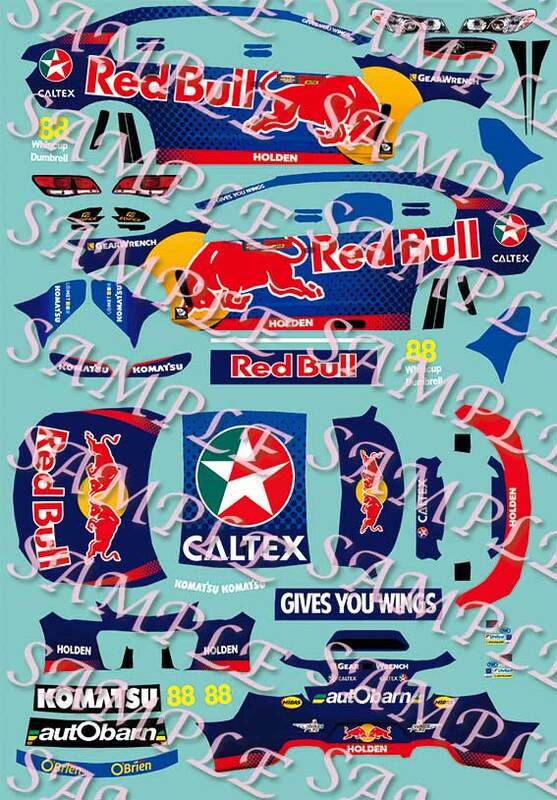 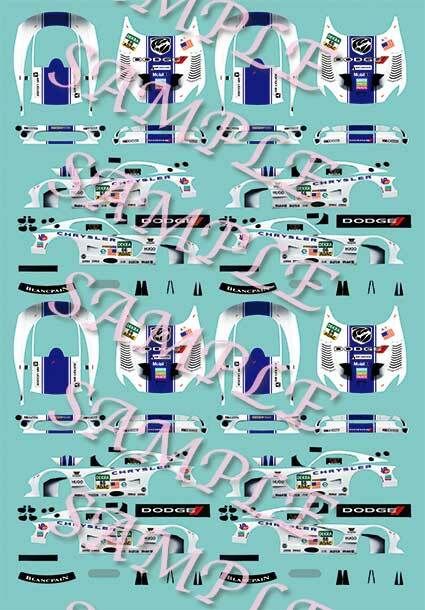 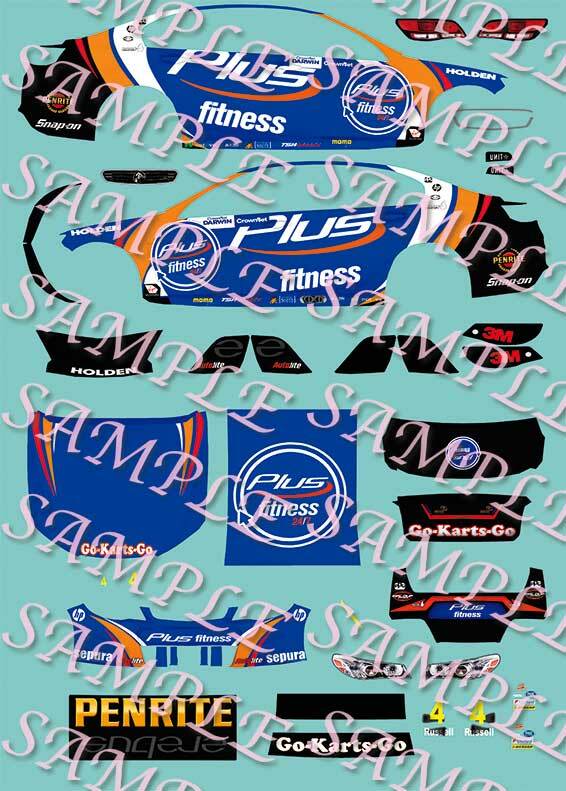 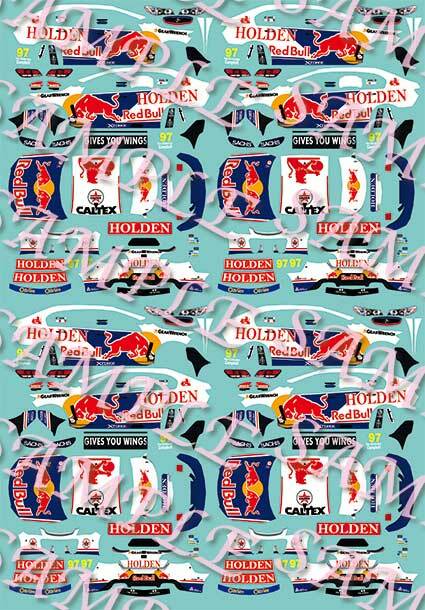 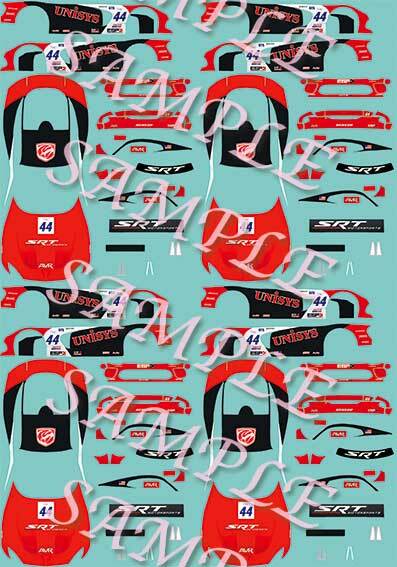 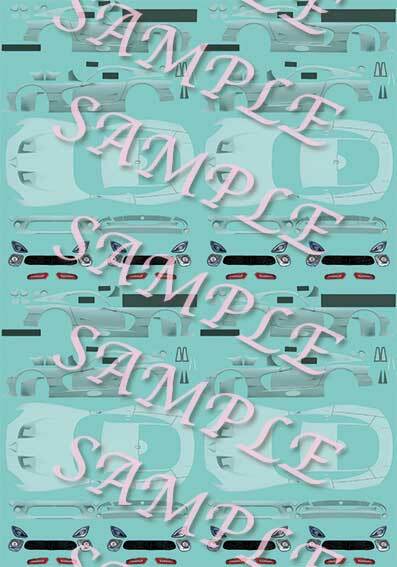 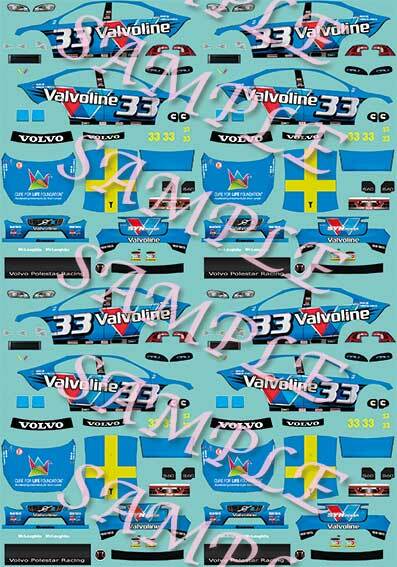 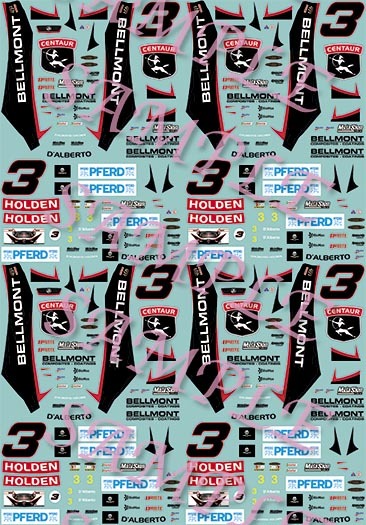 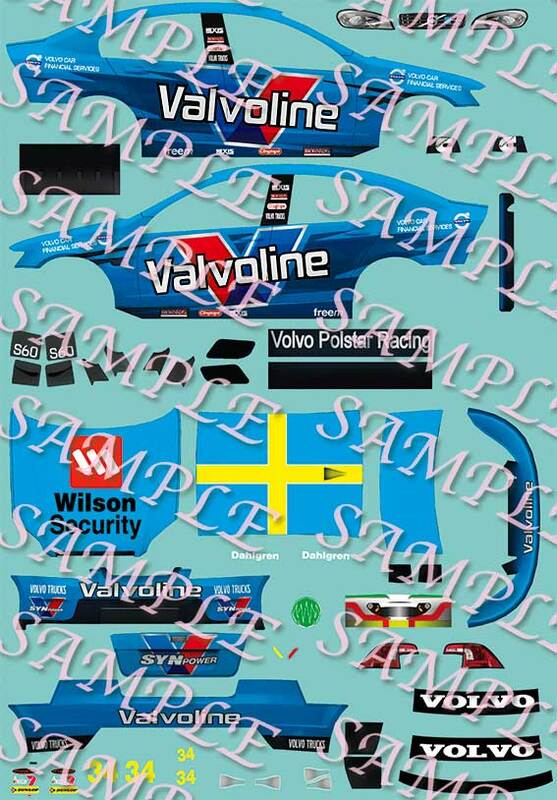 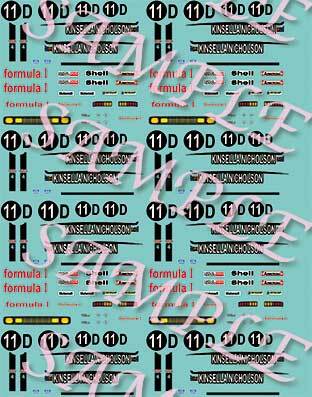 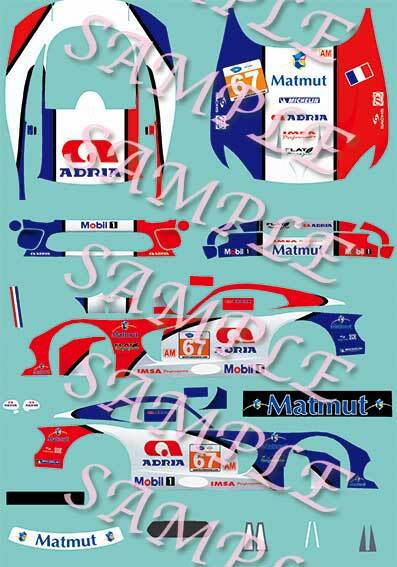 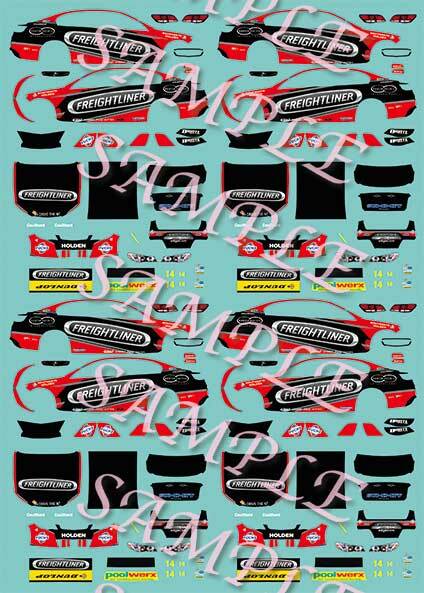 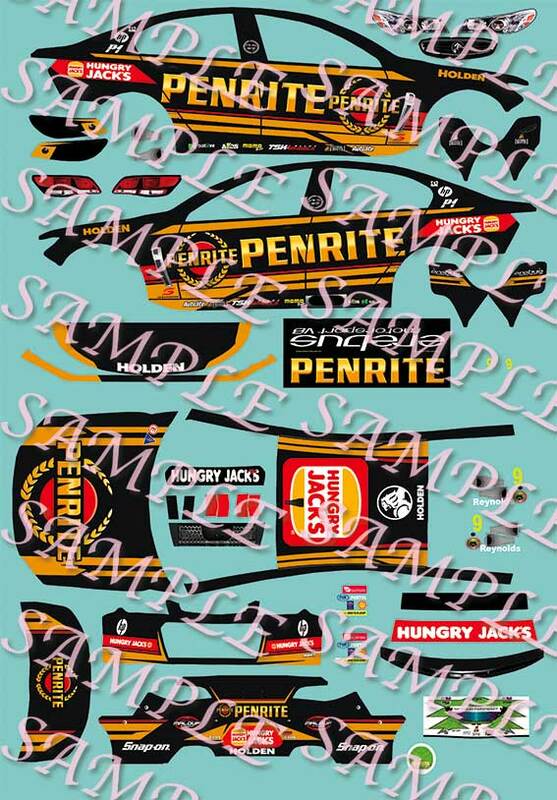 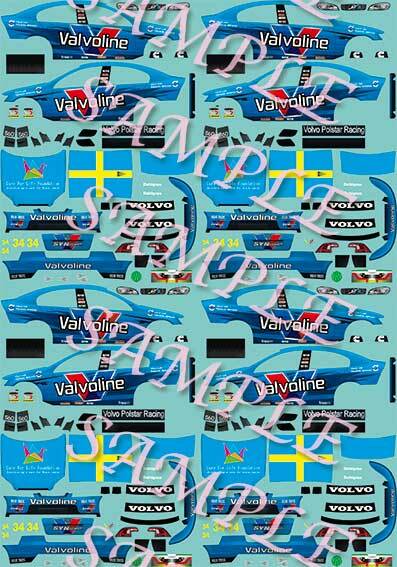 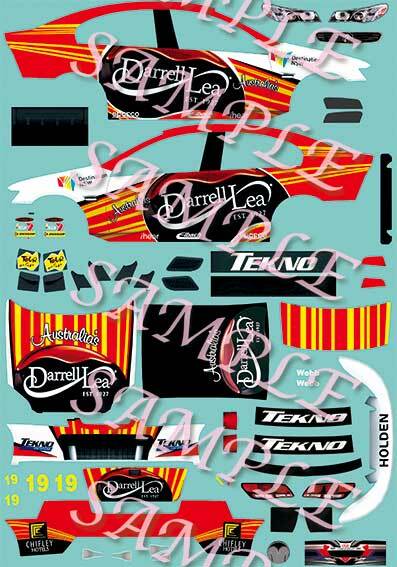 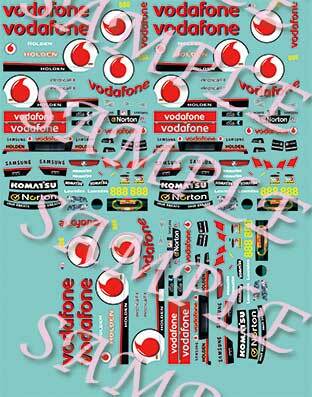 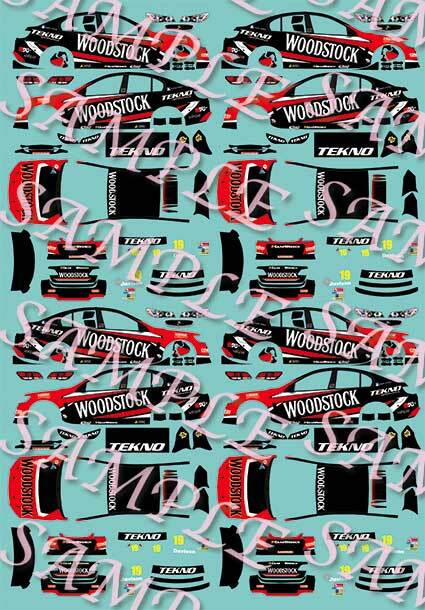 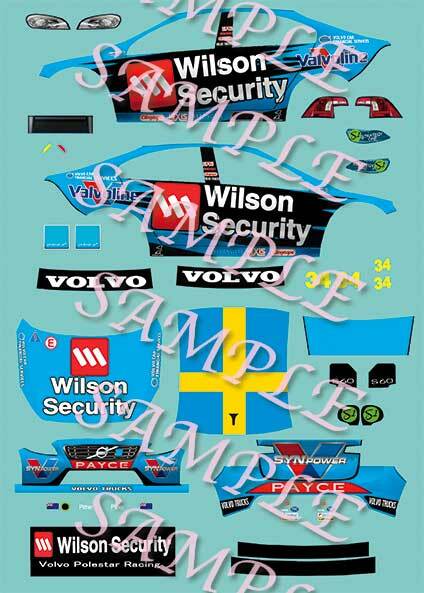 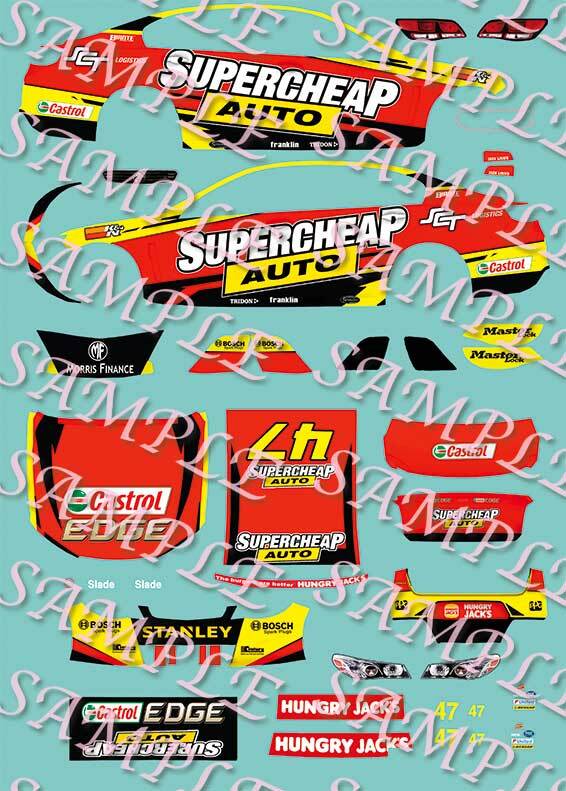 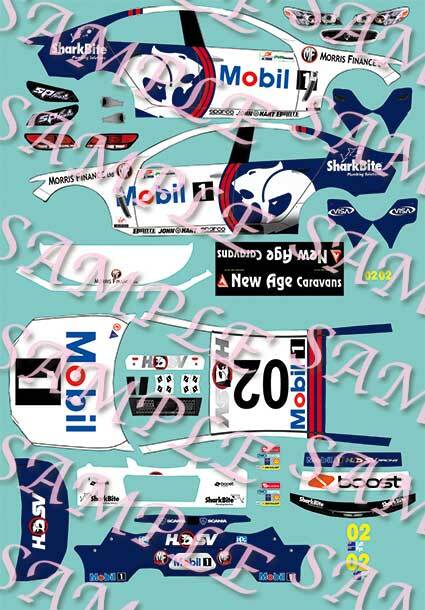 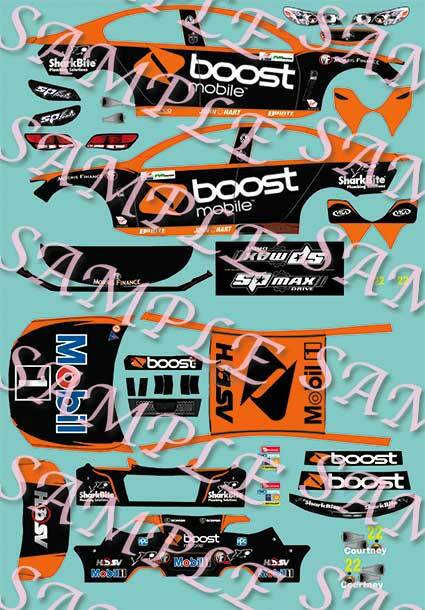 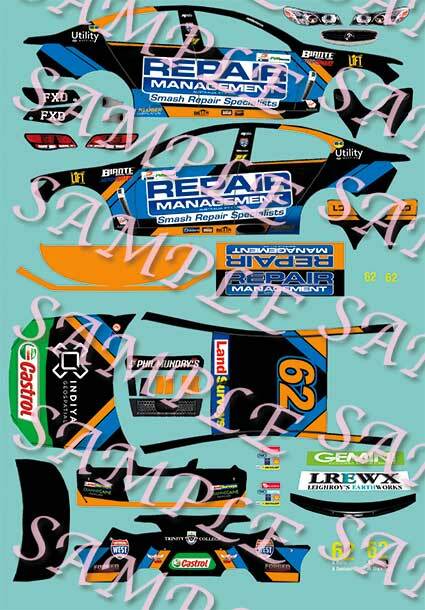 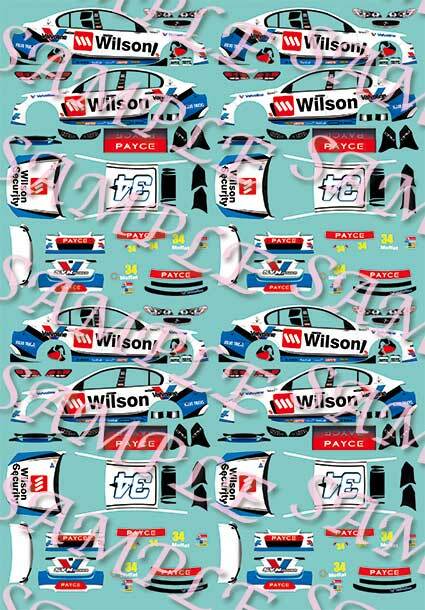 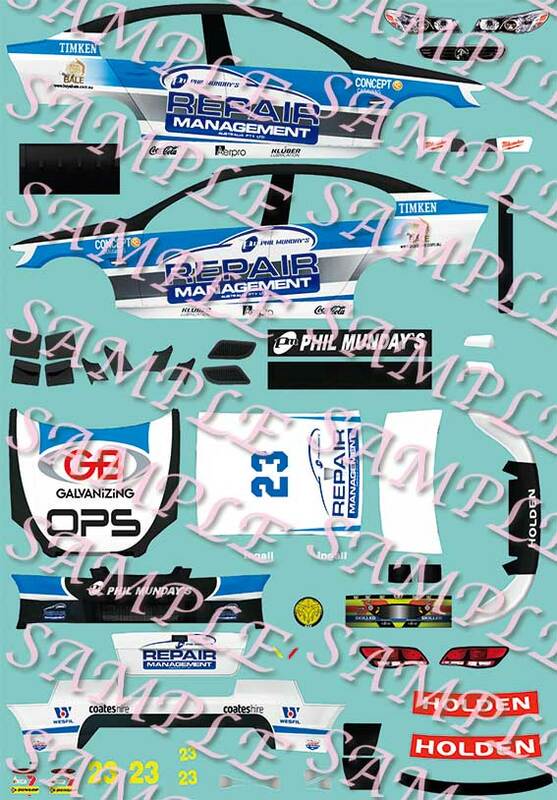 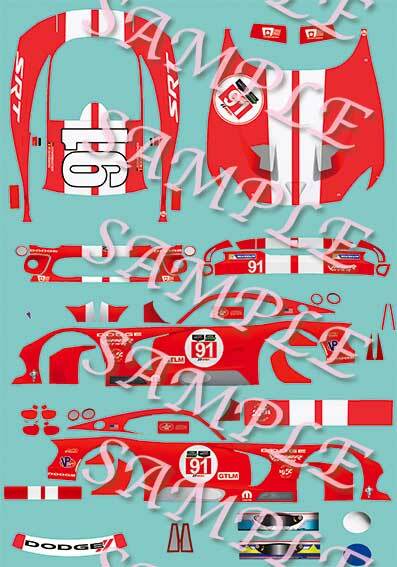 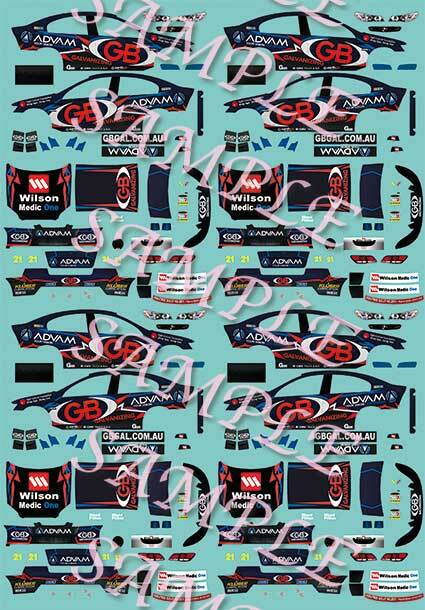 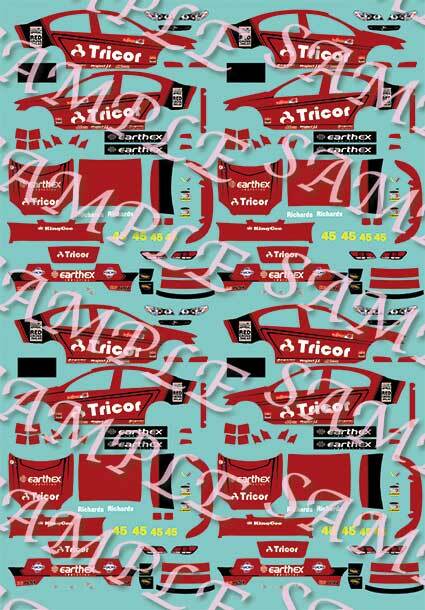 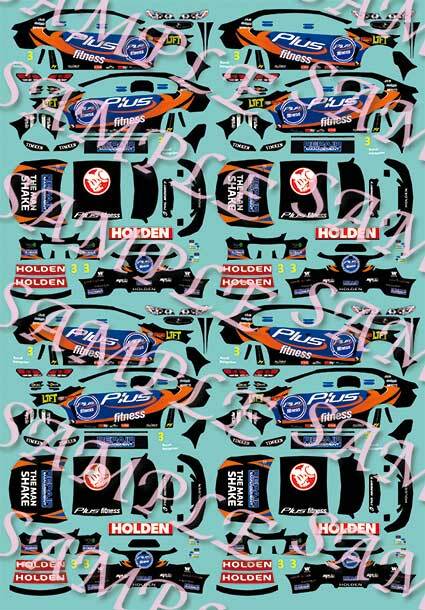 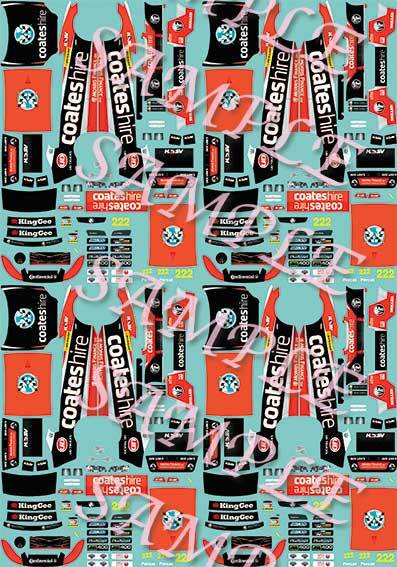 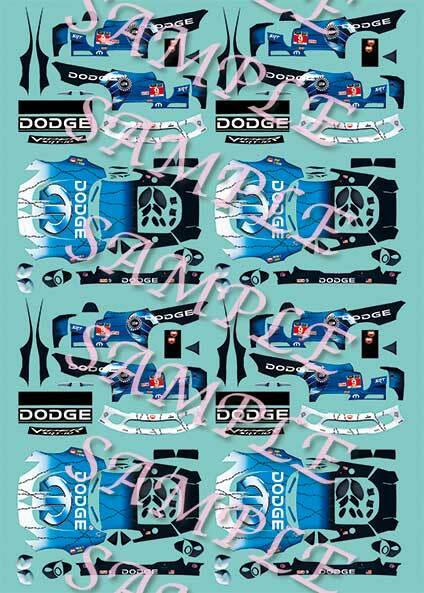 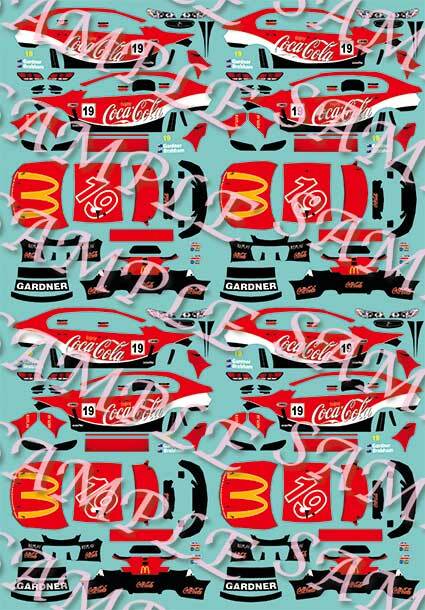 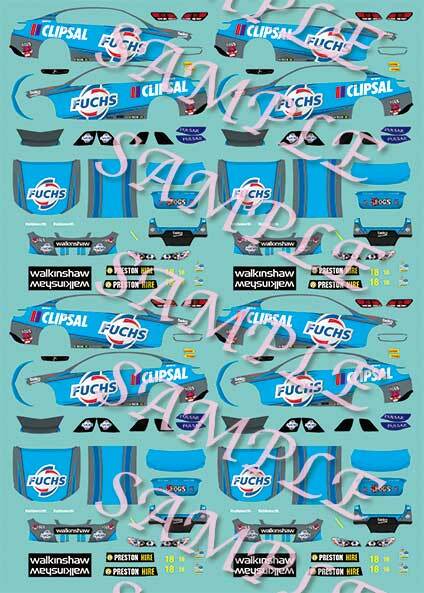 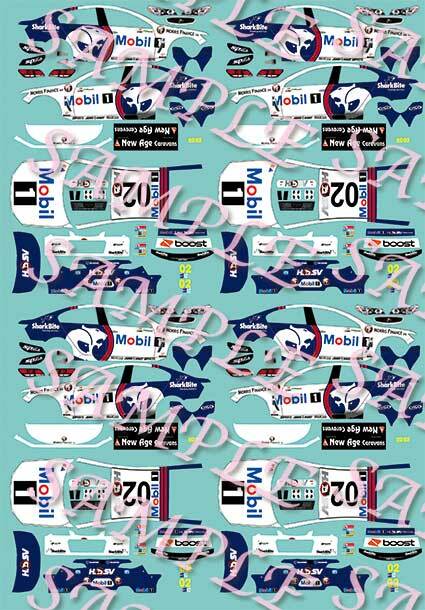 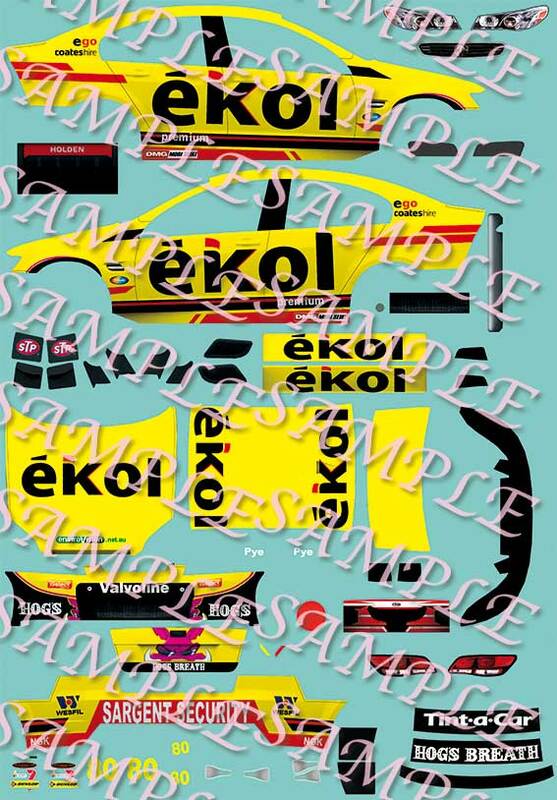 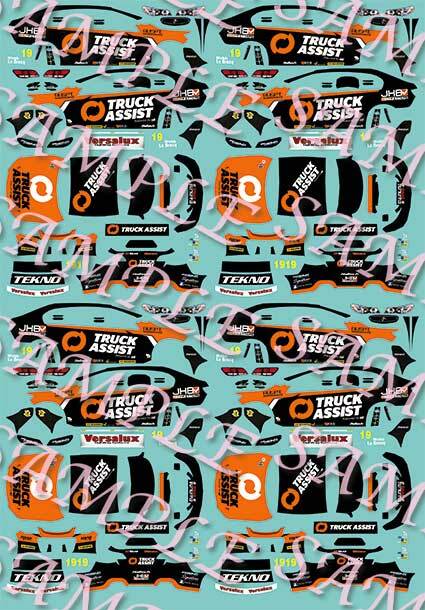 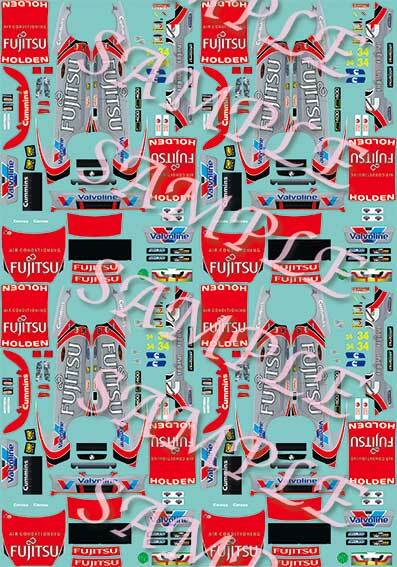 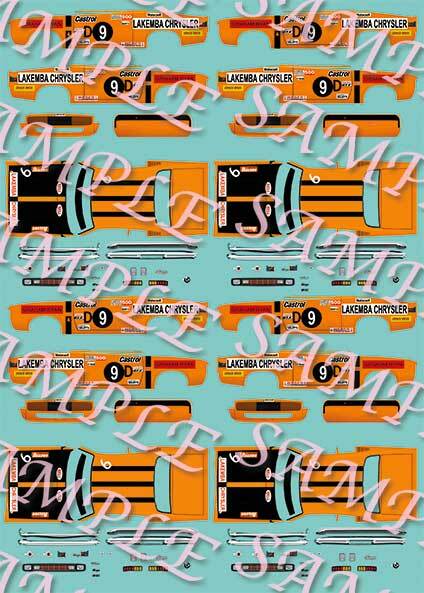 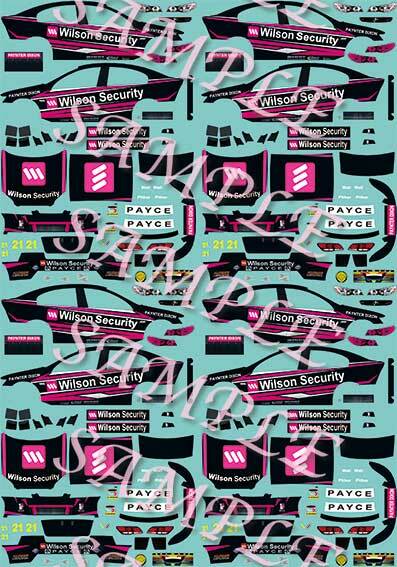 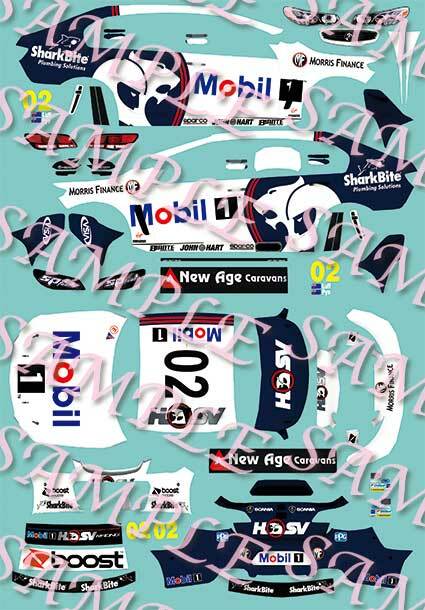 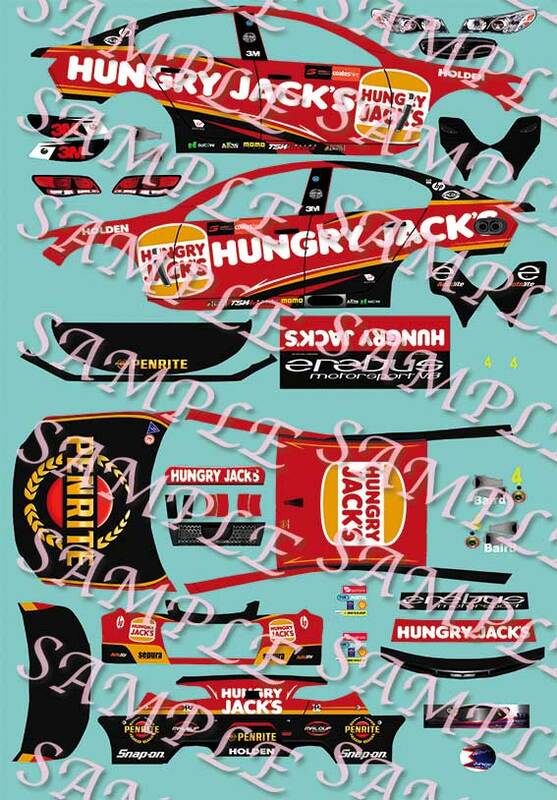 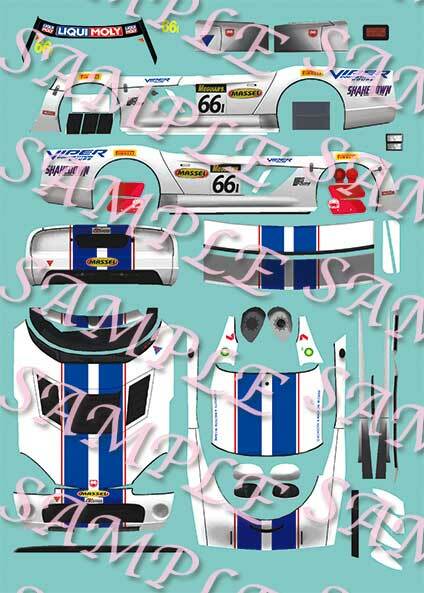 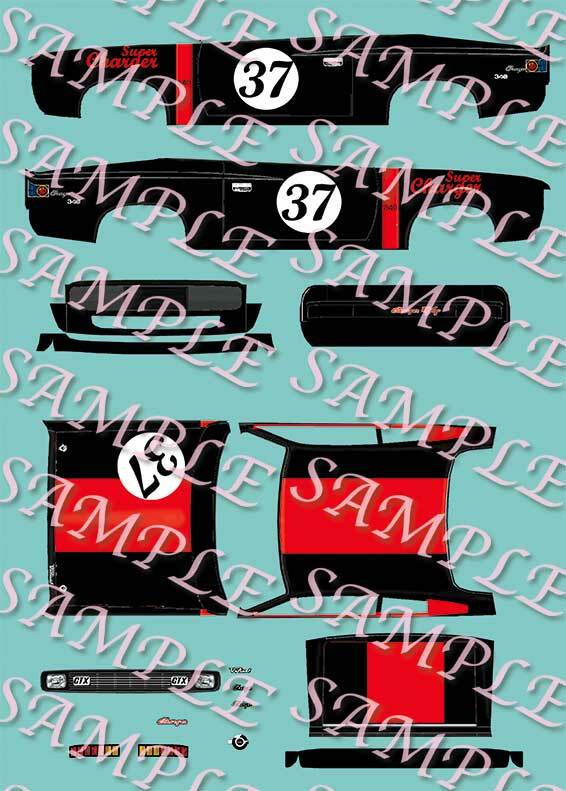 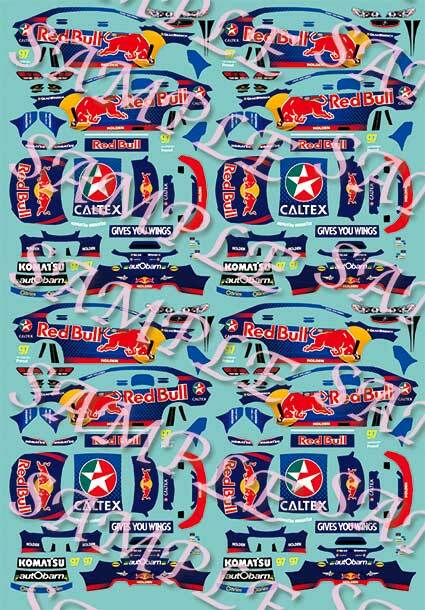 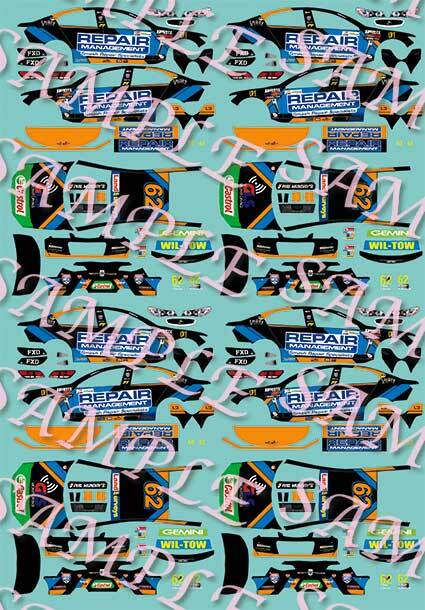 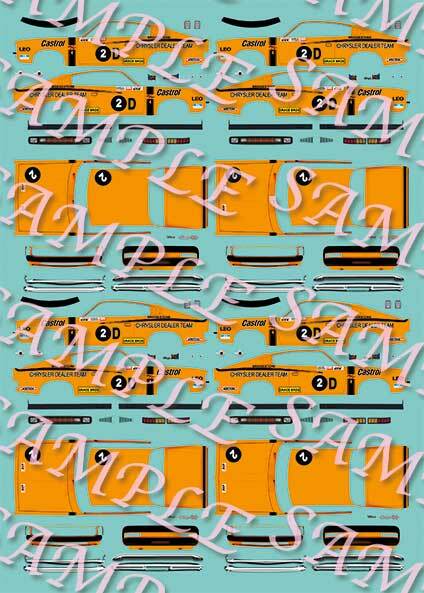 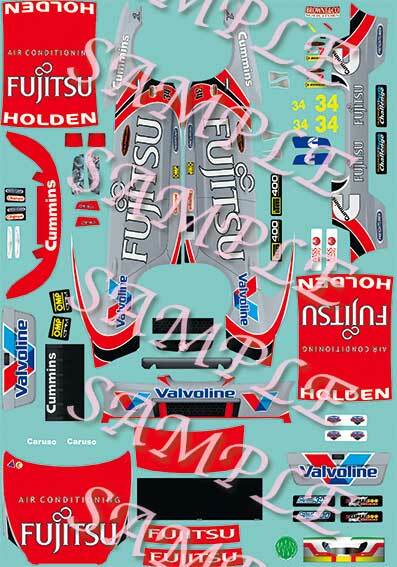 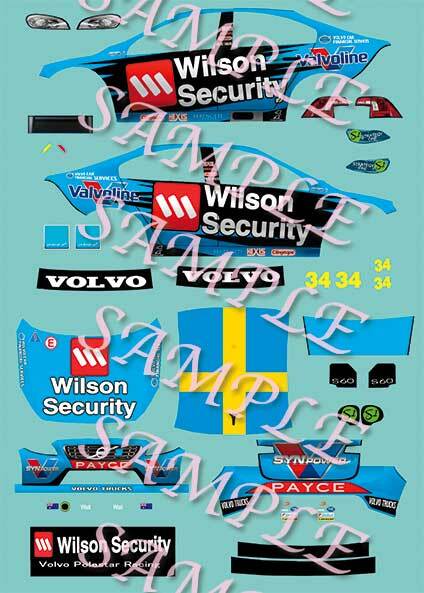 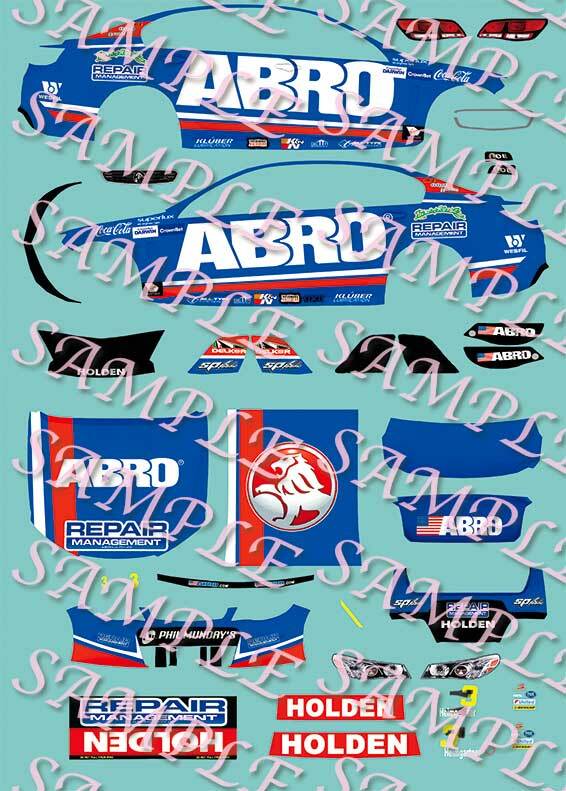 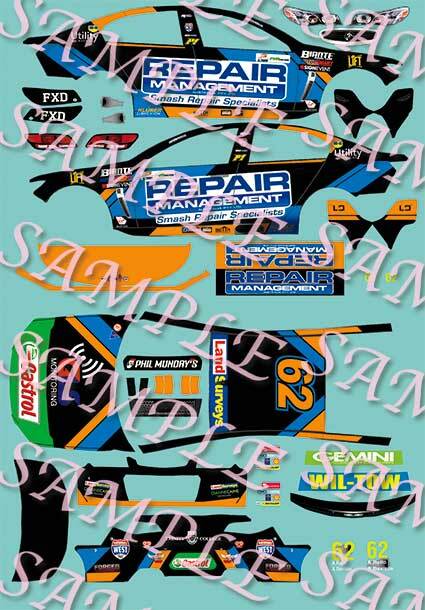 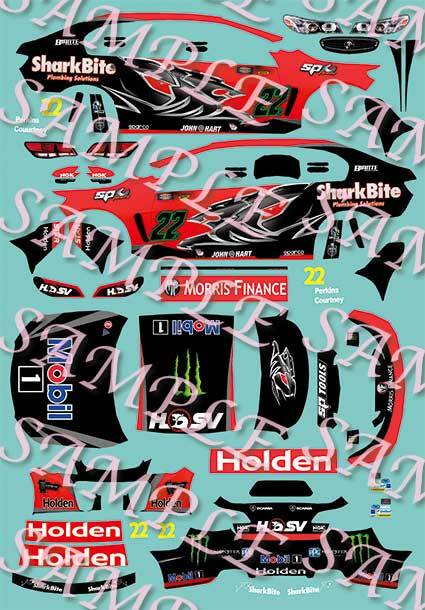 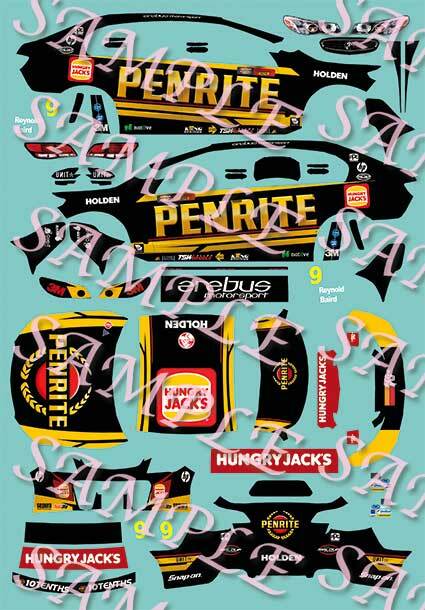 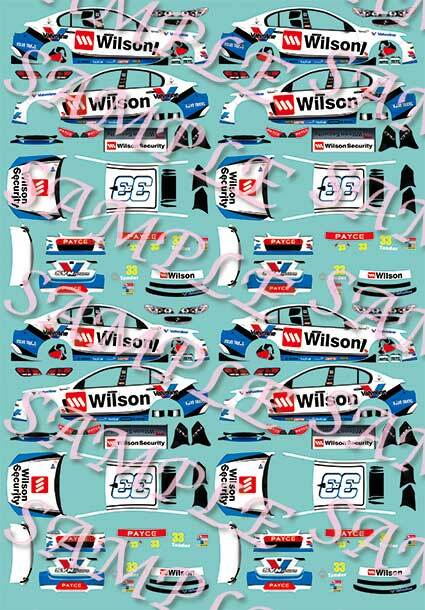 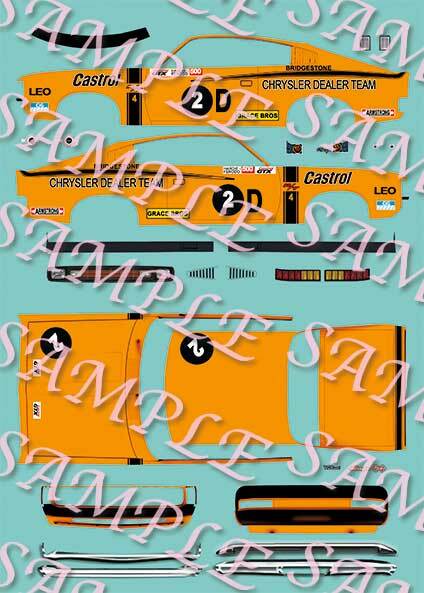 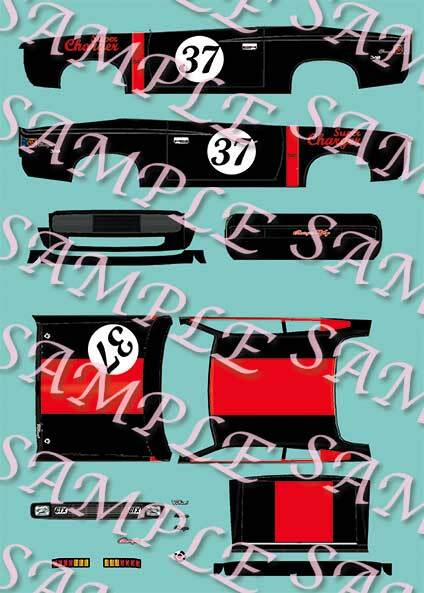 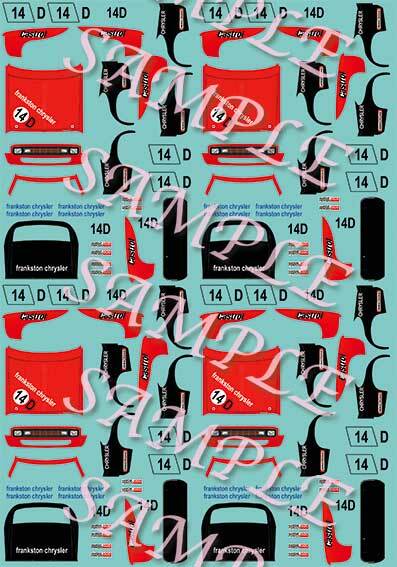 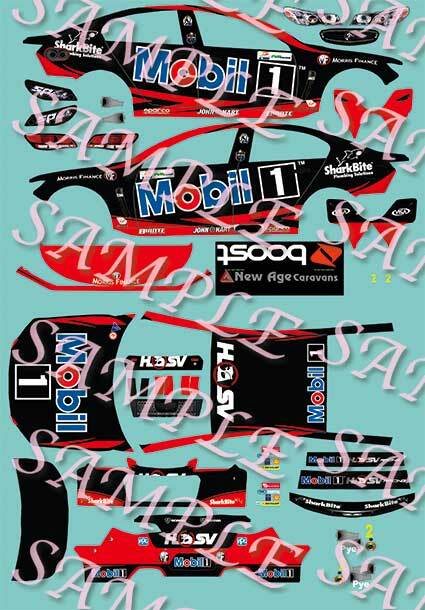 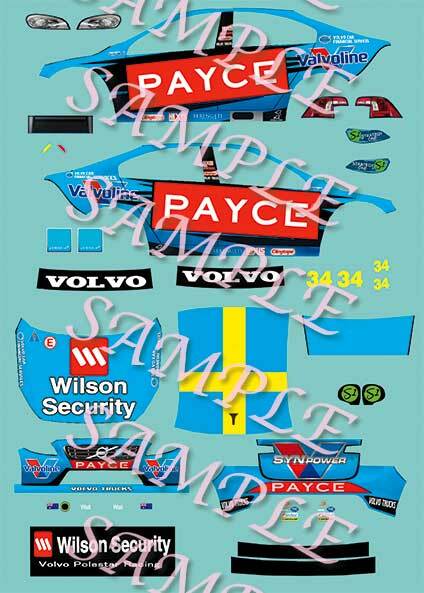 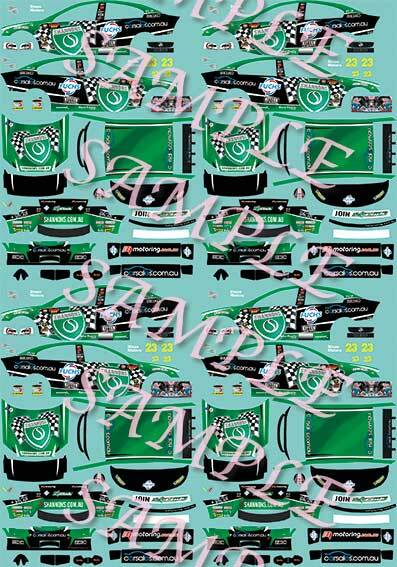 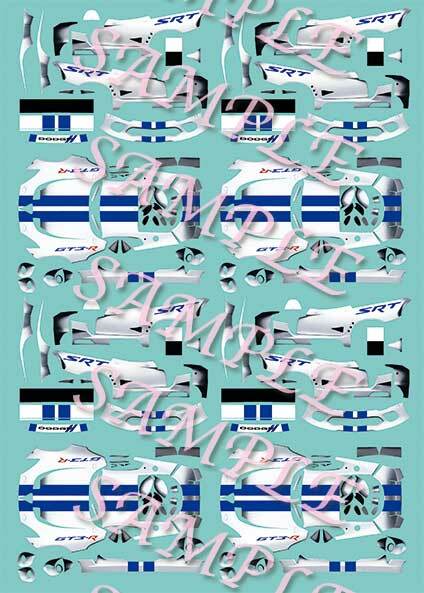 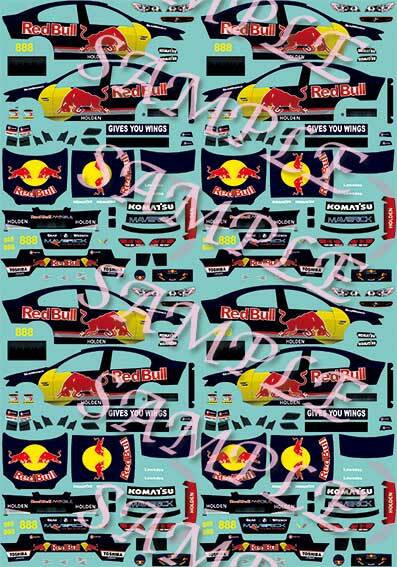 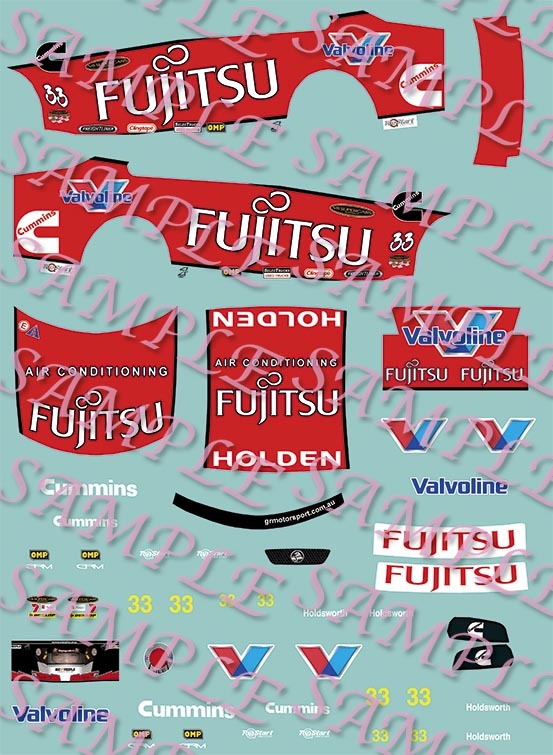 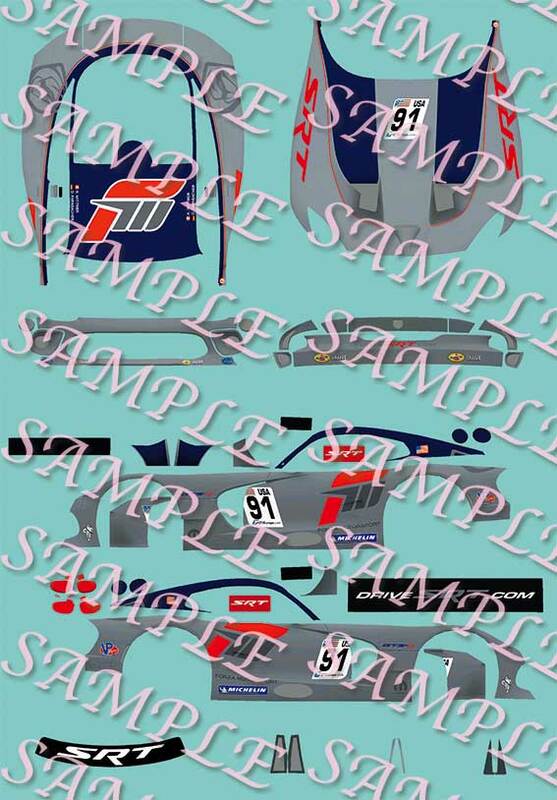 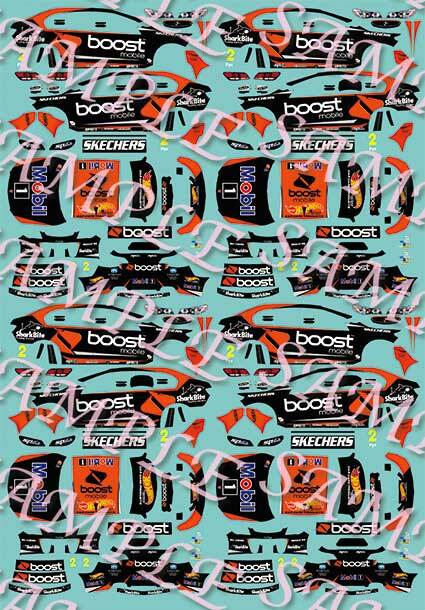 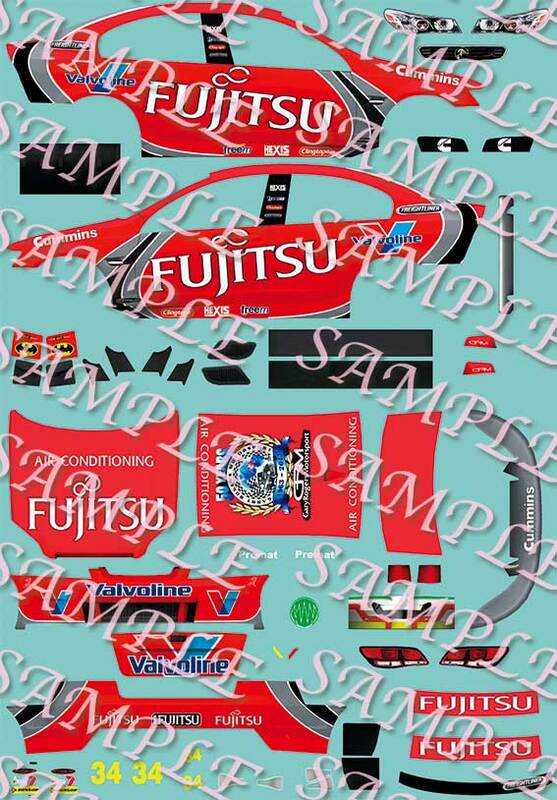 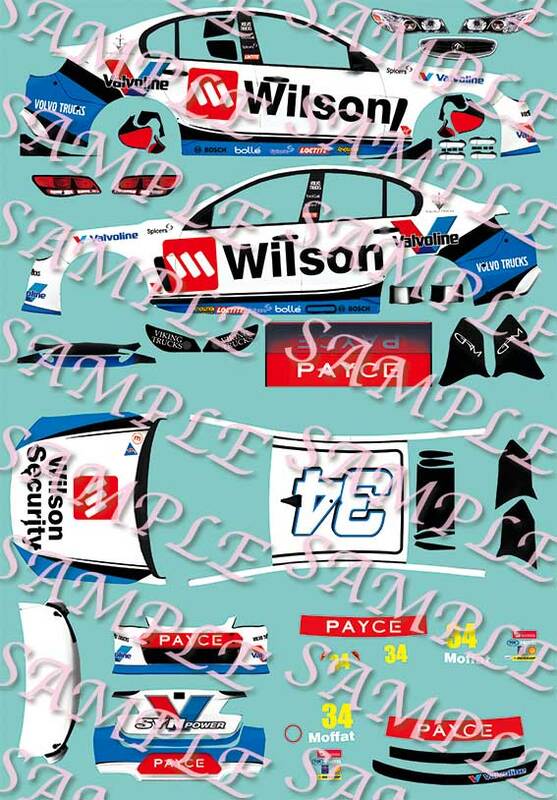 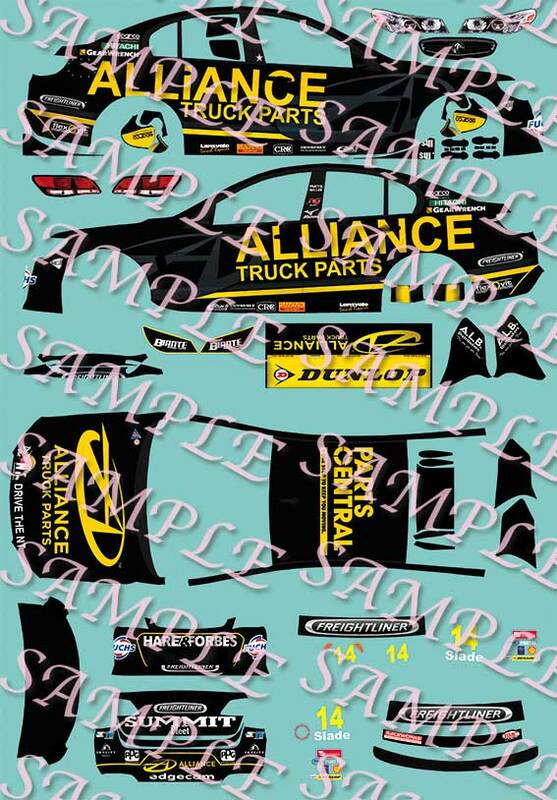 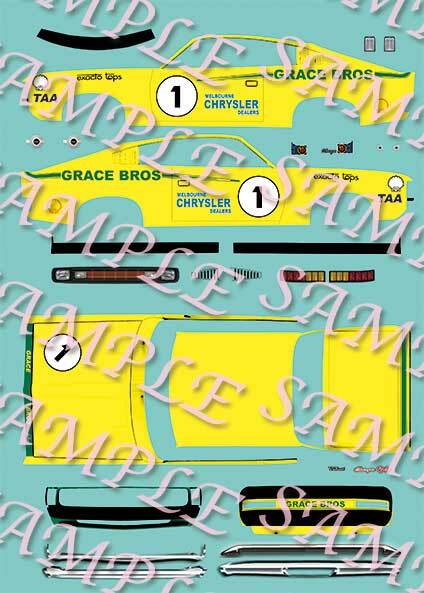 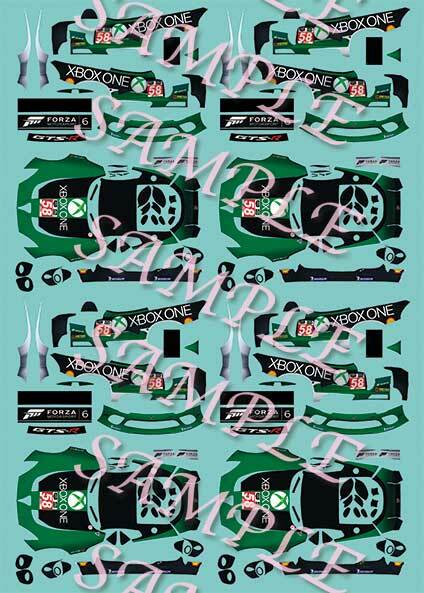 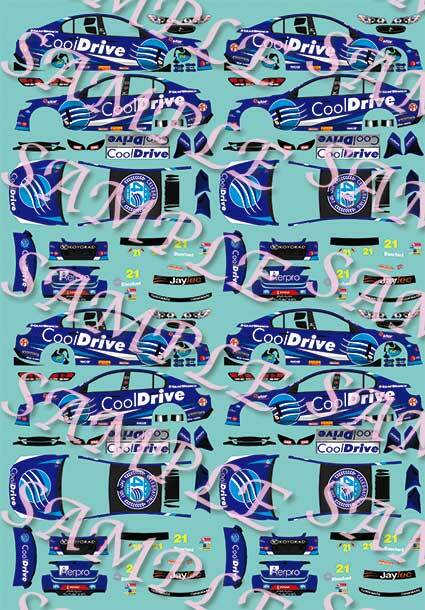 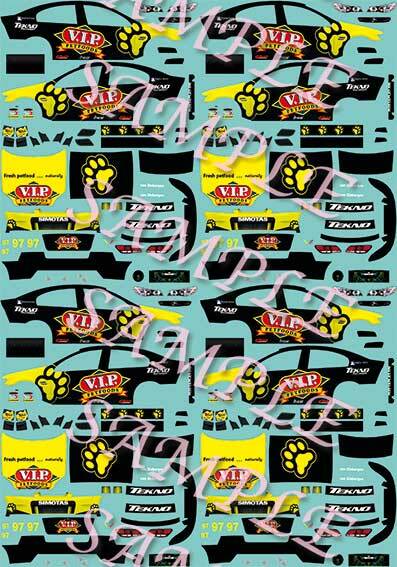 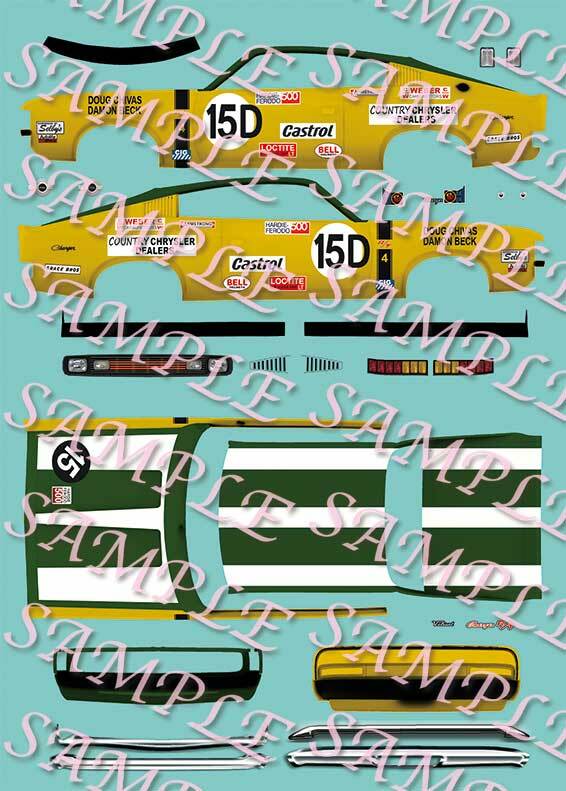 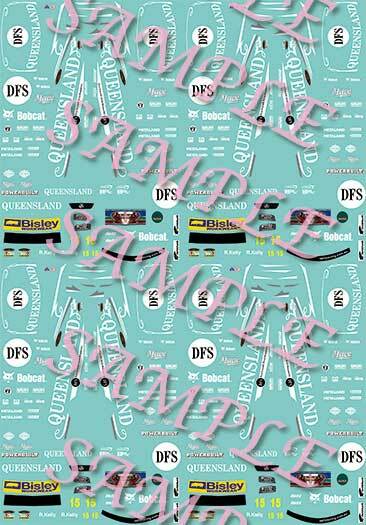 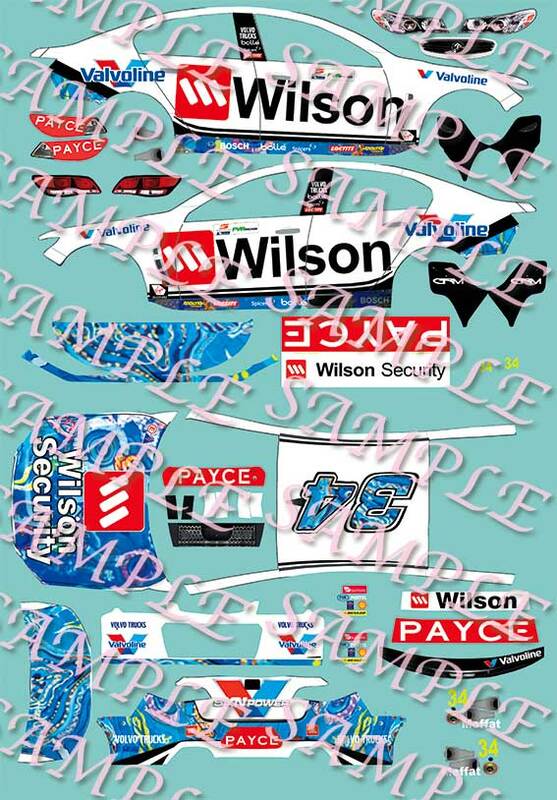 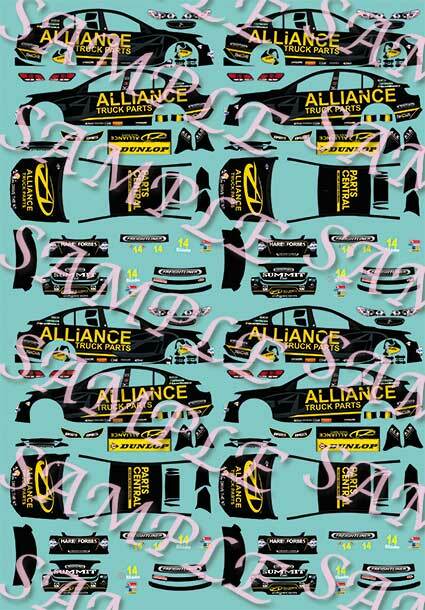 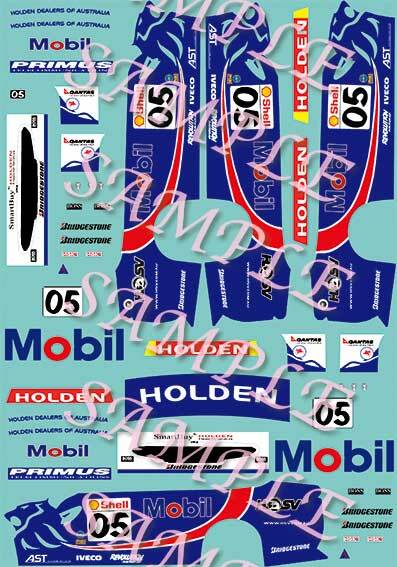 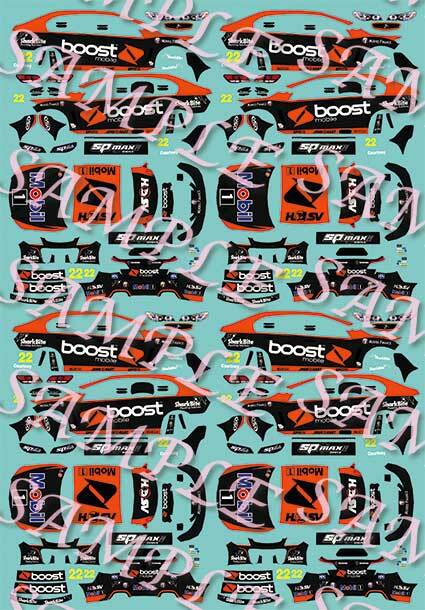 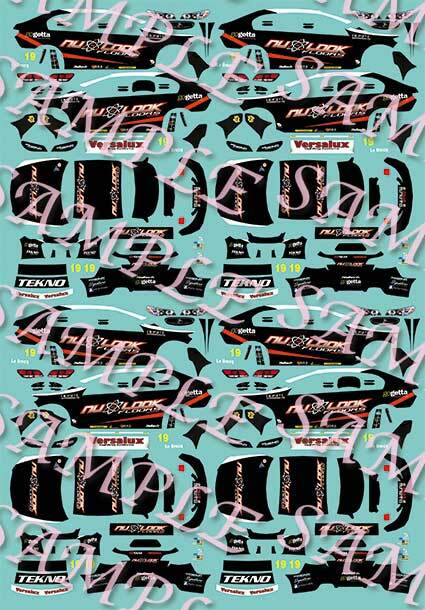 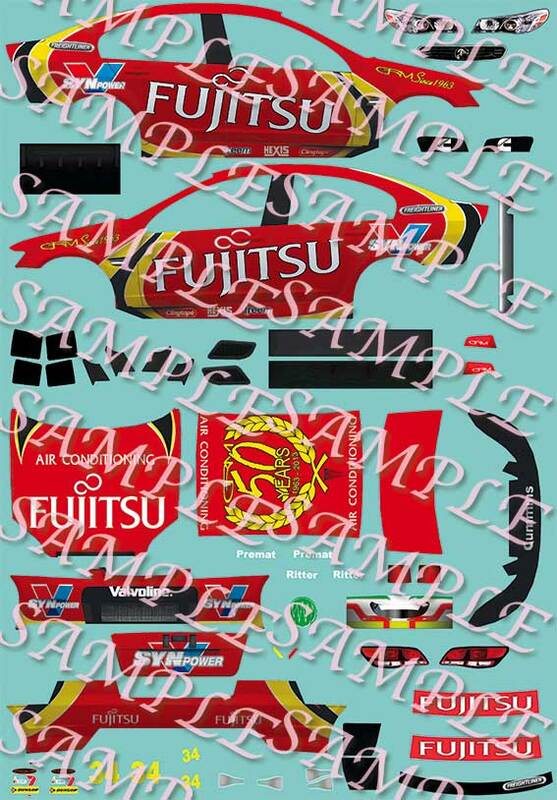 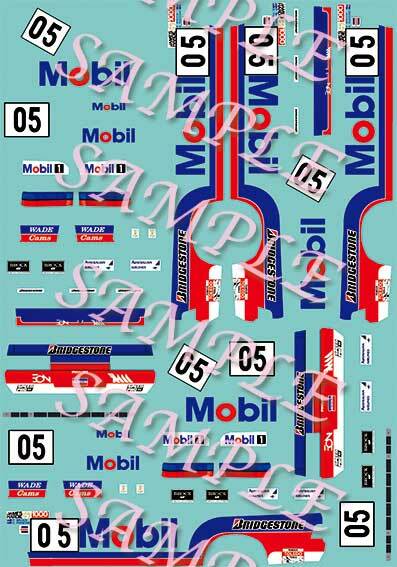 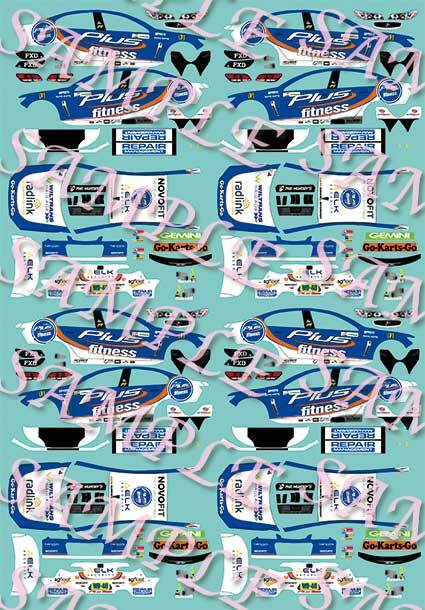 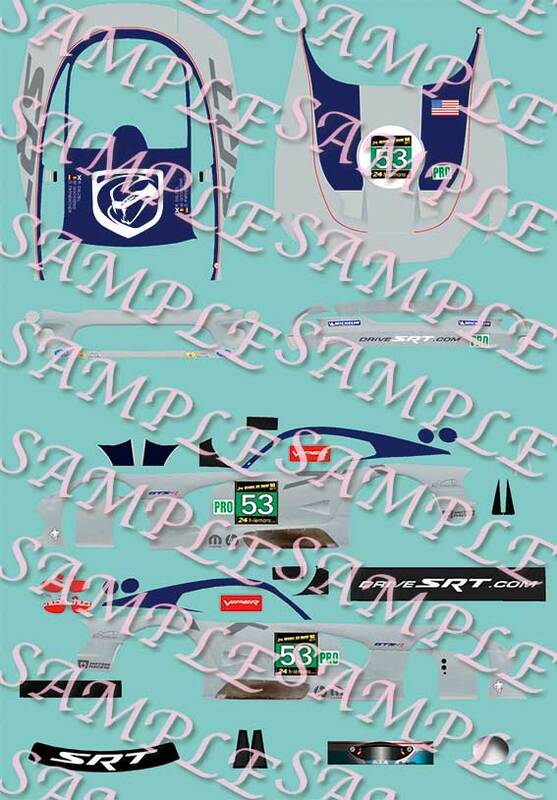 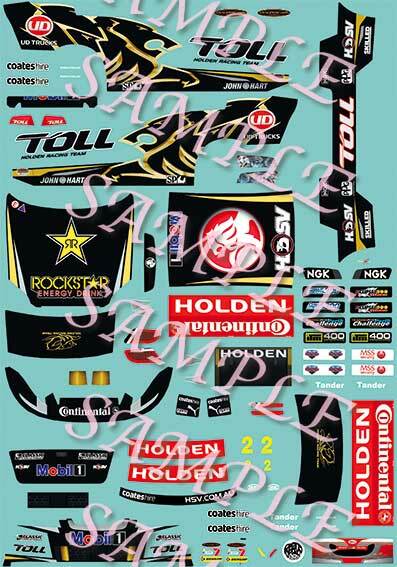 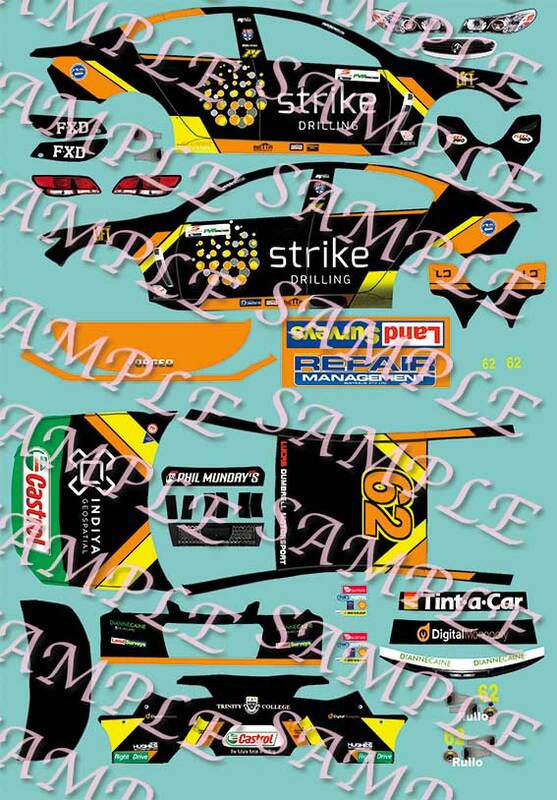 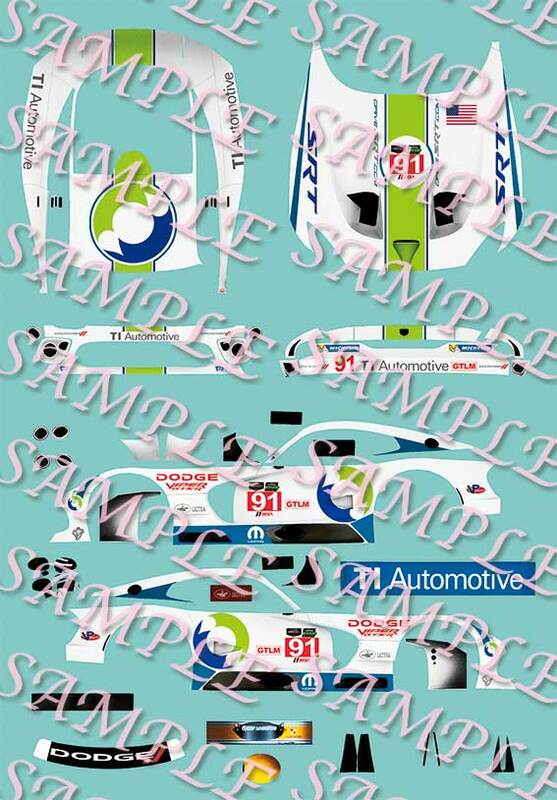 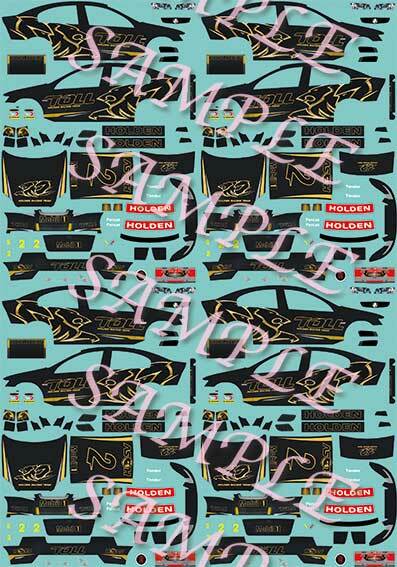 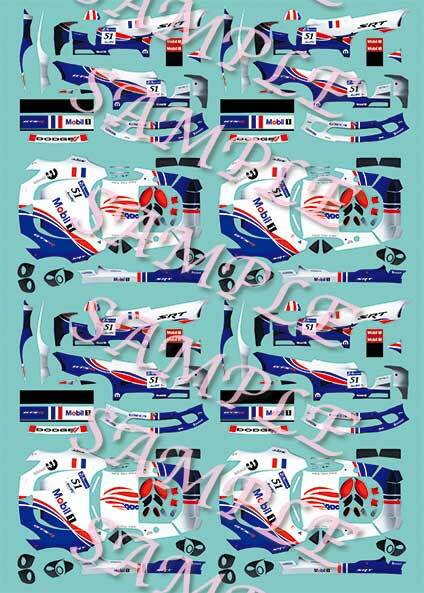 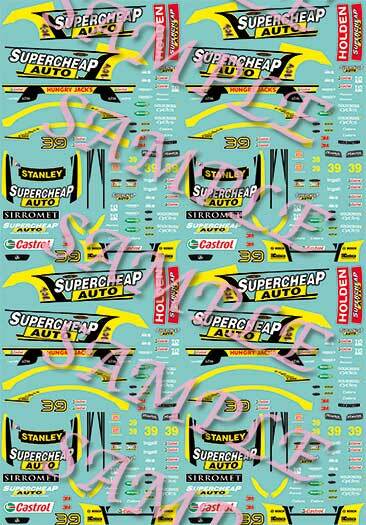 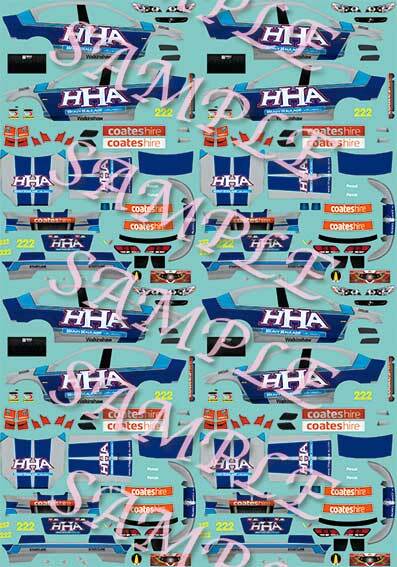 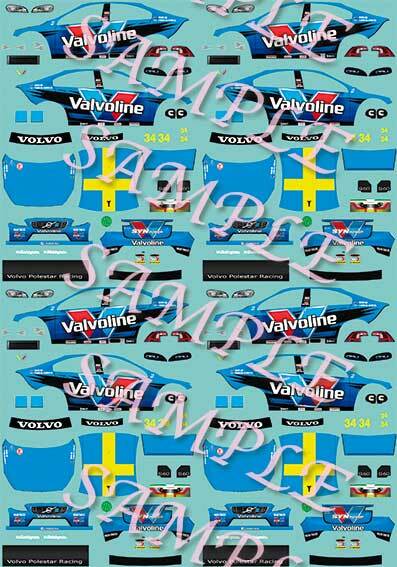 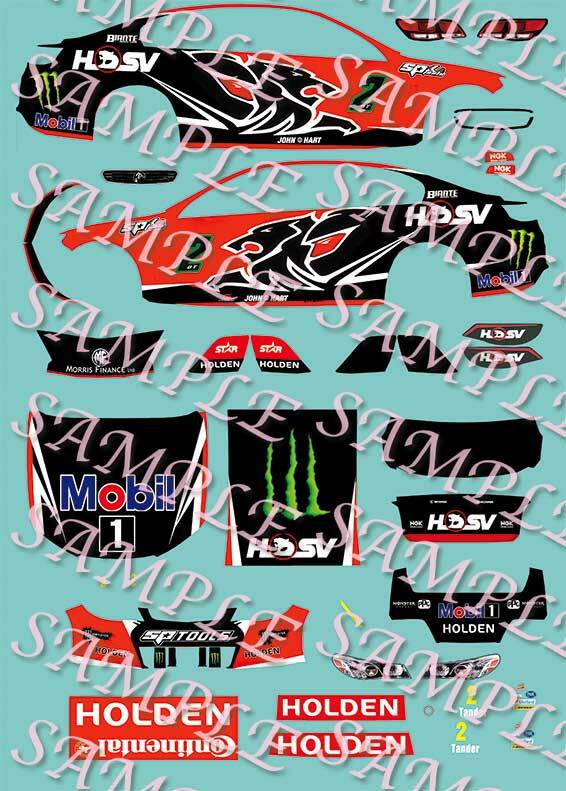 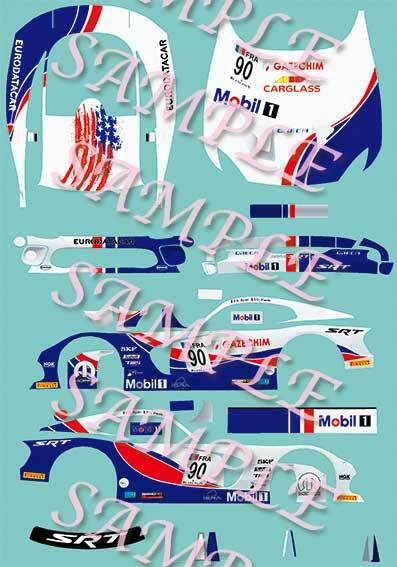 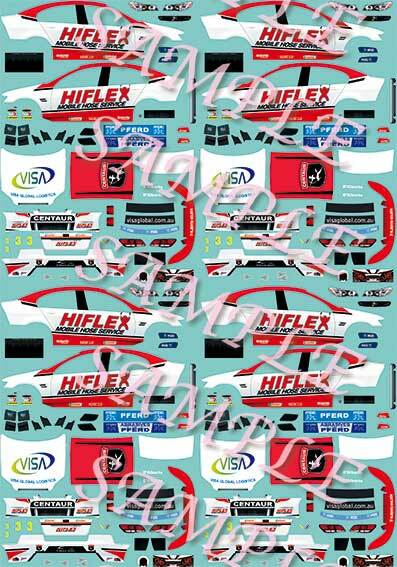 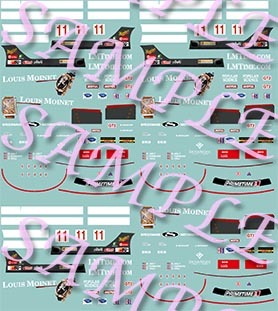 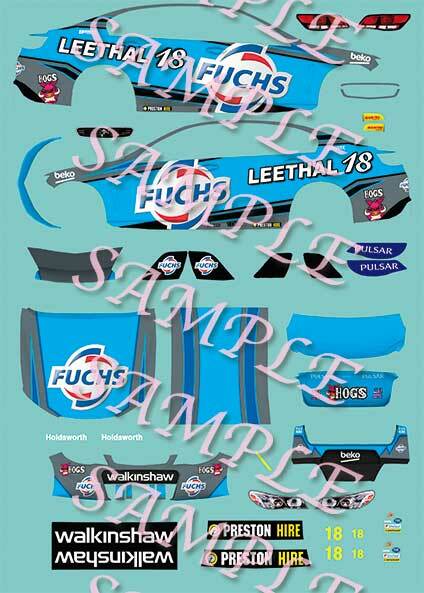 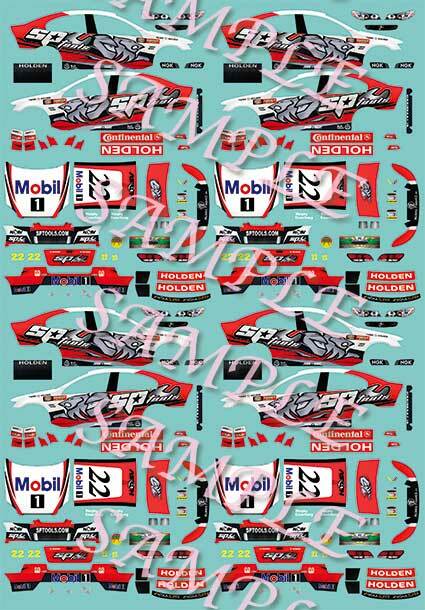 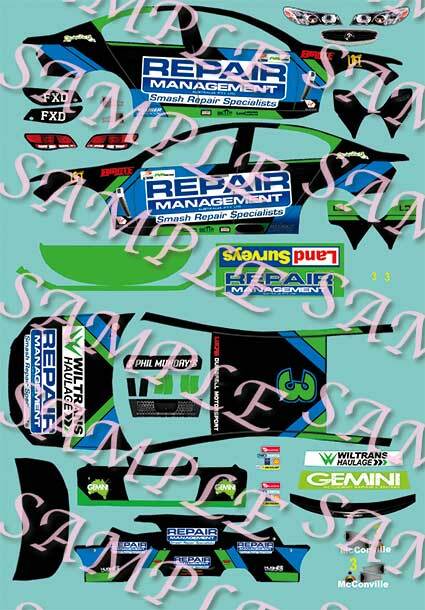 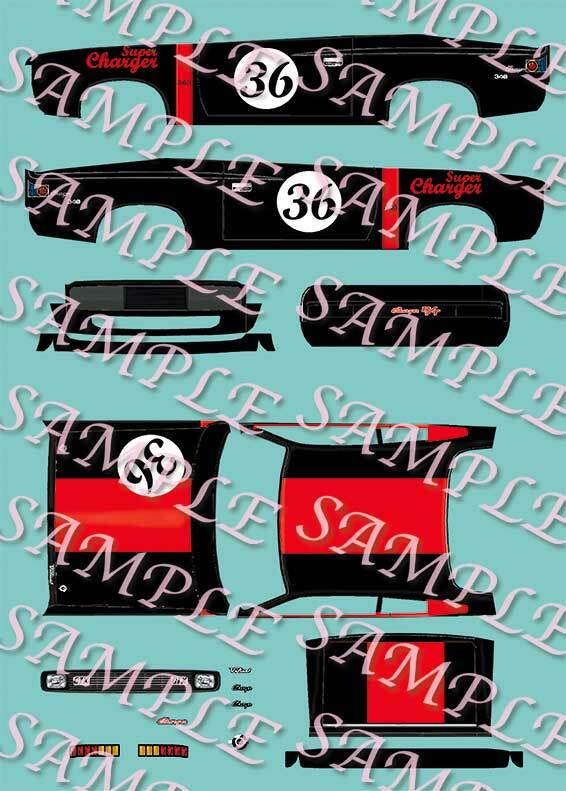 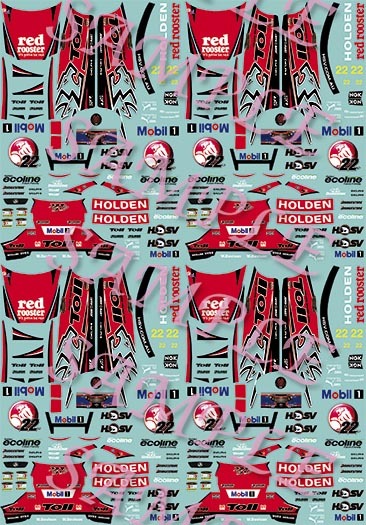 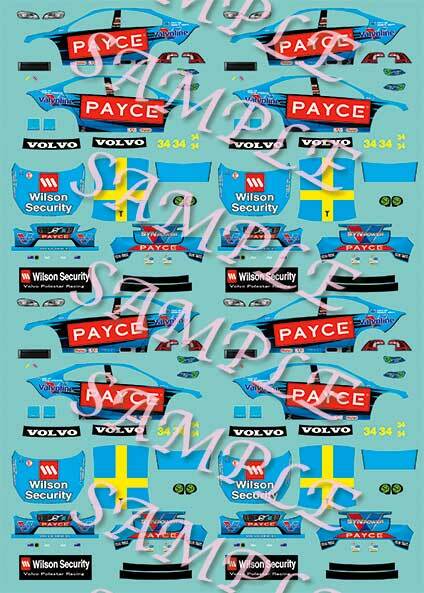 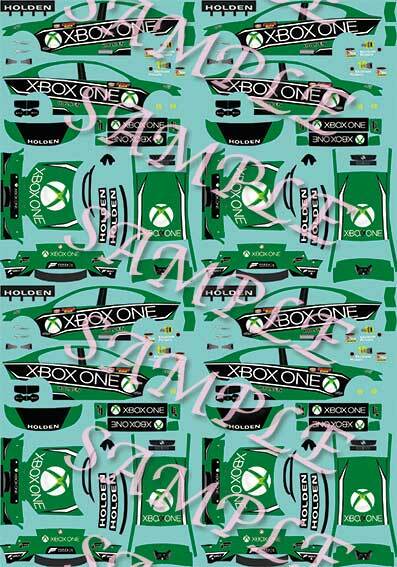 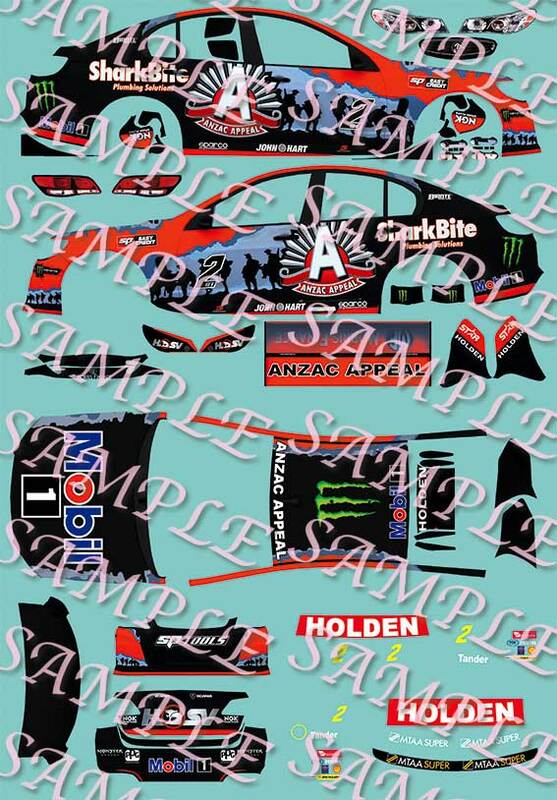 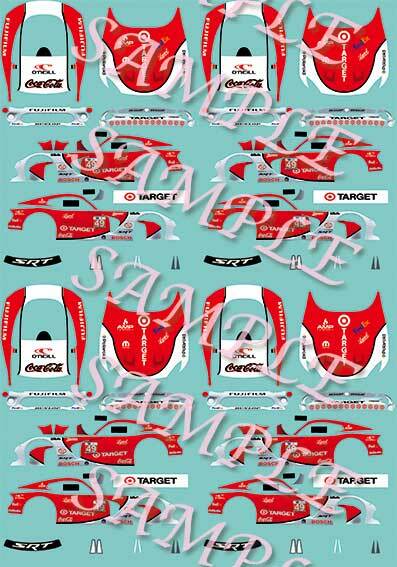 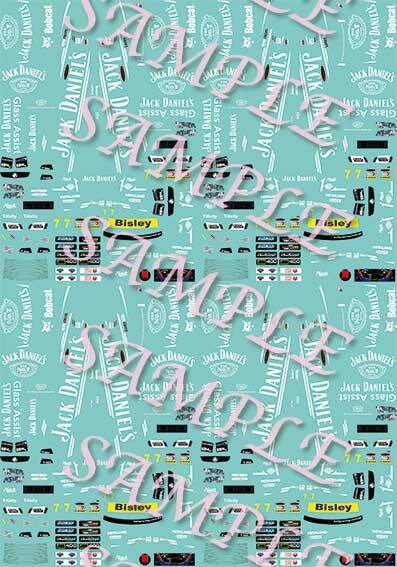 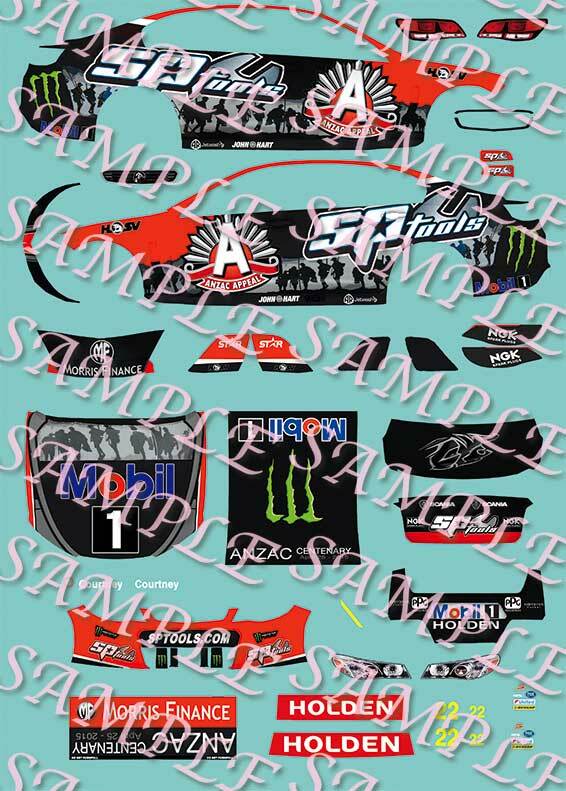 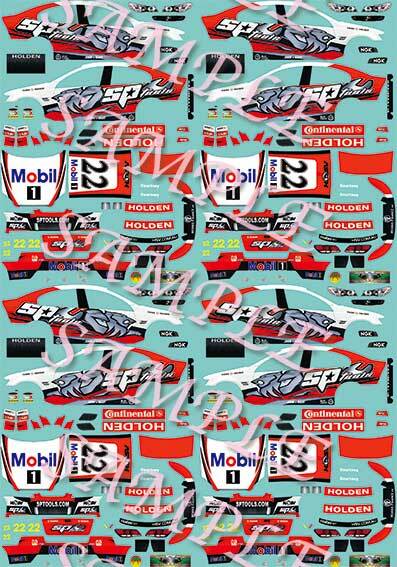 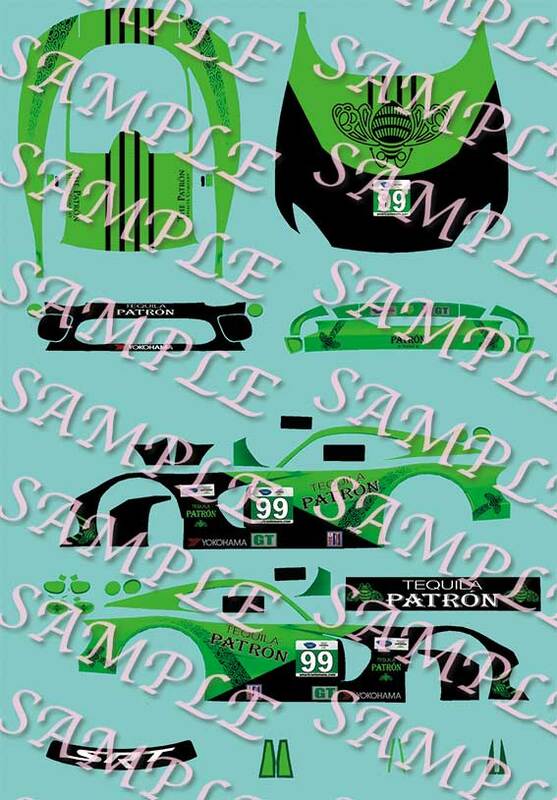 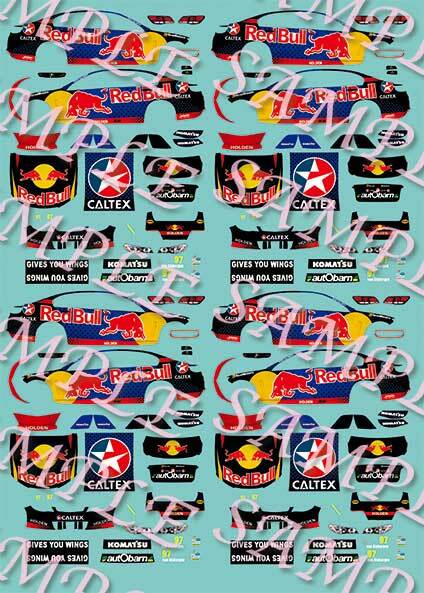 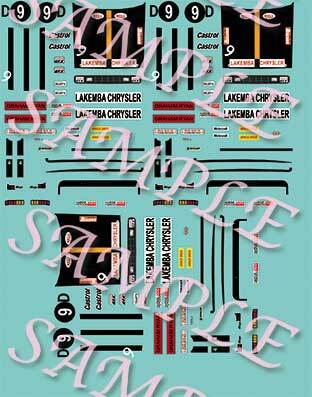 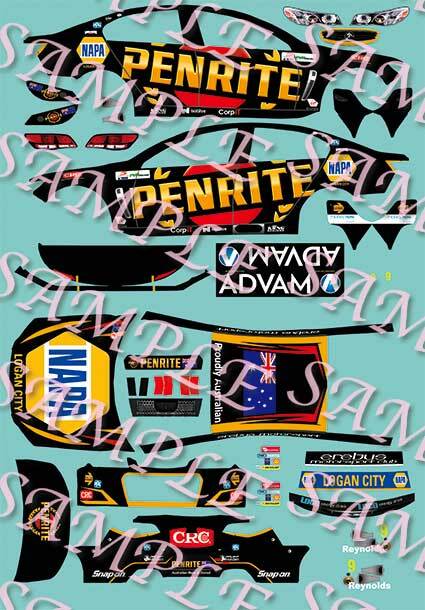 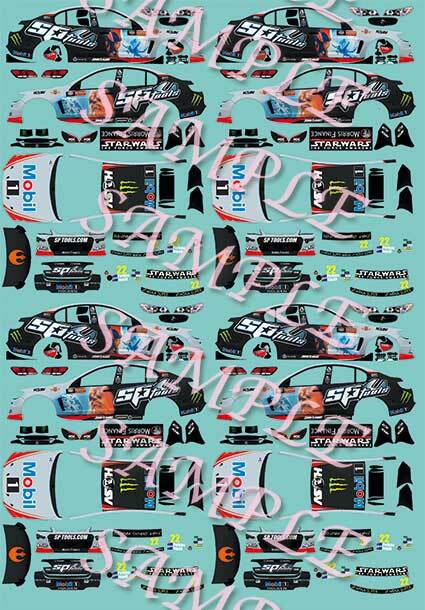 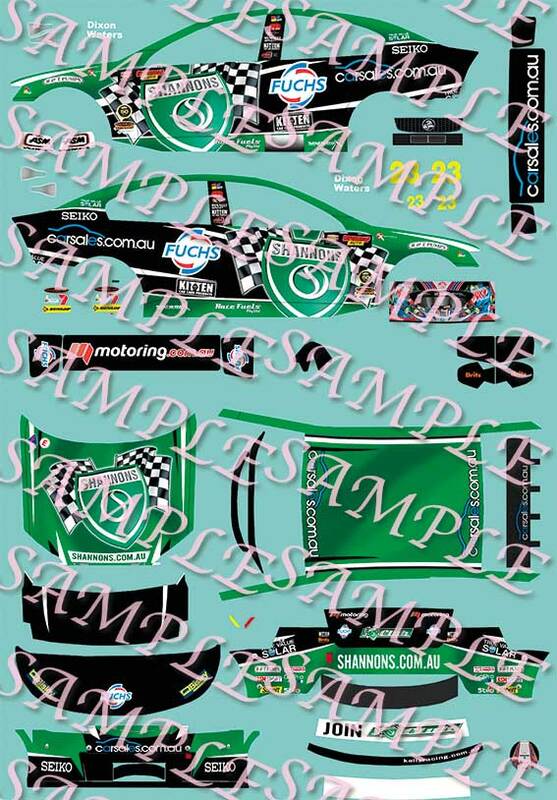 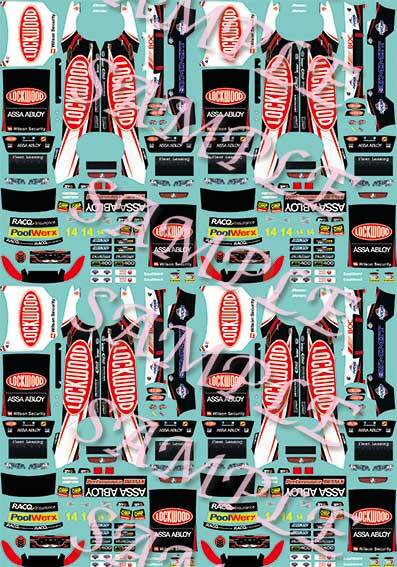 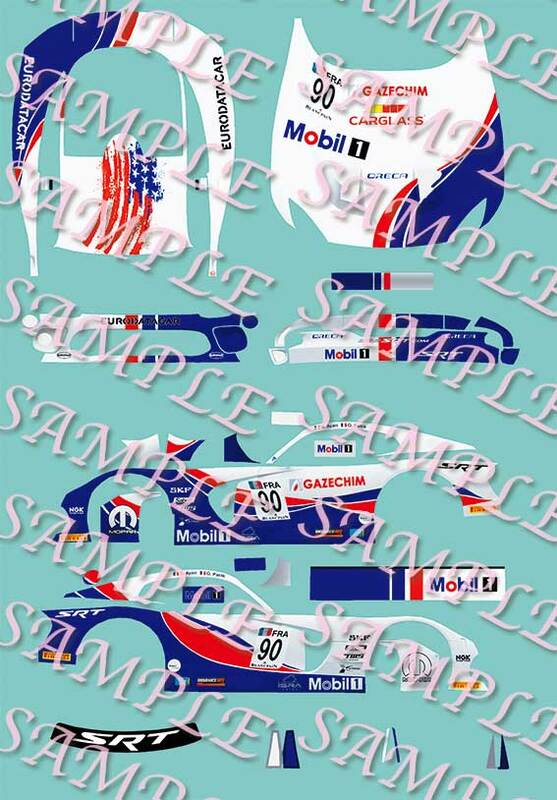 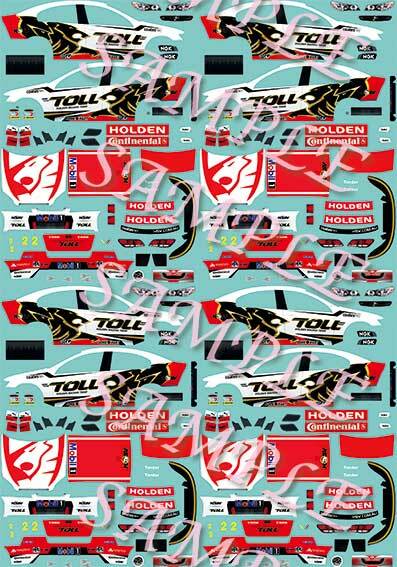 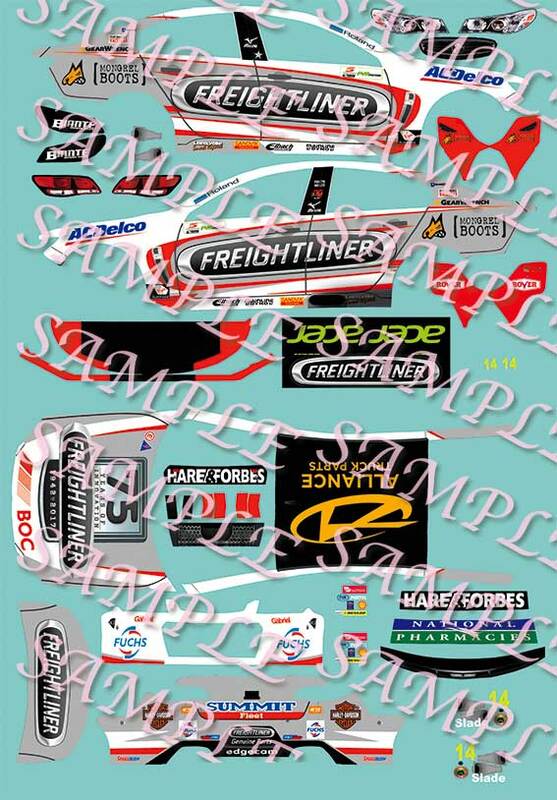 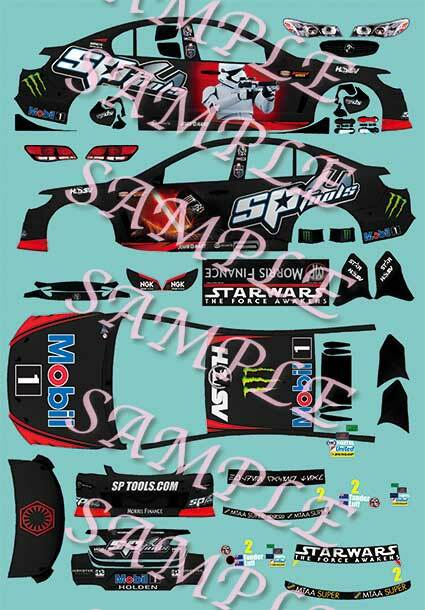 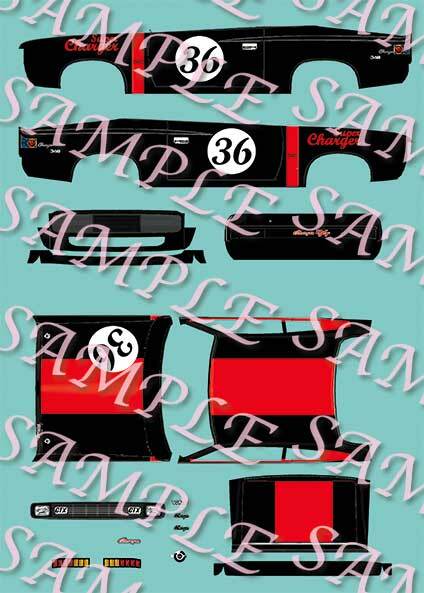 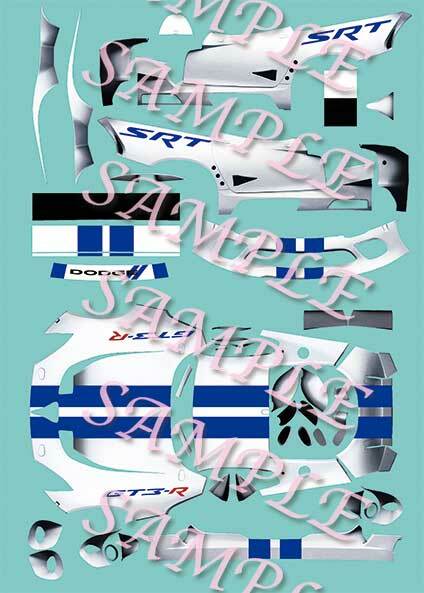 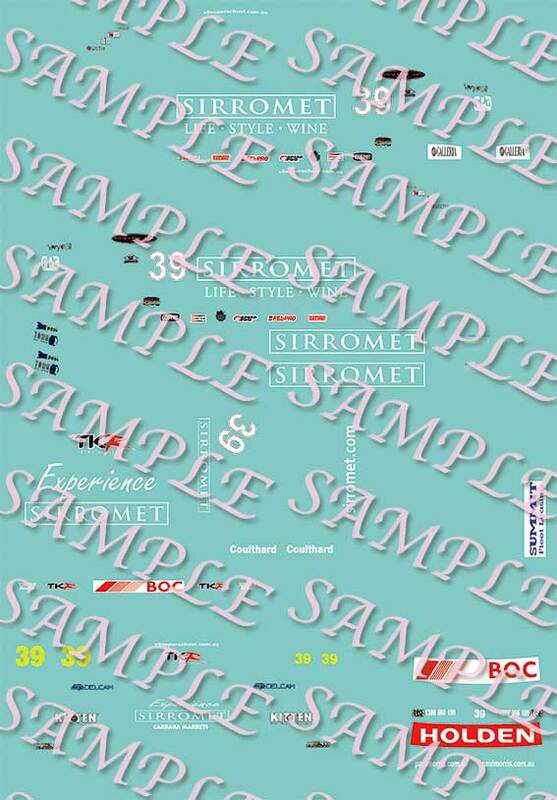 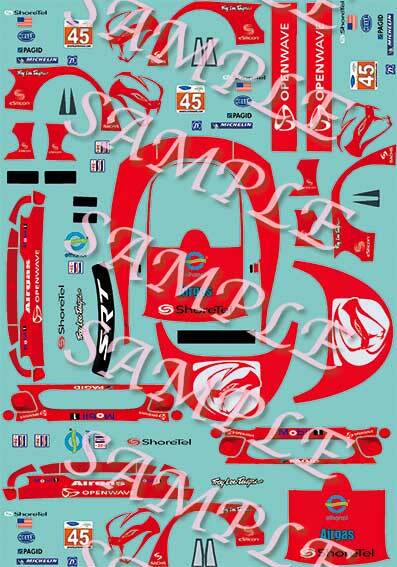 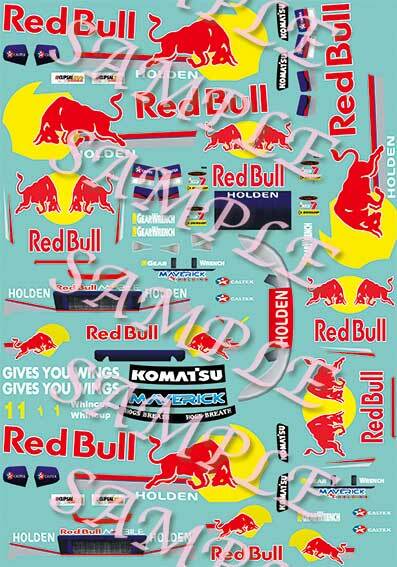 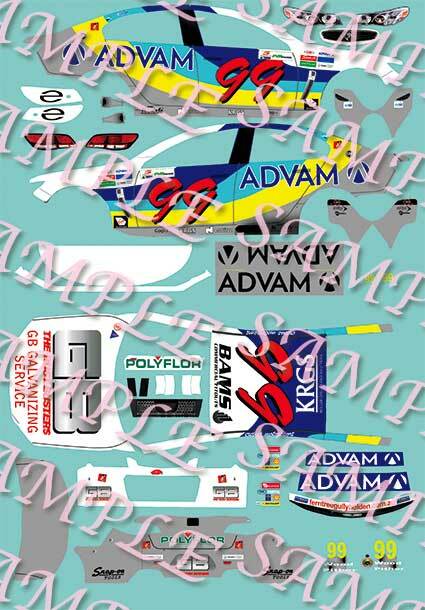 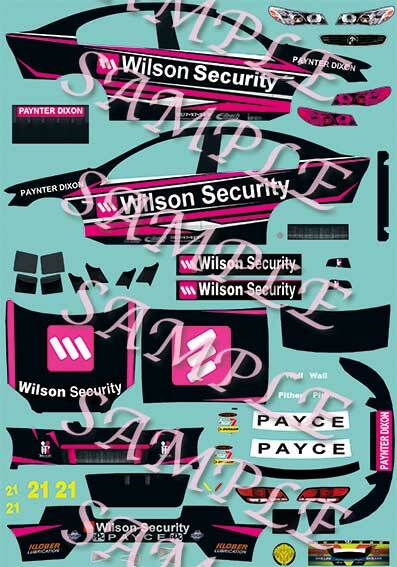 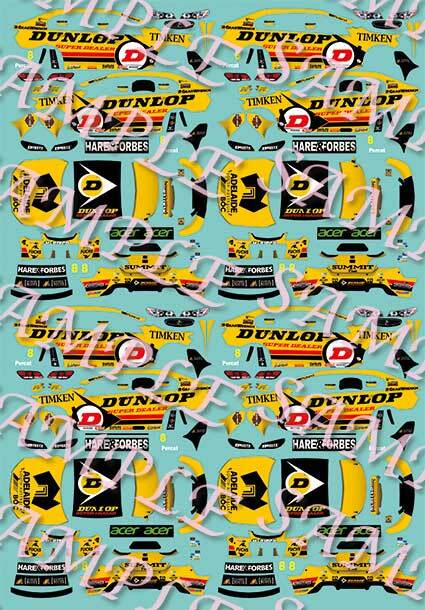 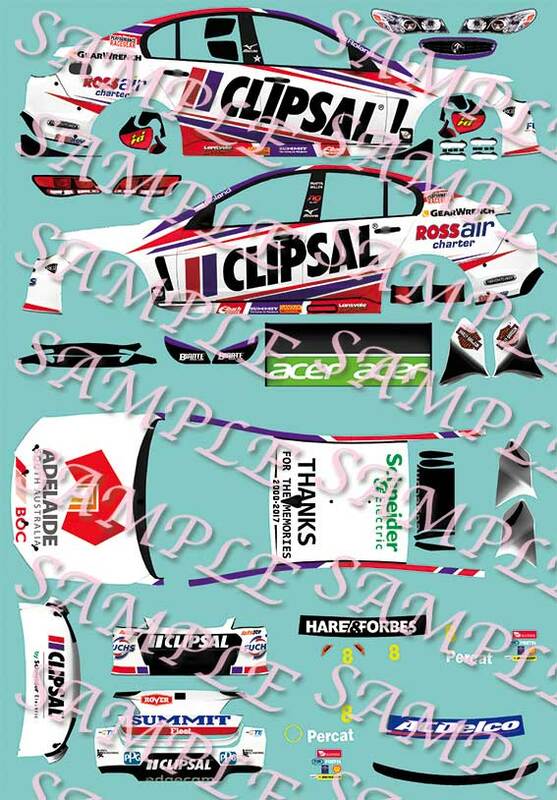 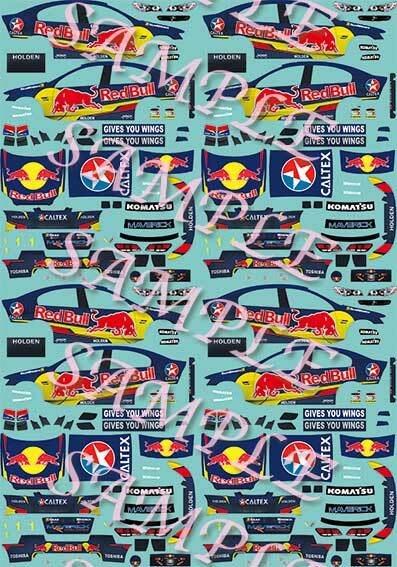 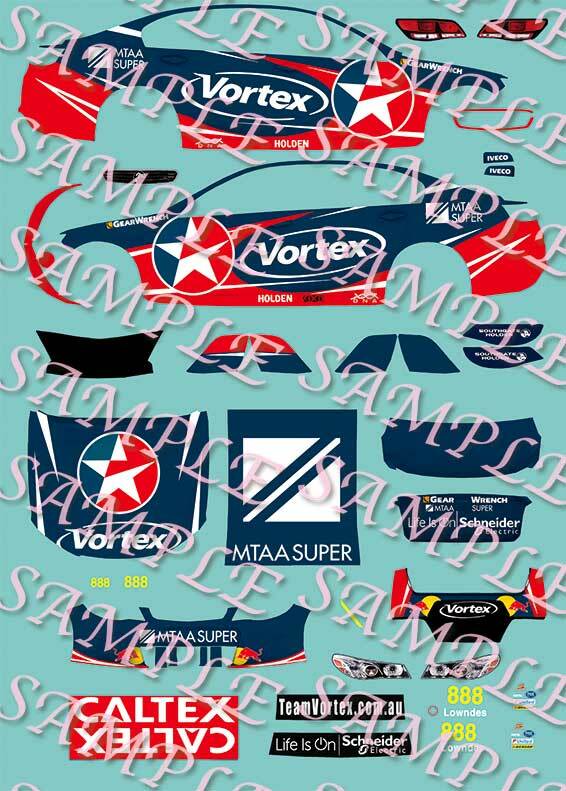 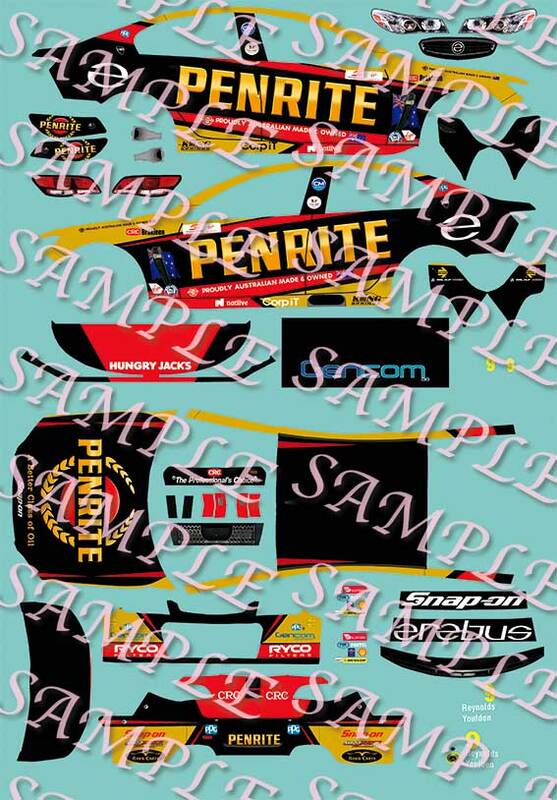 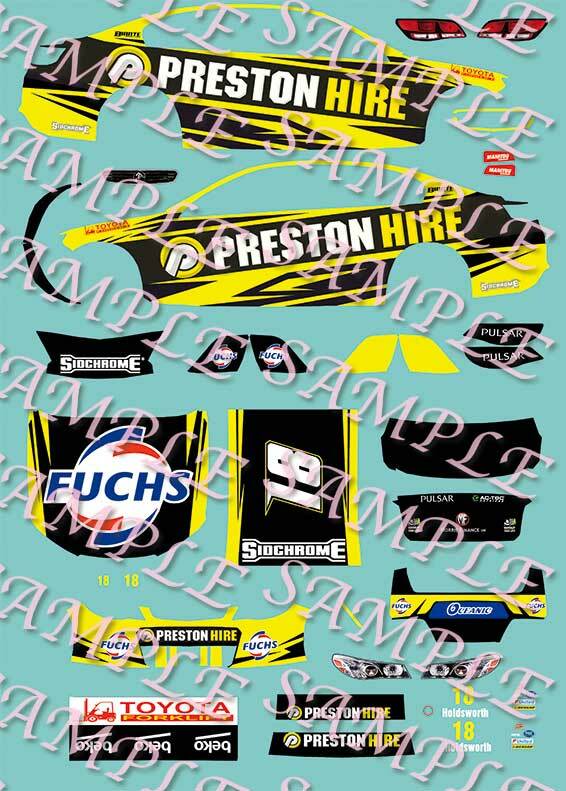 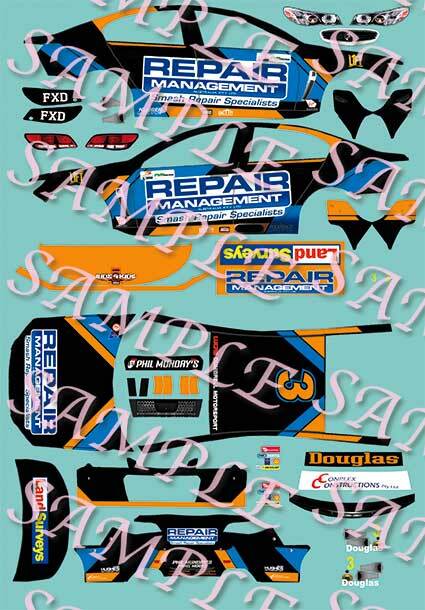 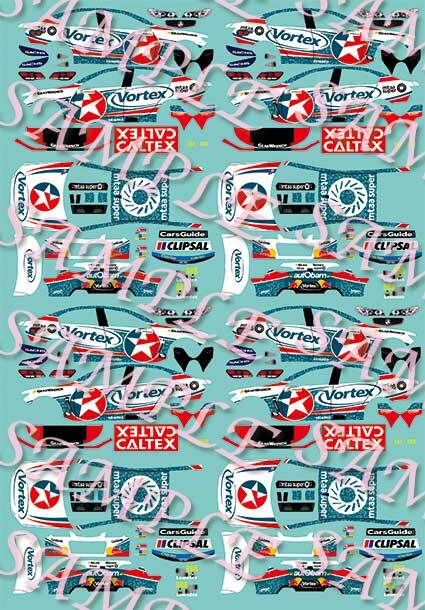 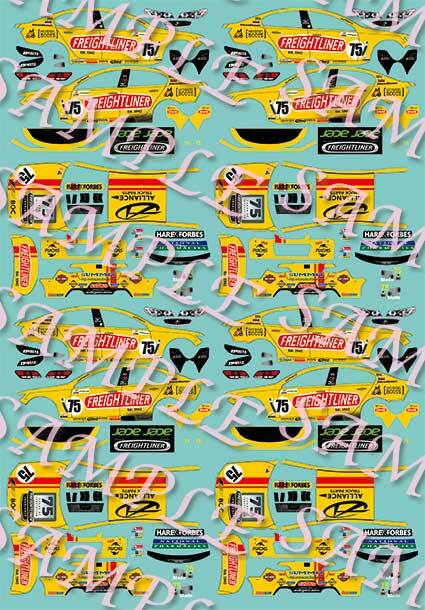 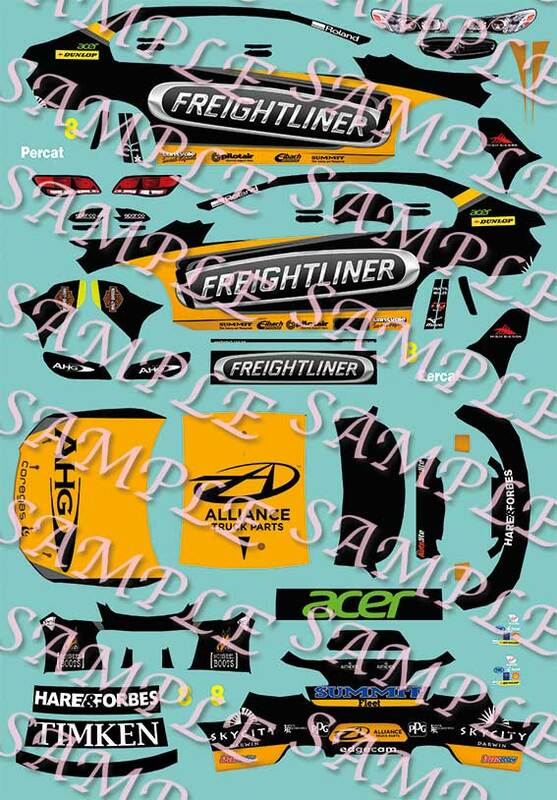 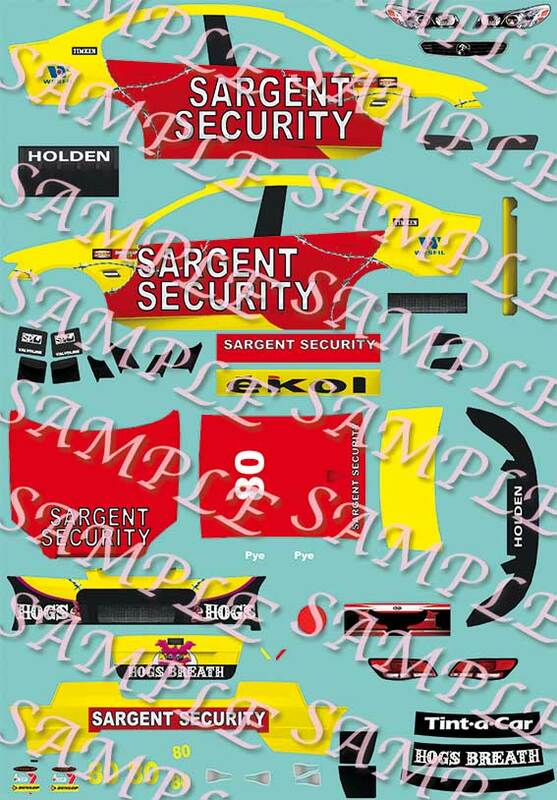 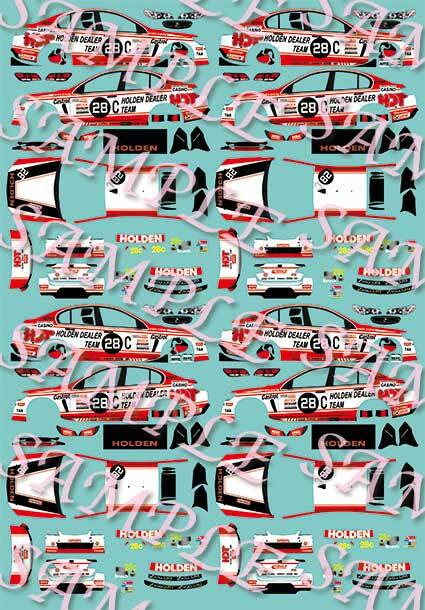 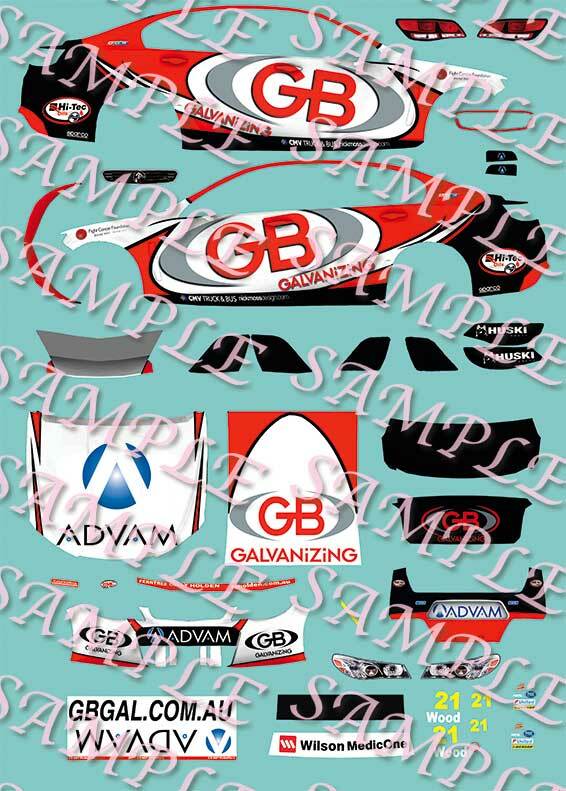 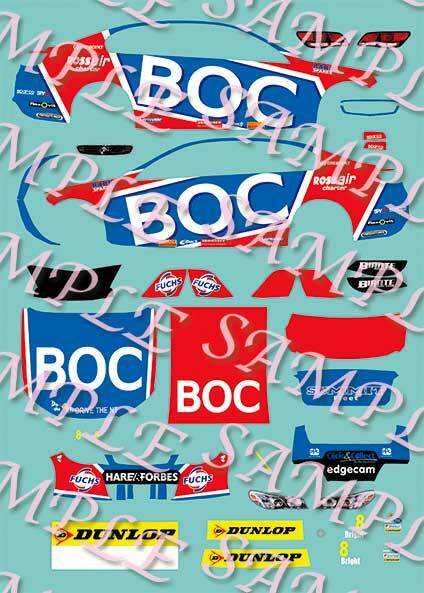 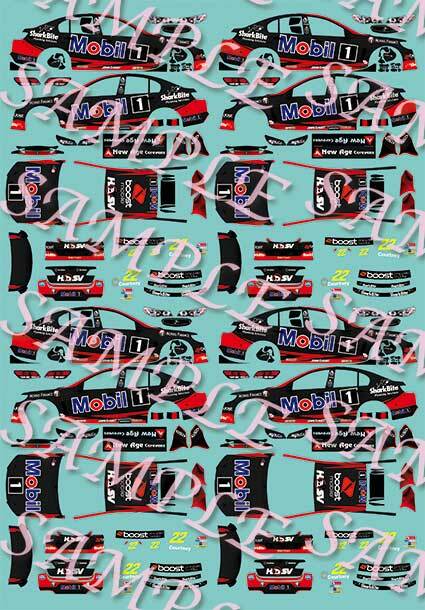 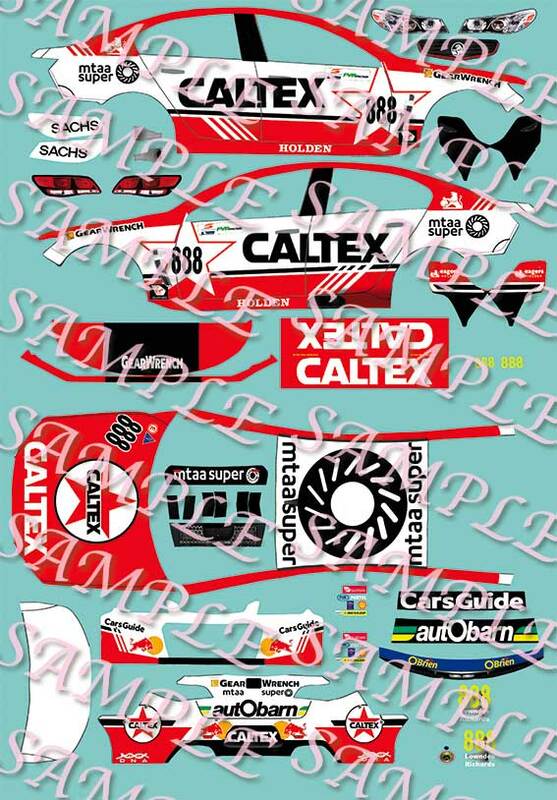 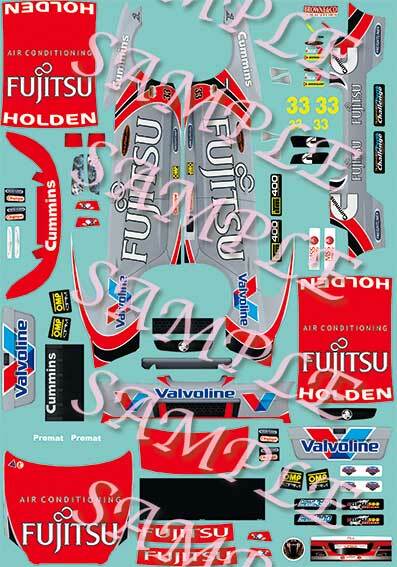 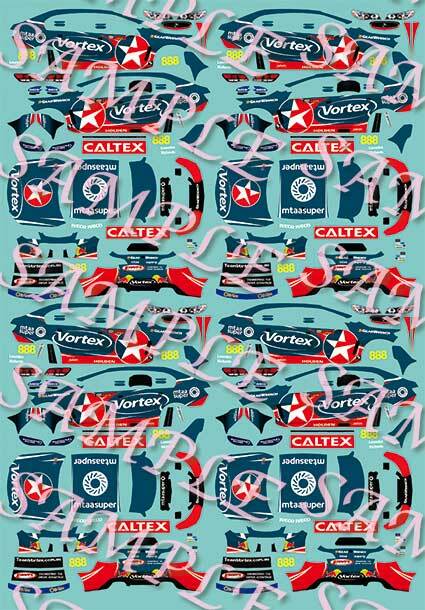 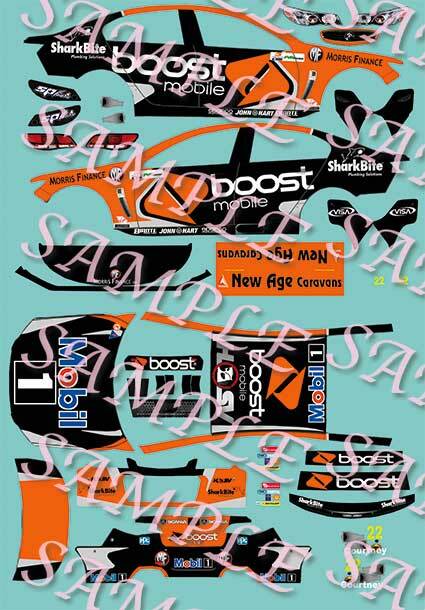 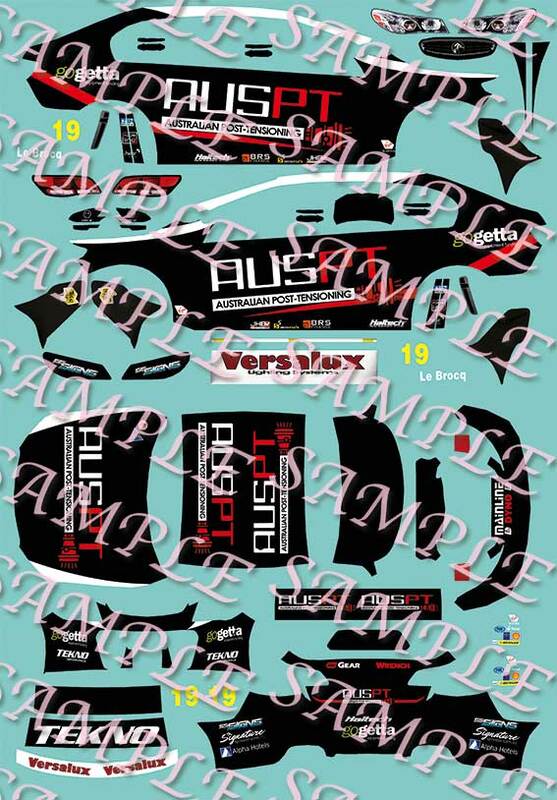 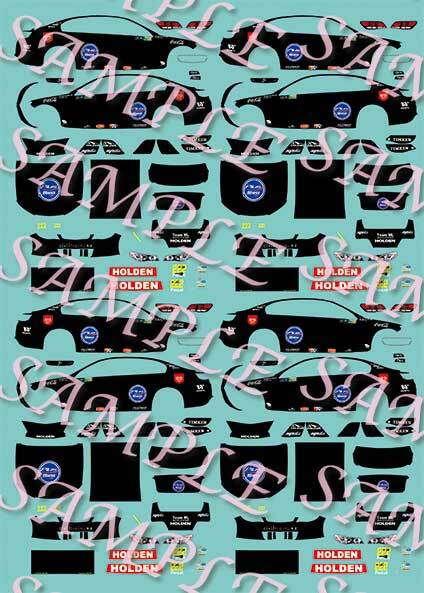 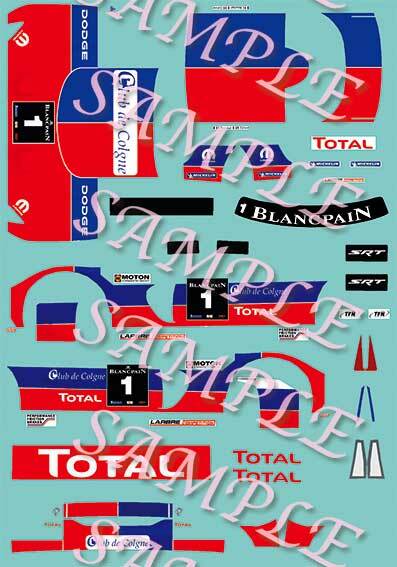 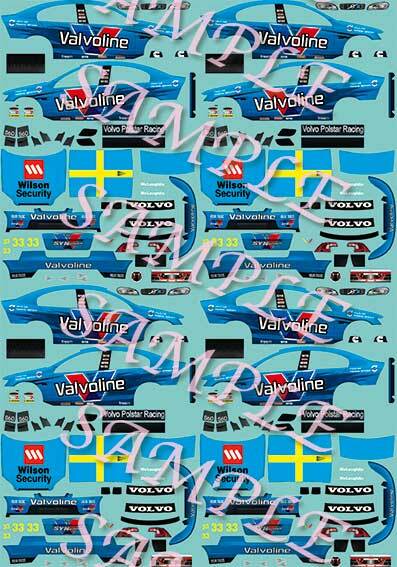 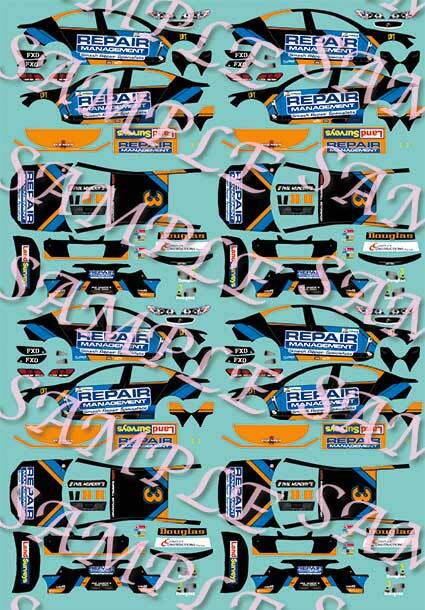 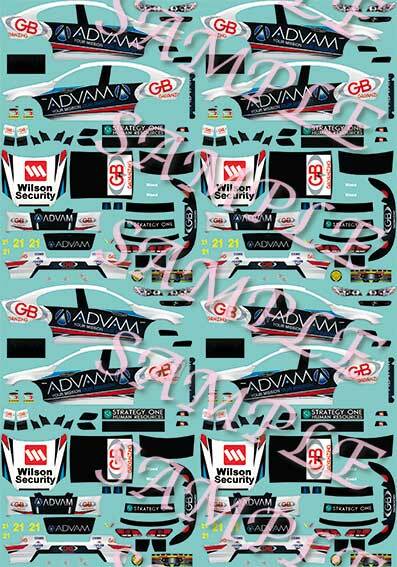 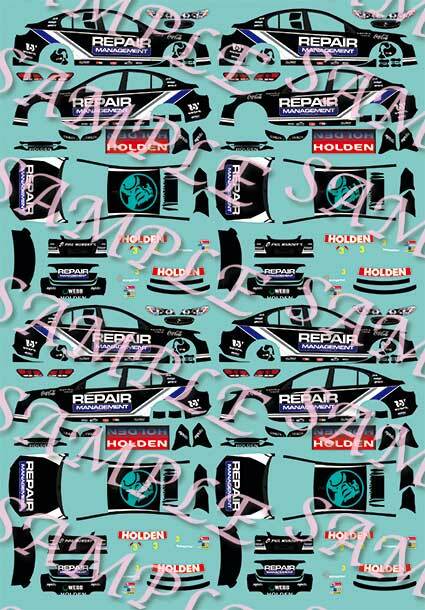 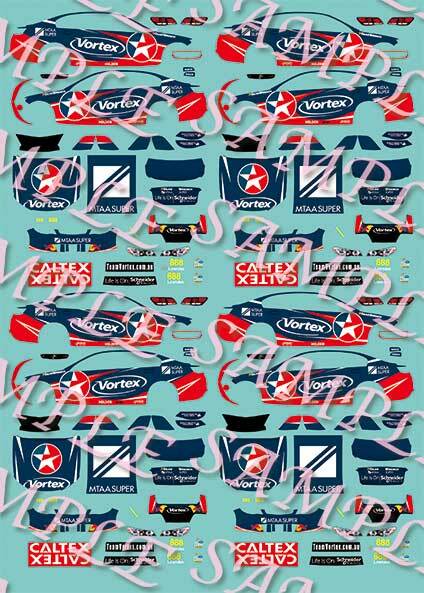 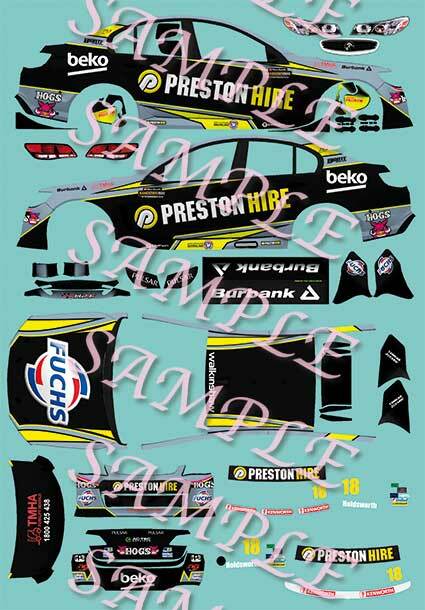 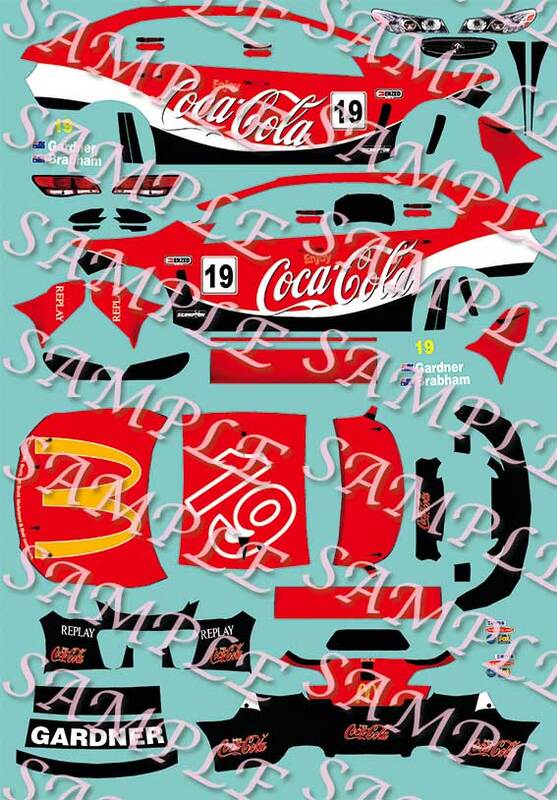 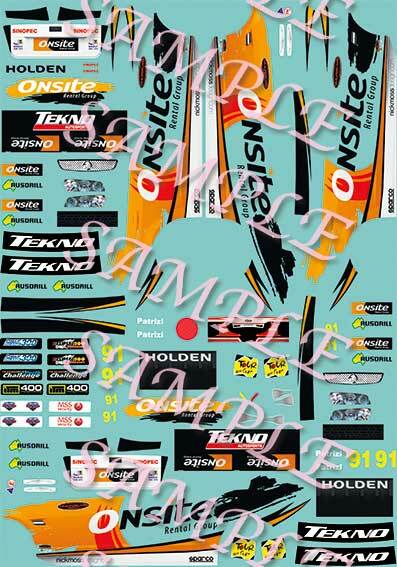 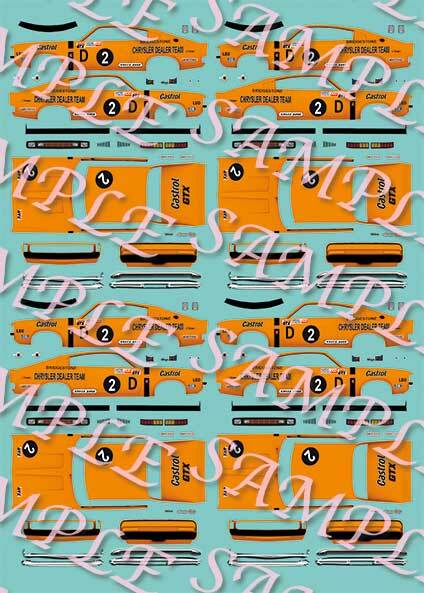 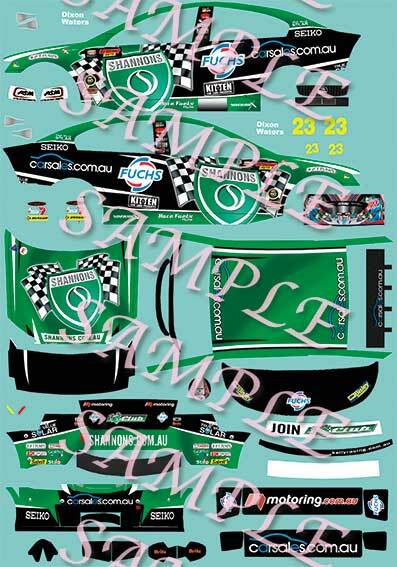 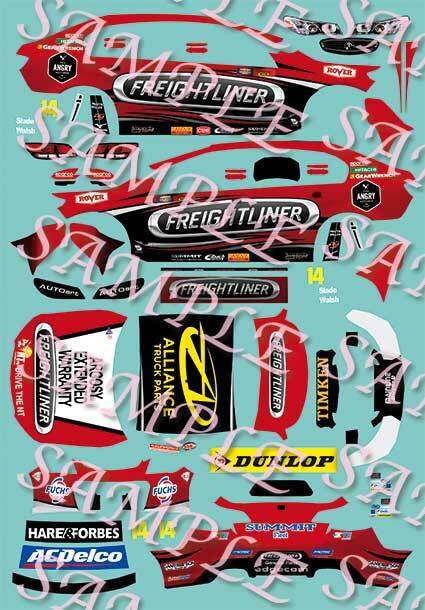 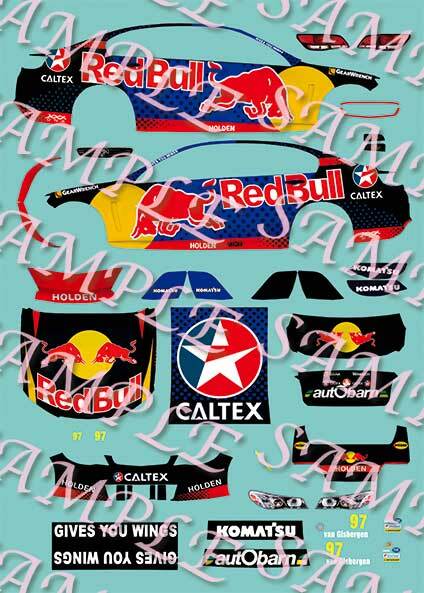 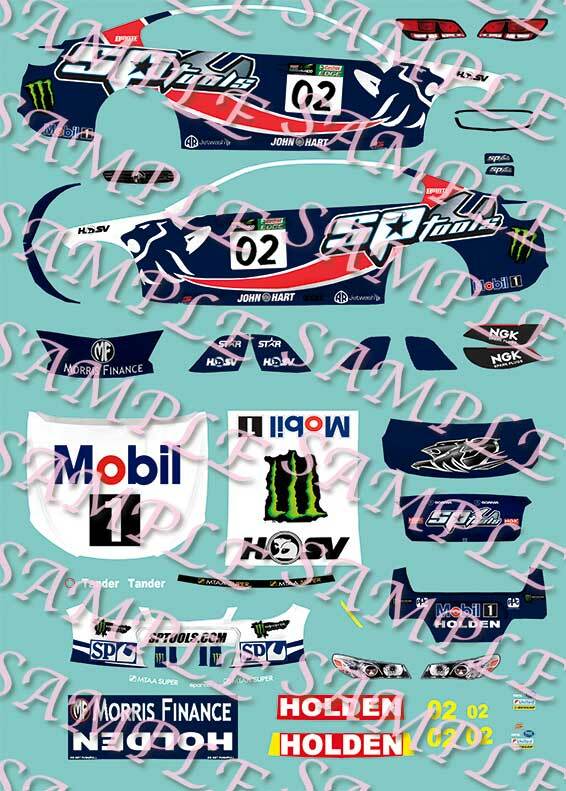 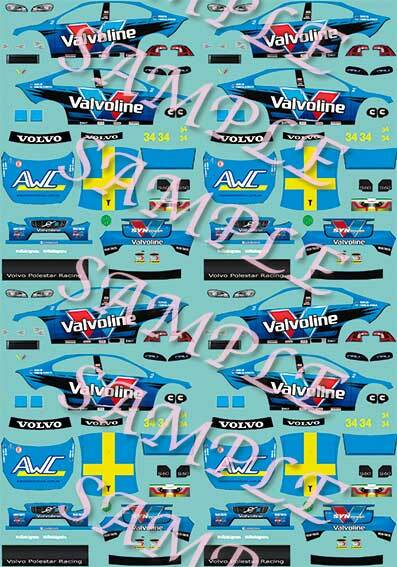 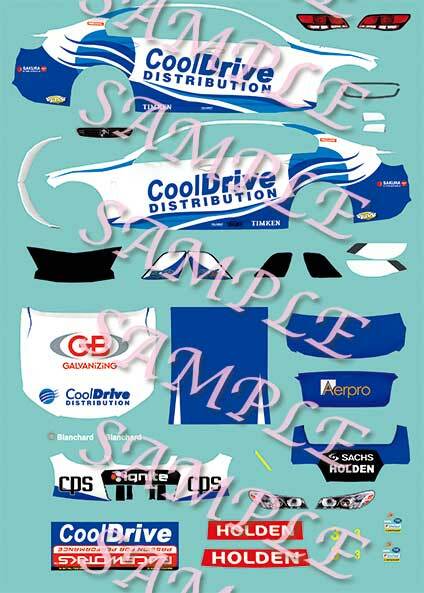 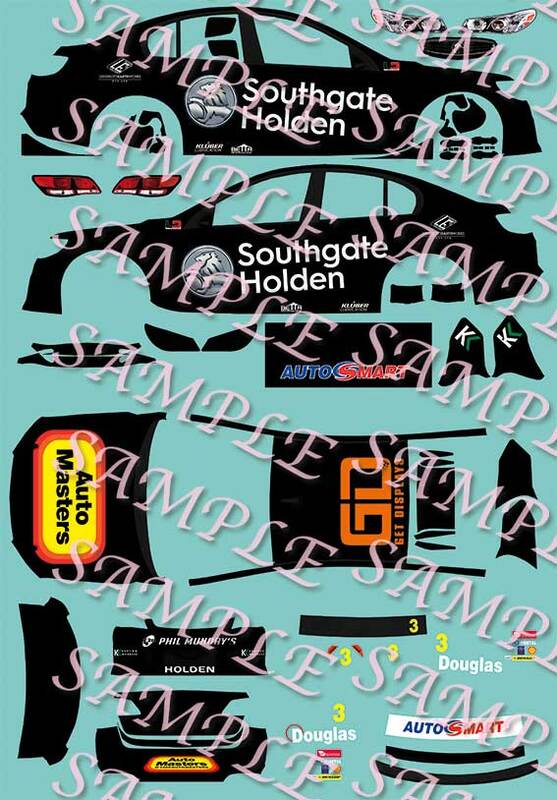 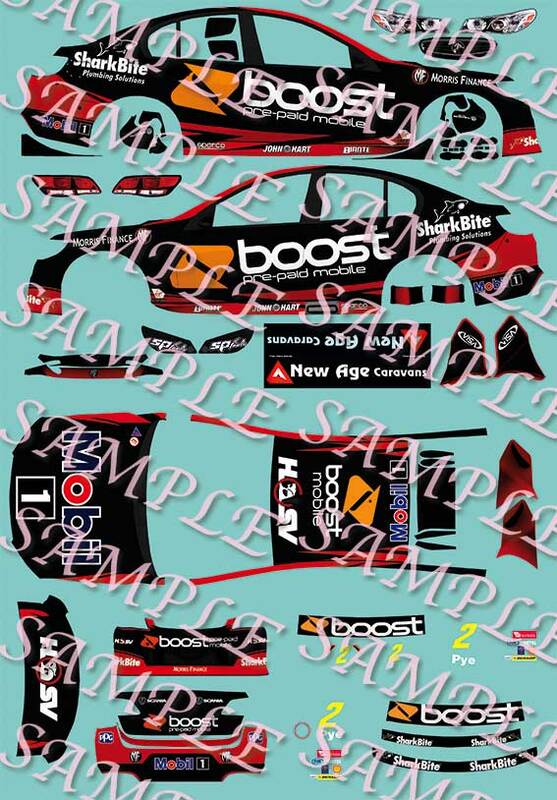 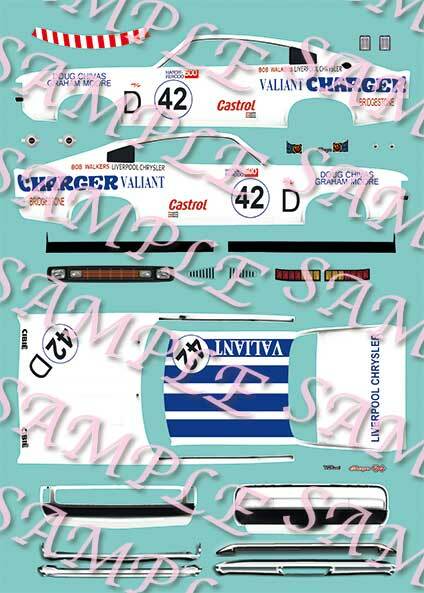 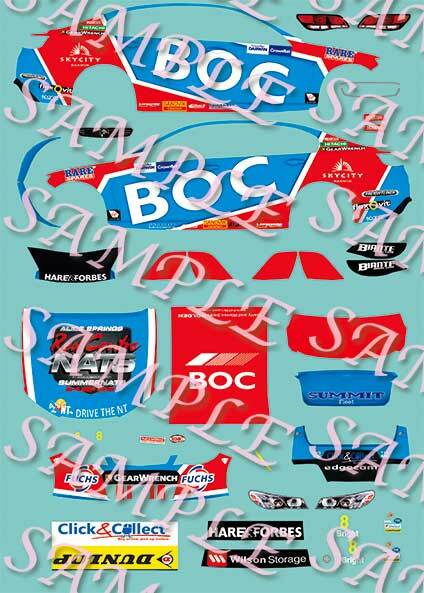 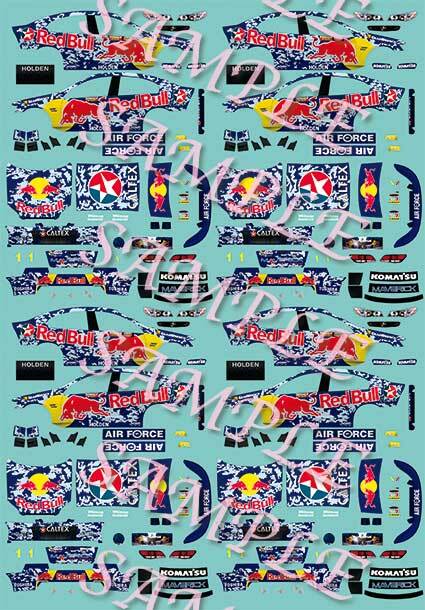 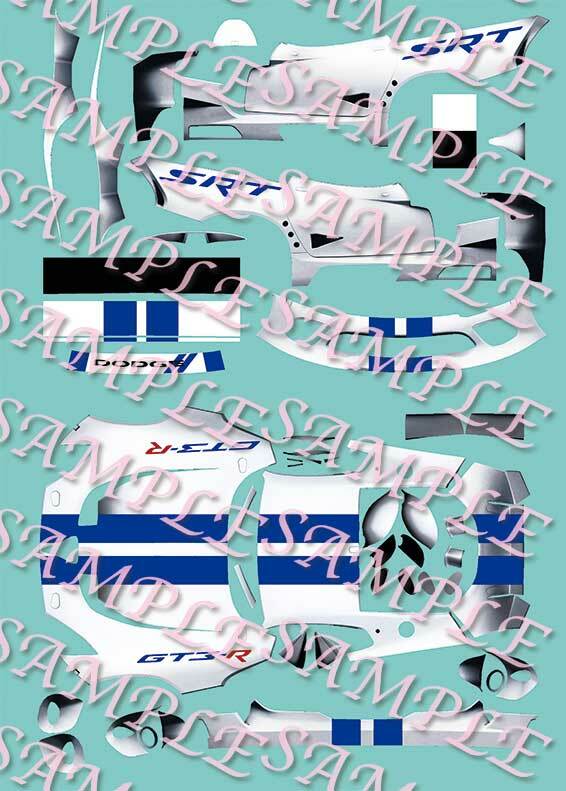 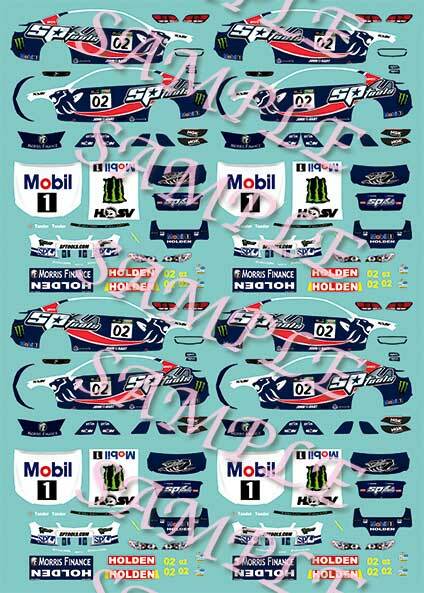 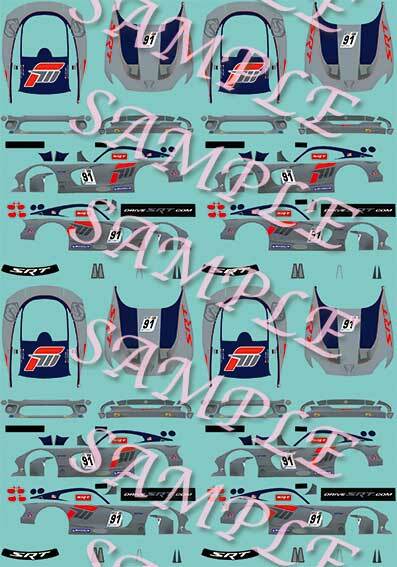 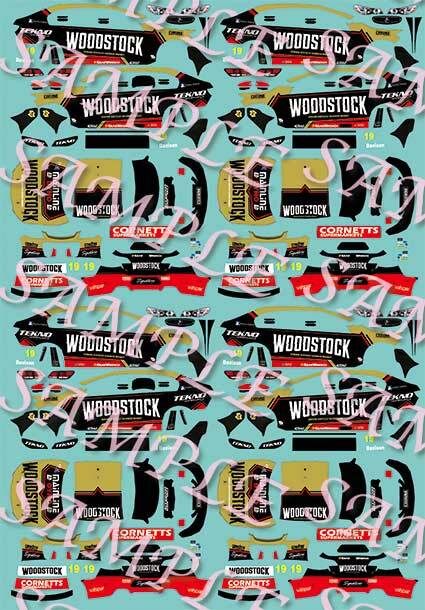 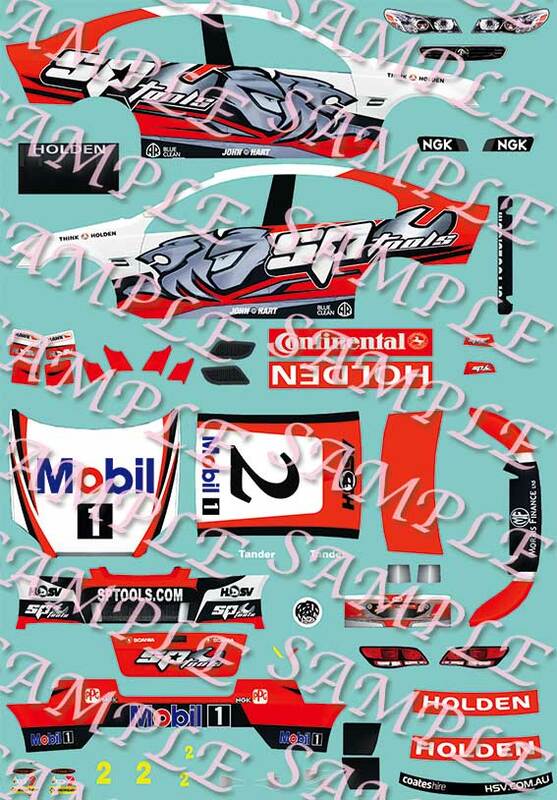 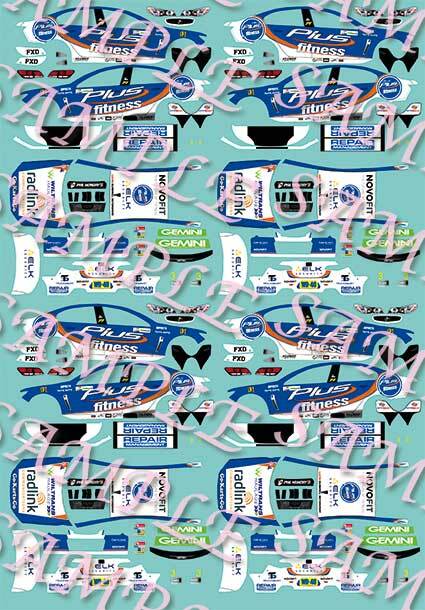 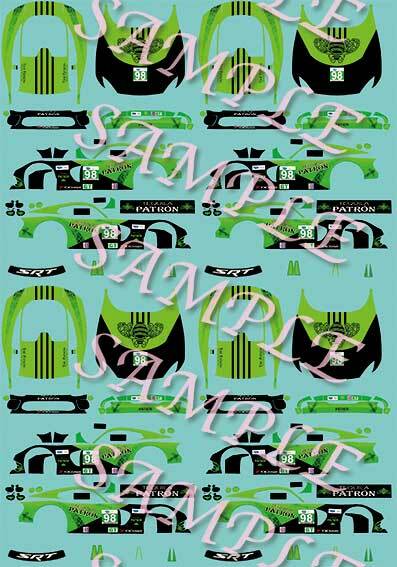 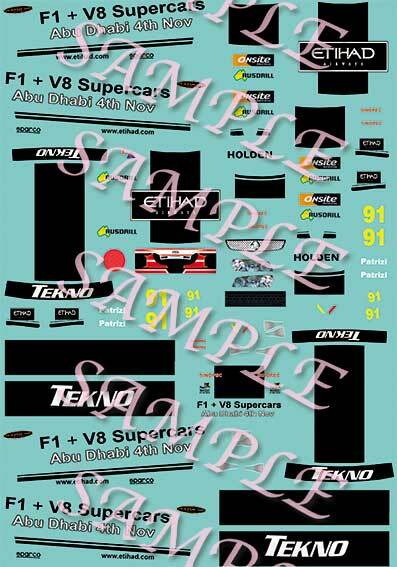 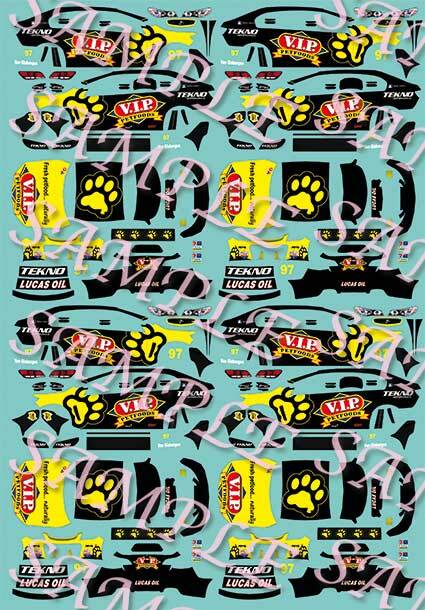 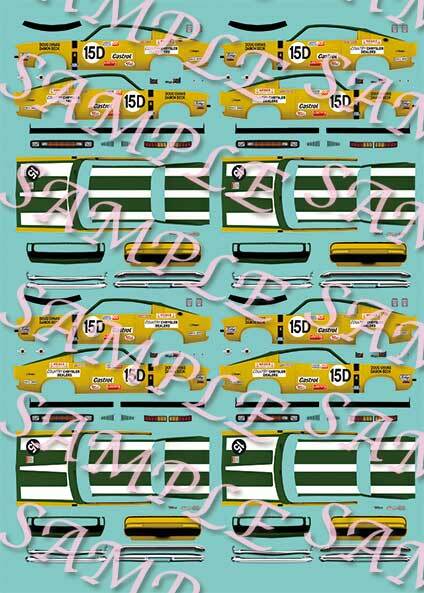 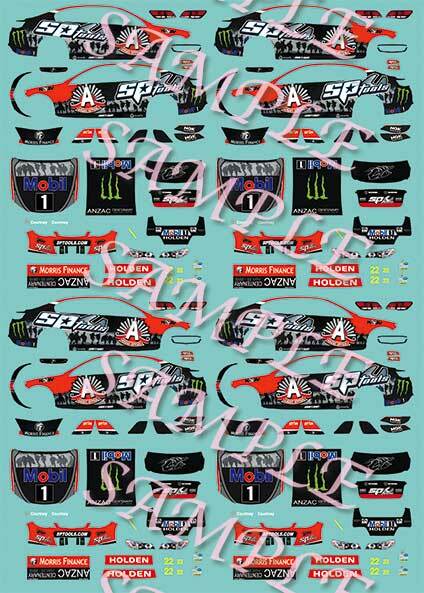 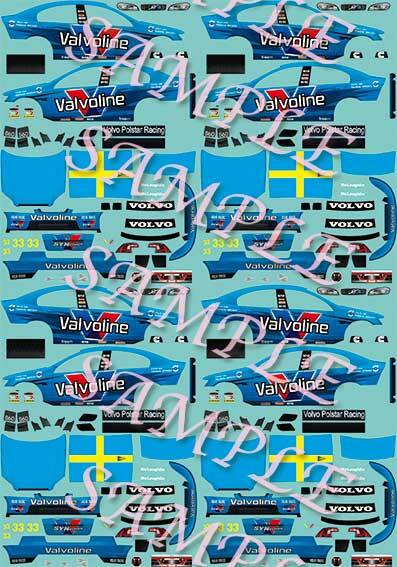 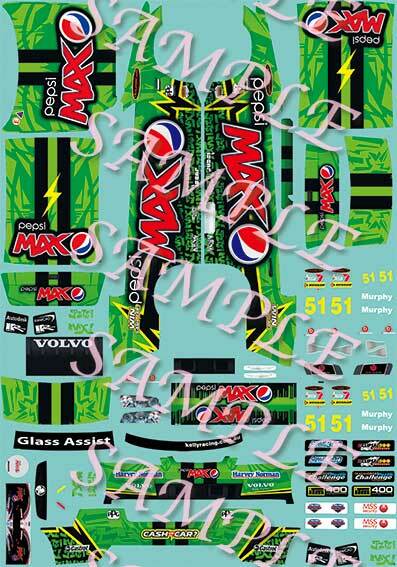 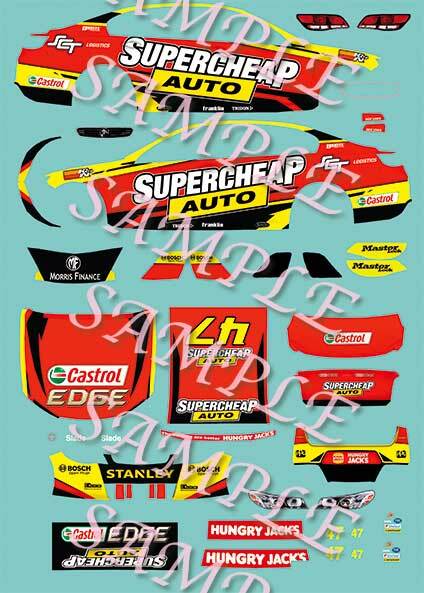 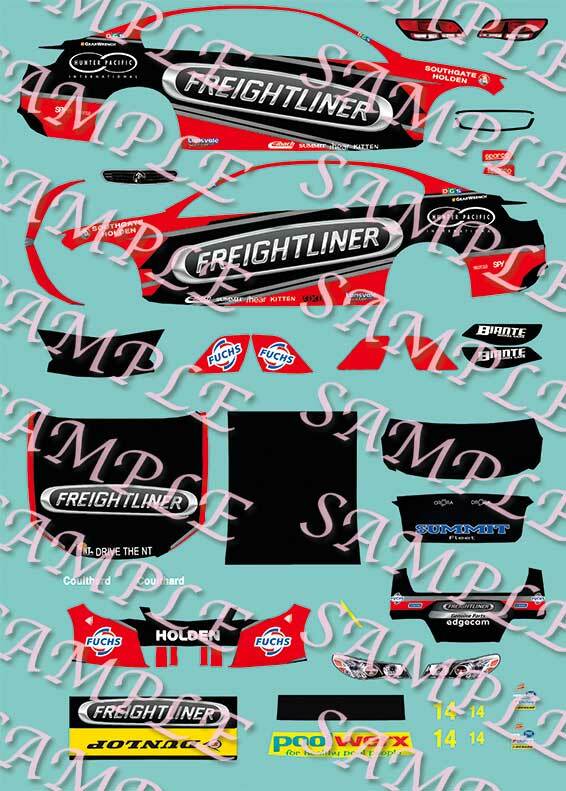 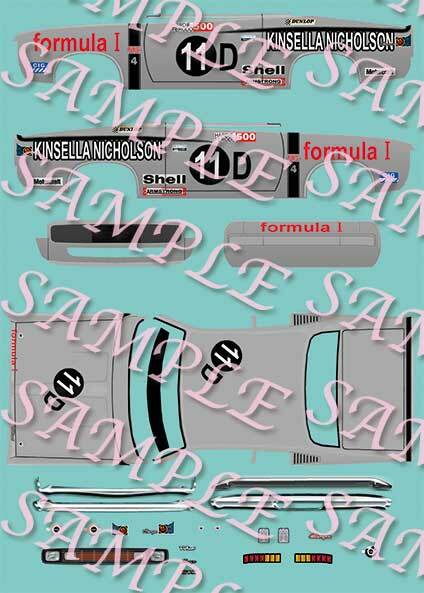 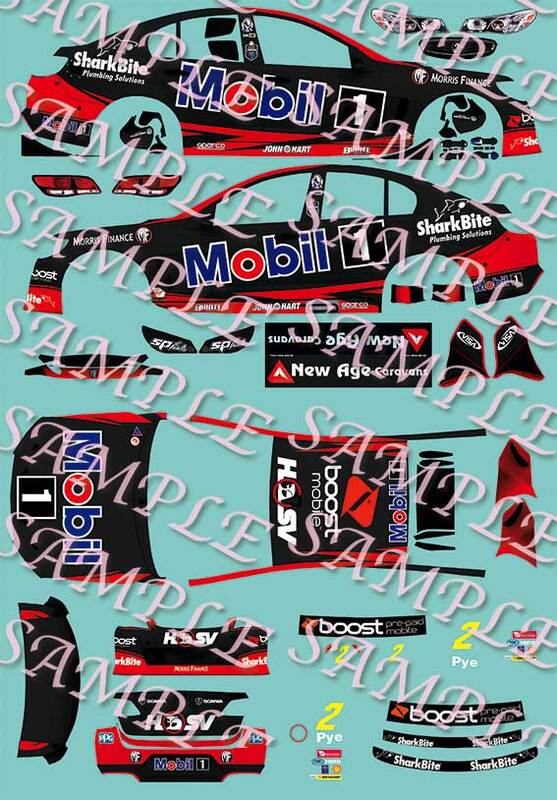 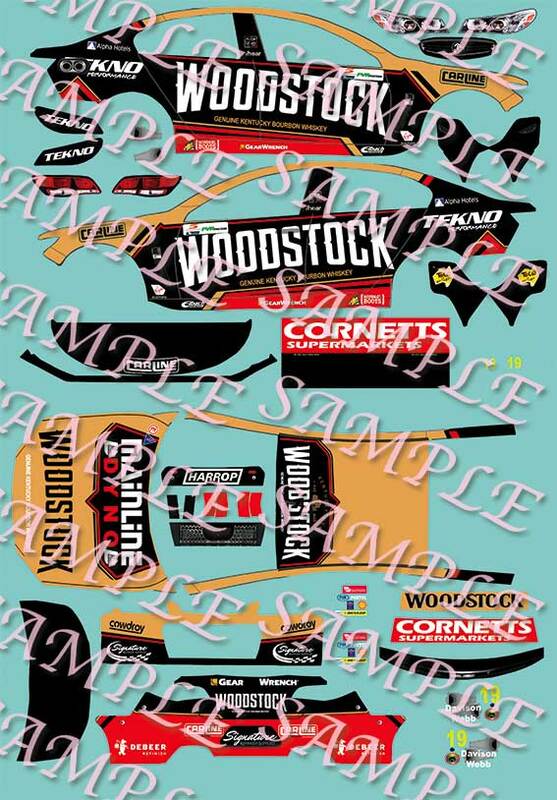 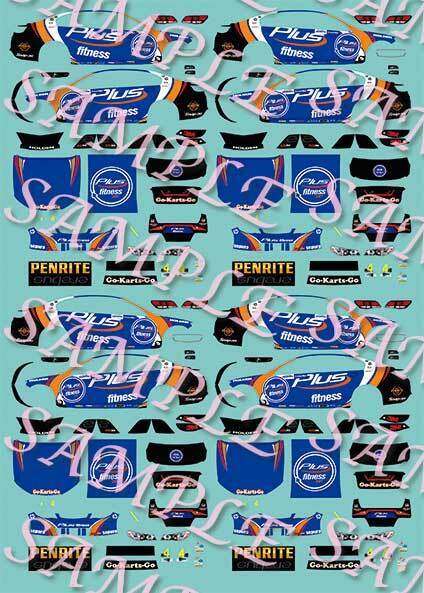 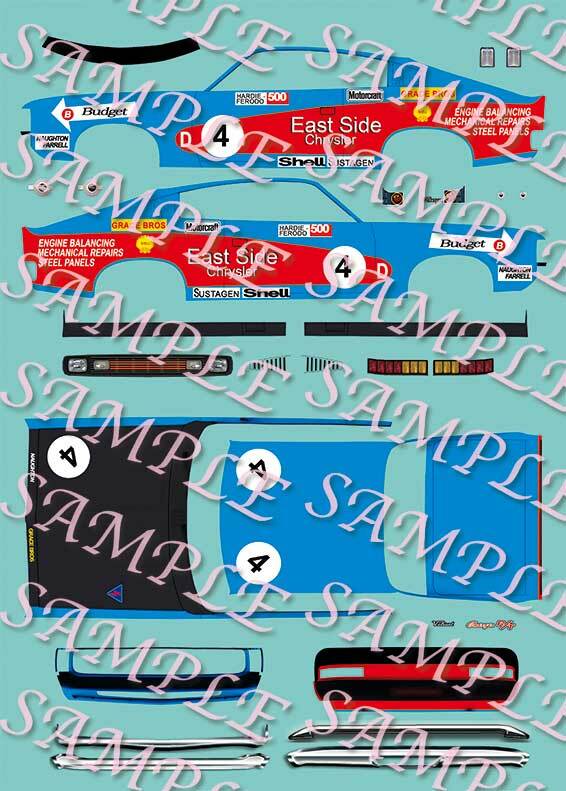 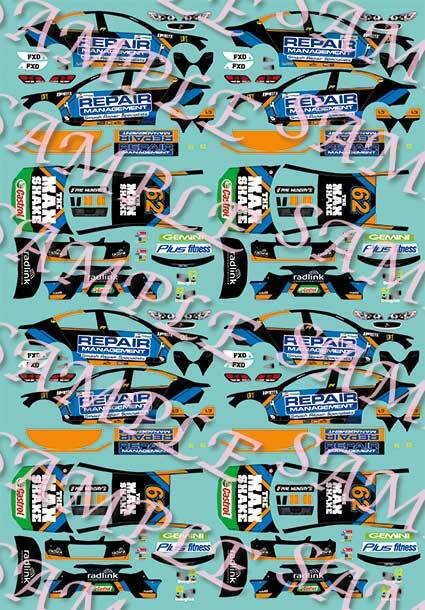 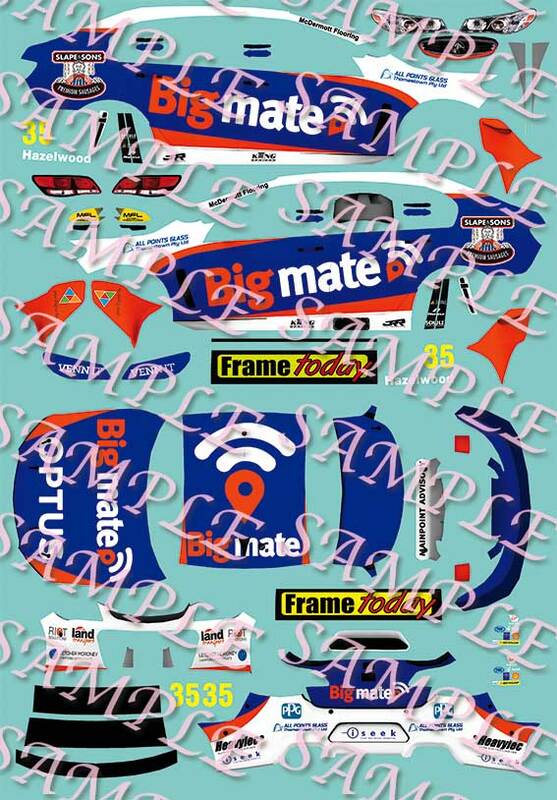 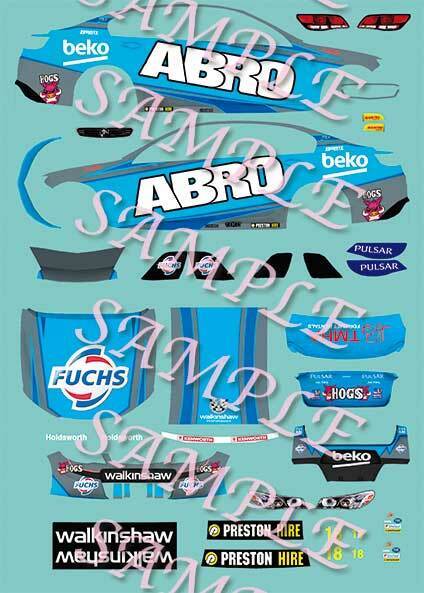 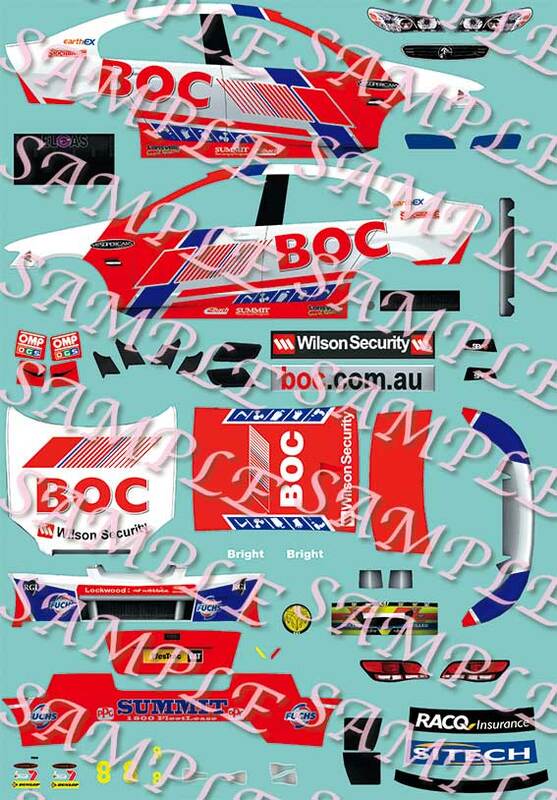 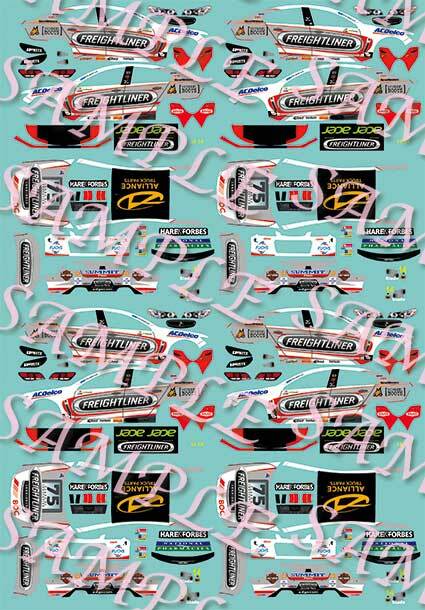 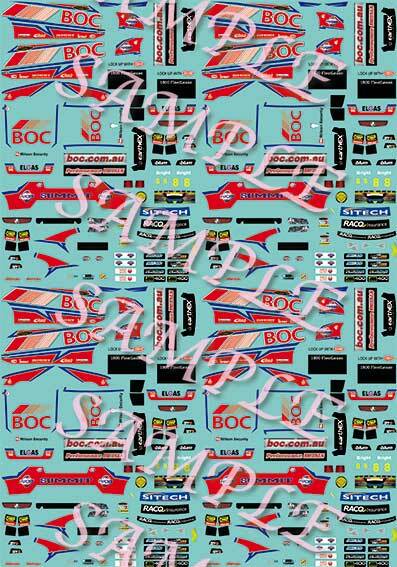 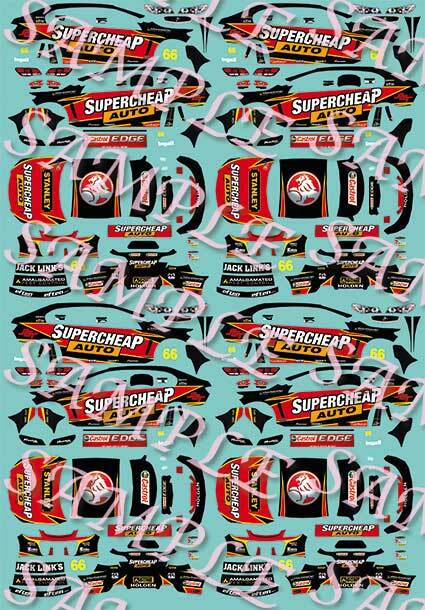 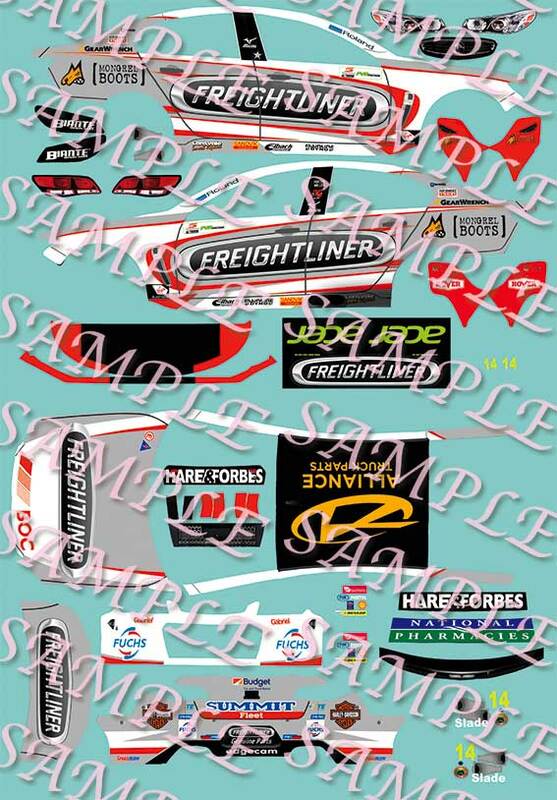 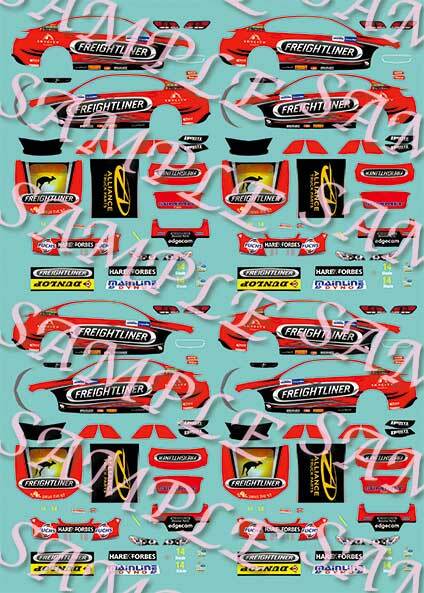 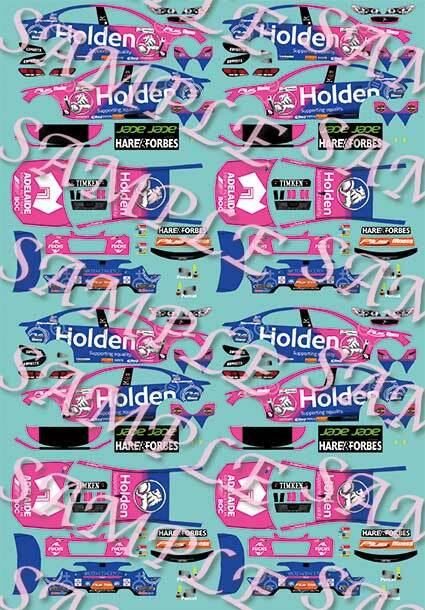 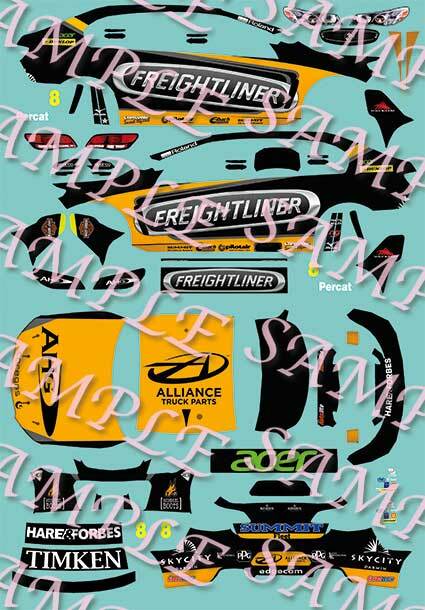 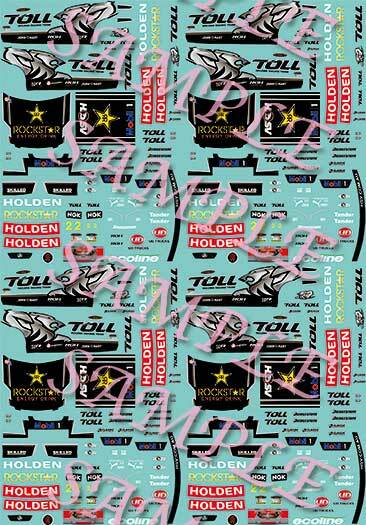 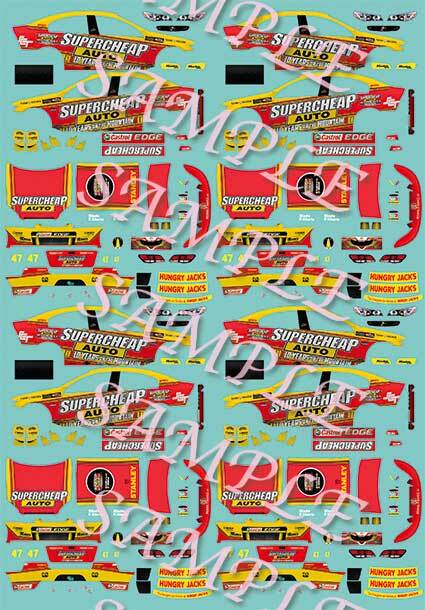 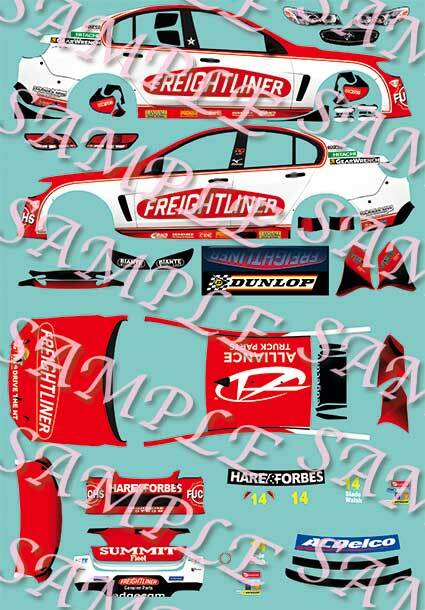 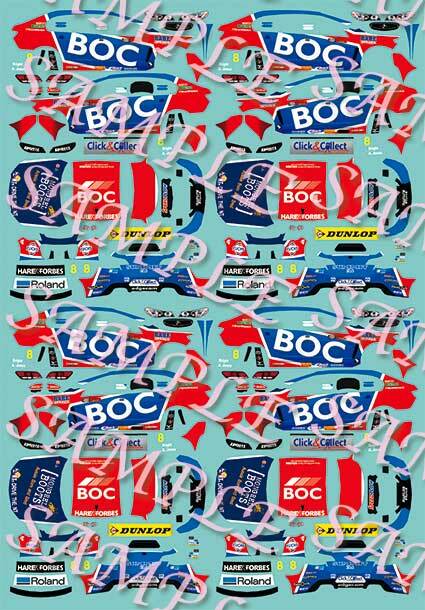 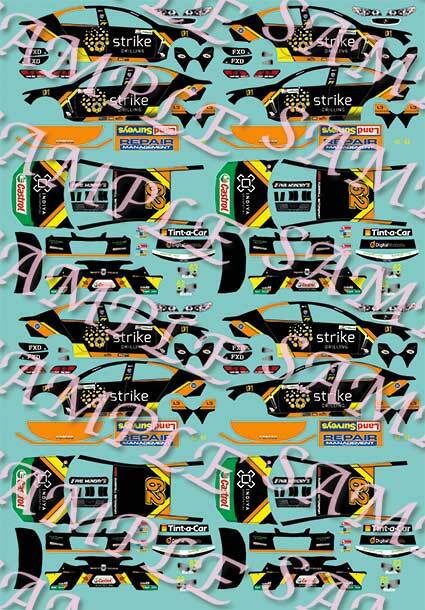 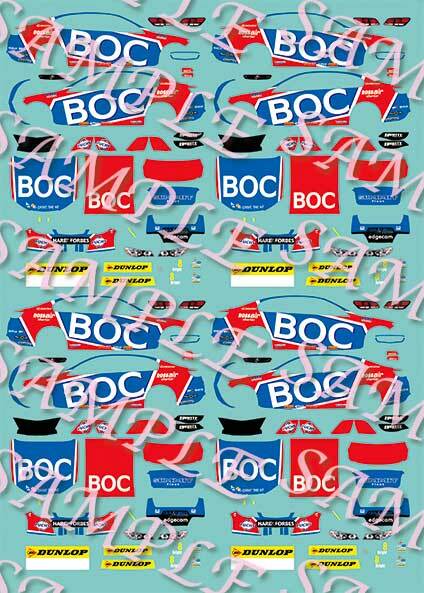 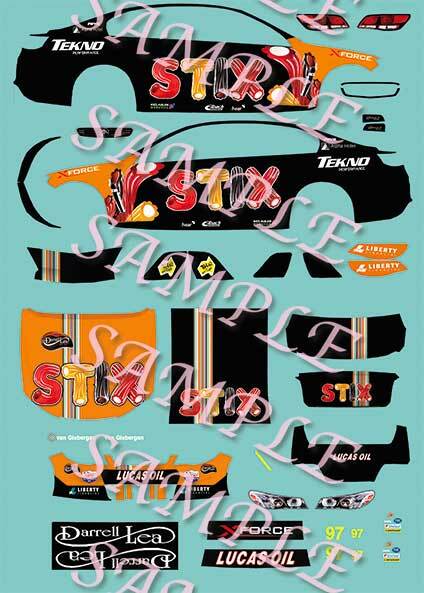 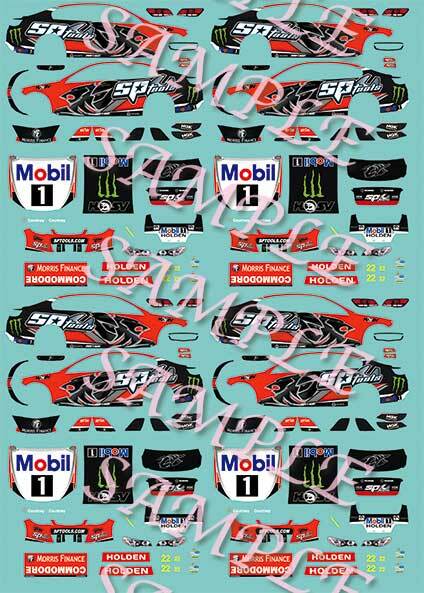 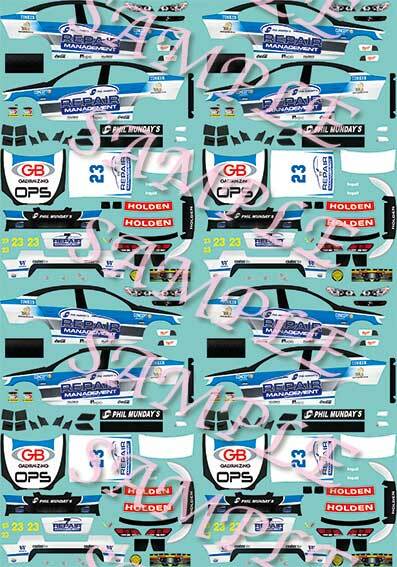 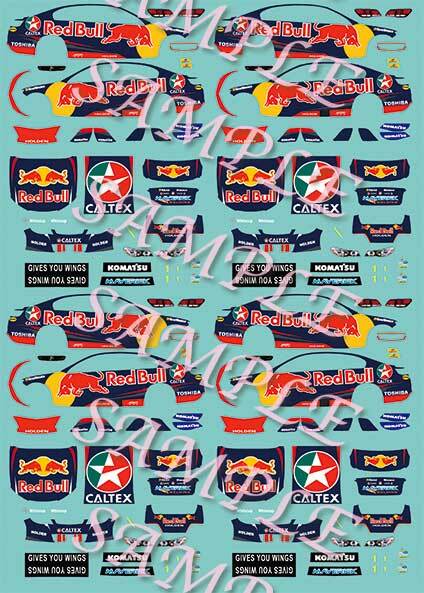 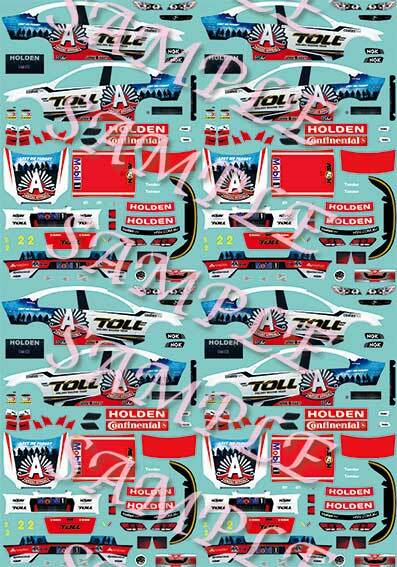 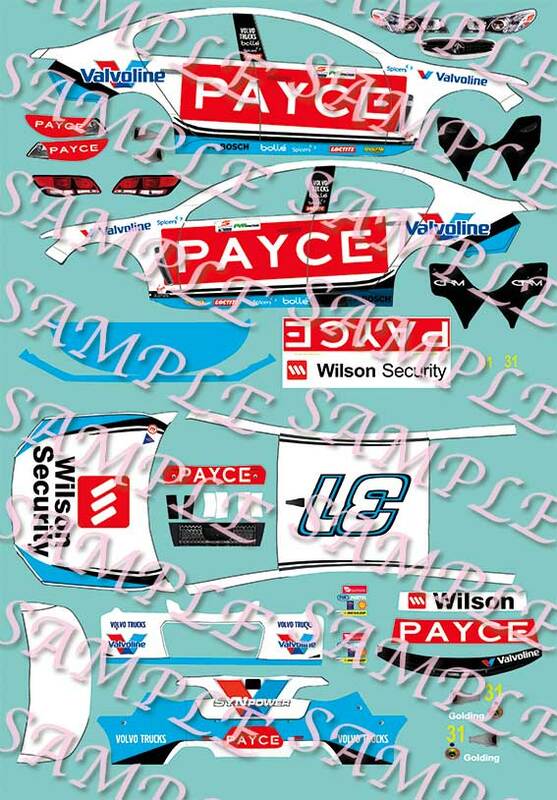 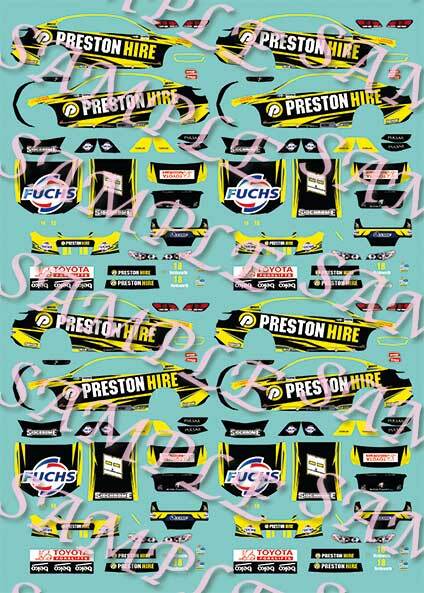 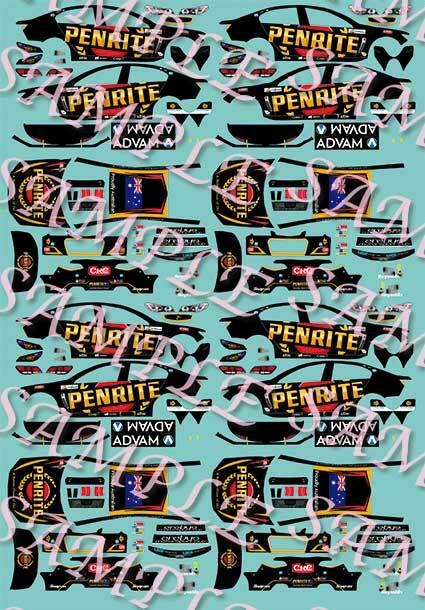 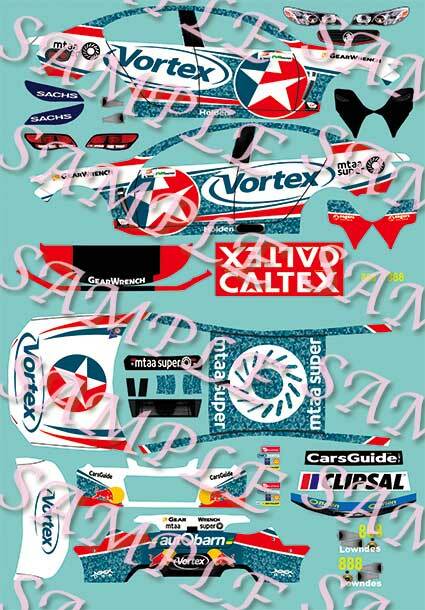 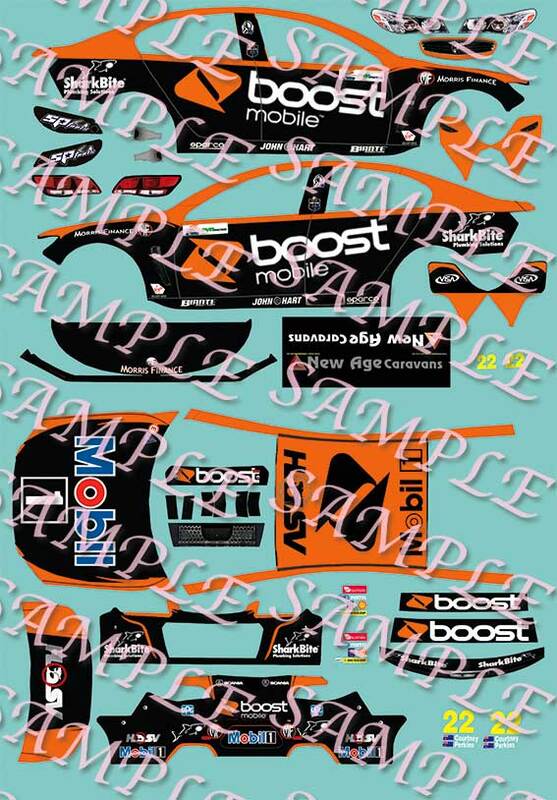 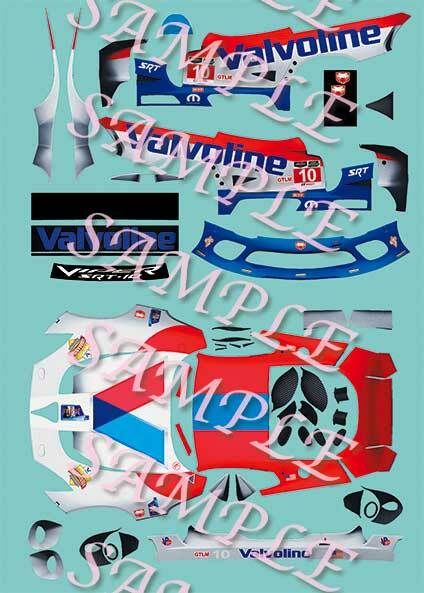 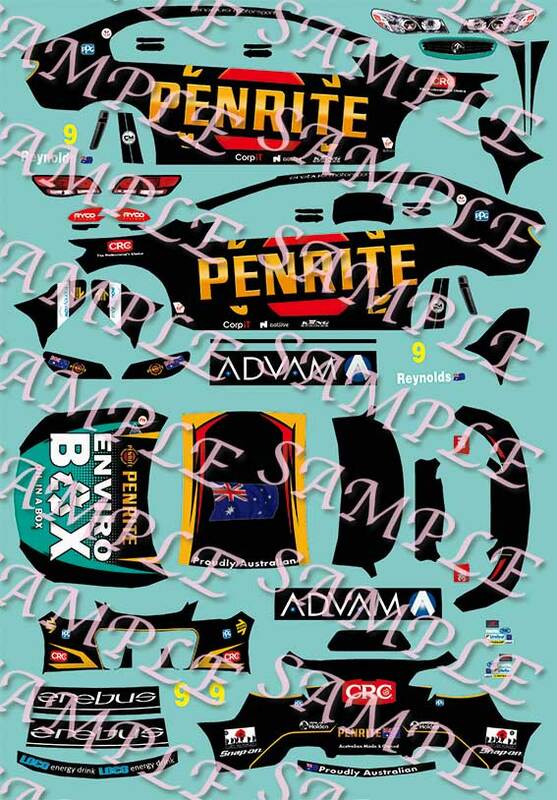 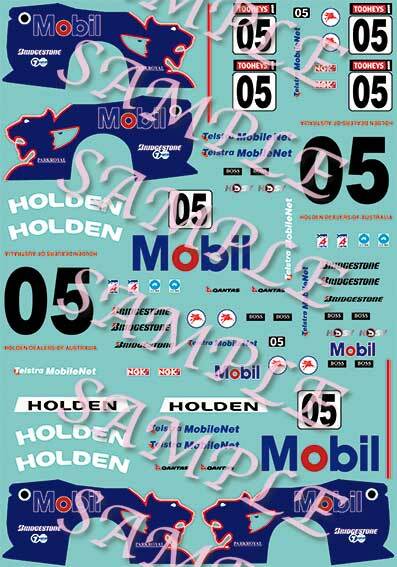 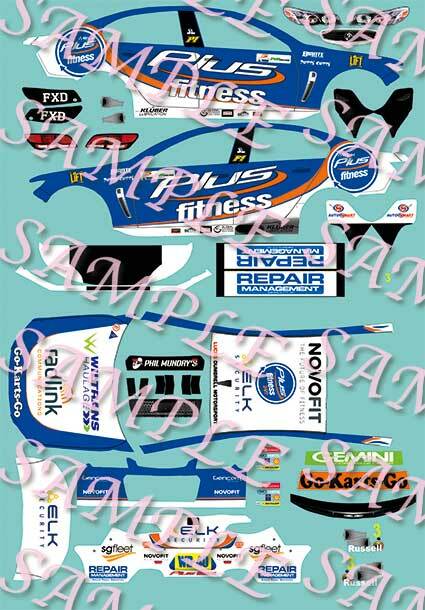 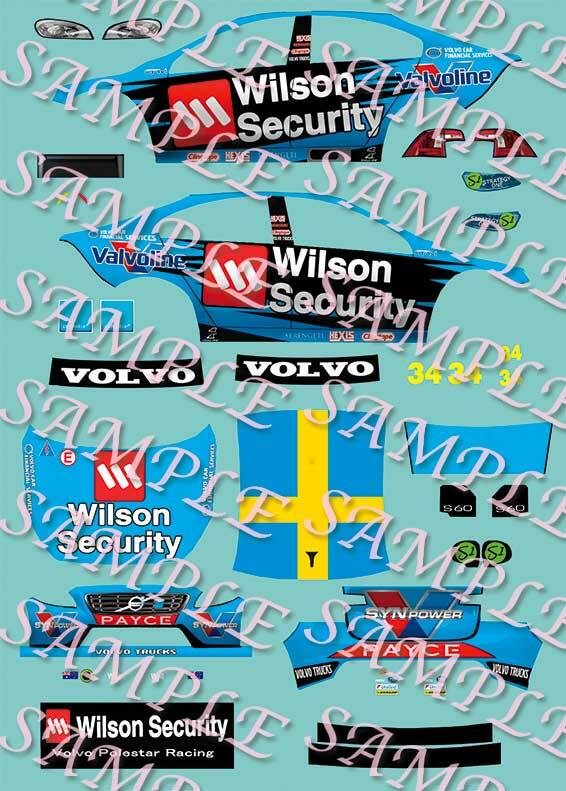 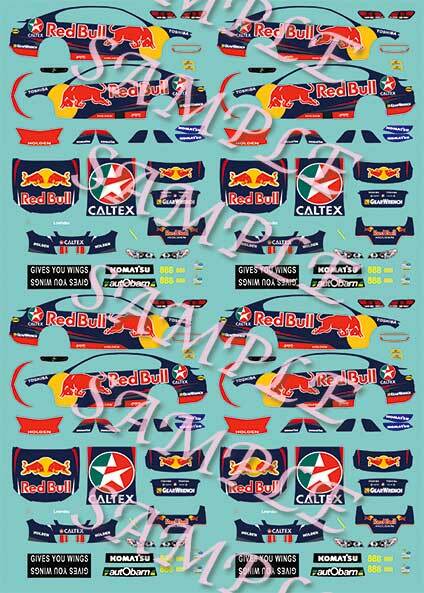 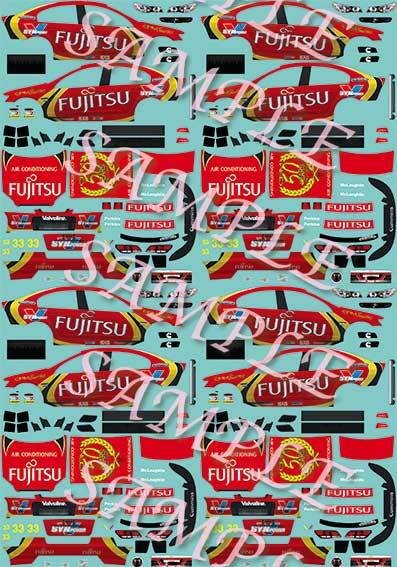 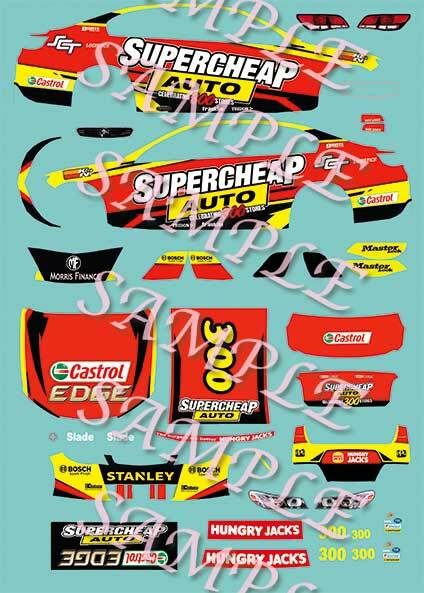 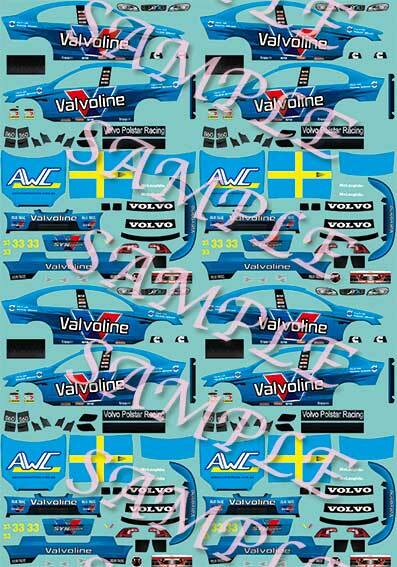 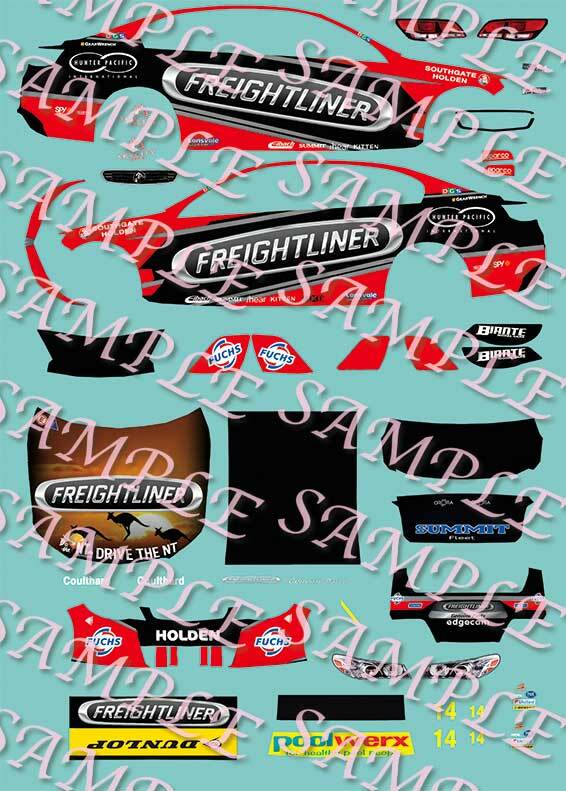 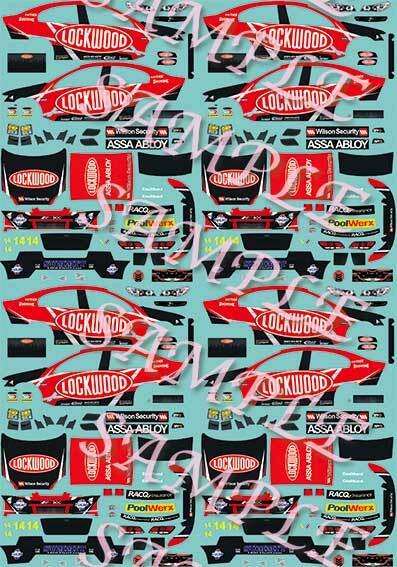 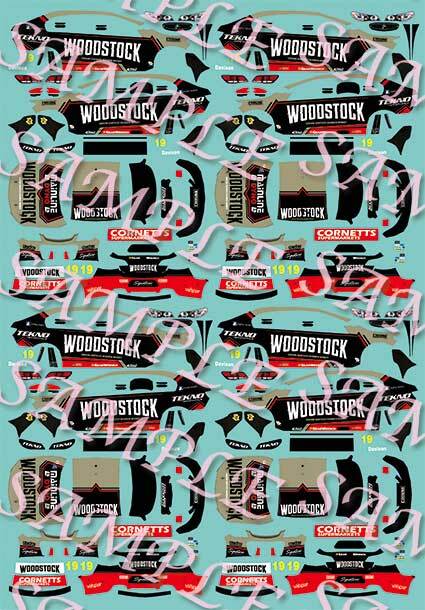 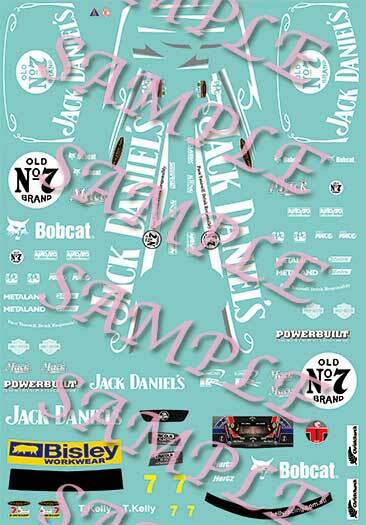 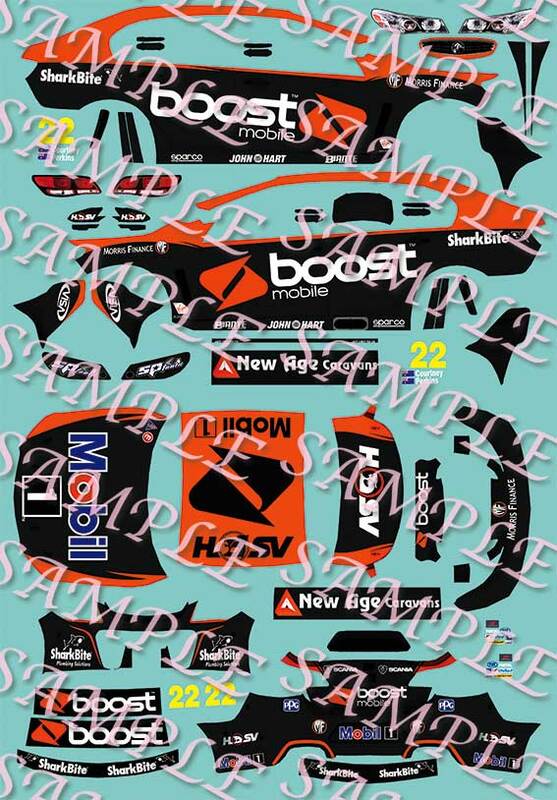 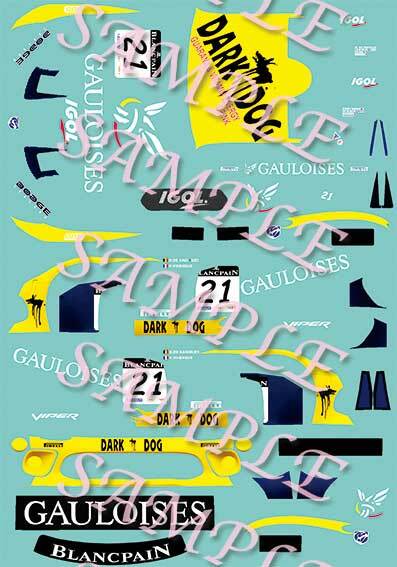 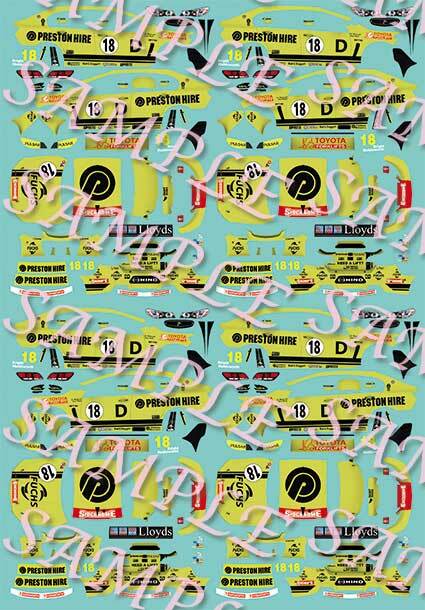 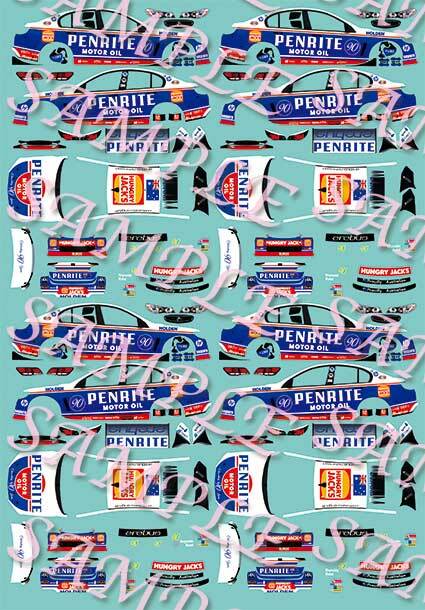 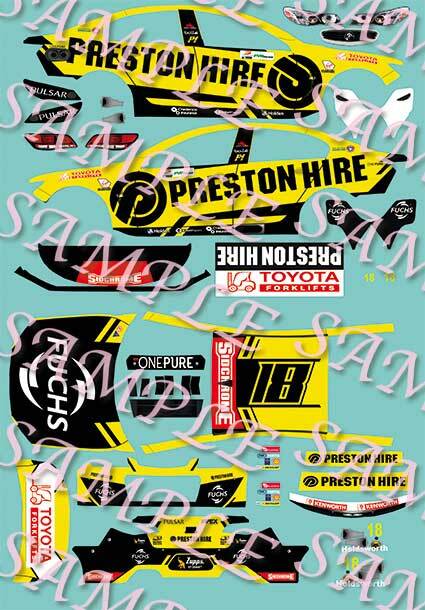 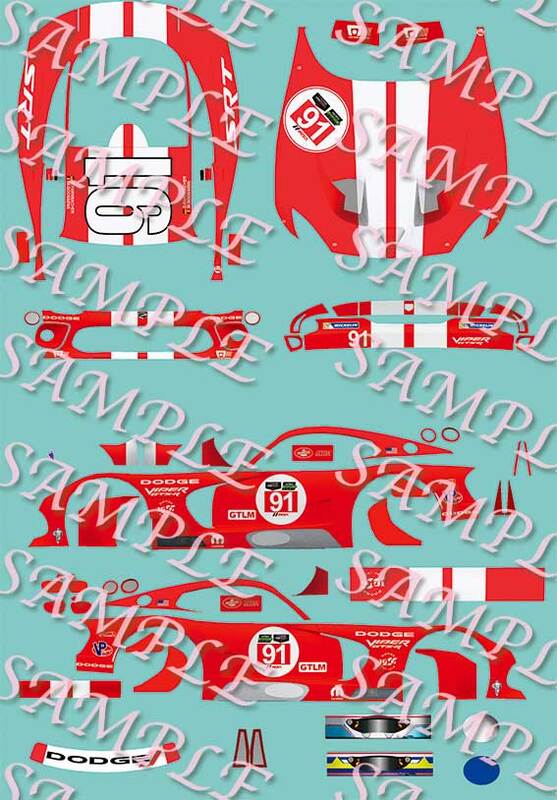 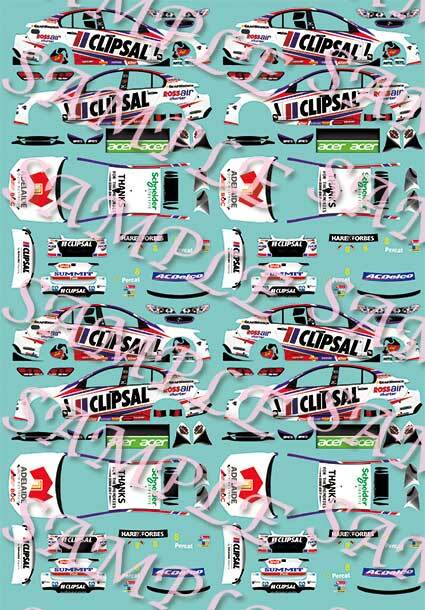 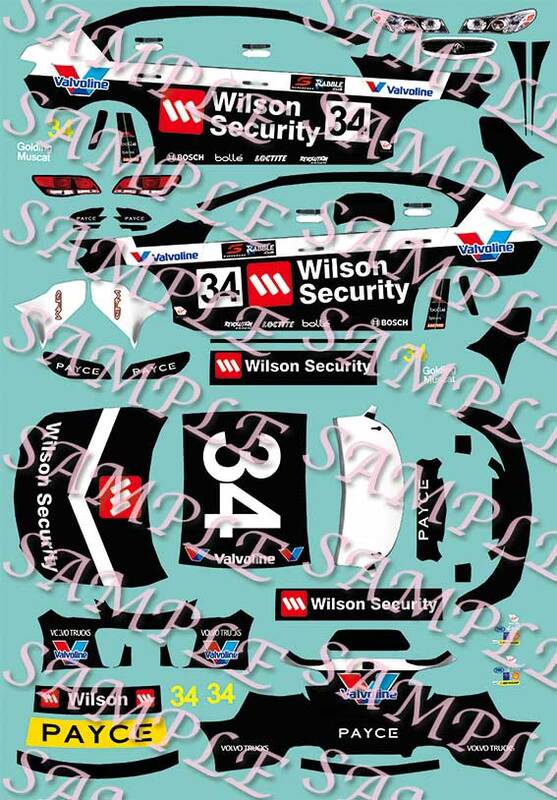 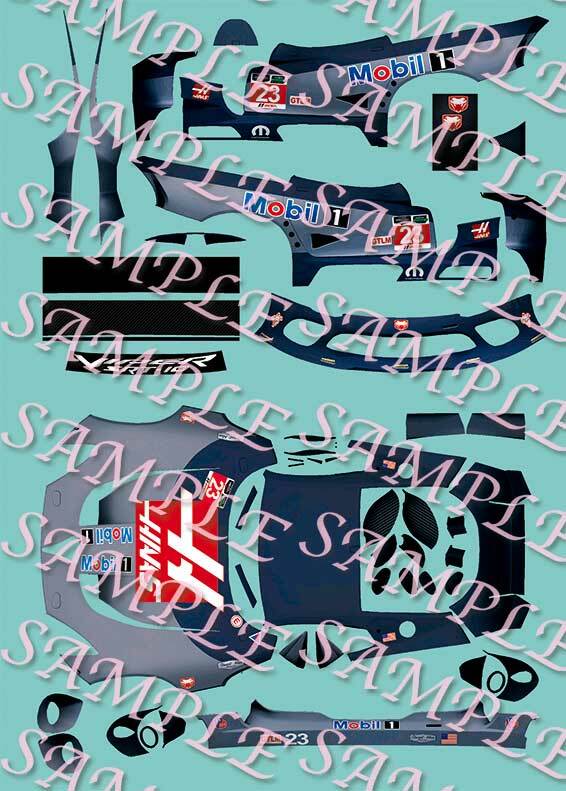 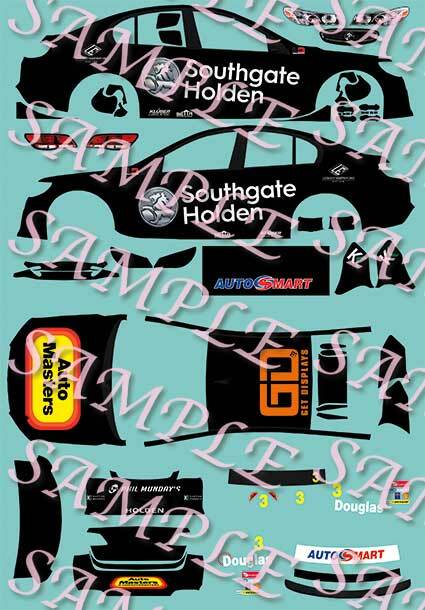 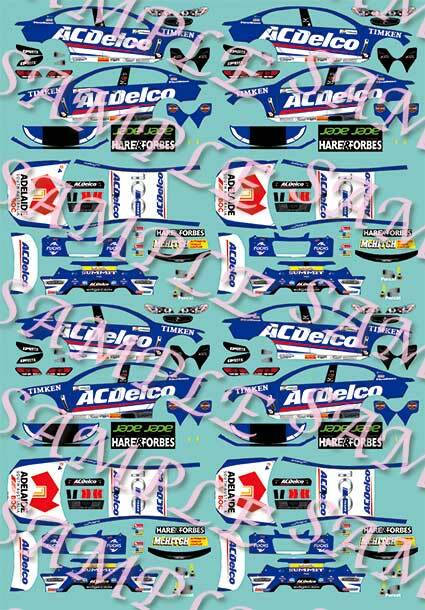 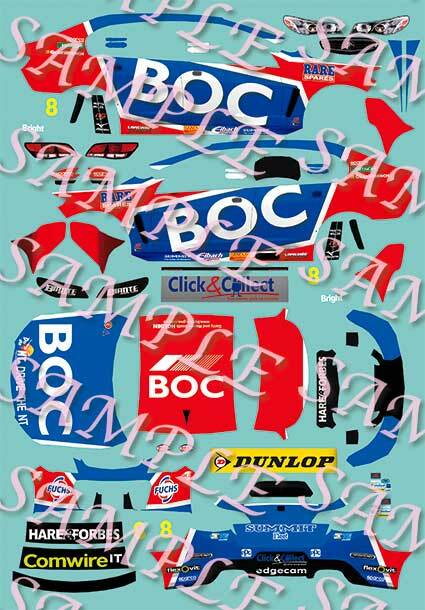 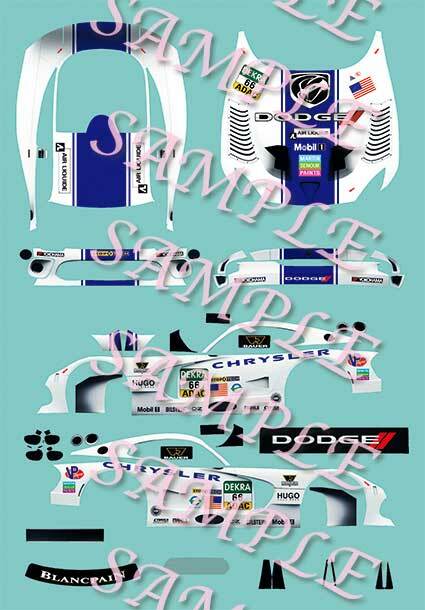 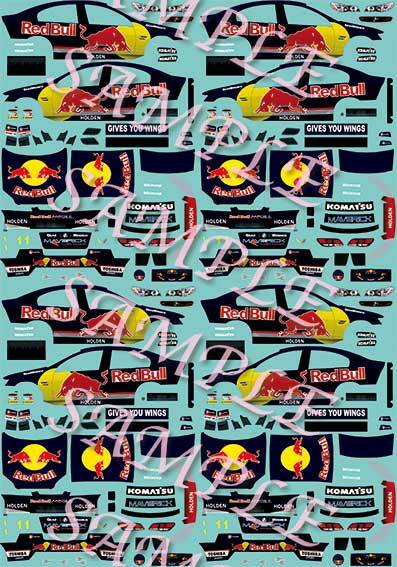 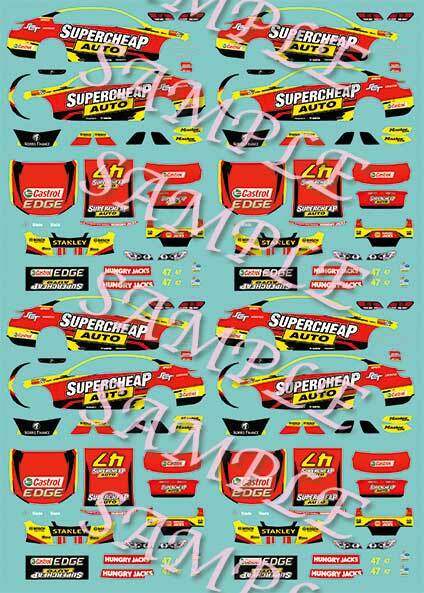 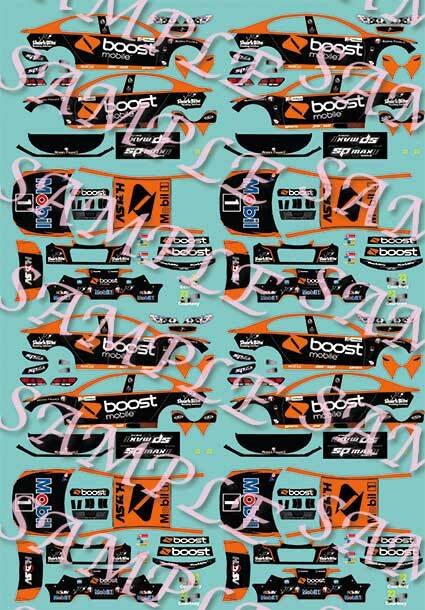 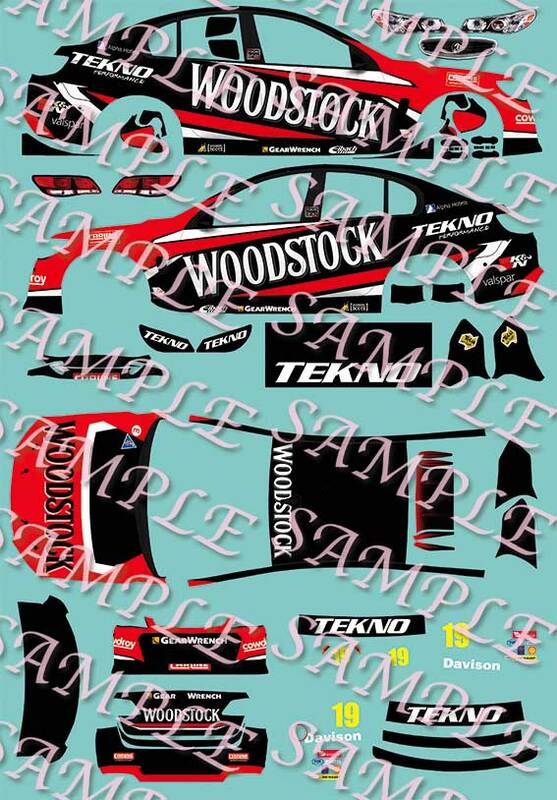 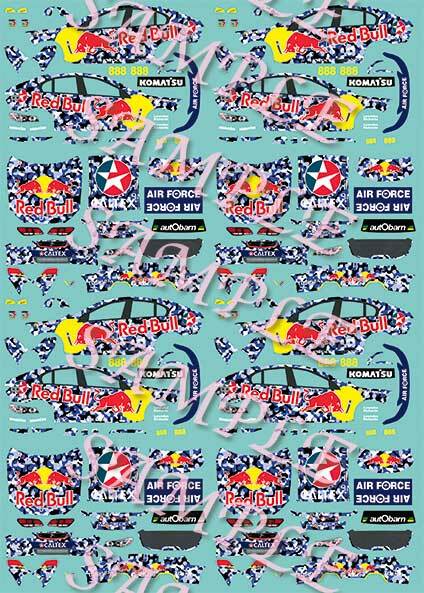 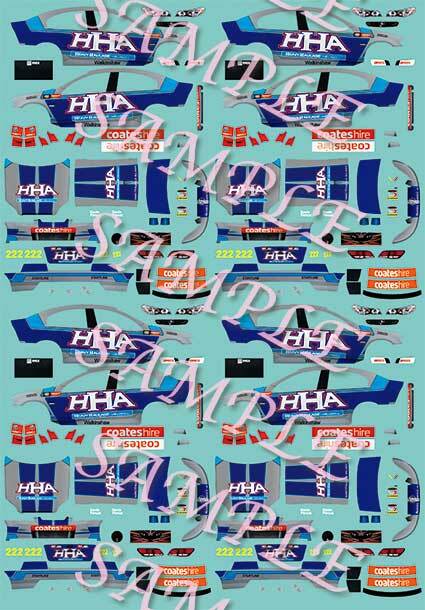 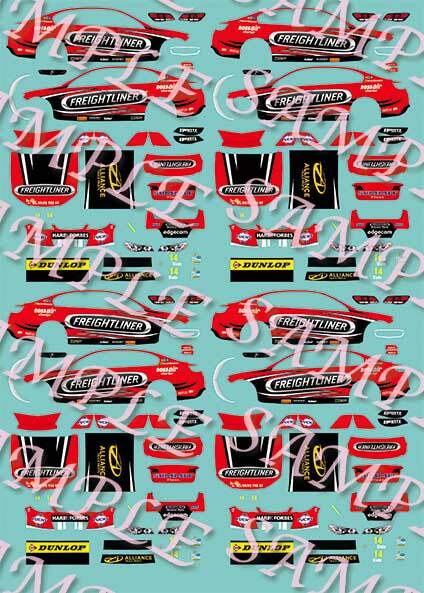 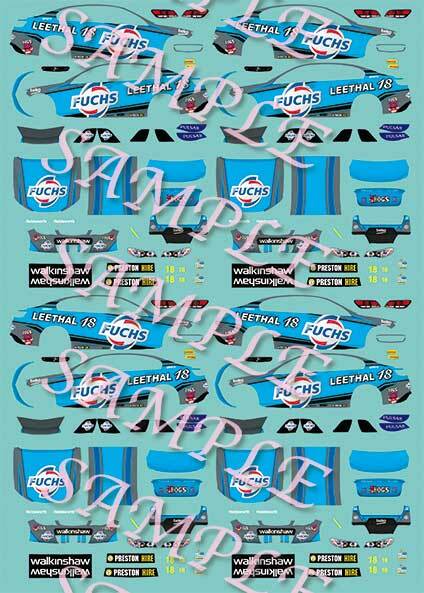 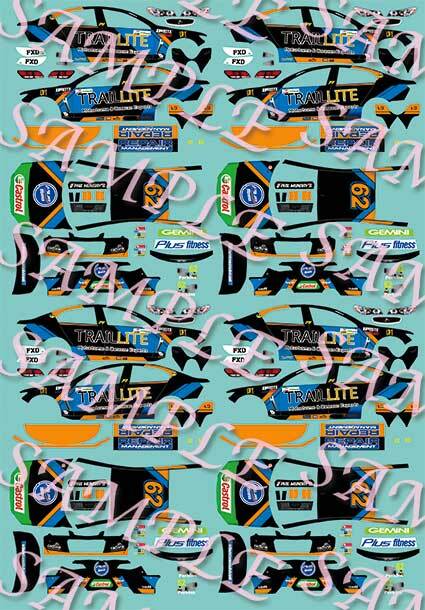 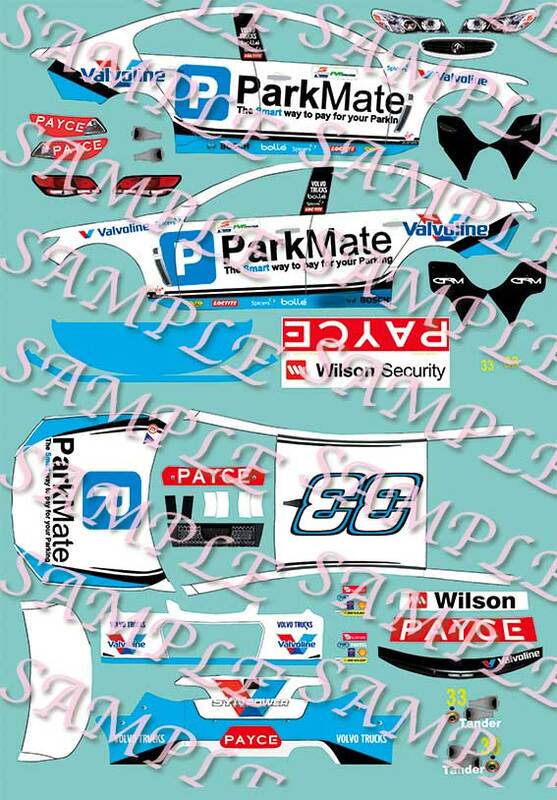 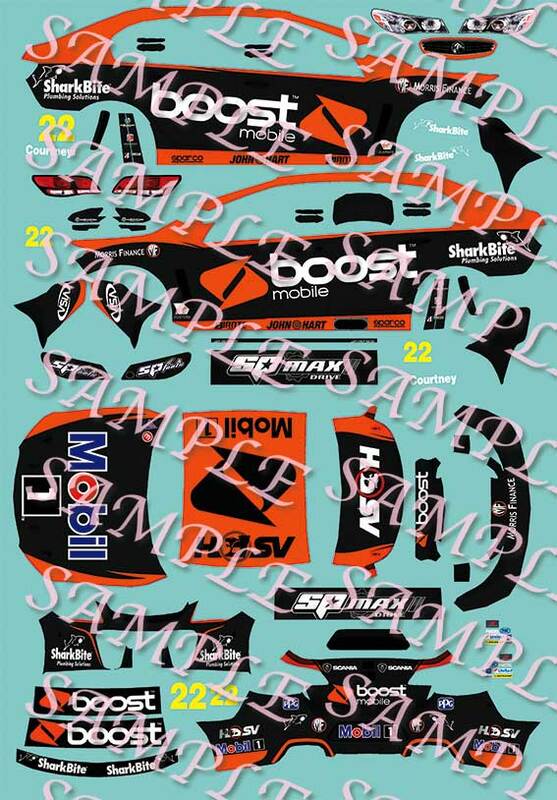 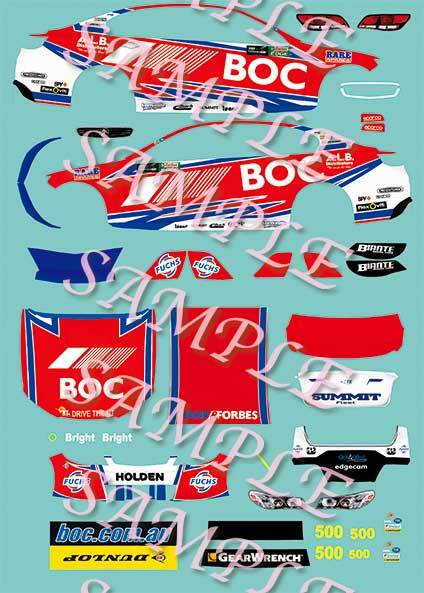 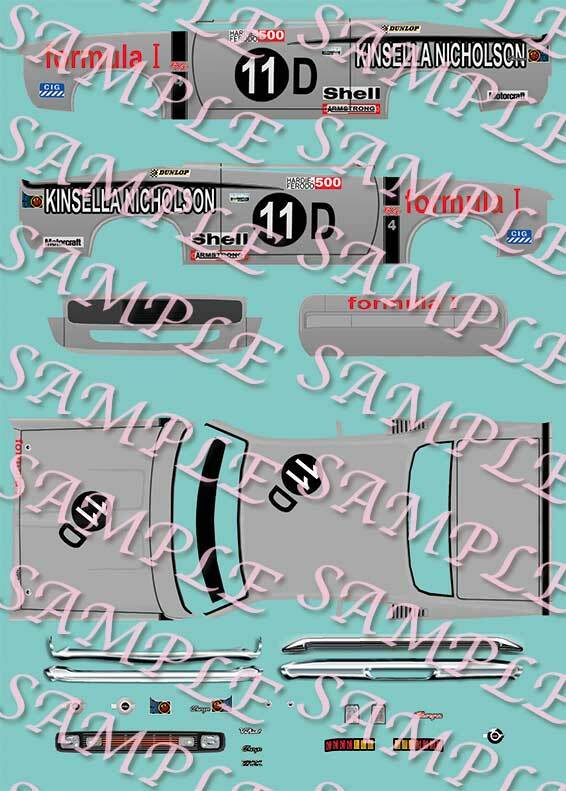 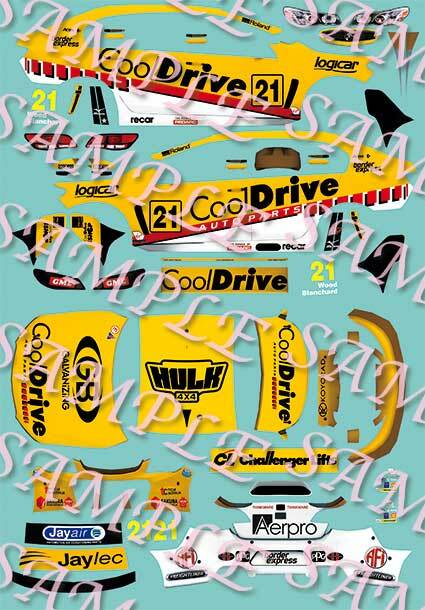 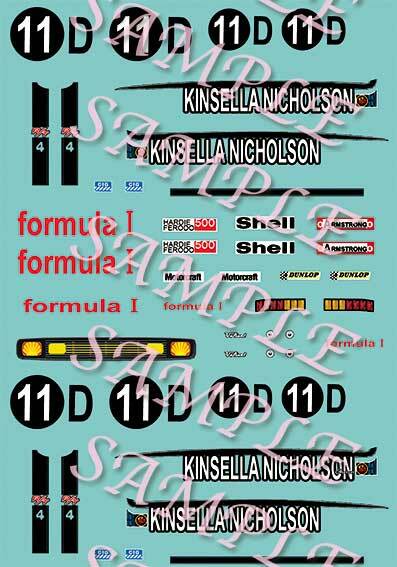 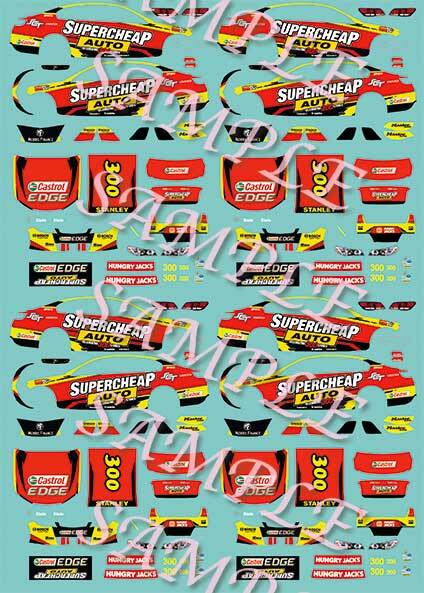 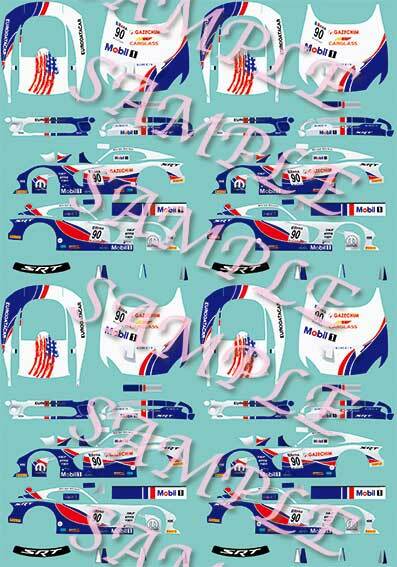 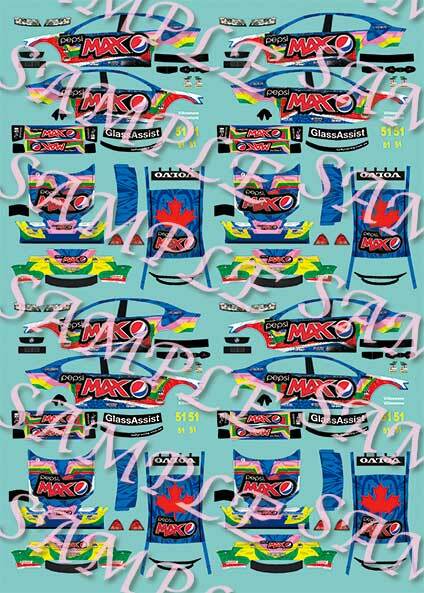 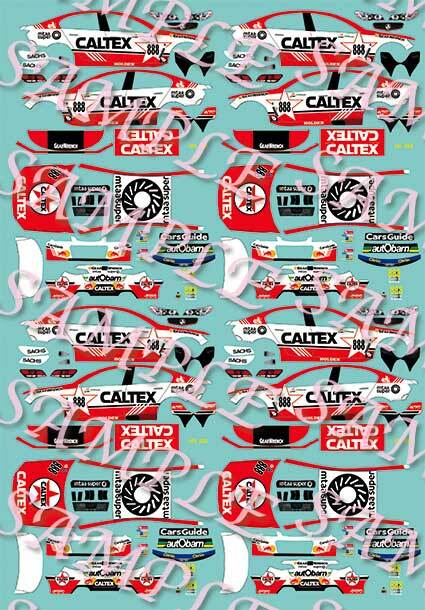 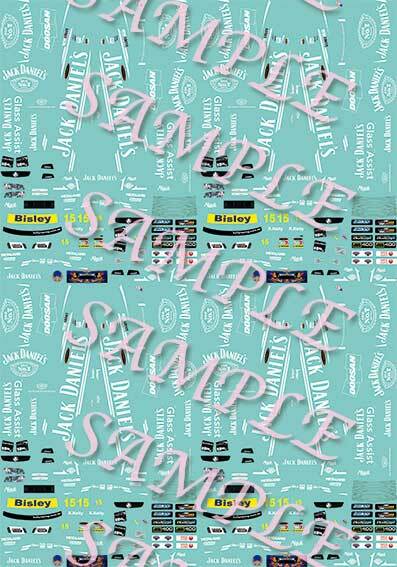 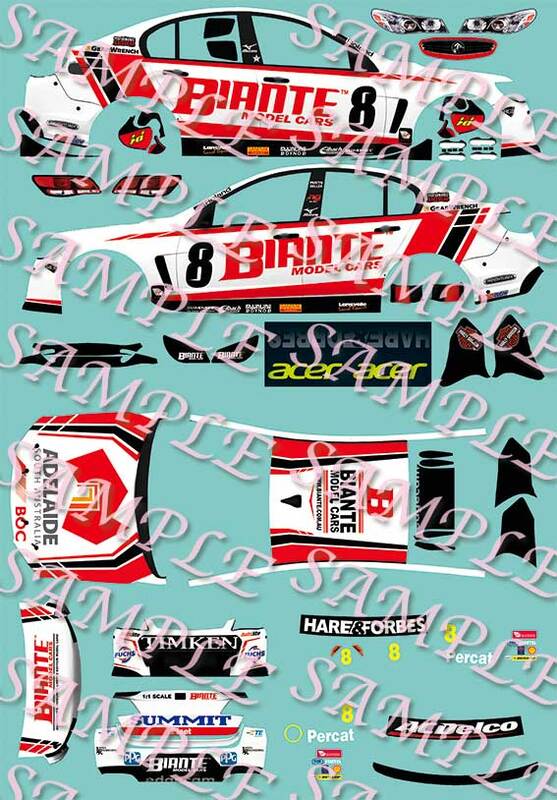 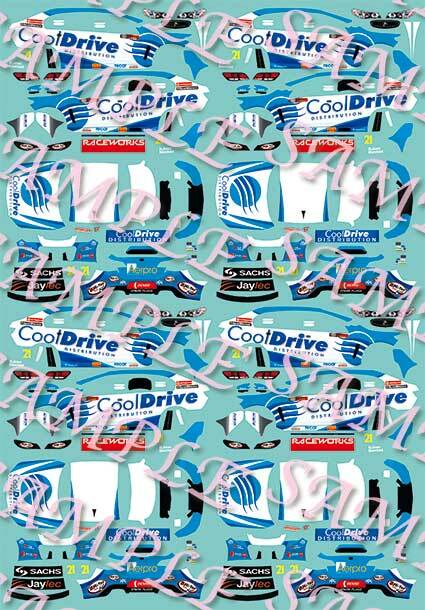 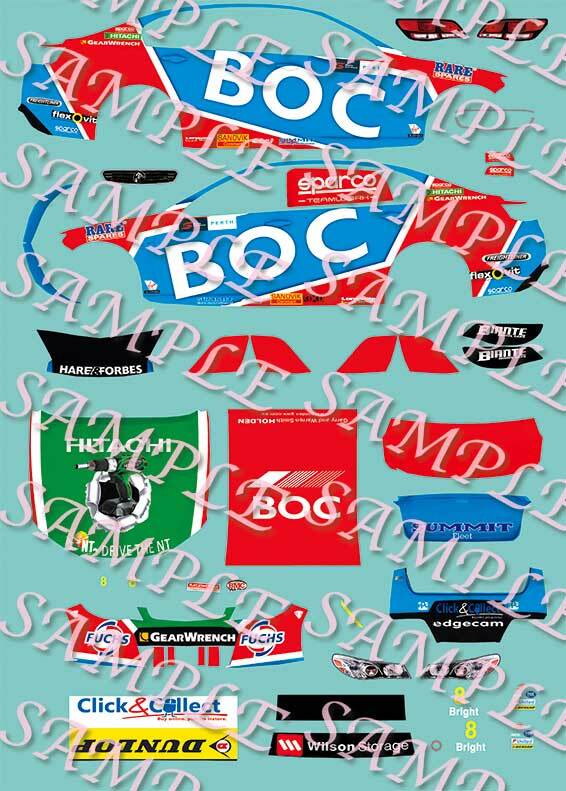 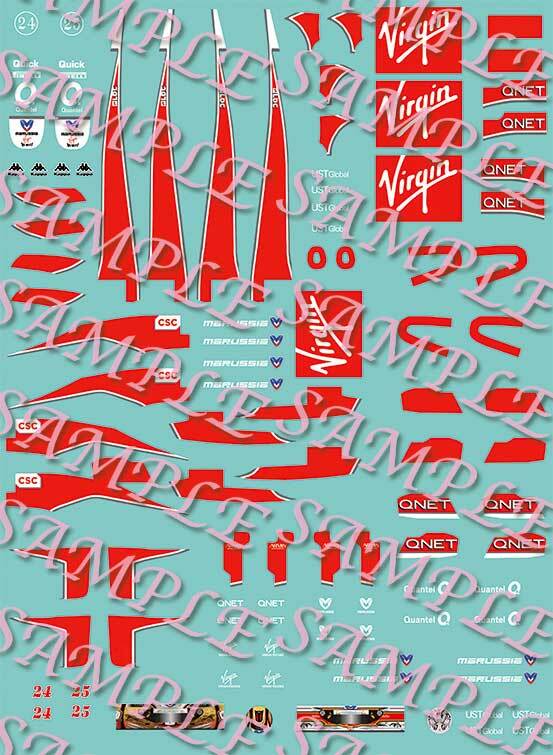 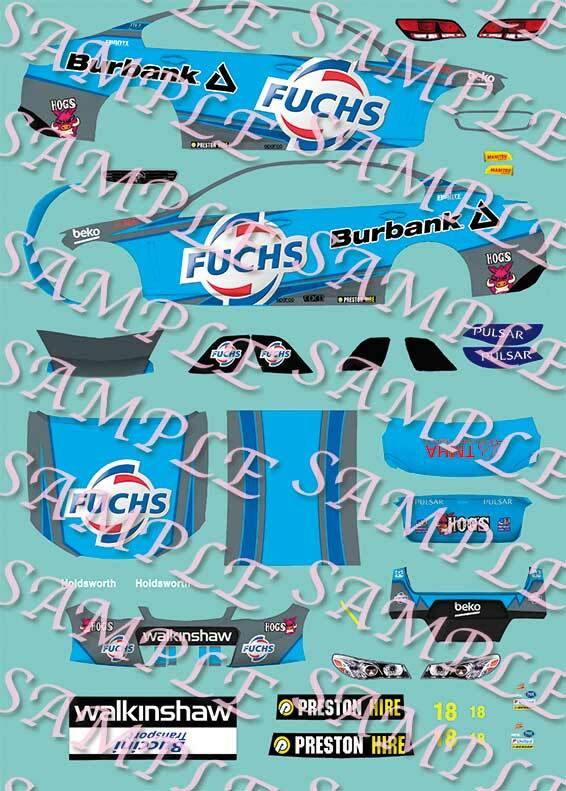 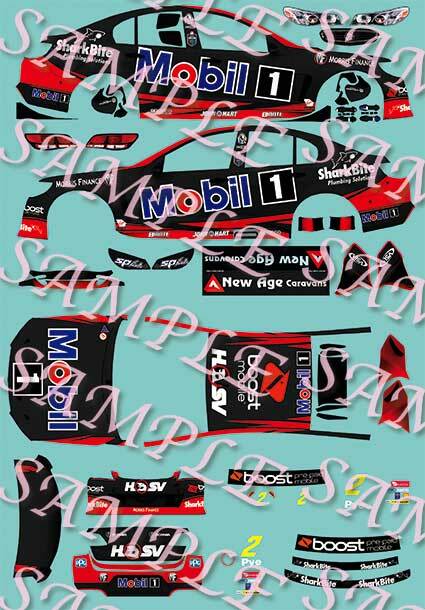 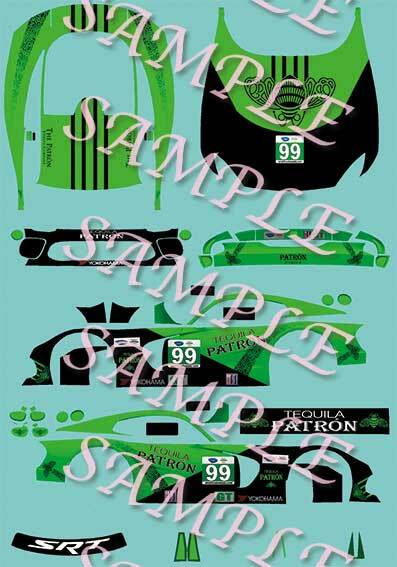 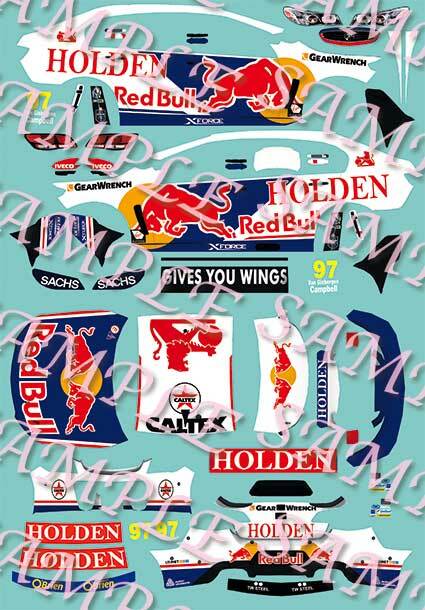 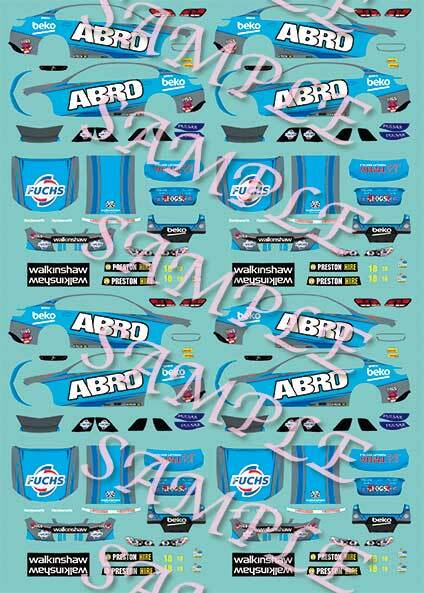 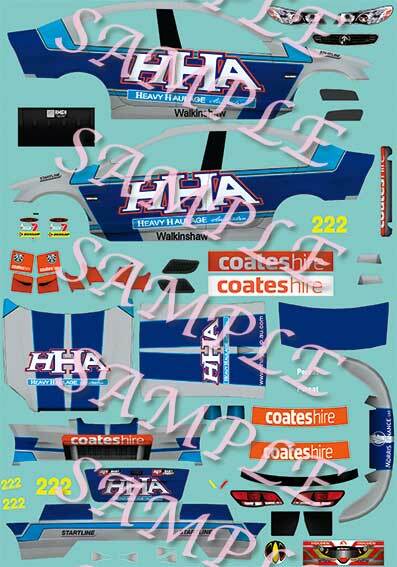 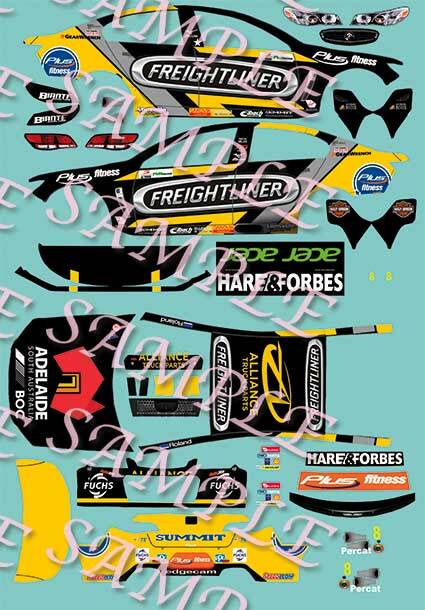 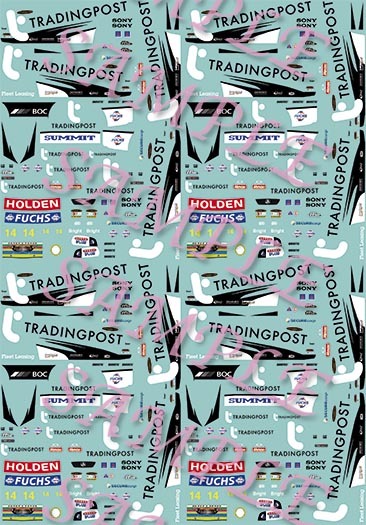 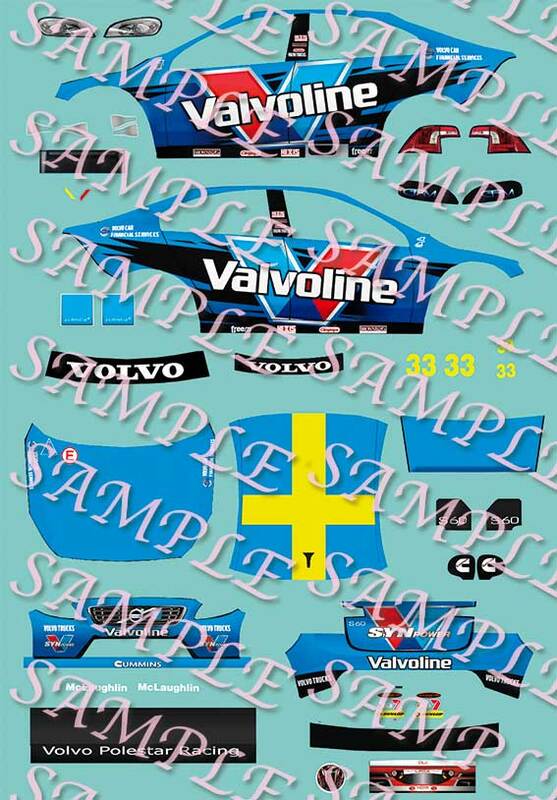 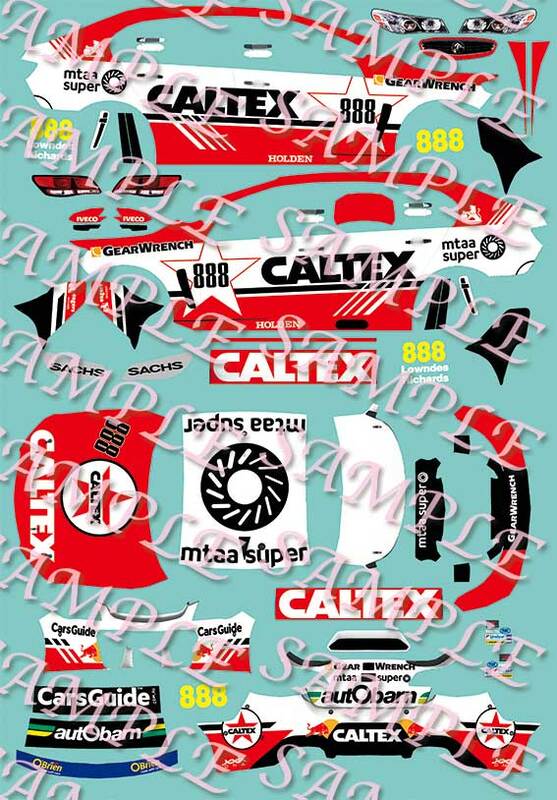 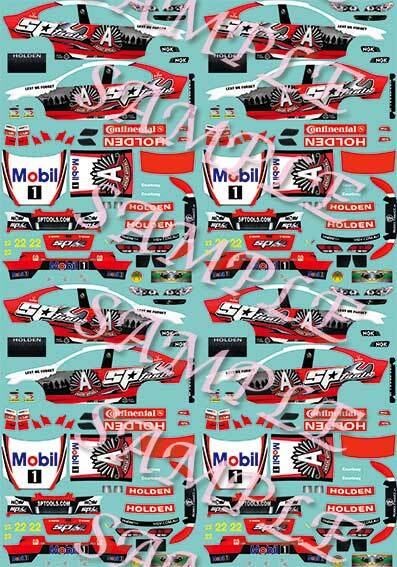 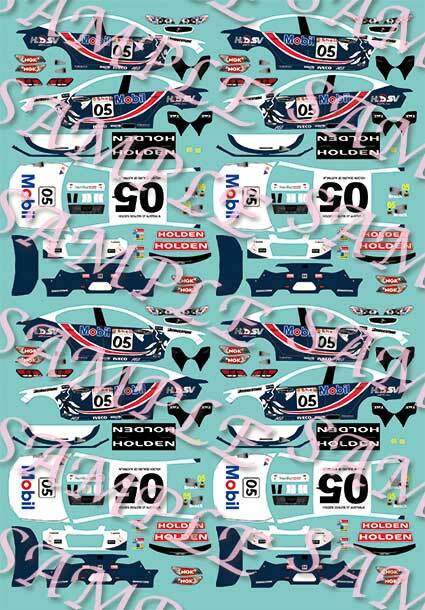 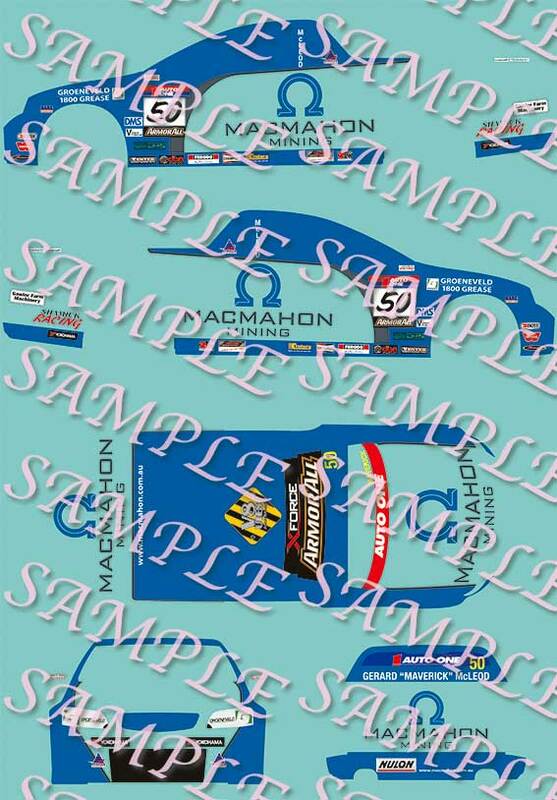 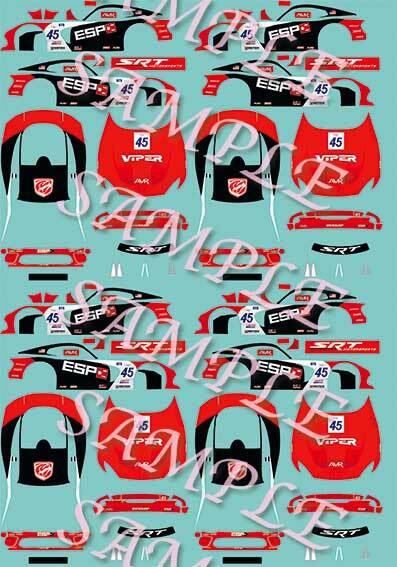 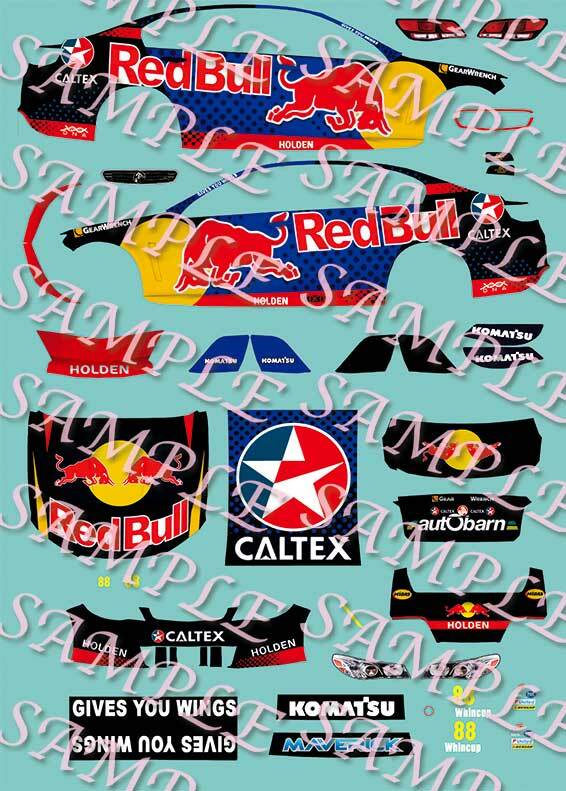 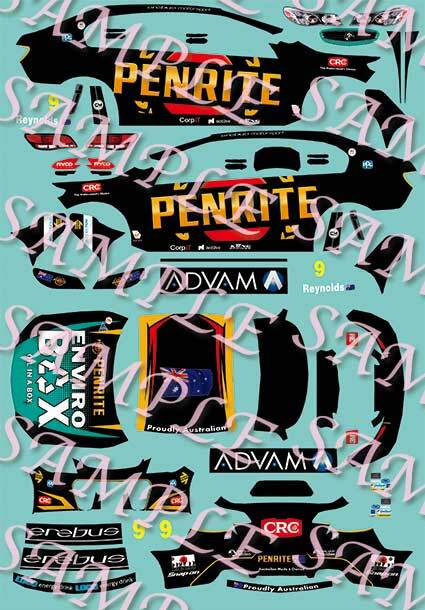 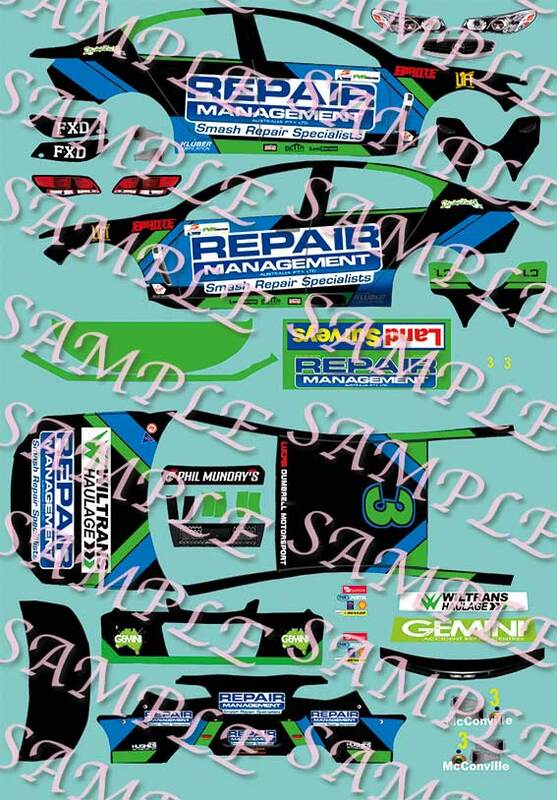 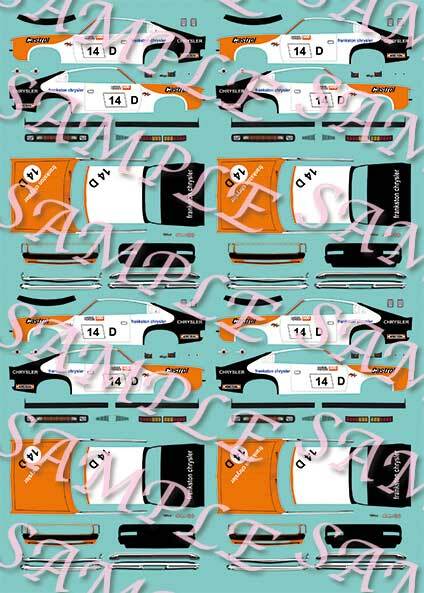 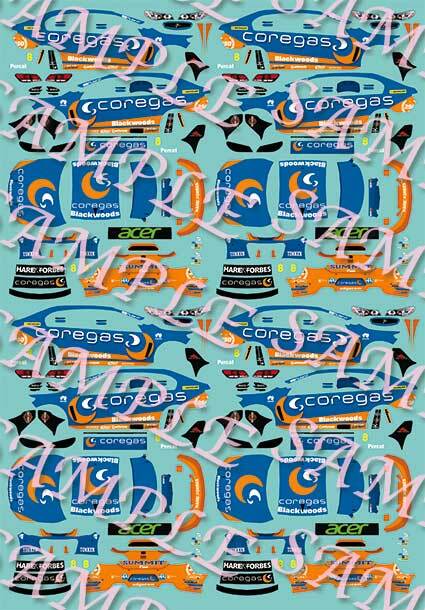 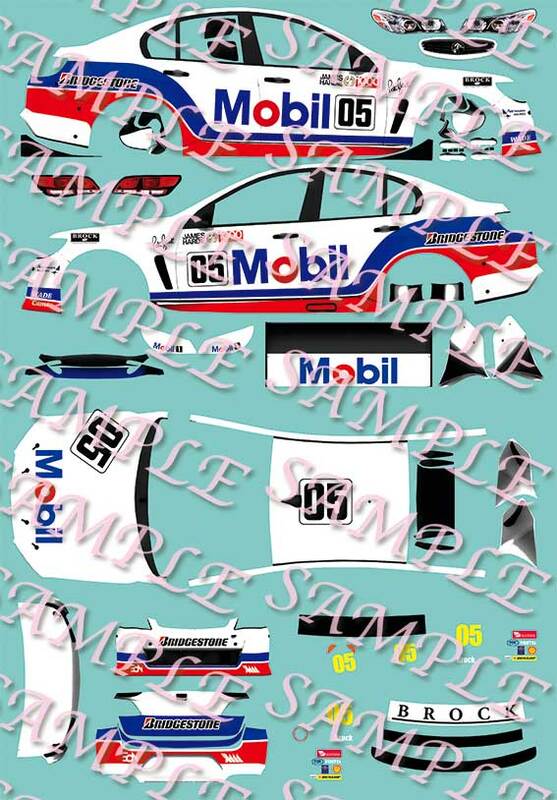 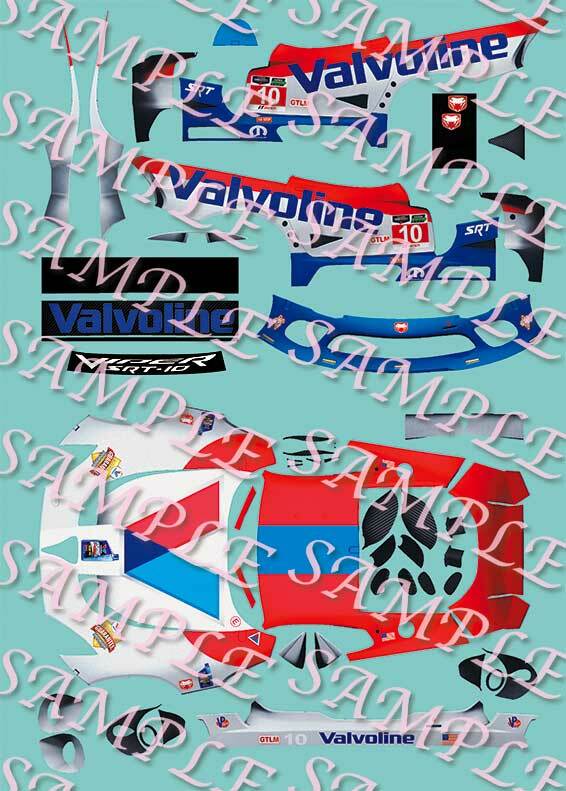 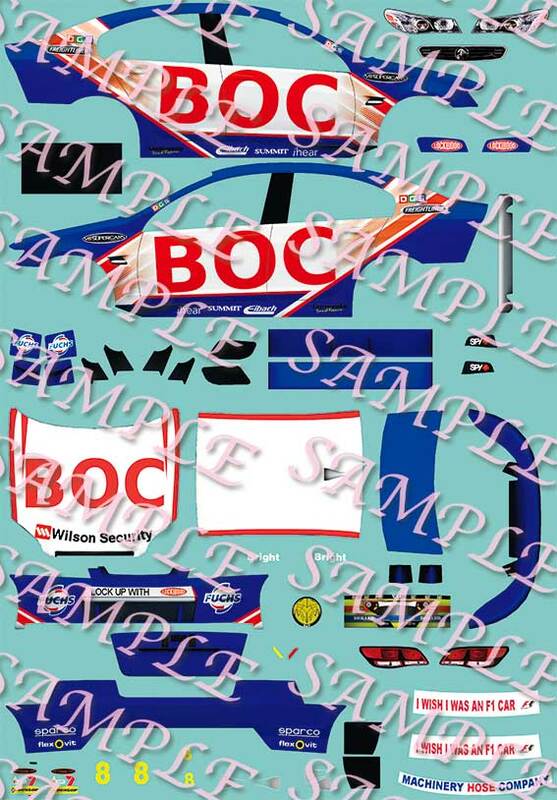 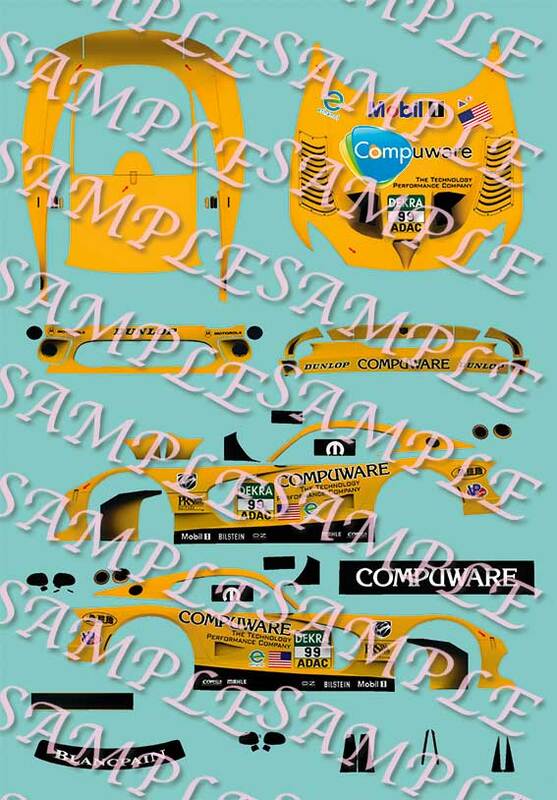 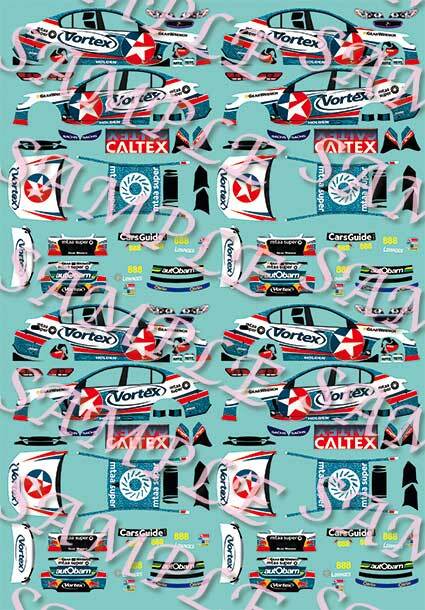 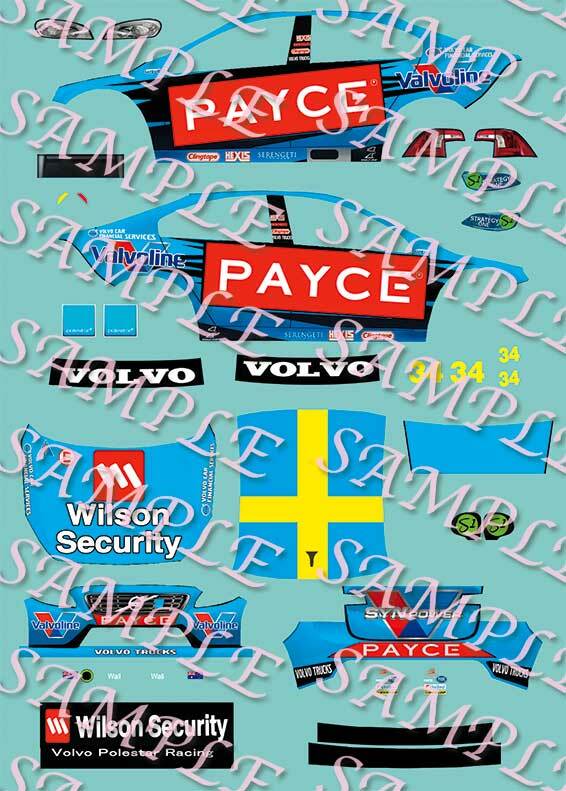 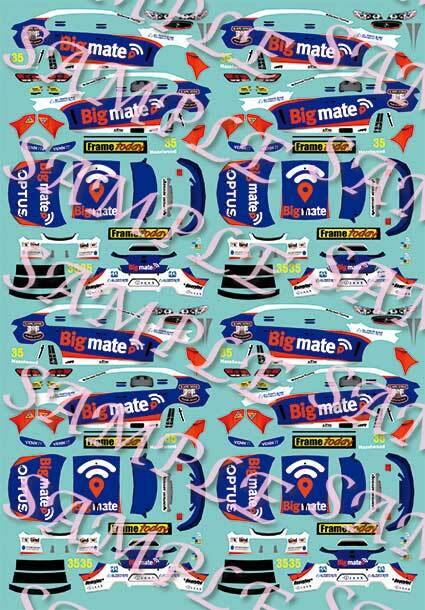 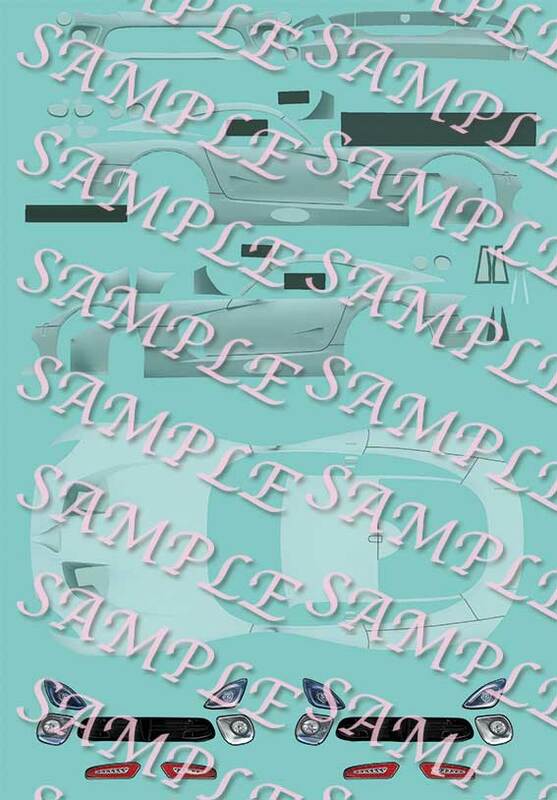 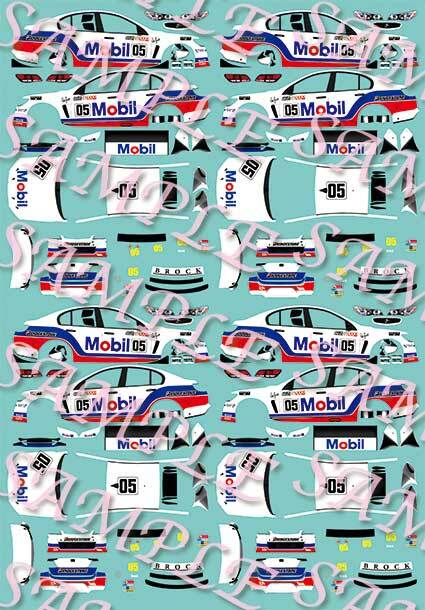 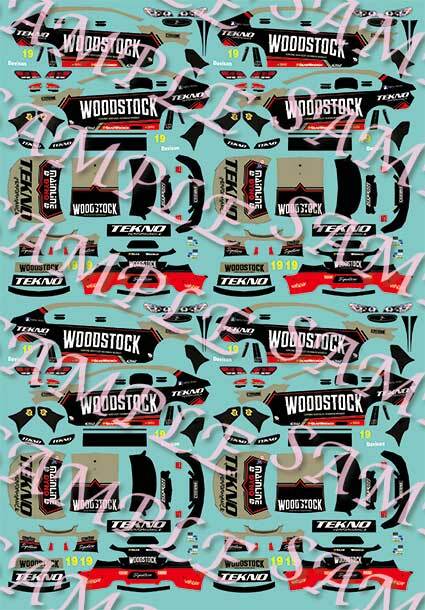 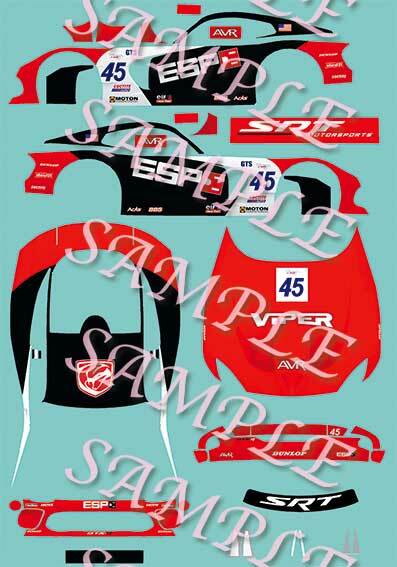 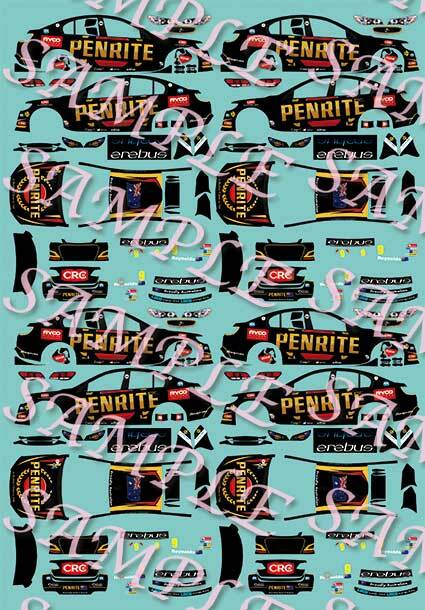 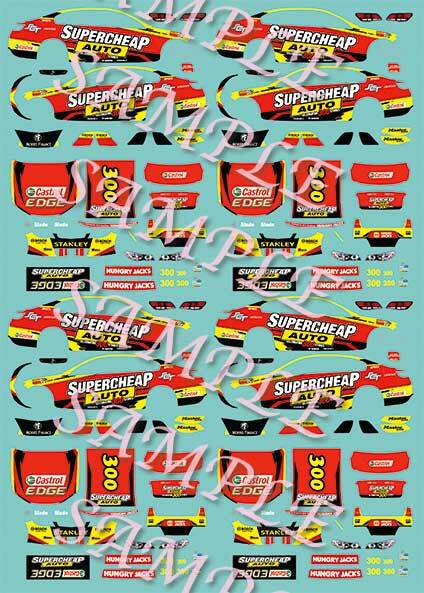 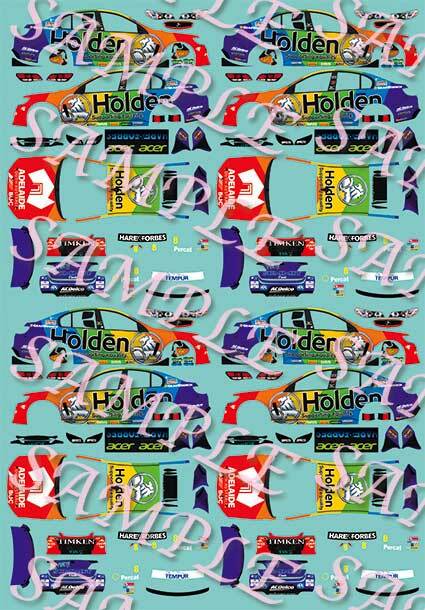 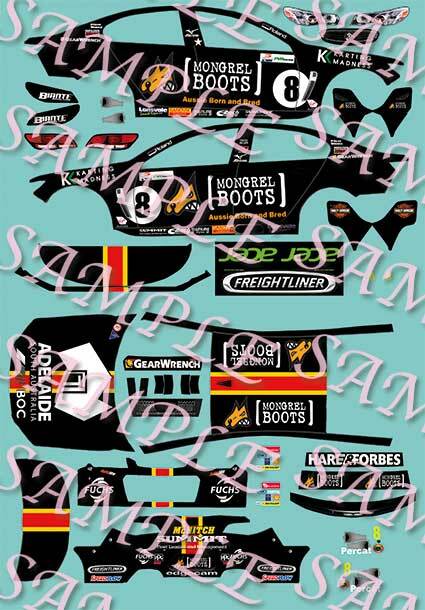 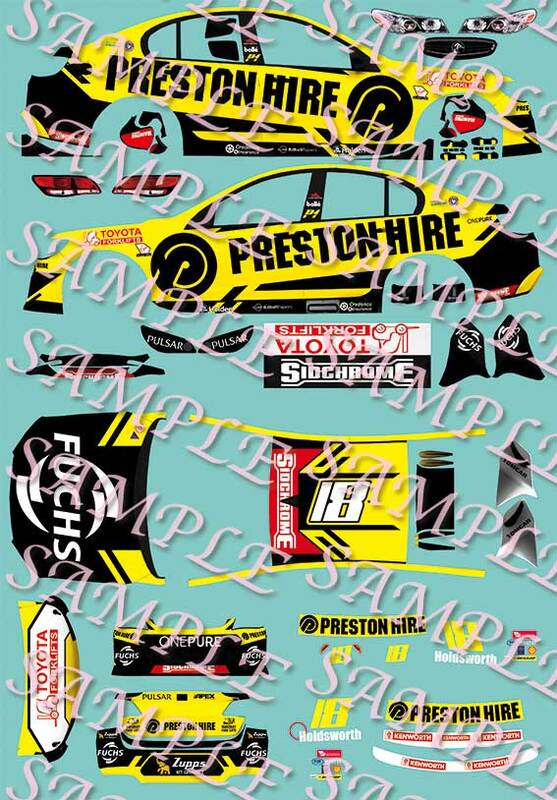 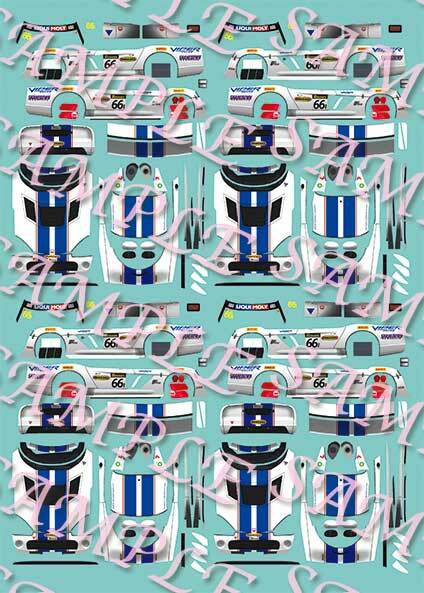 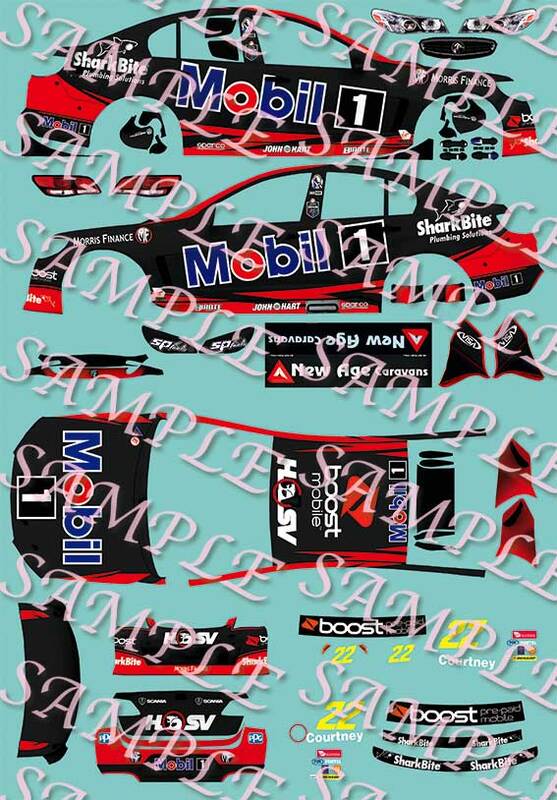 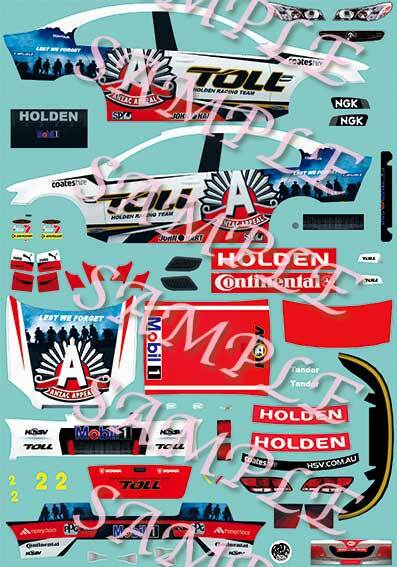 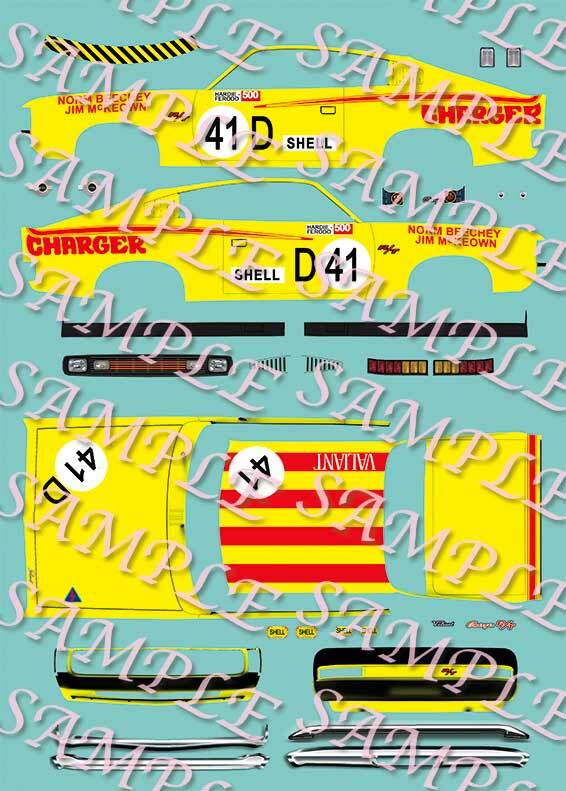 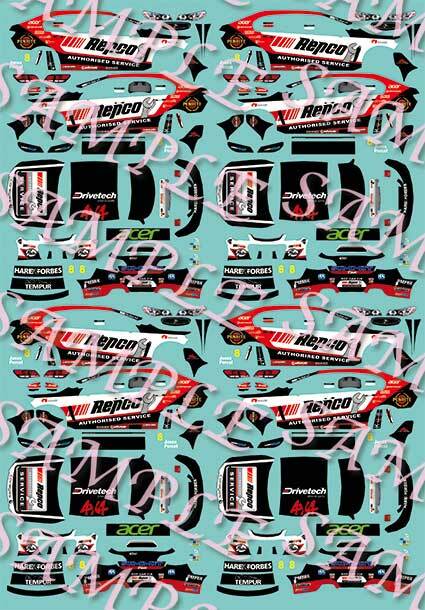 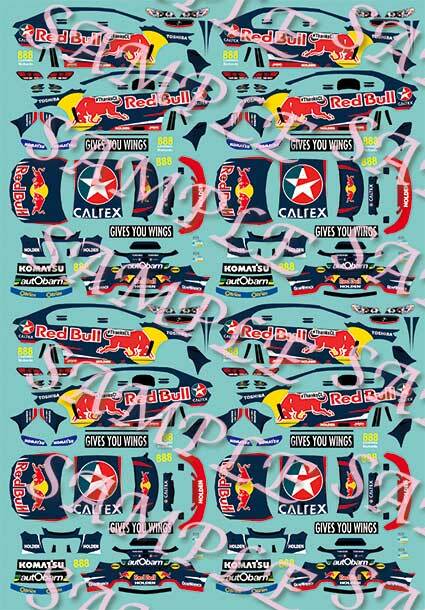 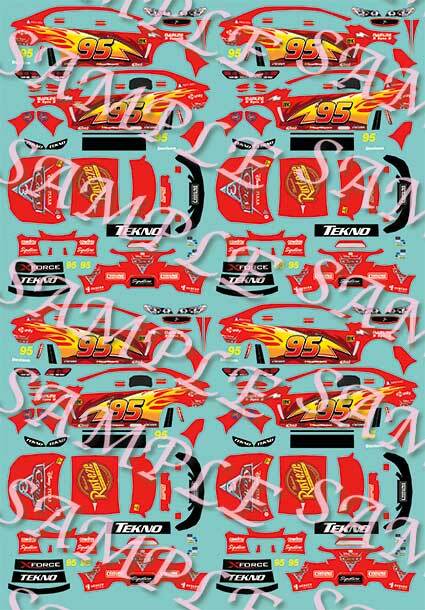 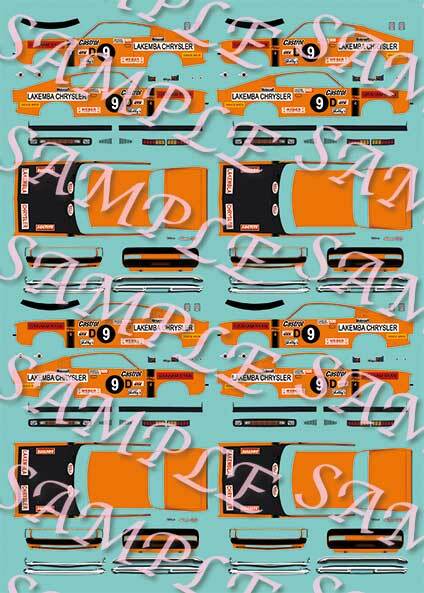 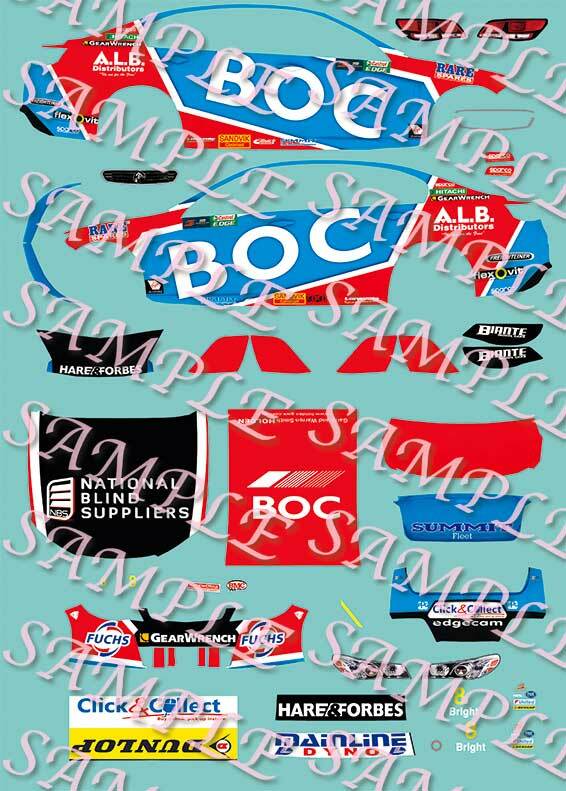 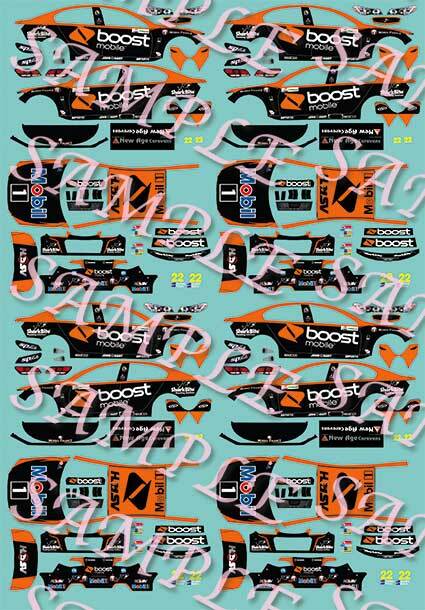 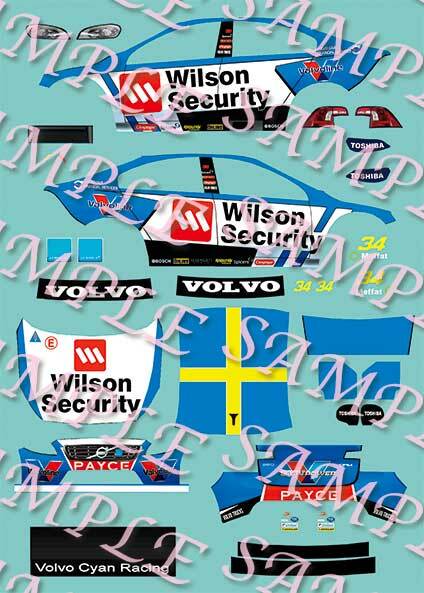 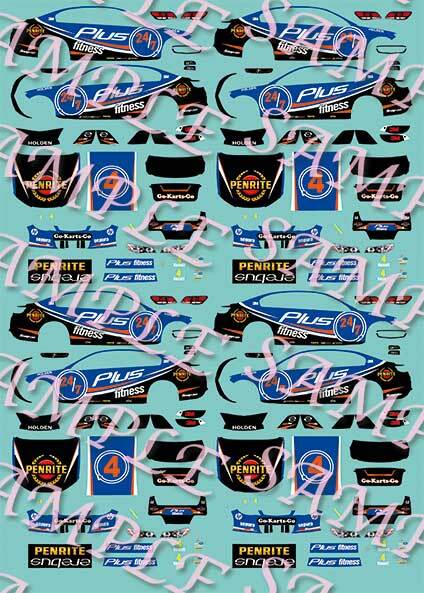 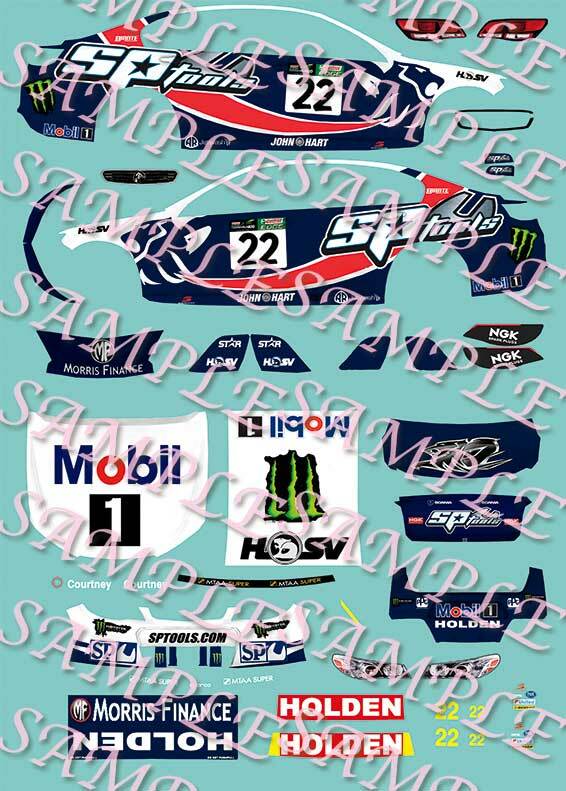 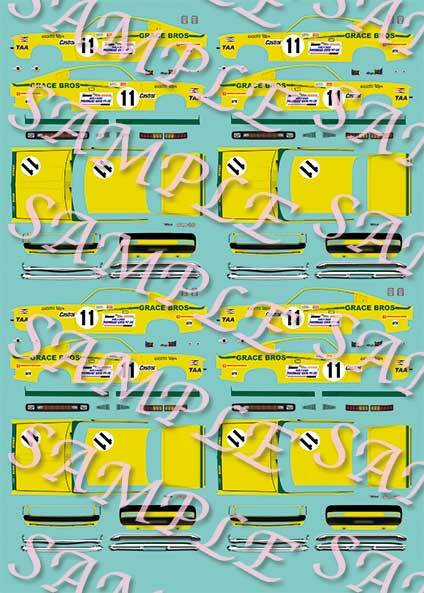 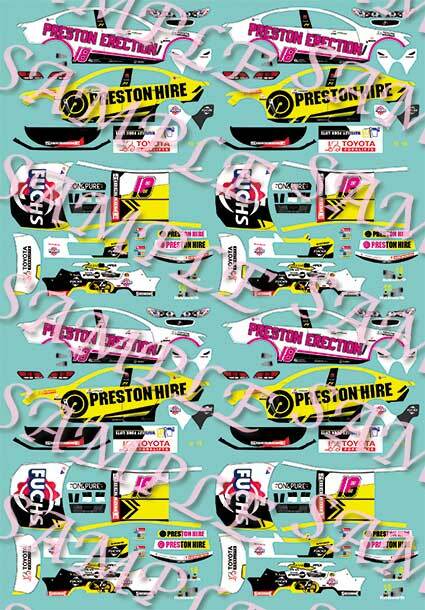 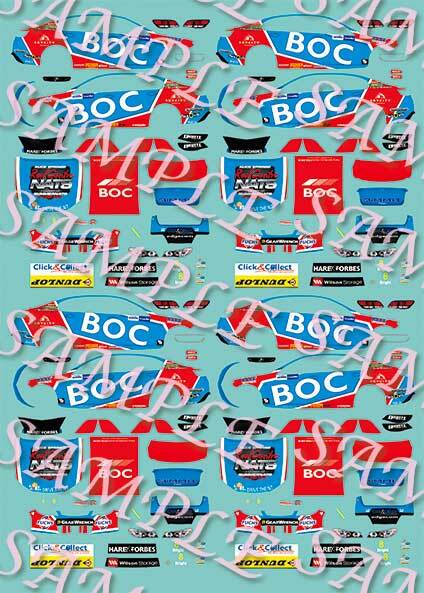 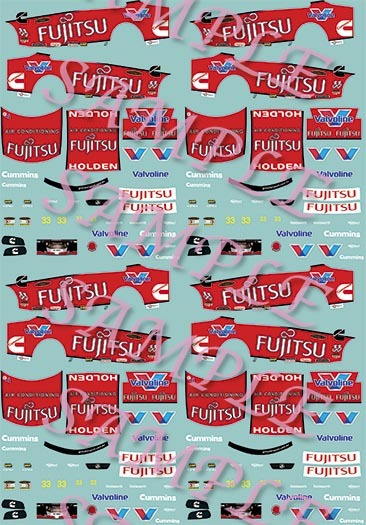 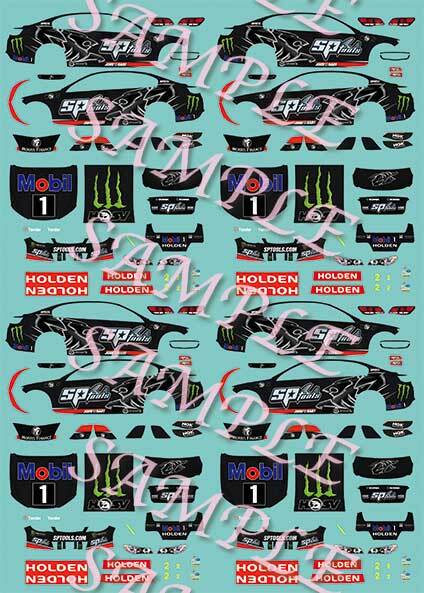 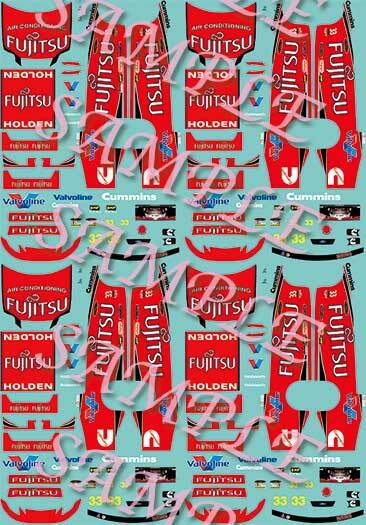 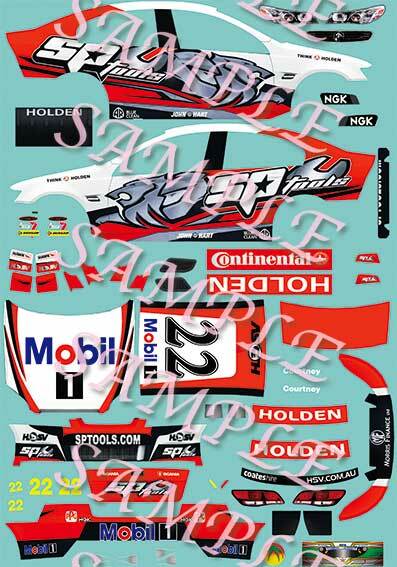 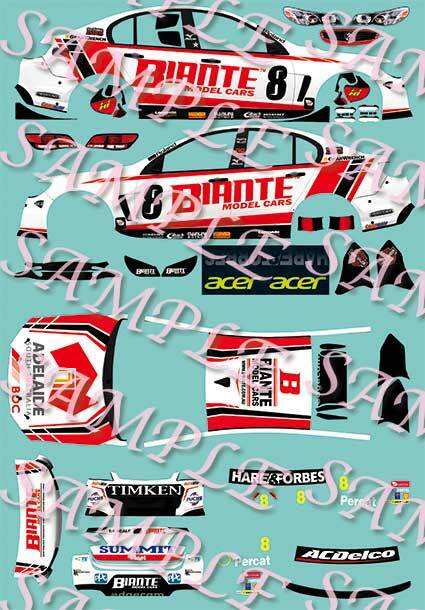 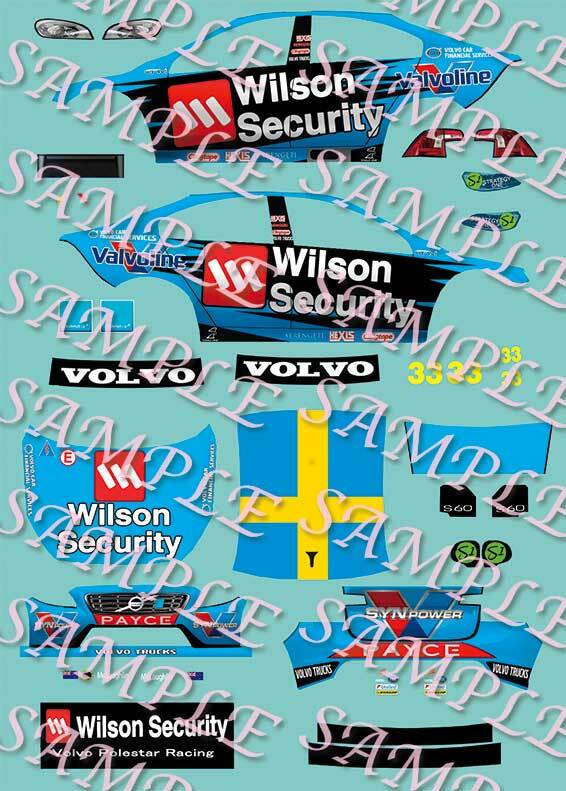 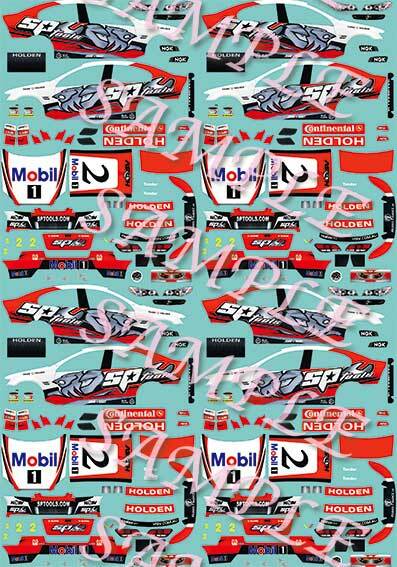 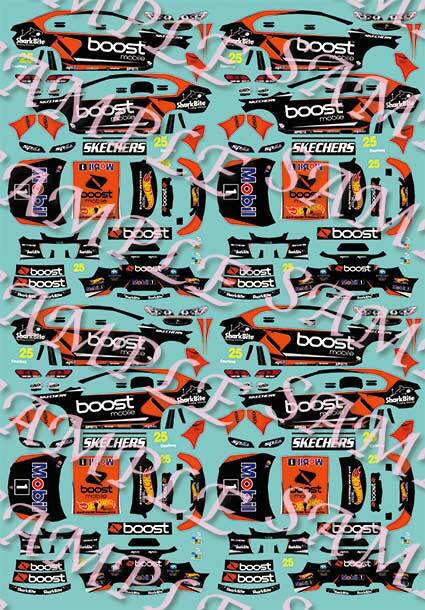 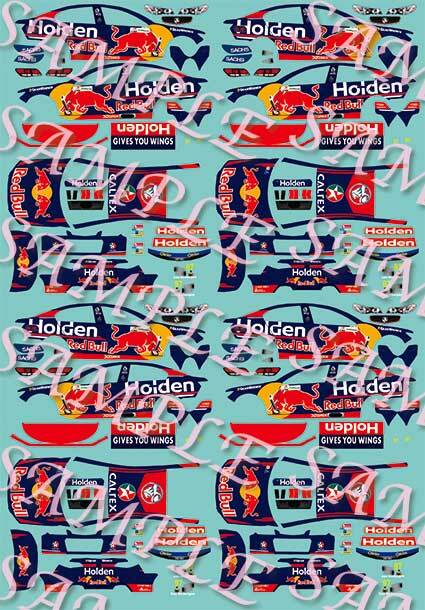 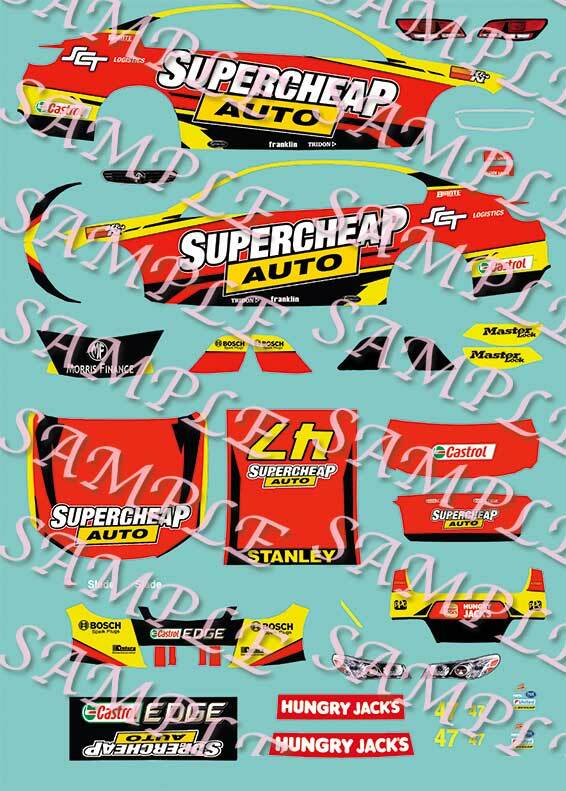 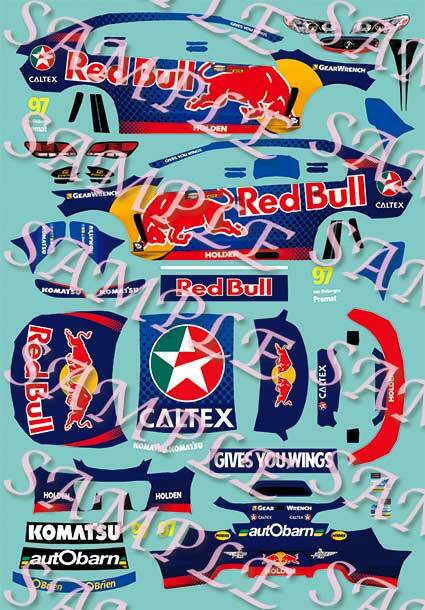 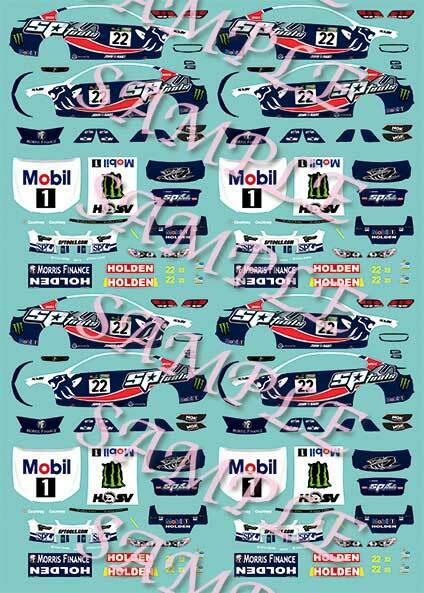 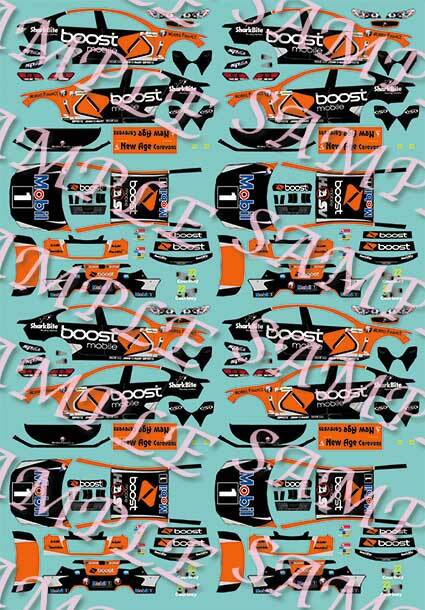 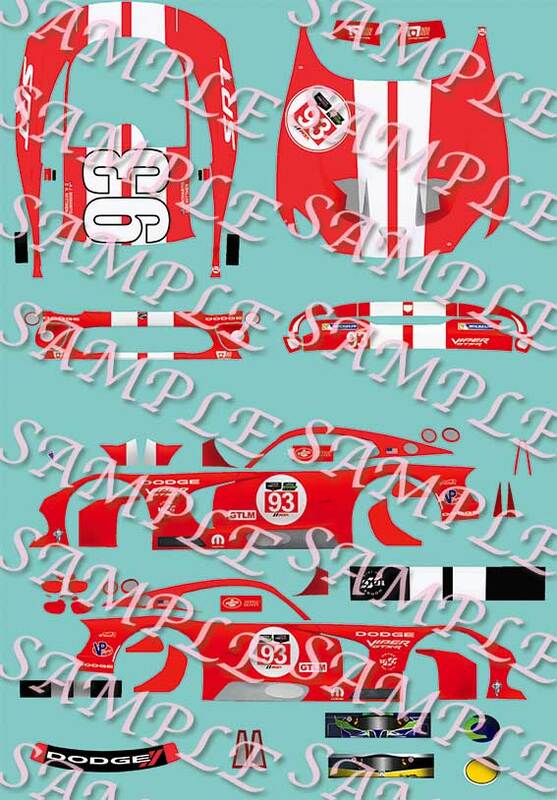 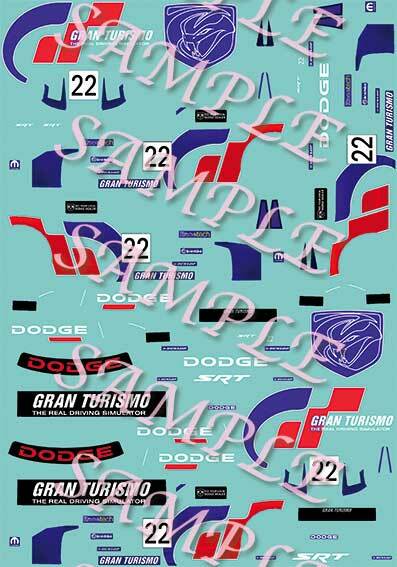 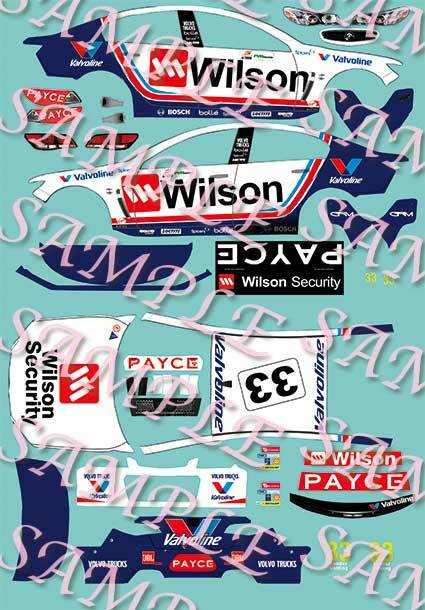 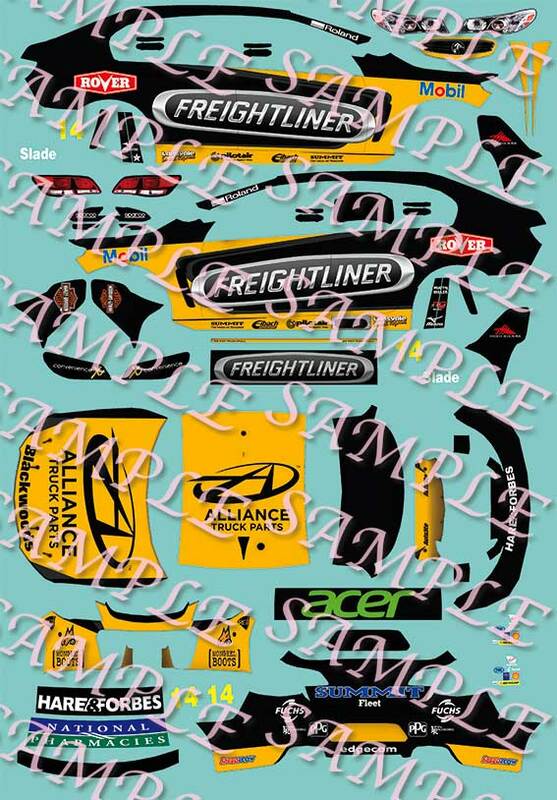 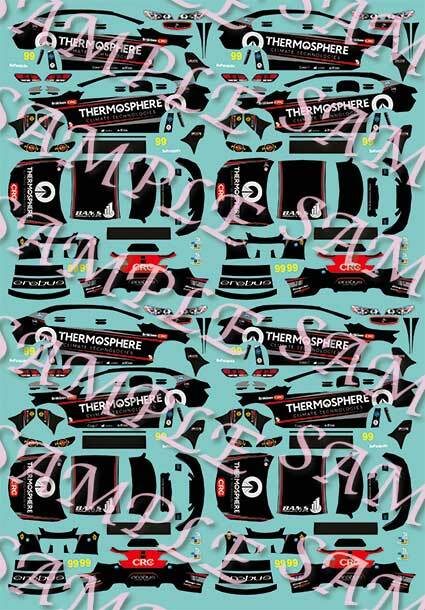 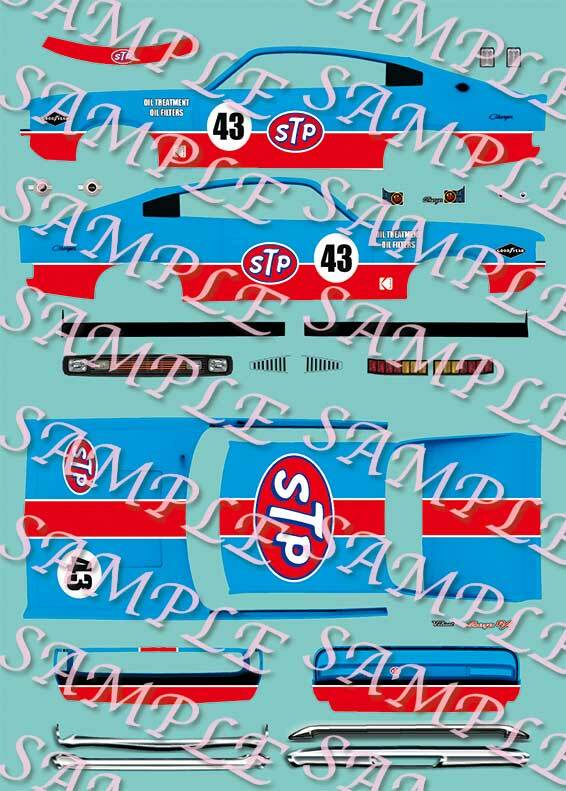 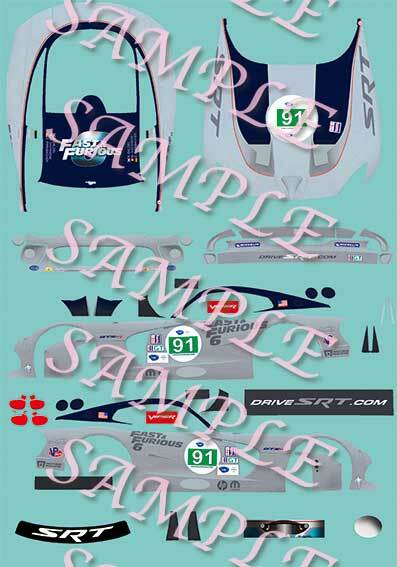 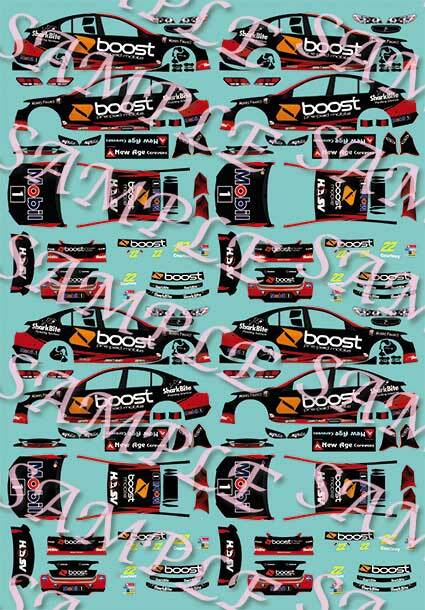 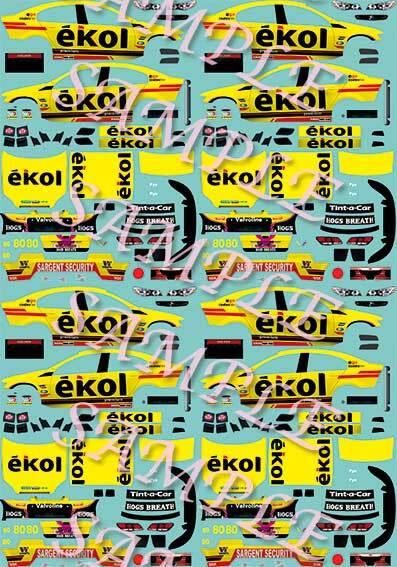 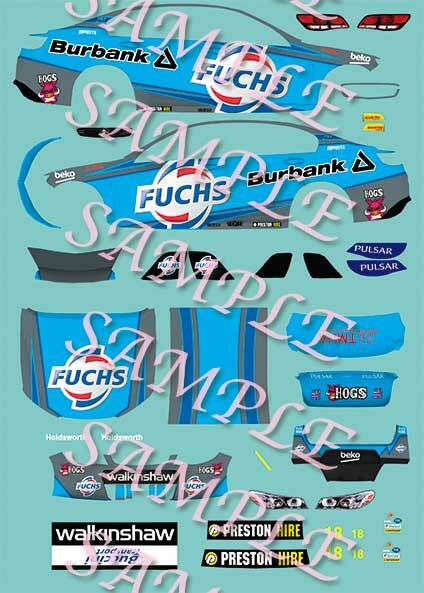 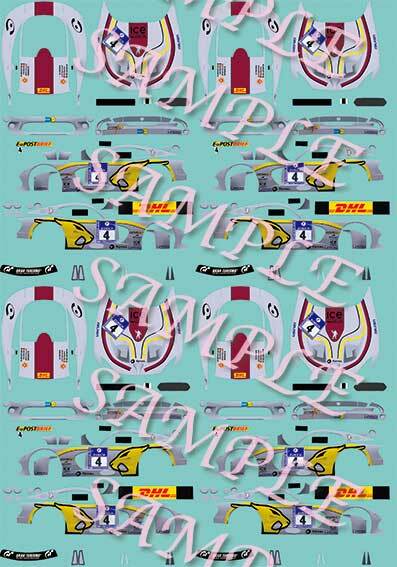 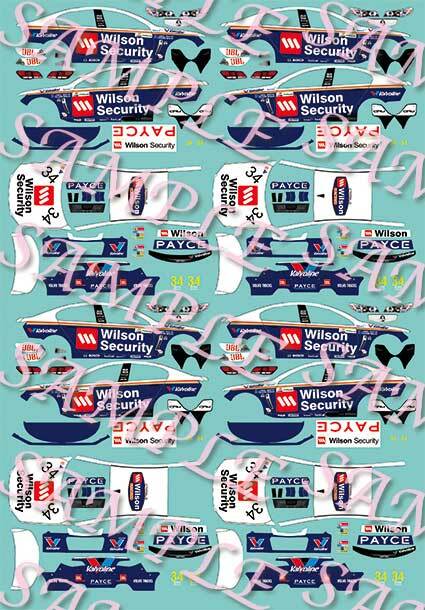 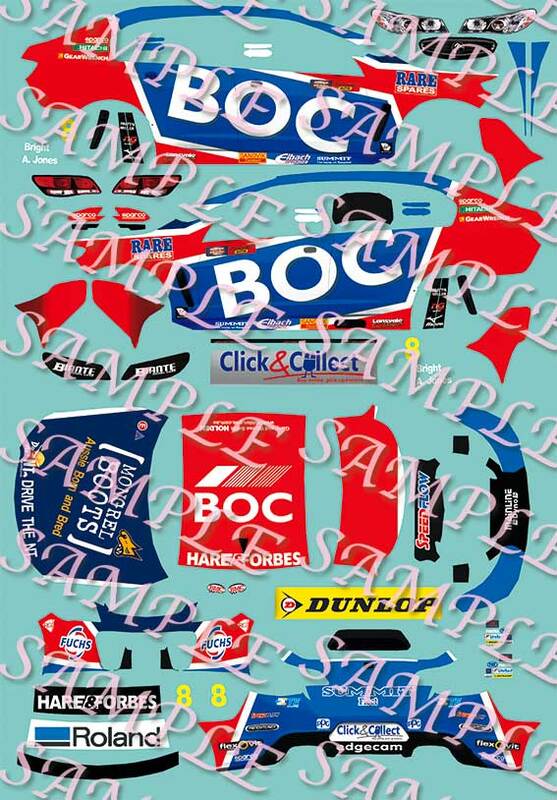 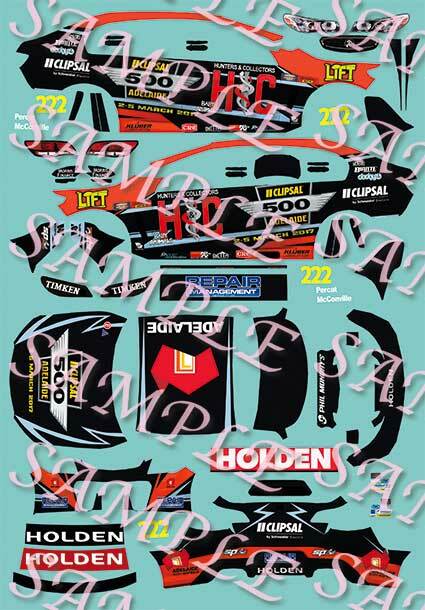 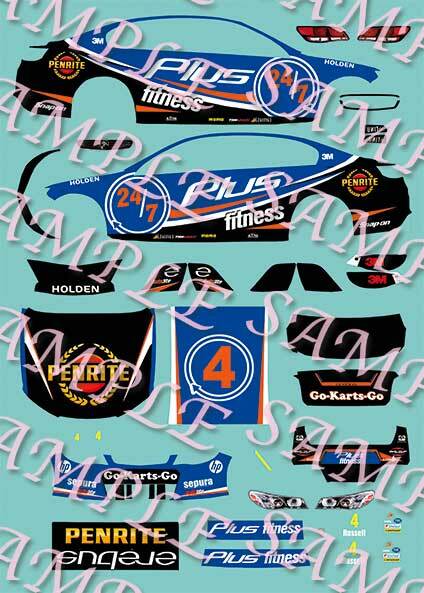 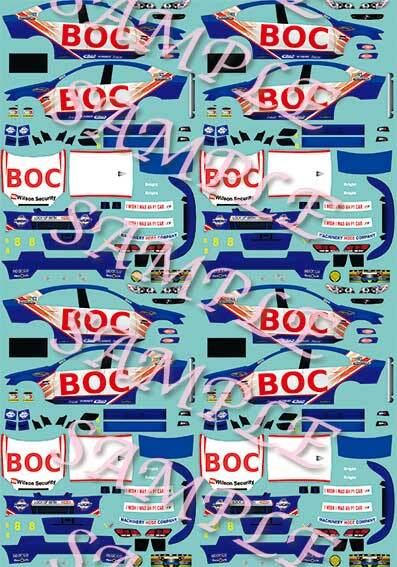 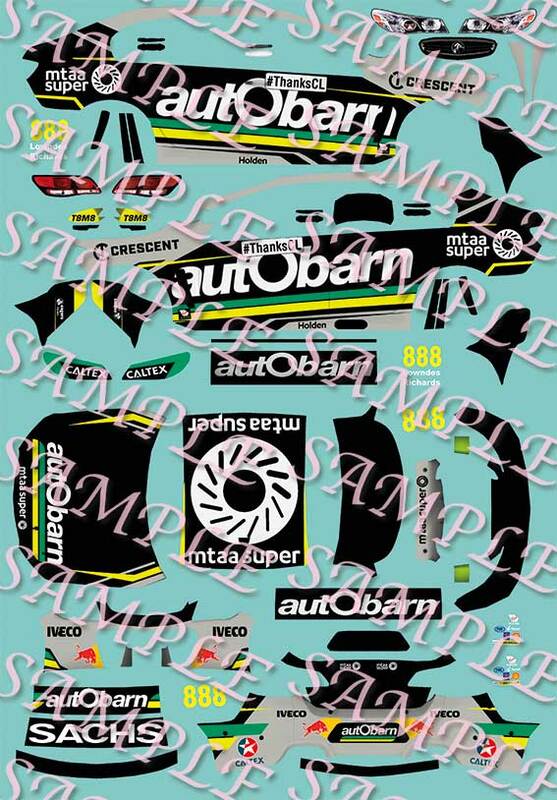 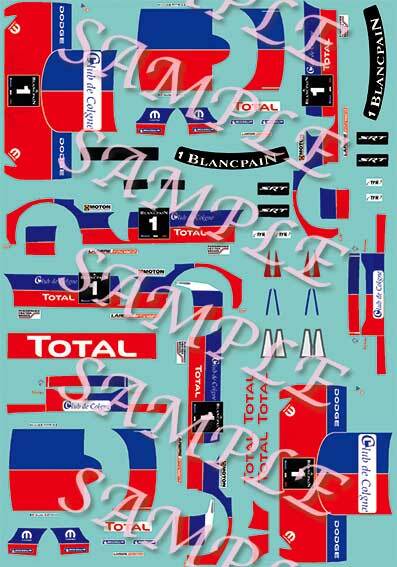 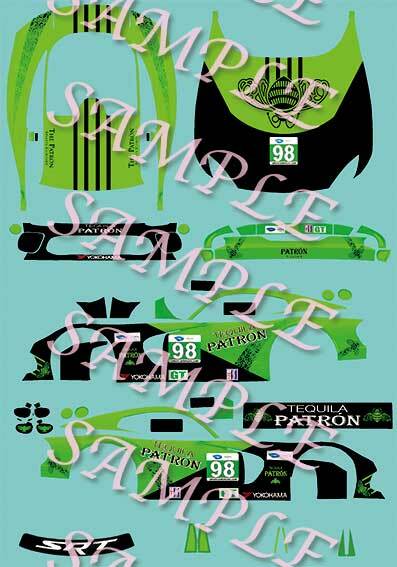 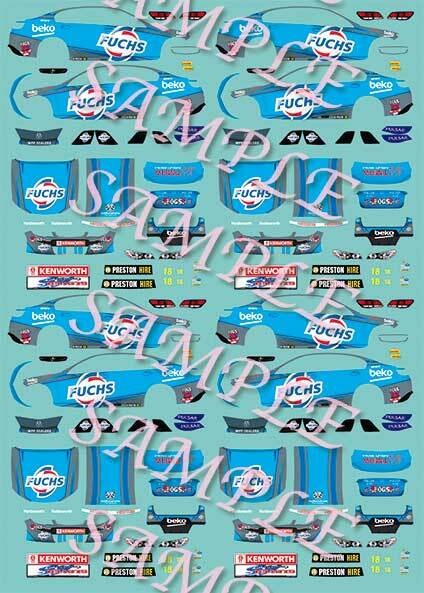 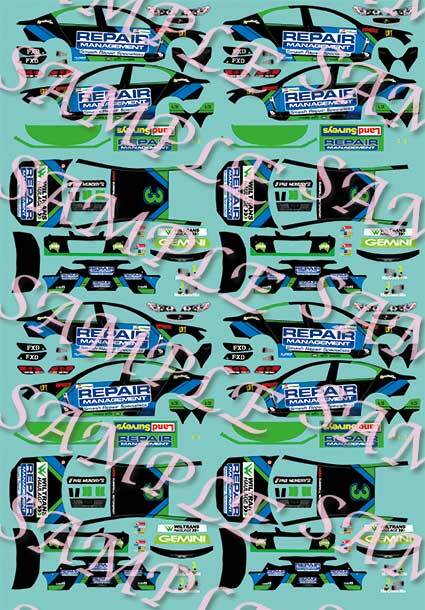 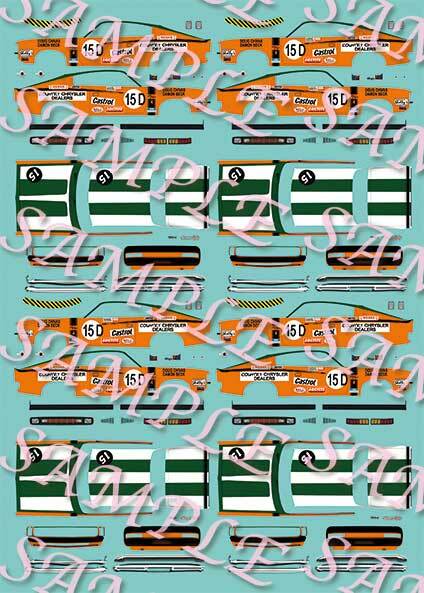 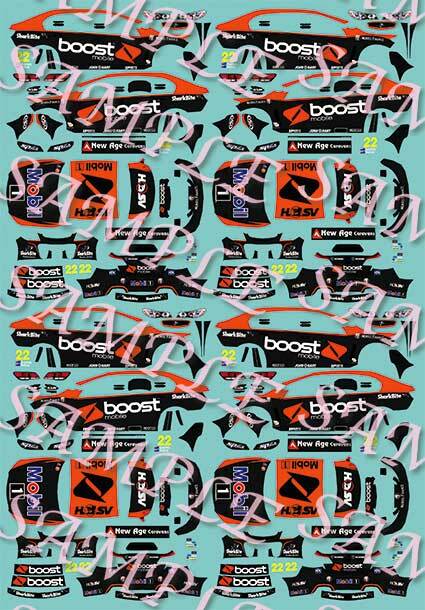 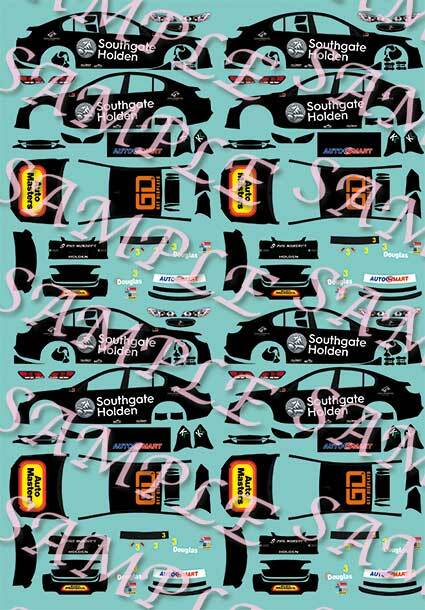 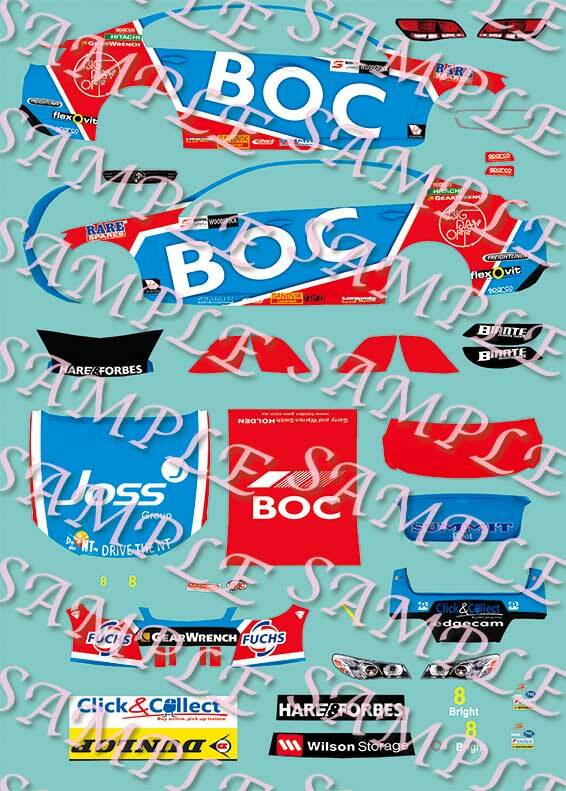 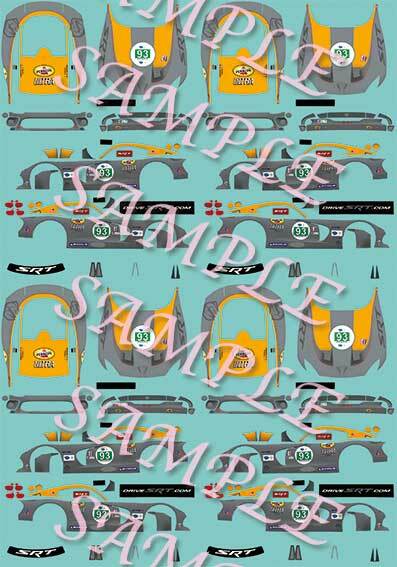 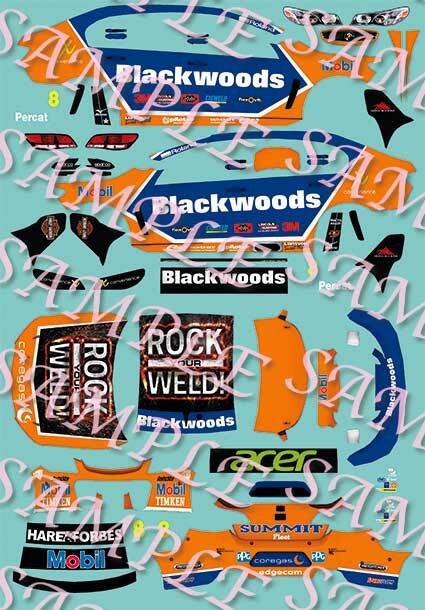 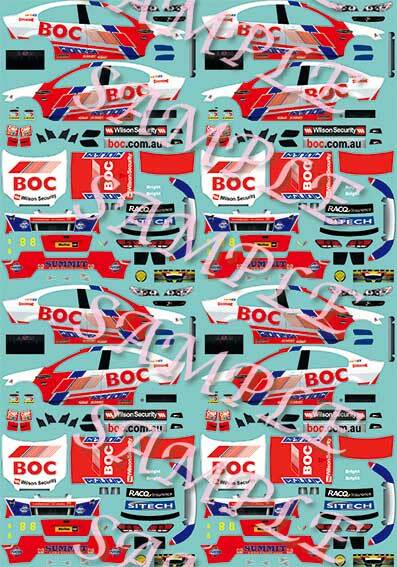 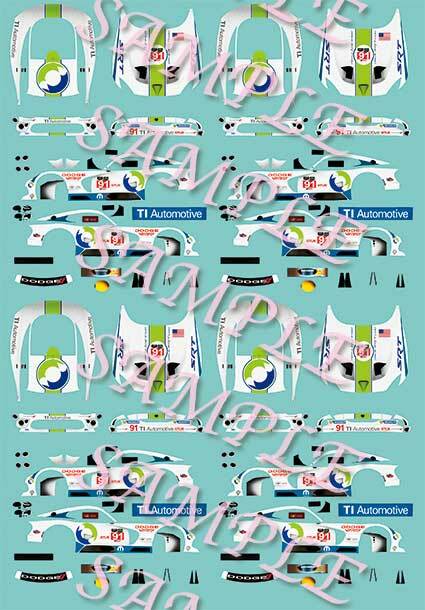 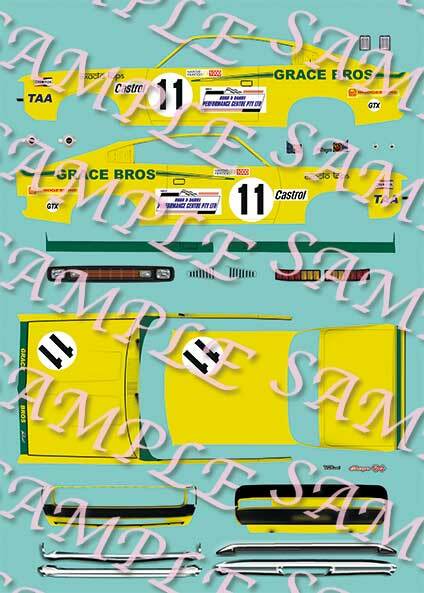 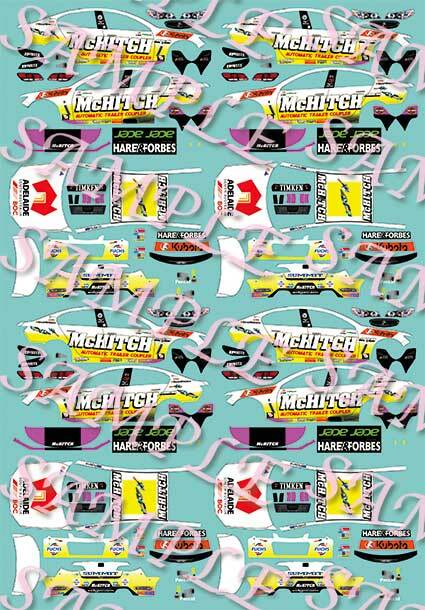 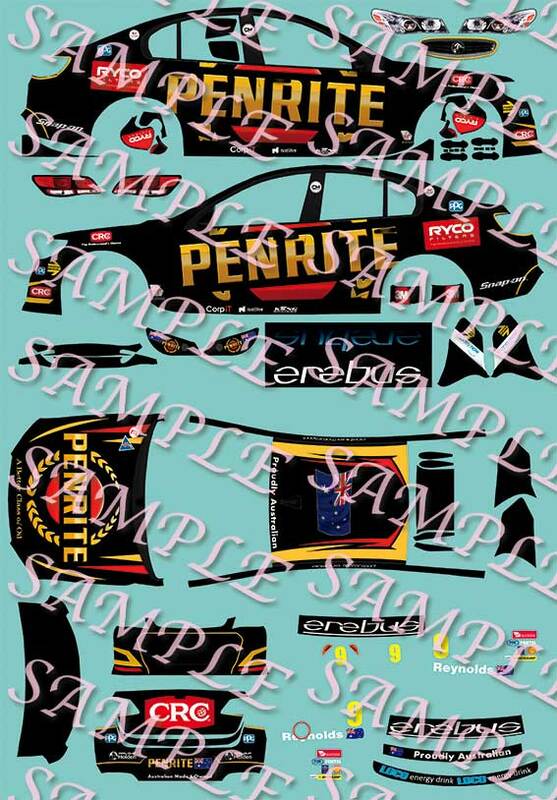 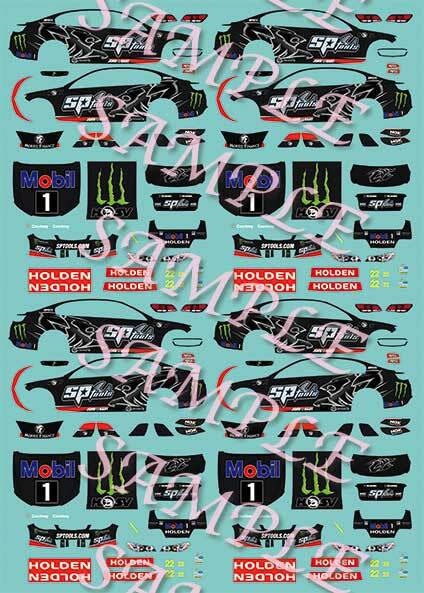 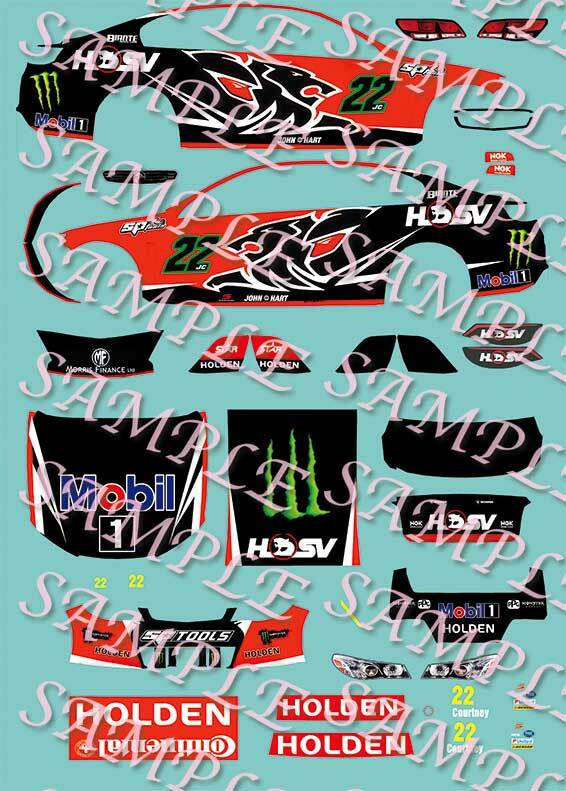 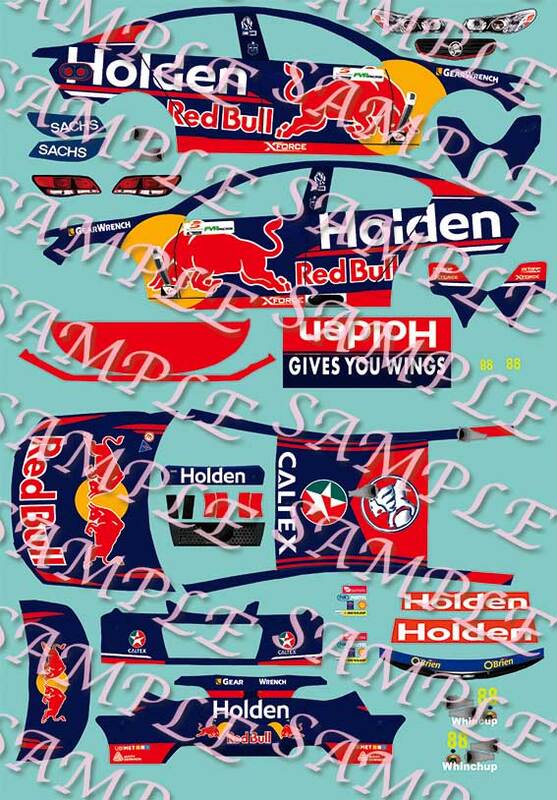 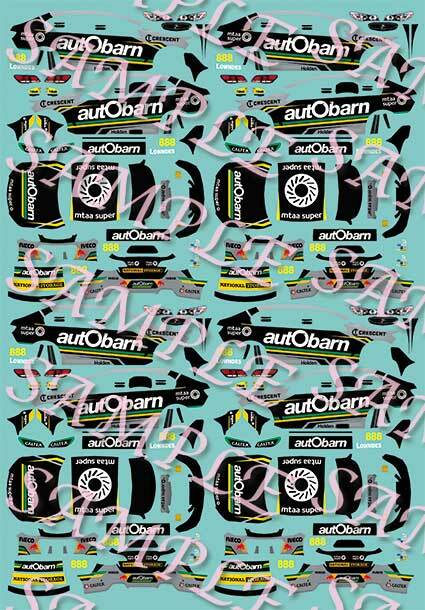 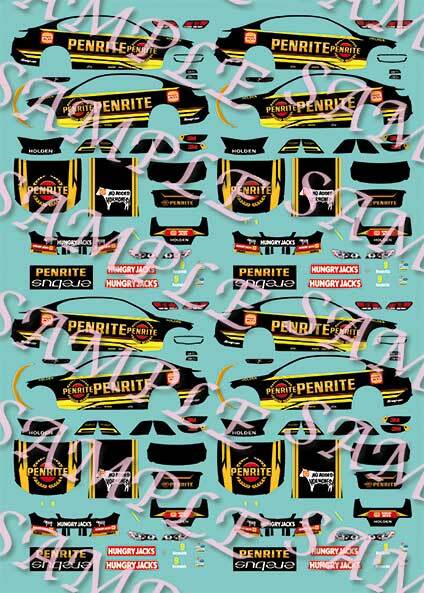 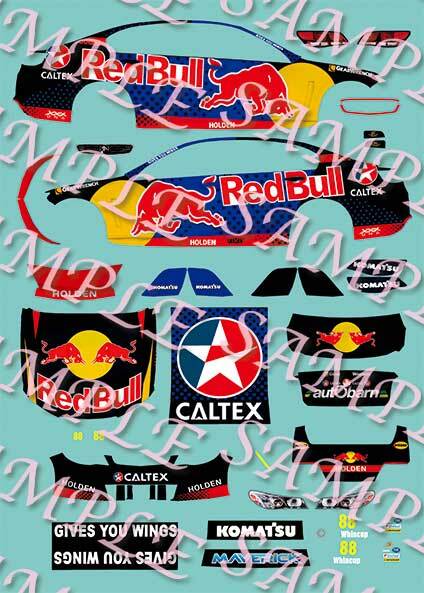 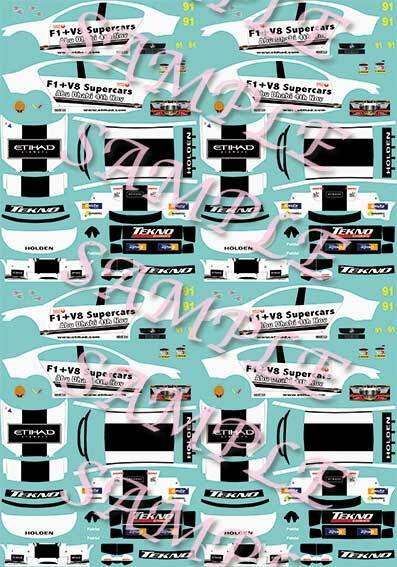 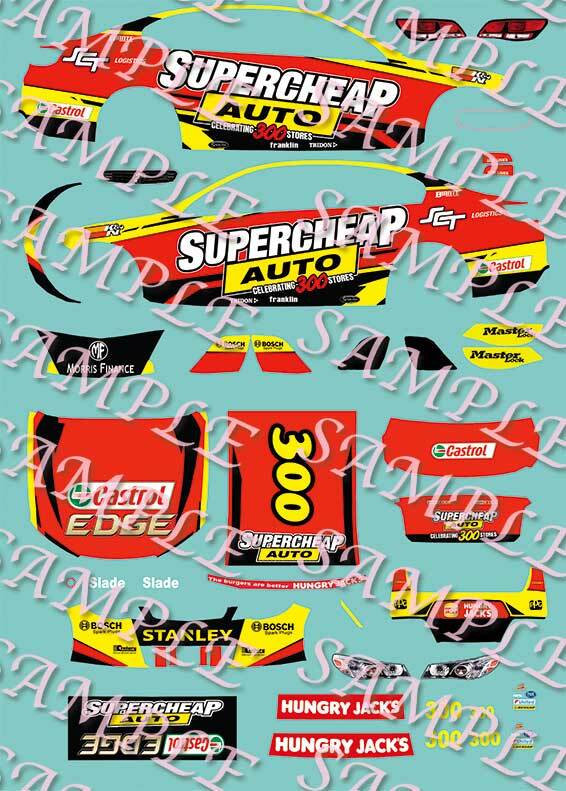 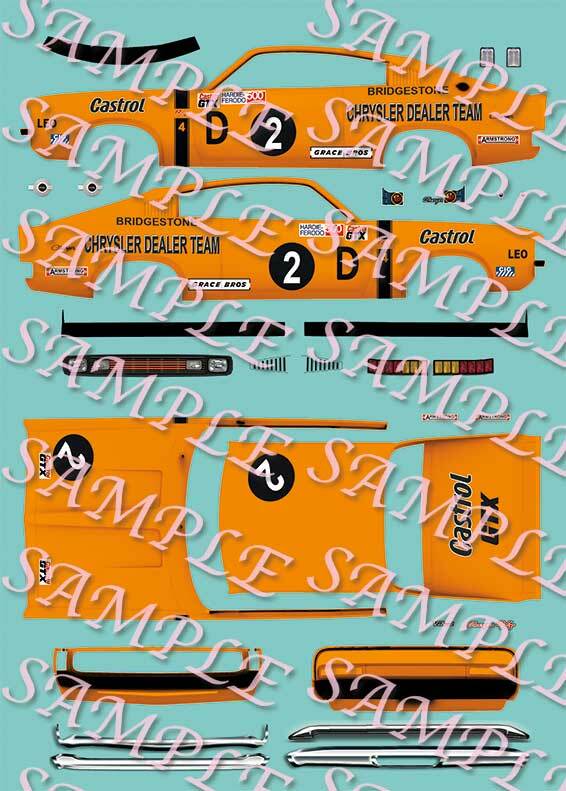 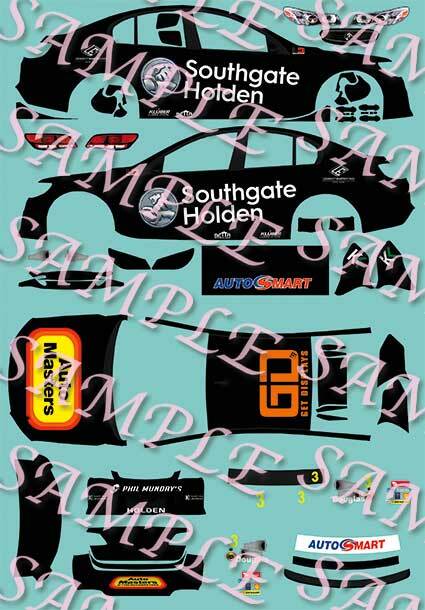 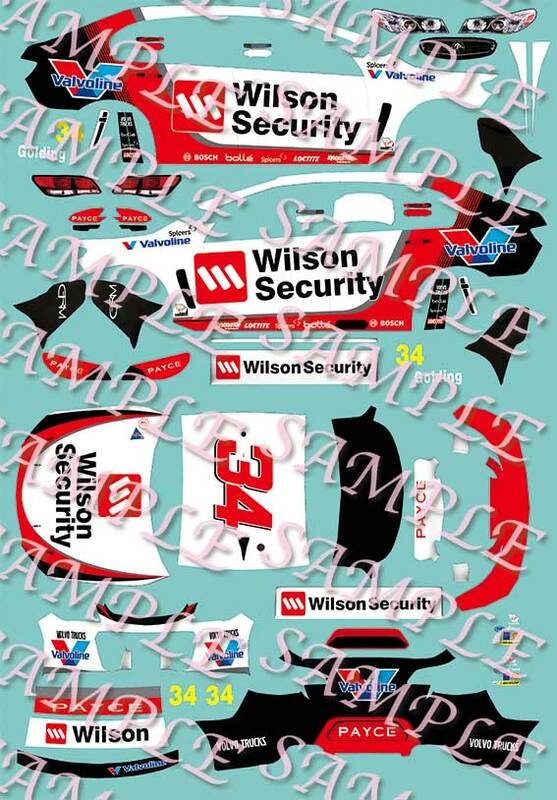 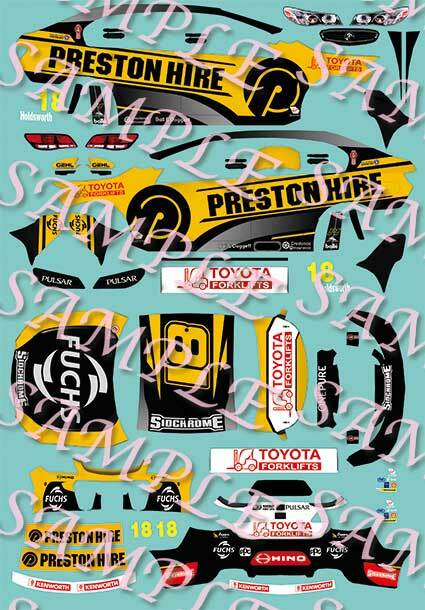 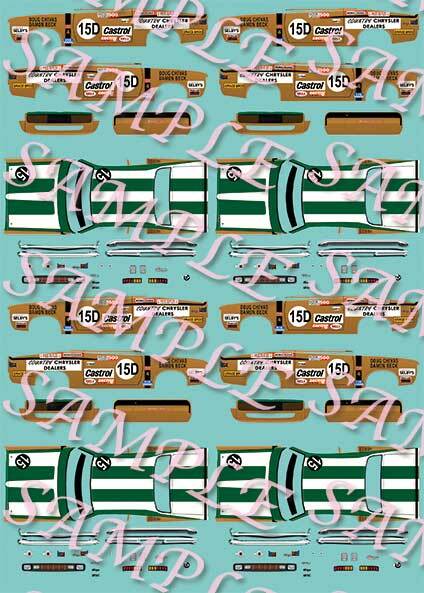 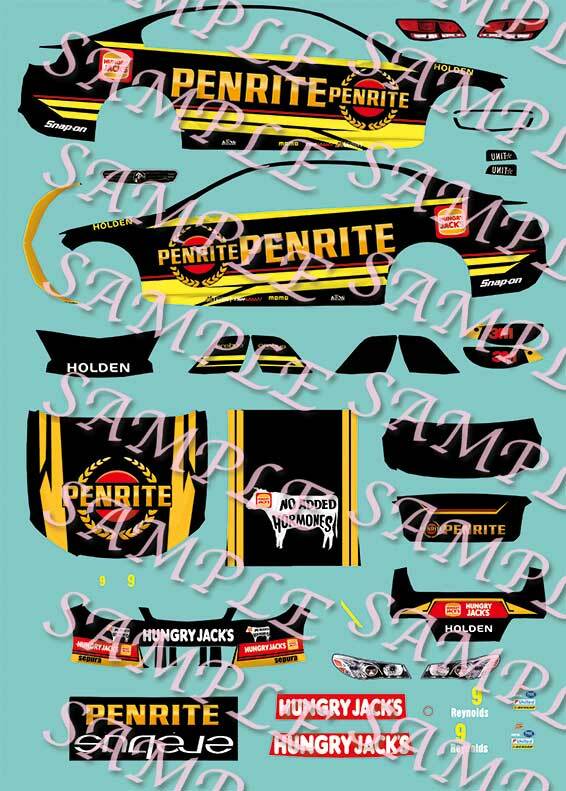 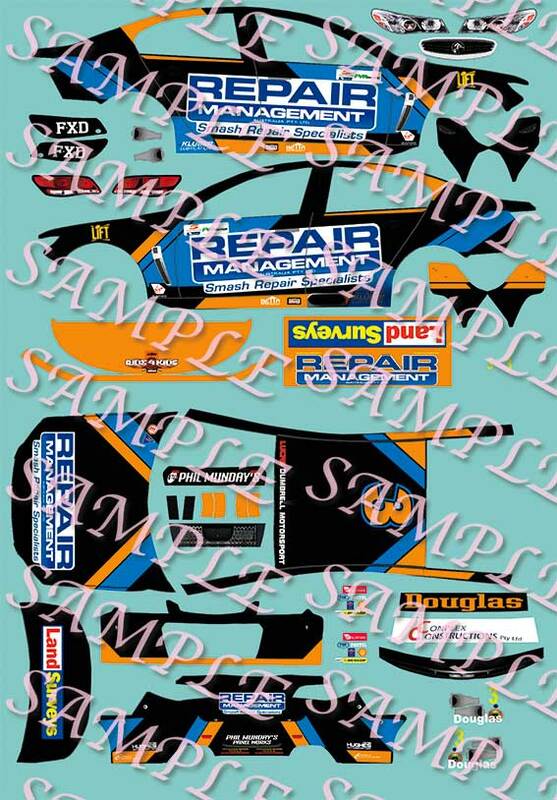 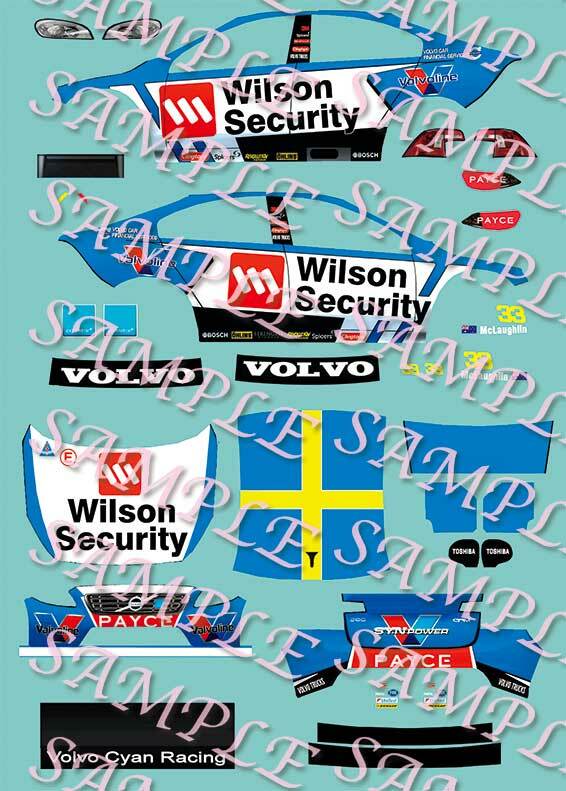 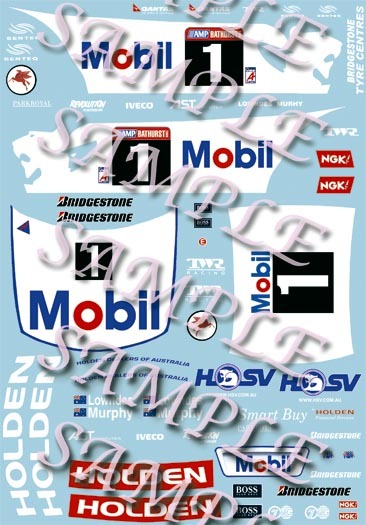 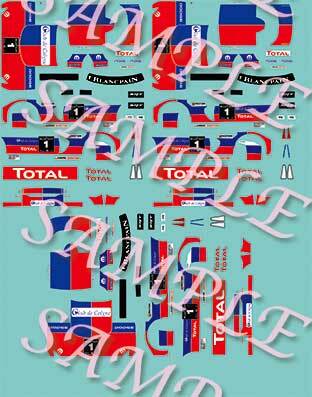 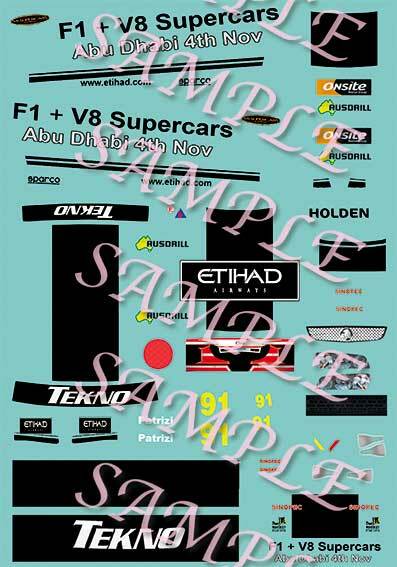 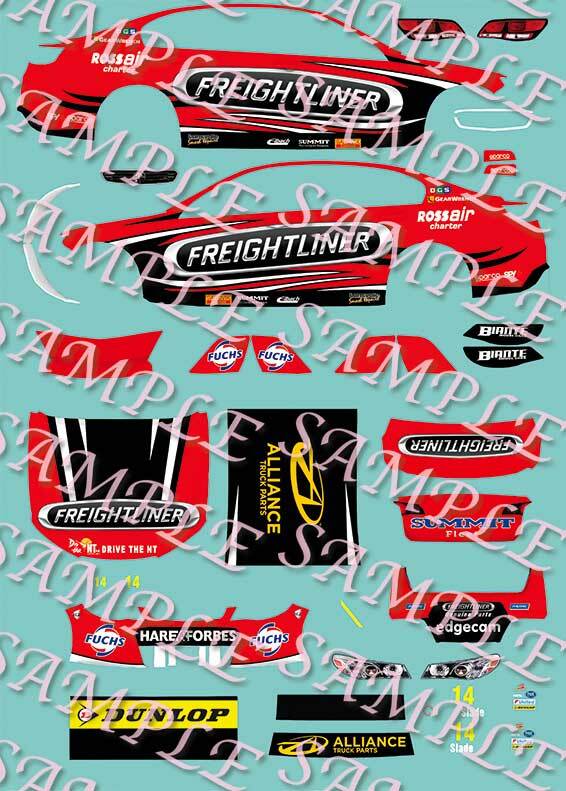 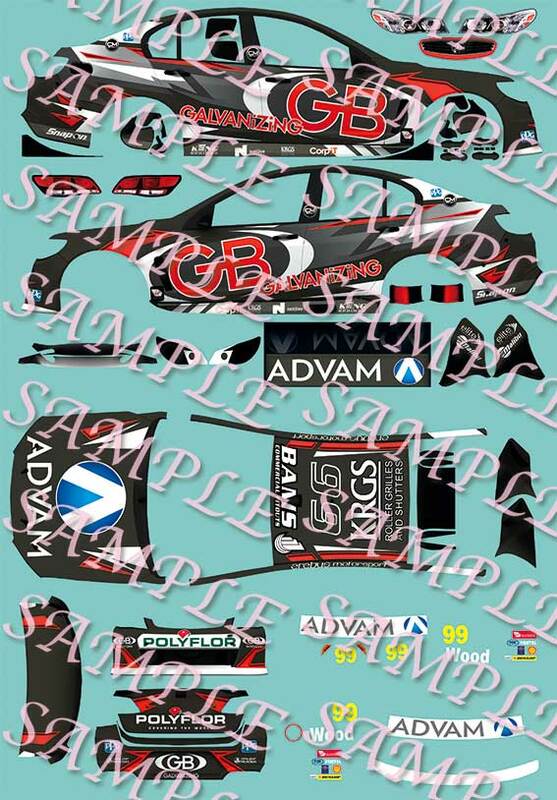 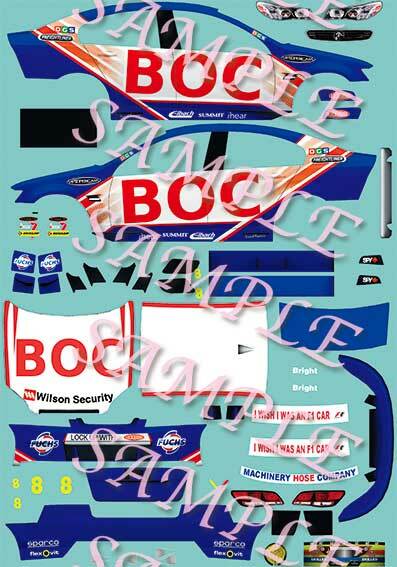 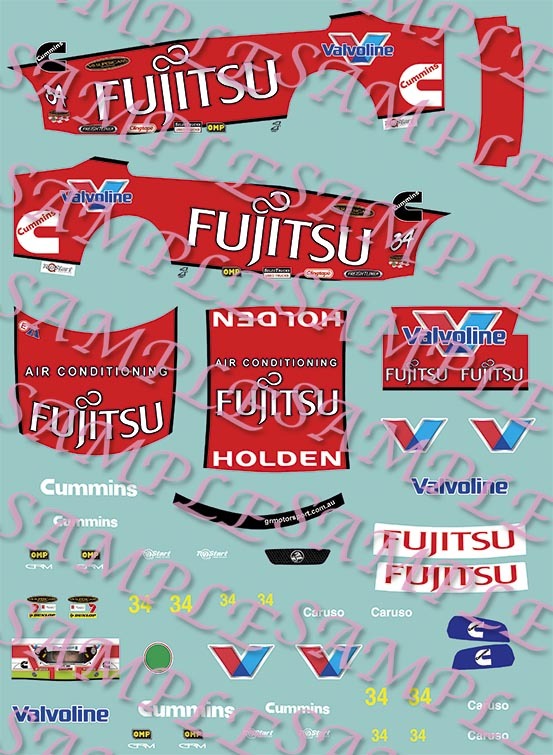 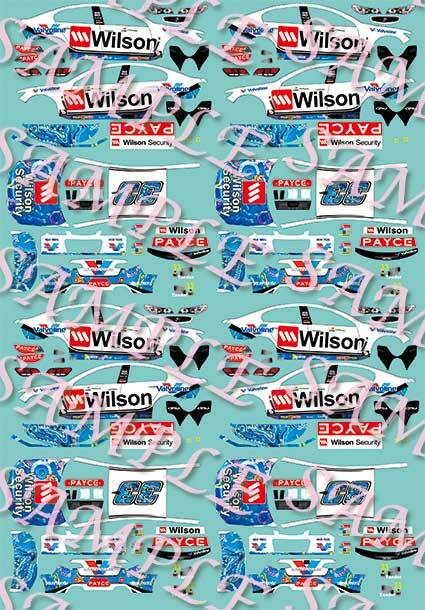 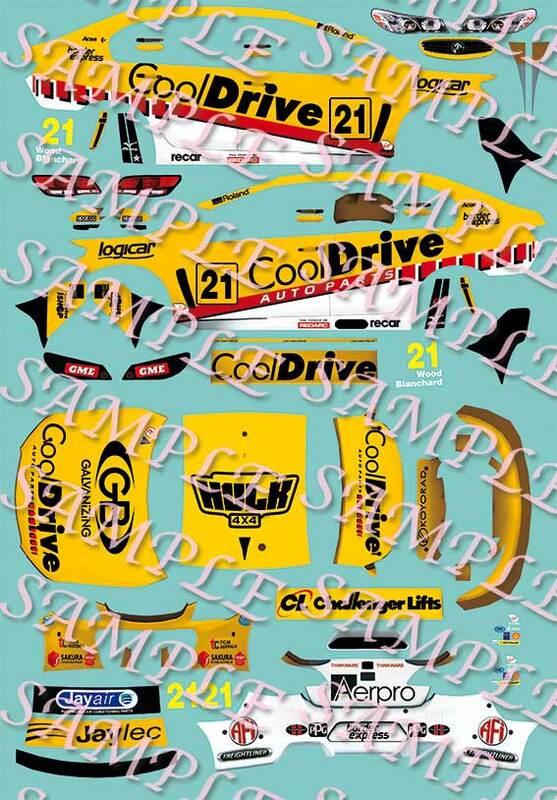 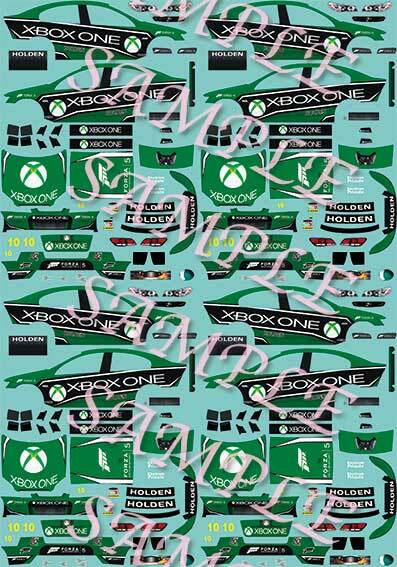 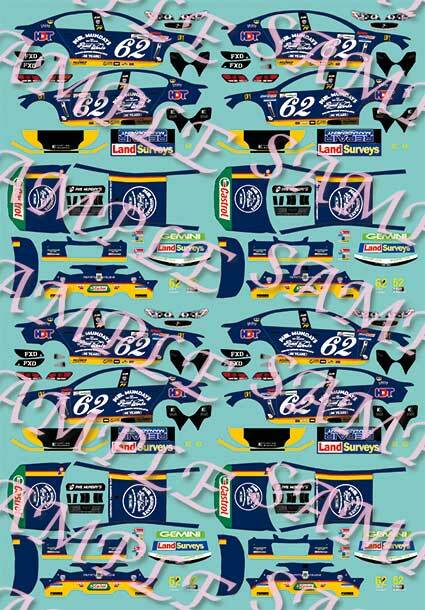 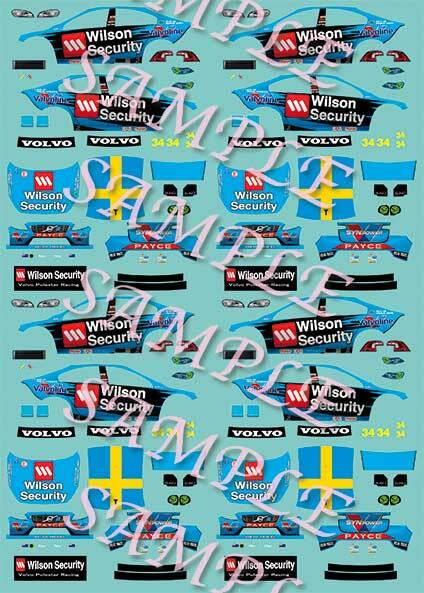 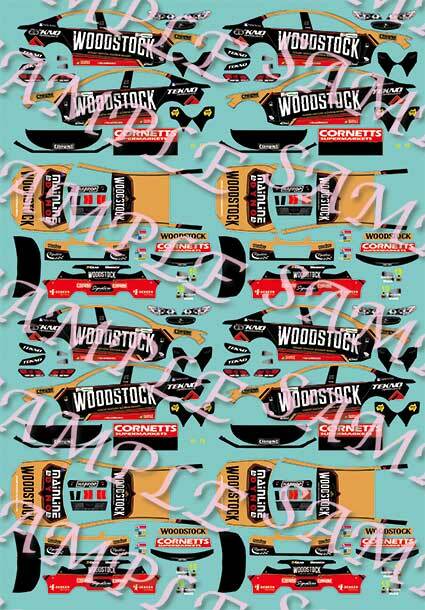 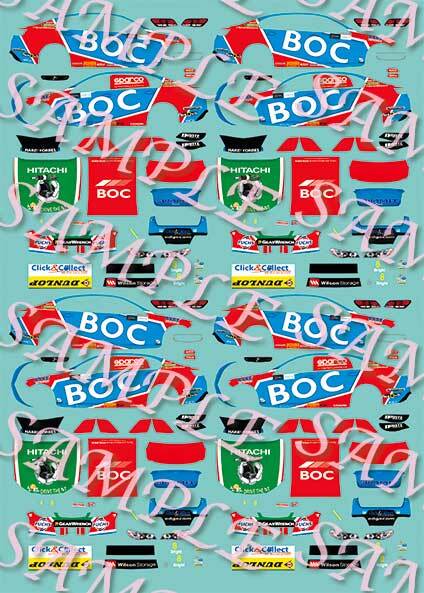 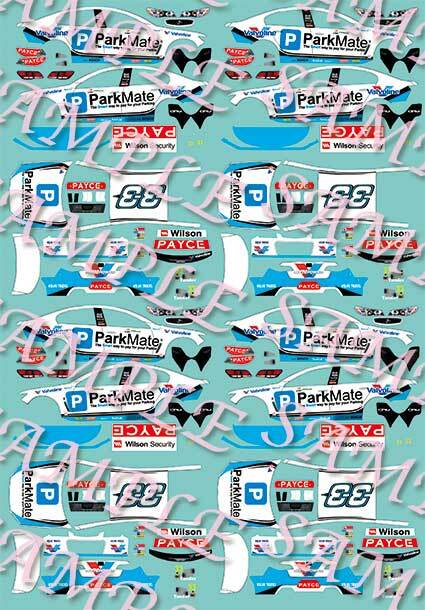 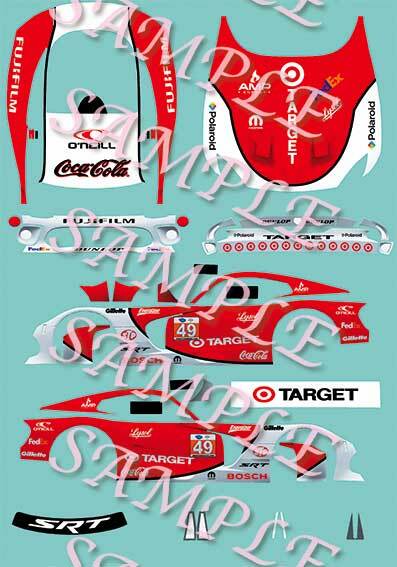 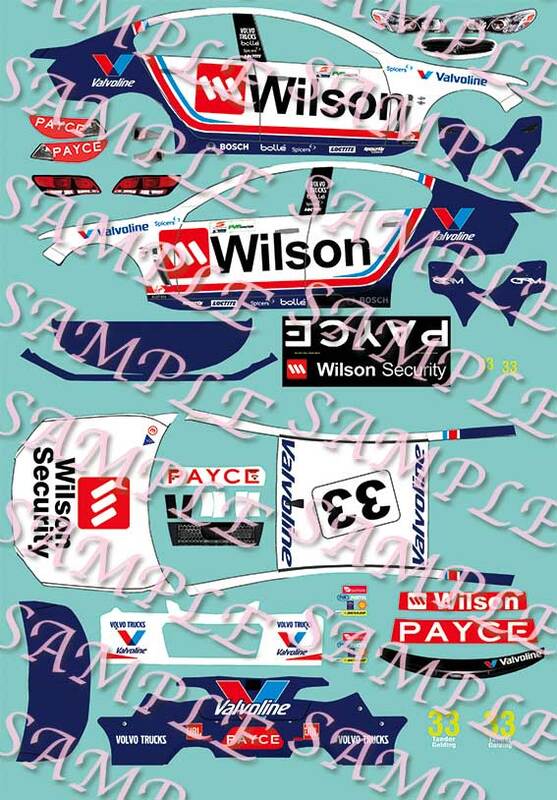 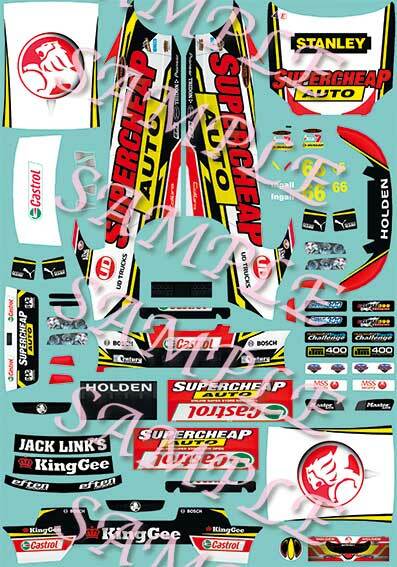 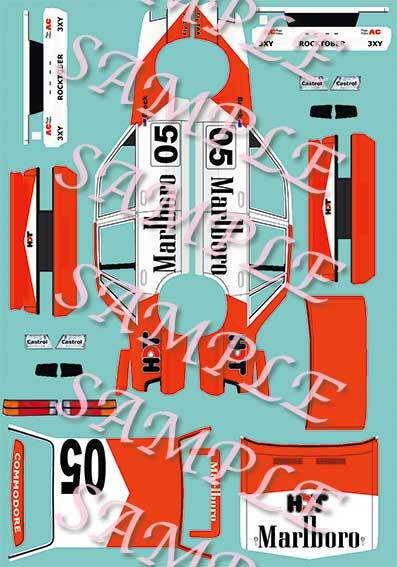 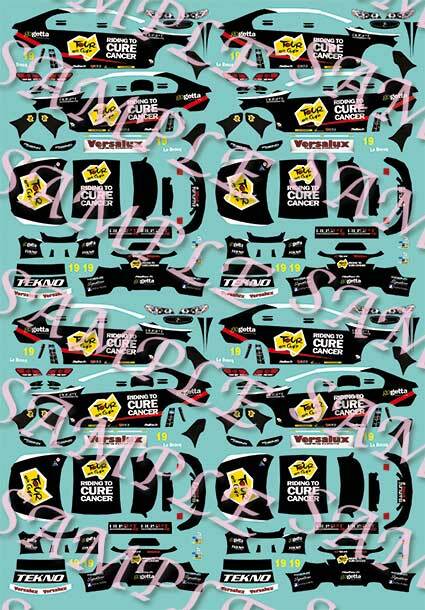 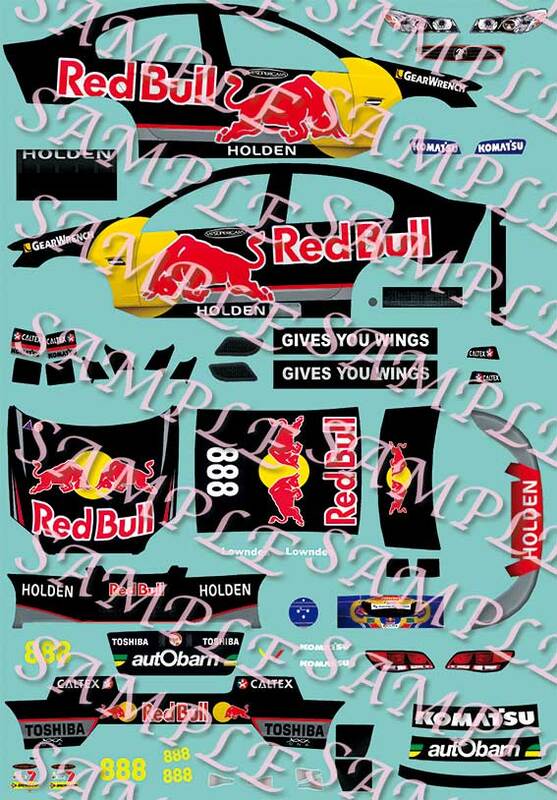 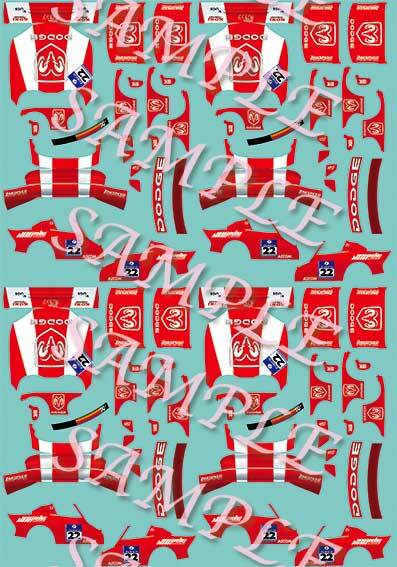 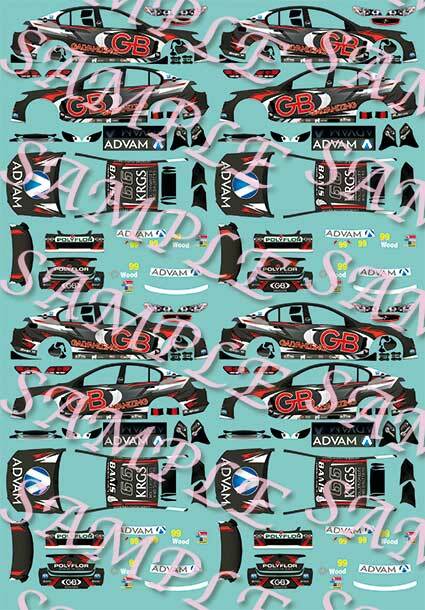 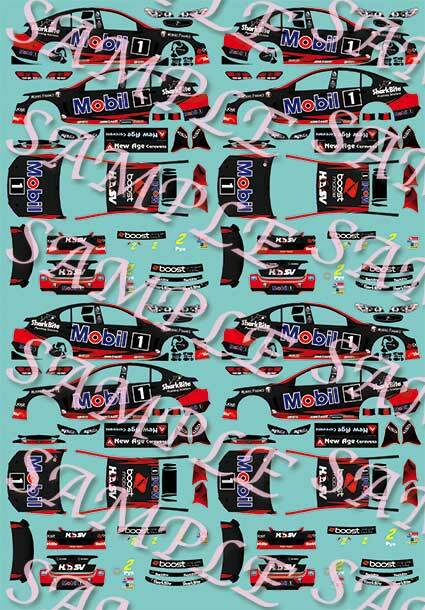 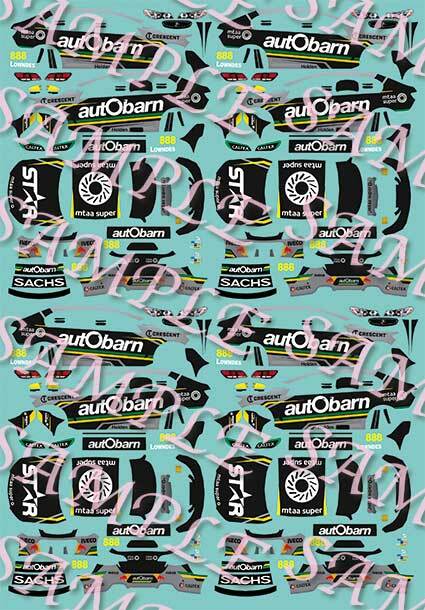 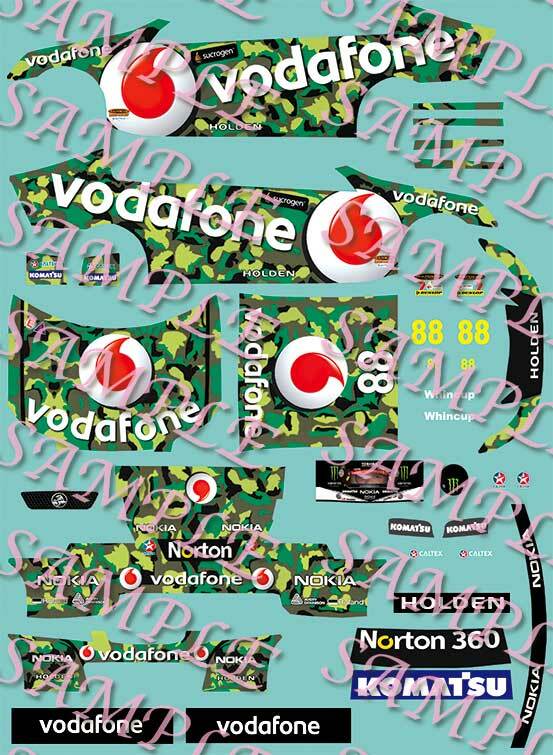 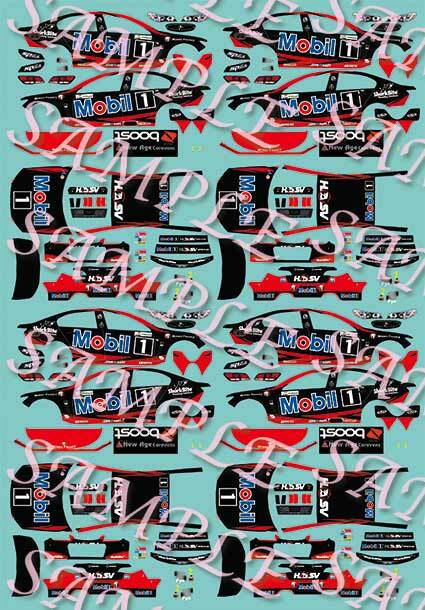 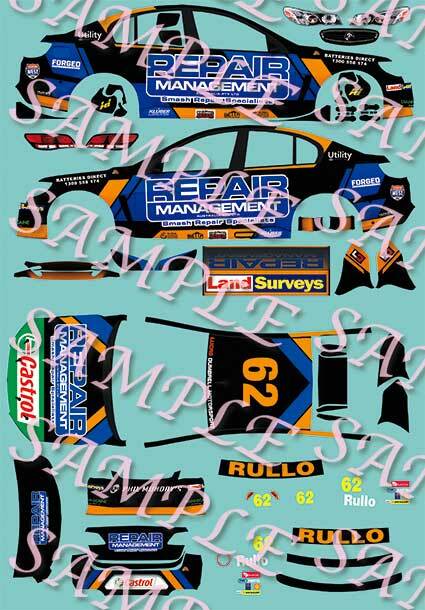 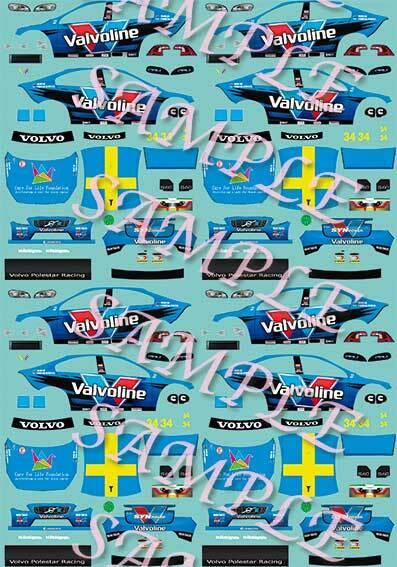 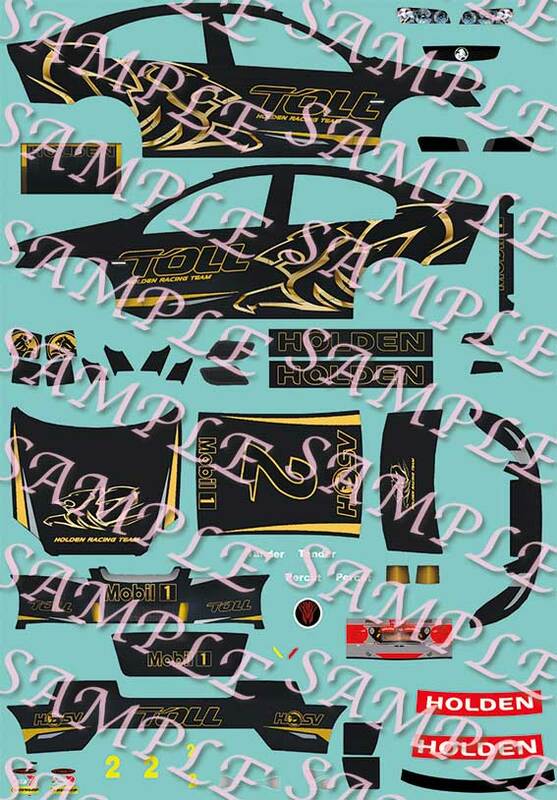 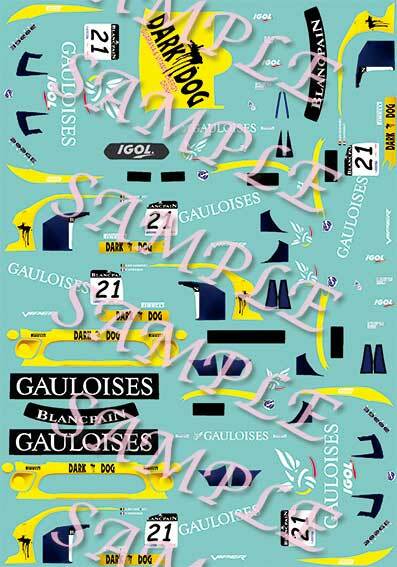 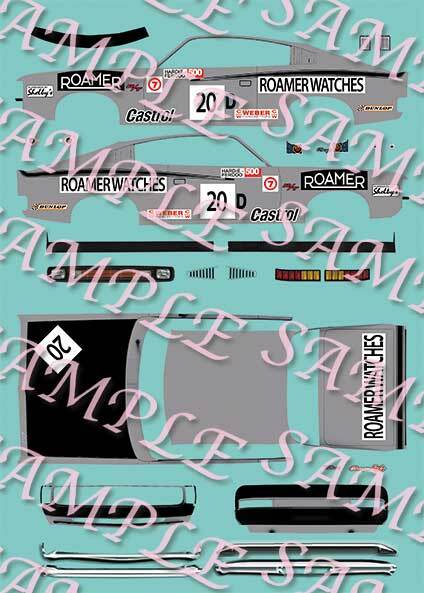 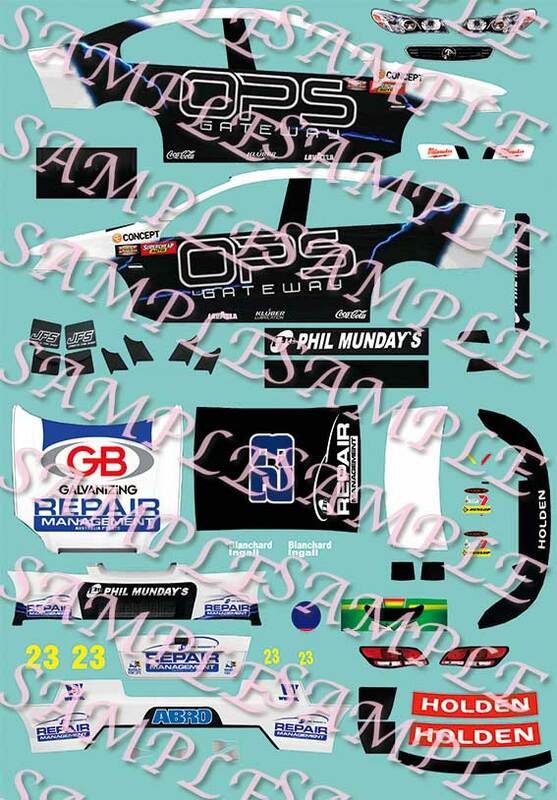 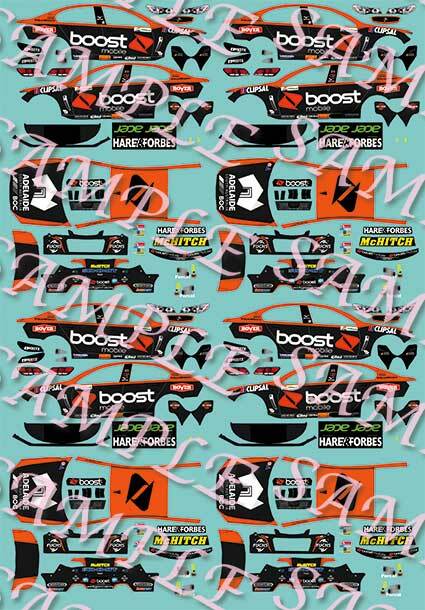 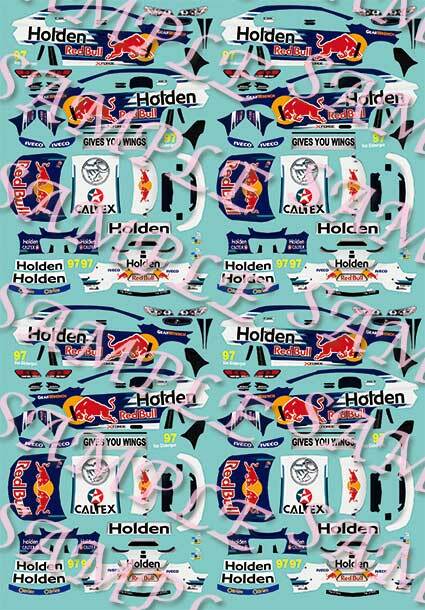 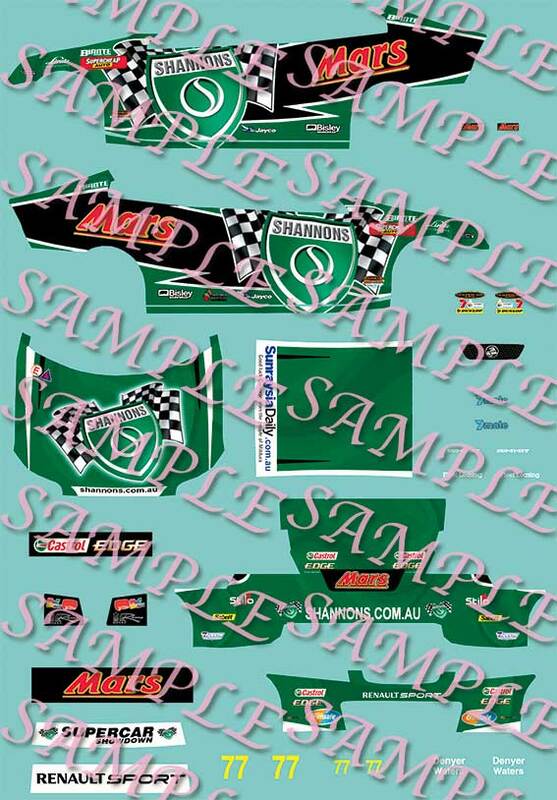 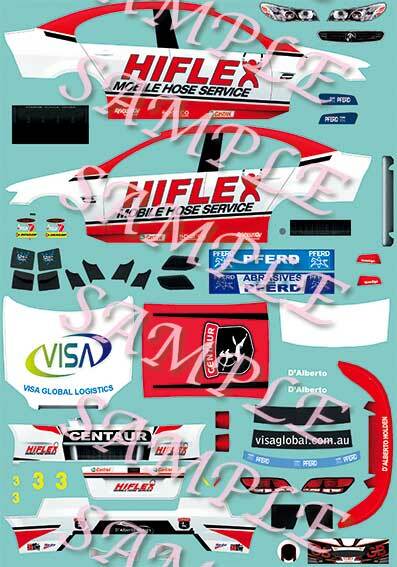 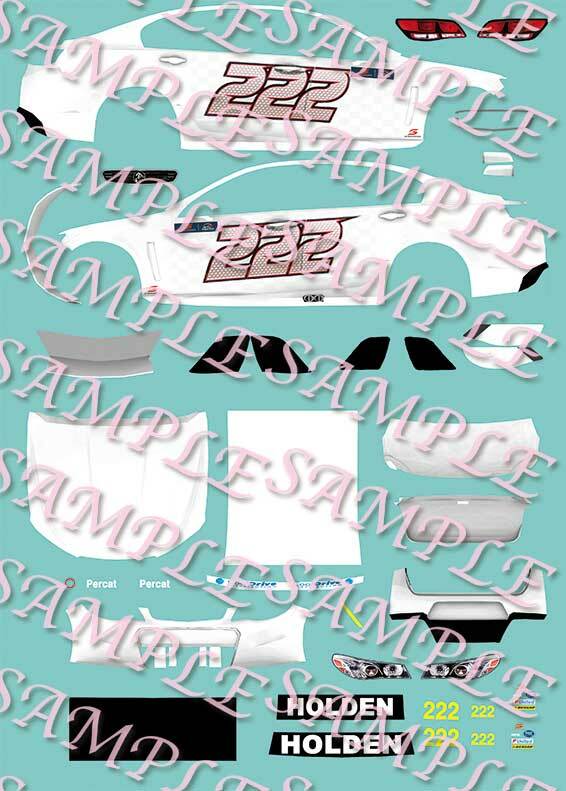 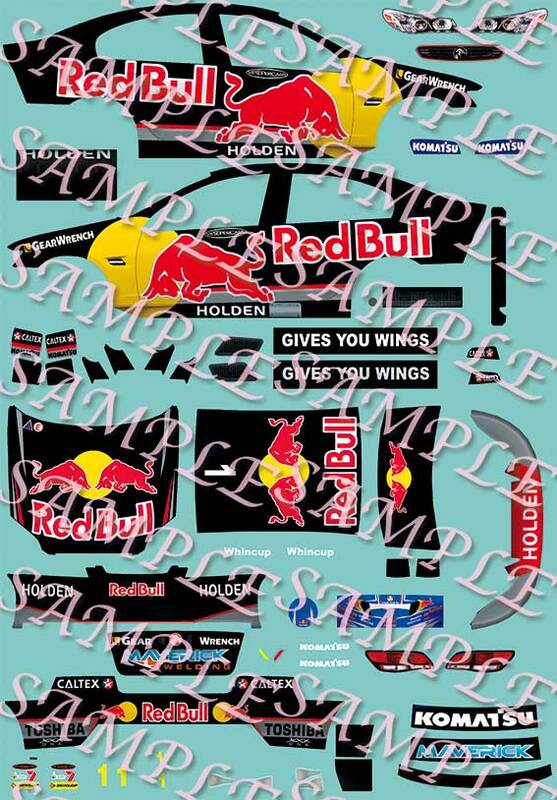 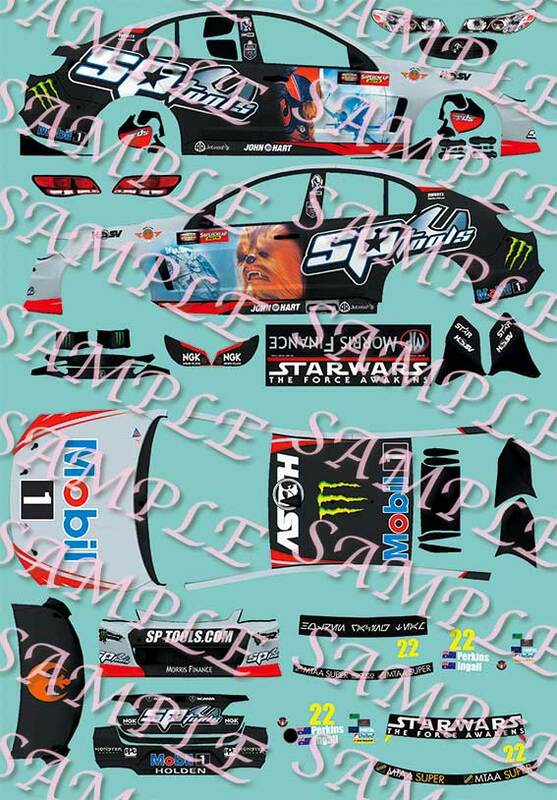 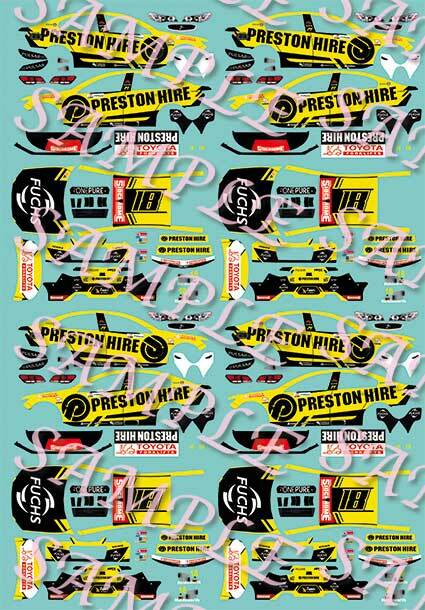 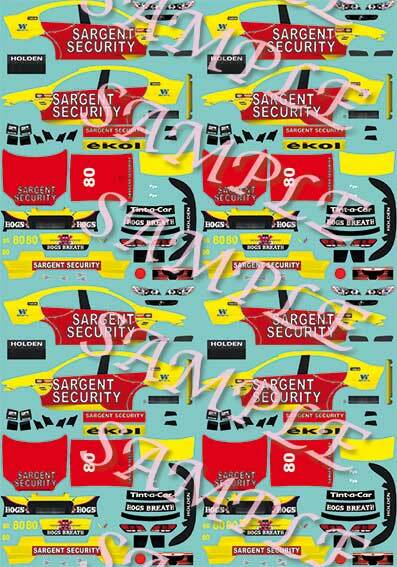 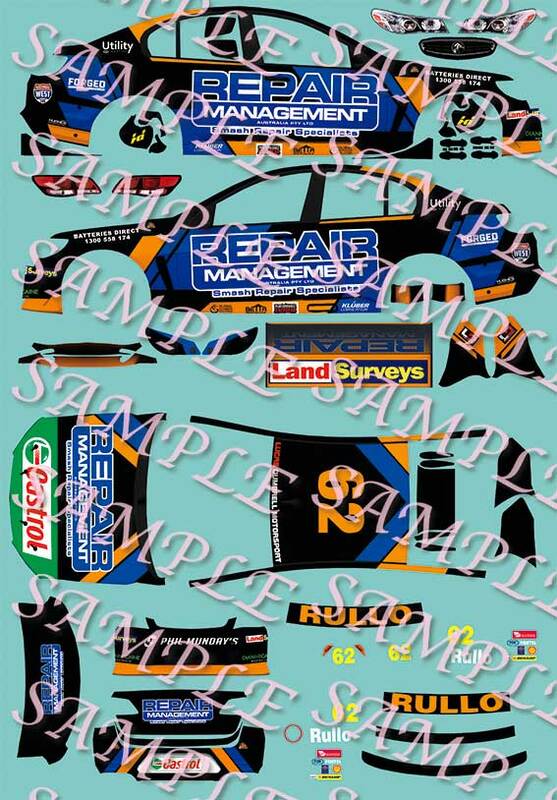 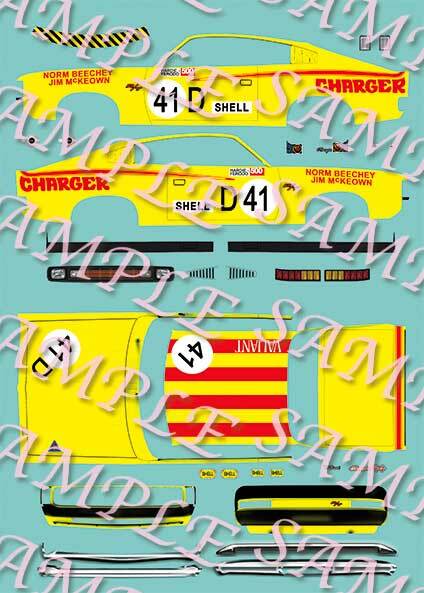 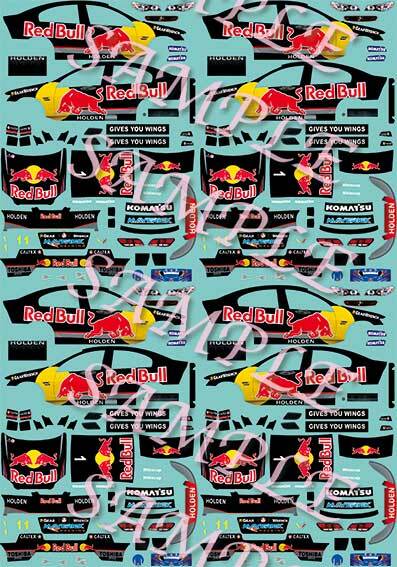 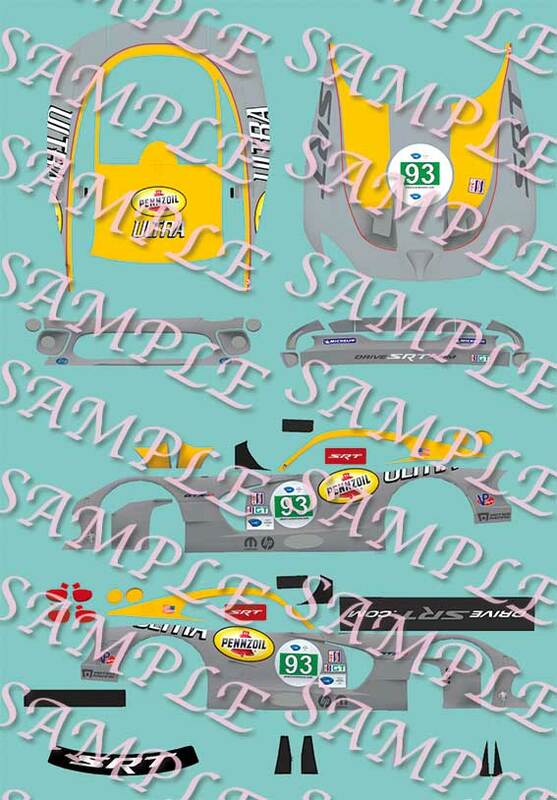 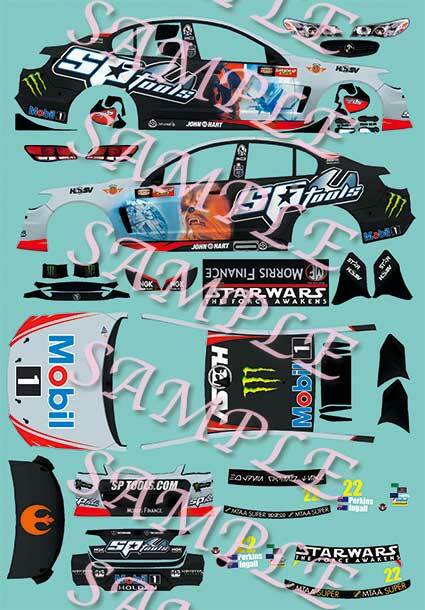 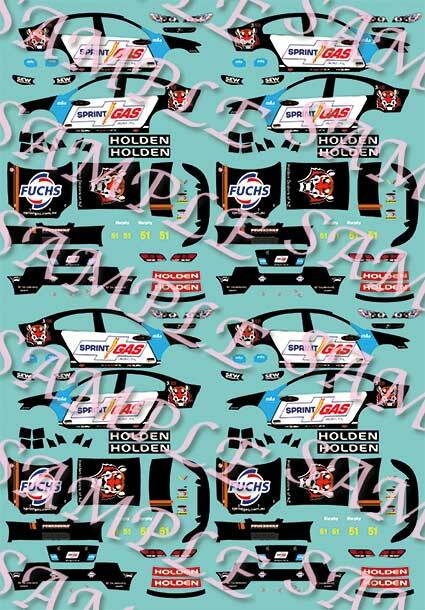 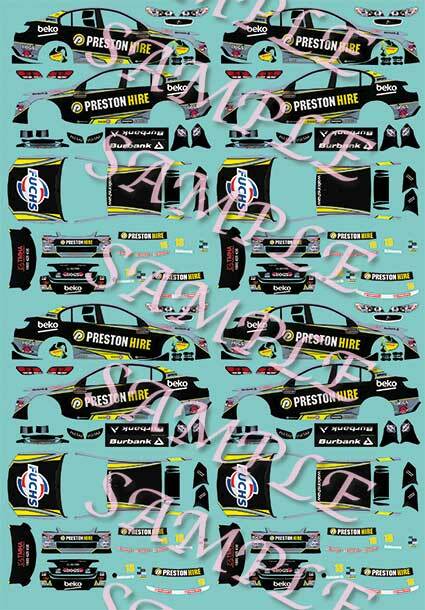 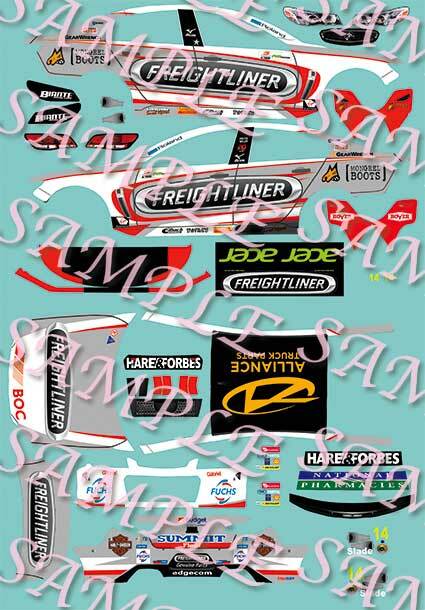 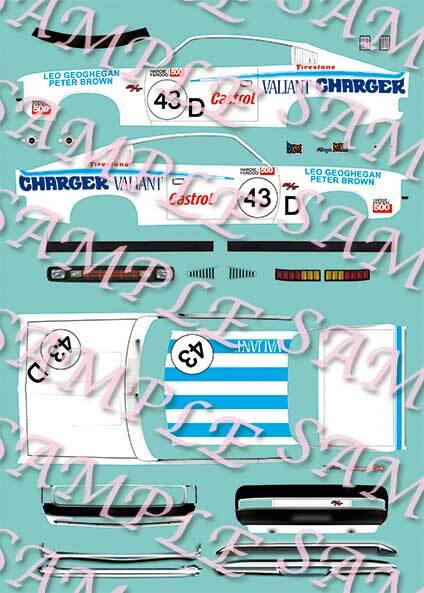 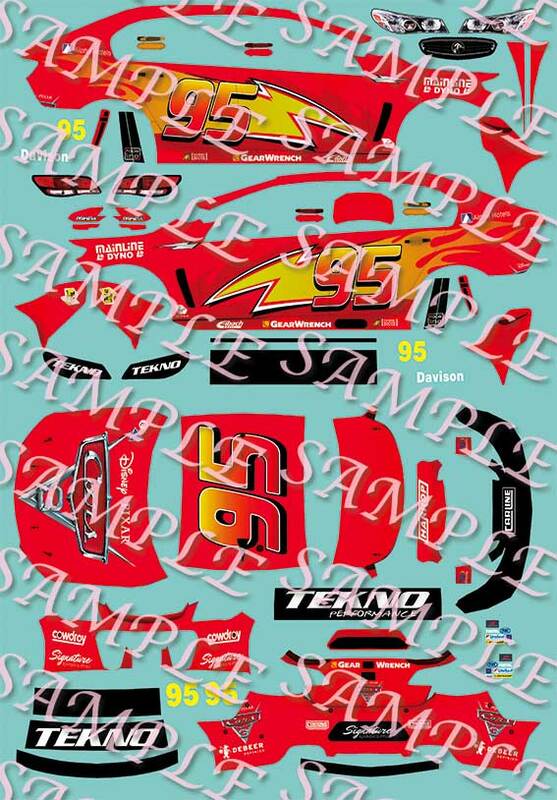 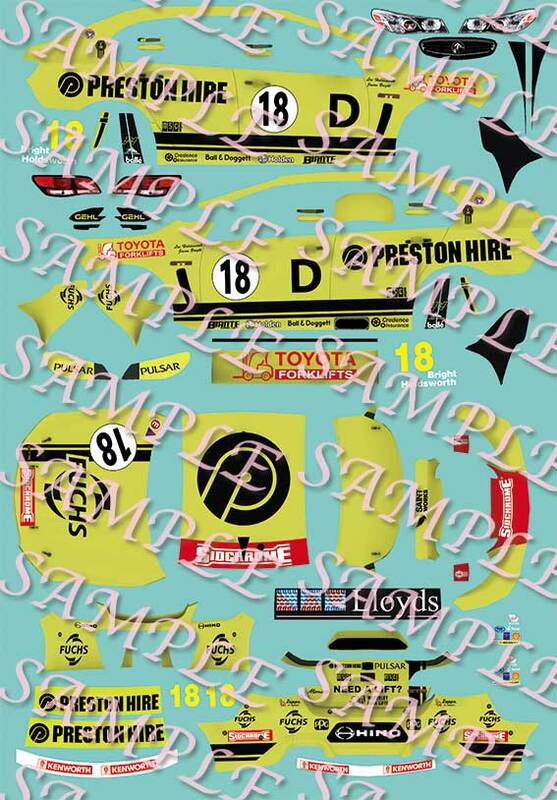 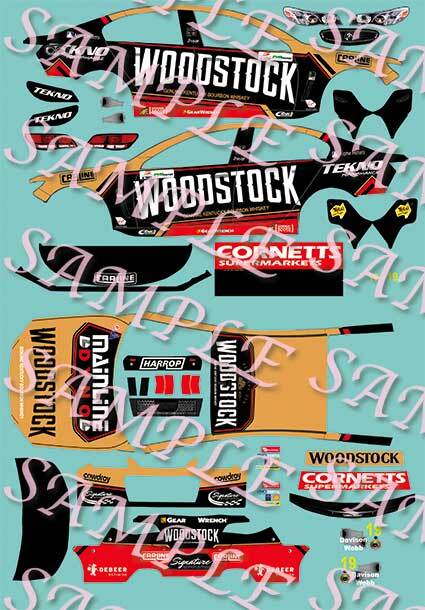 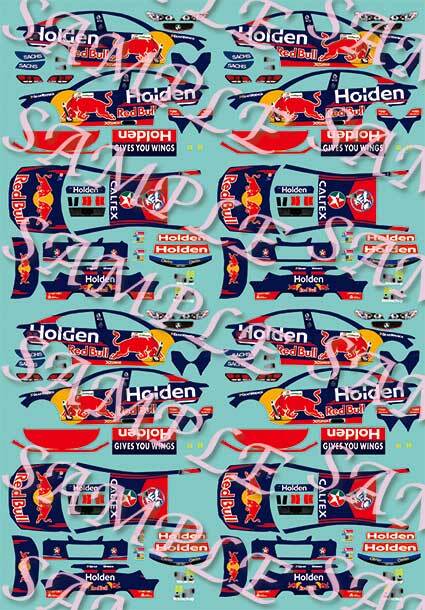 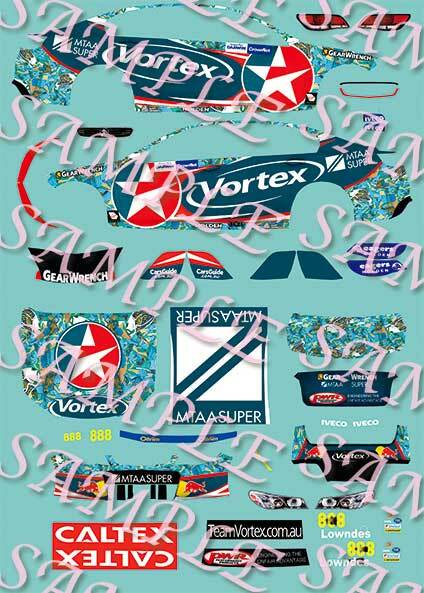 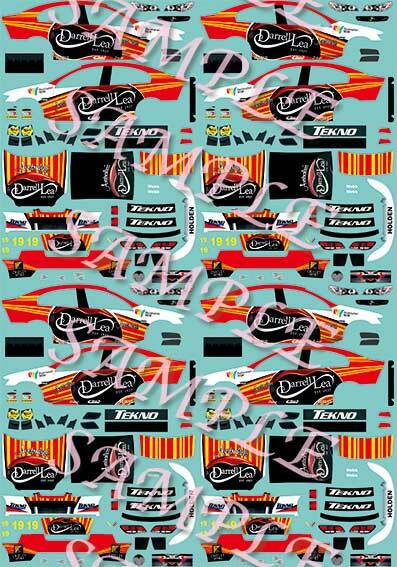 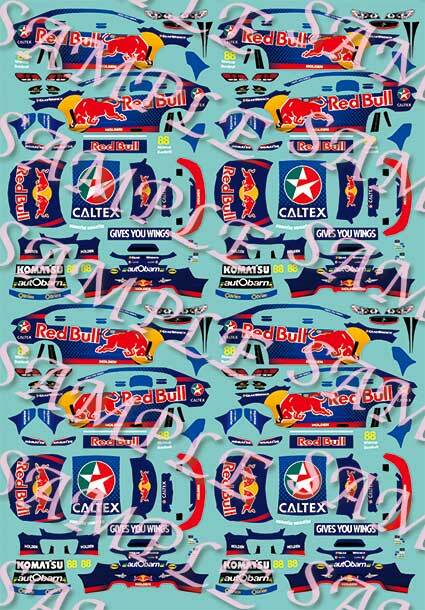 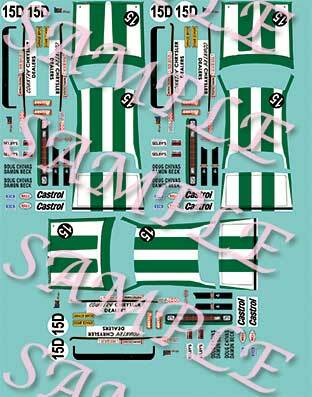 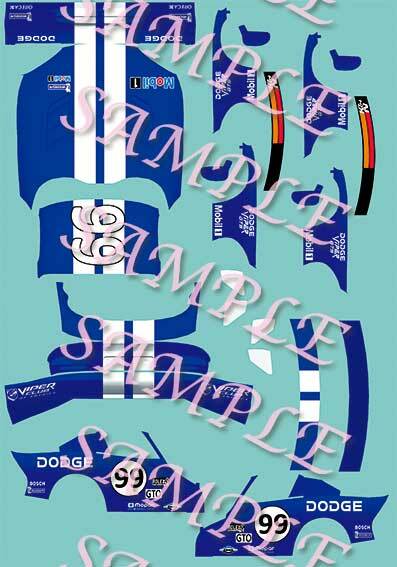 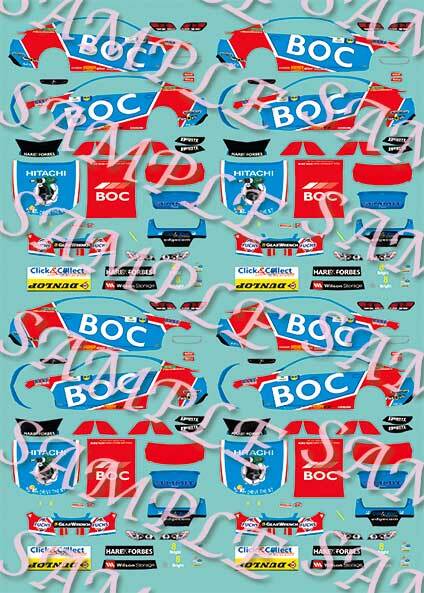 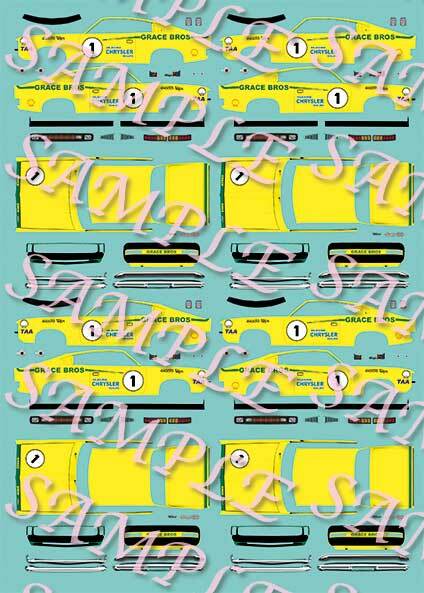 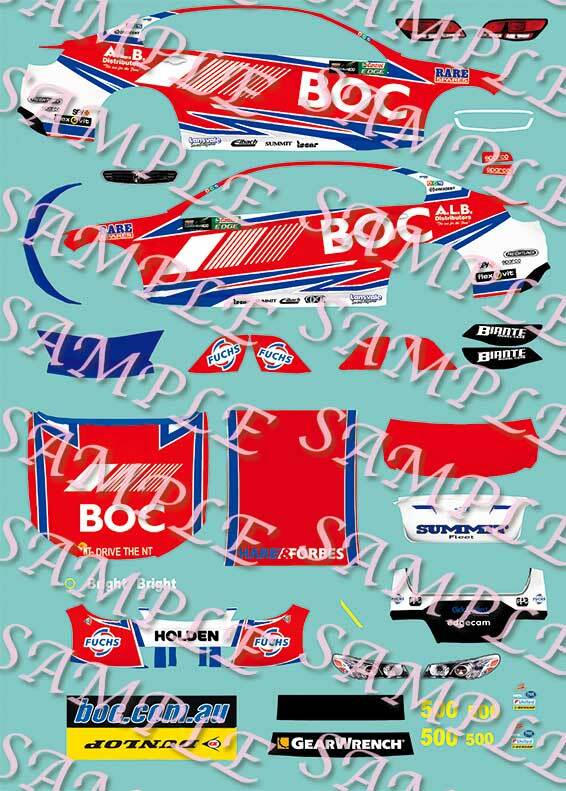 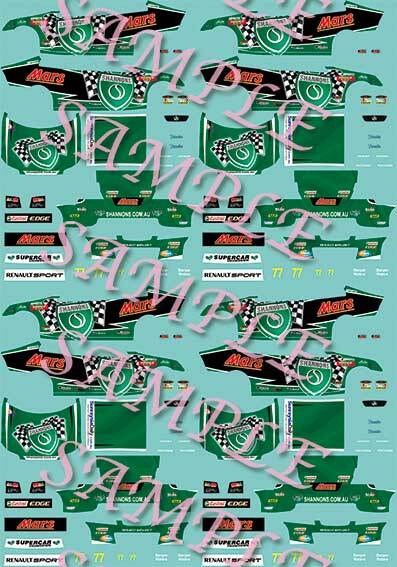 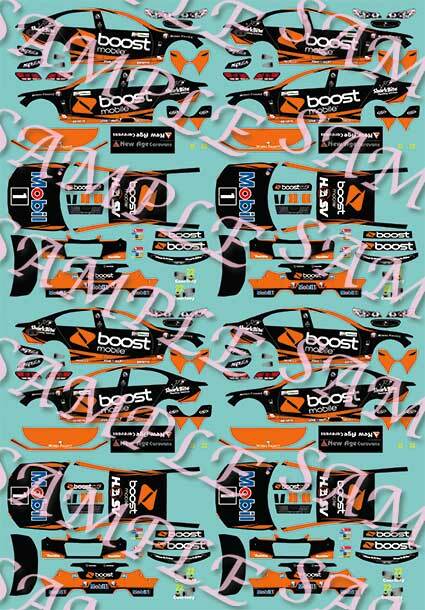 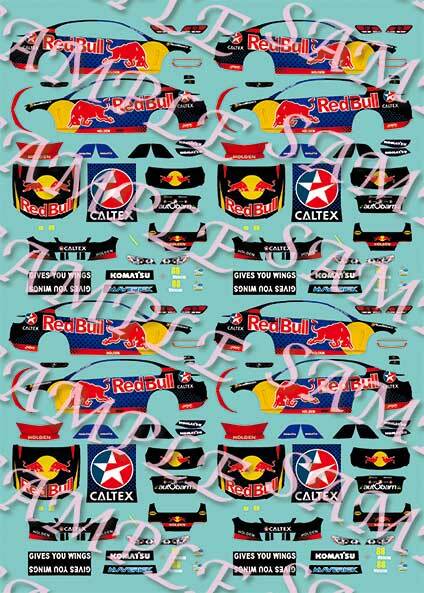 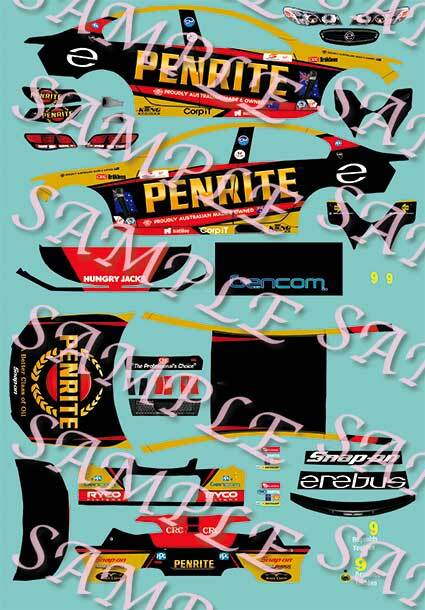 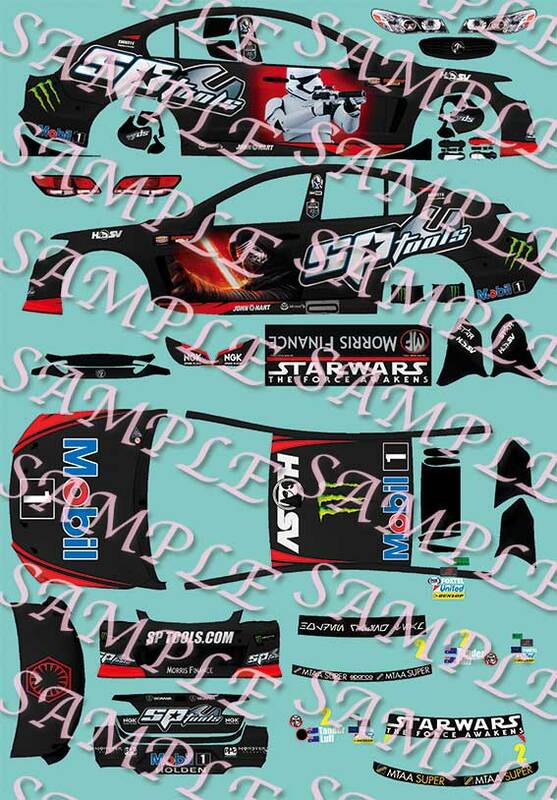 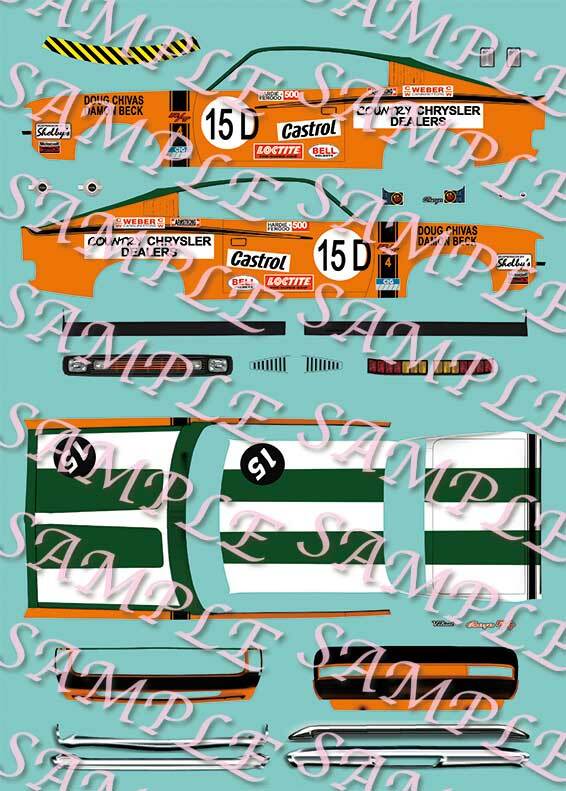 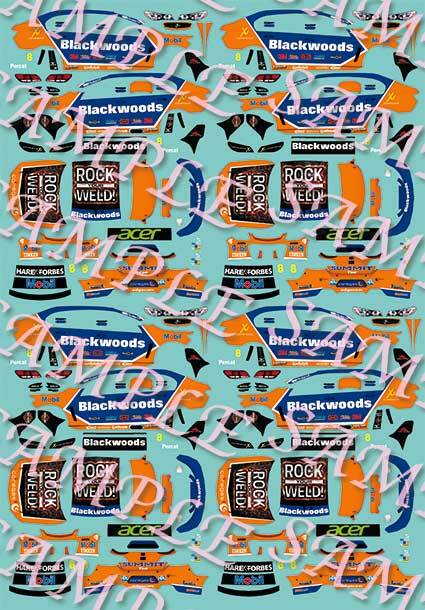 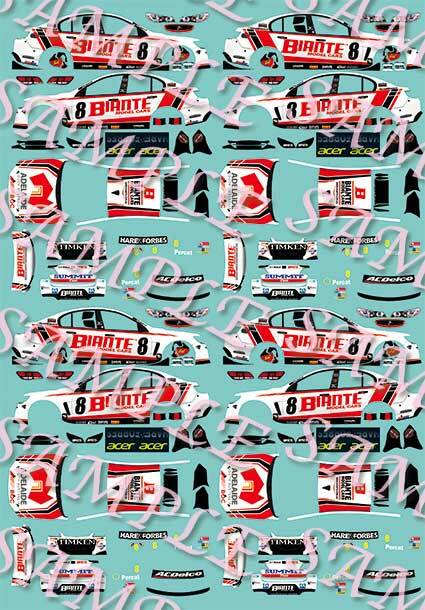 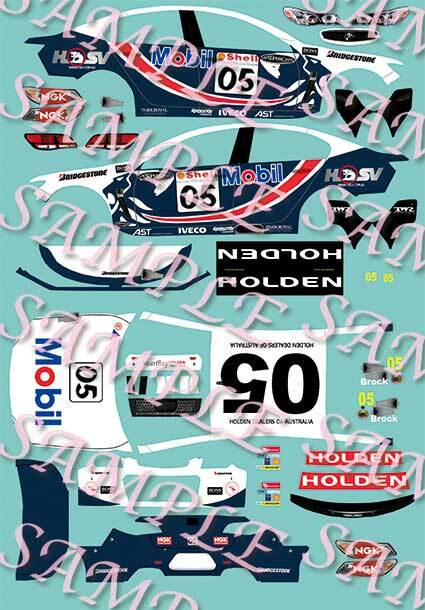 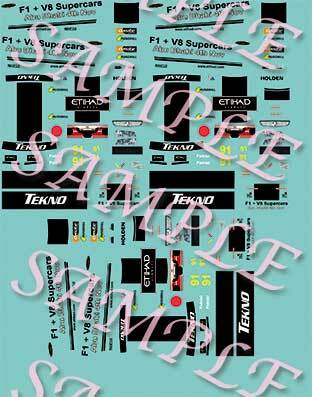 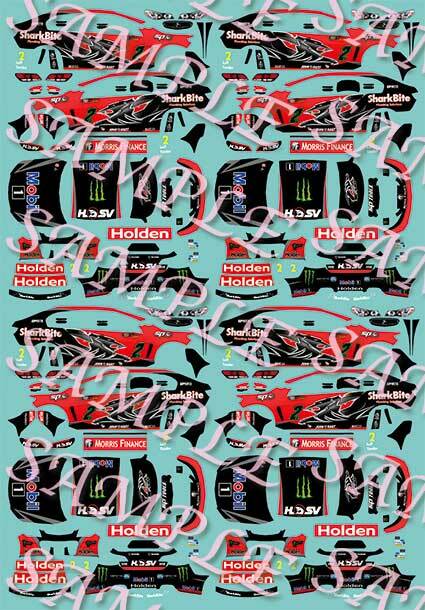 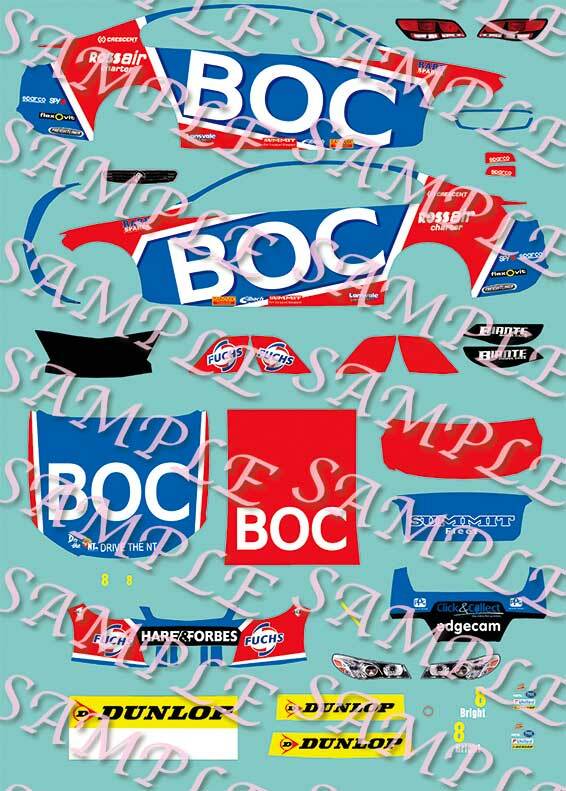 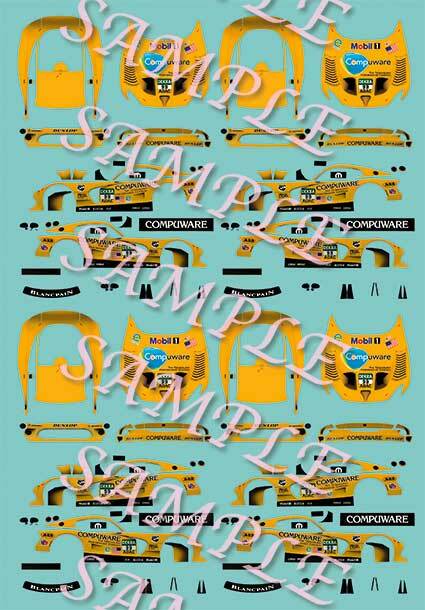 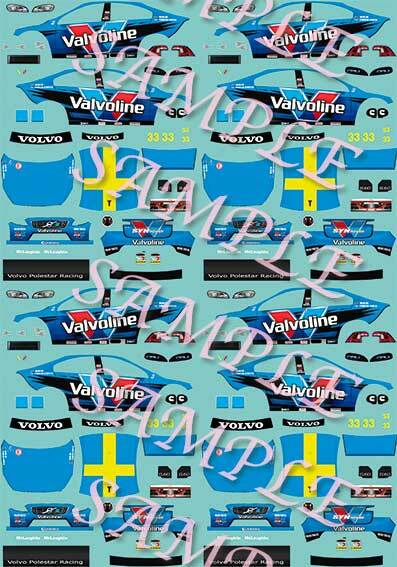 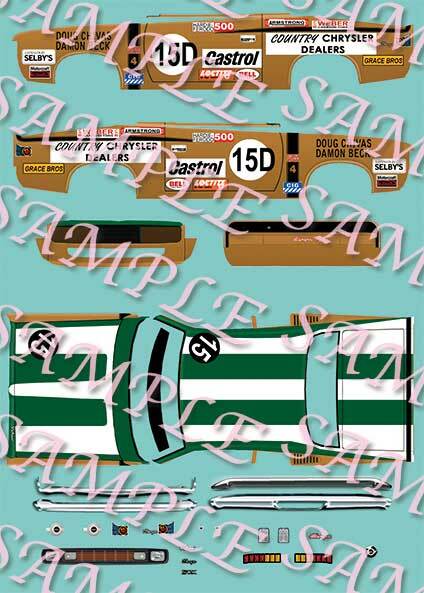 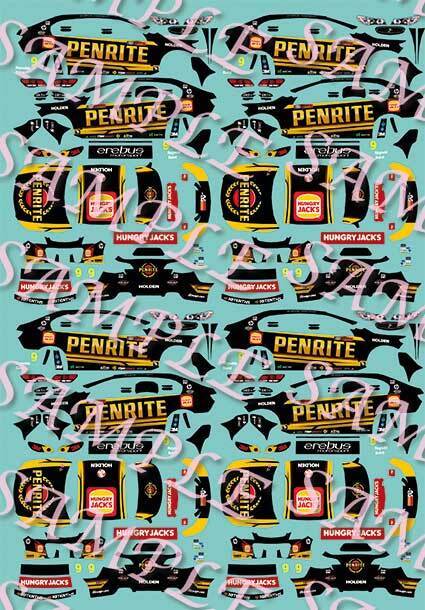 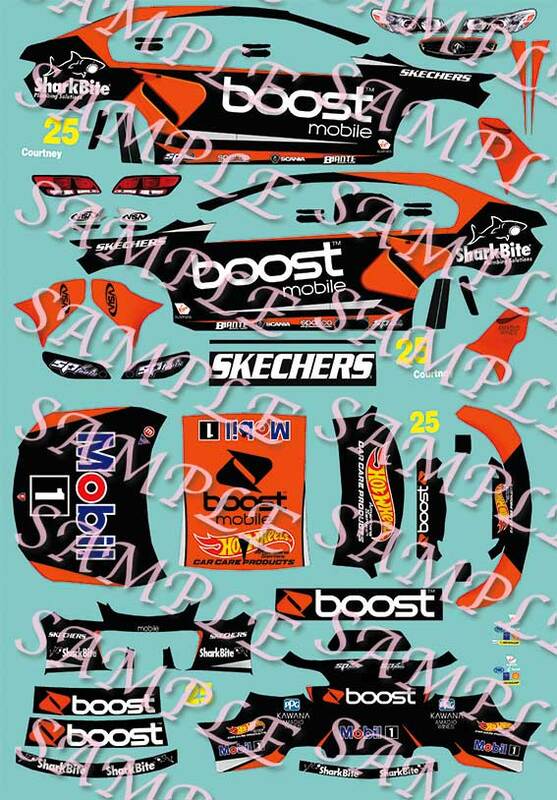 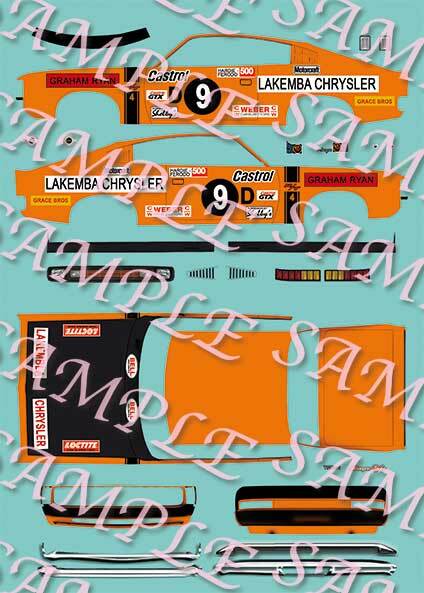 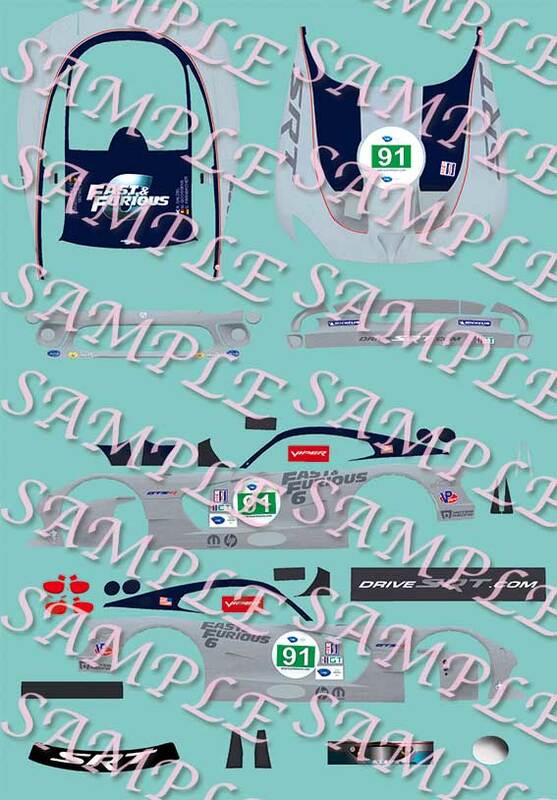 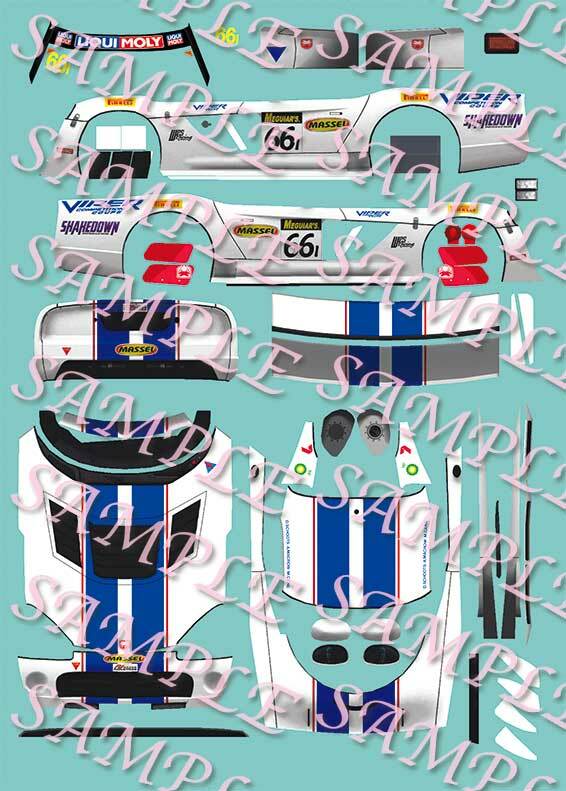 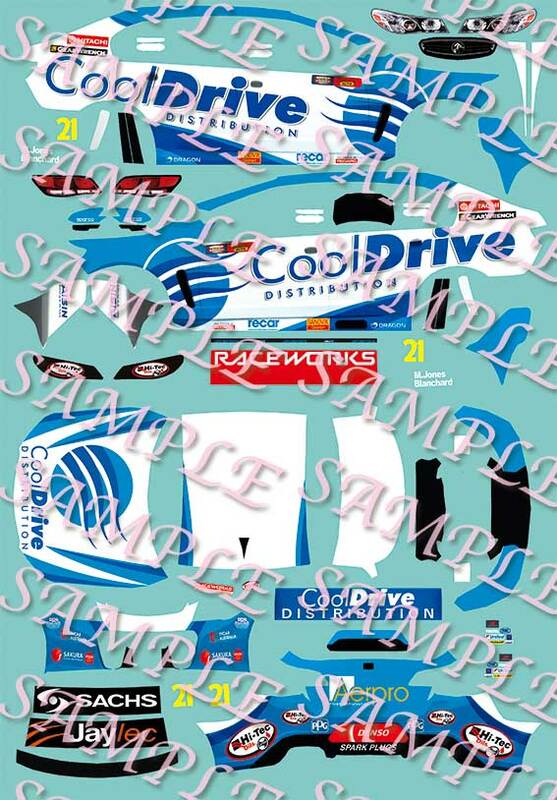 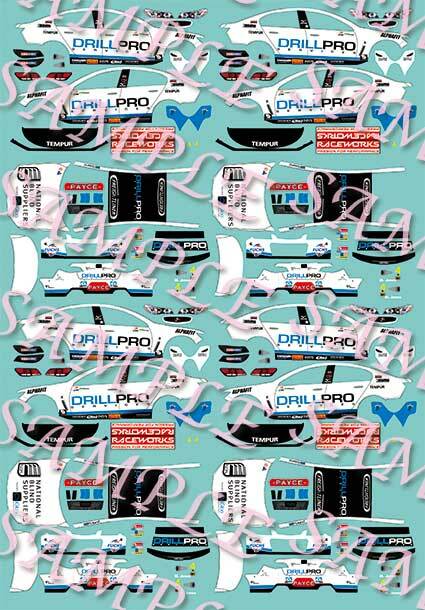 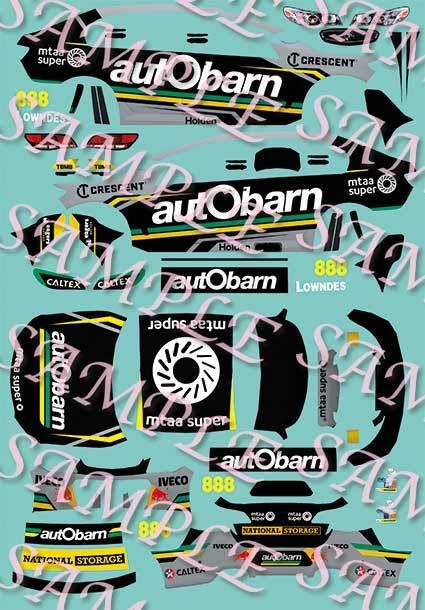 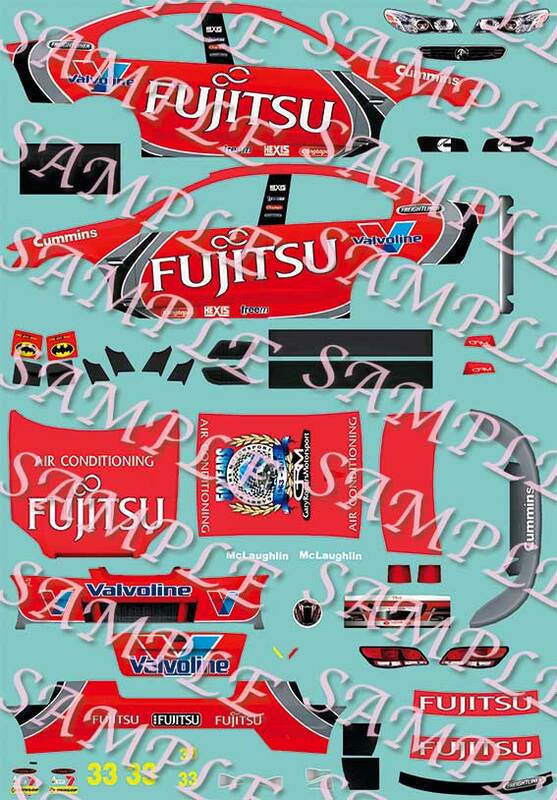 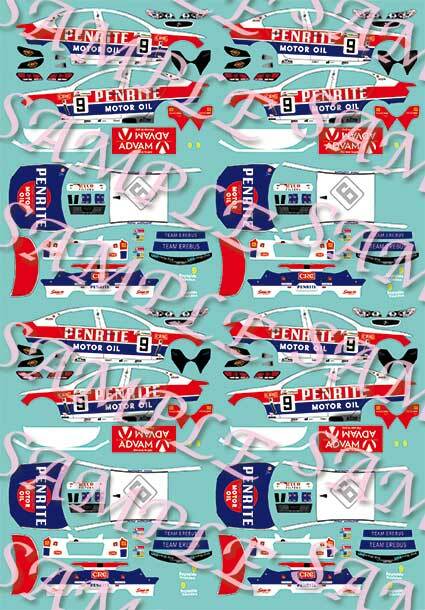 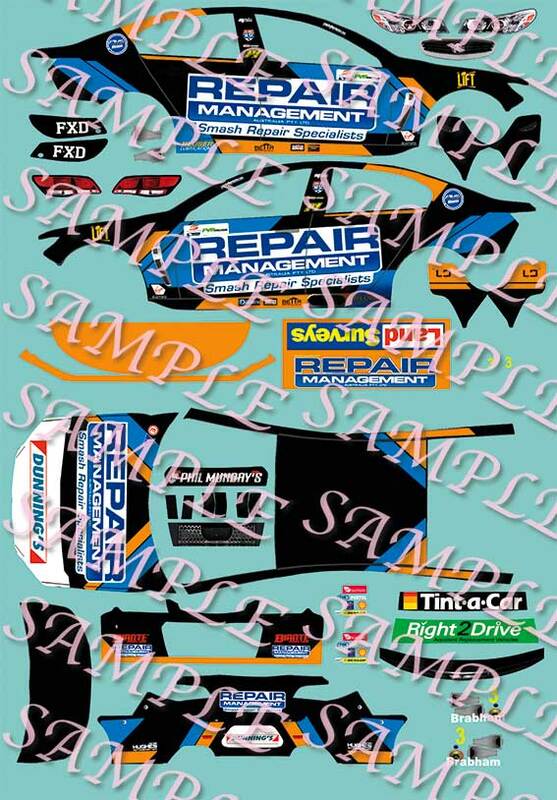 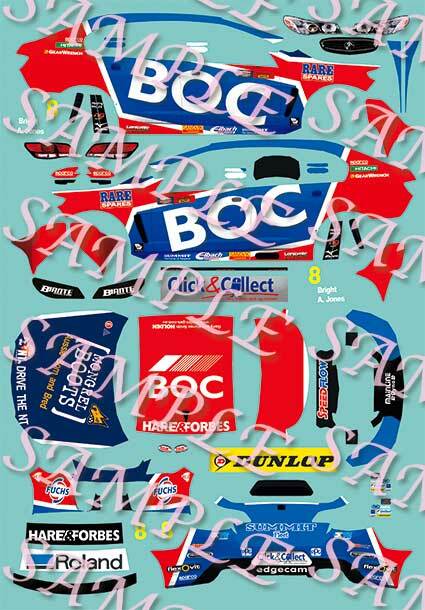 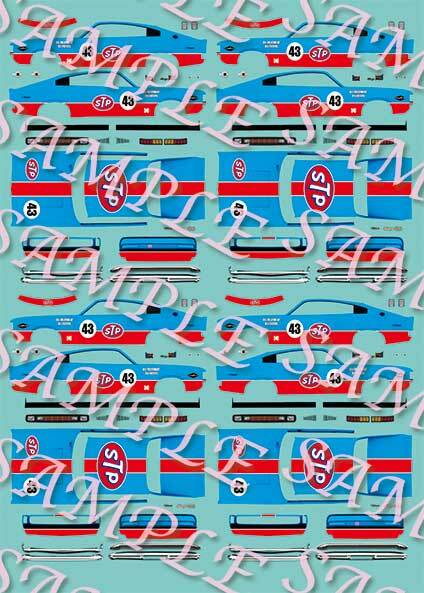 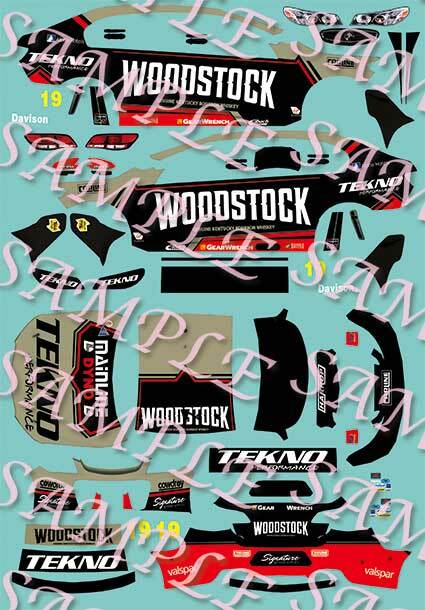 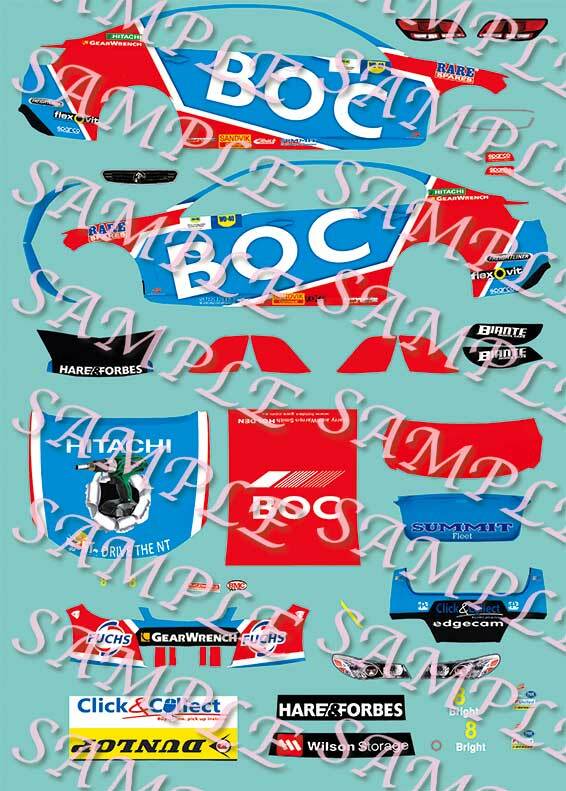 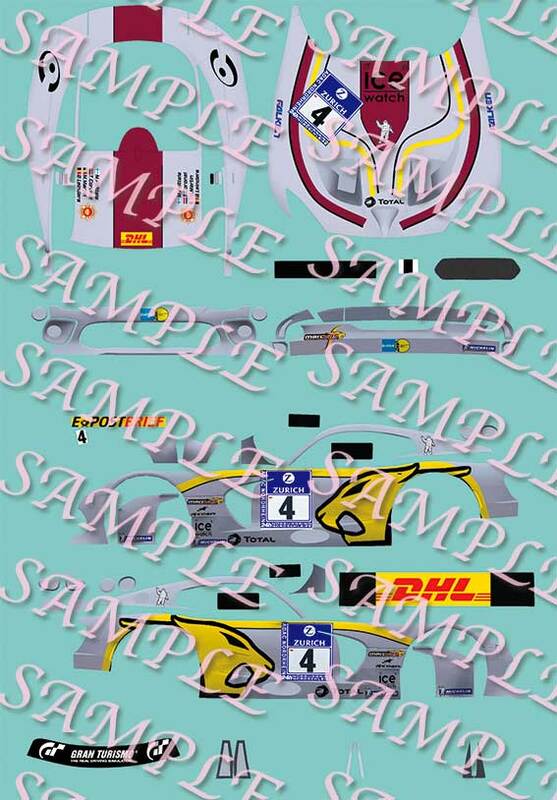 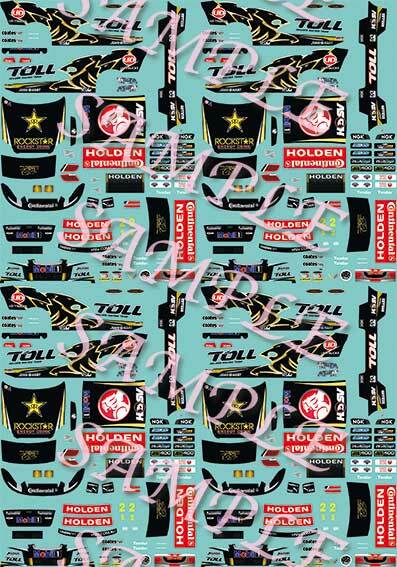 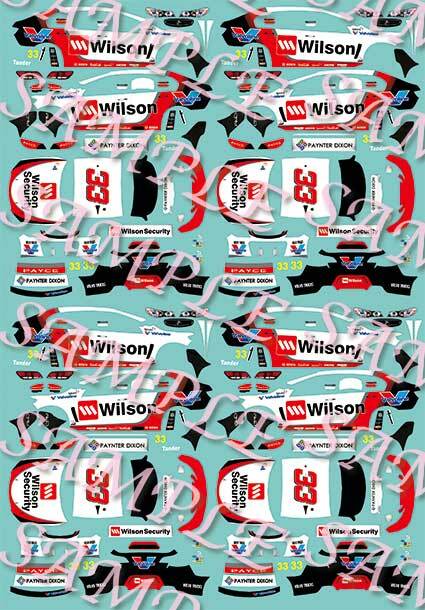 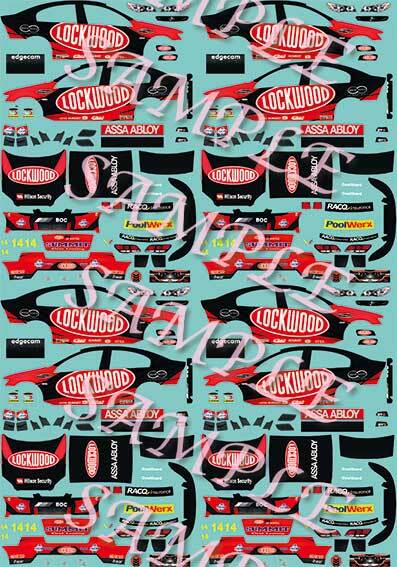 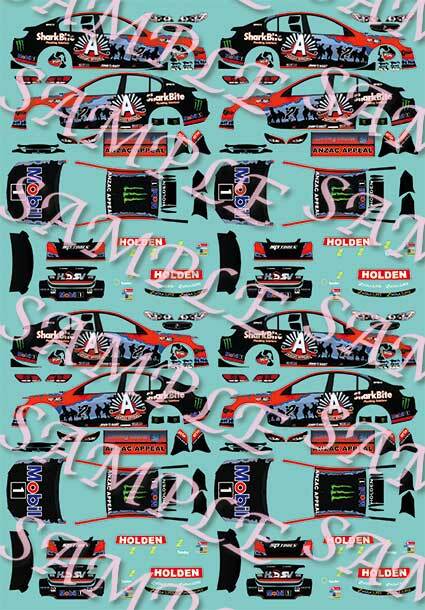 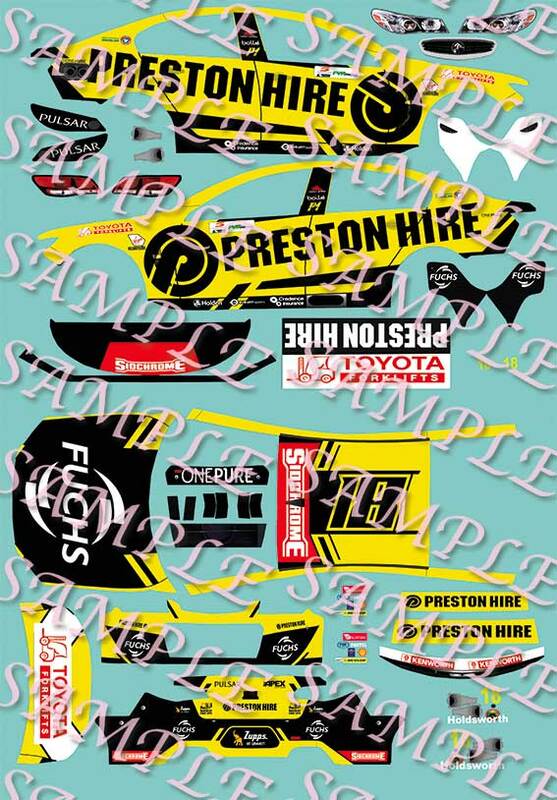 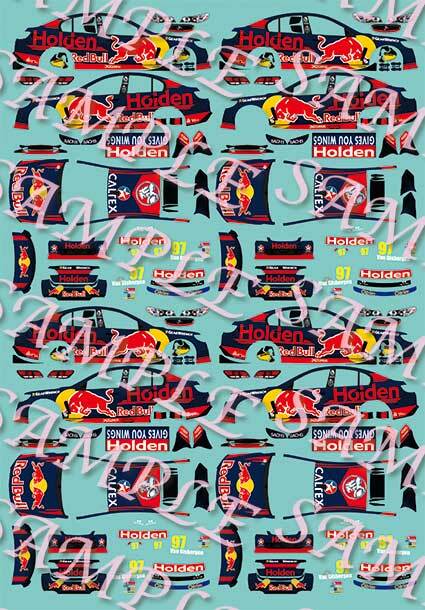 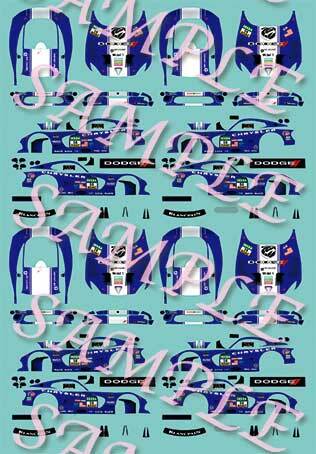 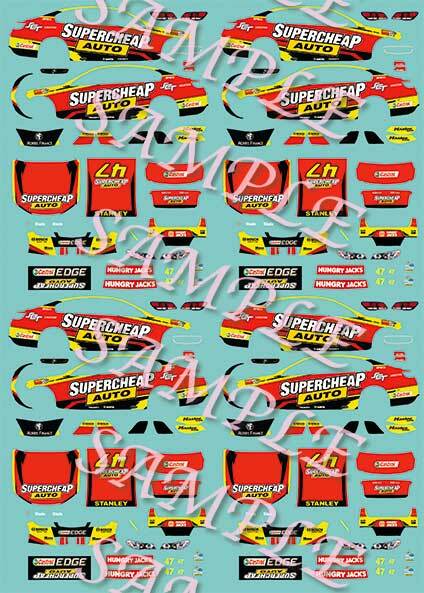 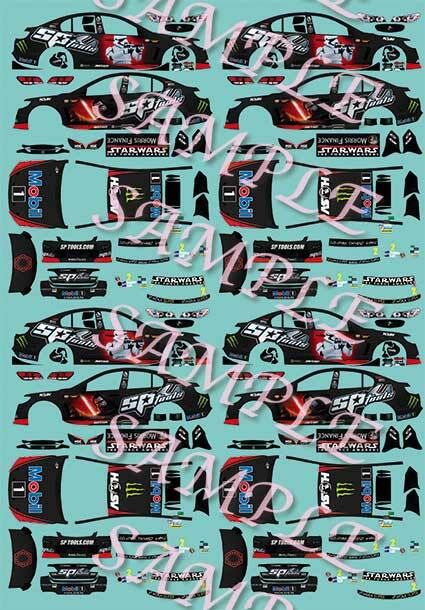 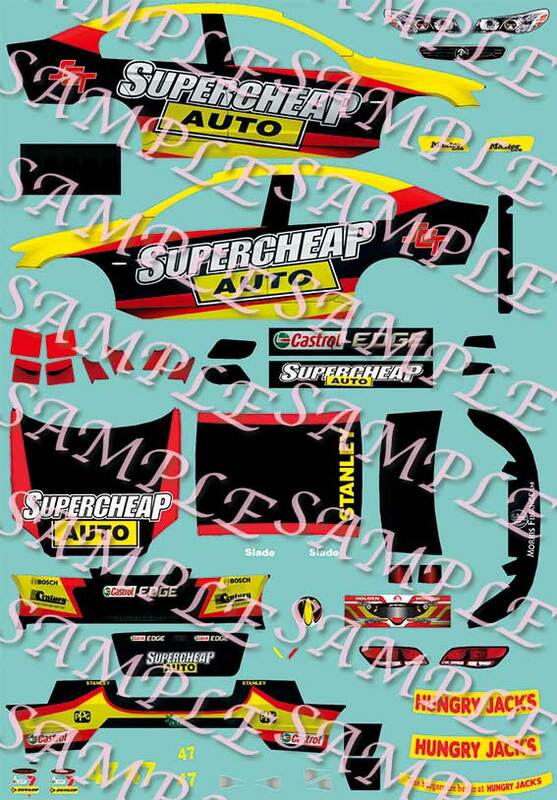 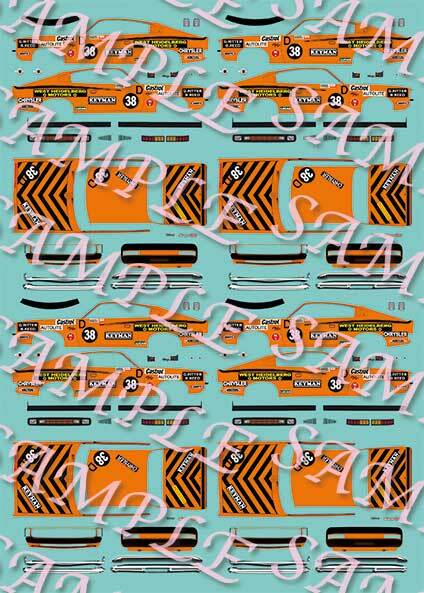 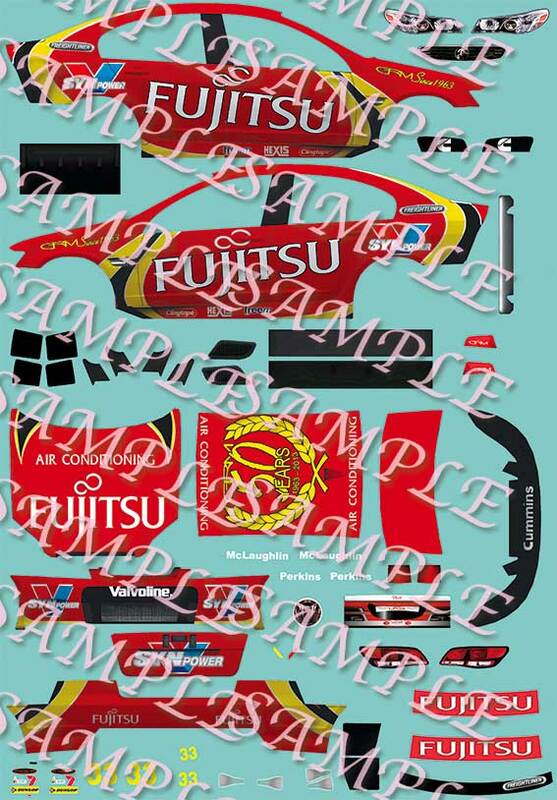 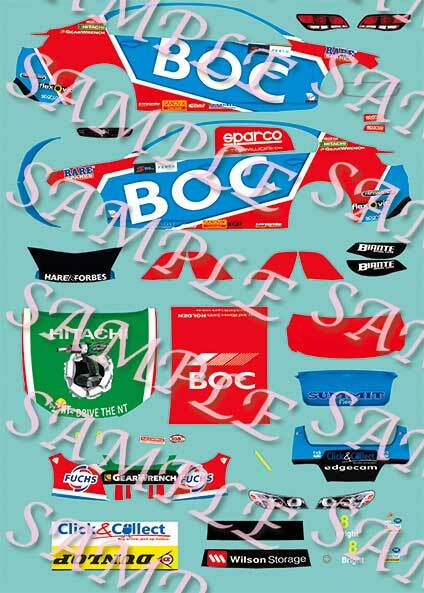 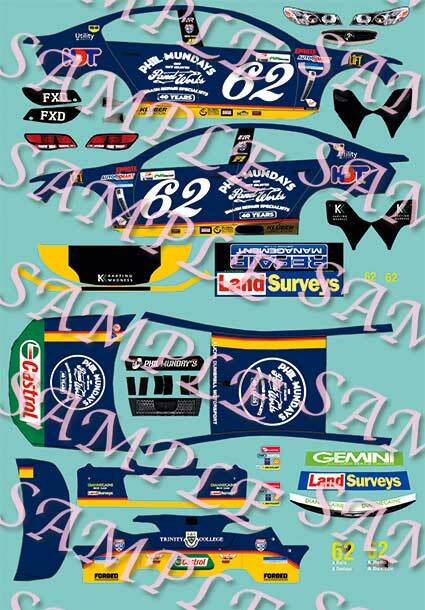 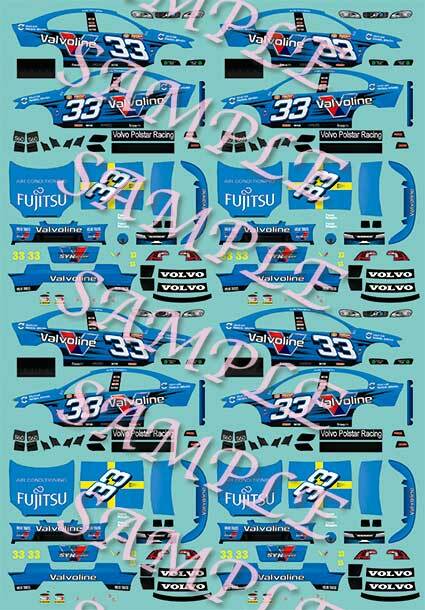 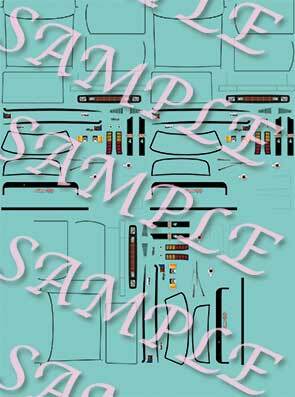 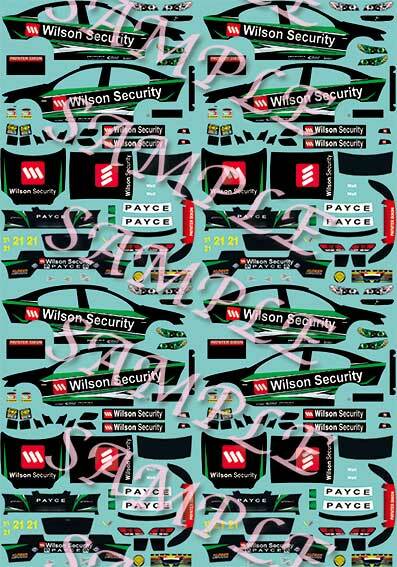 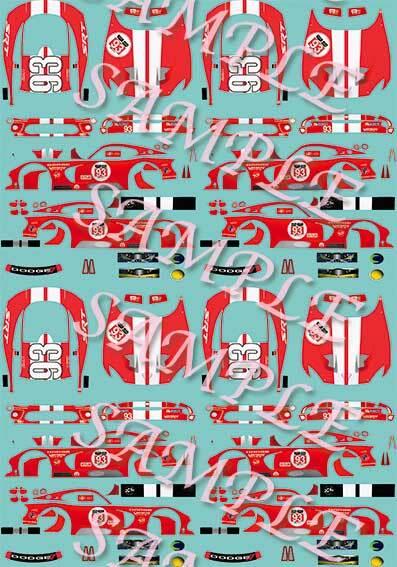 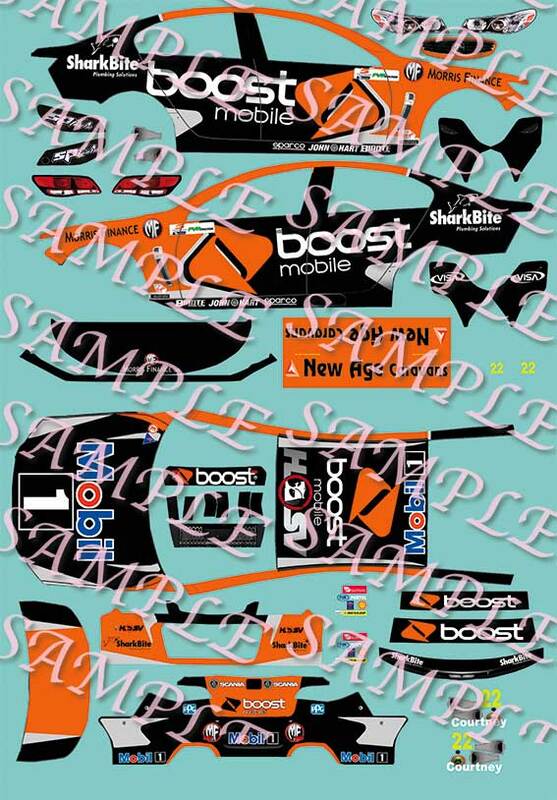 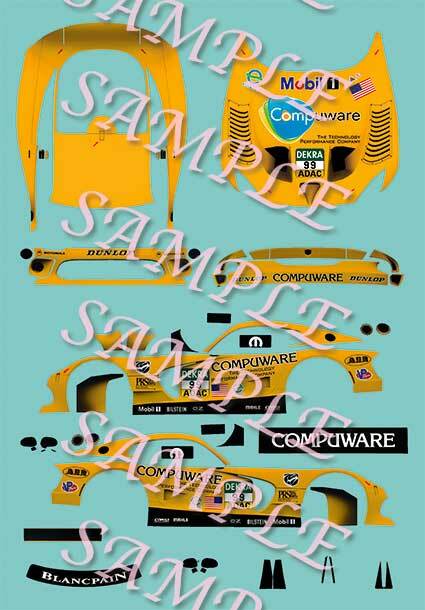 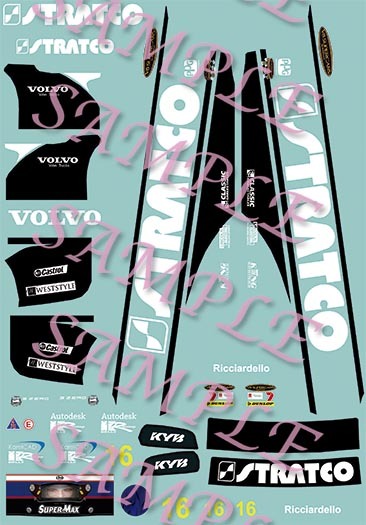 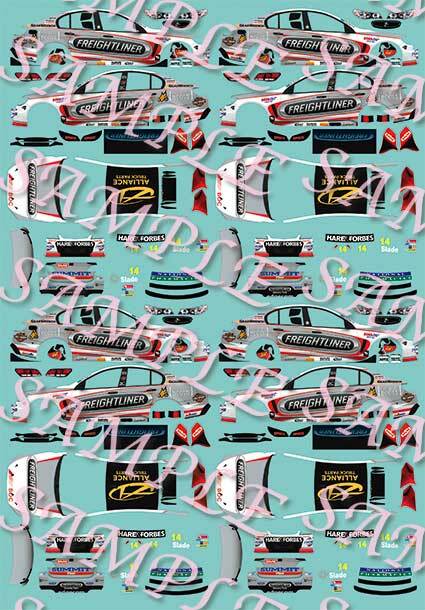 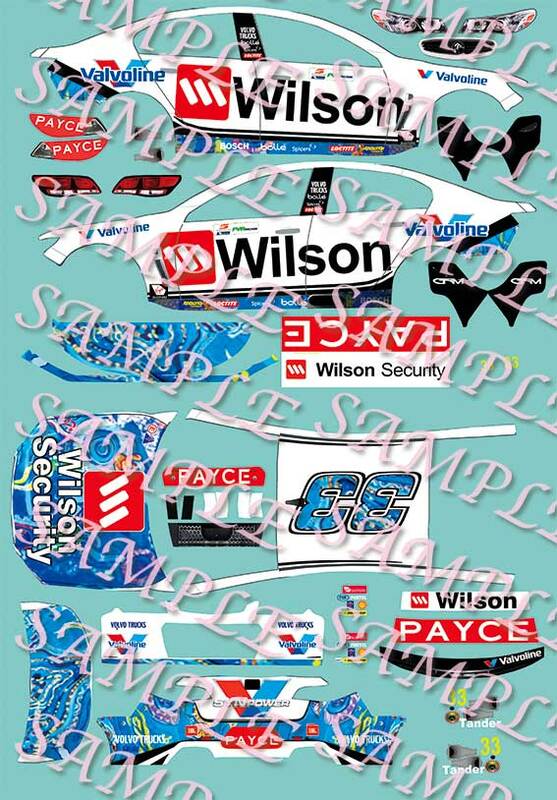 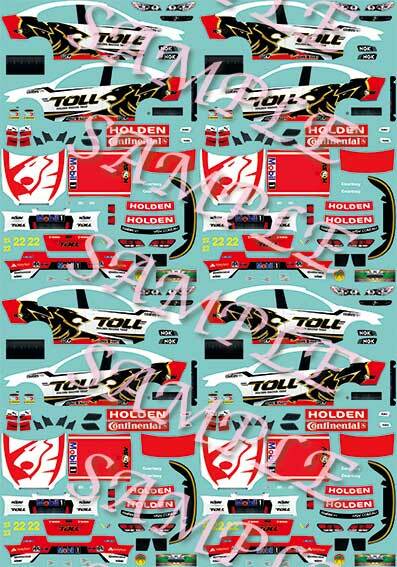 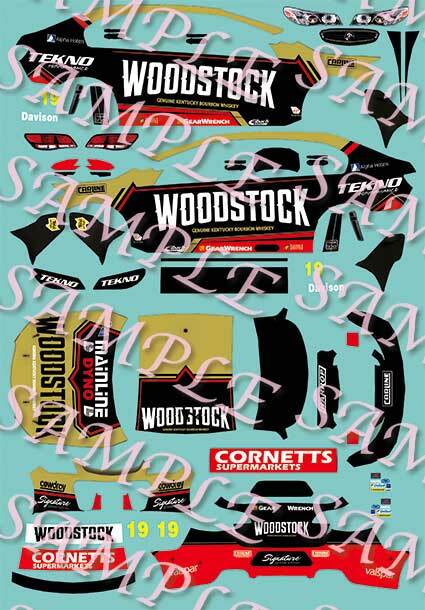 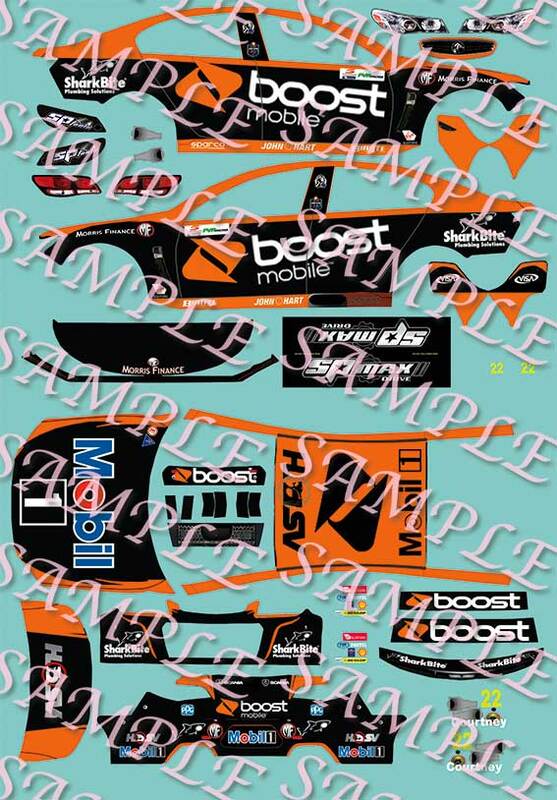 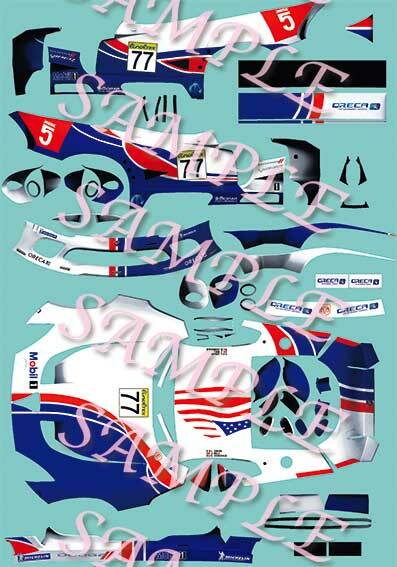 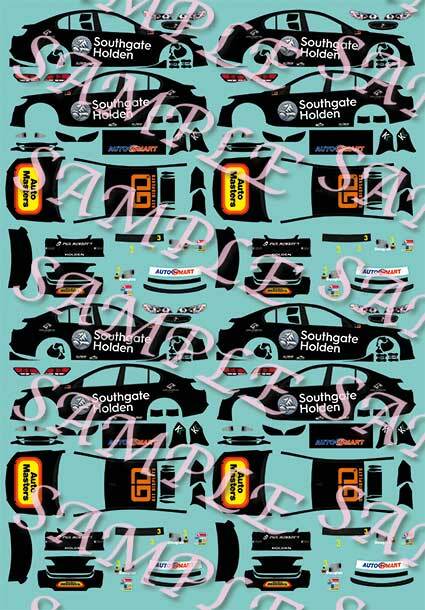 Due to space limitations I dont have previews for the 1/10, 1/12, 1/18 or 1/43, but you can what they look like from the 1/24 decal. 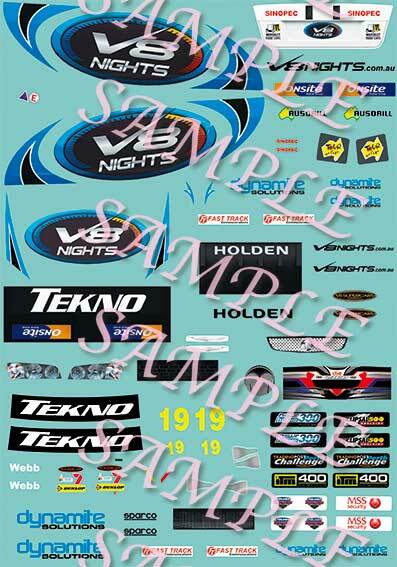 All prices shown are in Australian Dollars(Australian Residents must add 10% GST). 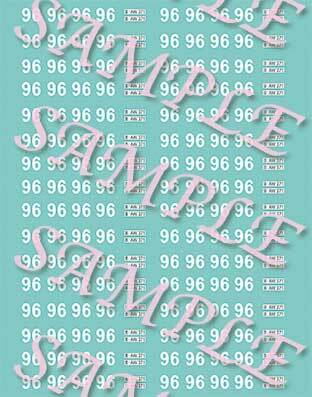 To find out what this is in your currency use this CURRENCY CONVERTER. 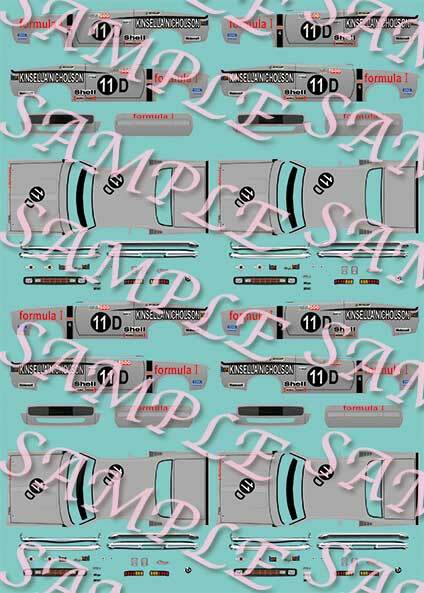 I can also do other scales not listed e.g 1/20 scale, 1/28. 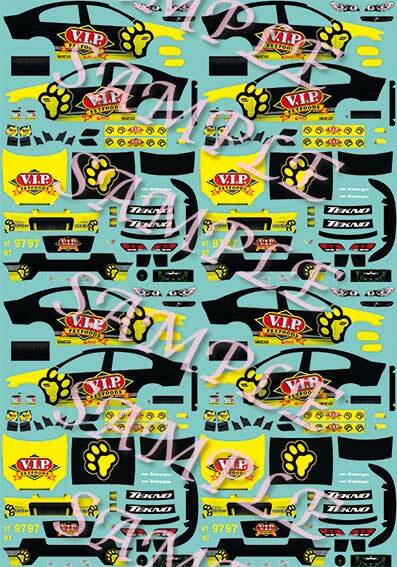 Ask me about the availabilty. 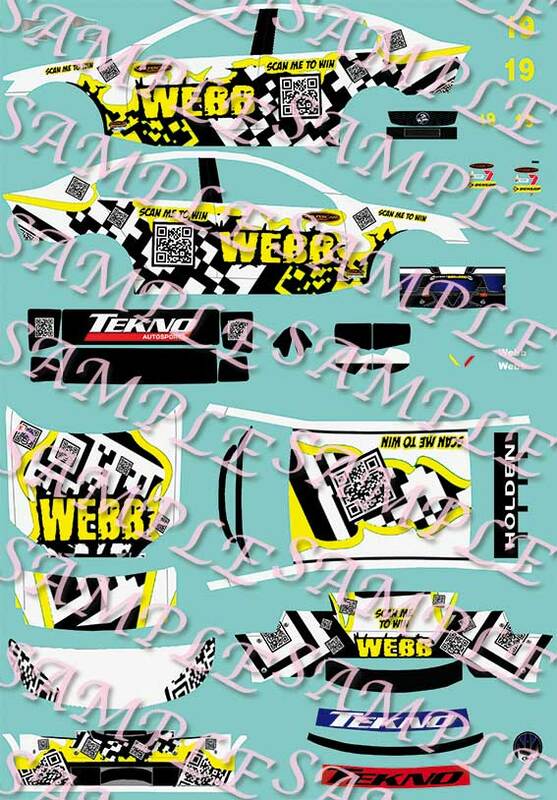 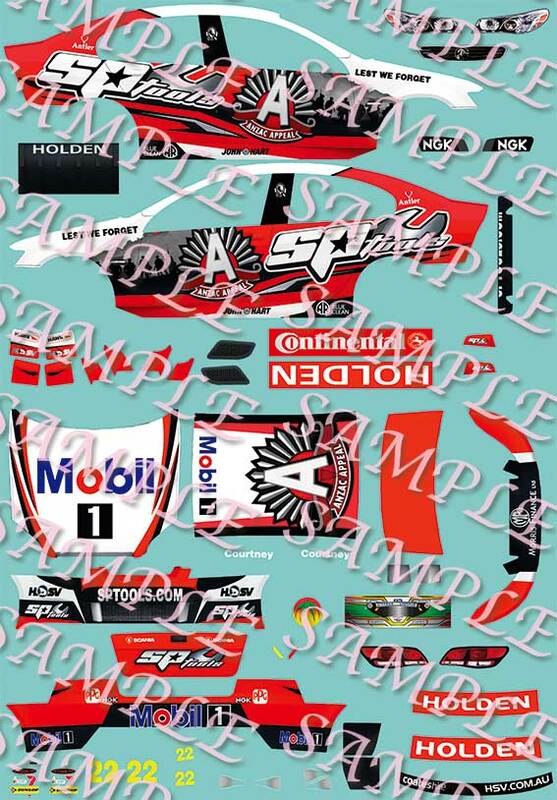 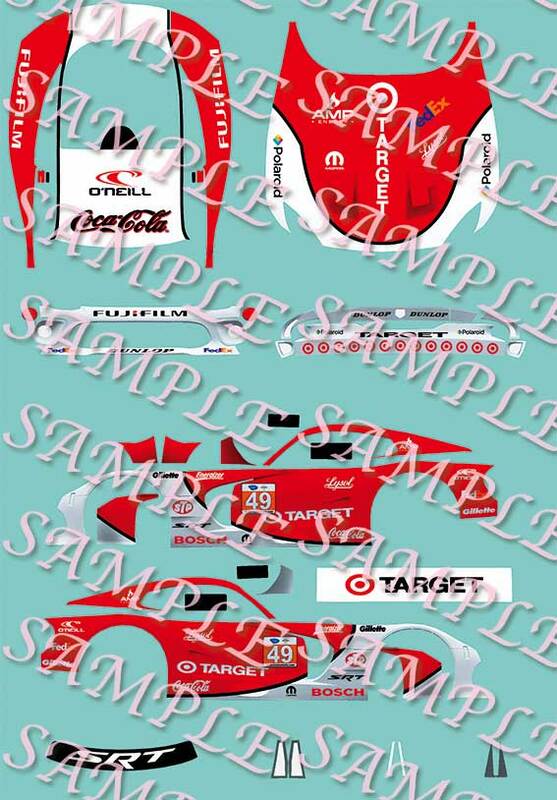 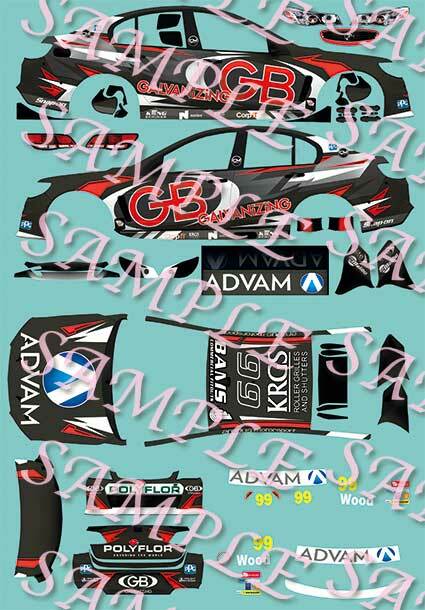 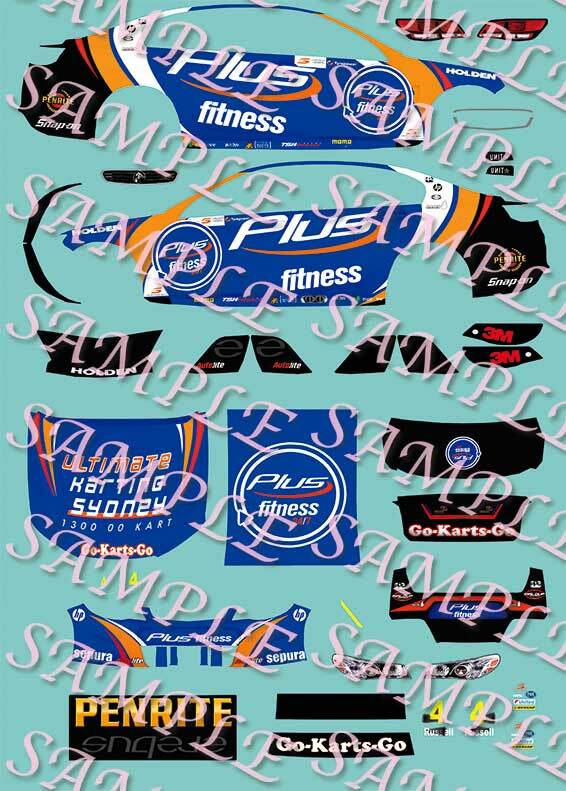 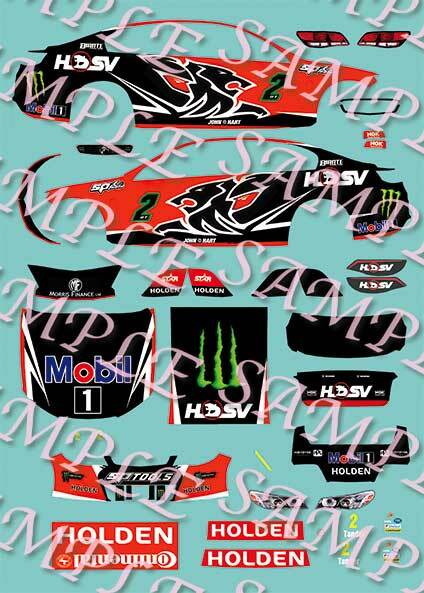 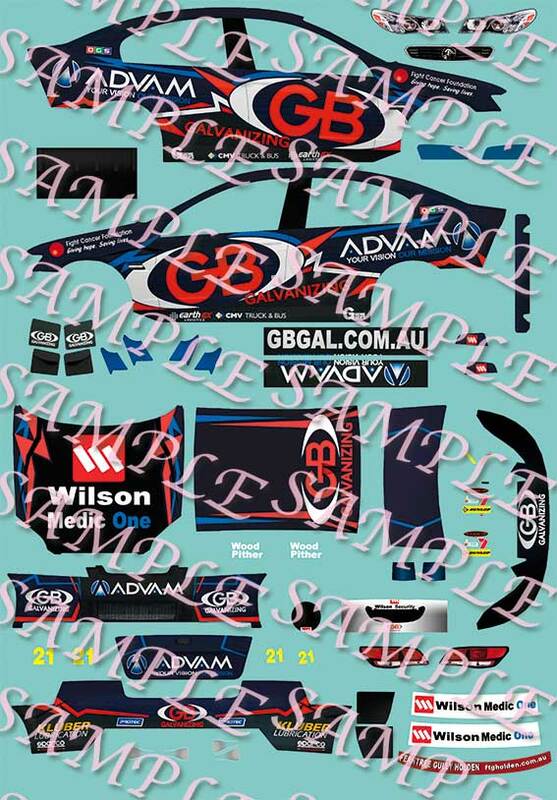 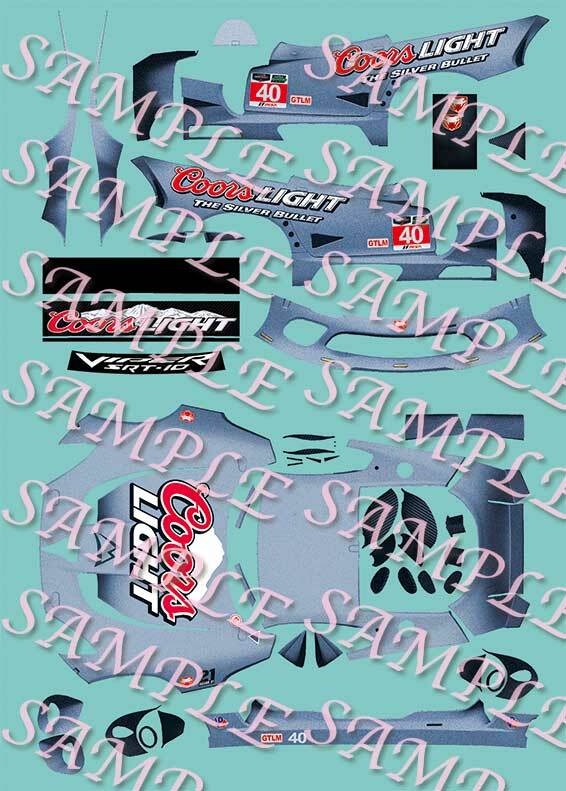 I can even custom fit to your model. 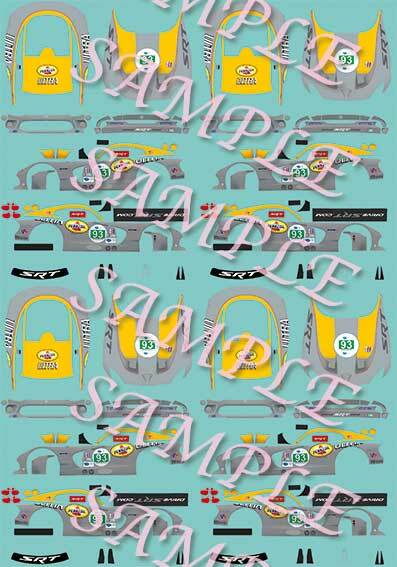 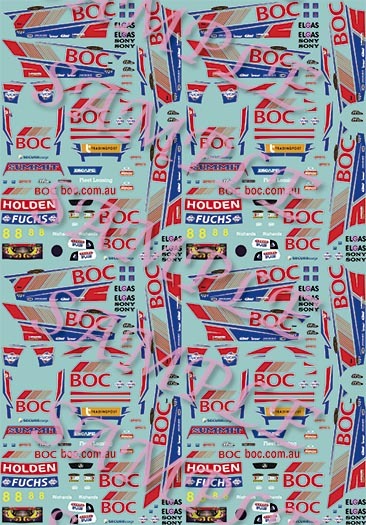 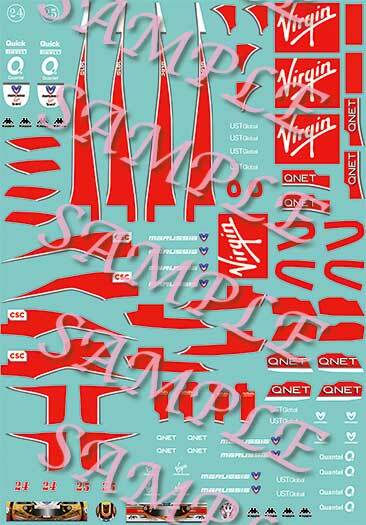 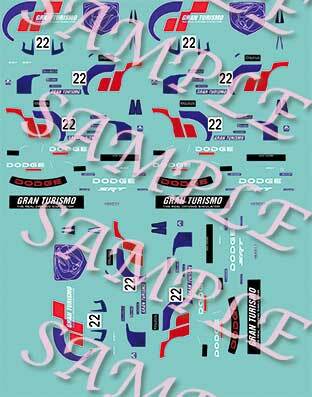 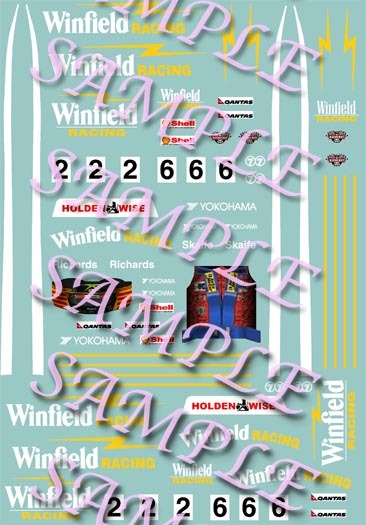 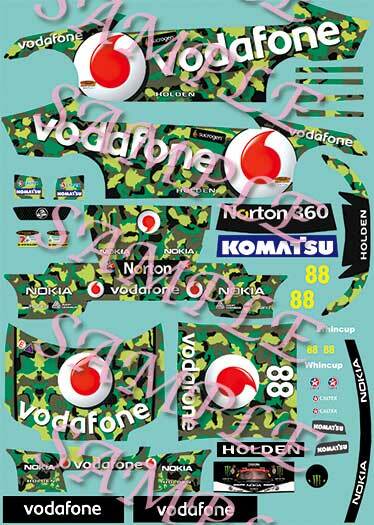 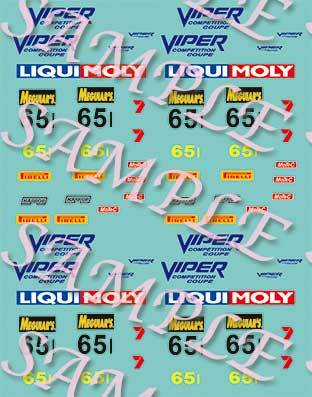 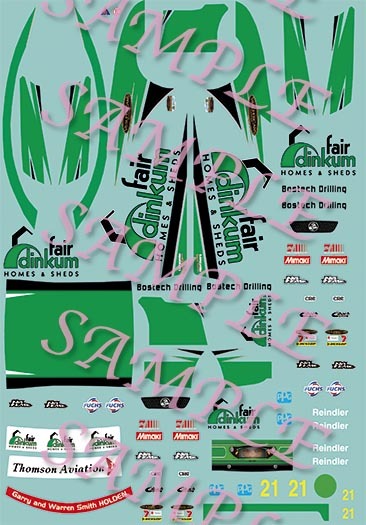 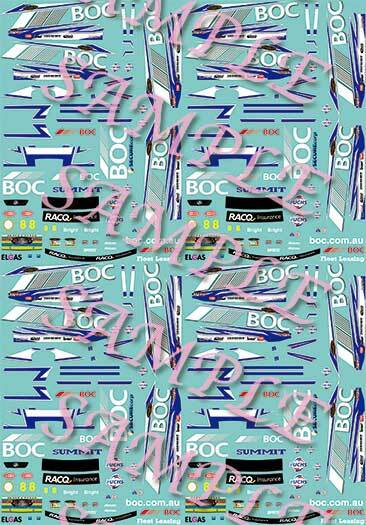 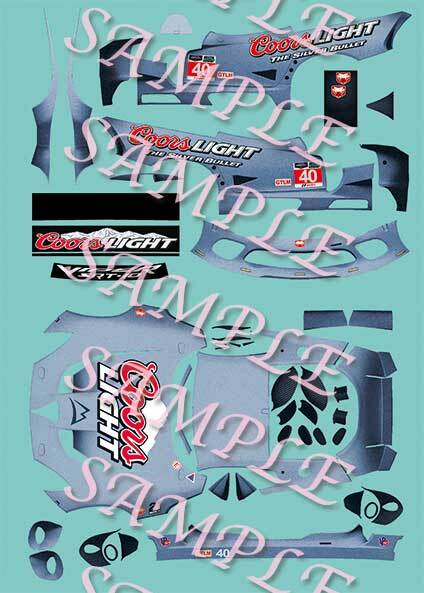 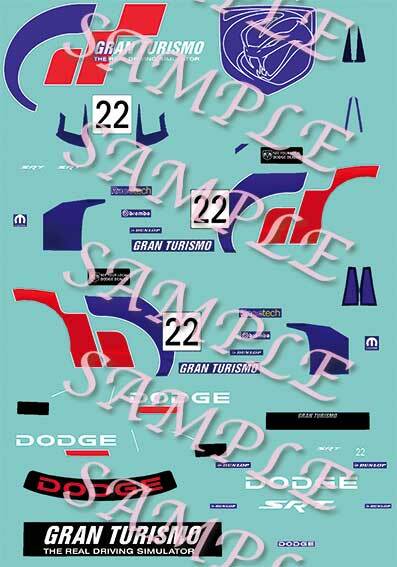 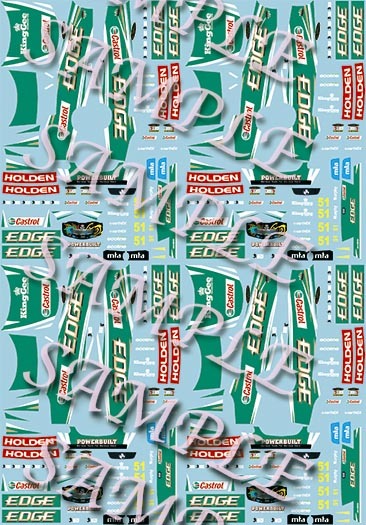 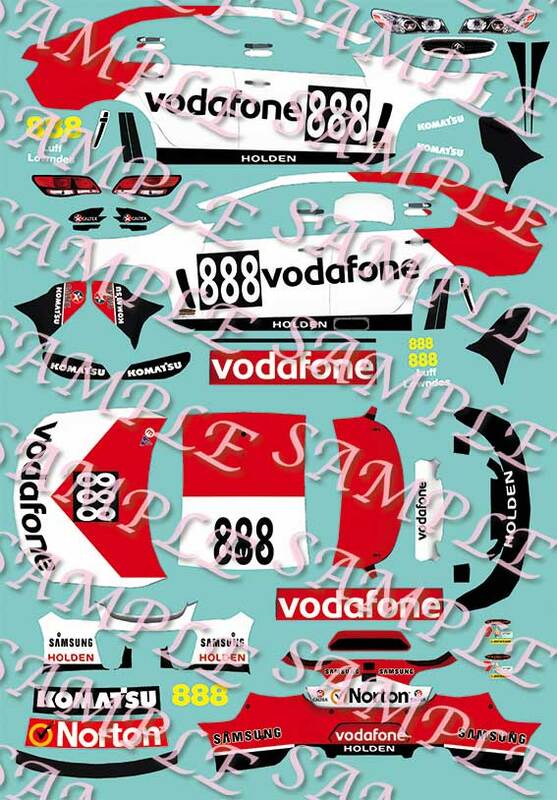 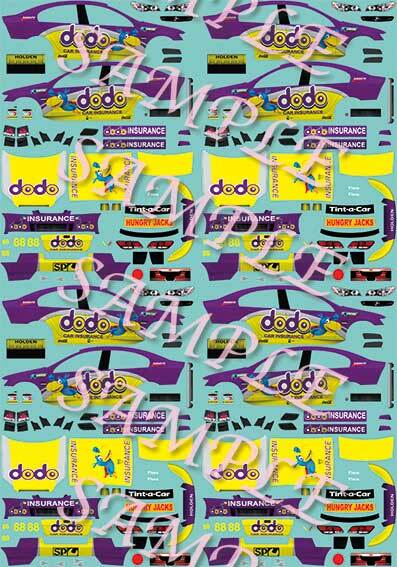 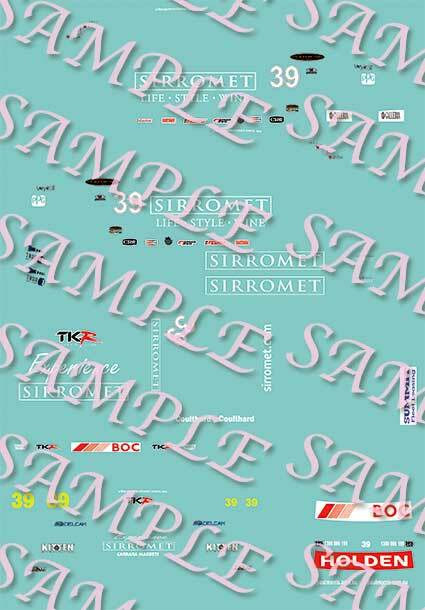 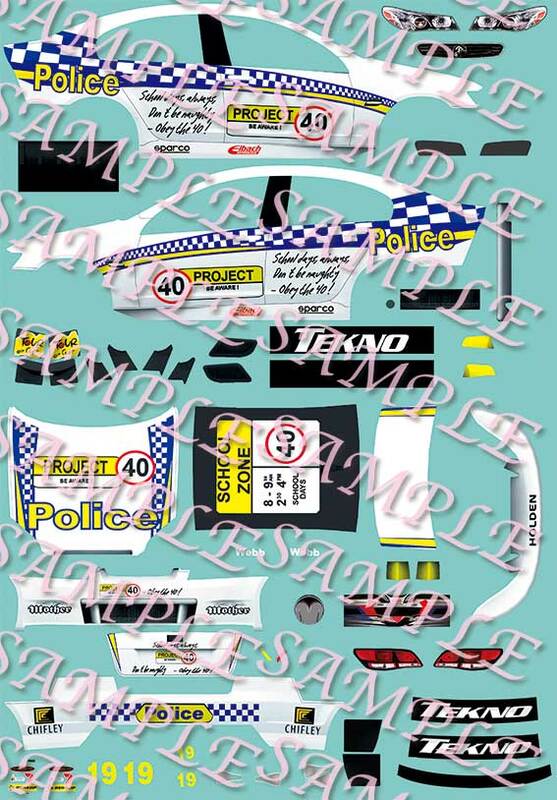 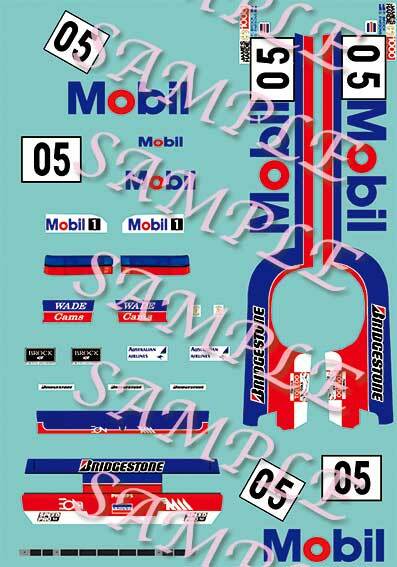 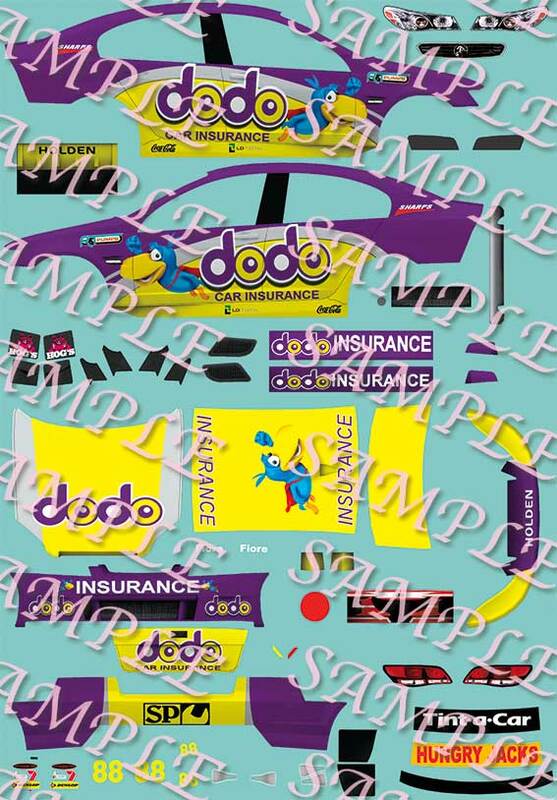 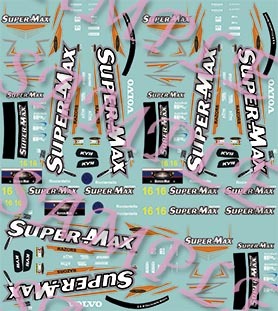 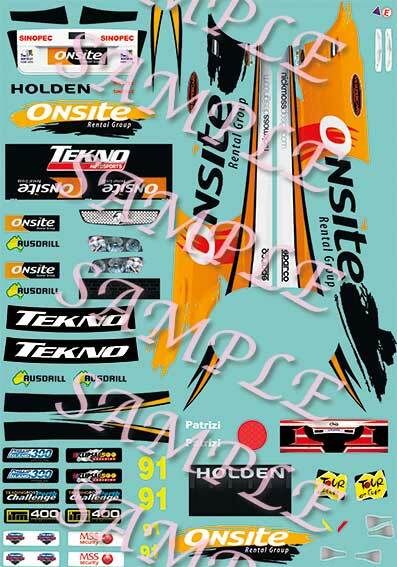 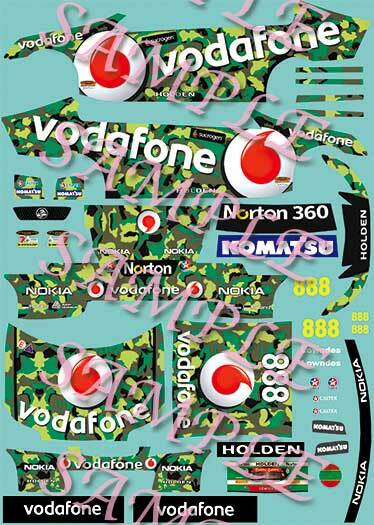 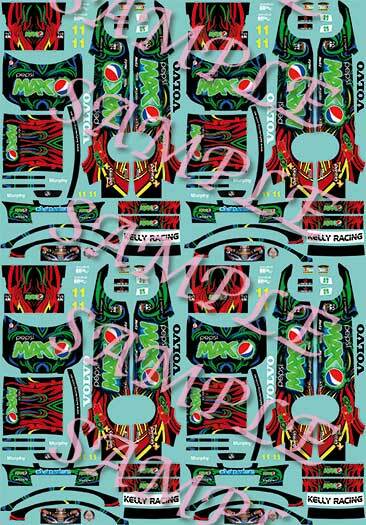 Please note that waterslide decals are not really suitable for 1/10 and 1/12 scale RC cars in most cases. 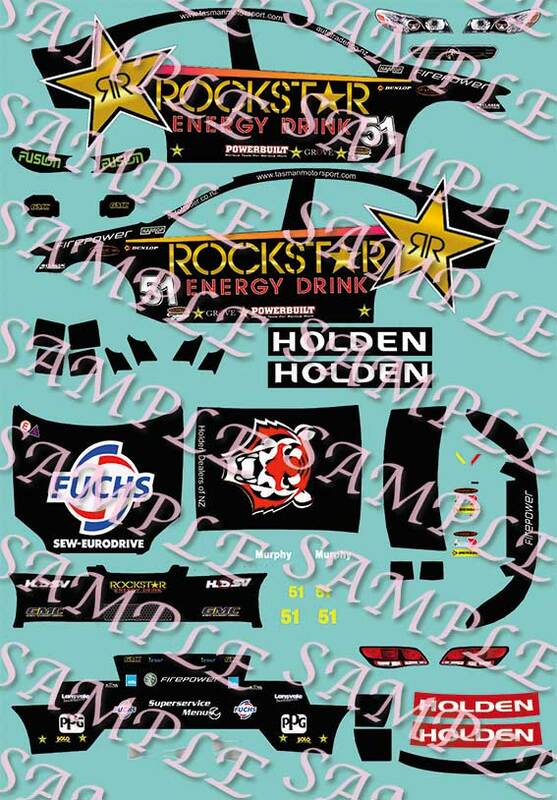 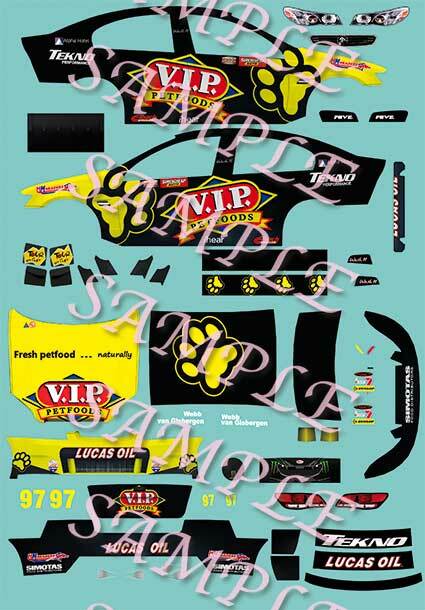 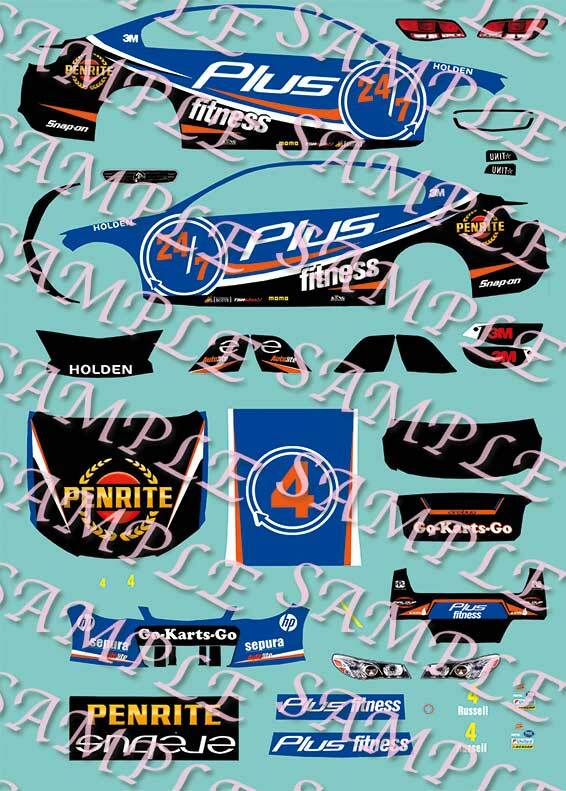 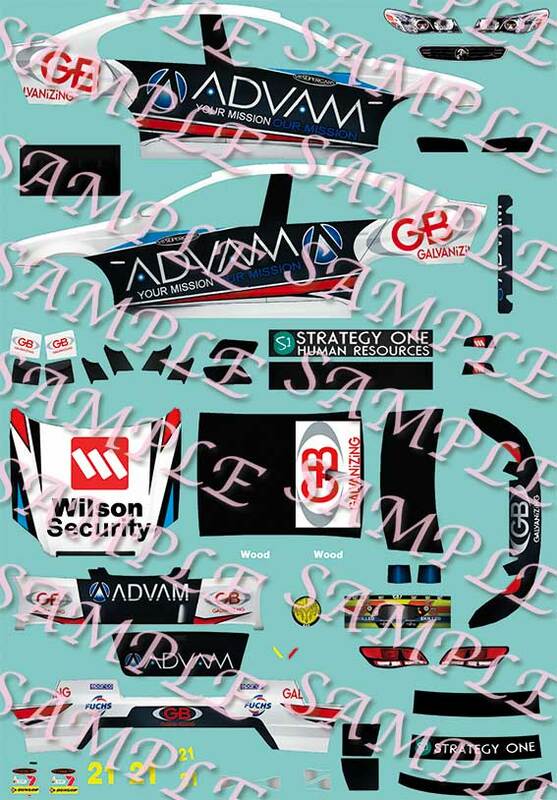 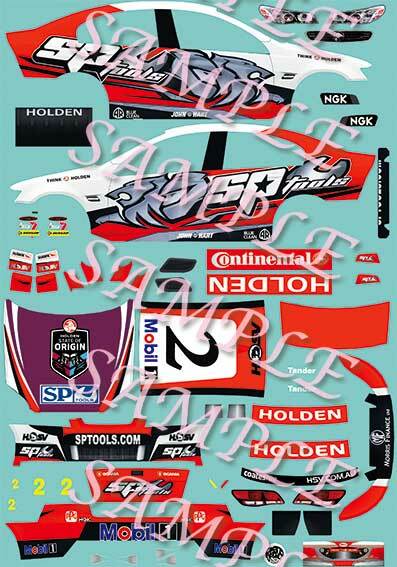 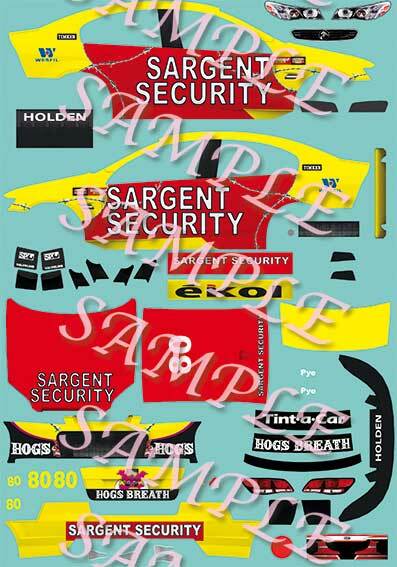 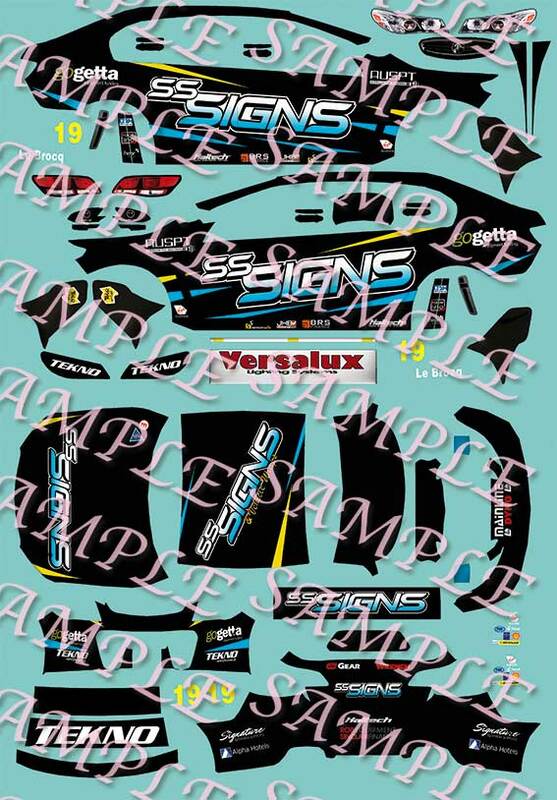 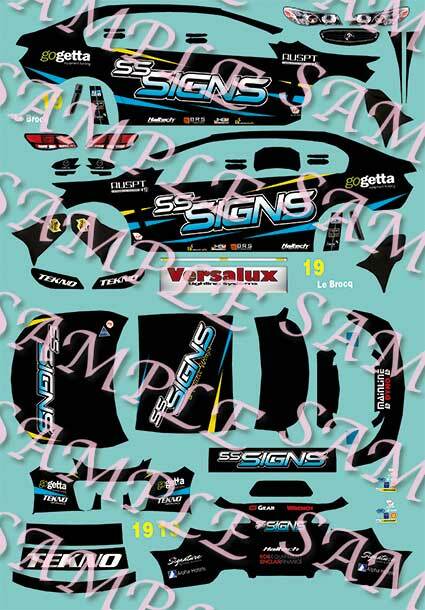 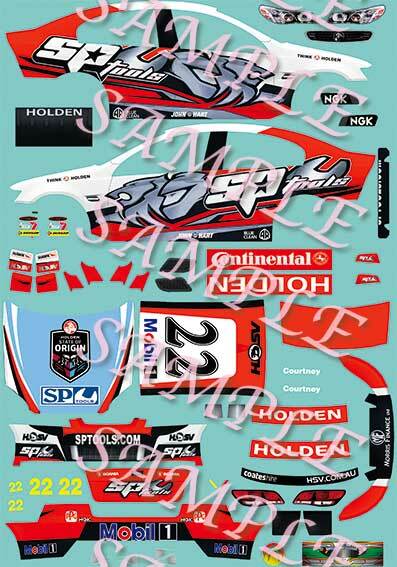 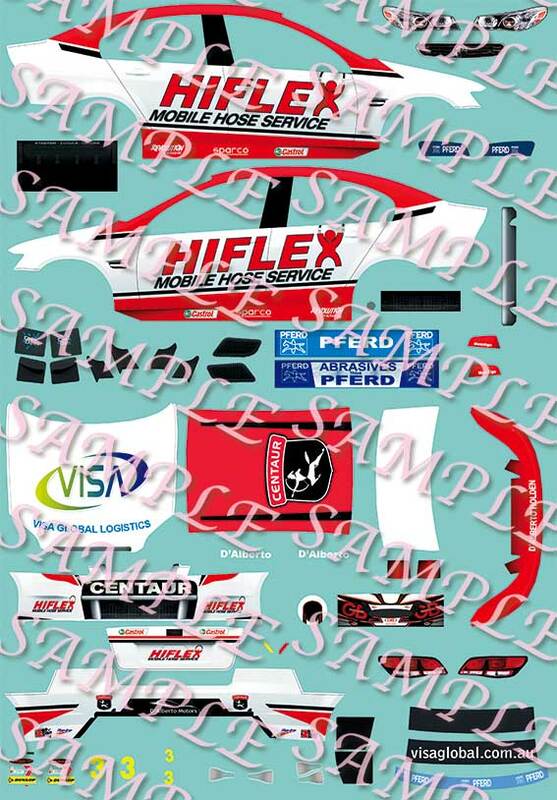 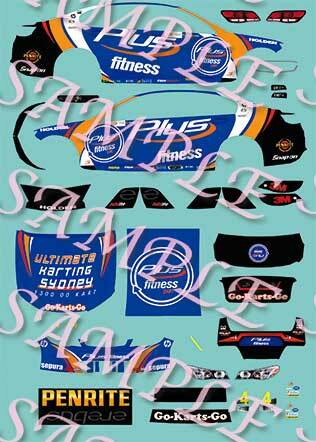 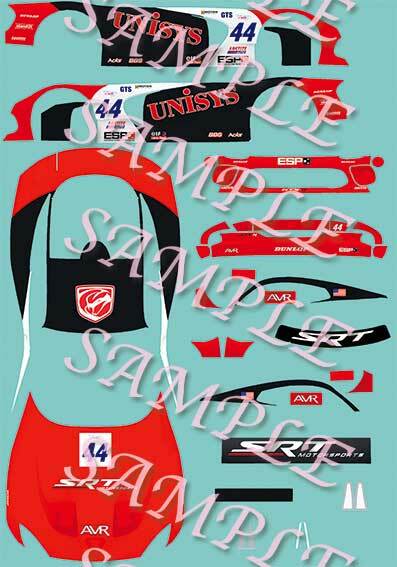 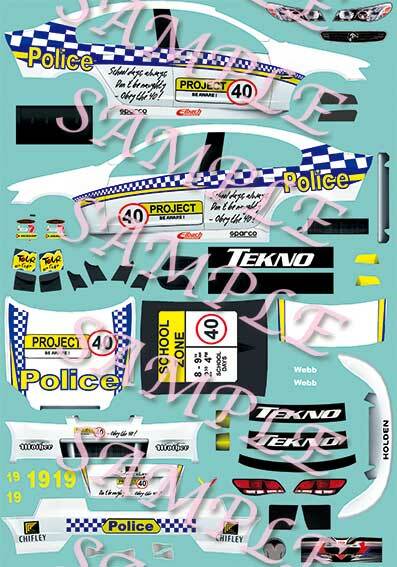 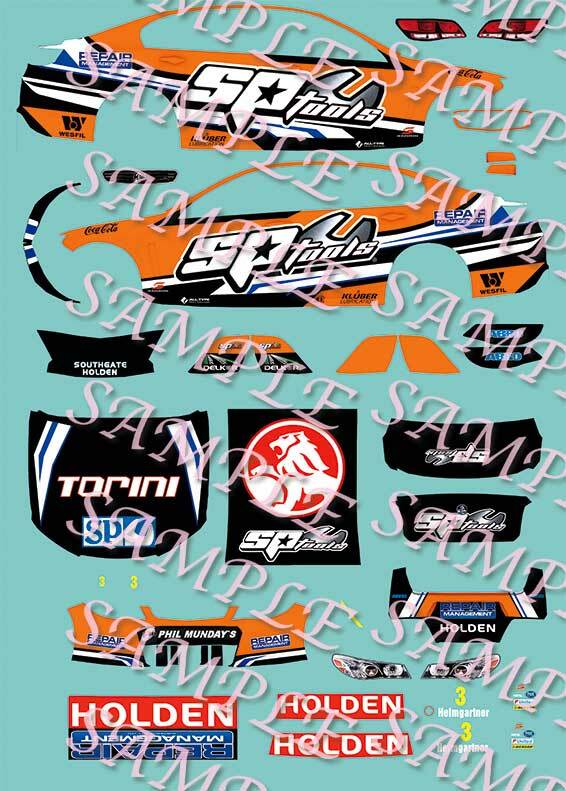 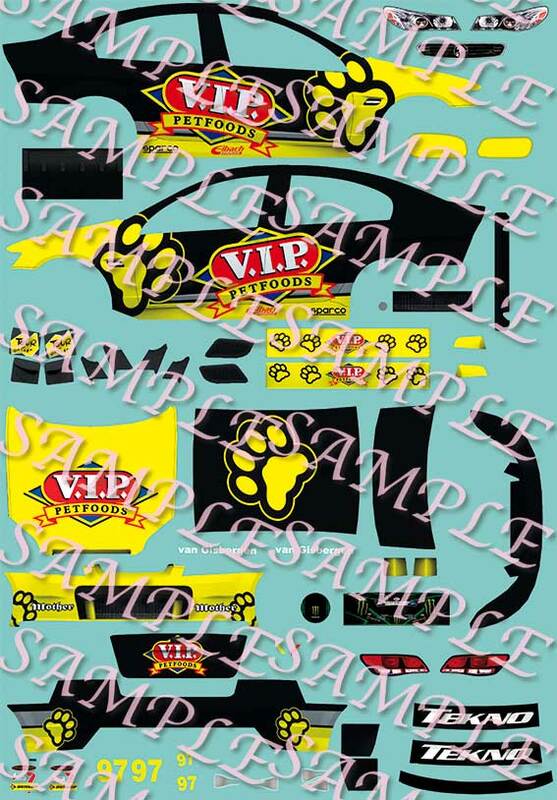 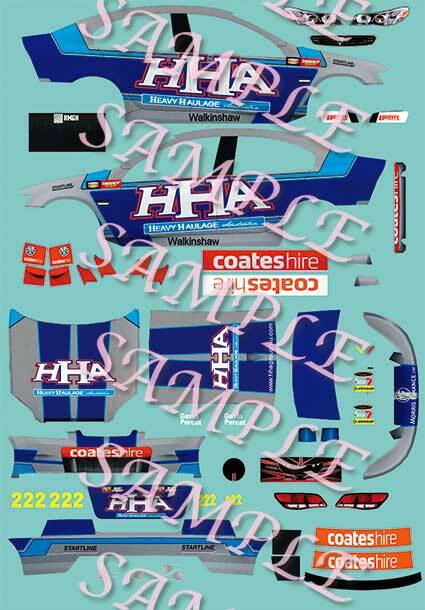 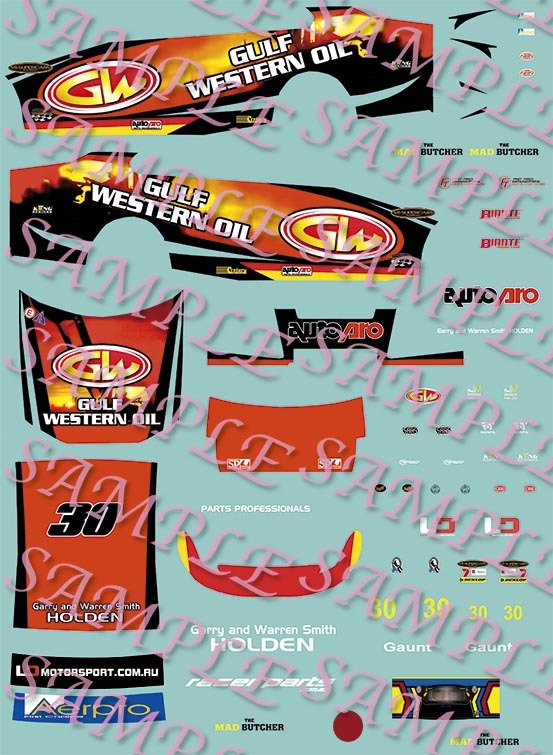 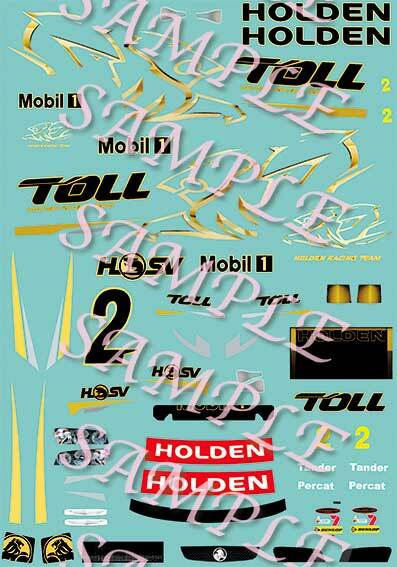 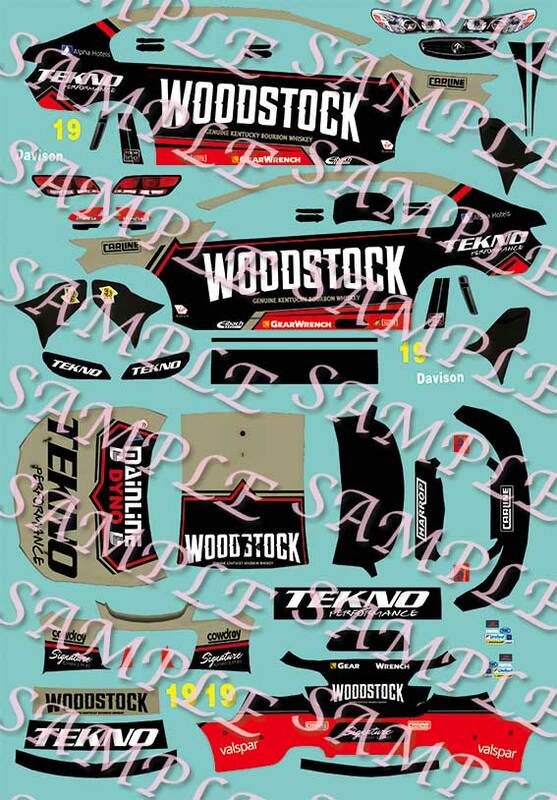 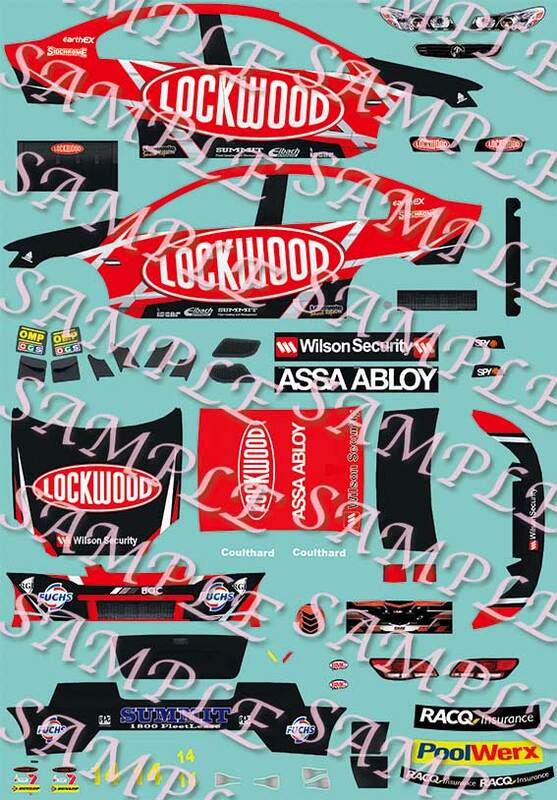 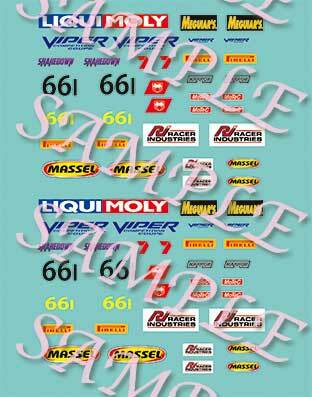 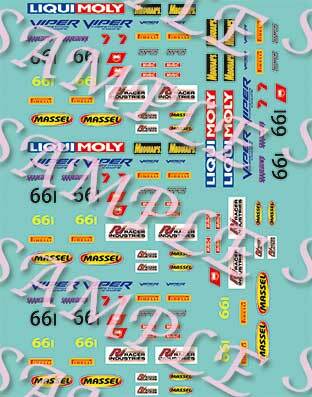 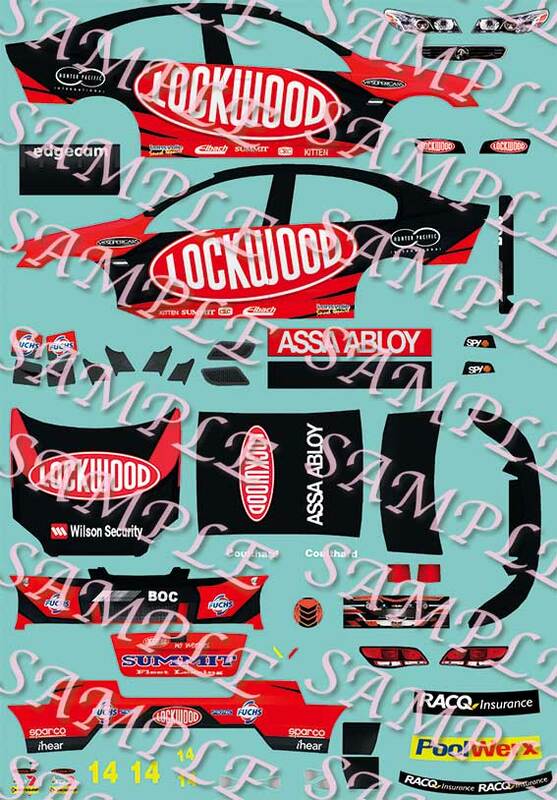 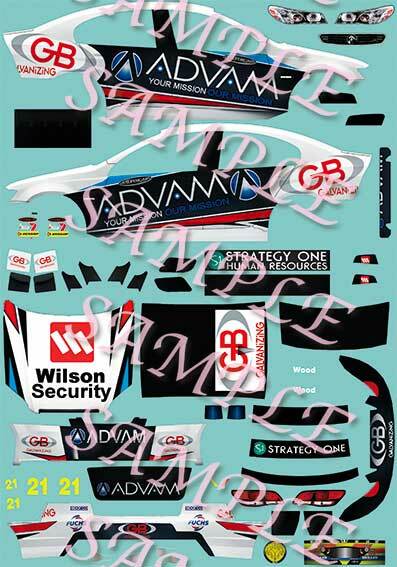 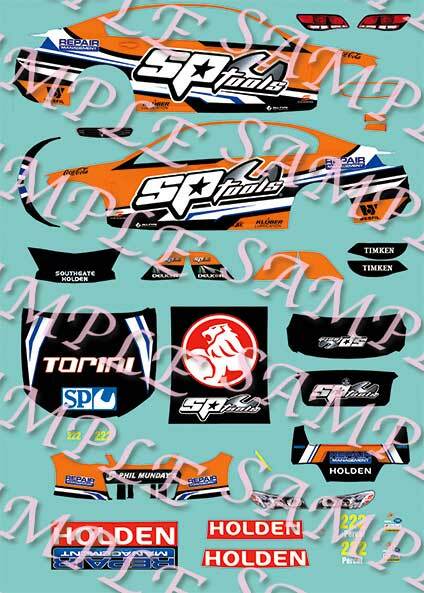 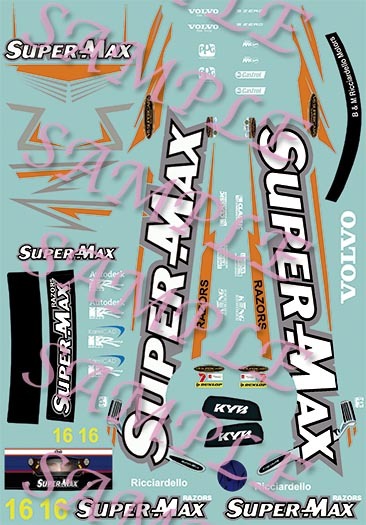 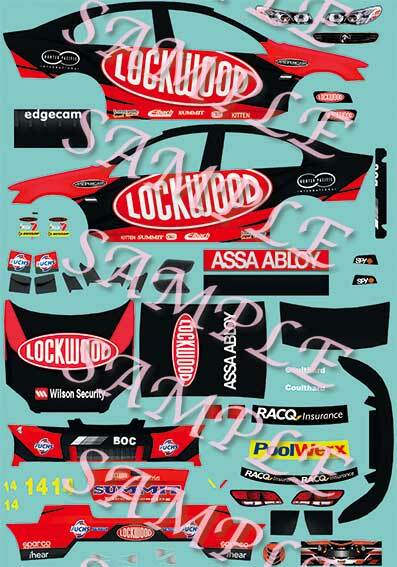 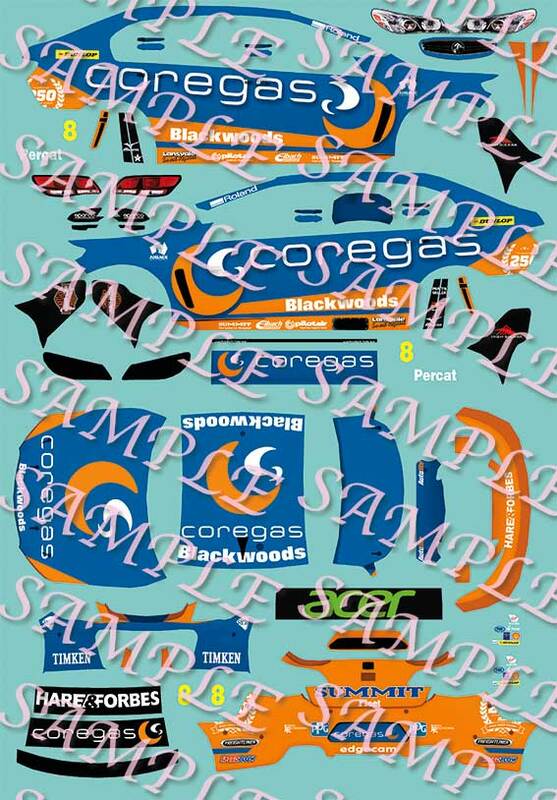 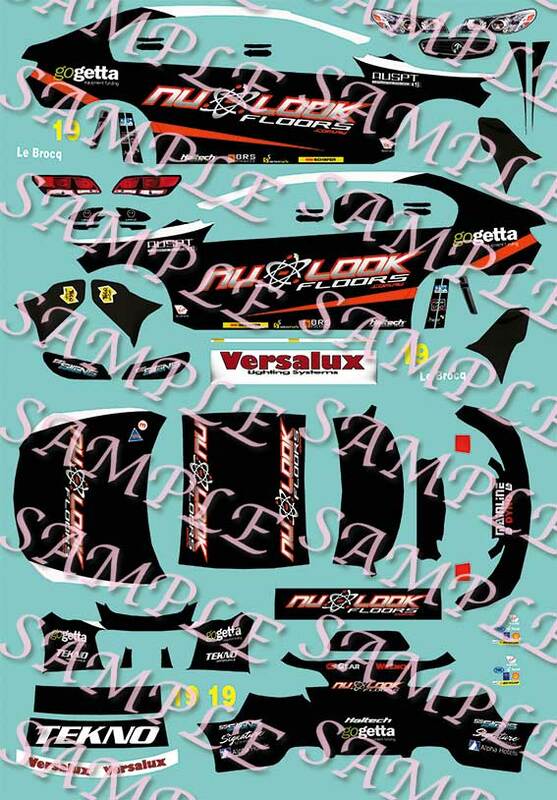 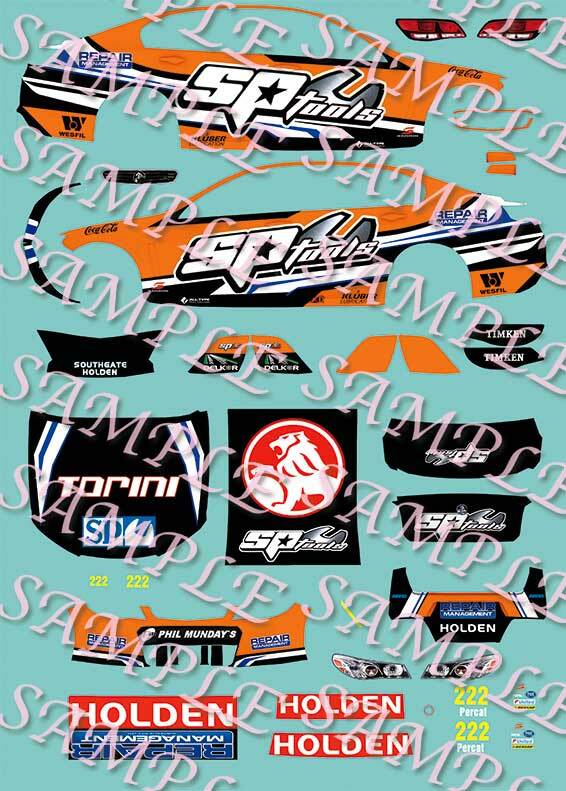 When ordering decals, please state the name as it appears on the list, the scale and specify if you want Waterslide or Vinyl Peel & Stick.